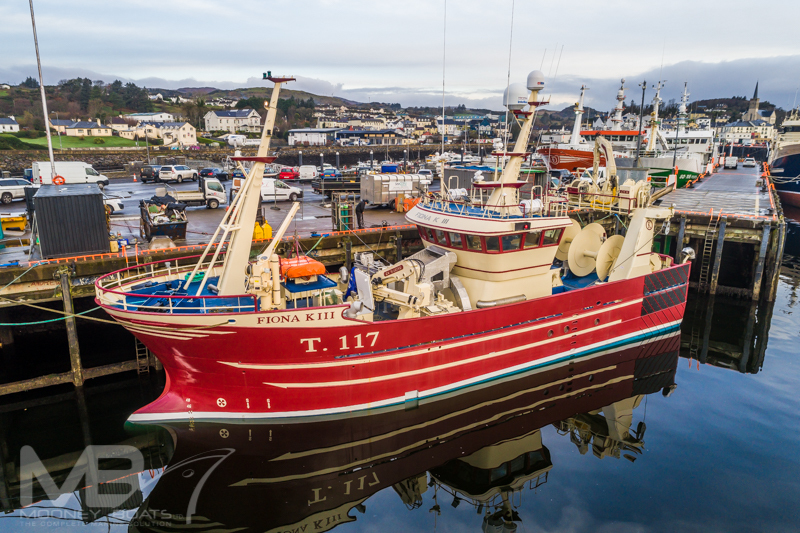 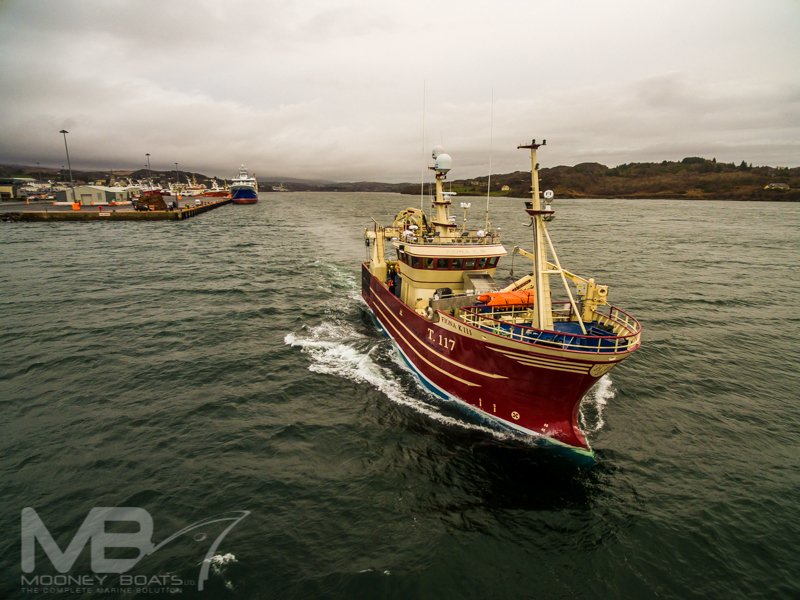 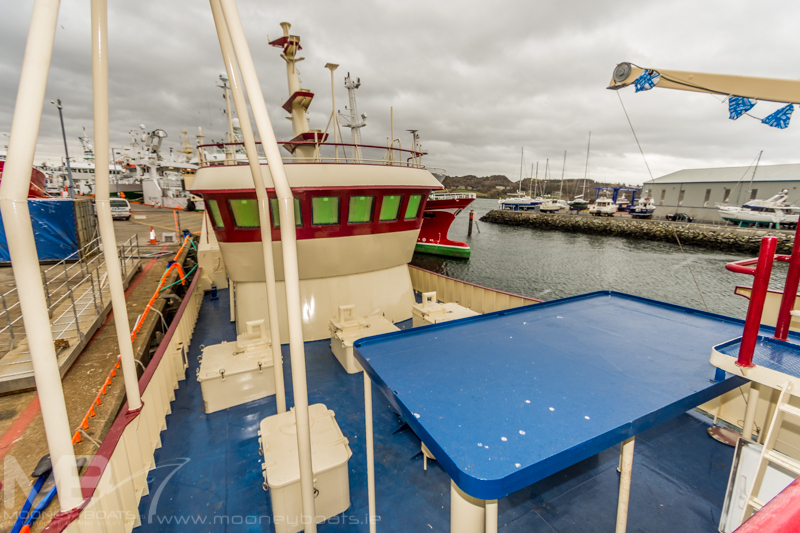 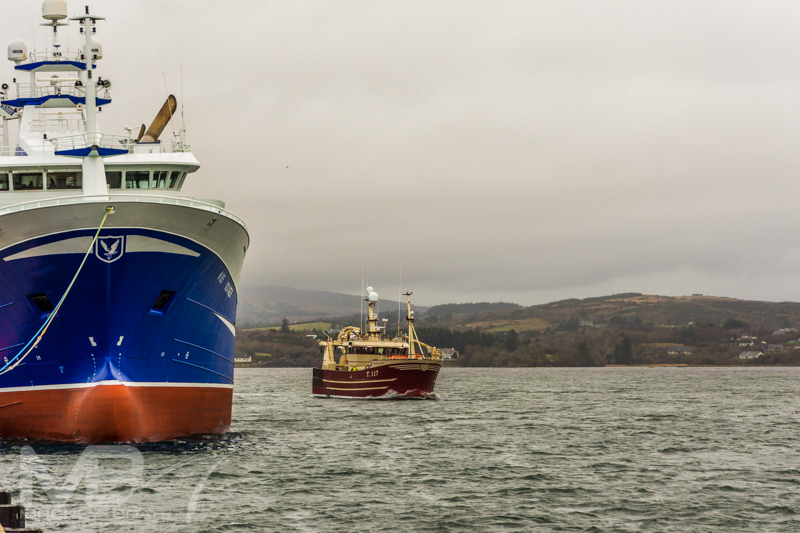 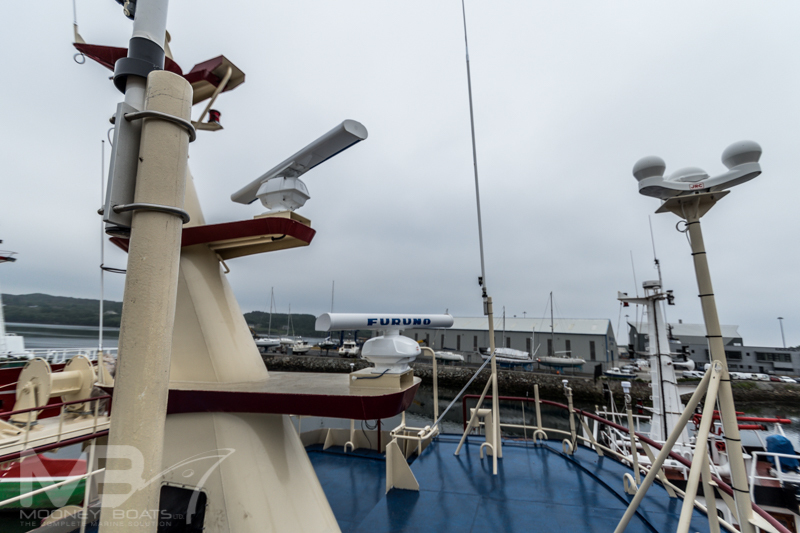 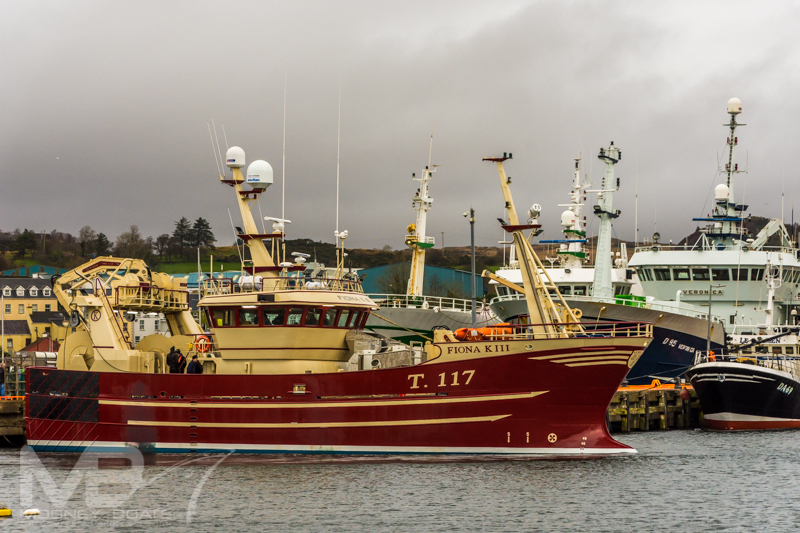 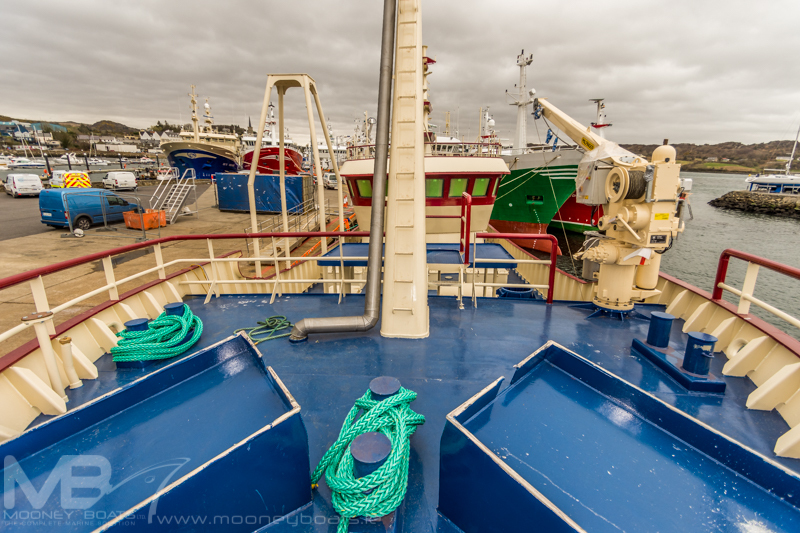 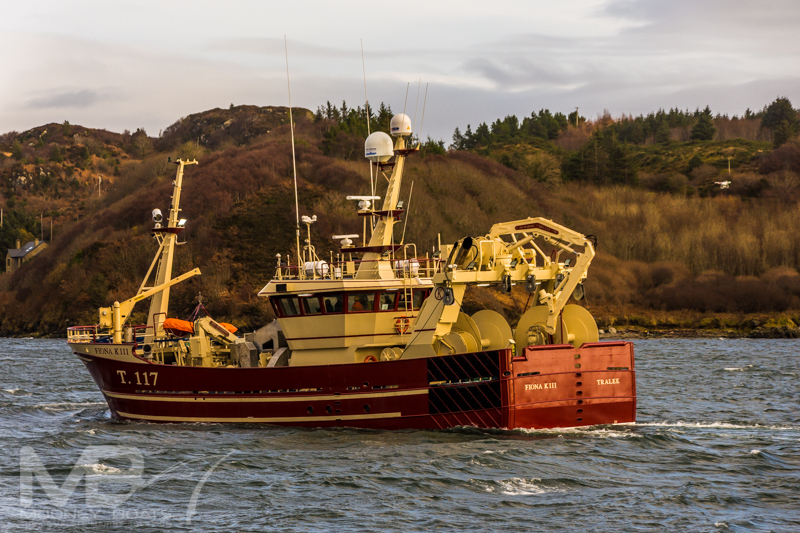 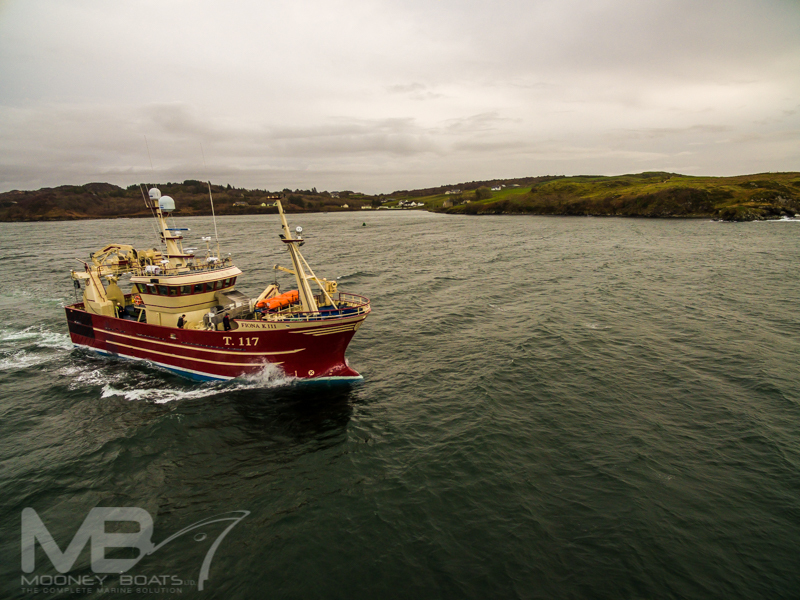 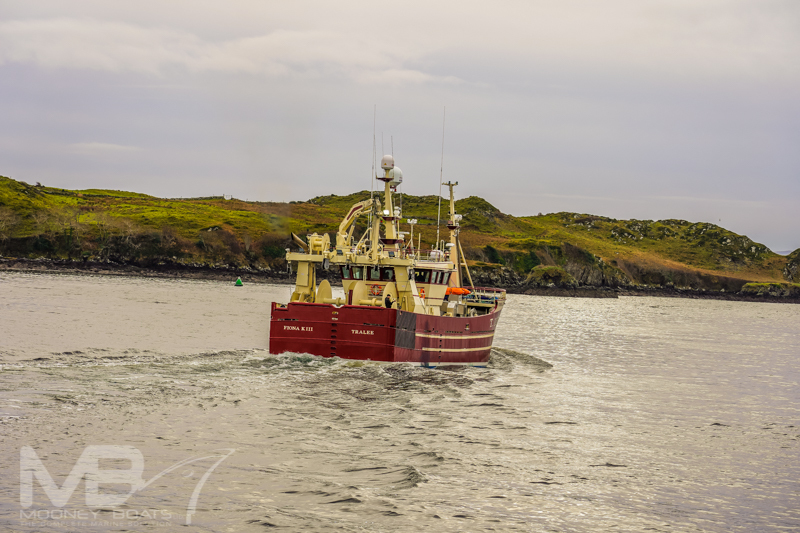 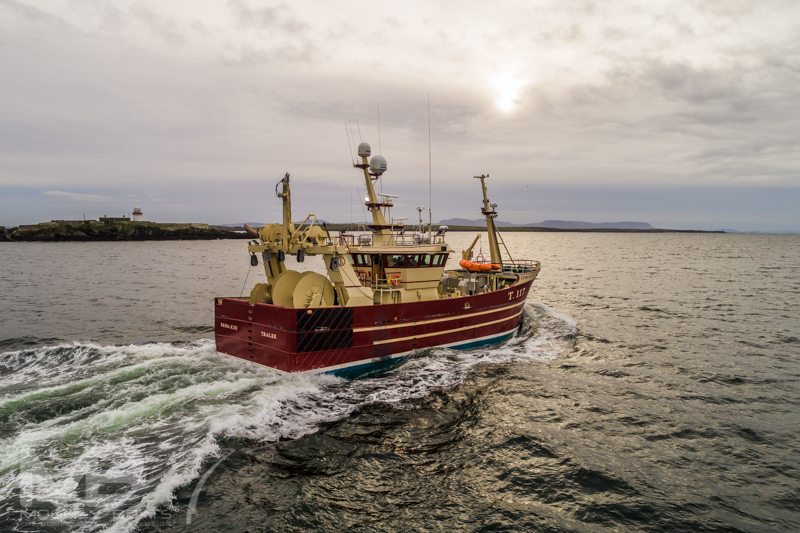 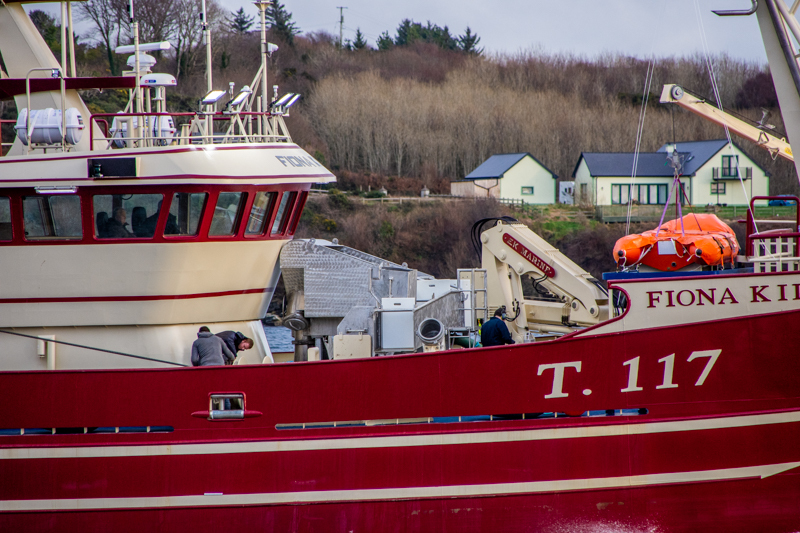 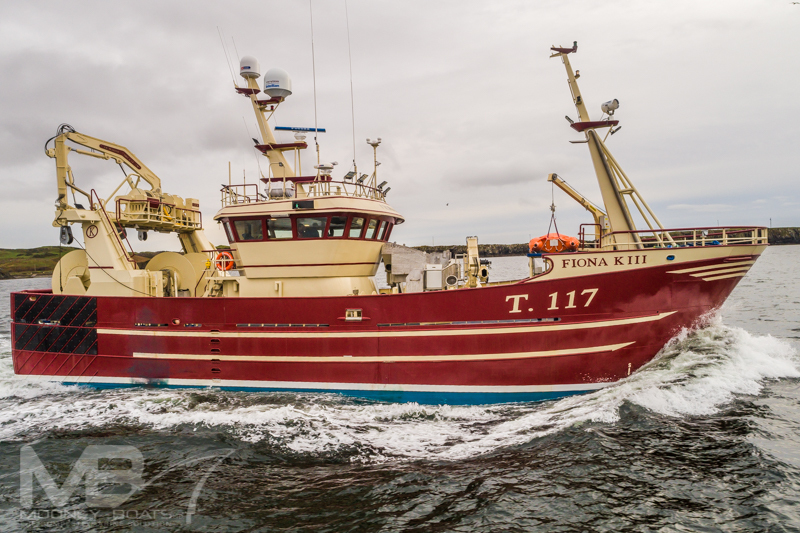 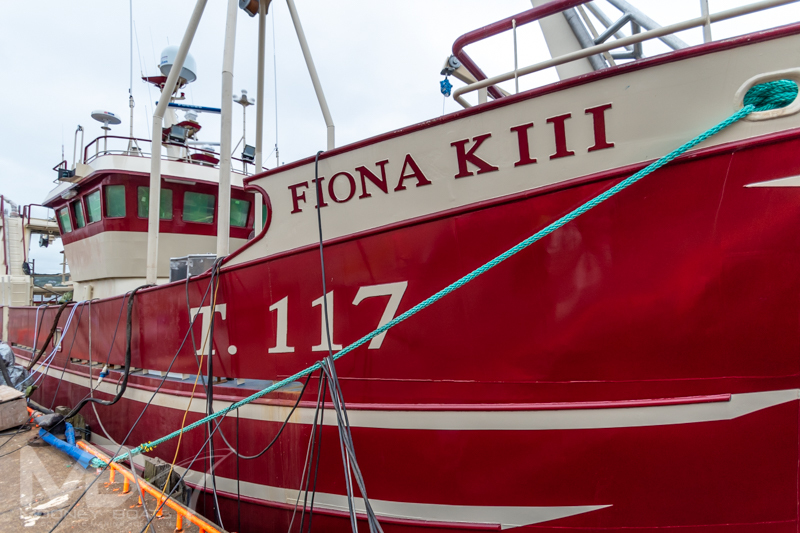 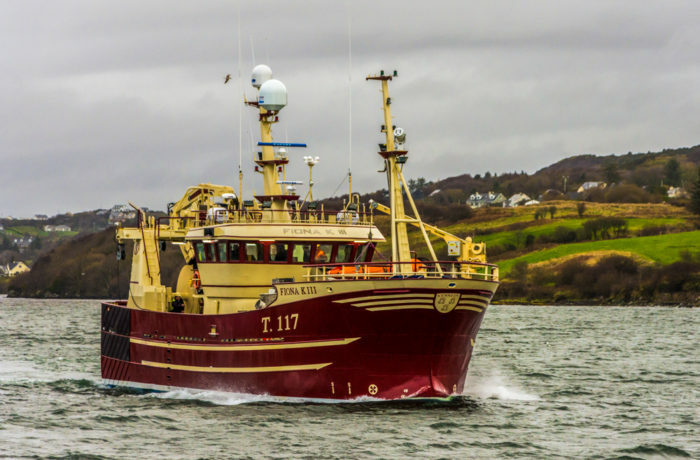 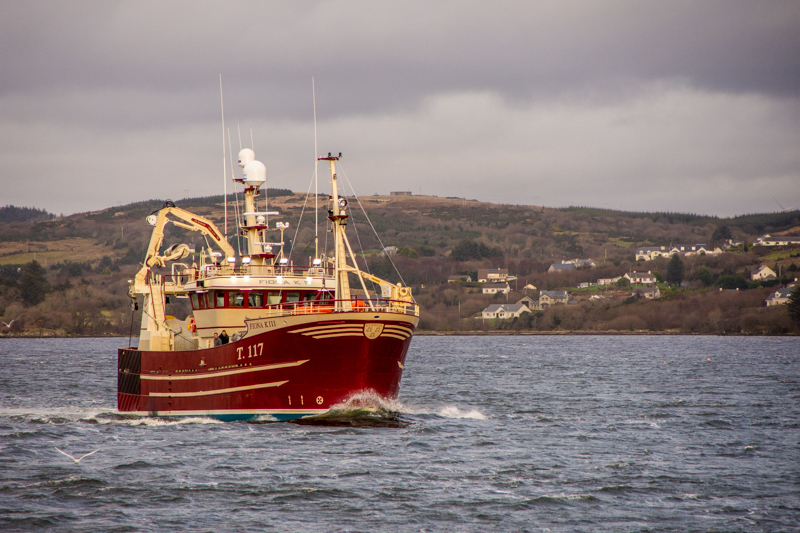 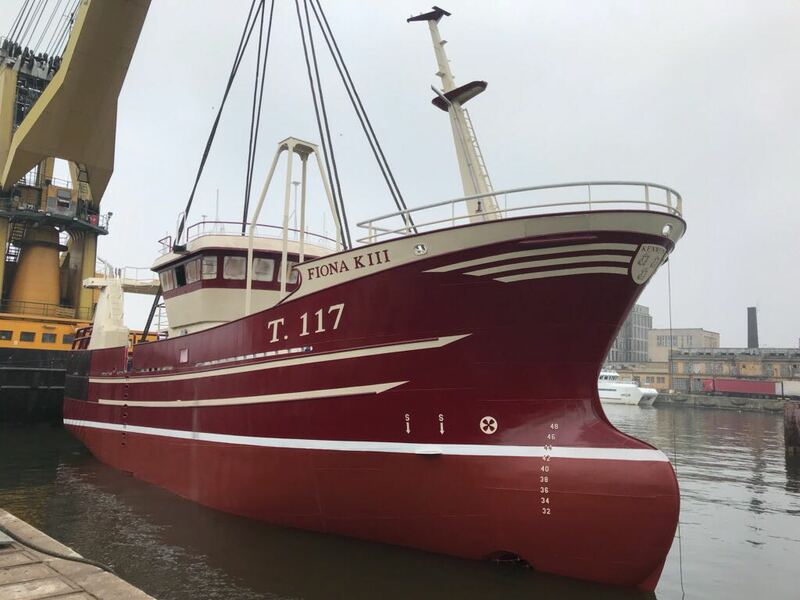 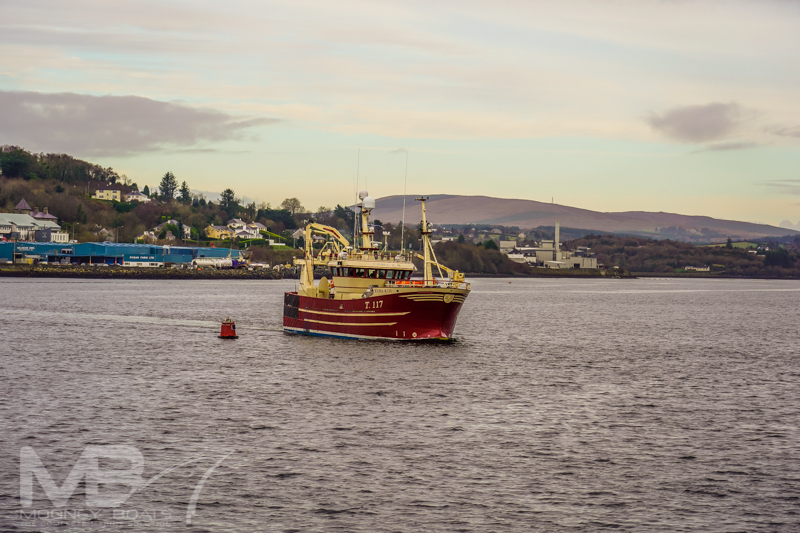 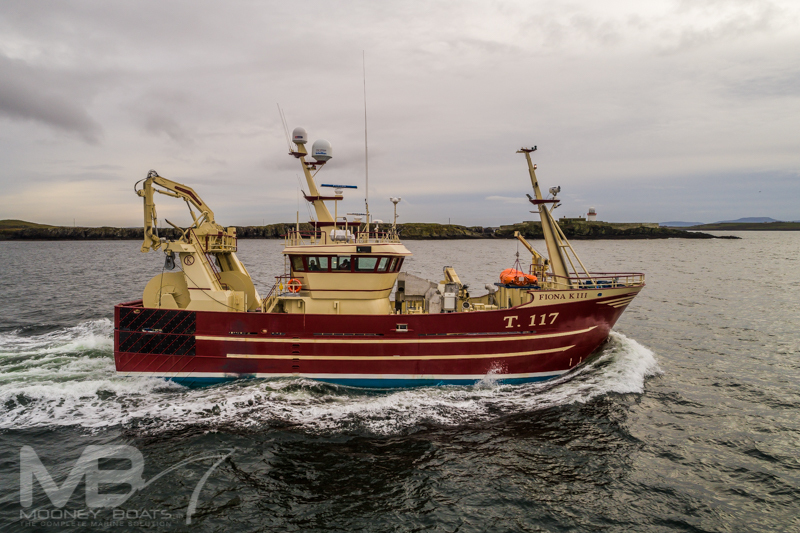 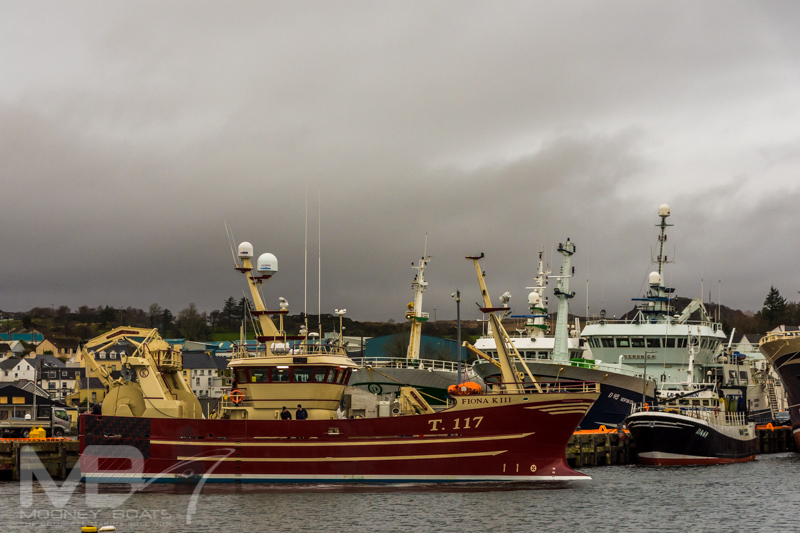 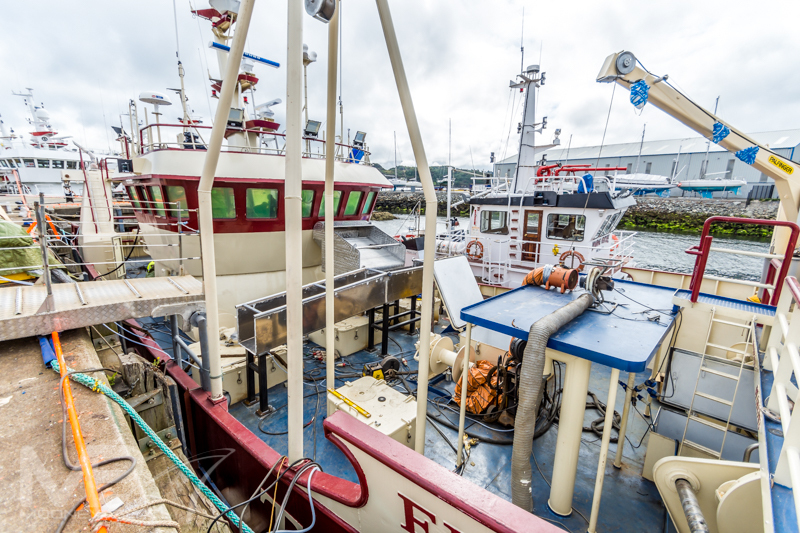 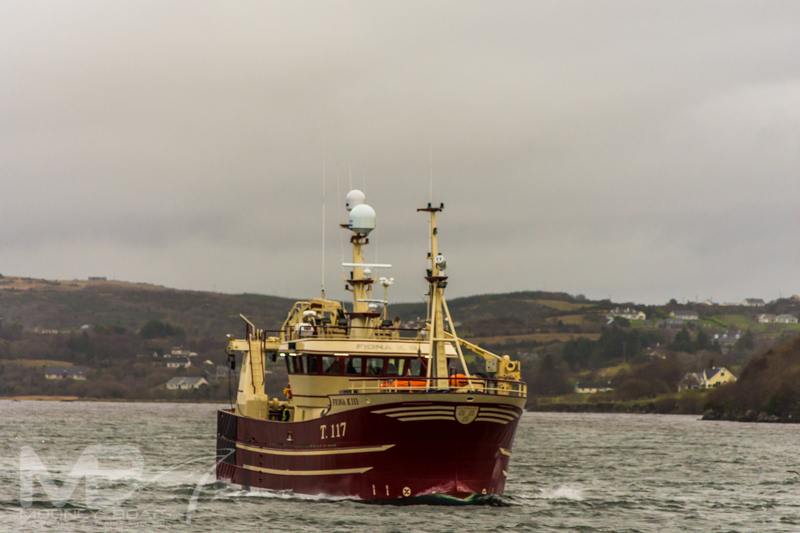 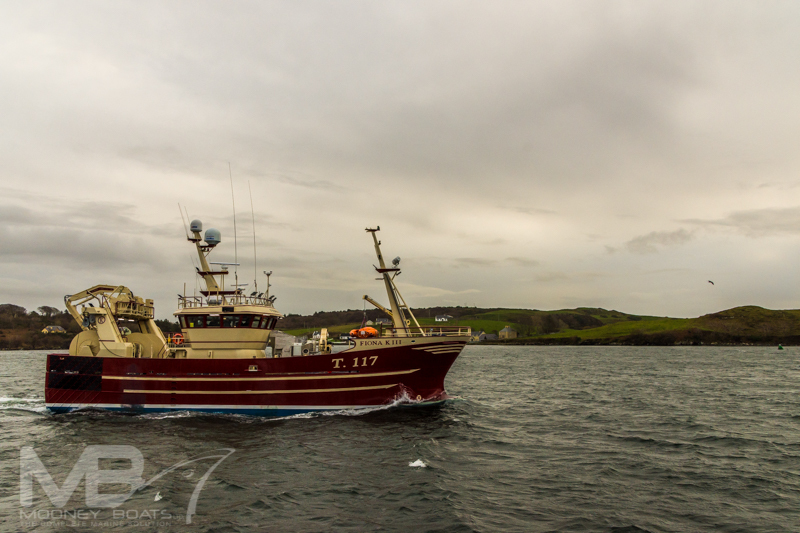 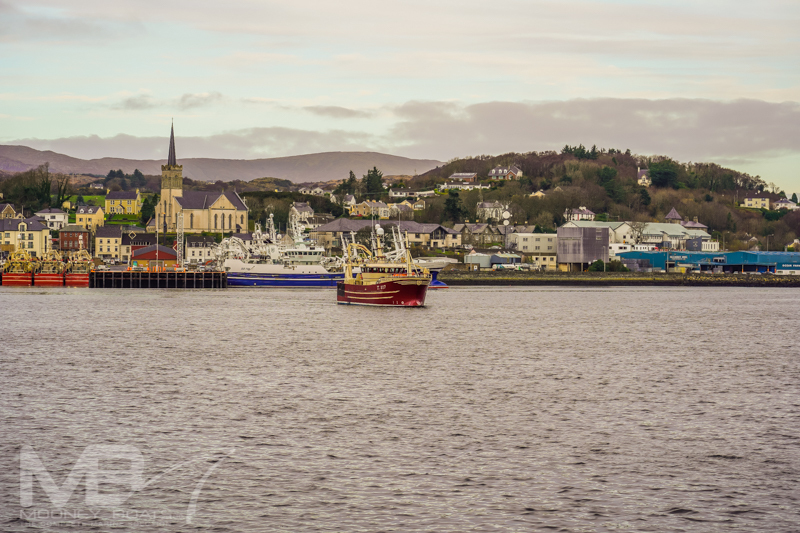 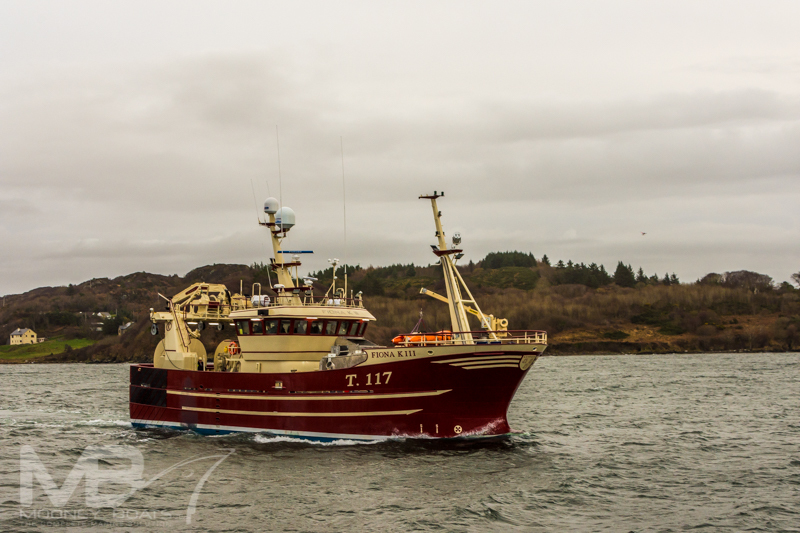 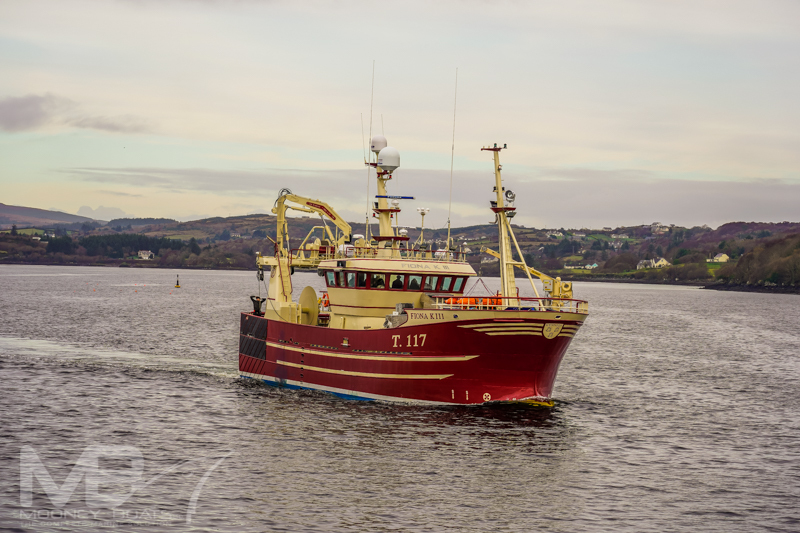 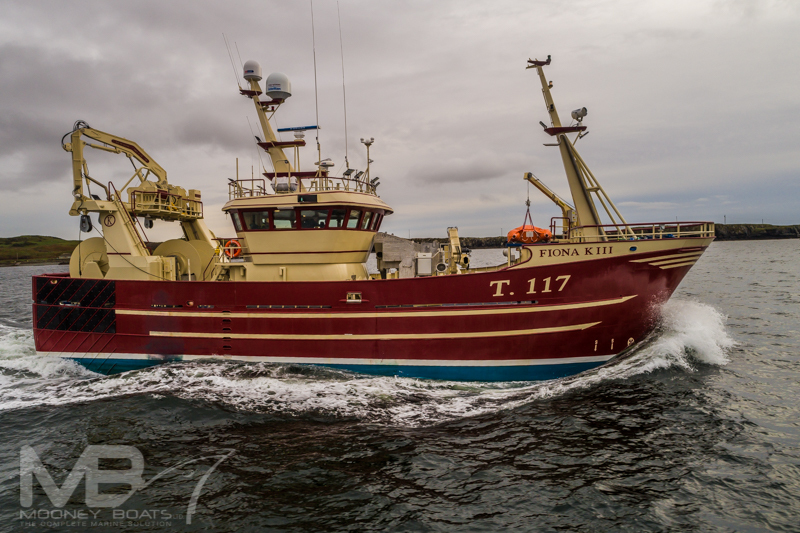 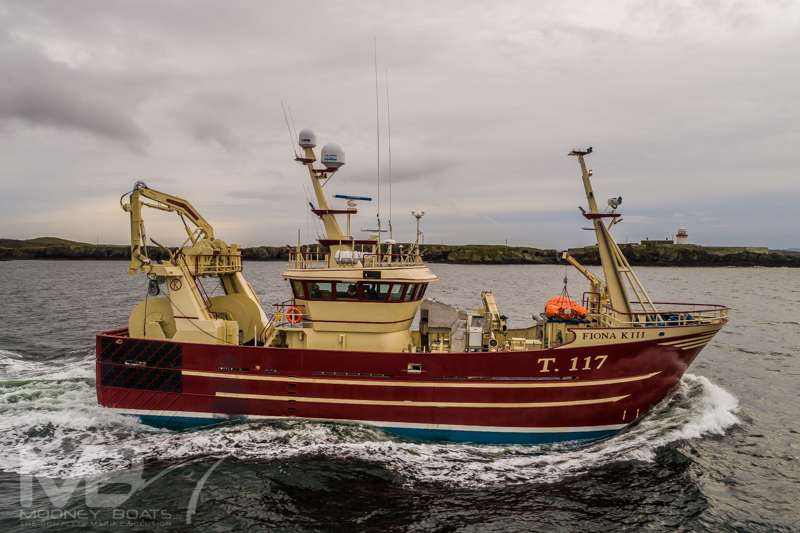 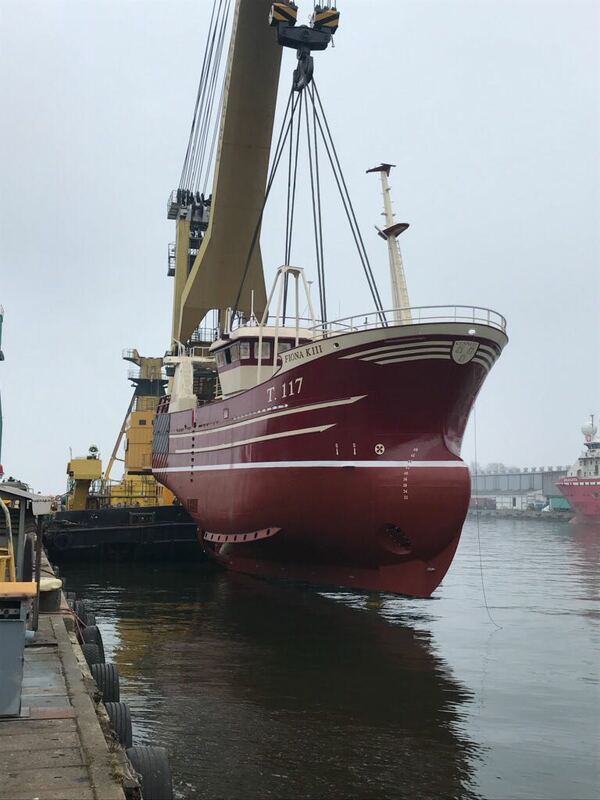 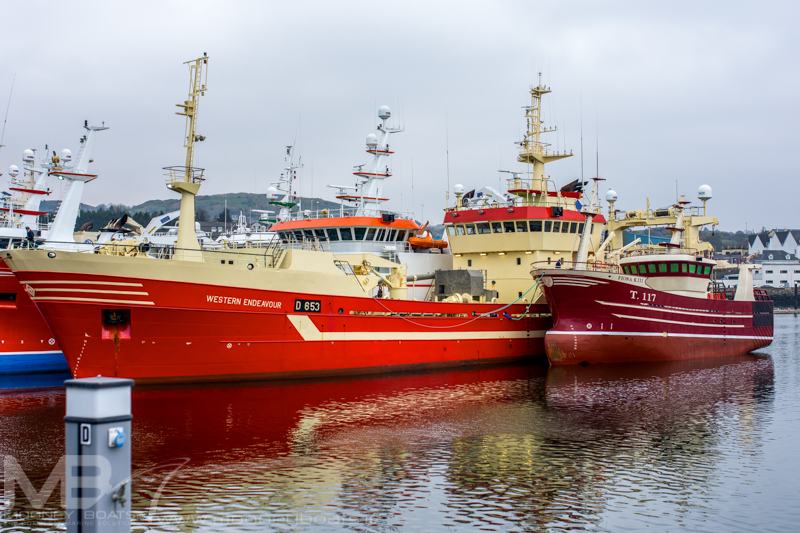 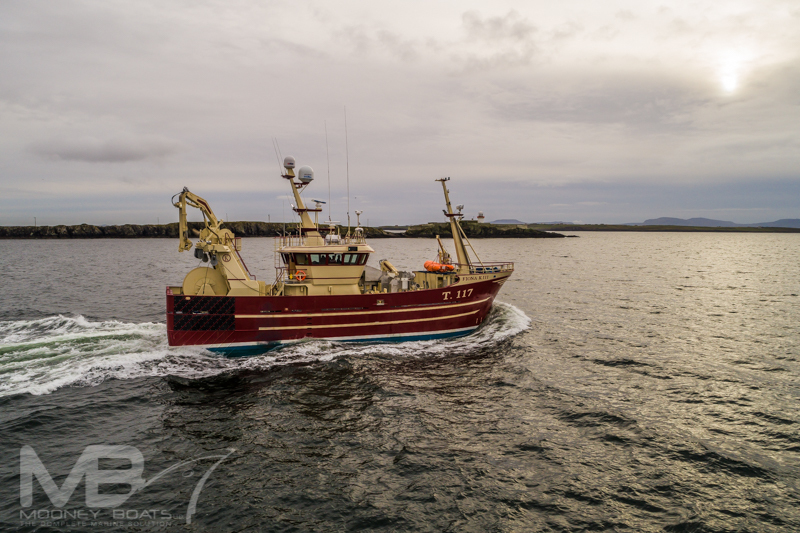 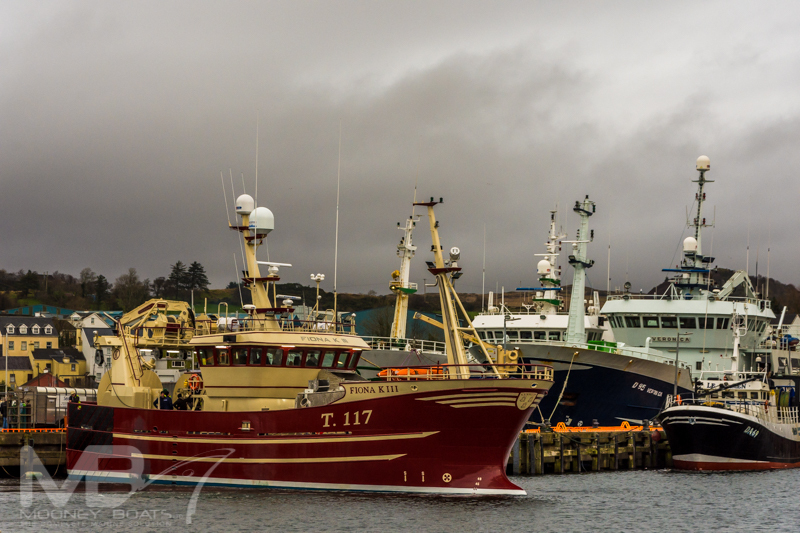 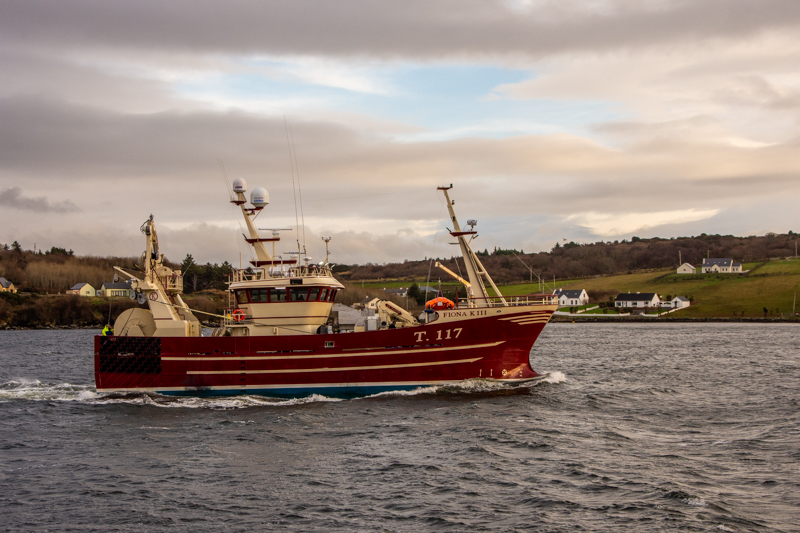 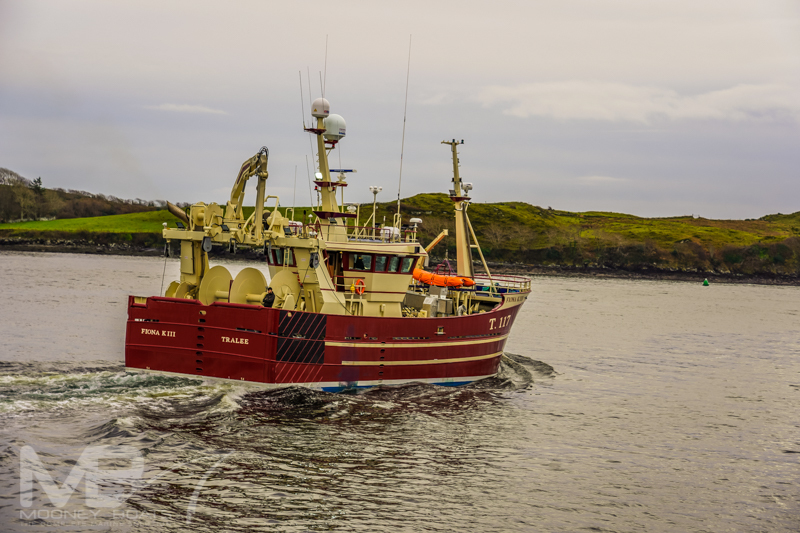 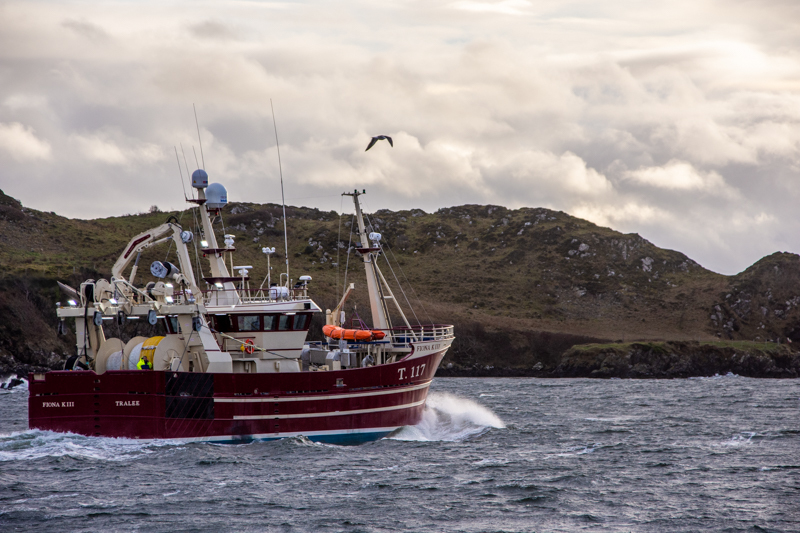 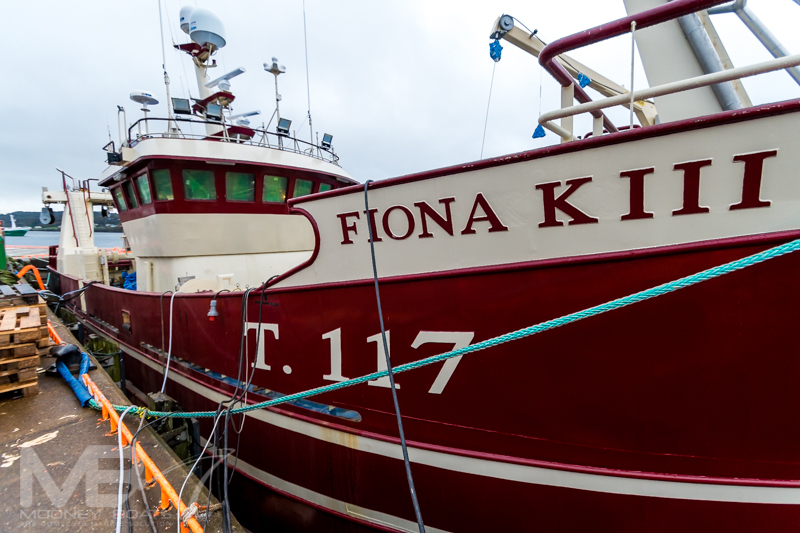 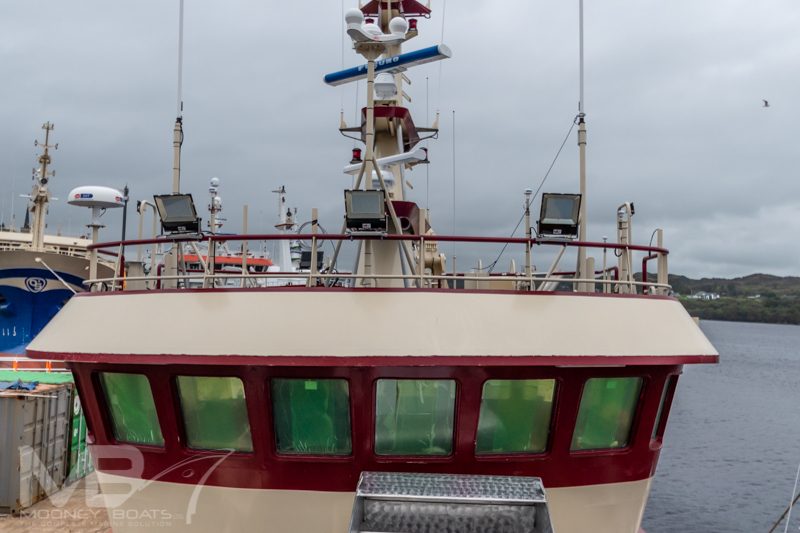 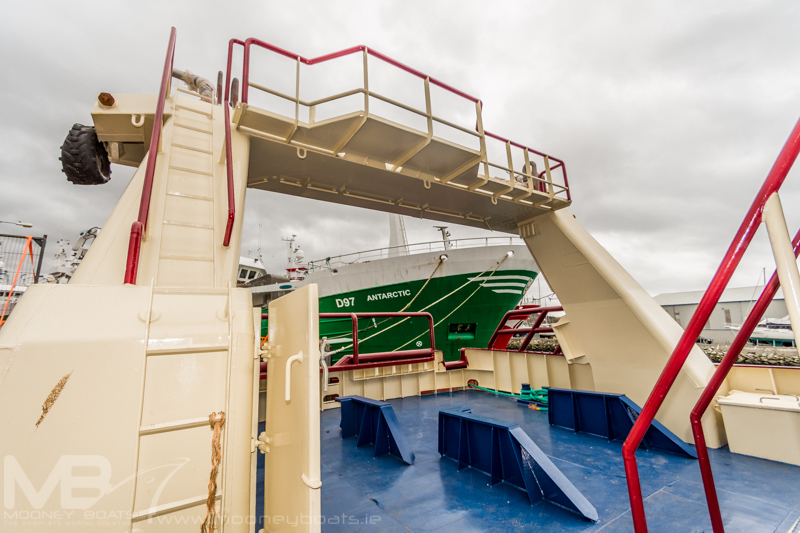 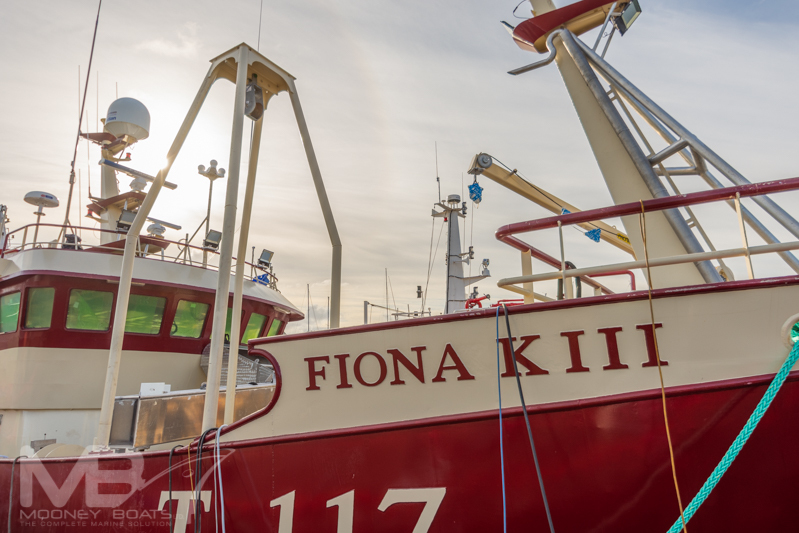 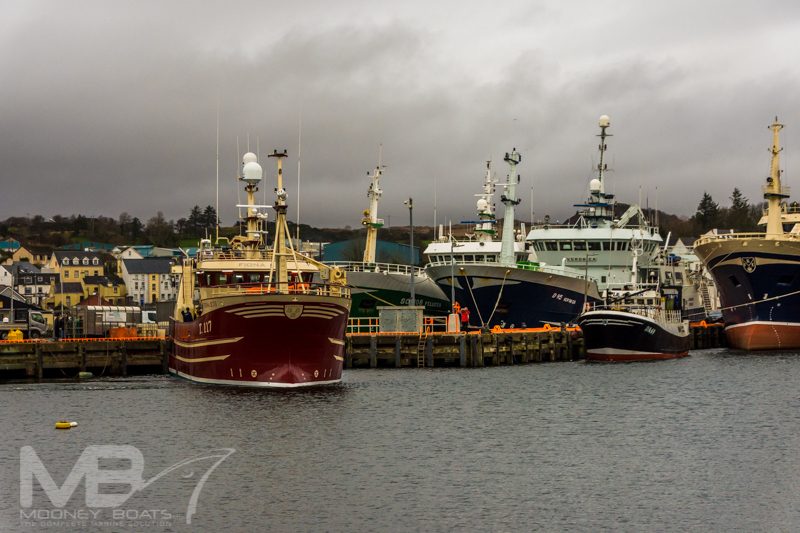 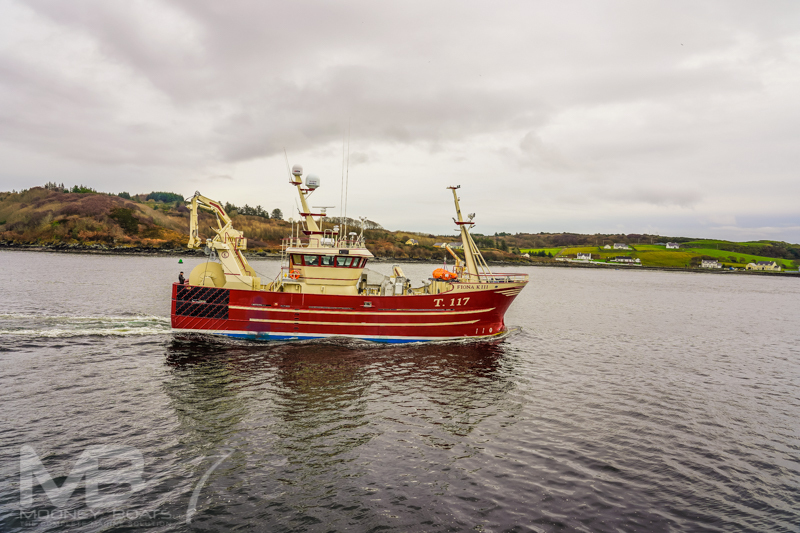 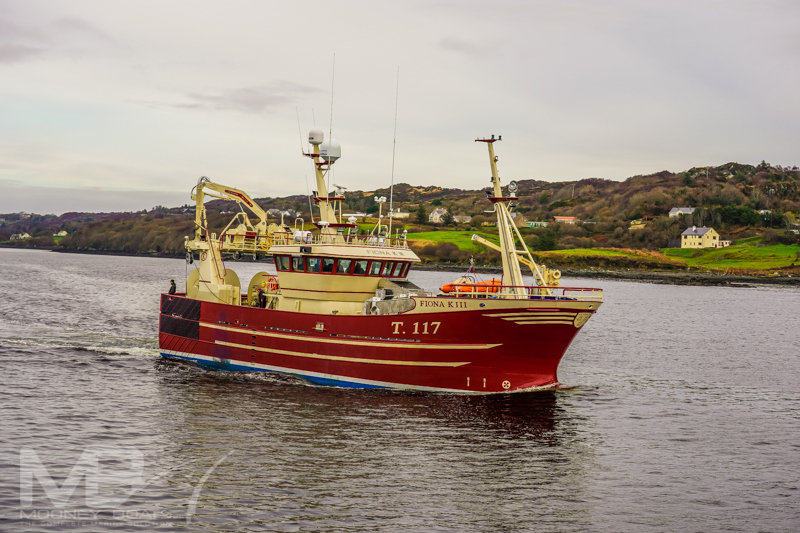 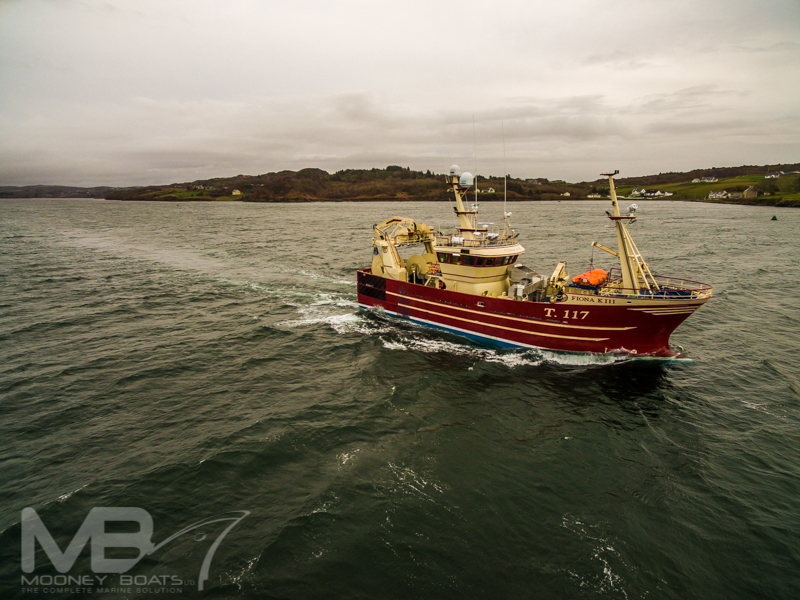 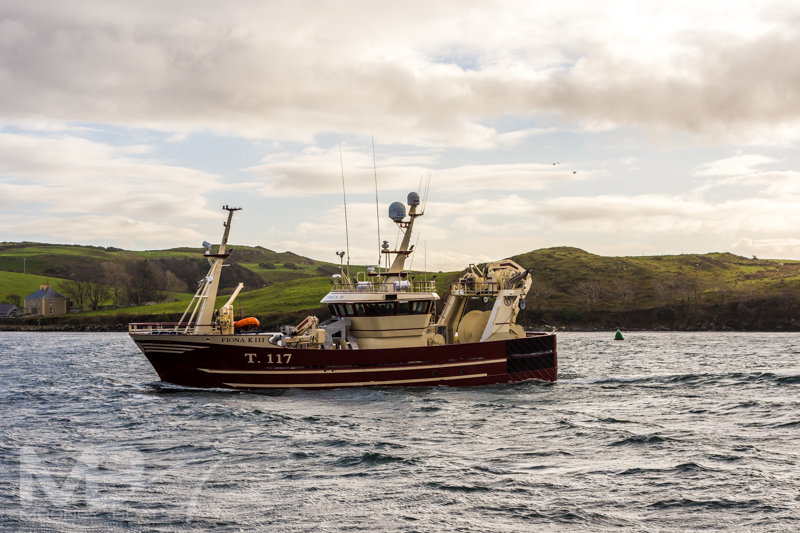 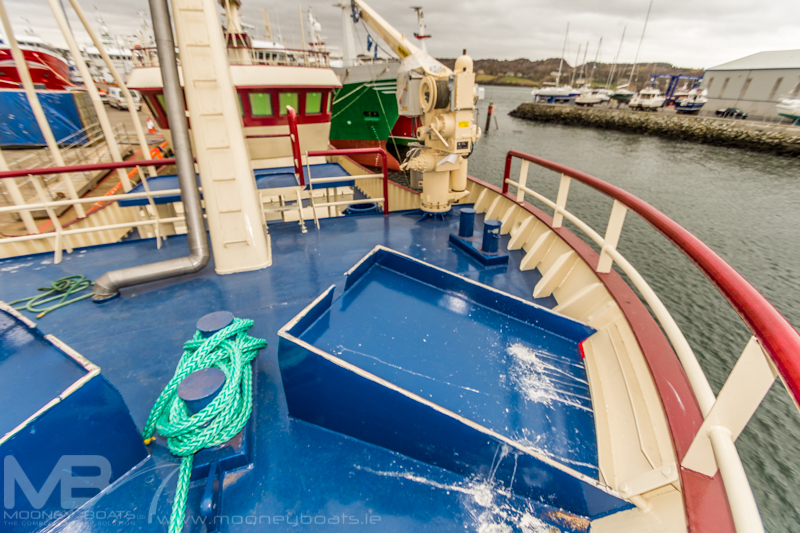 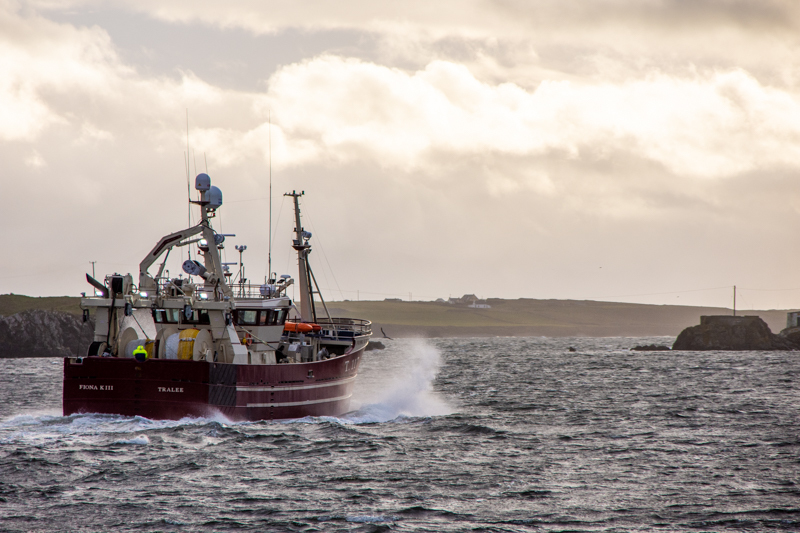 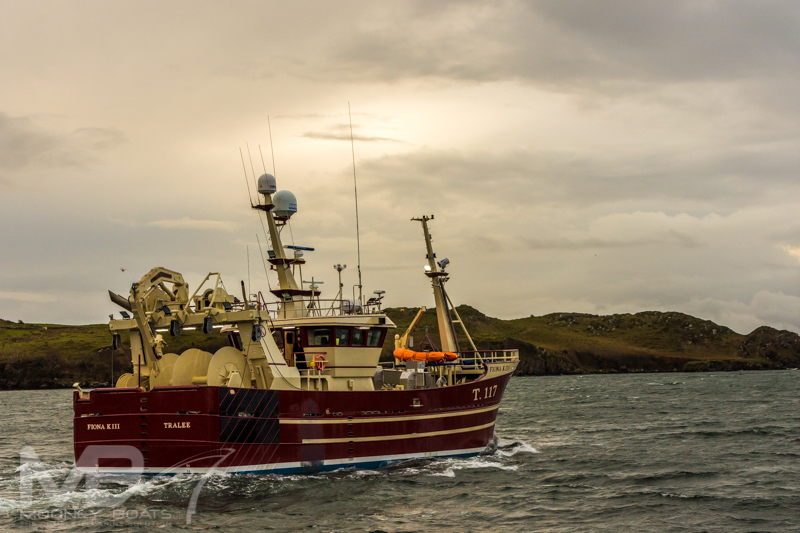 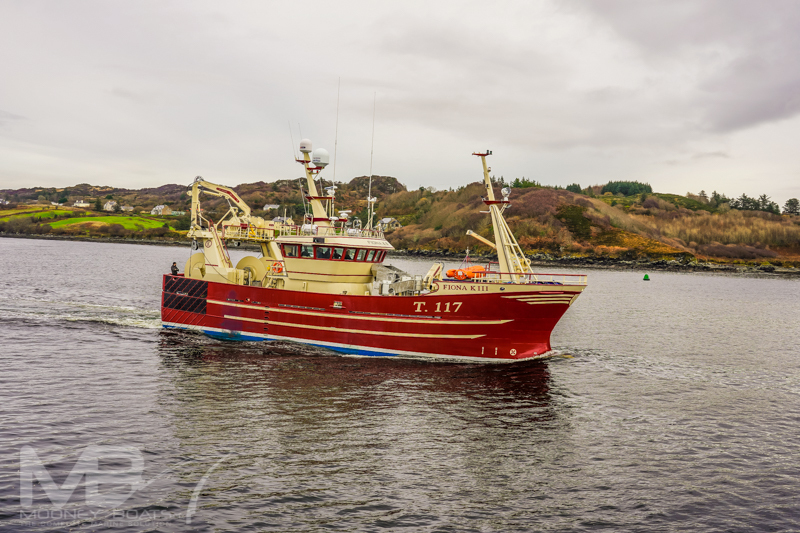 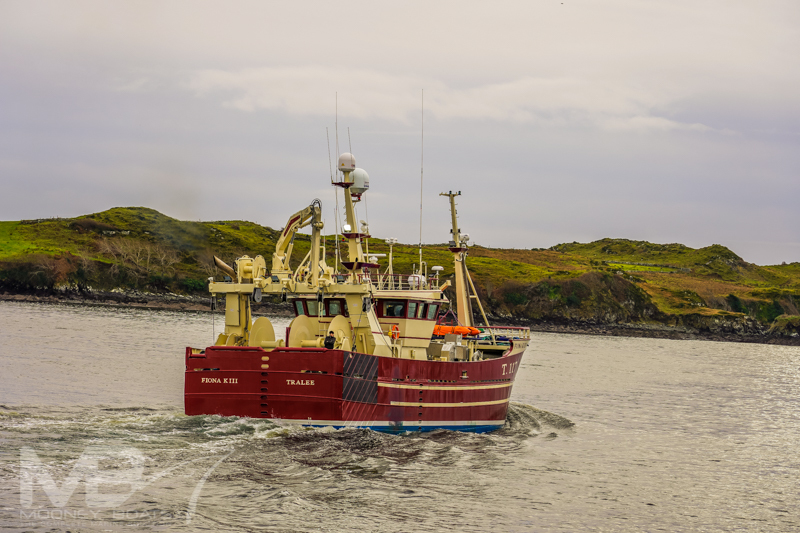 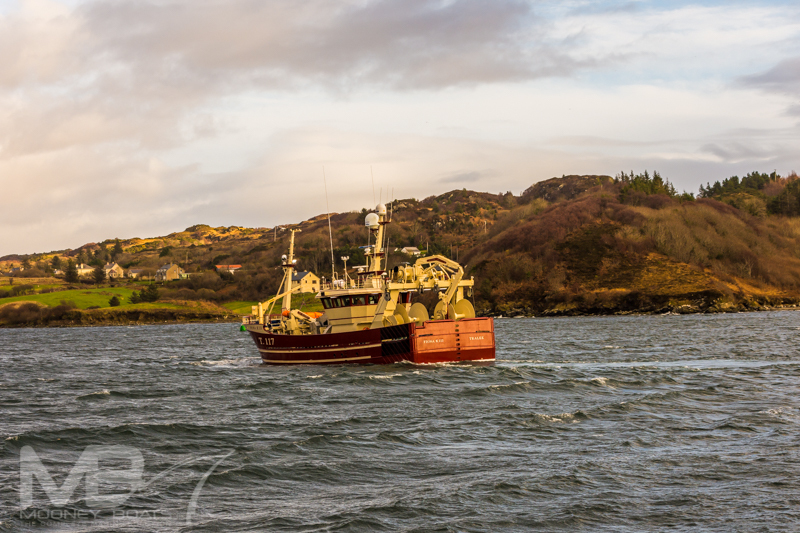 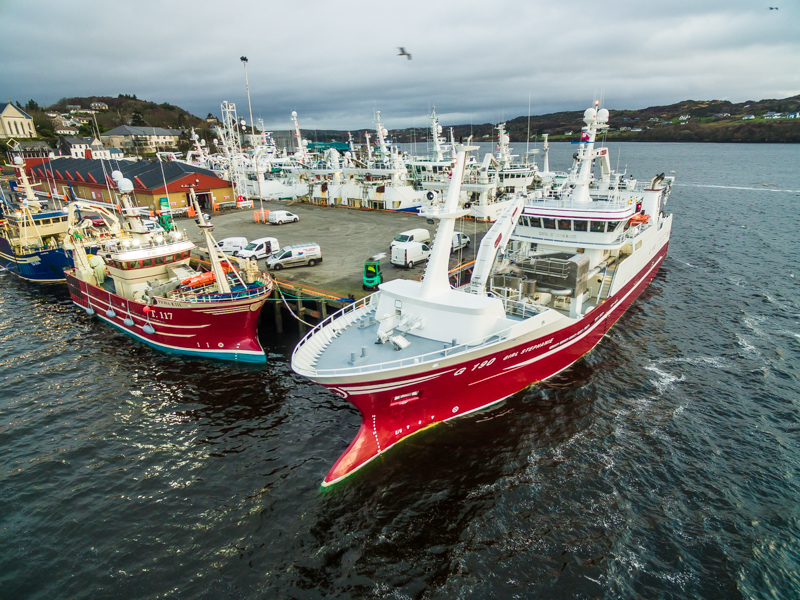 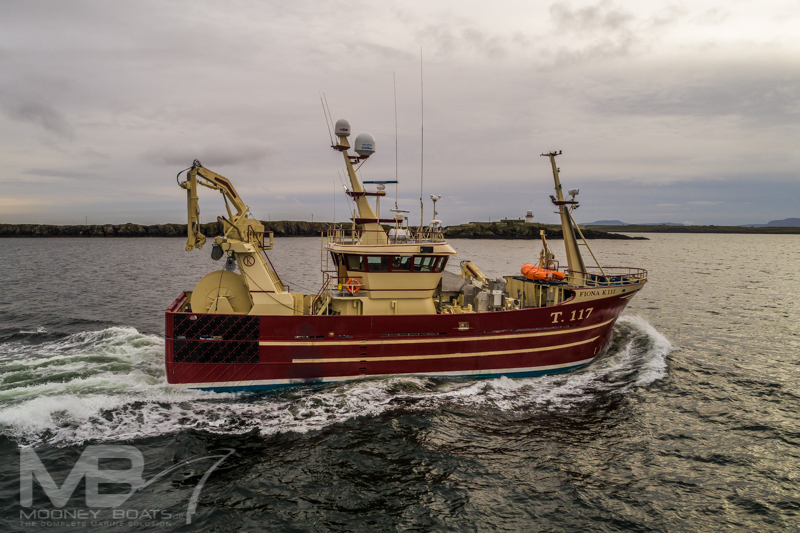 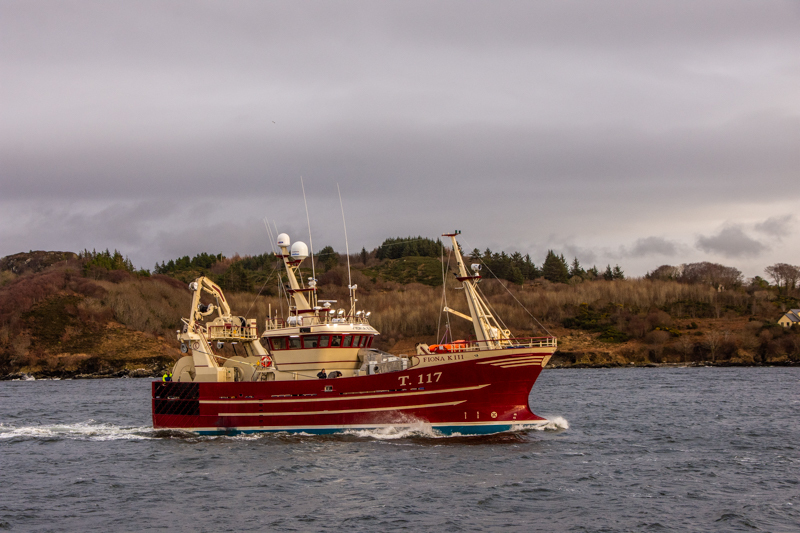 The Mfv Fiona K III is a multipurpose Fishing trawler and will be fishing on pelagic species such as Mackerel Herring, & Scads during the winter fishery and on Whitefish and Tuna during the spring and summer season. 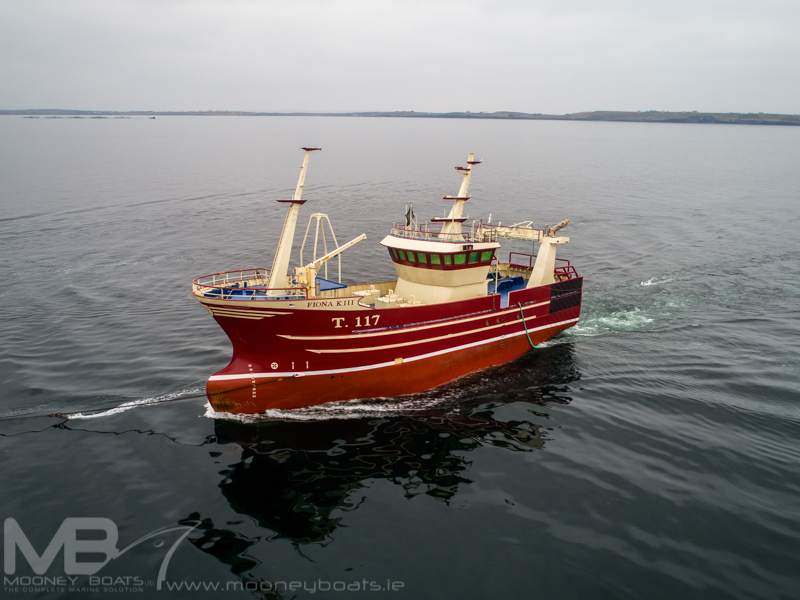 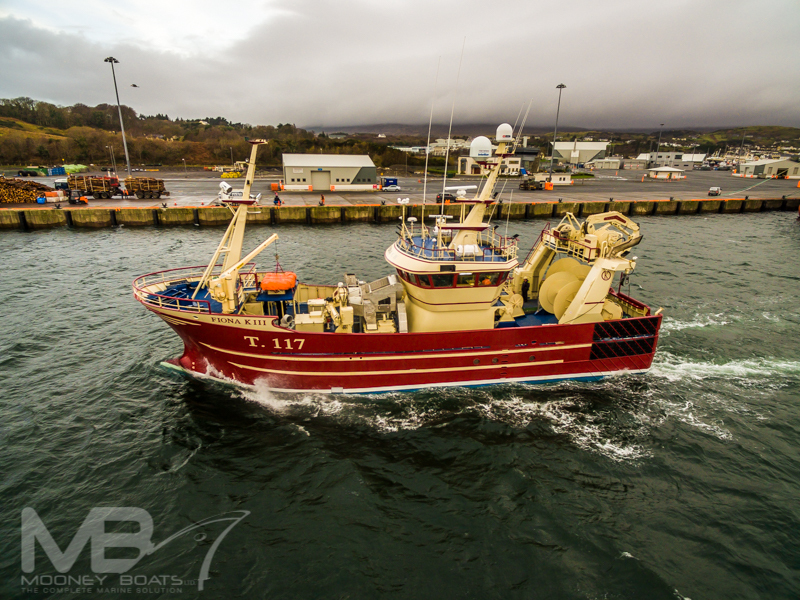 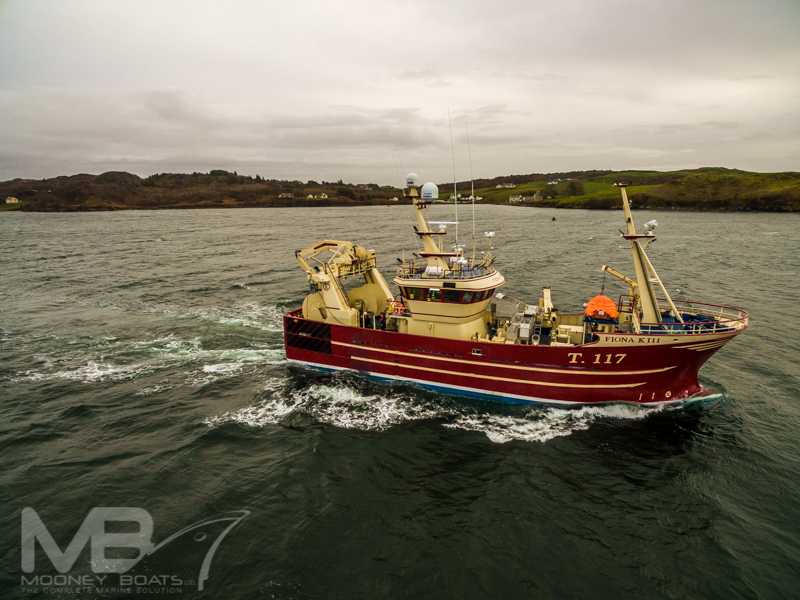 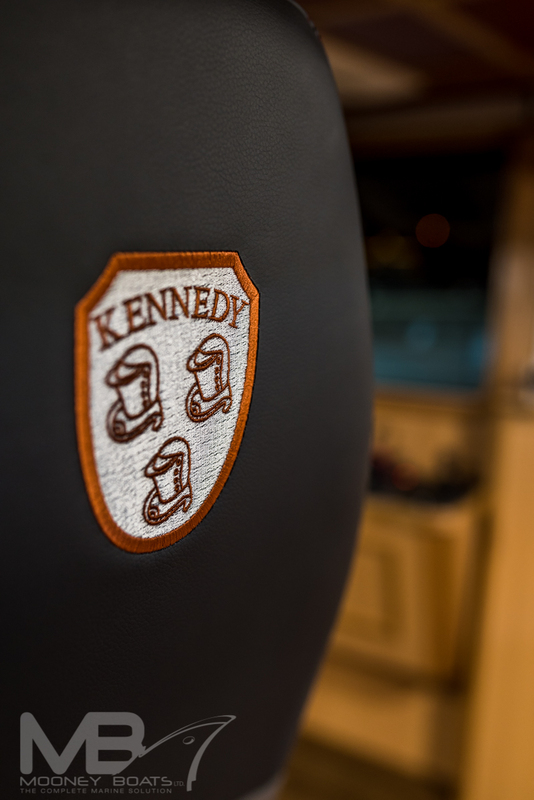 The new Fiona K III which Mooney Boats has delivered to Tom Kennedy Fishing will be operated by Tom Kennedy & his son Donal Kennedy and will replace the Fiona K II which has been sold on. 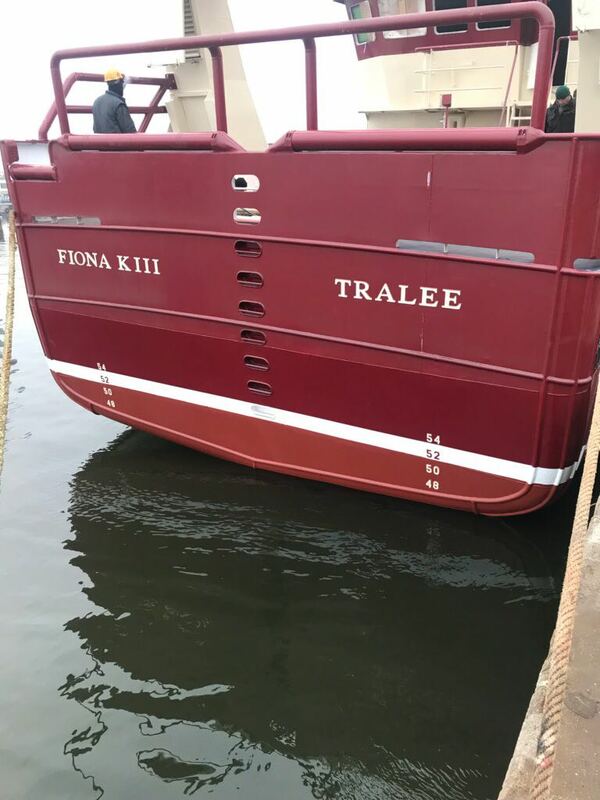 The Fiona K III was designed by Ove Kristensen of Vestvaerftet ApS of Hvide Sande and she is the 4th hull design that Mooney Boats Ltd have delivered with Vestvaerftet which is proving to be a very successful working relations ship between both companies. 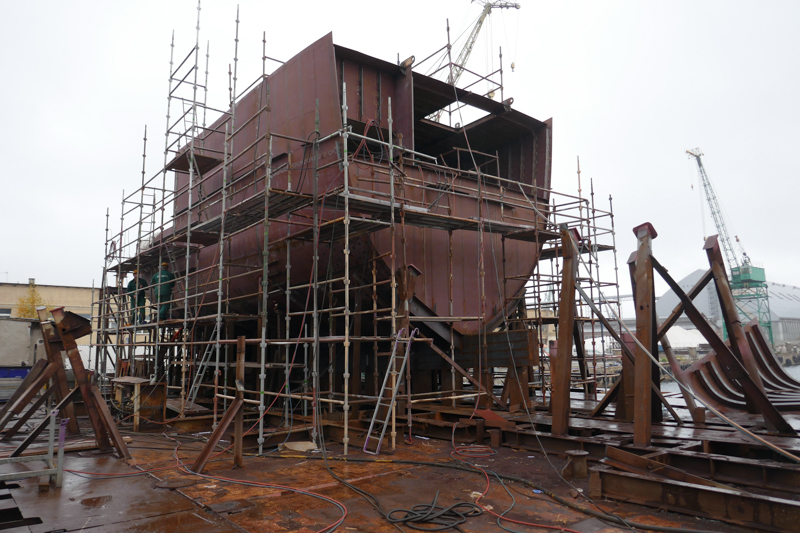 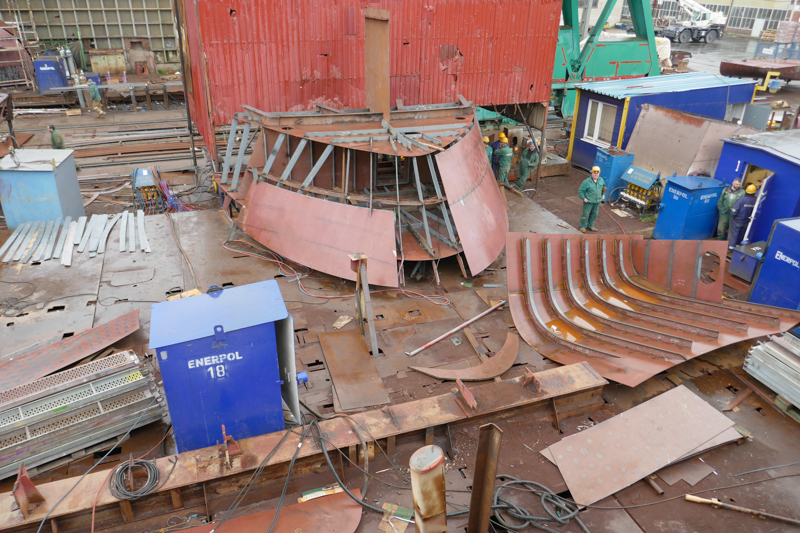 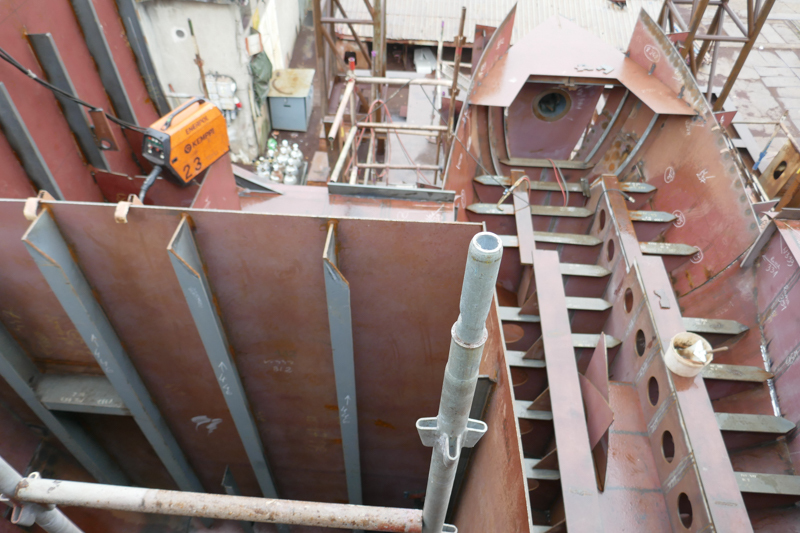 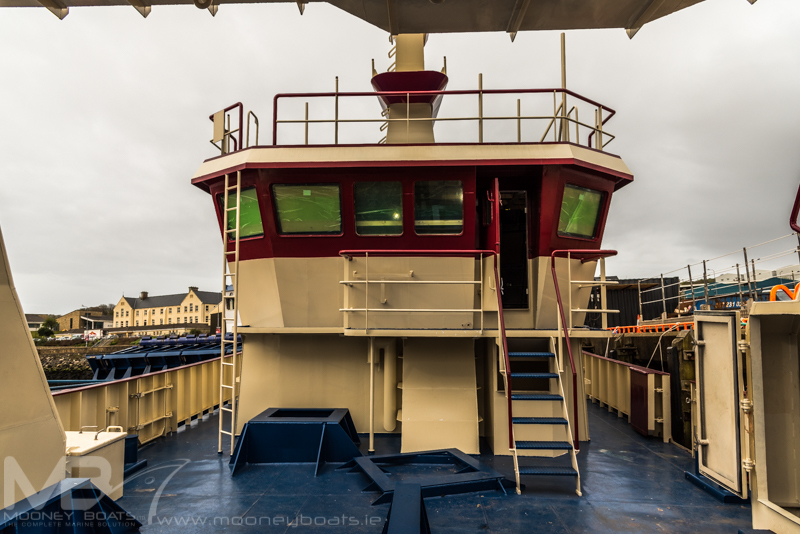 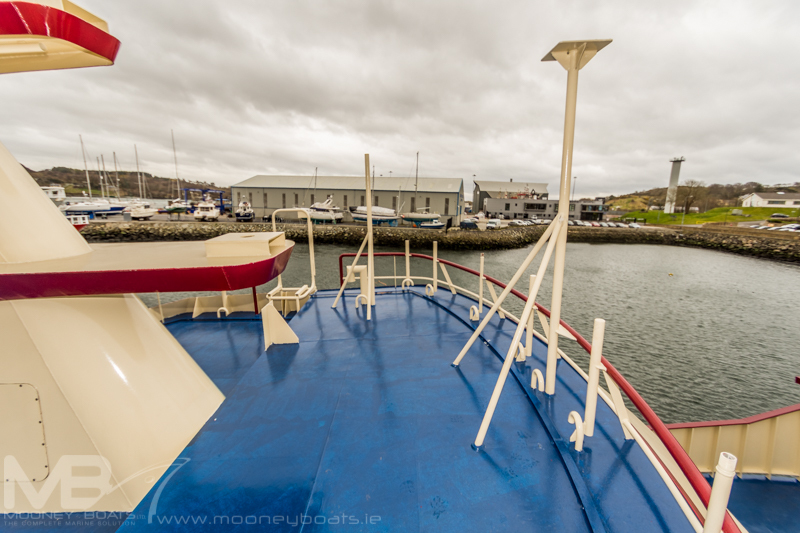 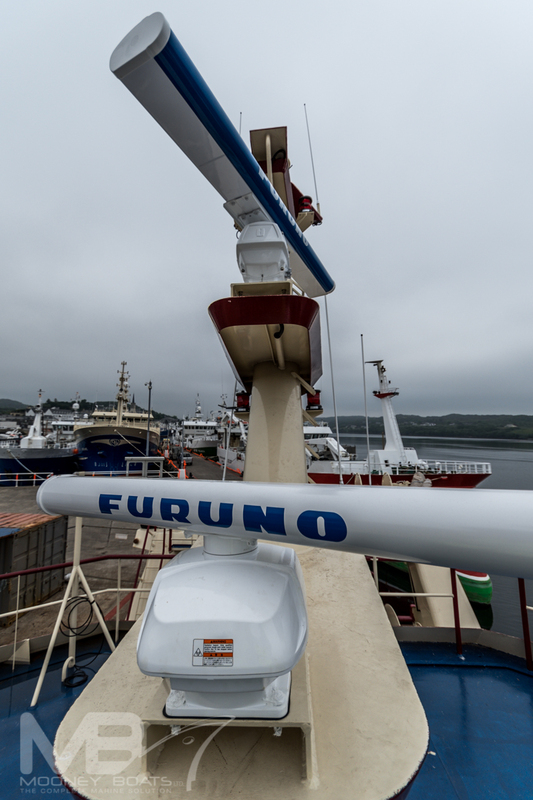 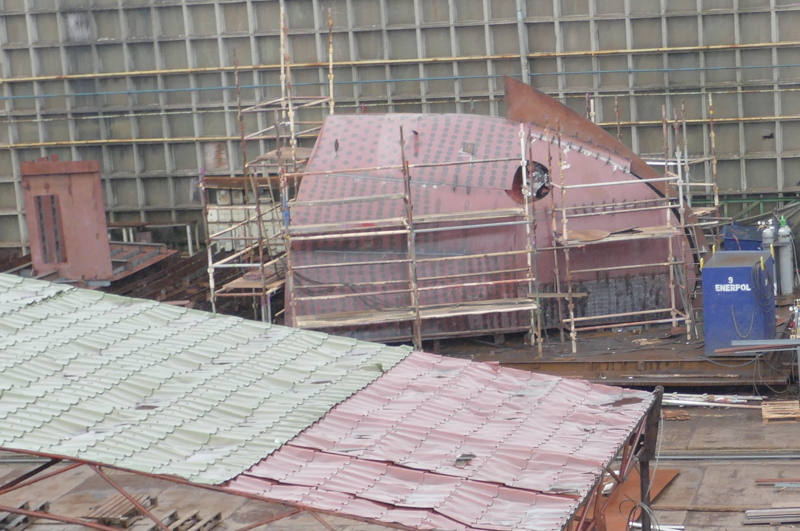 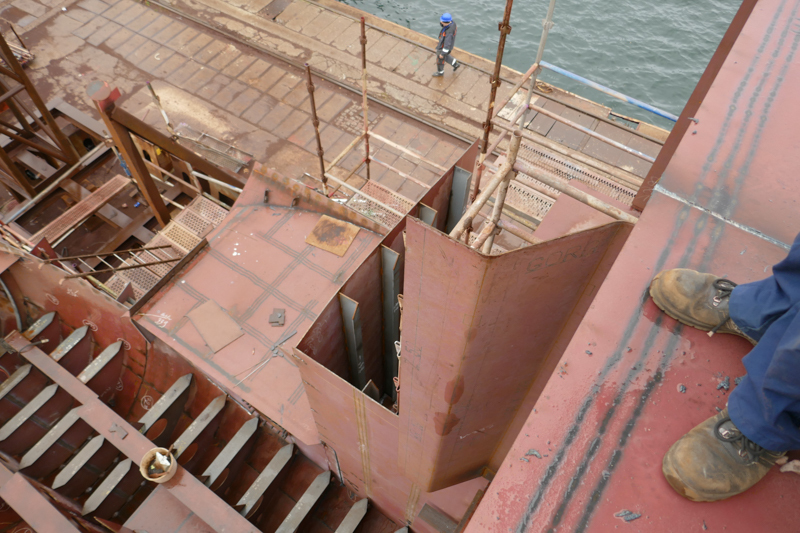 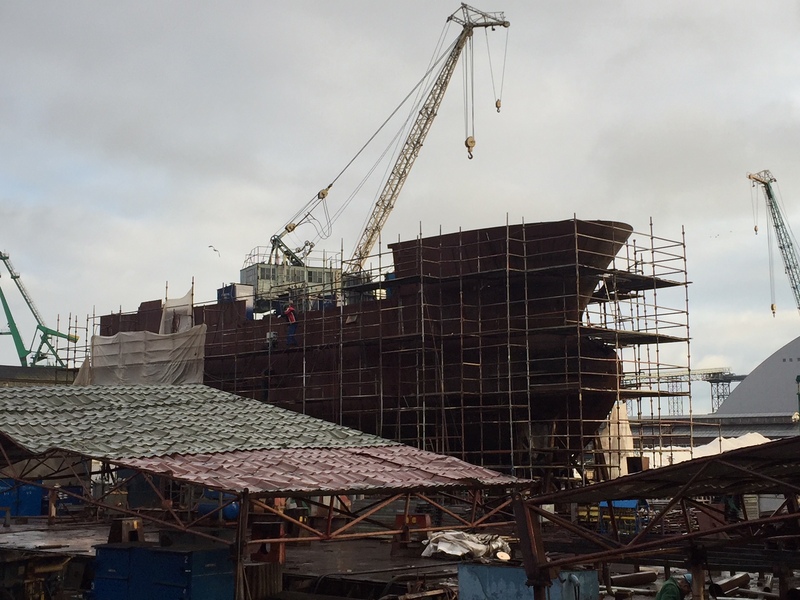 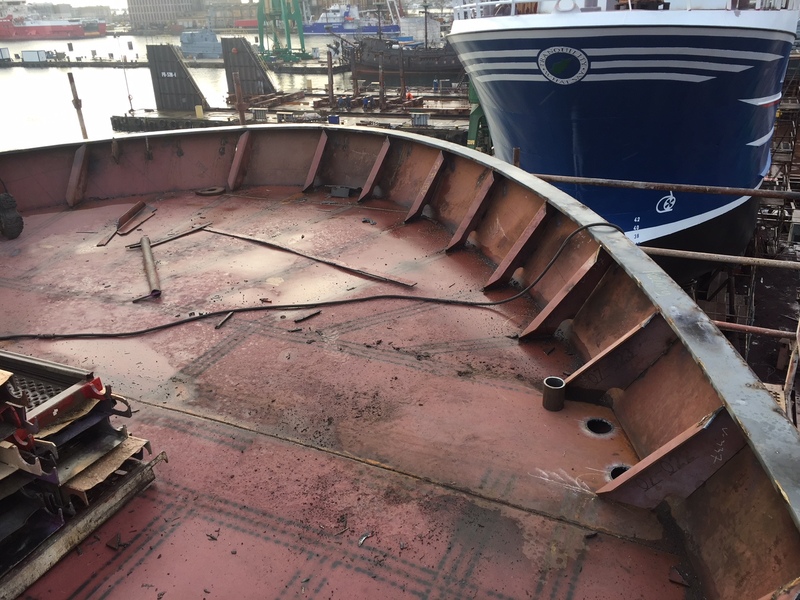 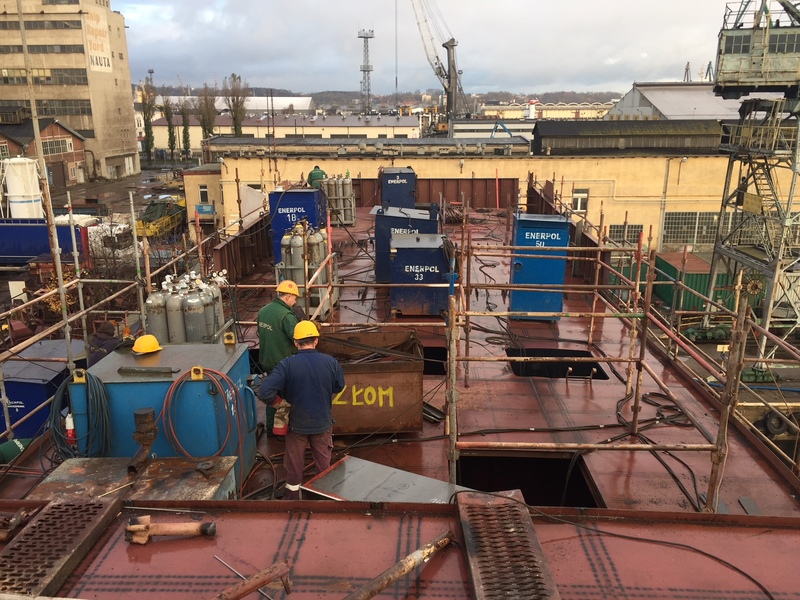 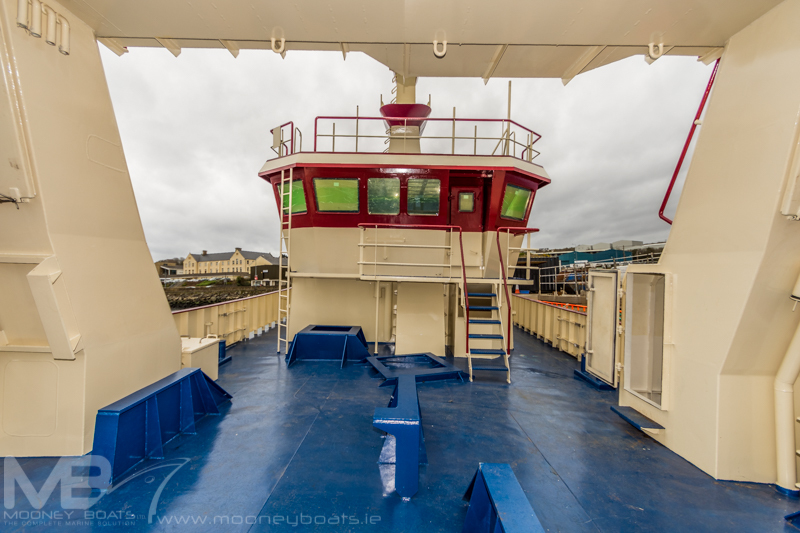 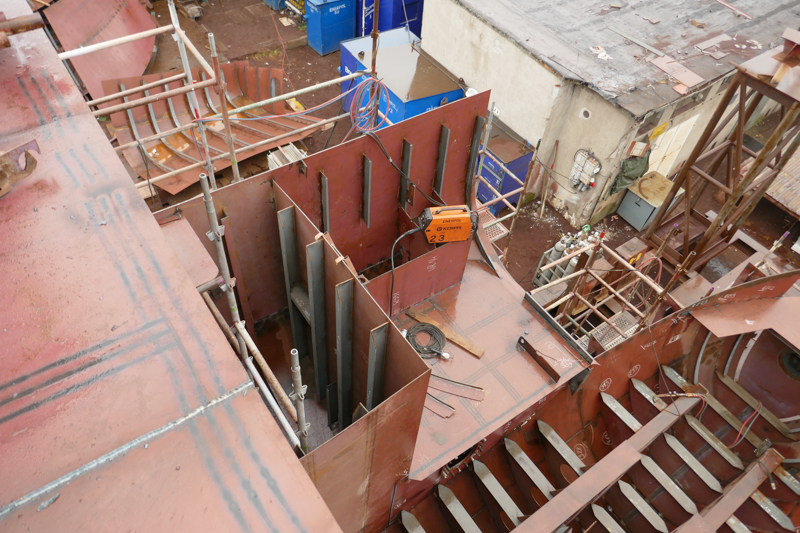 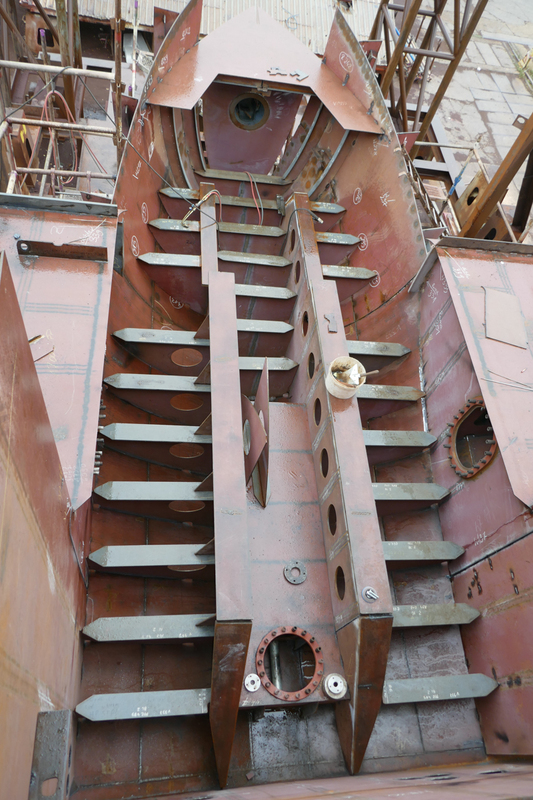 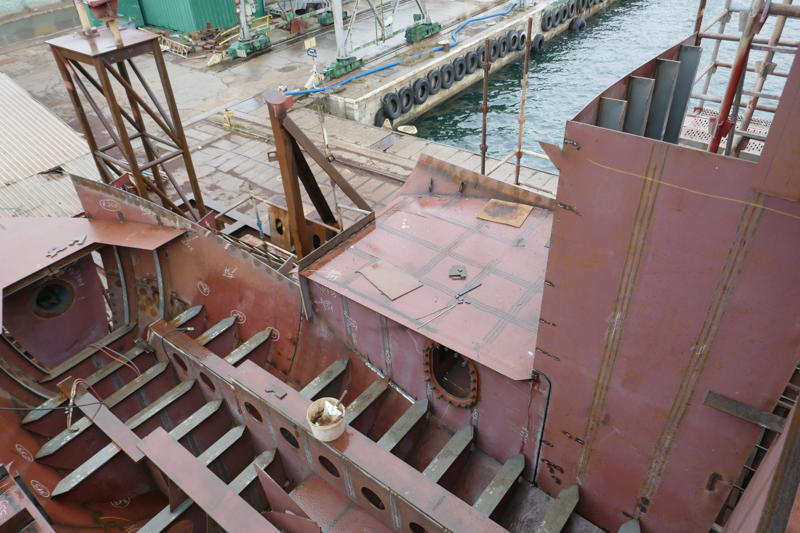 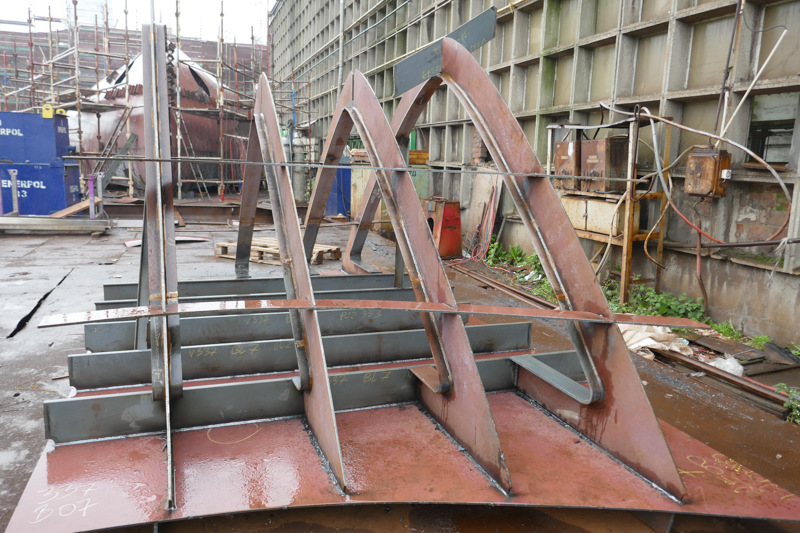 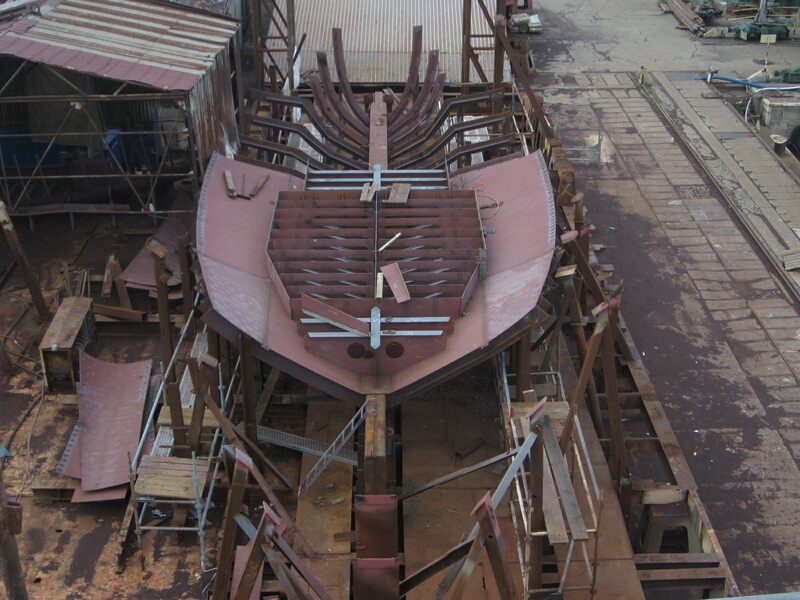 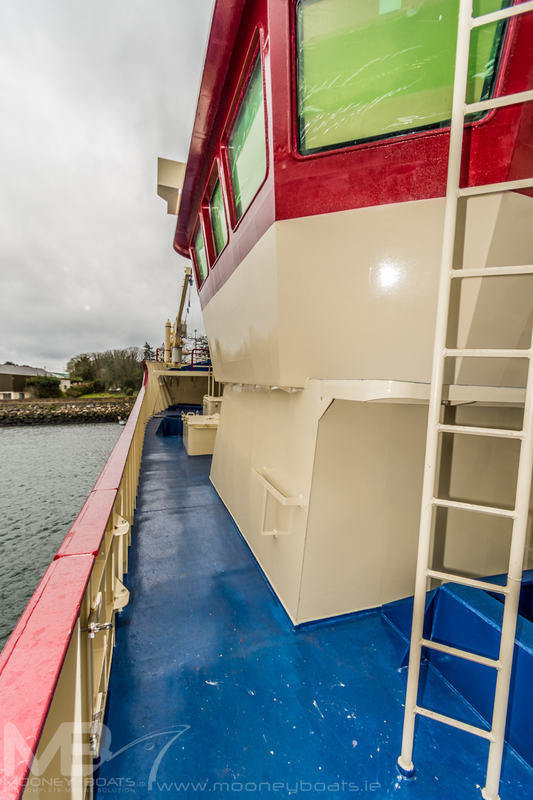 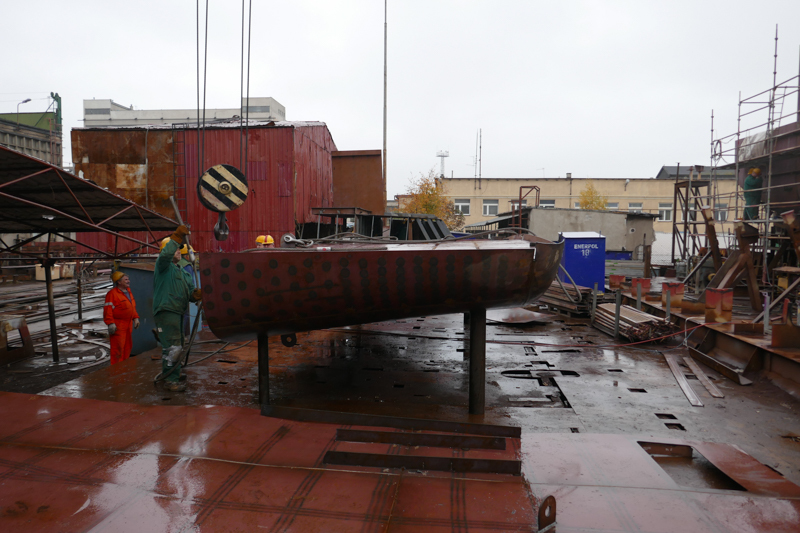 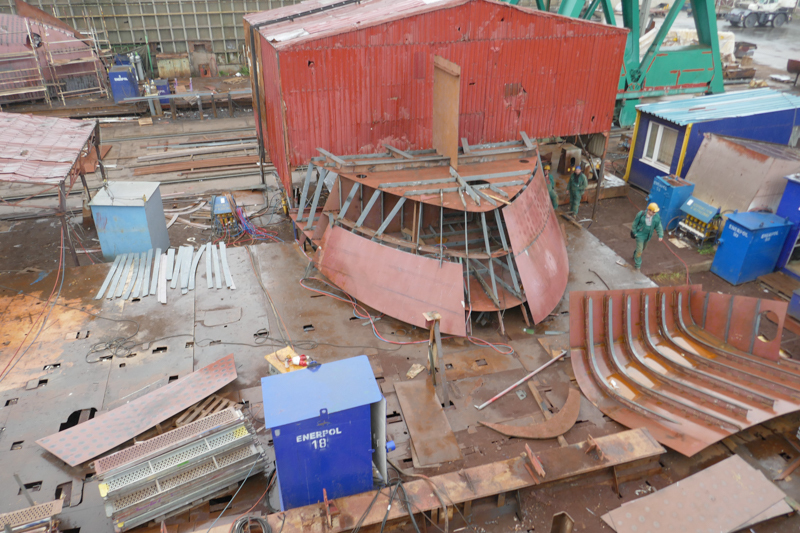 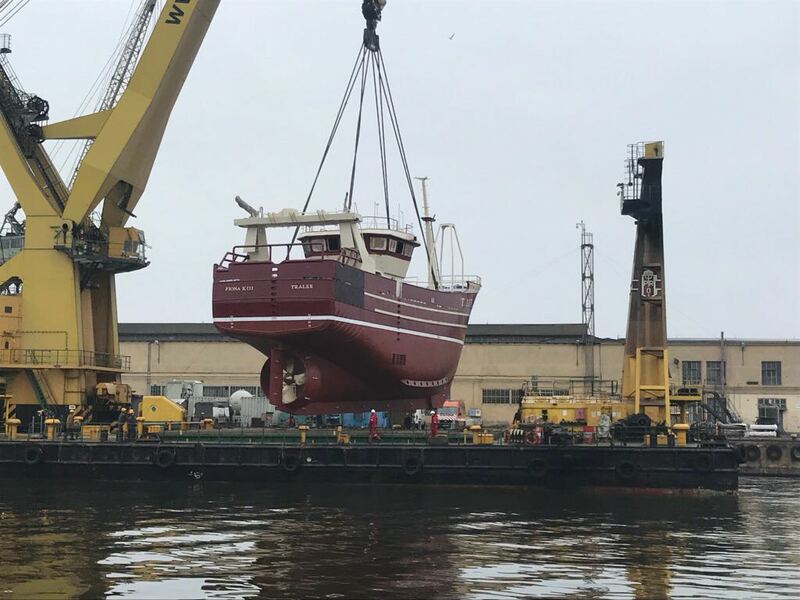 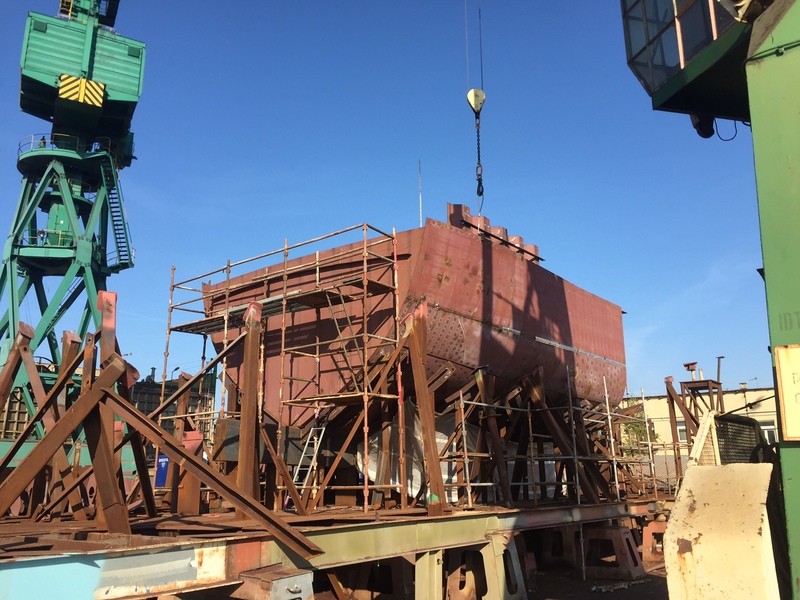 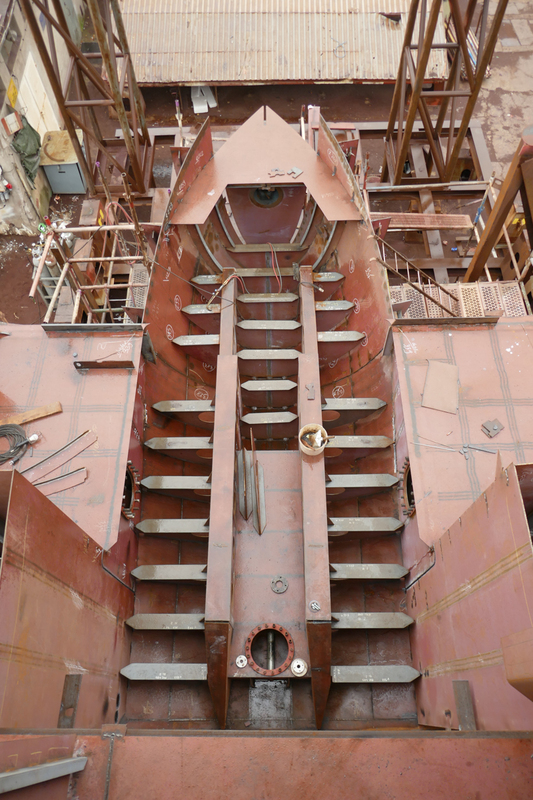 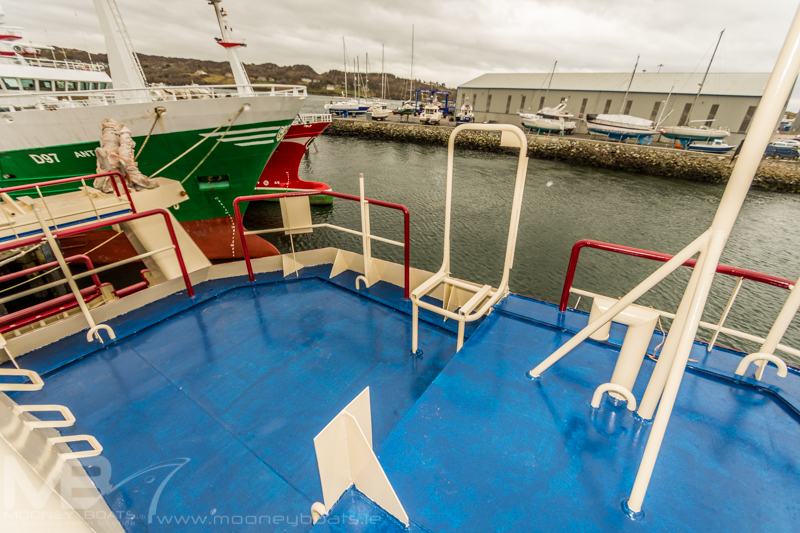 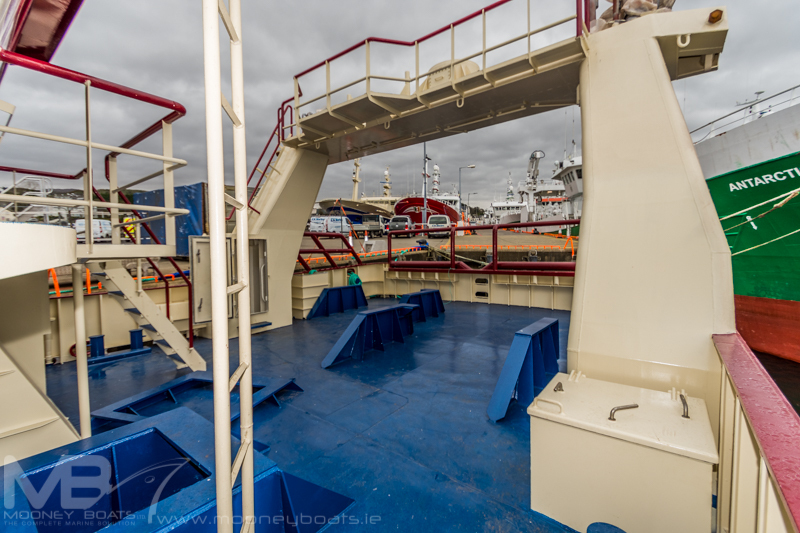 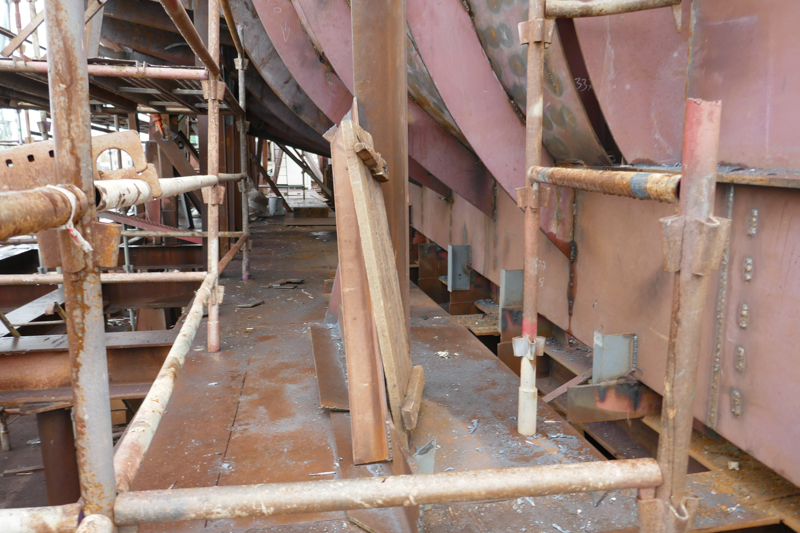 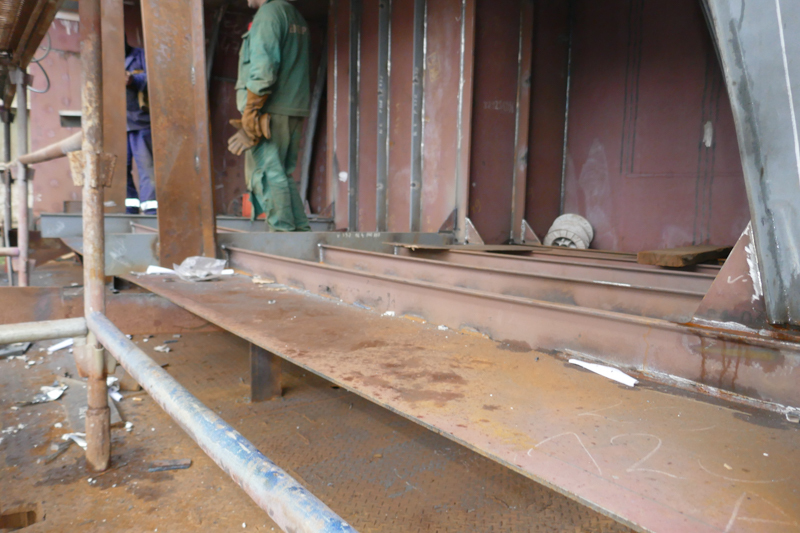 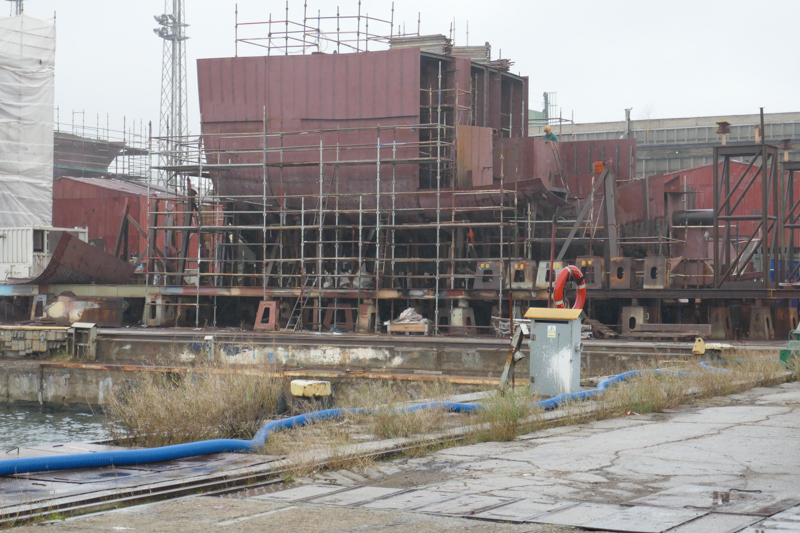 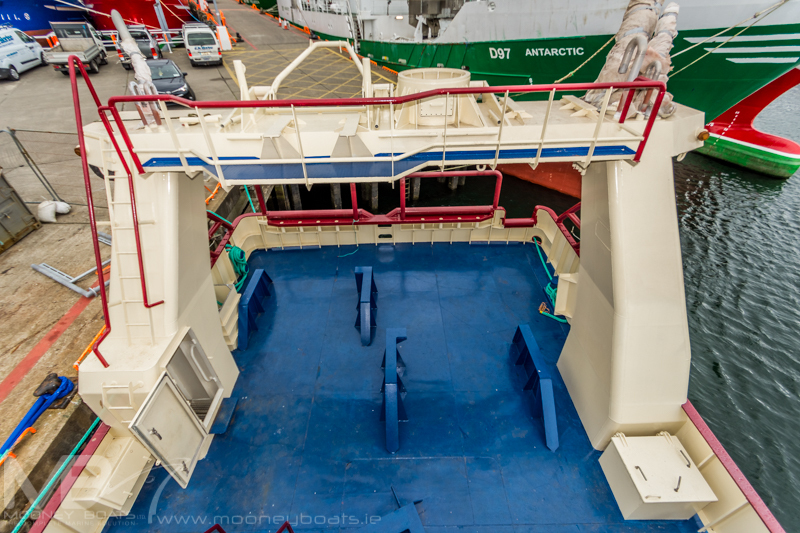 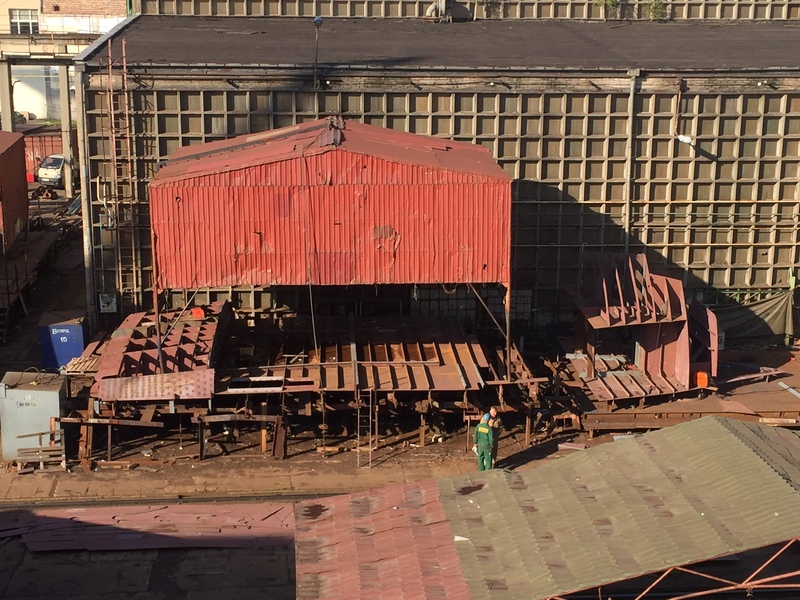 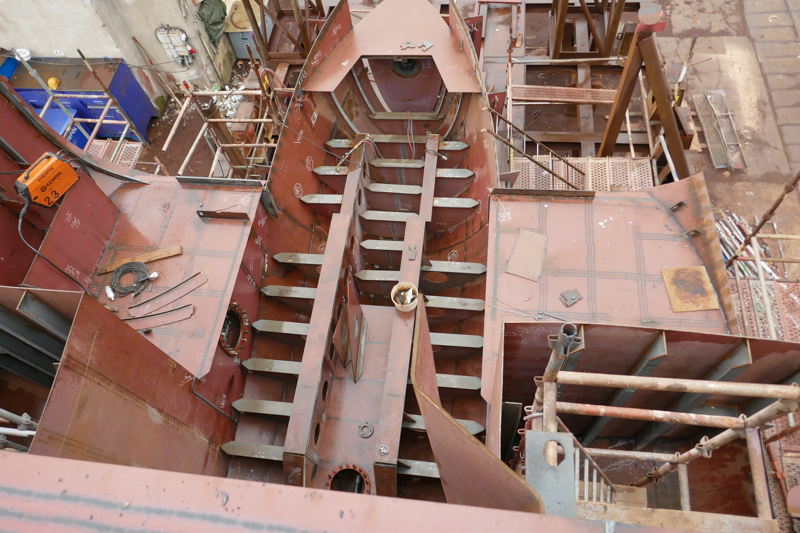 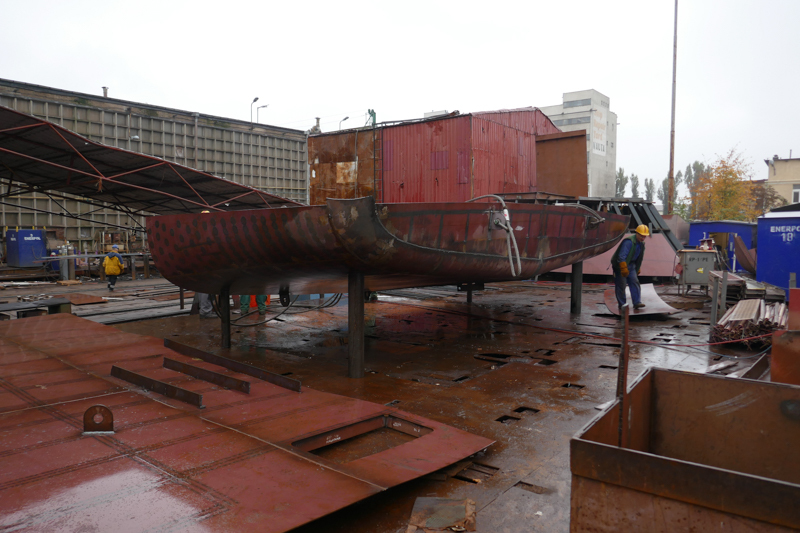 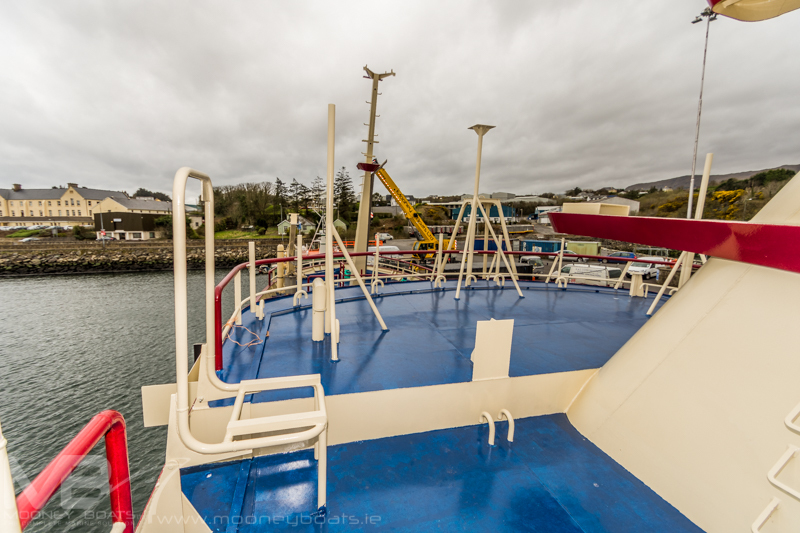 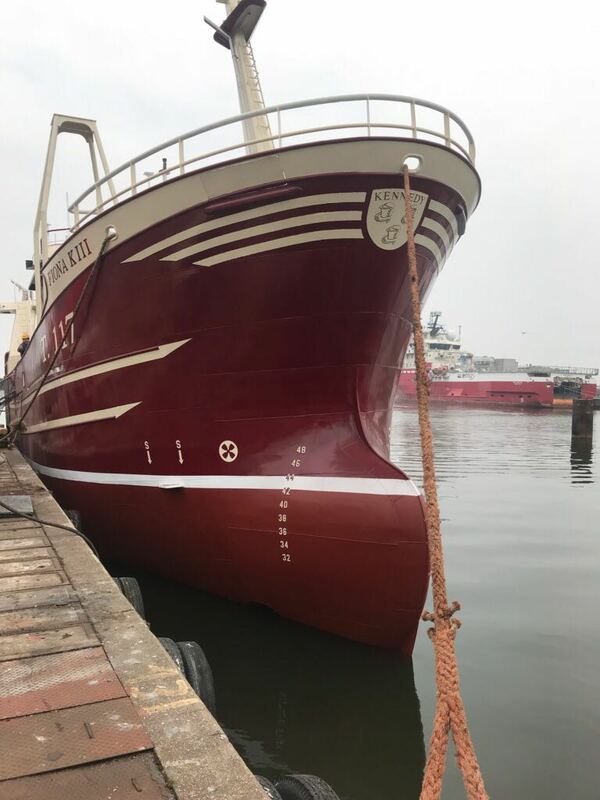 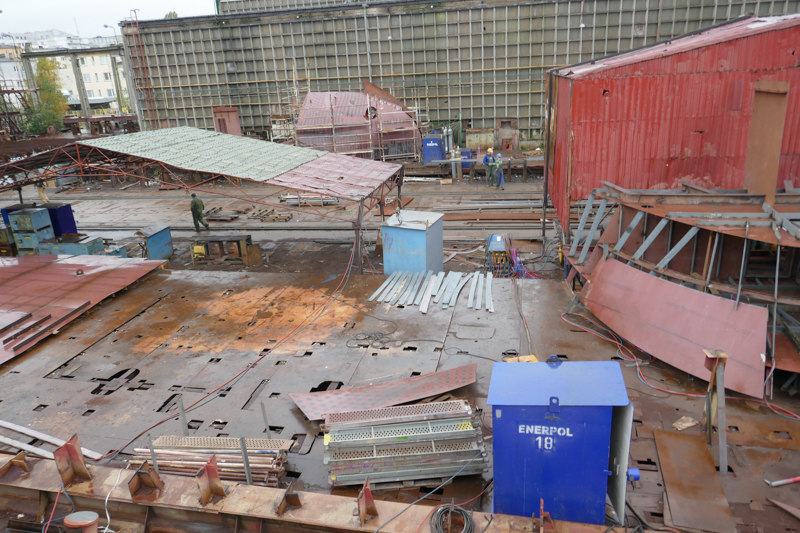 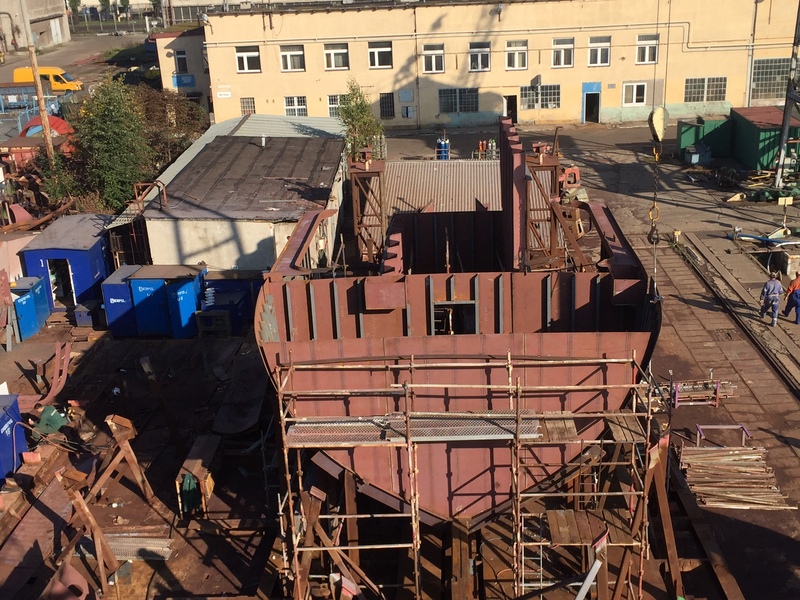 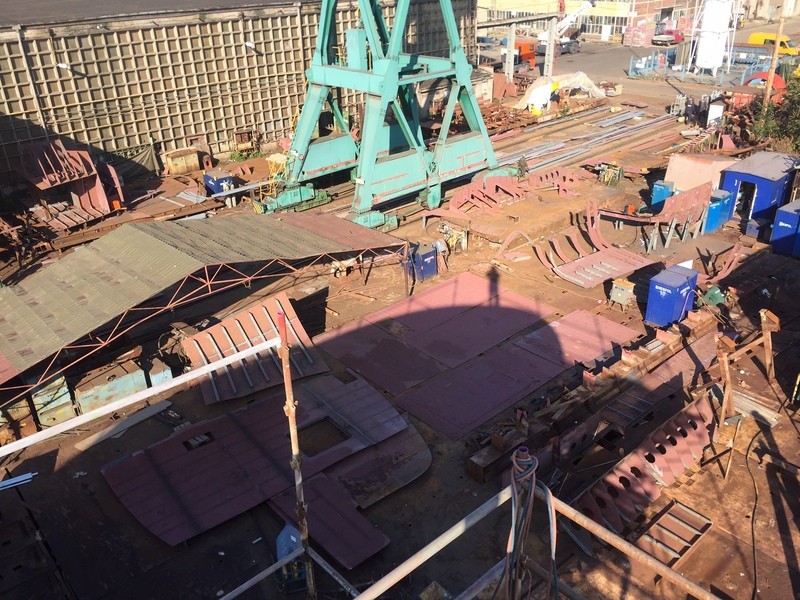 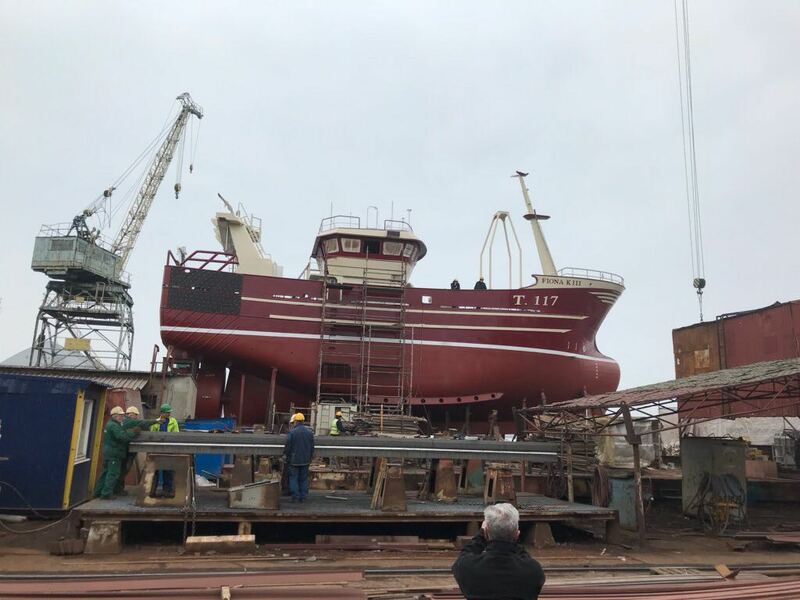 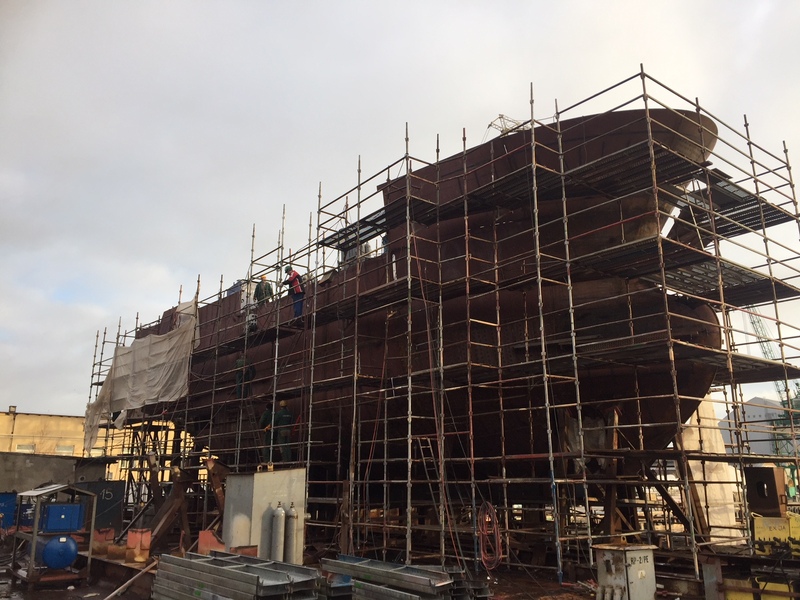 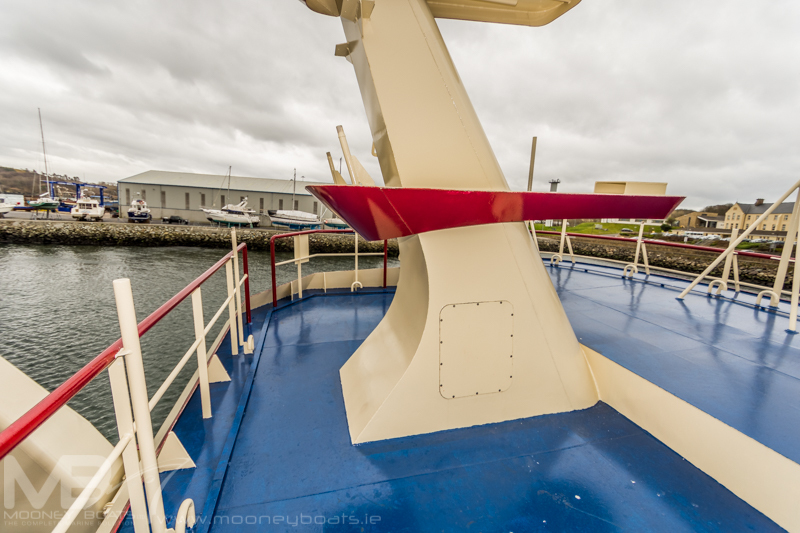 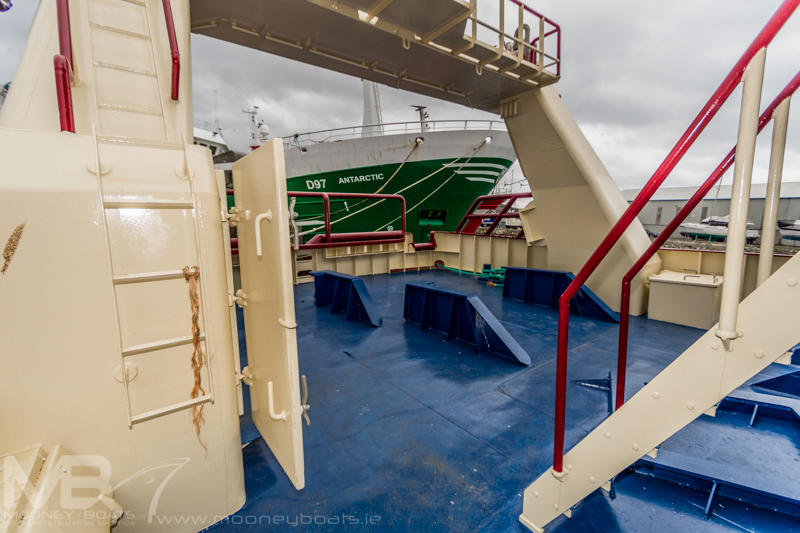 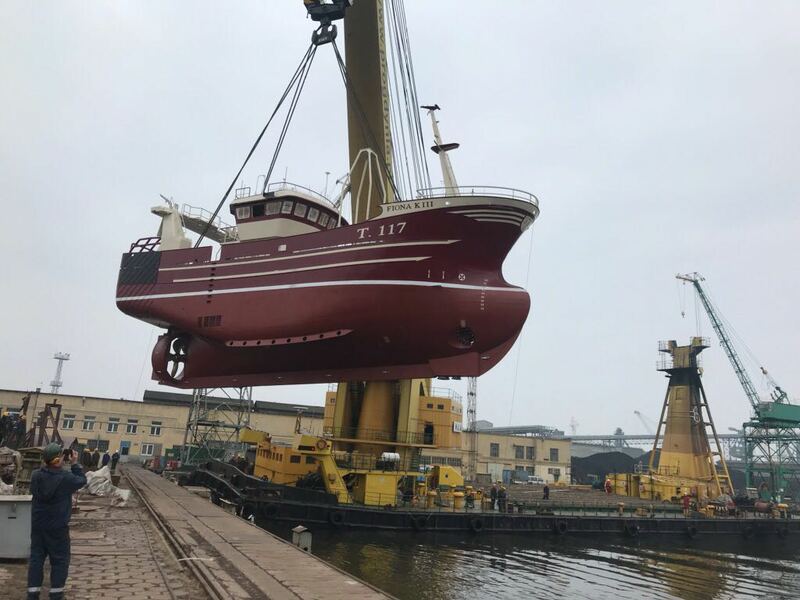 Of round bilge form, the steel hull, the sides of which are continued up to a full length shelter deck, were built at the Nauta Shipyard in Poland, before being towed across the North Sea to Killybegs in May 2018 for machinery installation and full-internal fit-out by Mooney Boats. 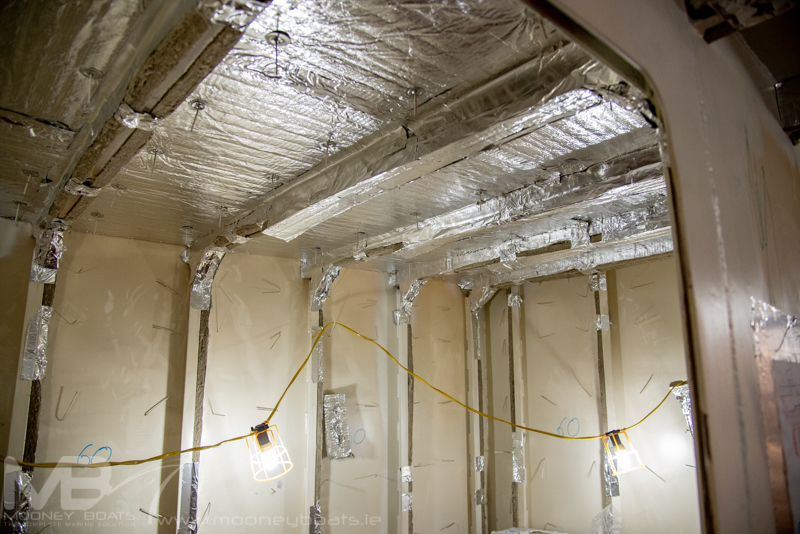 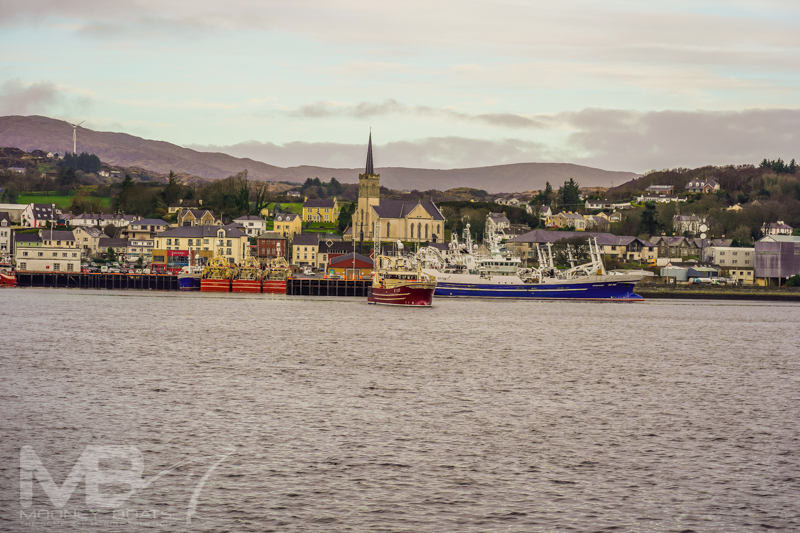 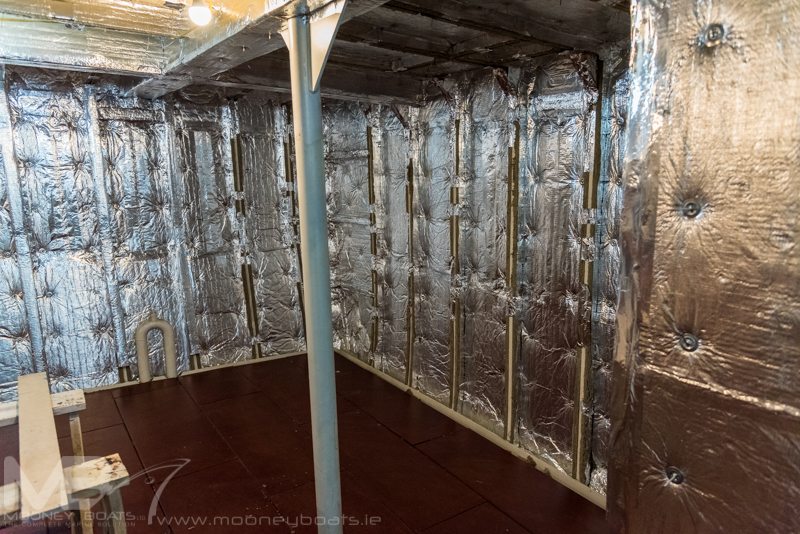 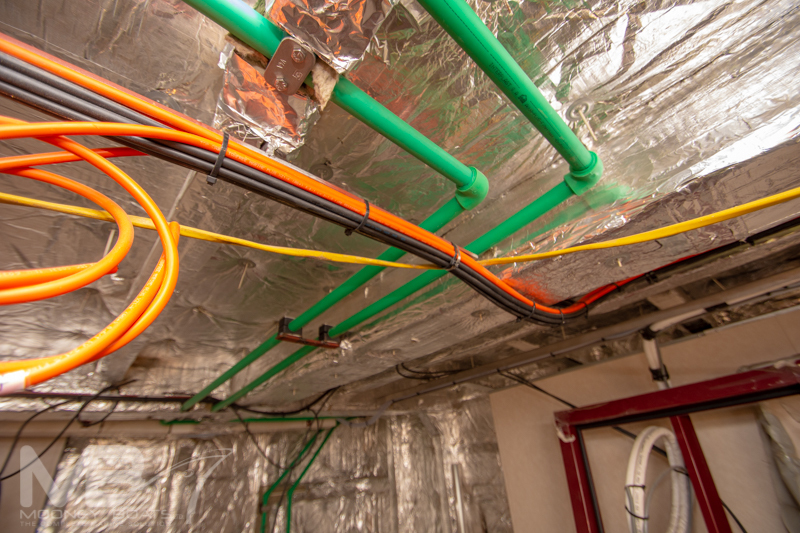 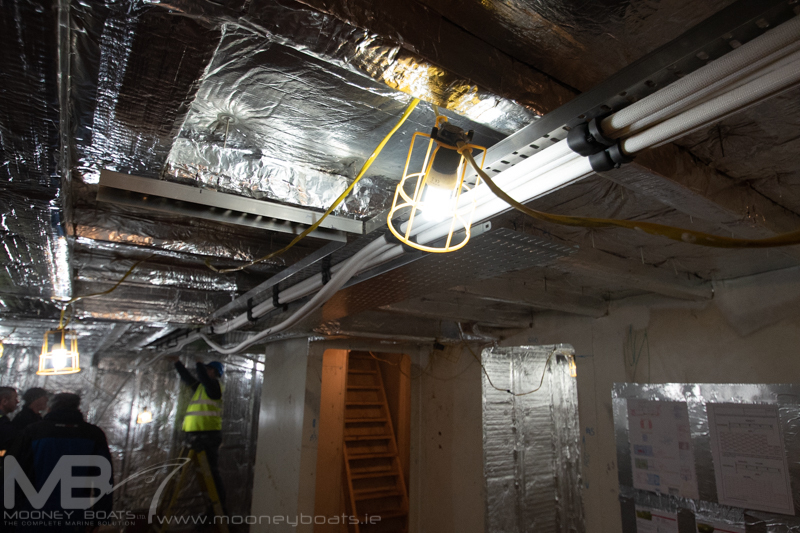 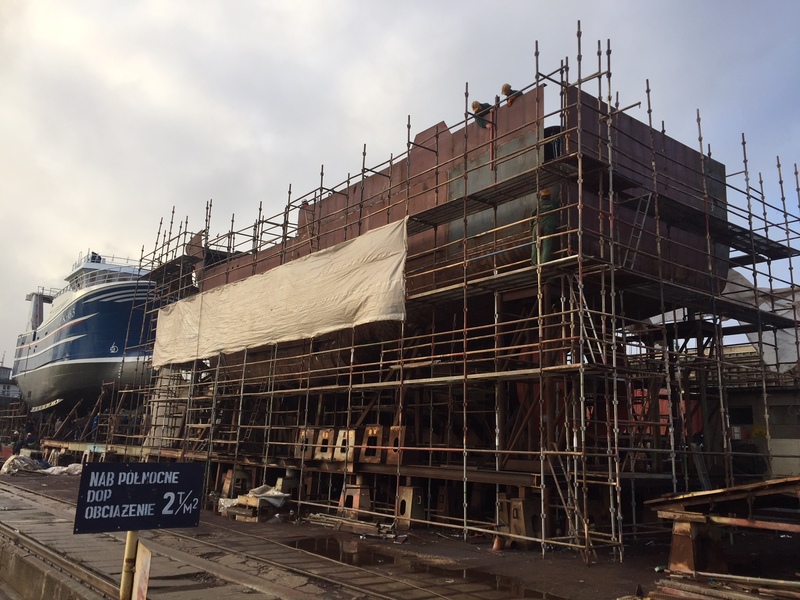 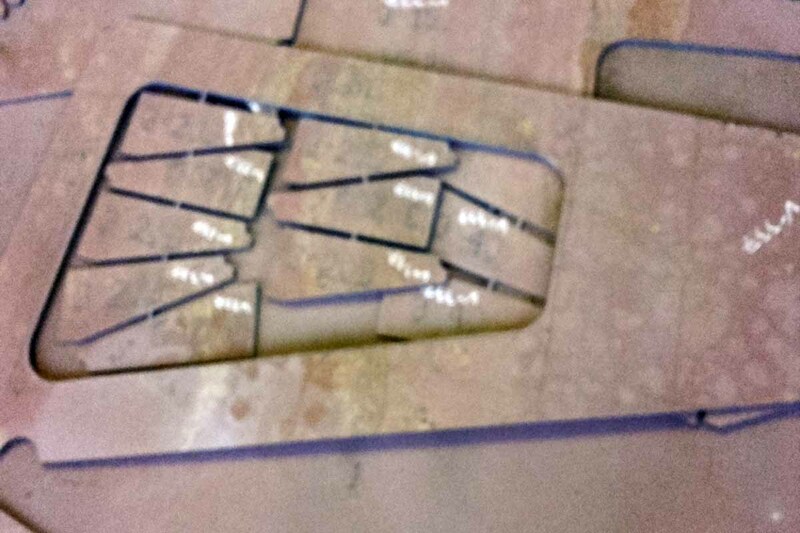 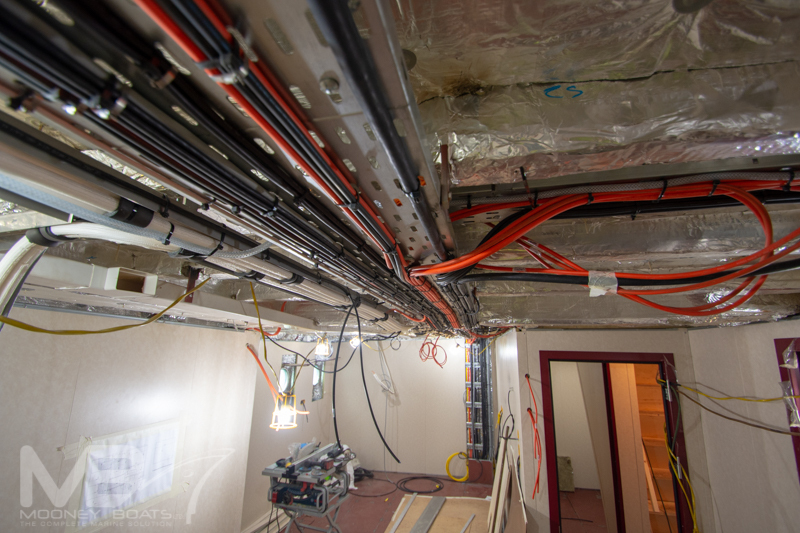 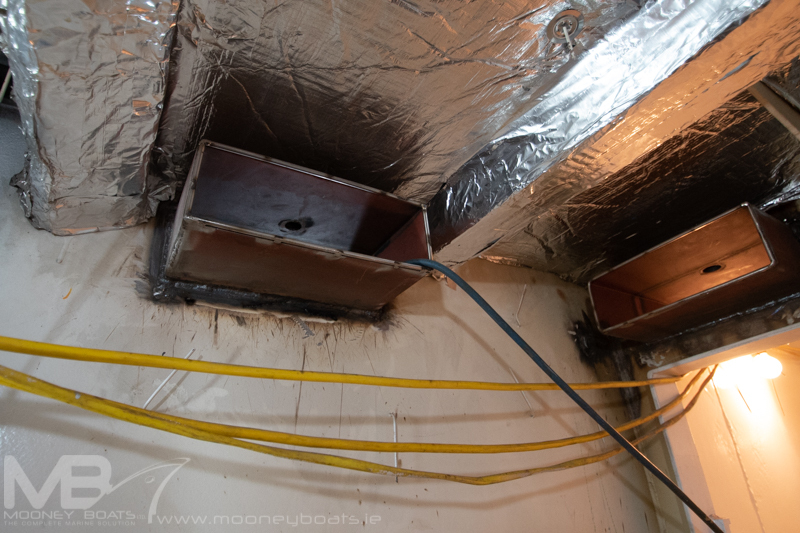 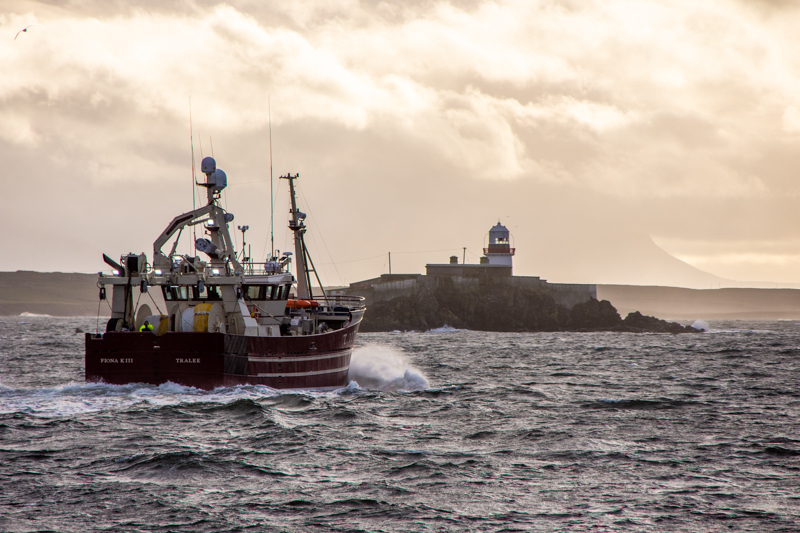 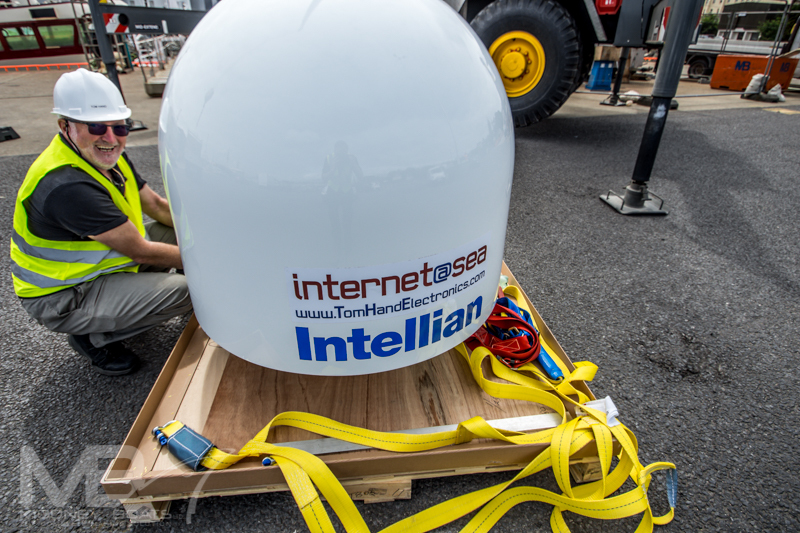 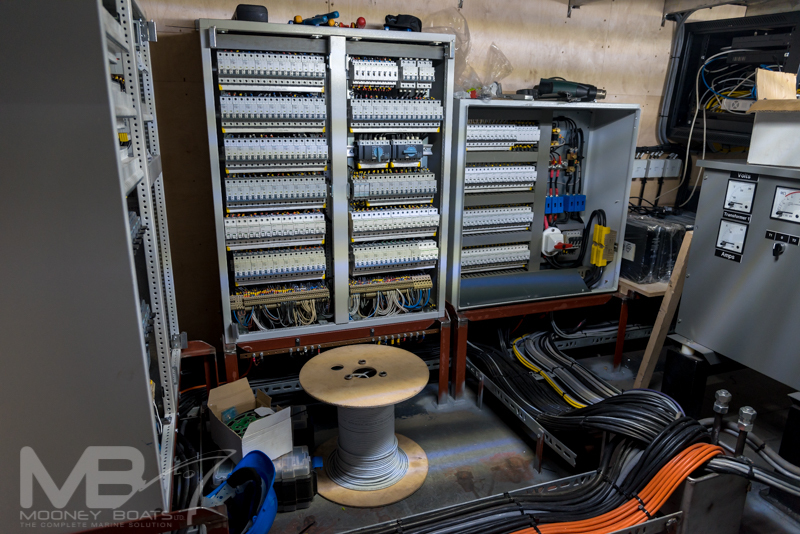 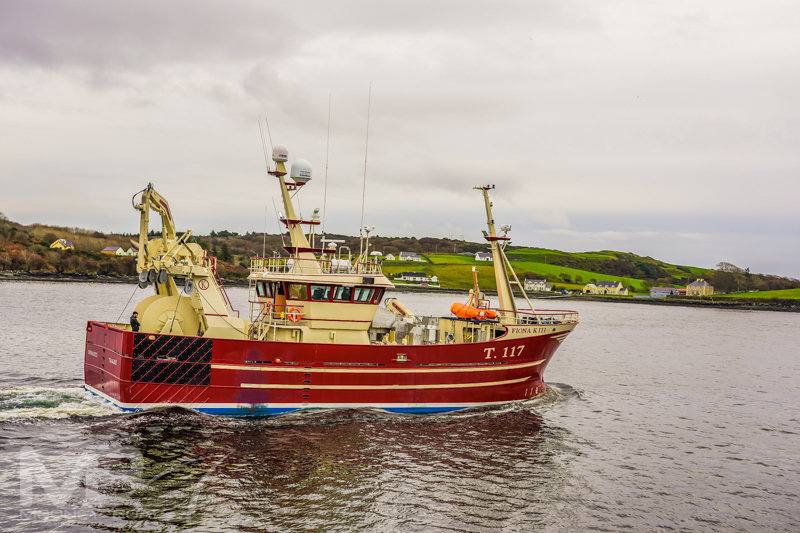 This work was carried out in close liaison with other leading specialist companies in Ireland, including Killybegs based KER Group, SeaQuest Systems, EK Marine, & Barry Electronics Ltd and also Padmos, Kilmore Quay and Tom Hand Electronics Dingle . 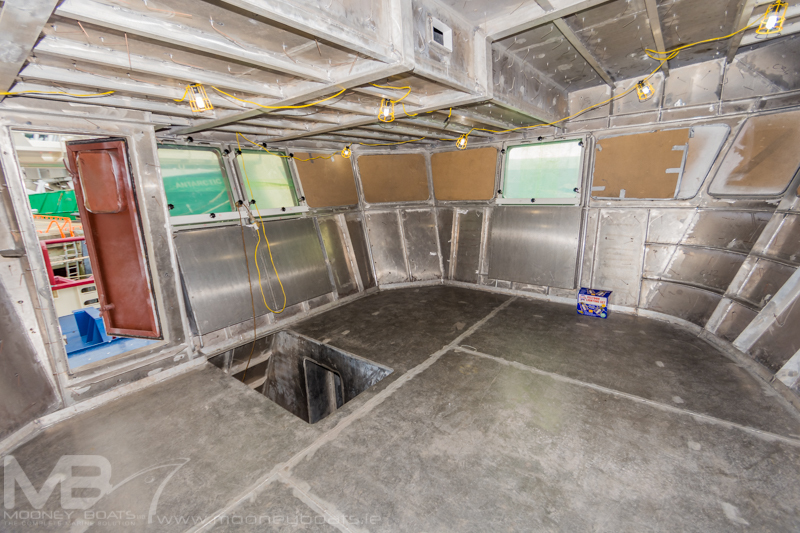 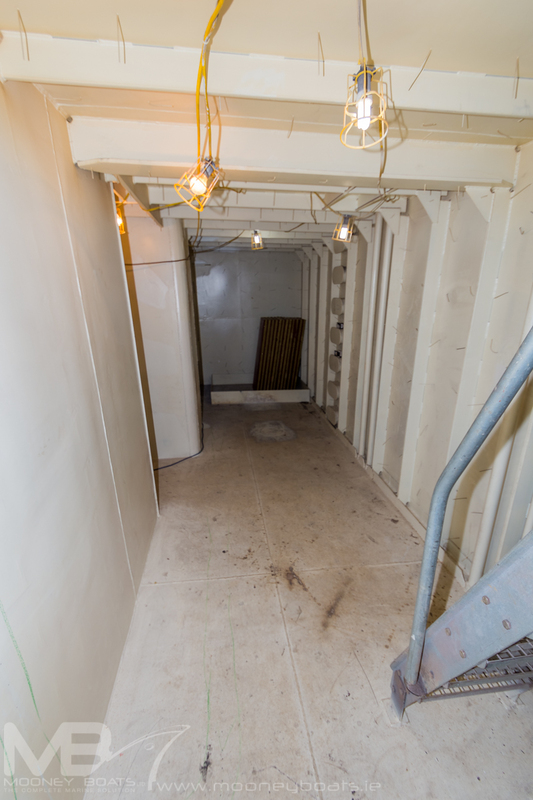 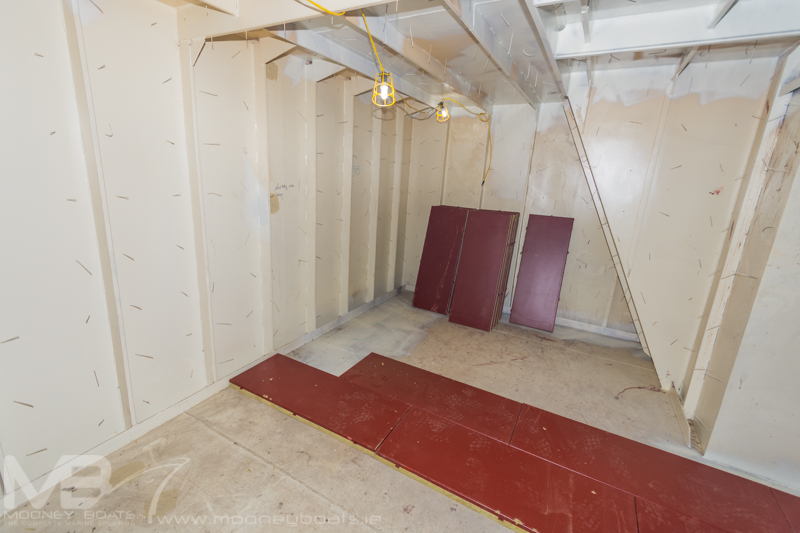 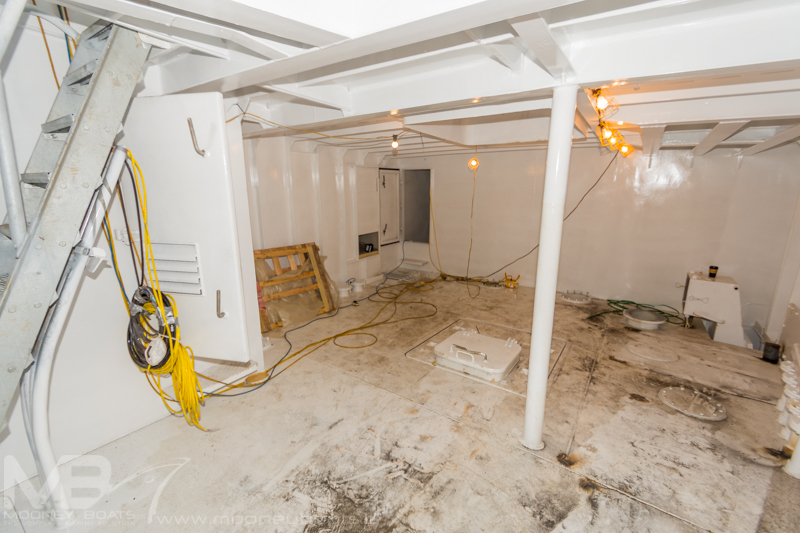 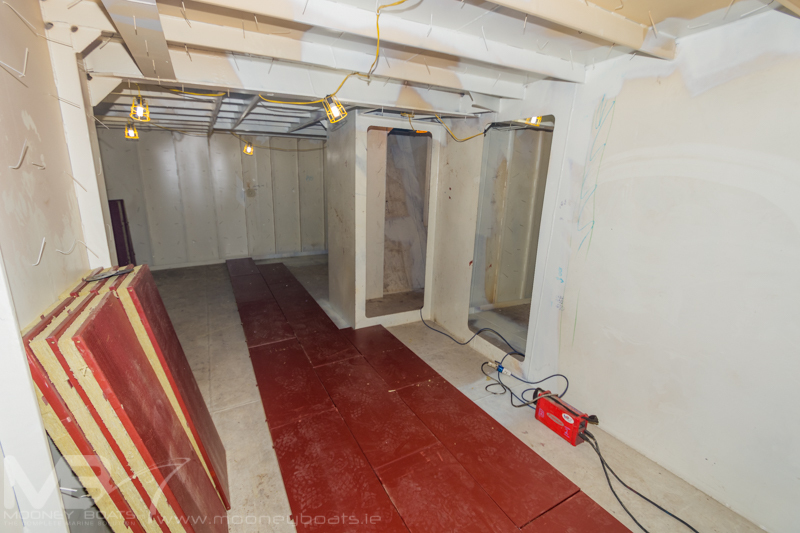 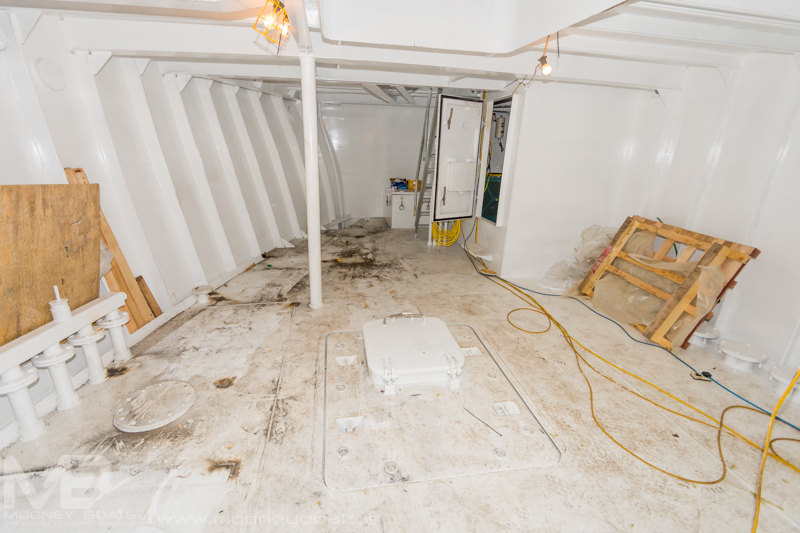 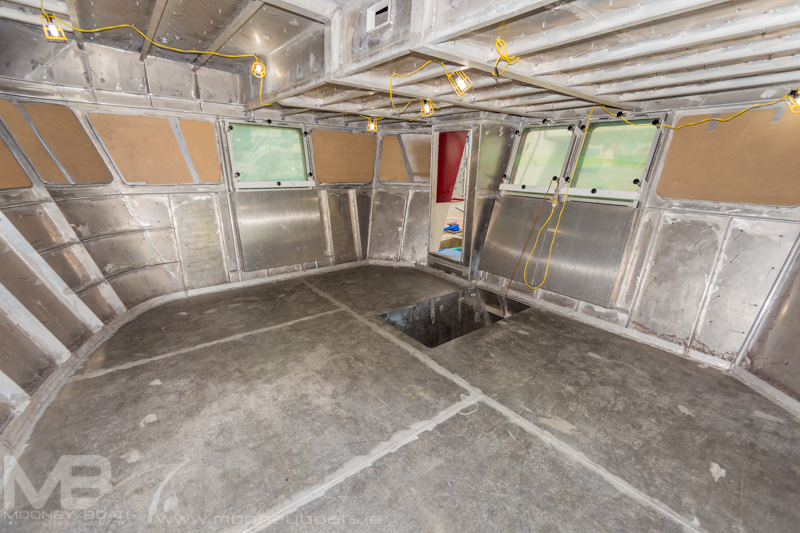 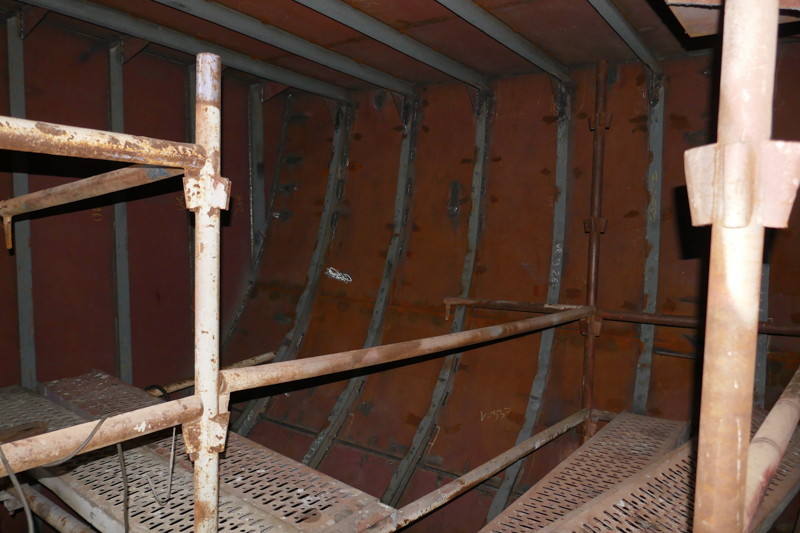 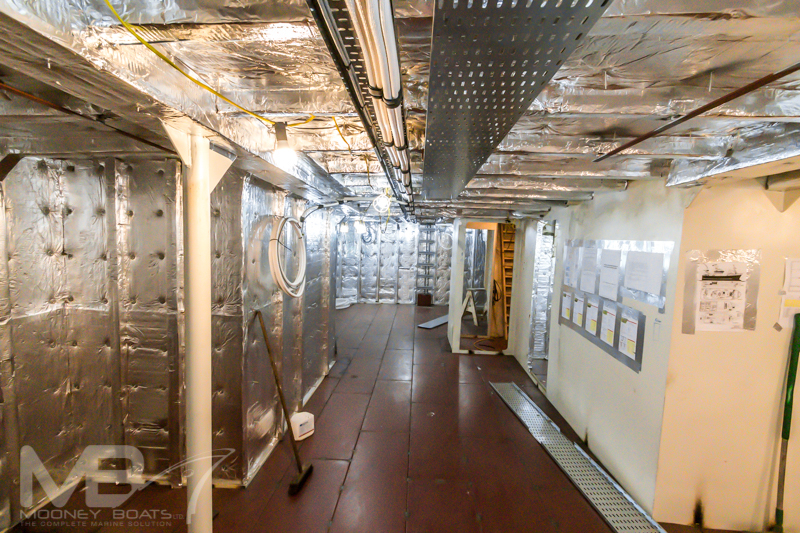 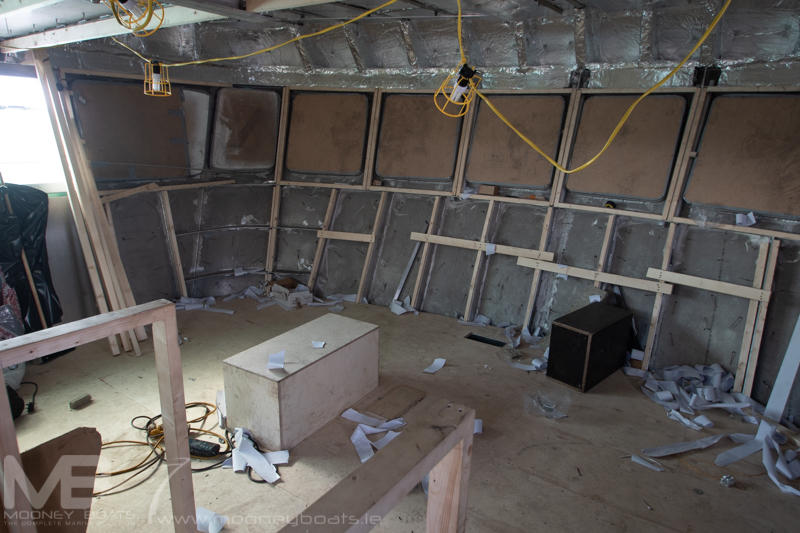 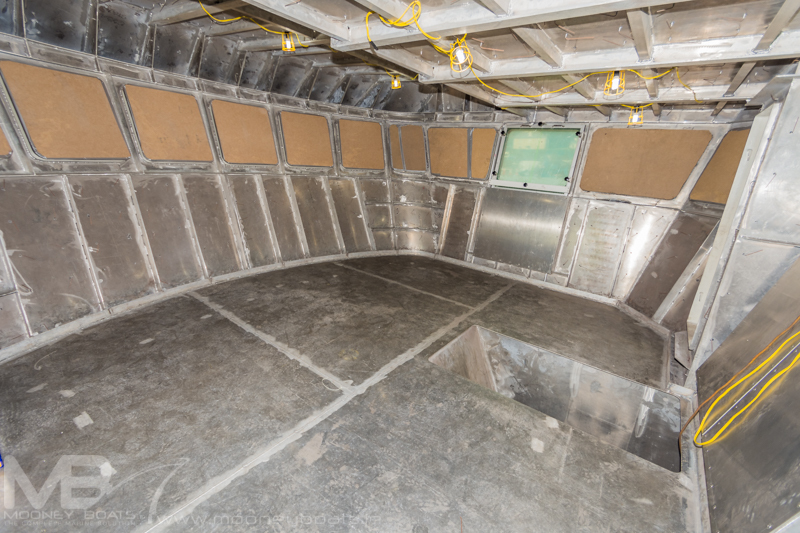 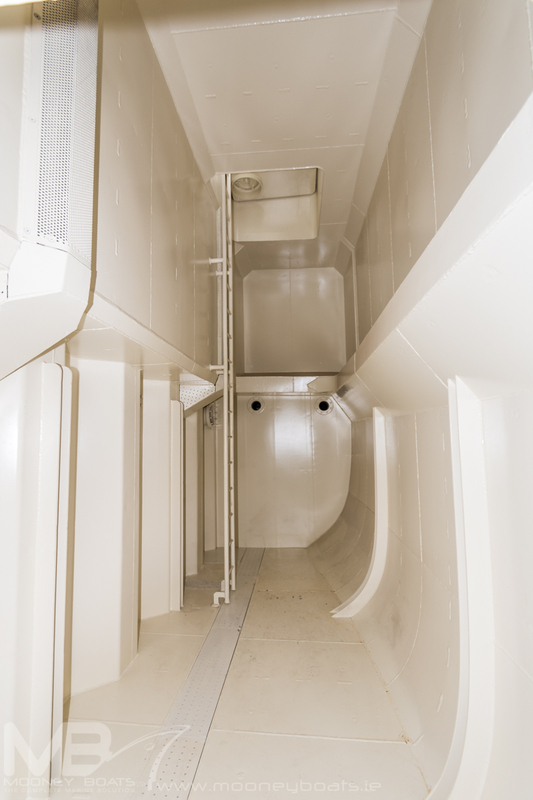 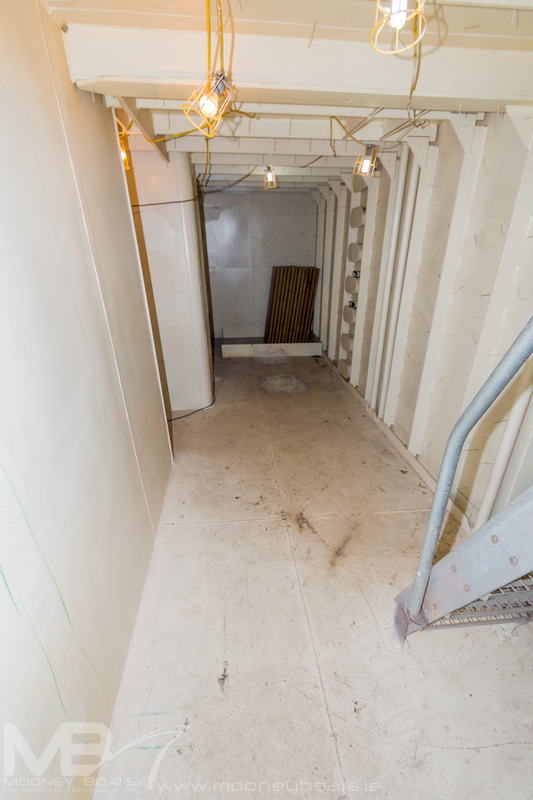 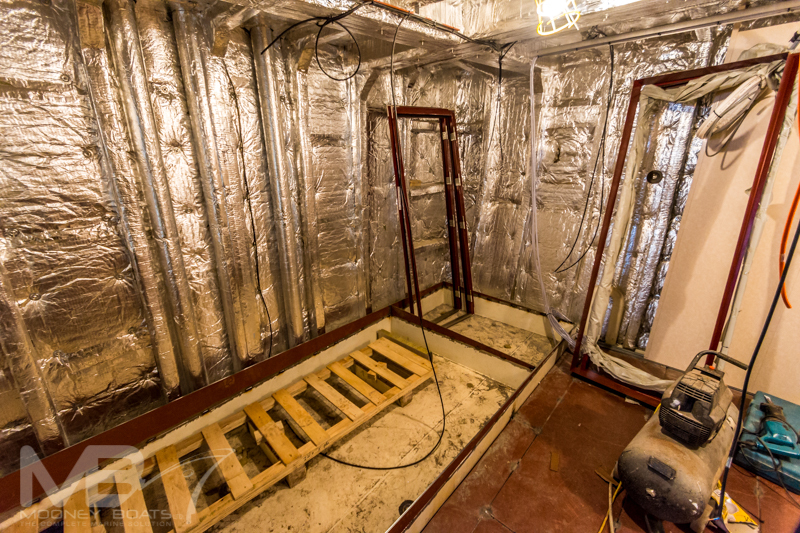 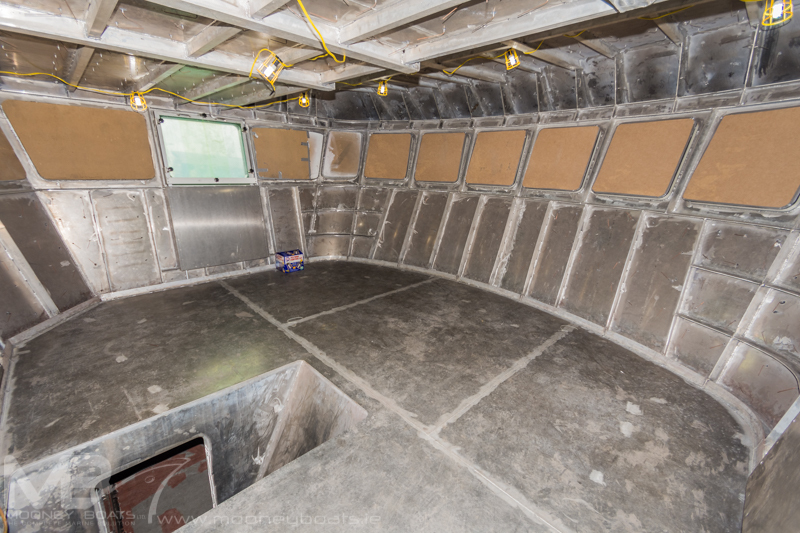 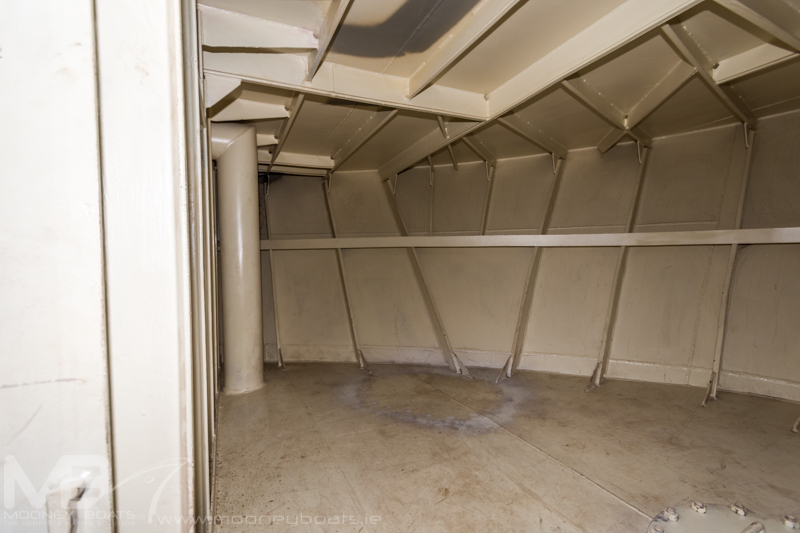 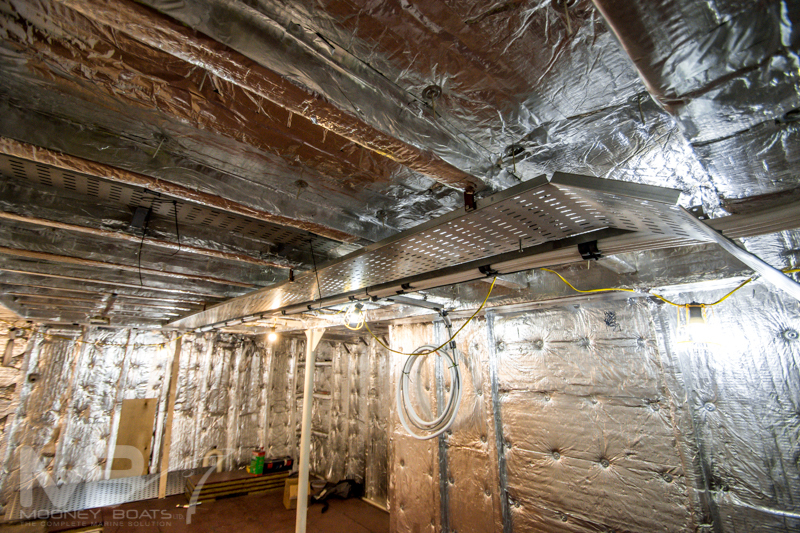 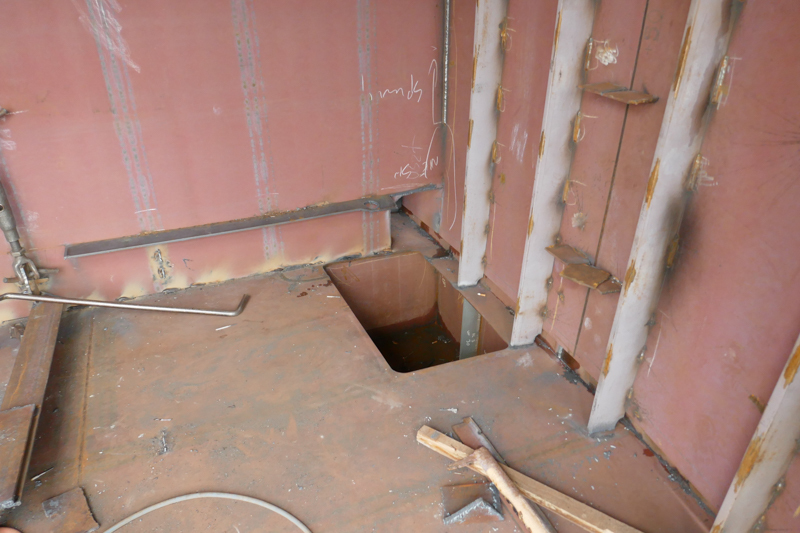 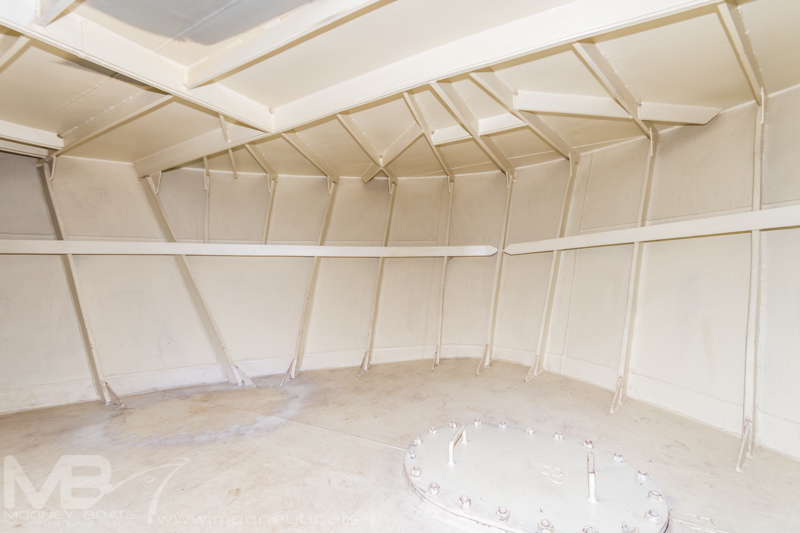 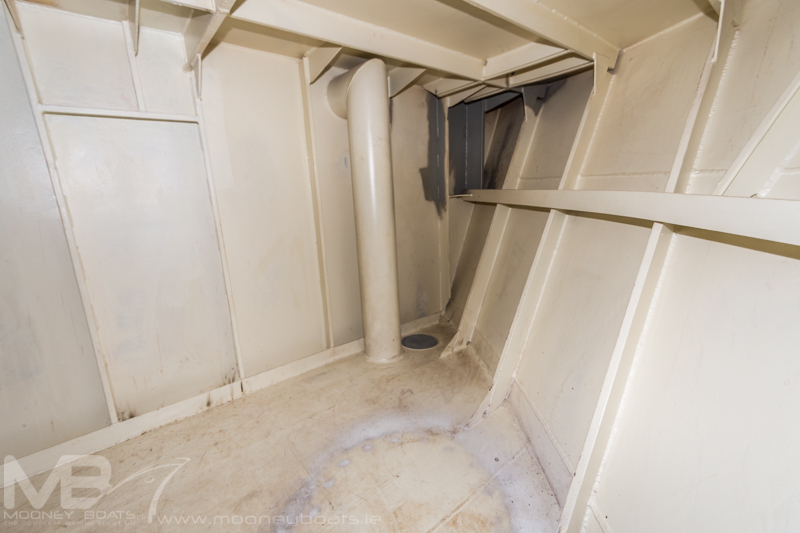 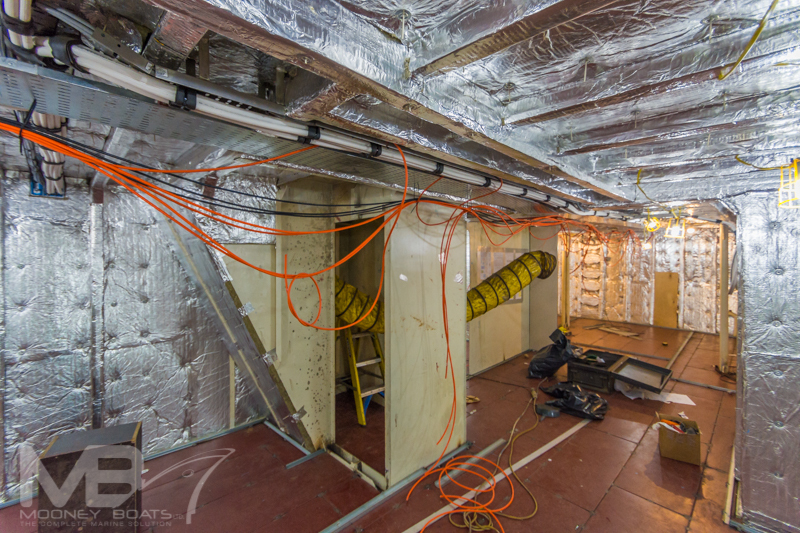 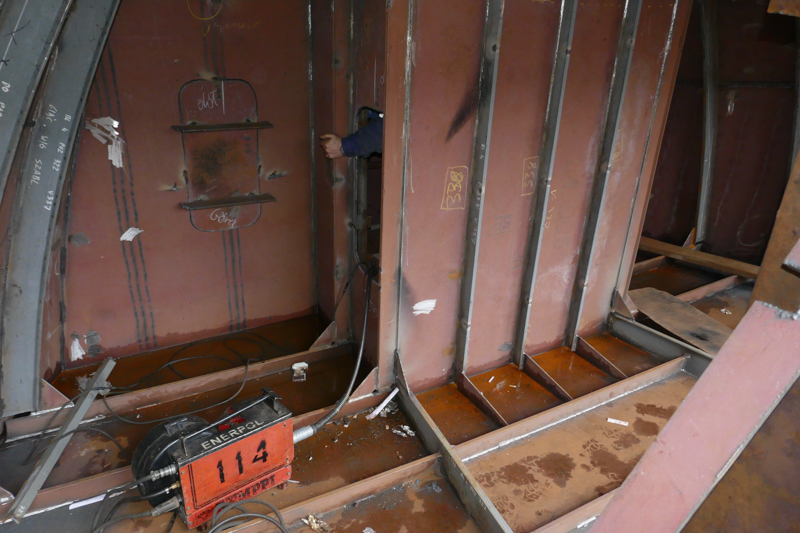 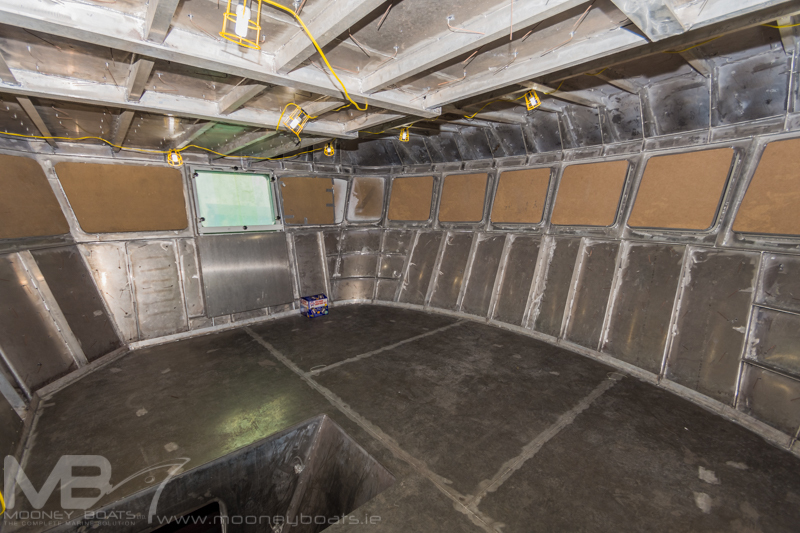 Below the main deck Fiona K III hull is subdivided into seven watertight compartments: forepeak; Sonar Room. 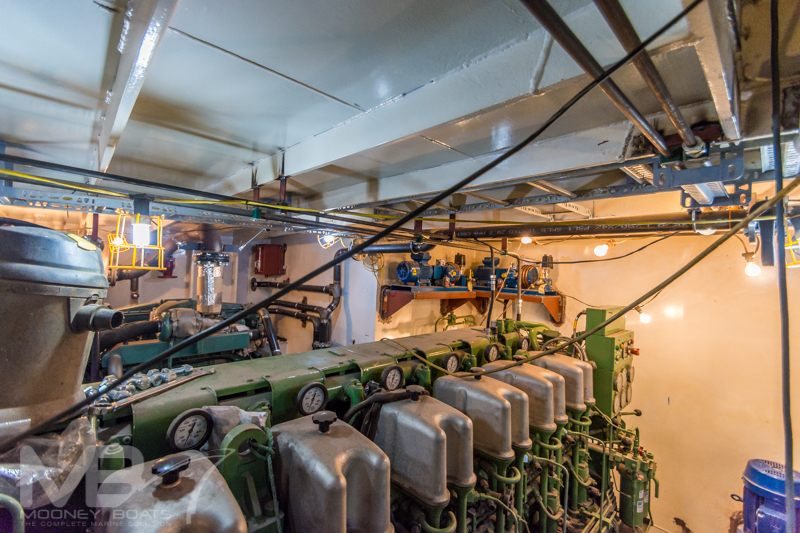 RSW Plant Room, Dry-hold, 3 RSW tank, Engine room and Steering Flat. 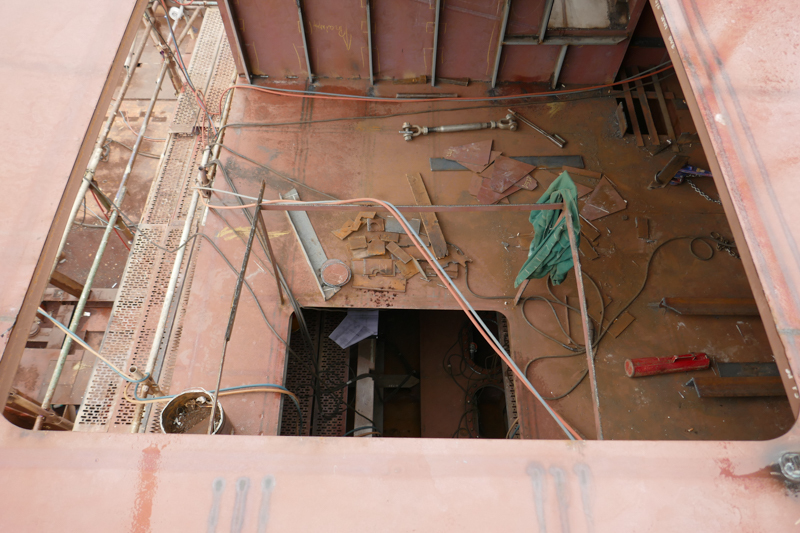 In the aft section there are 2 fuel oil tanks port & starboard, amidships double bottom fuel oil tank to port and starboard below RSW tanks and in the bow below the RSW room aft of the bow thruster compartment. 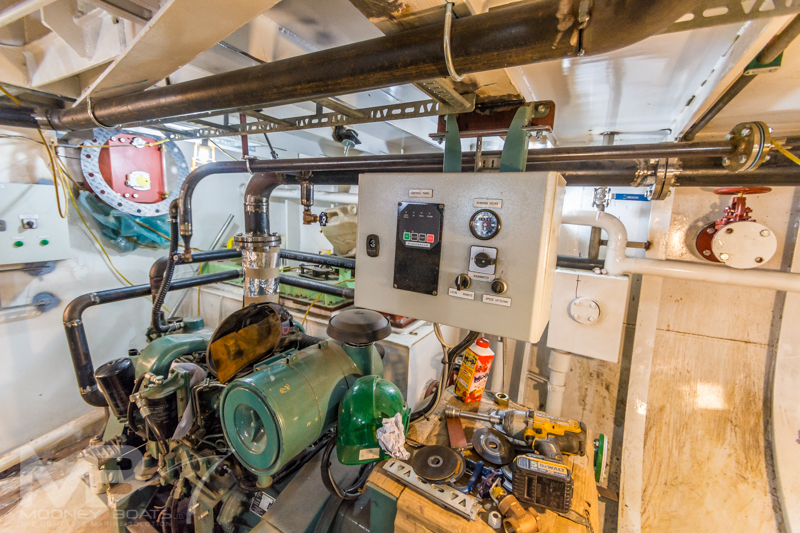 In the engine room, and aft peak there is freshwater, Blackwater lube and hydraulic oil tanks as well as a daily service tank. 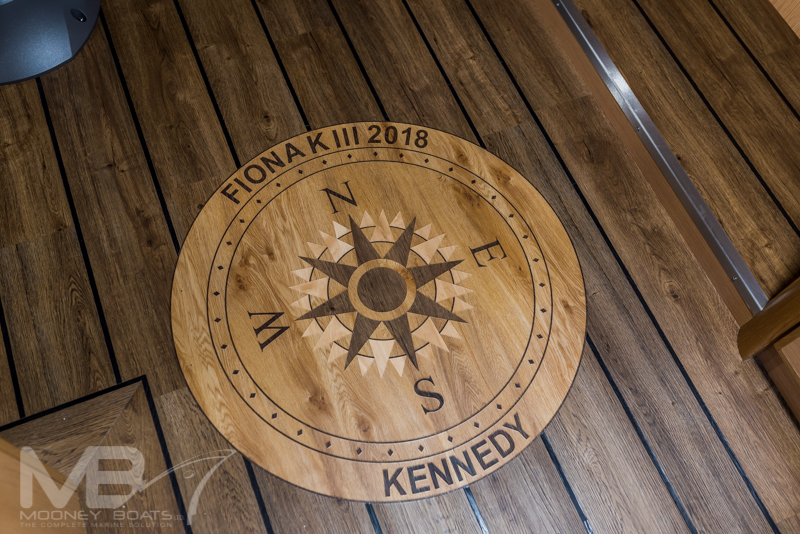 Working arrangements throughout Fiona K III have been designed specifically to meet the owner’s requirements, in terms of both safety and efficiency. 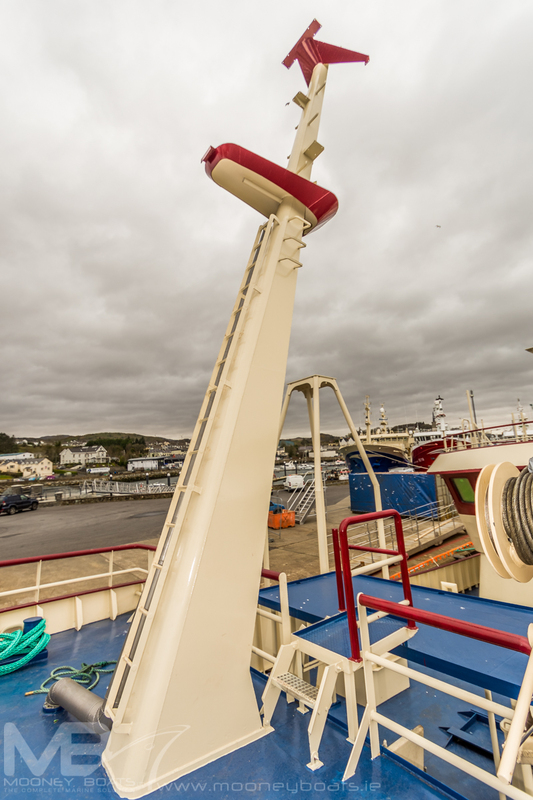 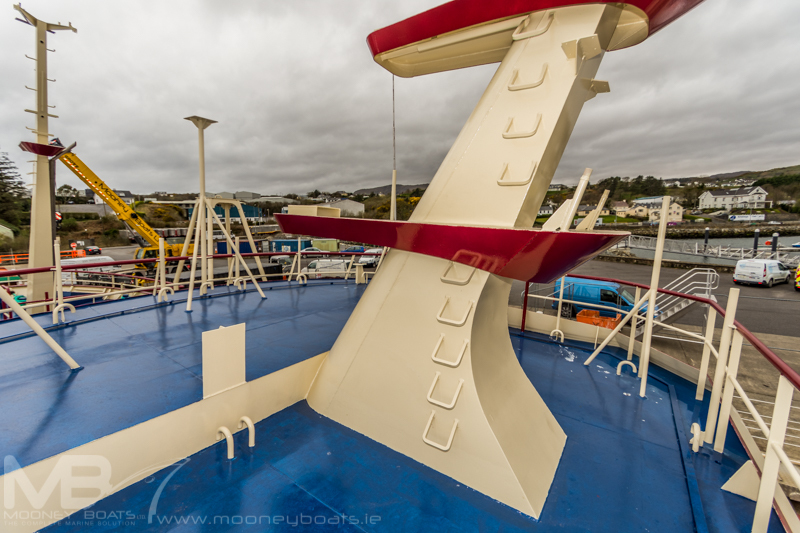 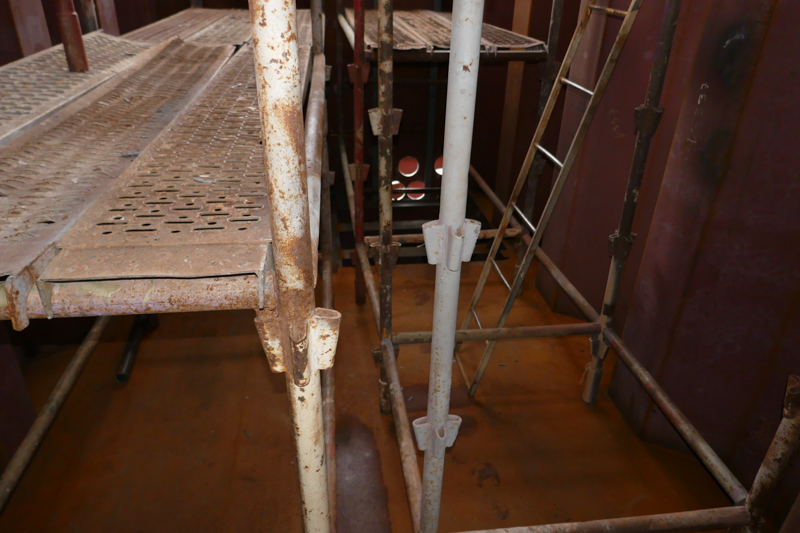 There is a raised whaleback which is used to hold equipment and spares for fishing operations. 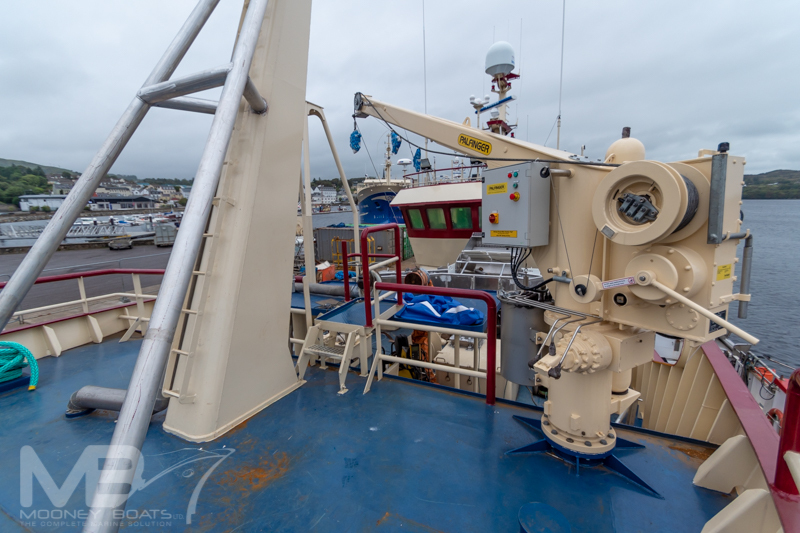 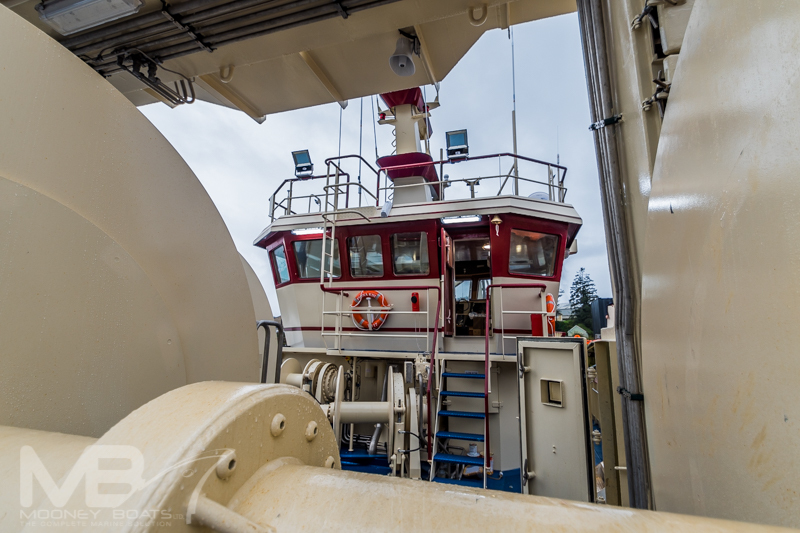 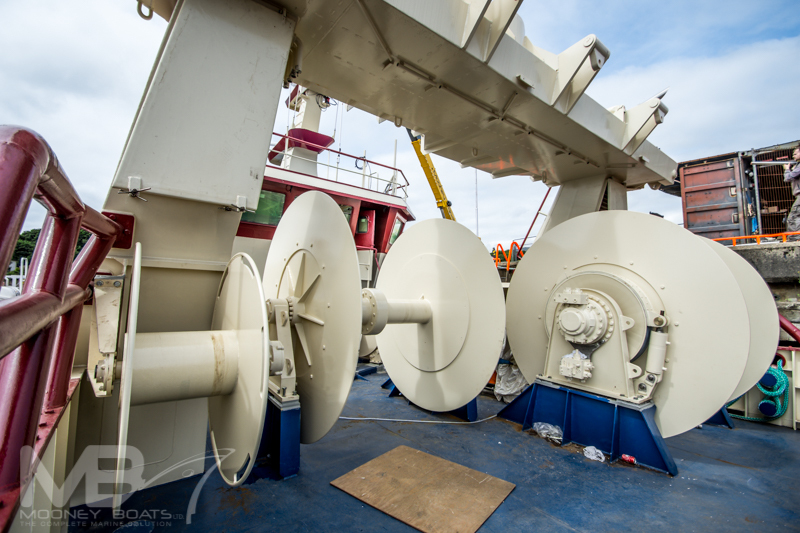 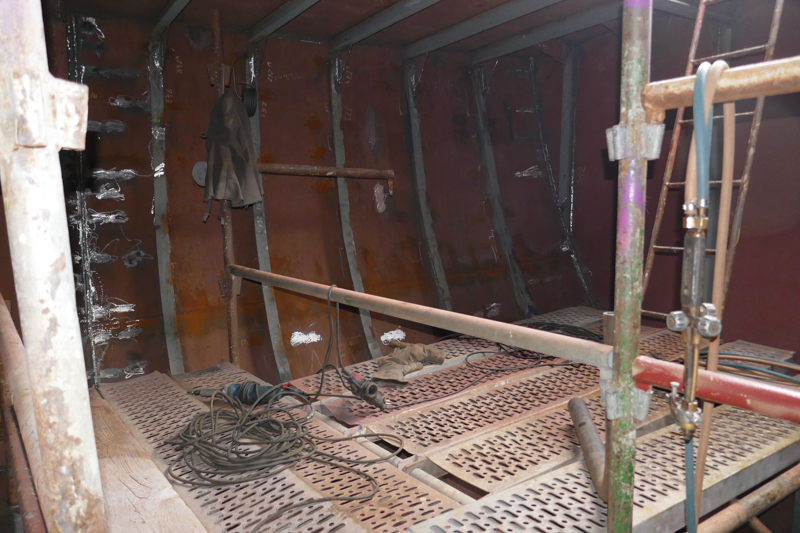 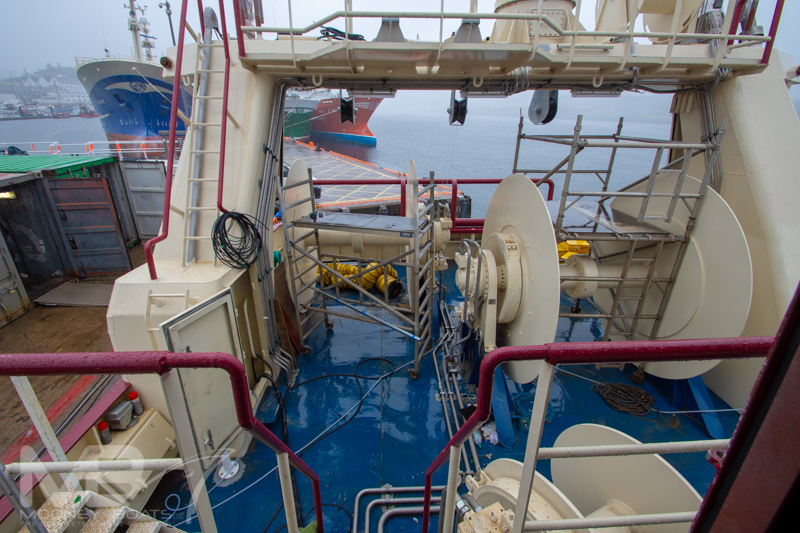 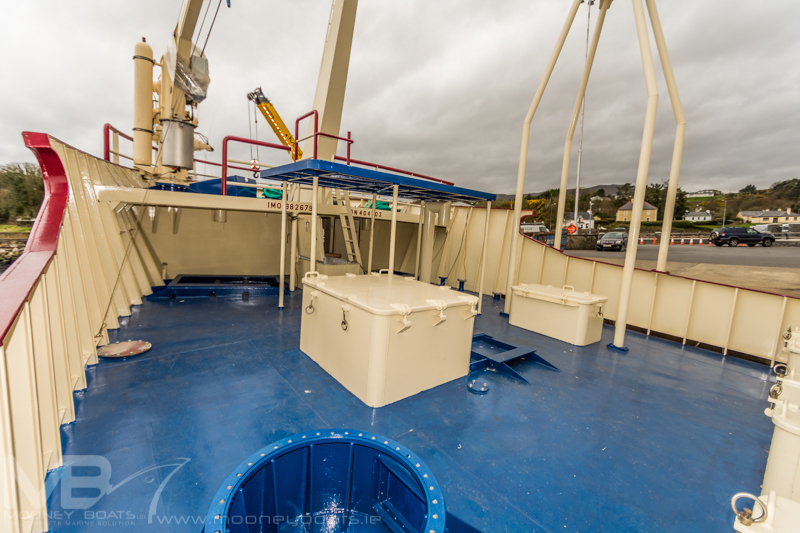 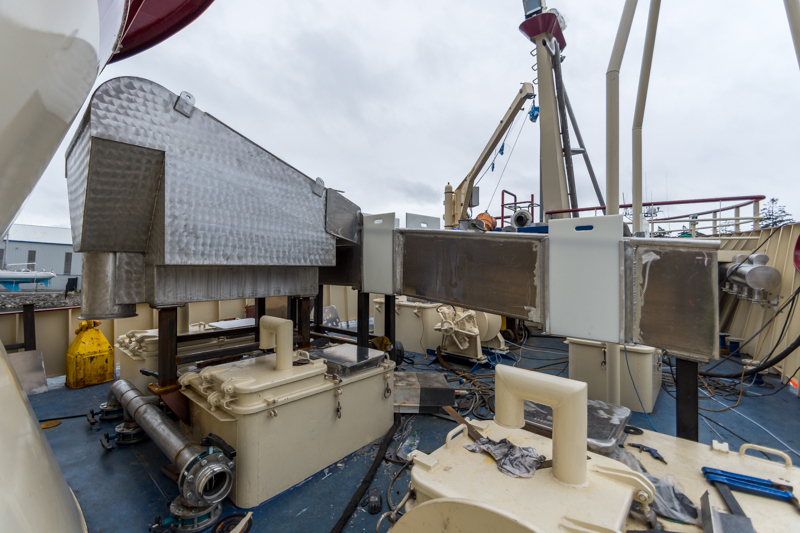 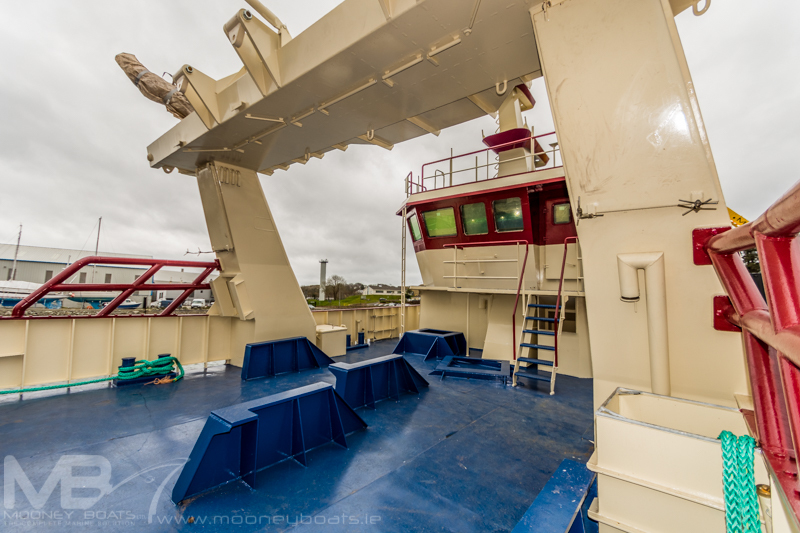 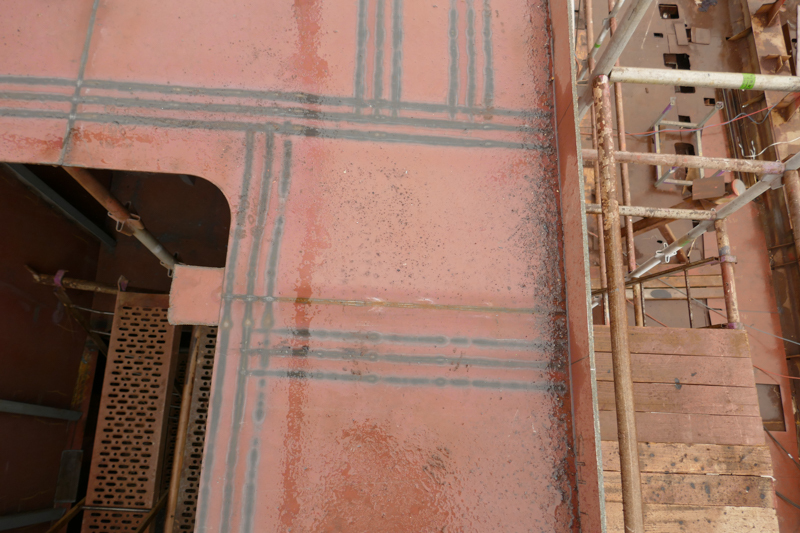 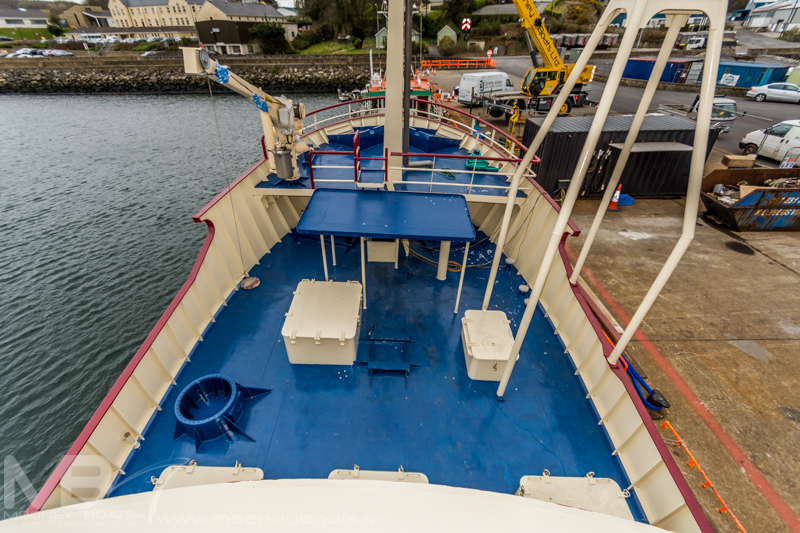 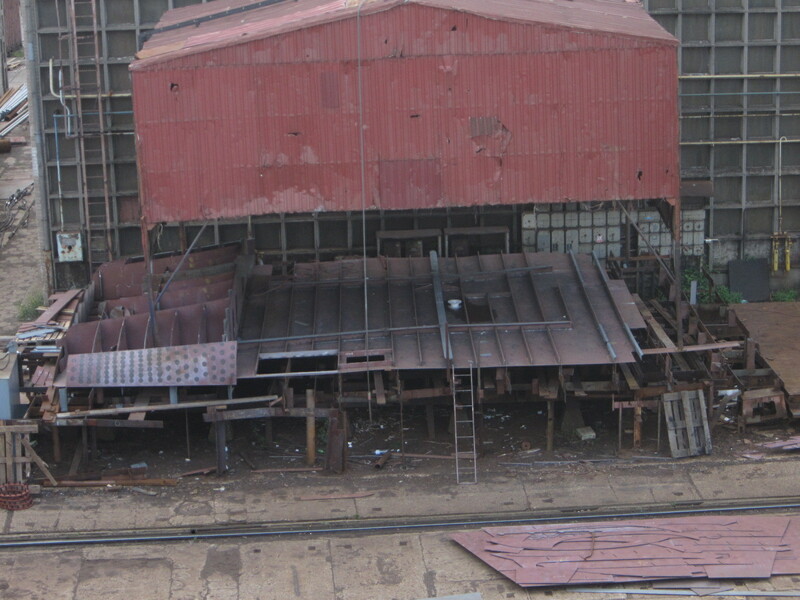 The top deck of the raised bow extends aft to cover the 2 trawl winches located port and starboard side. 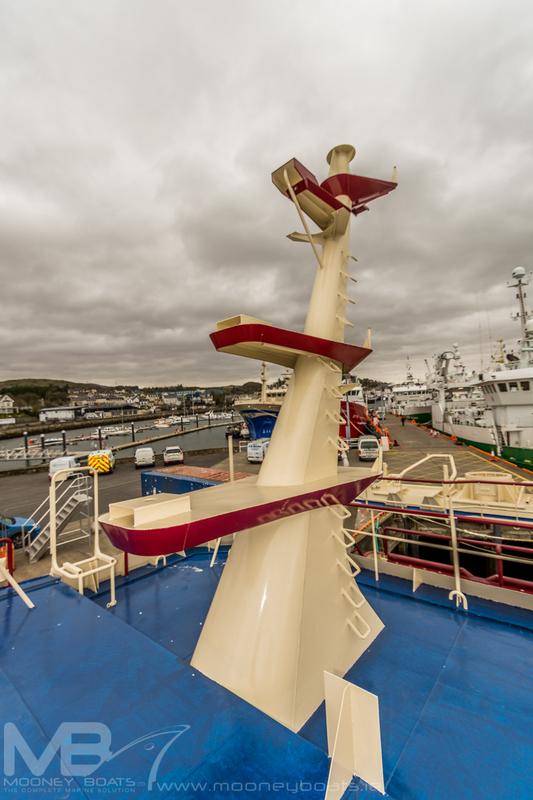 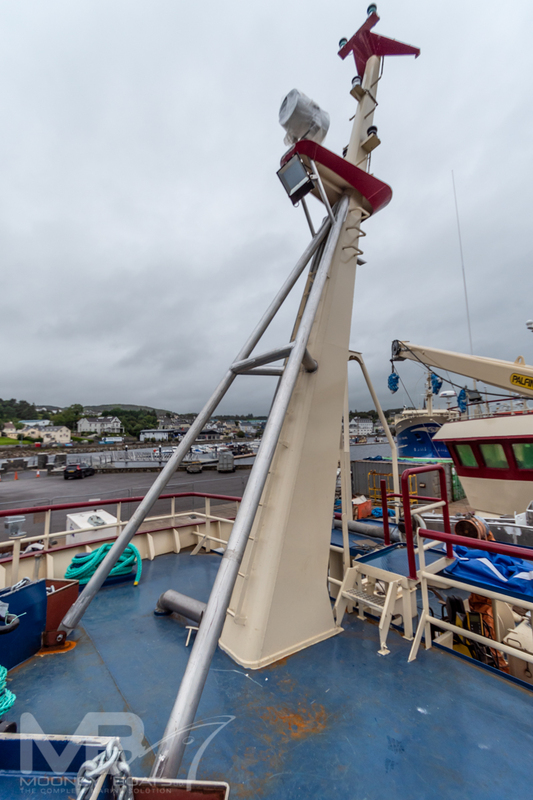 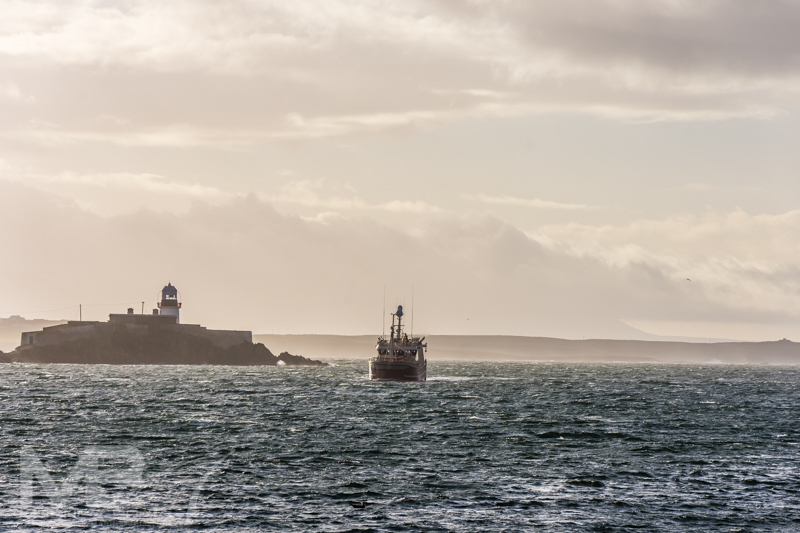 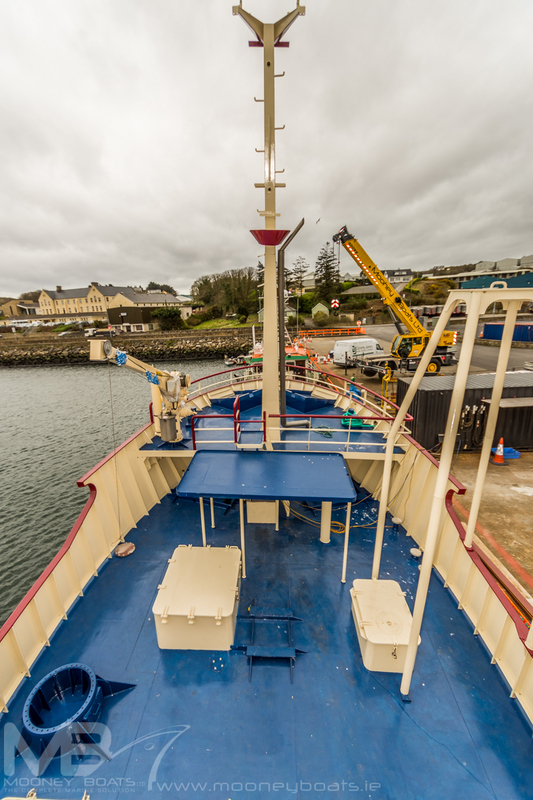 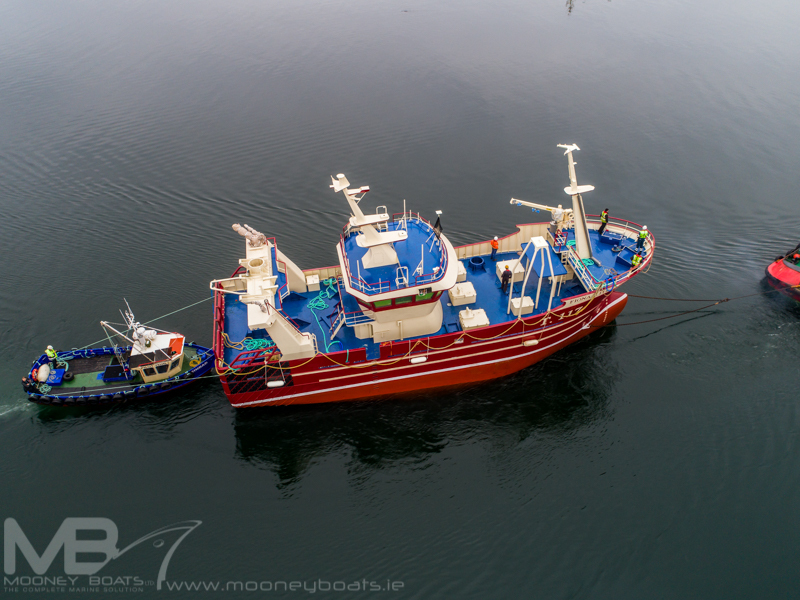 Due to the vessel been over 24m she was required by the Irish Marine Survey Office to be fitted with a Davit arm and rescue boat which are also located forward to the port side on top of whaleback. 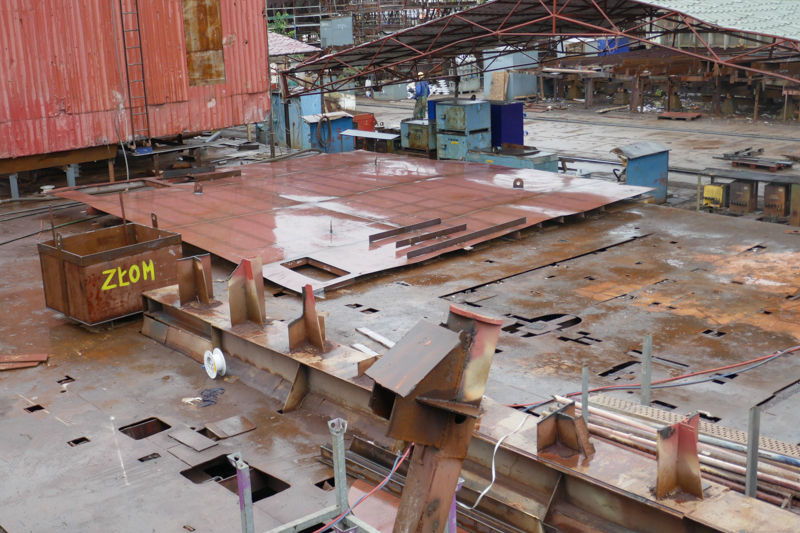 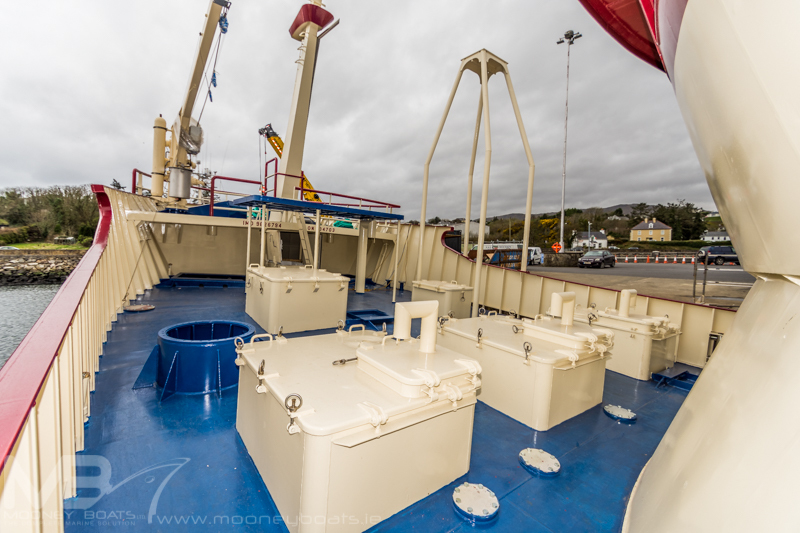 Port side forward of the wheelhouse there is the EK Marine Landing crane and also aft on the gantry EK Marine supplied and fitted the powerblock crane both of which were bespoke designed for this vessel. 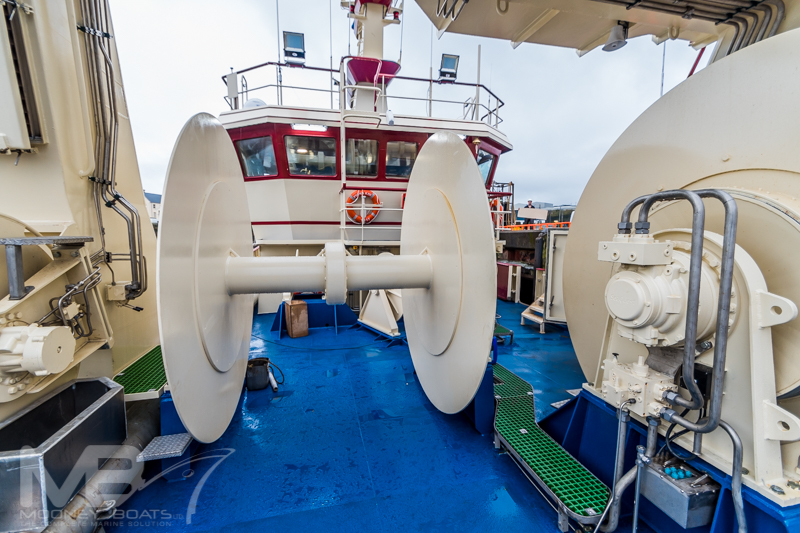 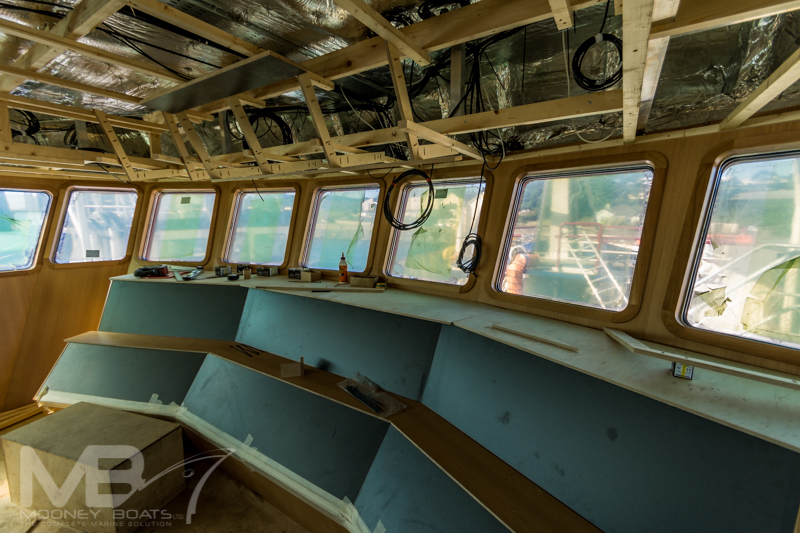 Aft of the wheelhouse to the port side is the Top & Tail Line which and 2 net Drums. 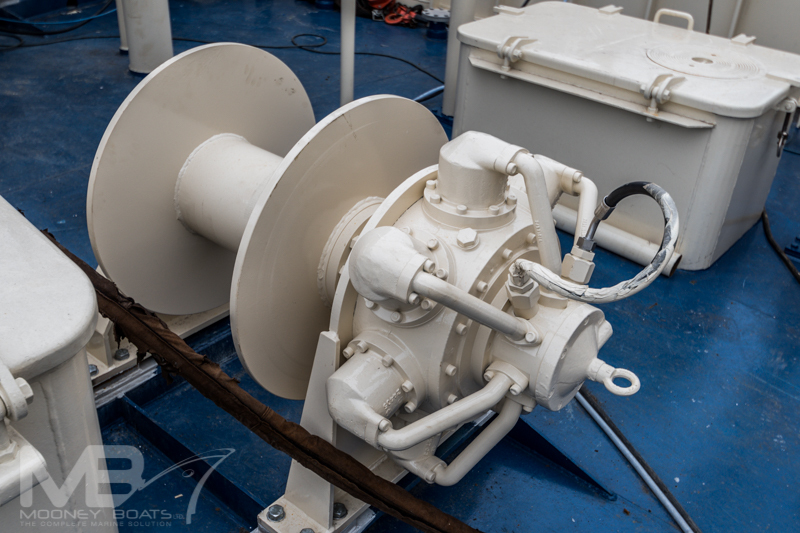 The fish hose reel, hydraulic hose reel are located on port side aft on gantry along with net sounding winch. 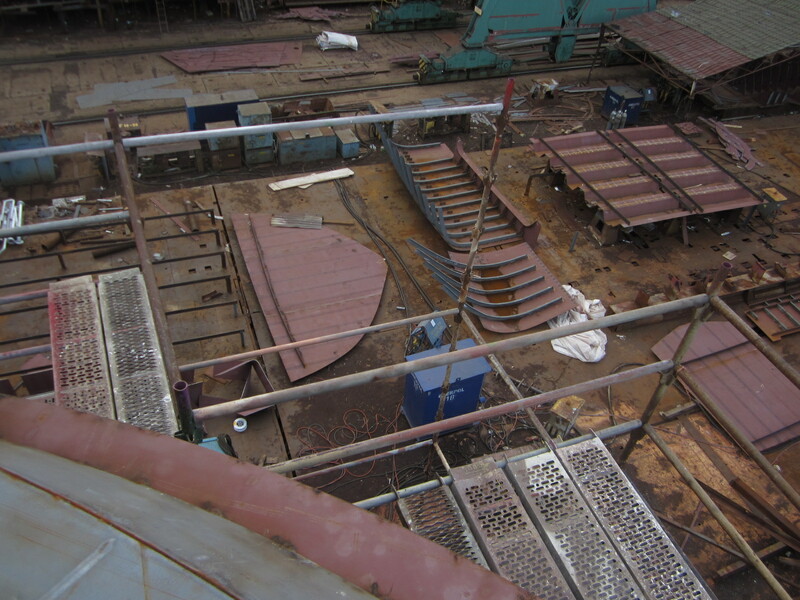 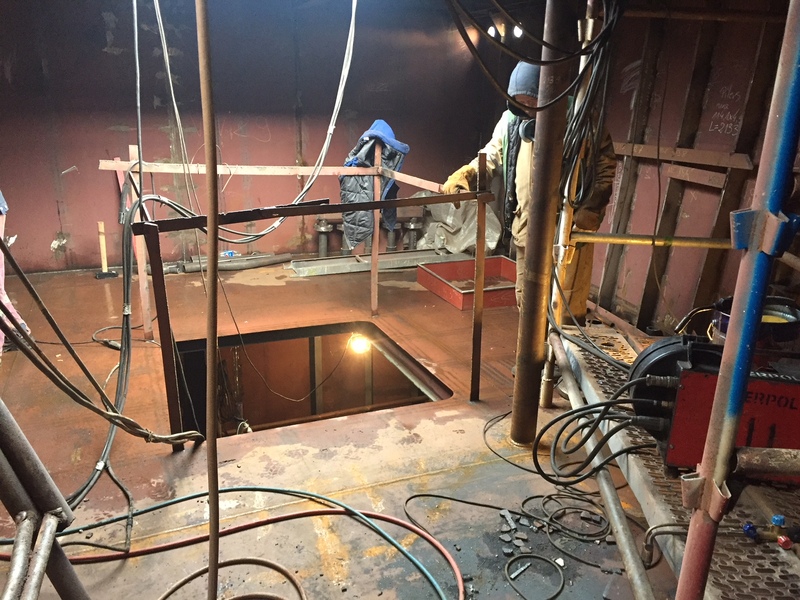 SeaQuest Systems provided deck machinery and hydraulic installation. 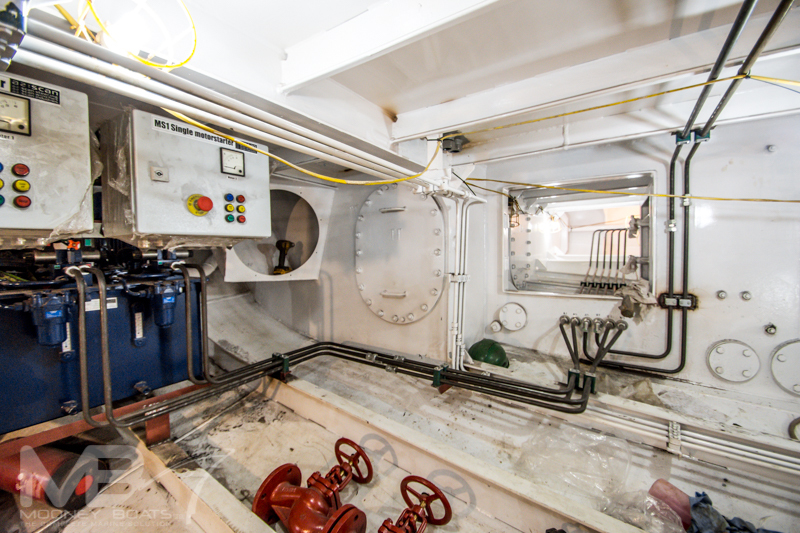 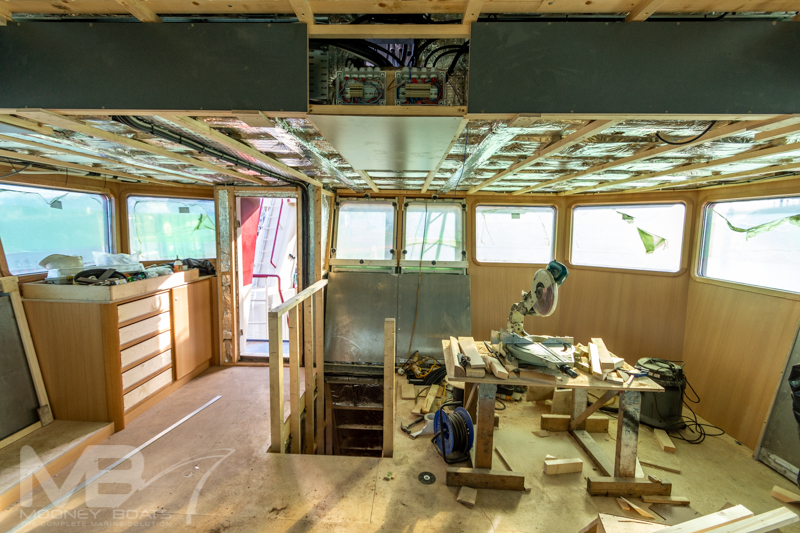 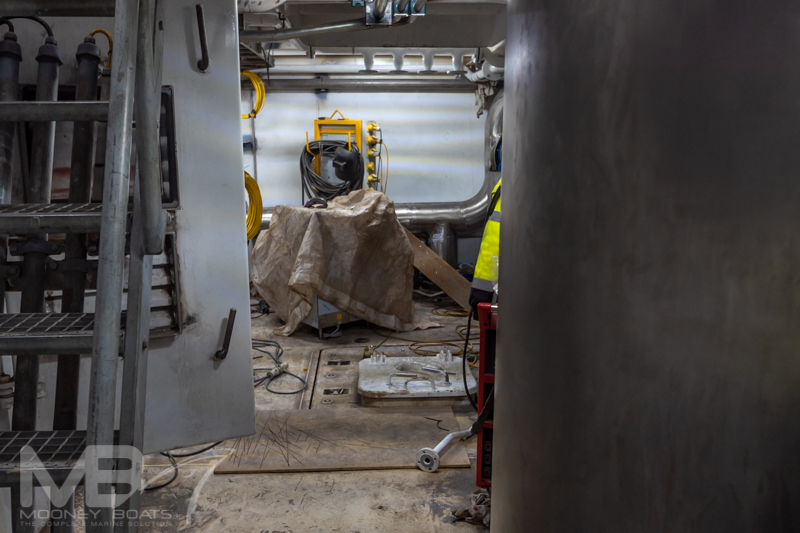 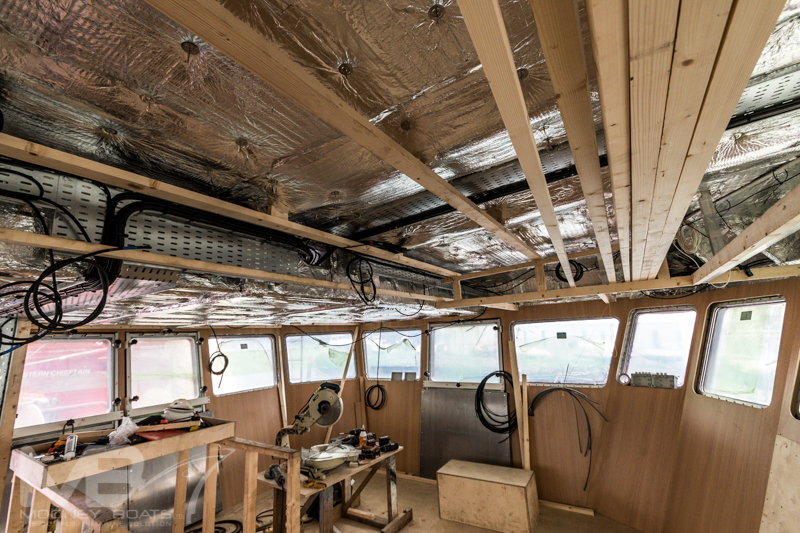 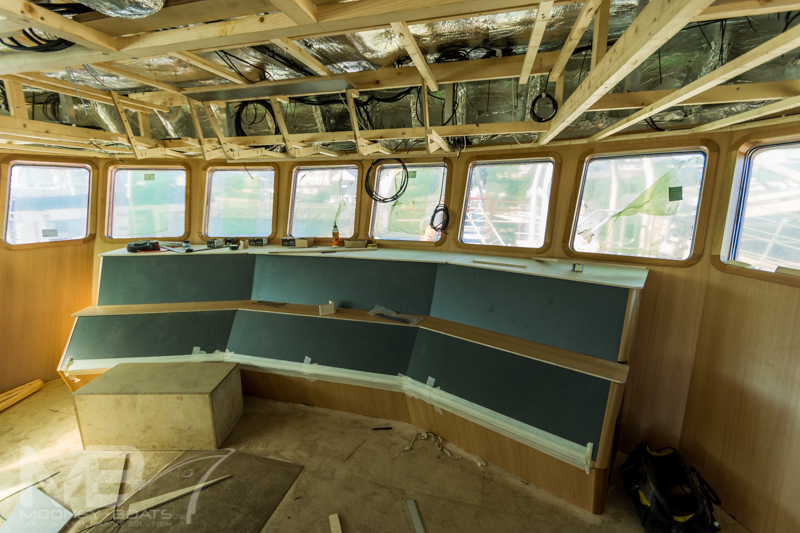 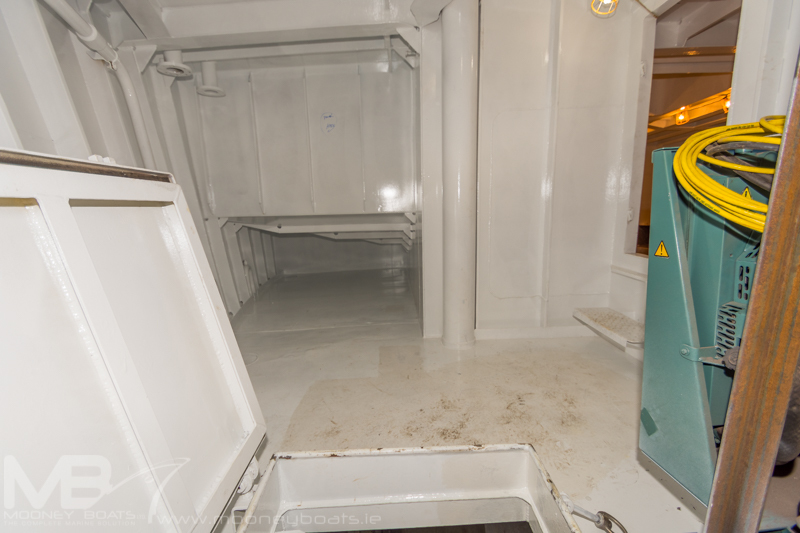 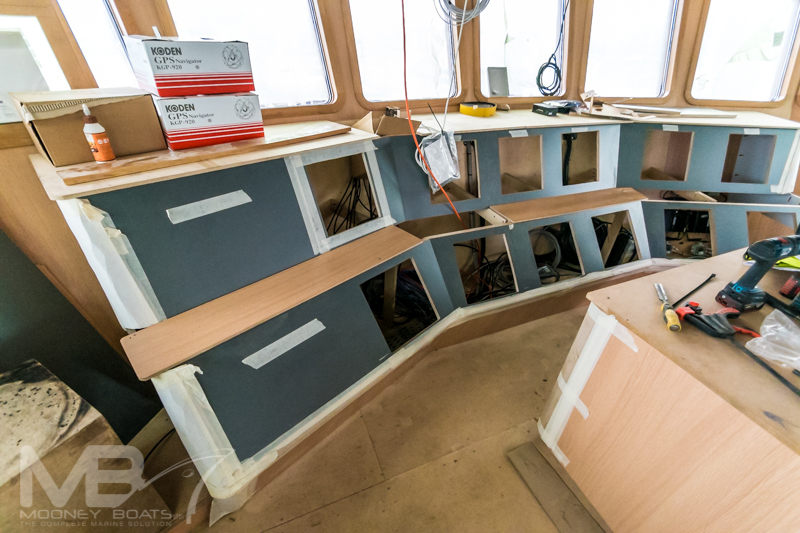 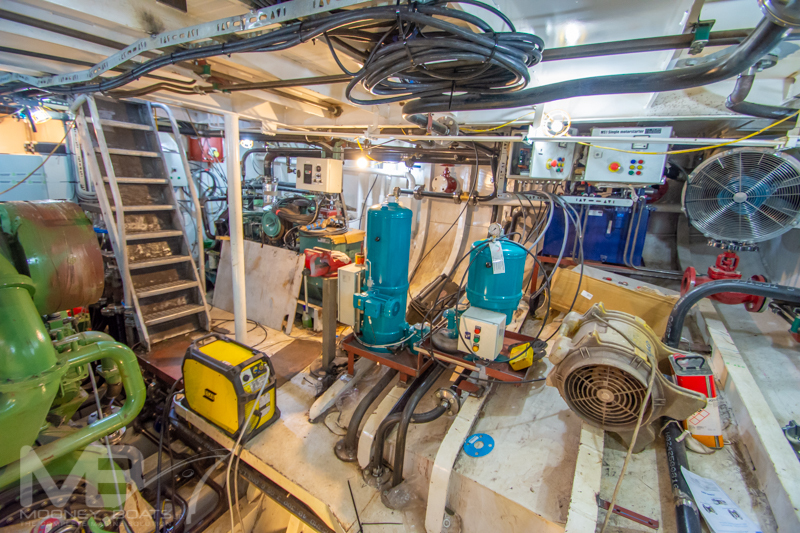 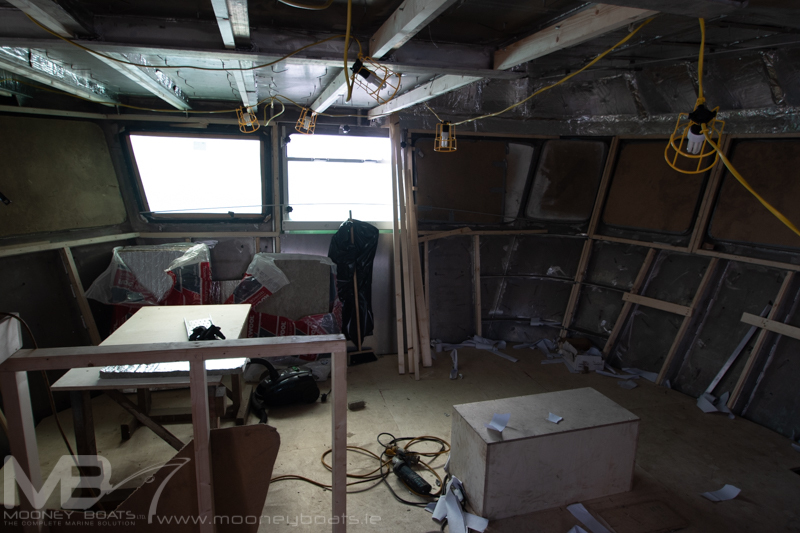 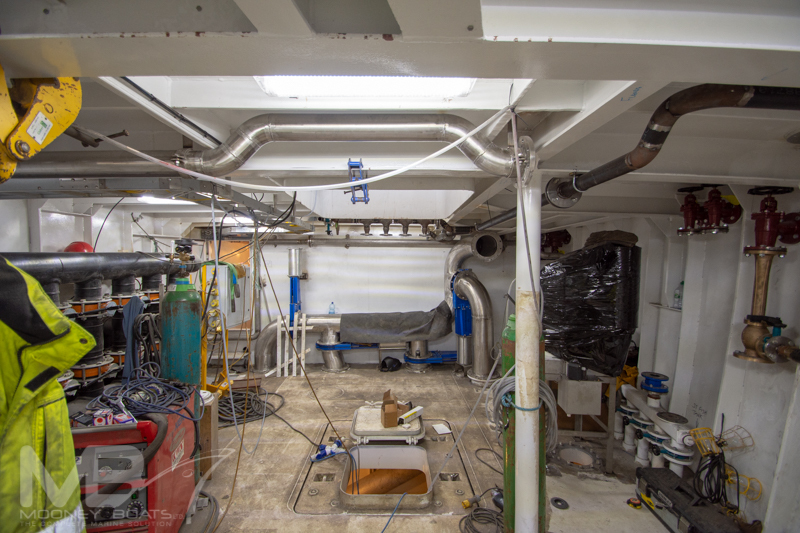 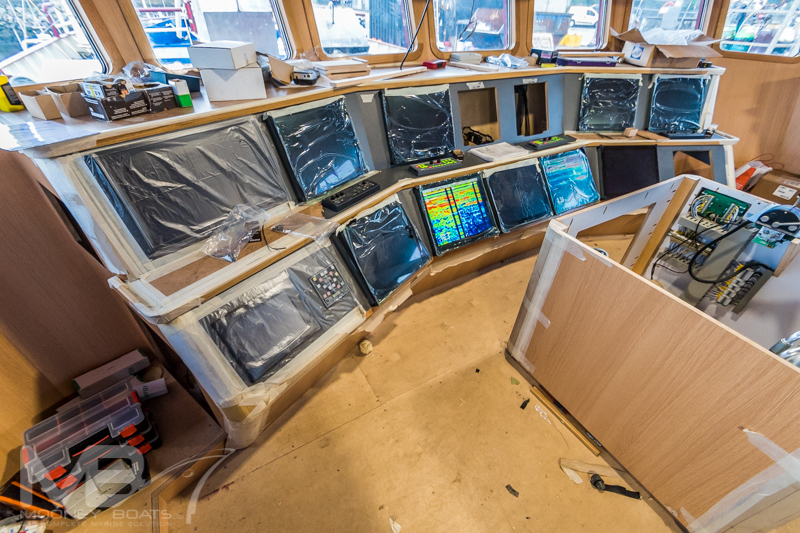 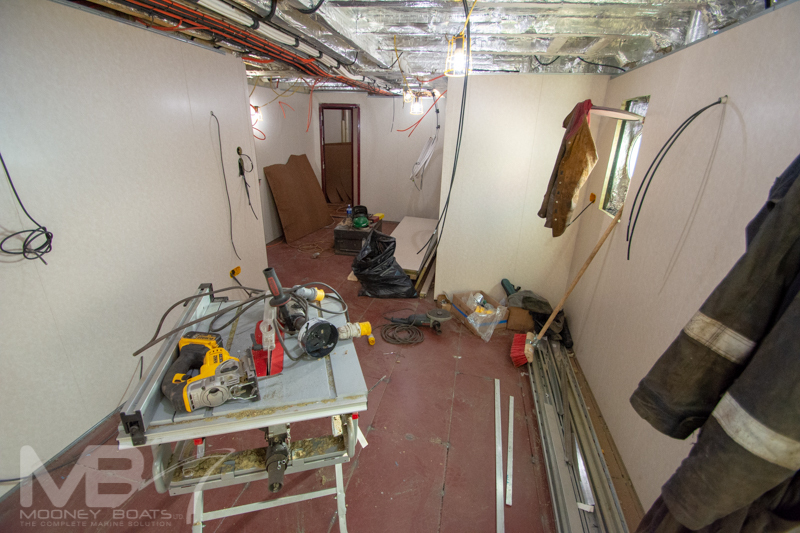 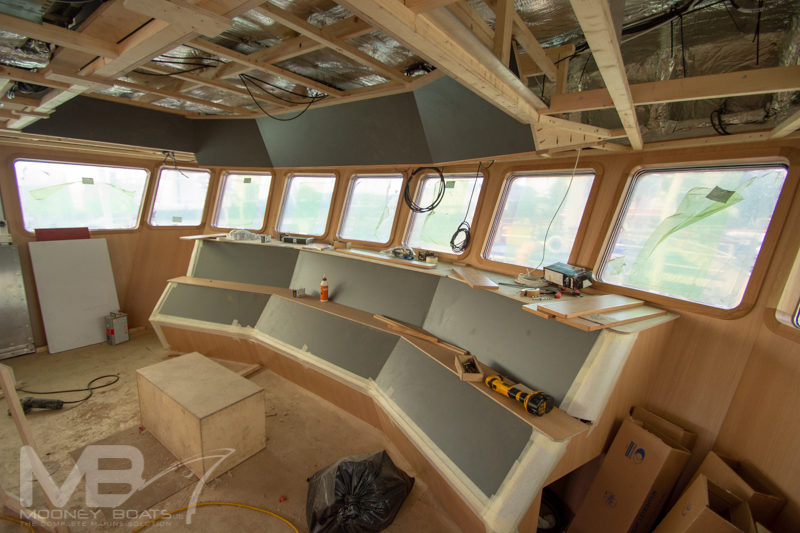 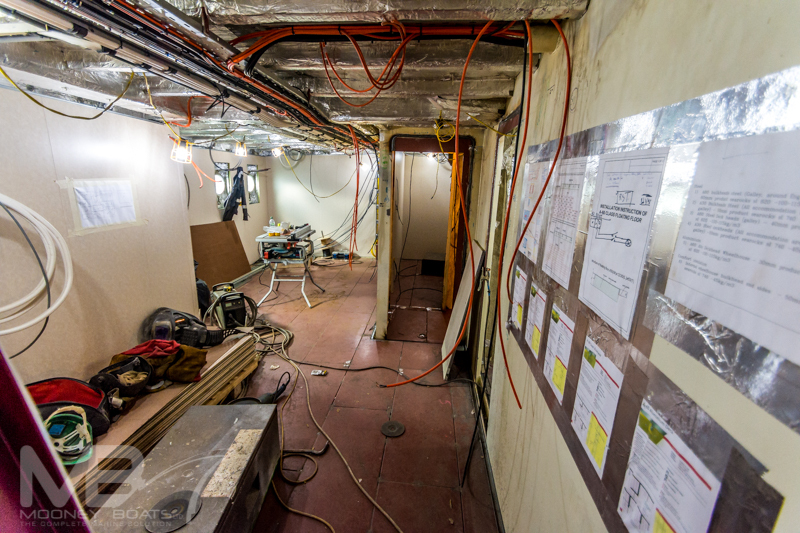 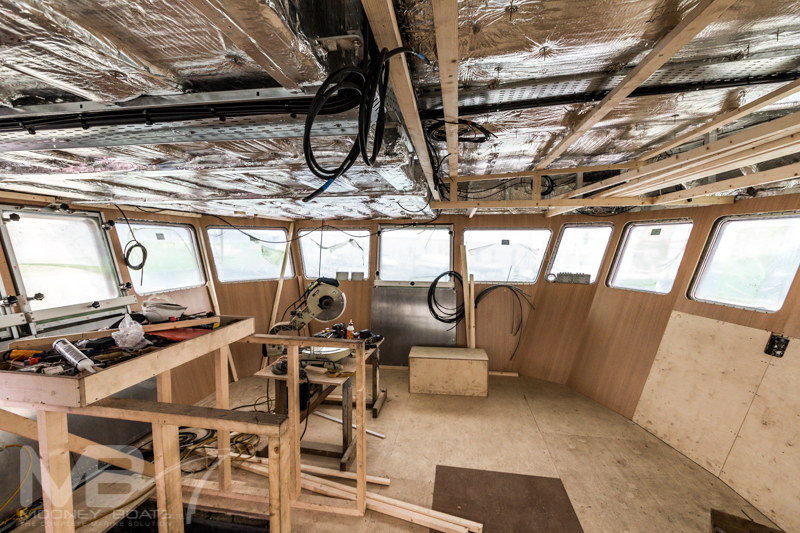 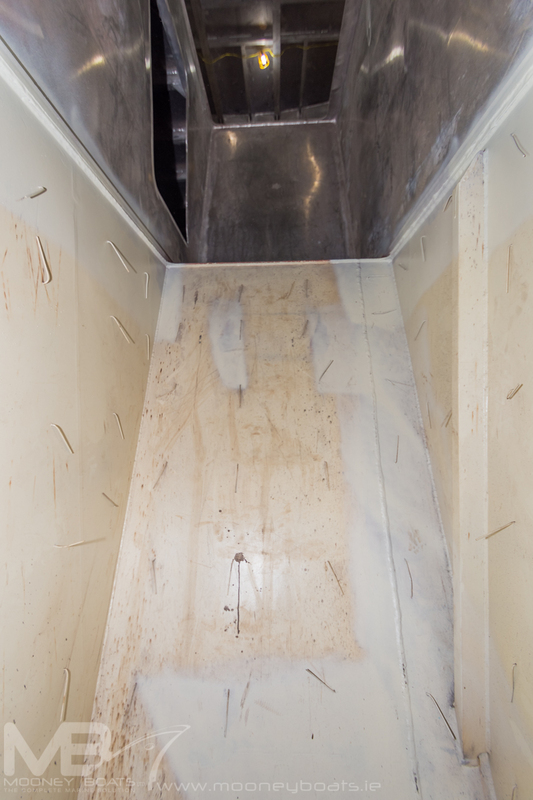 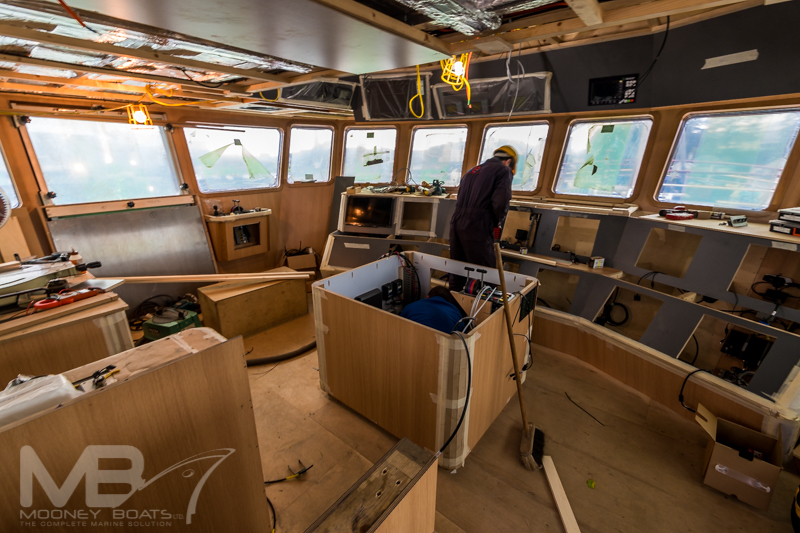 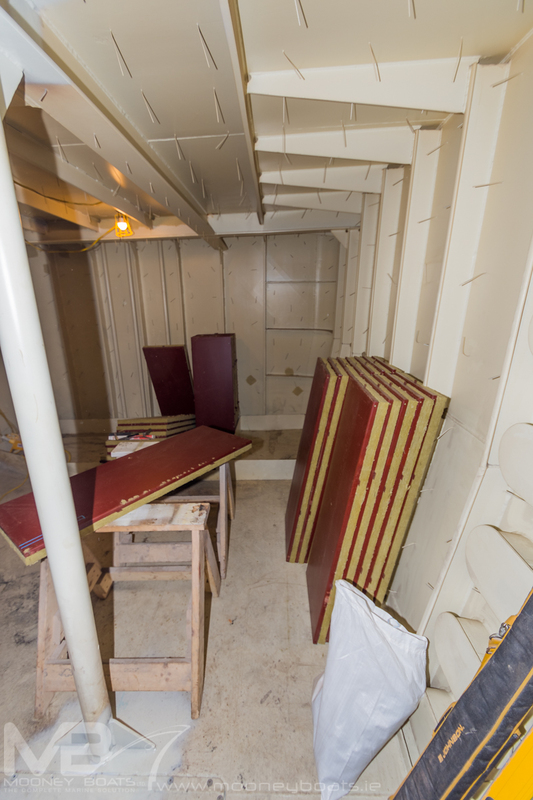 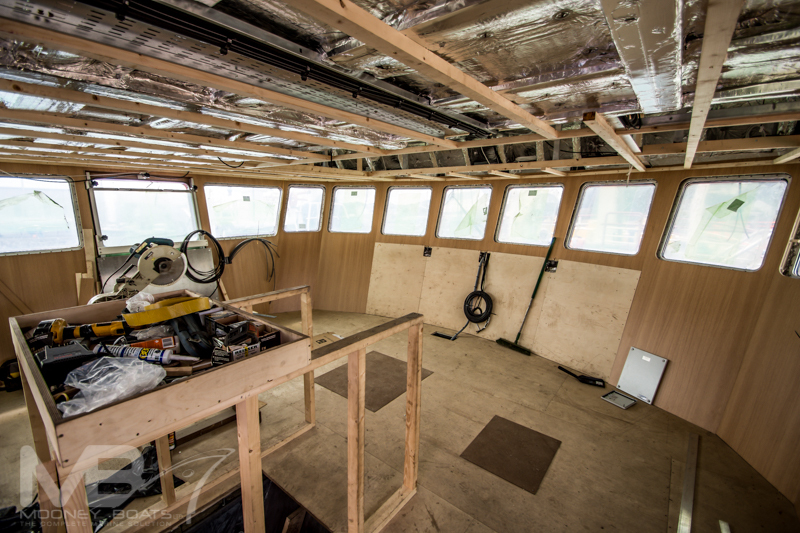 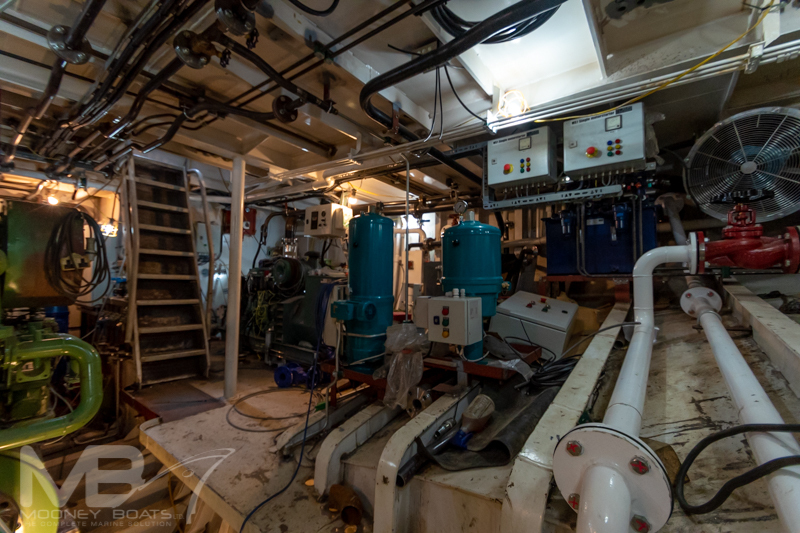 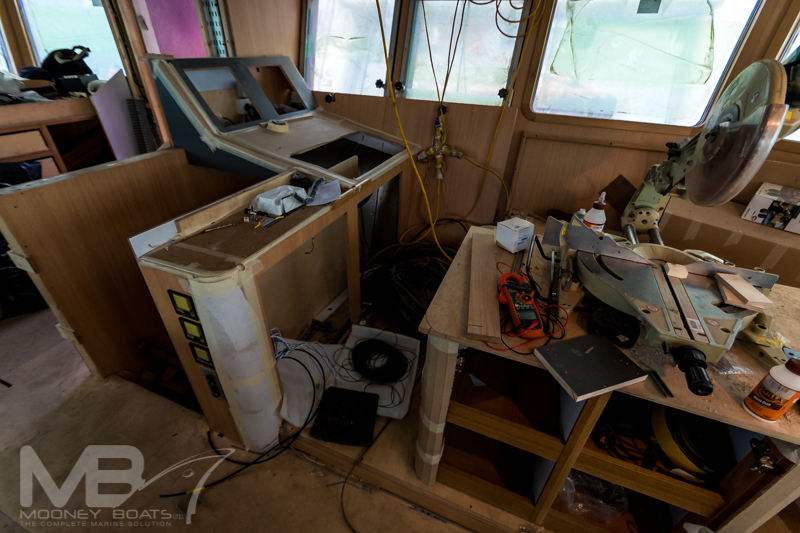 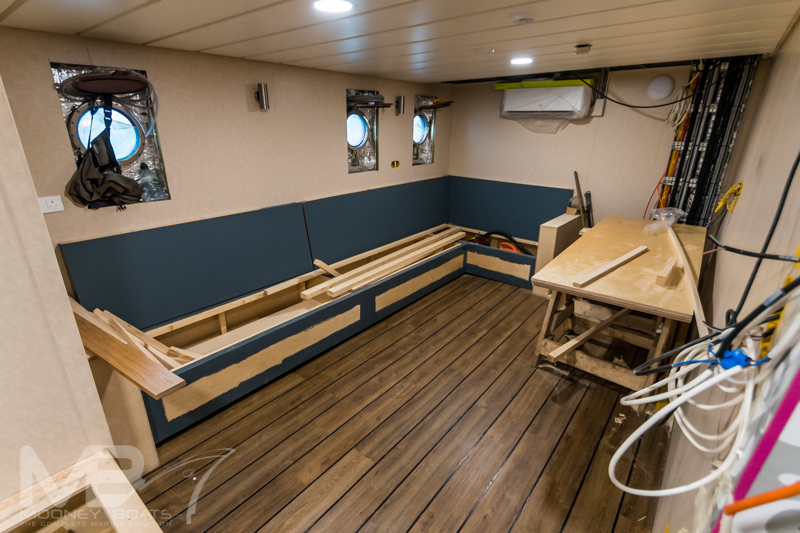 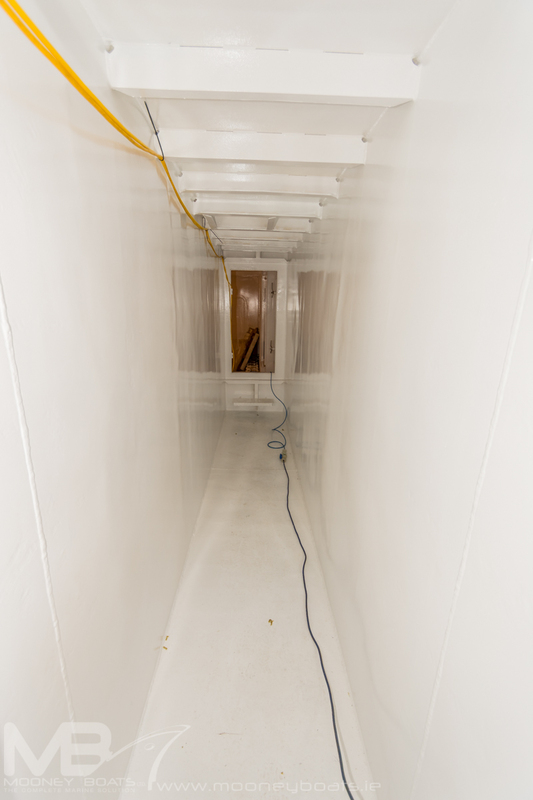 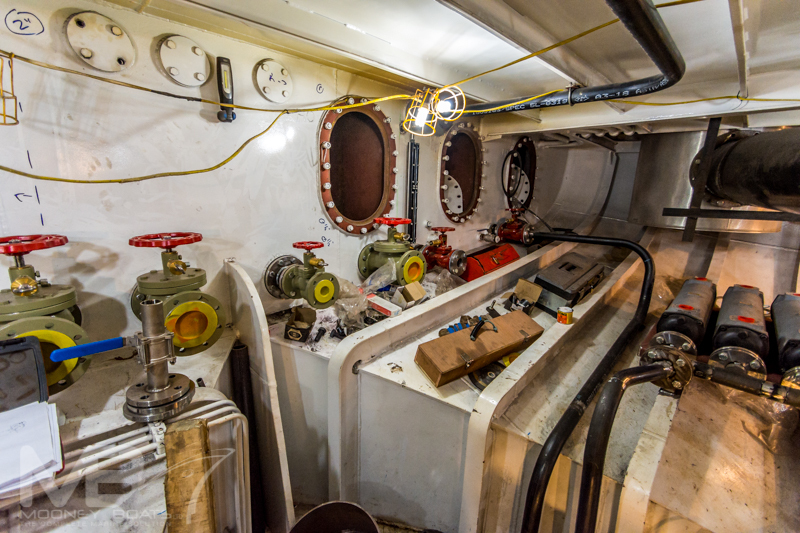 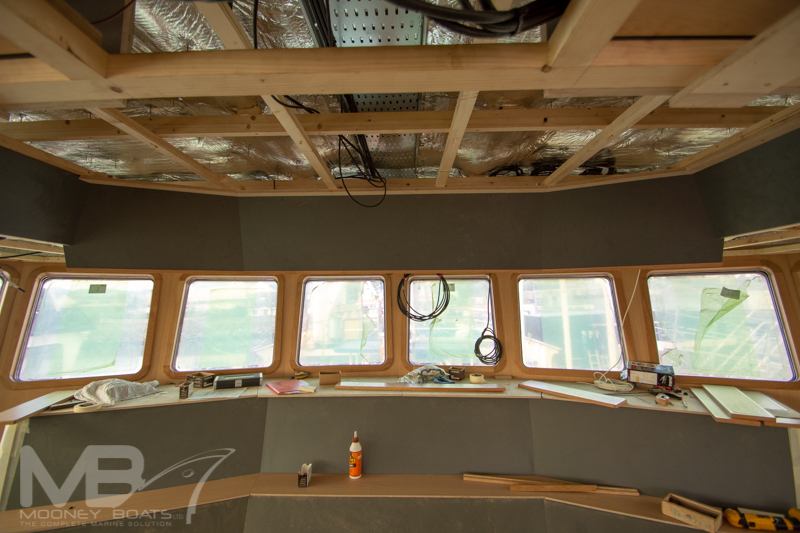 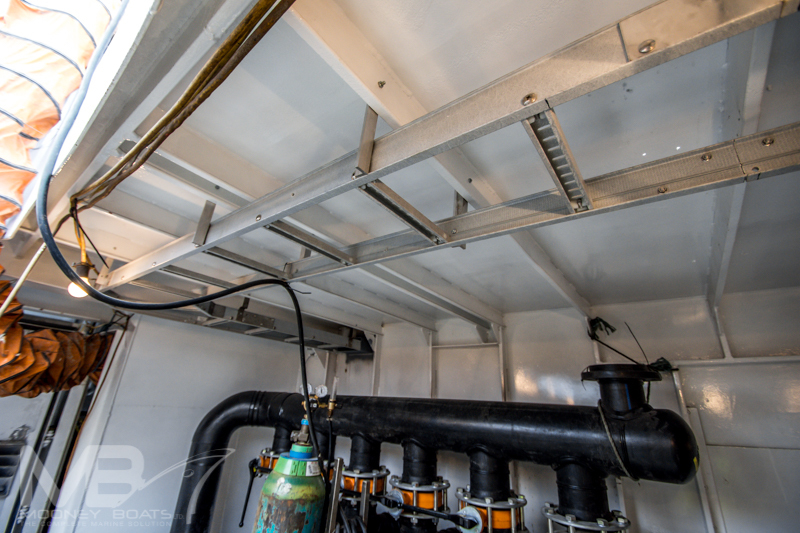 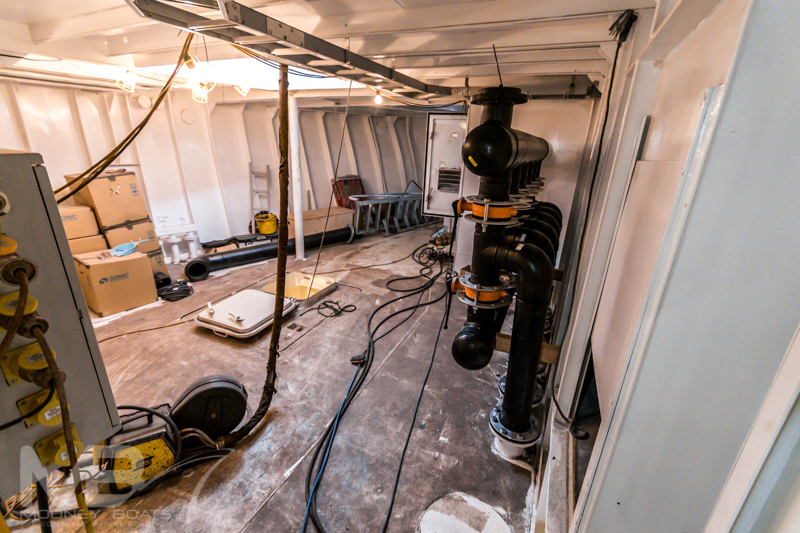 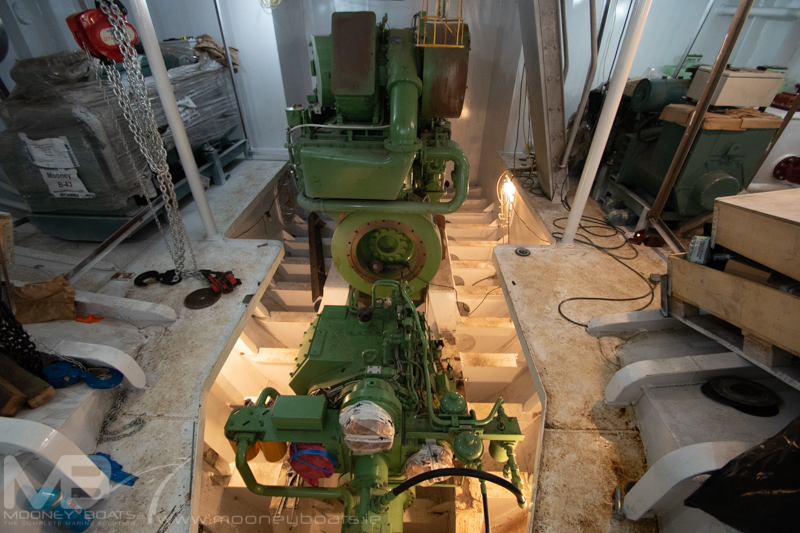 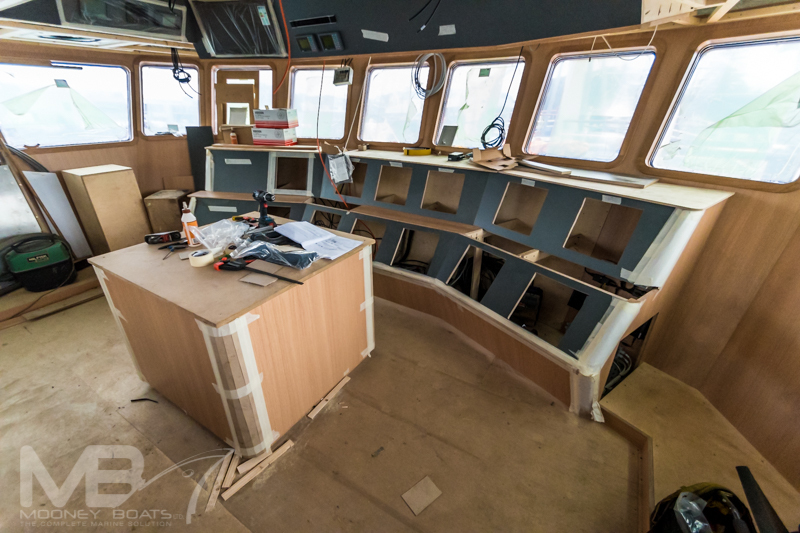 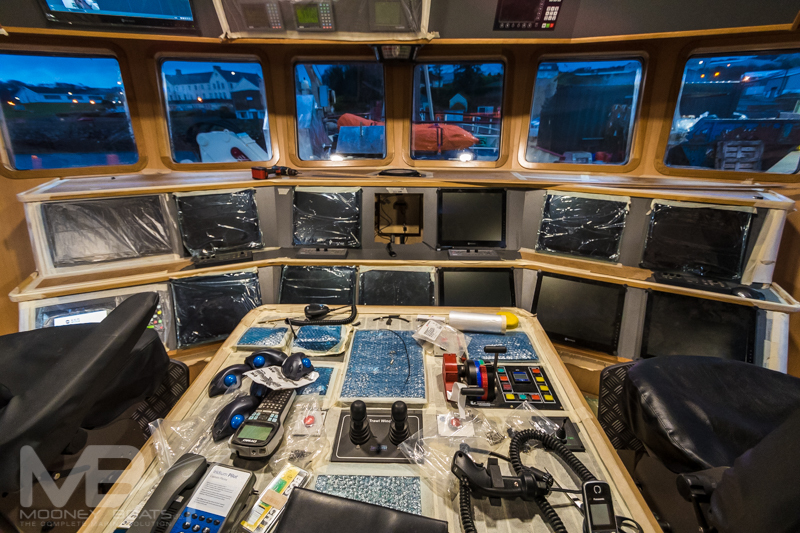 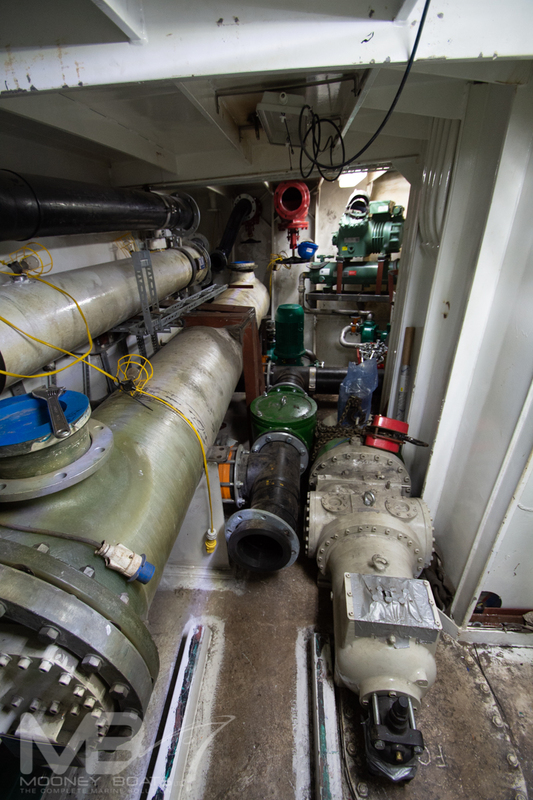 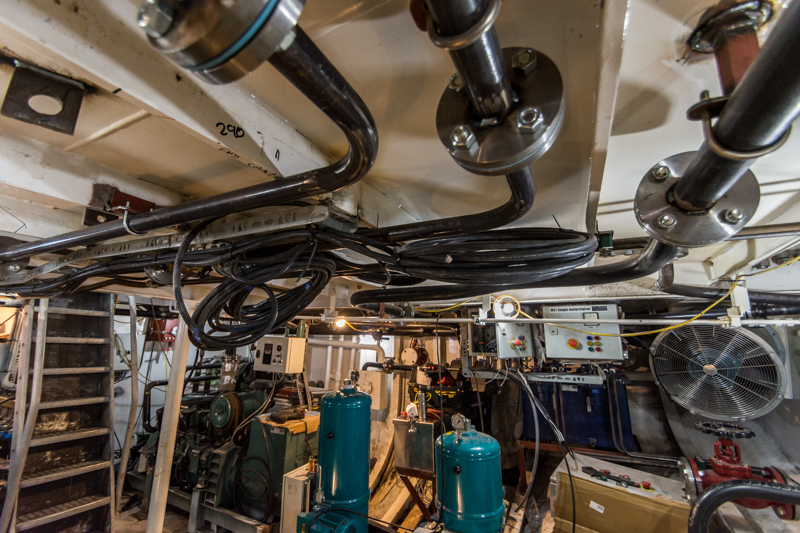 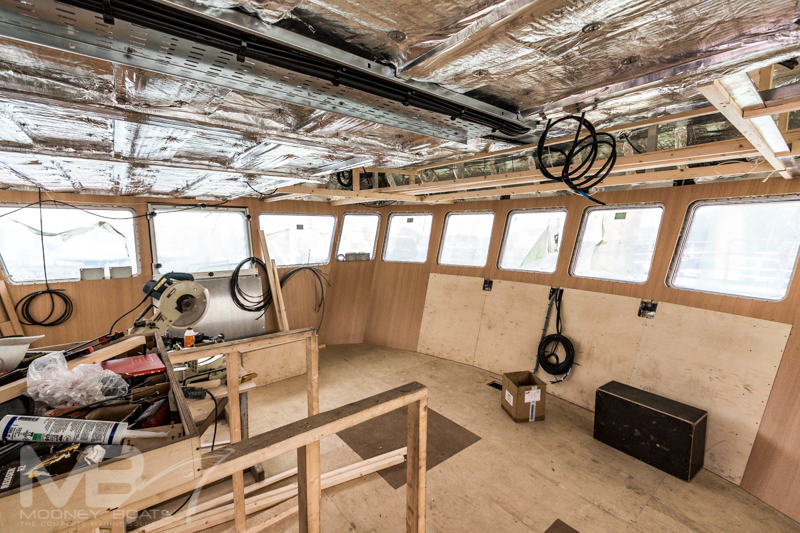 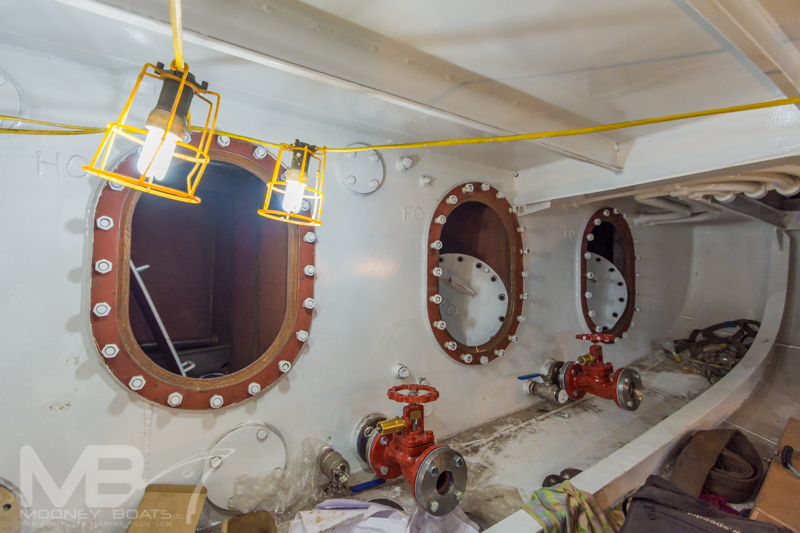 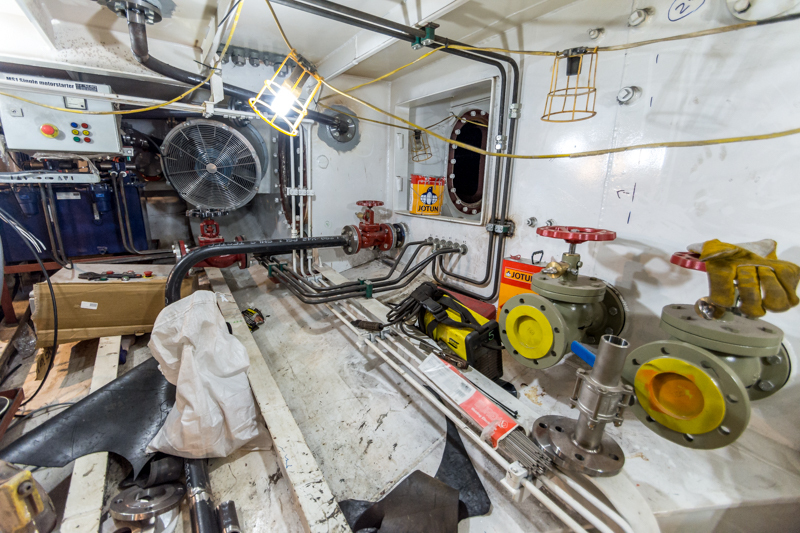 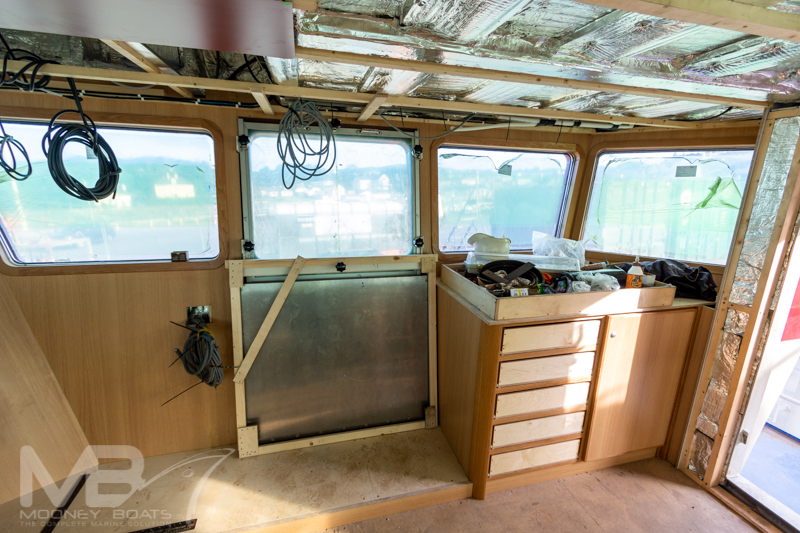 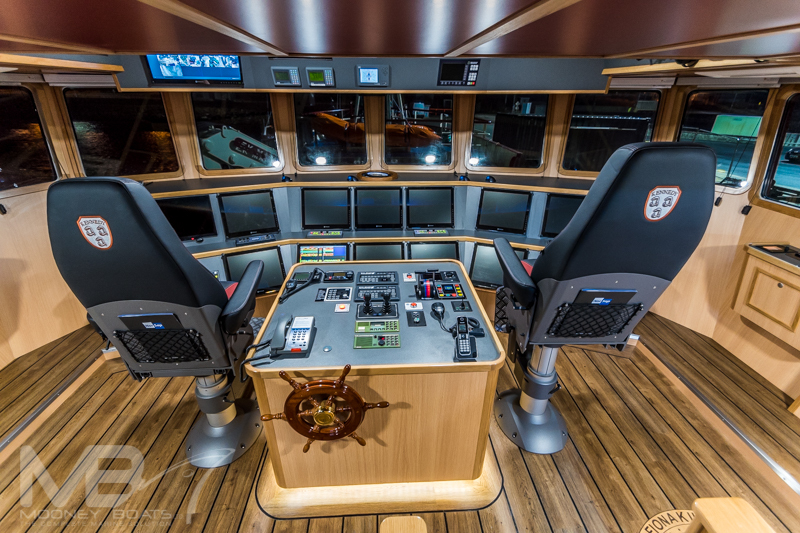 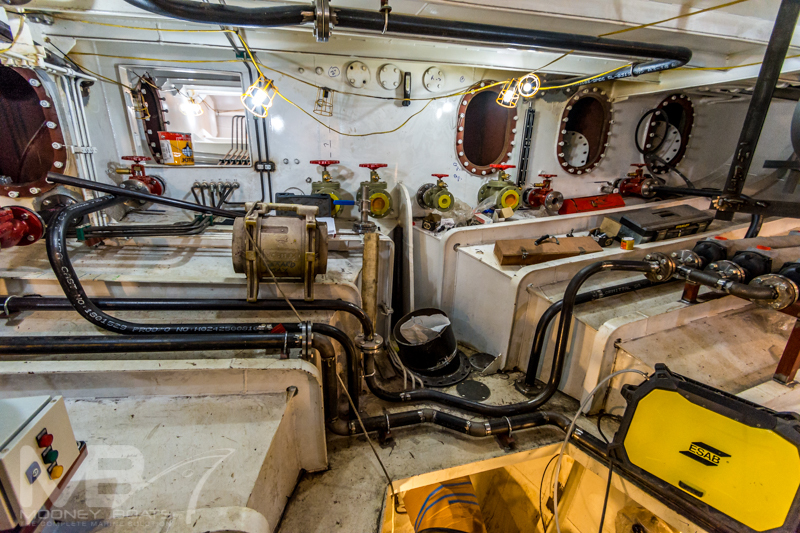 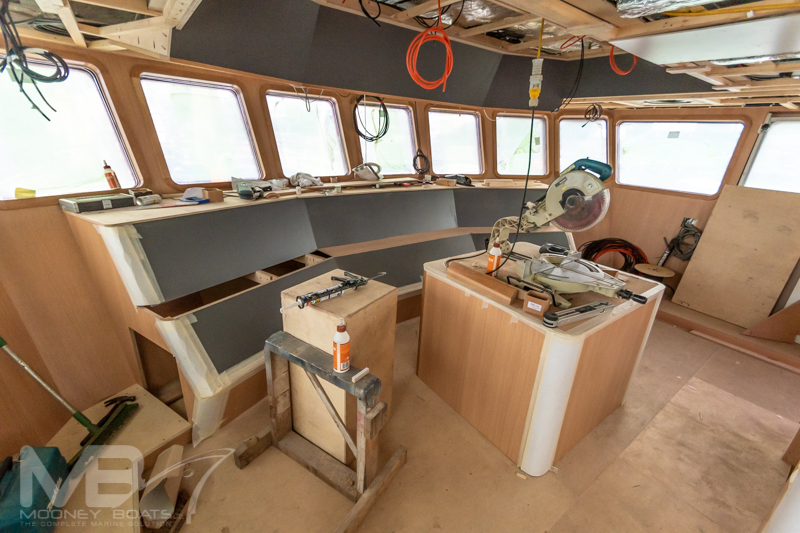 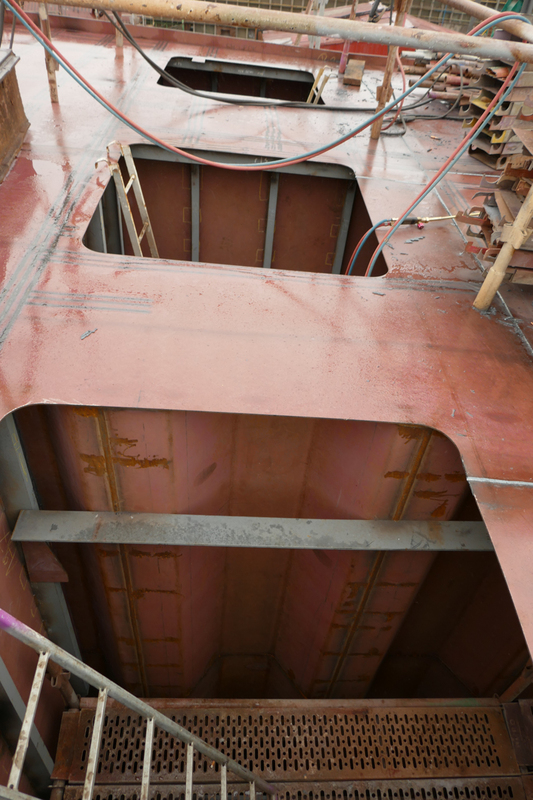 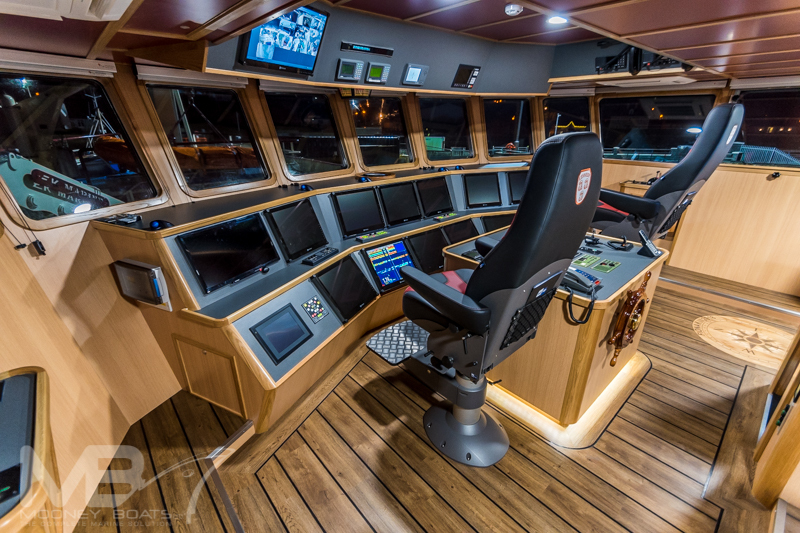 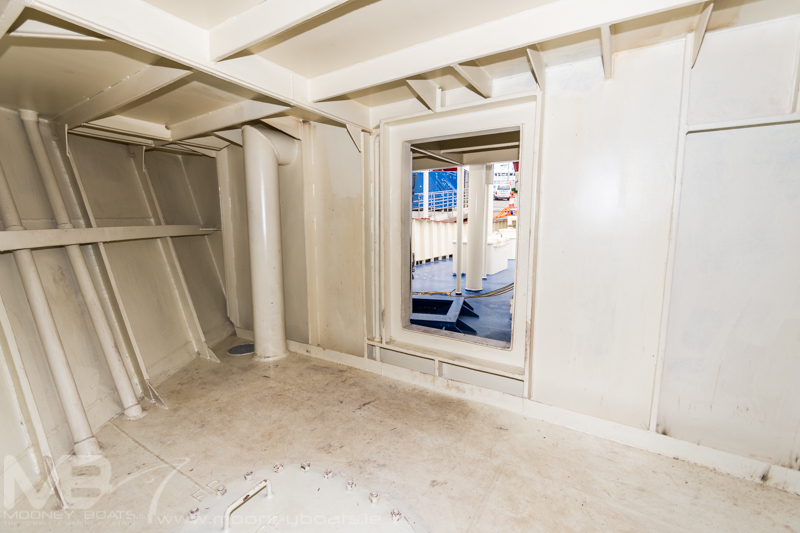 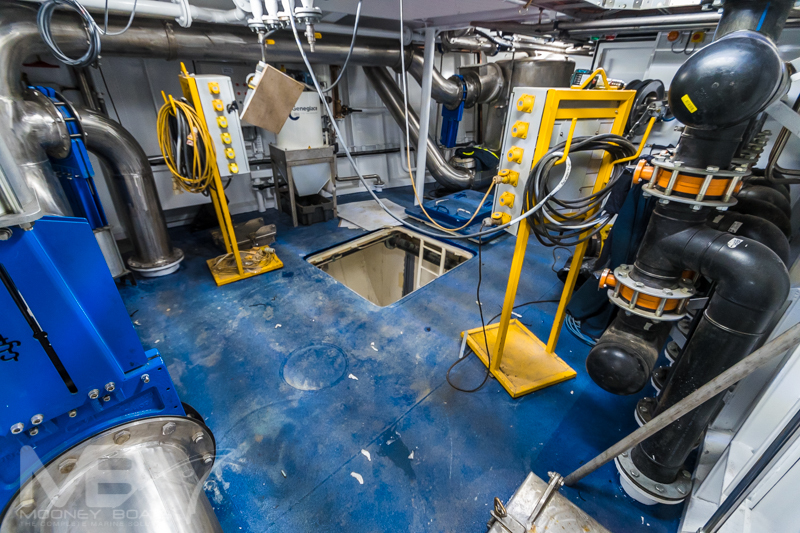 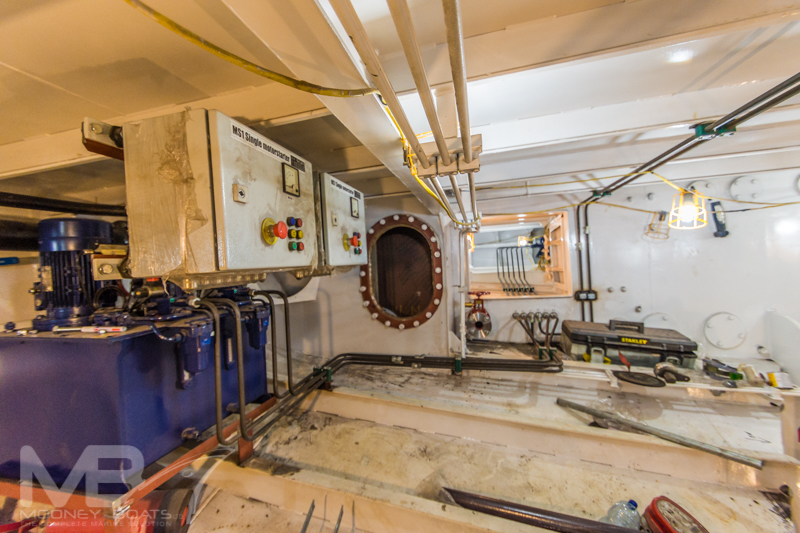 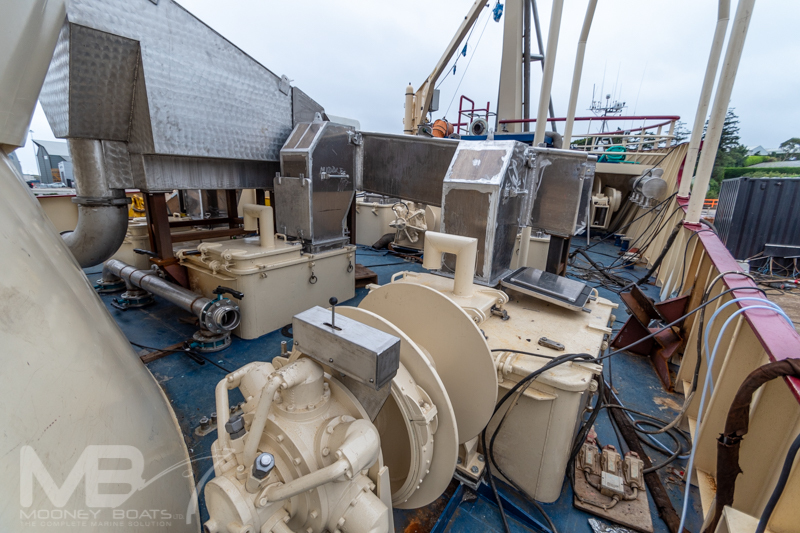 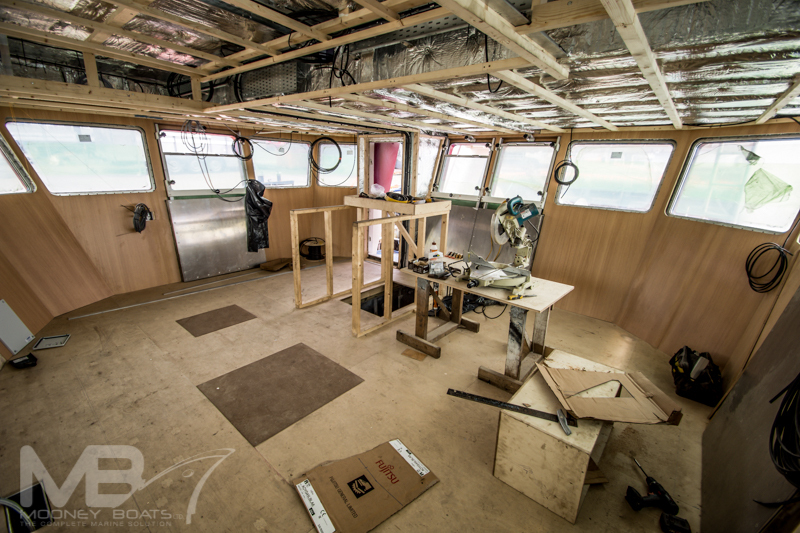 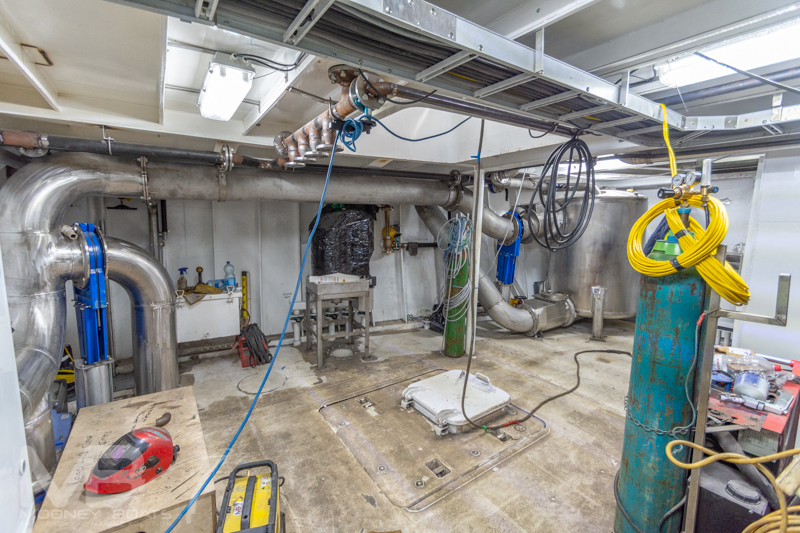 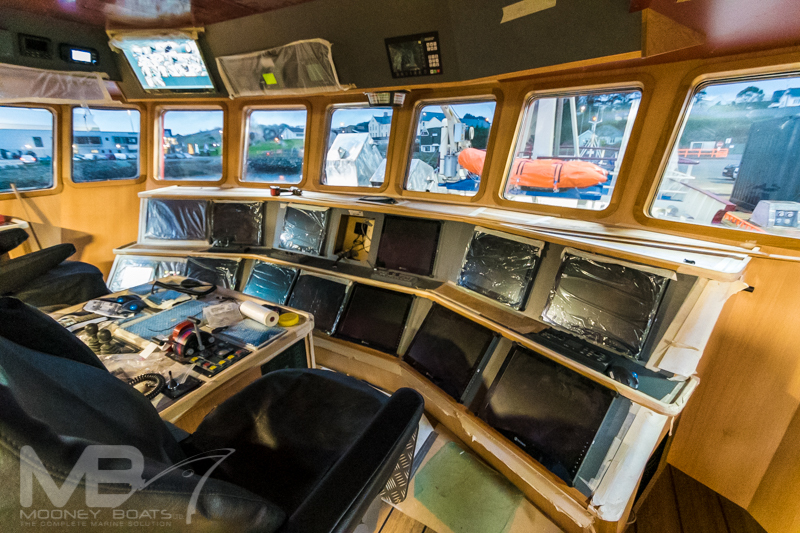 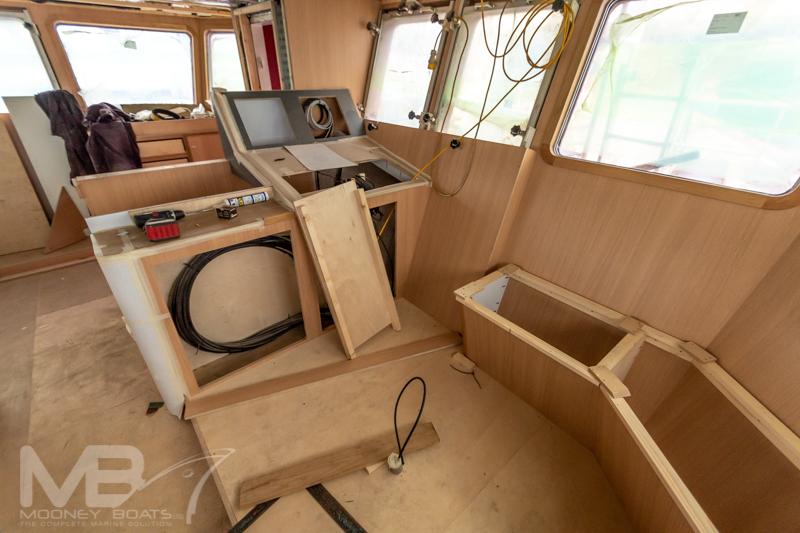 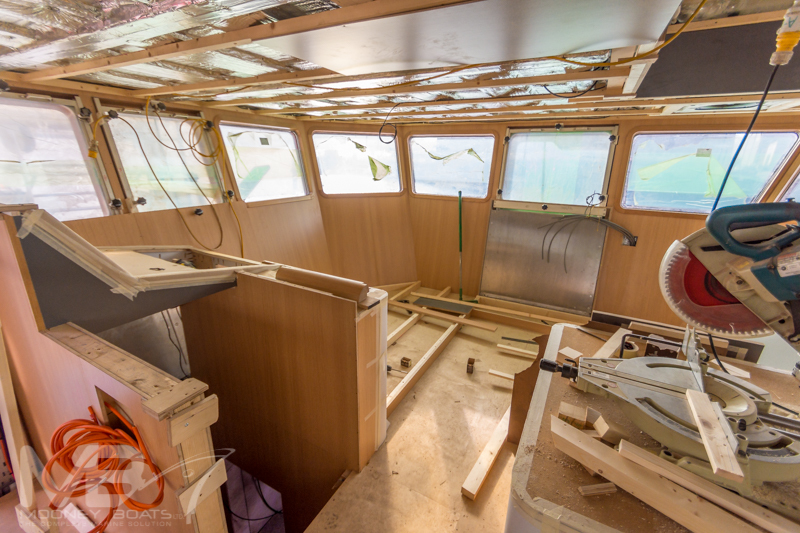 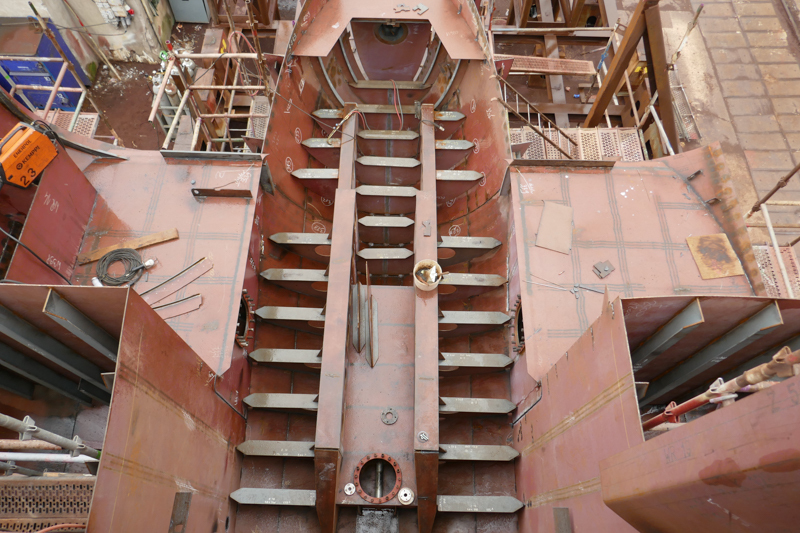 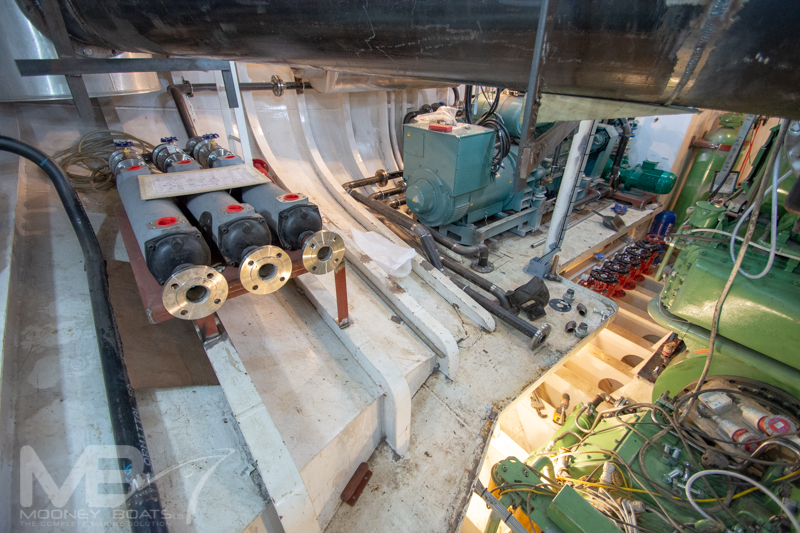 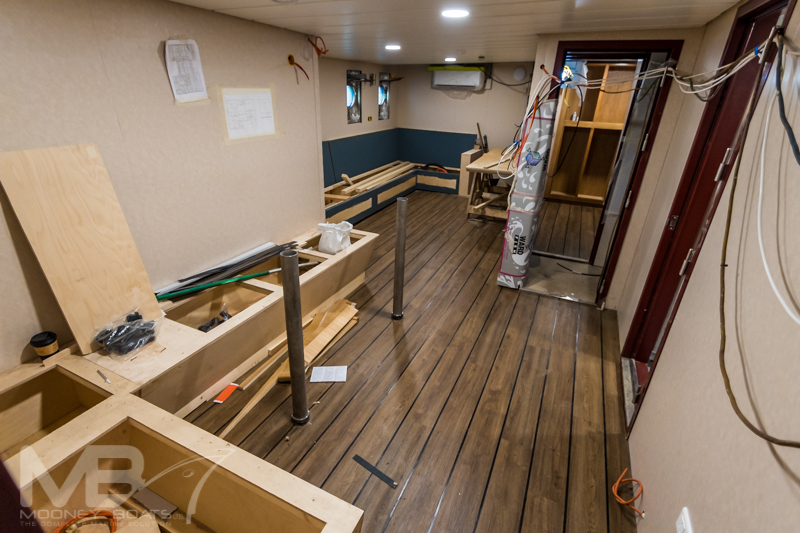 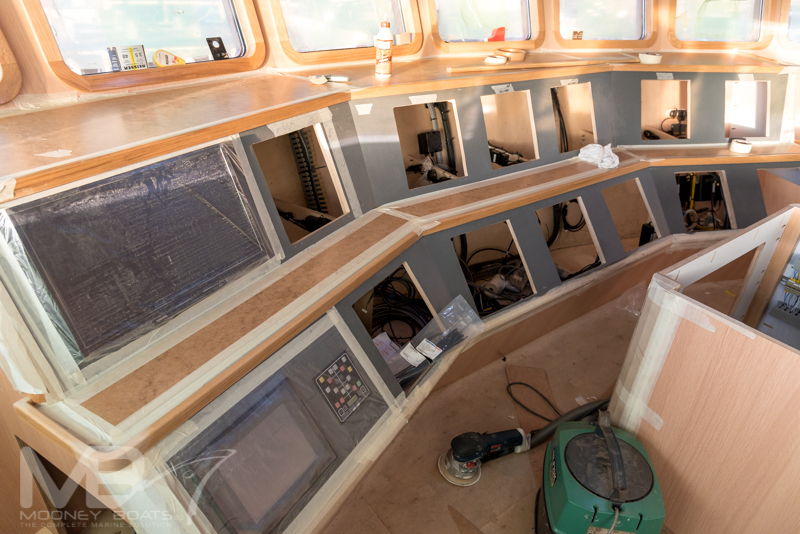 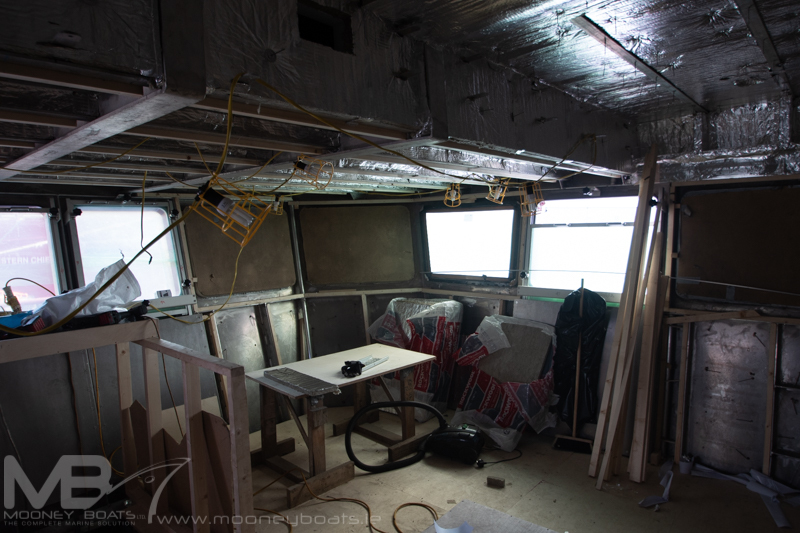 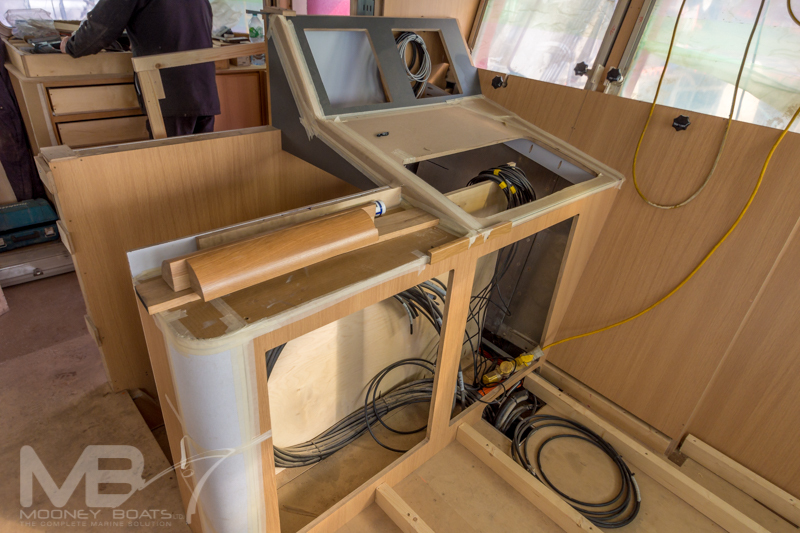 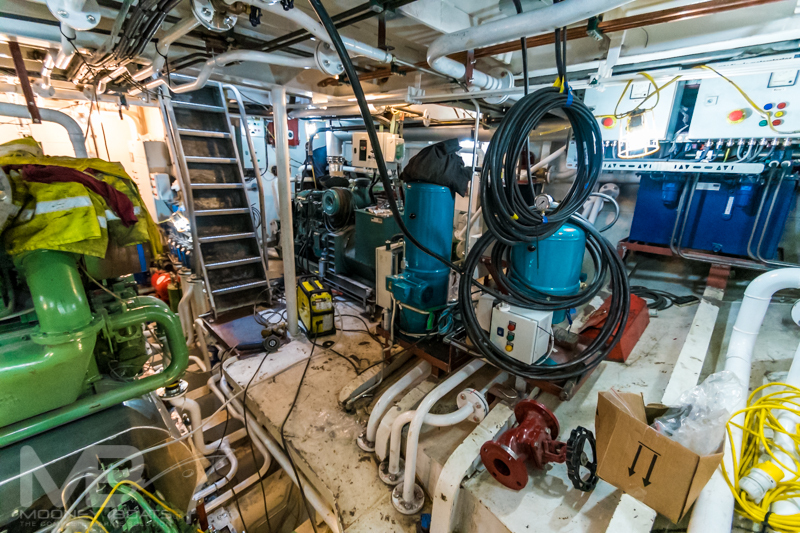 The Fiona K III has a spacious aft engineroom which is well laid out illustrating the detailed thinking by the yards engineers in order to ensure space management and efficient maintenance in the future. 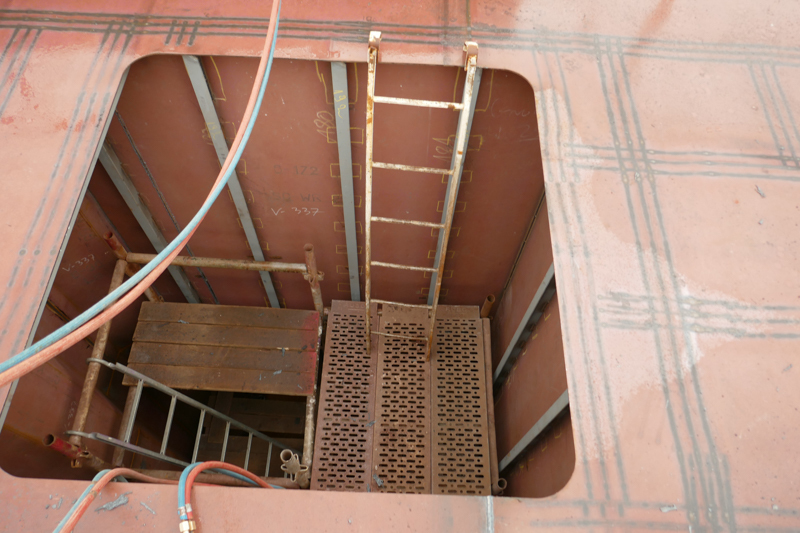 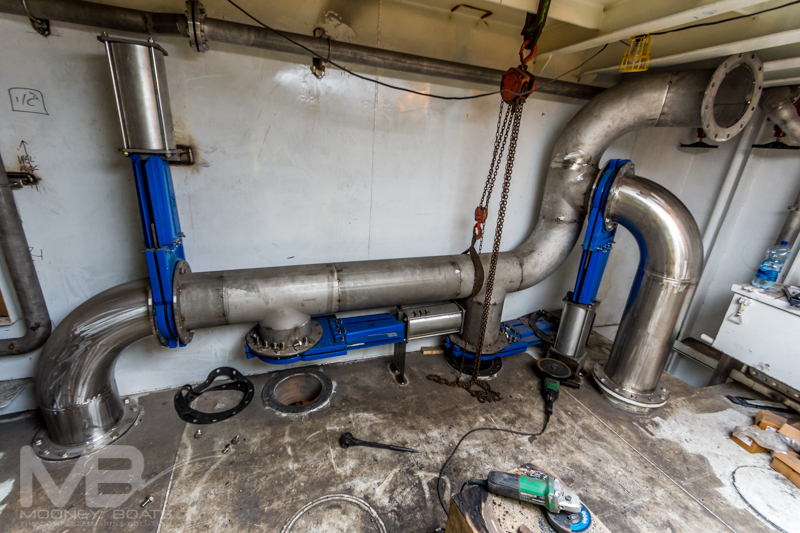 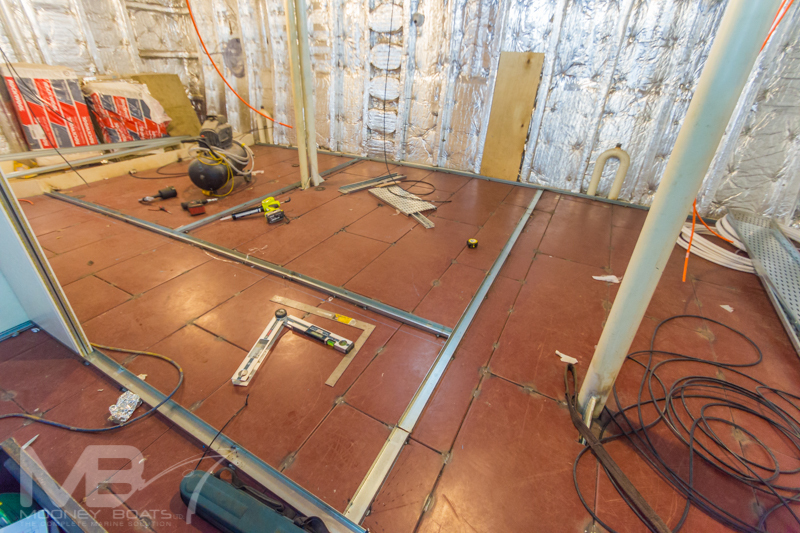 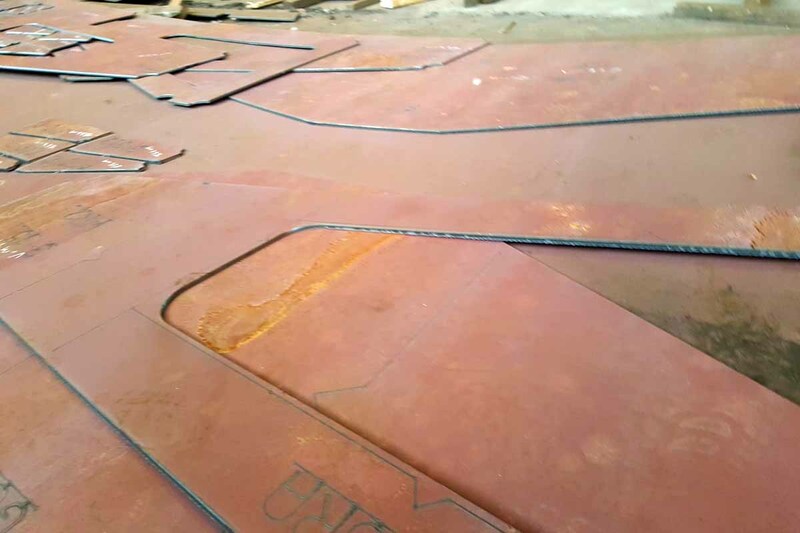 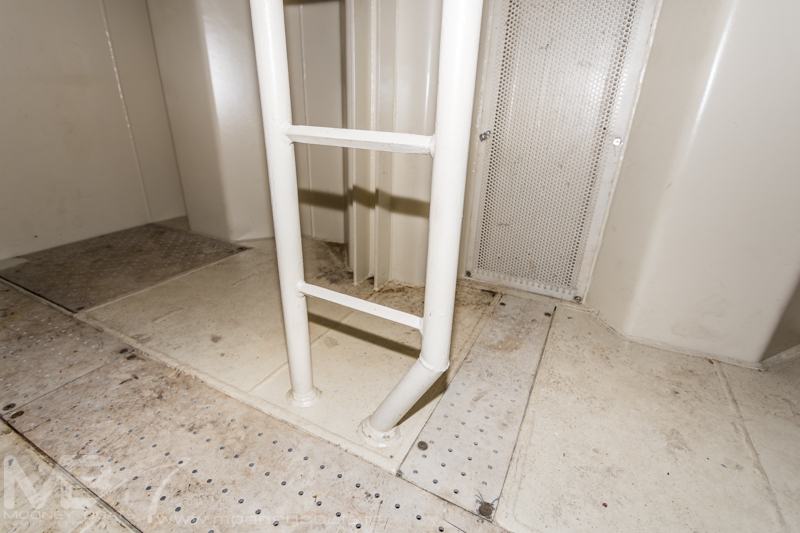 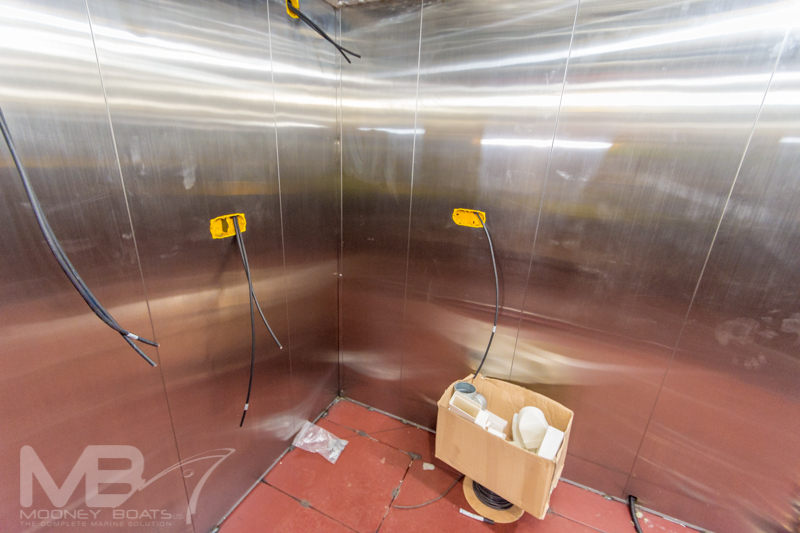 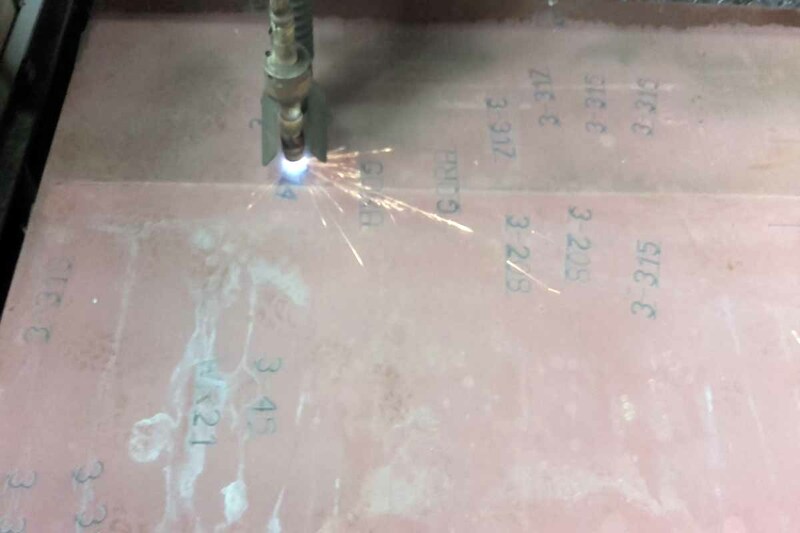 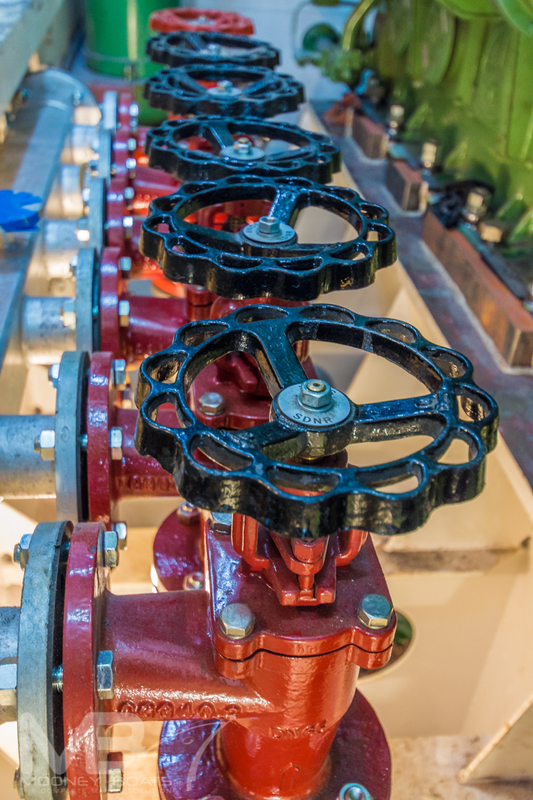 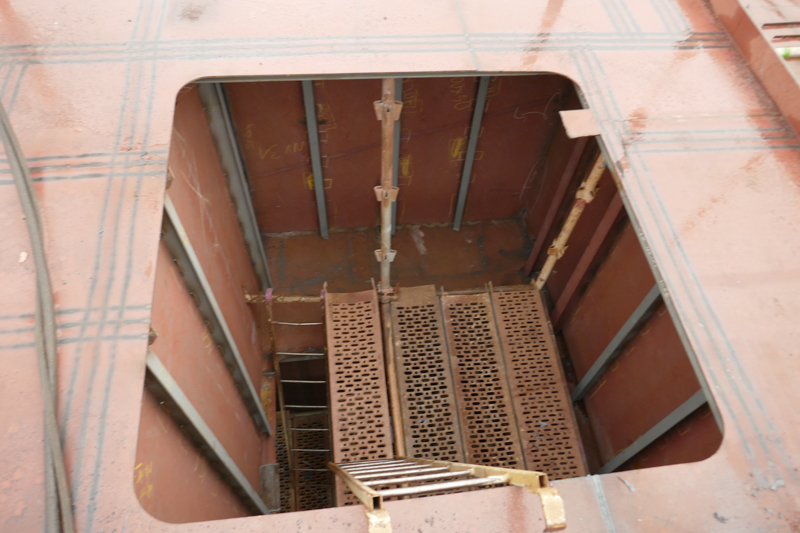 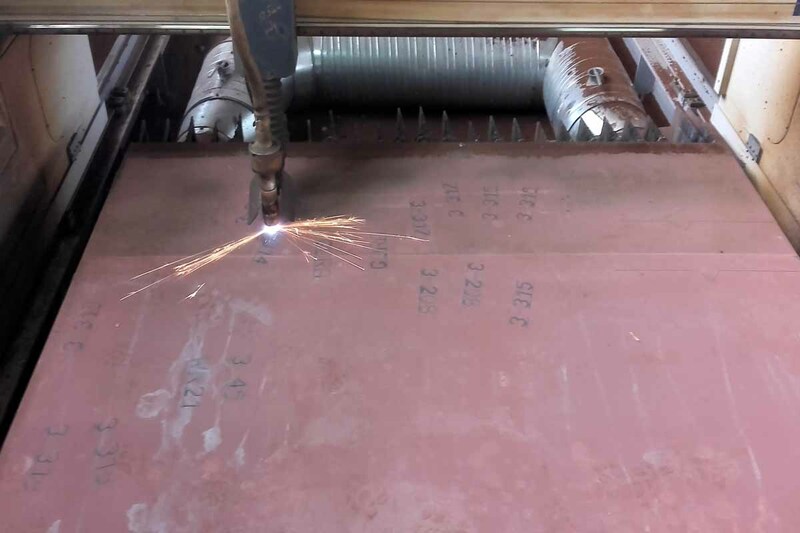 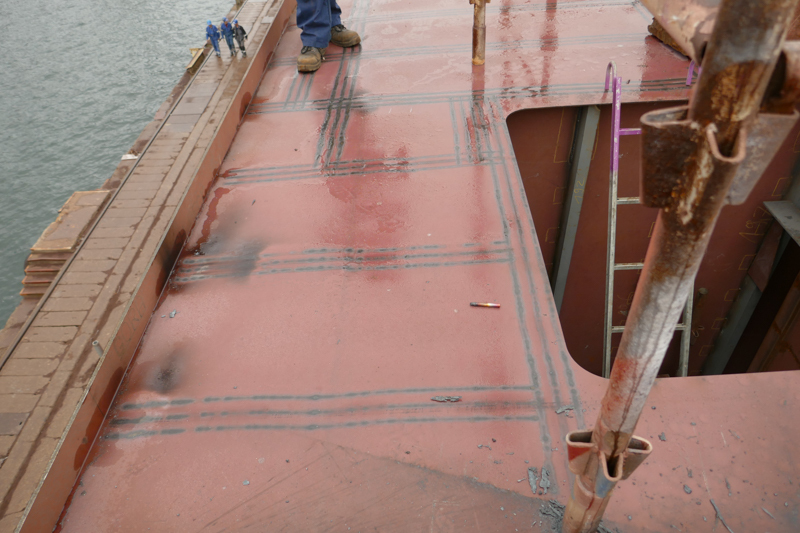 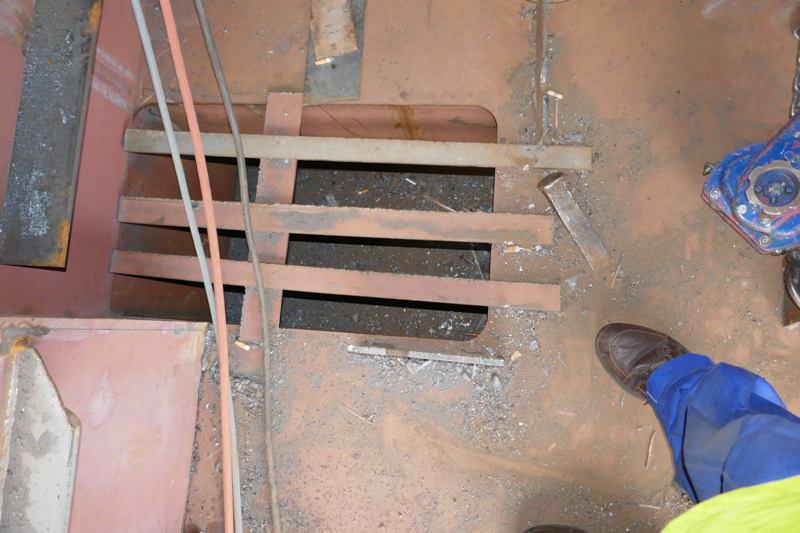 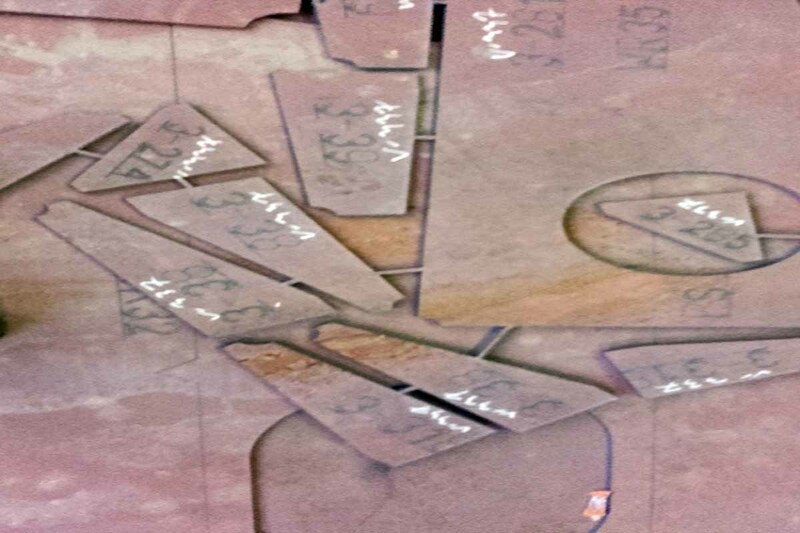 The engineroom floor is an aluminium chequer plate design with access to all areas valves and control system made for simple for the vessel engineer. 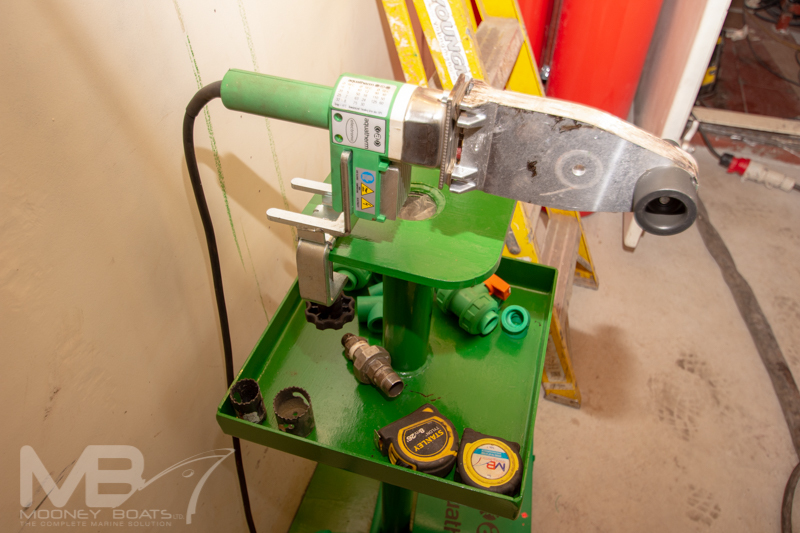 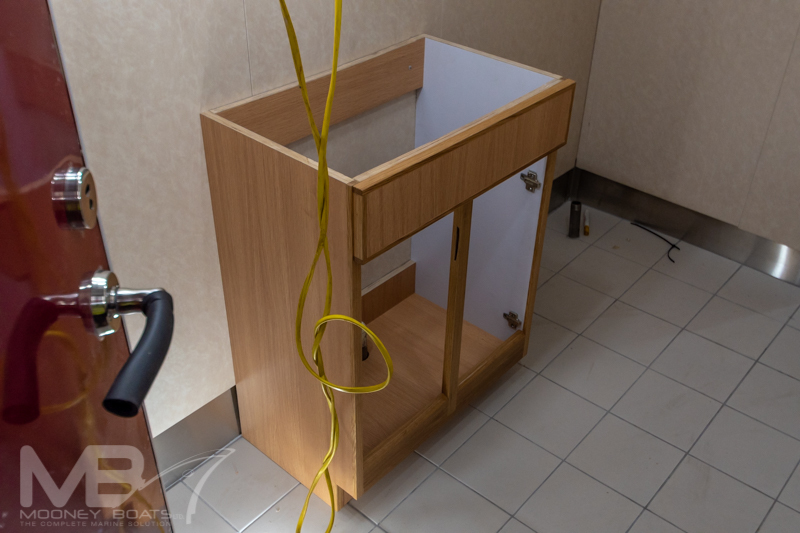 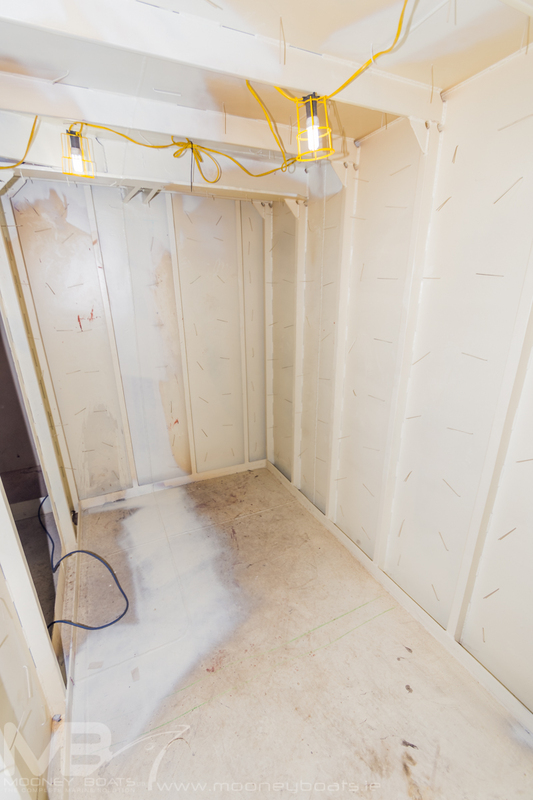 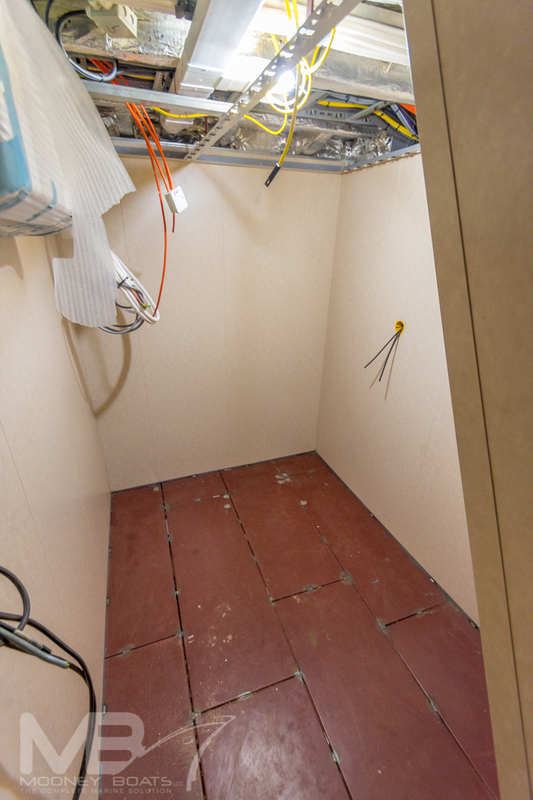 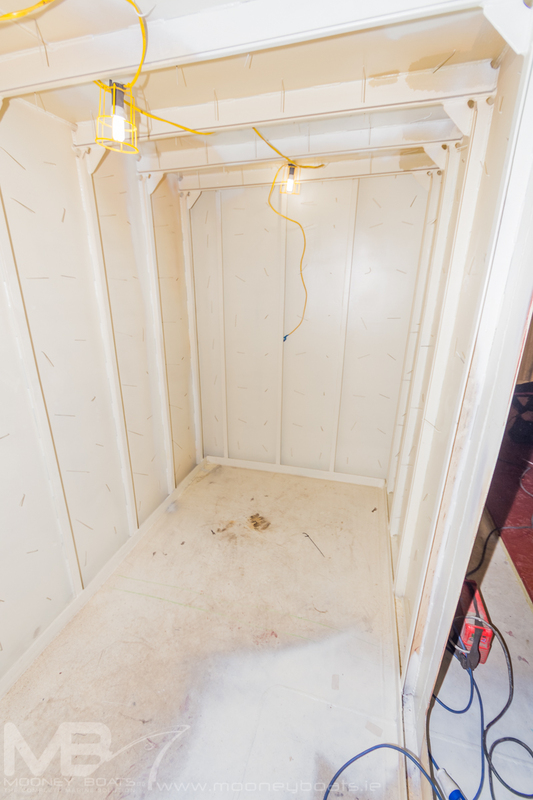 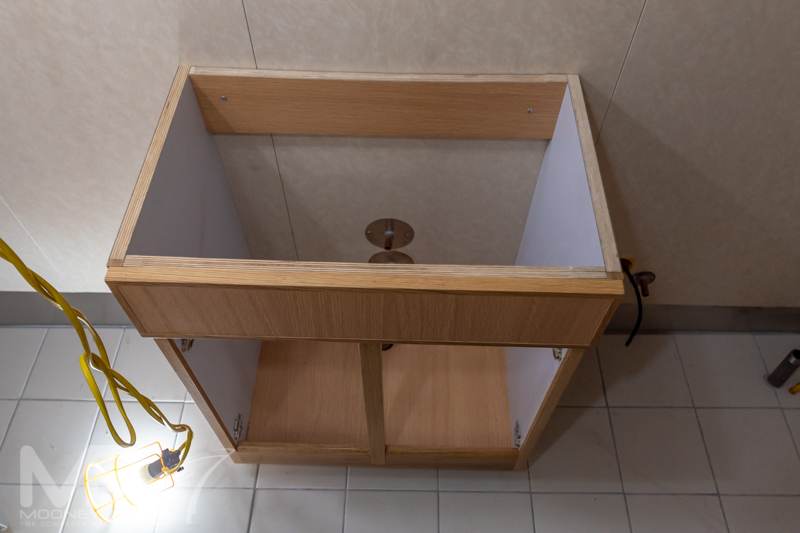 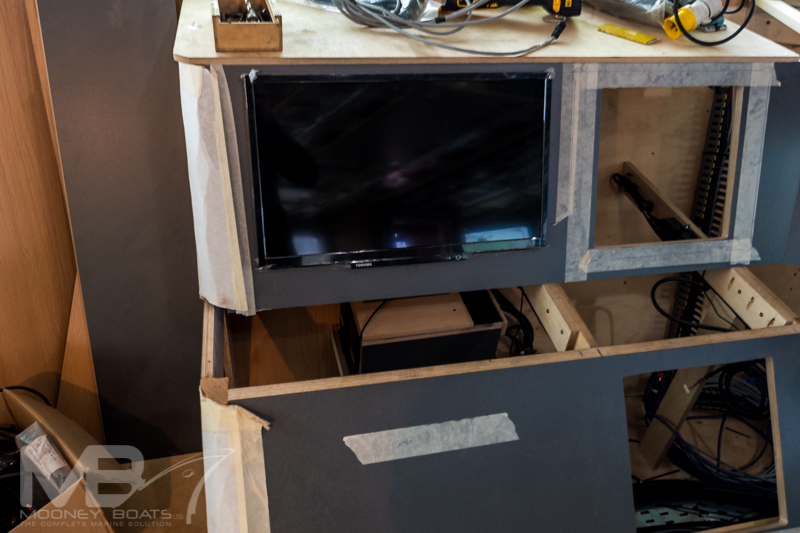 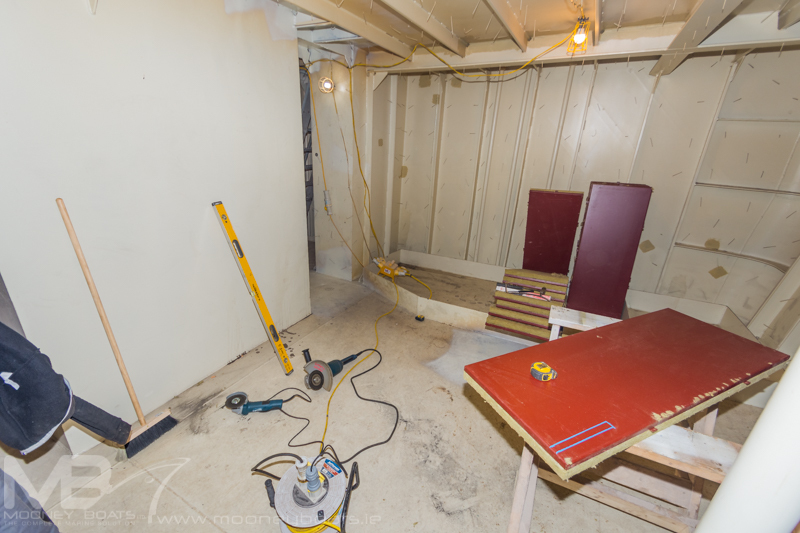 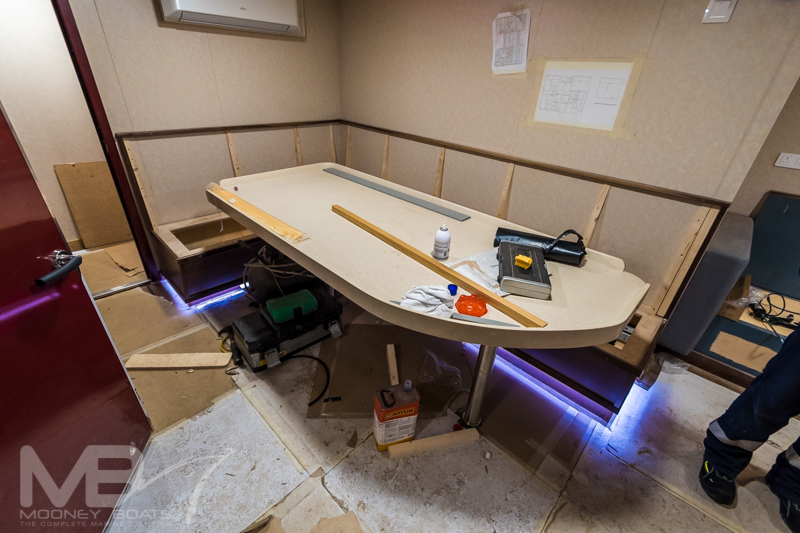 The engineroom is equipped with a wash hand basin, tool locker, workbench. 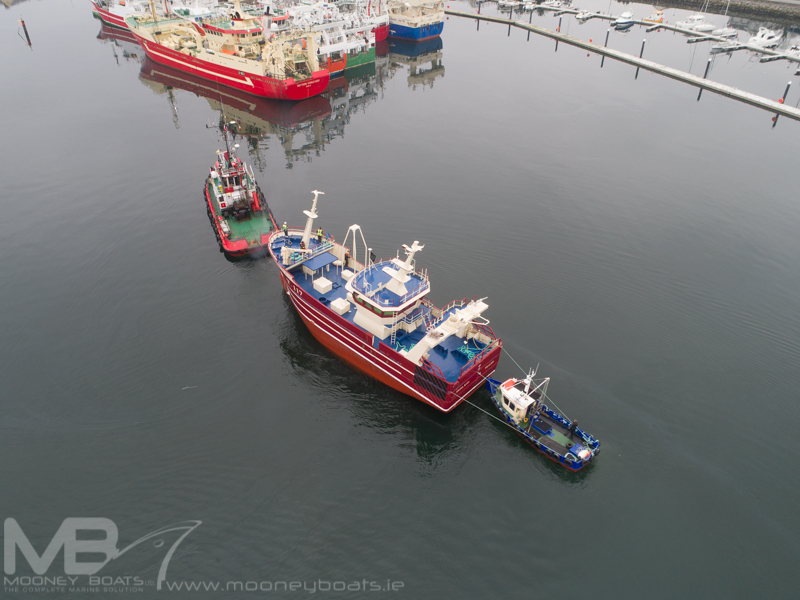 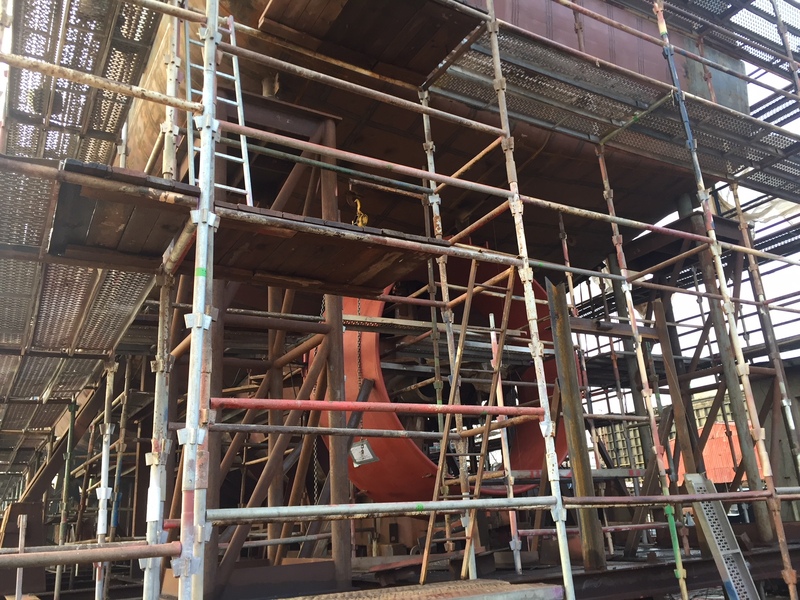 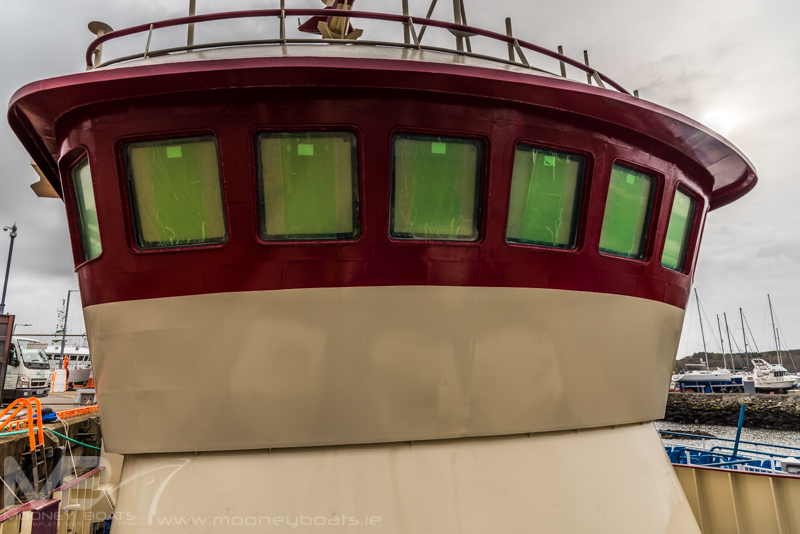 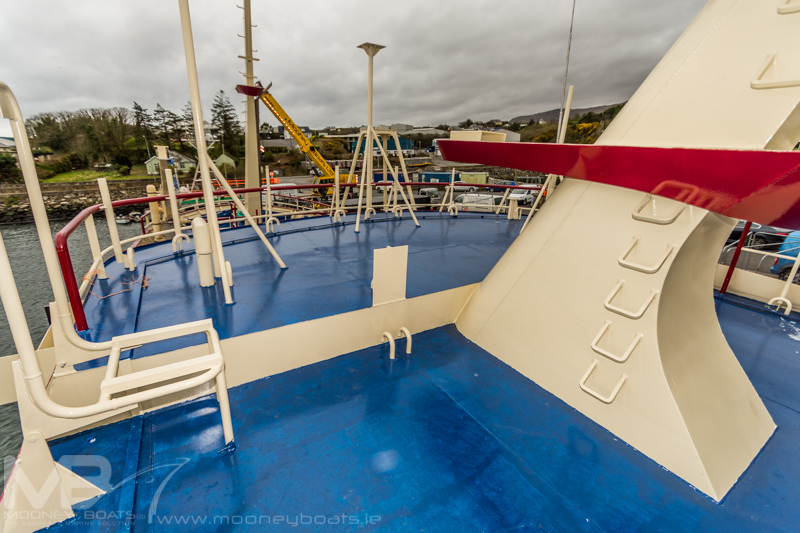 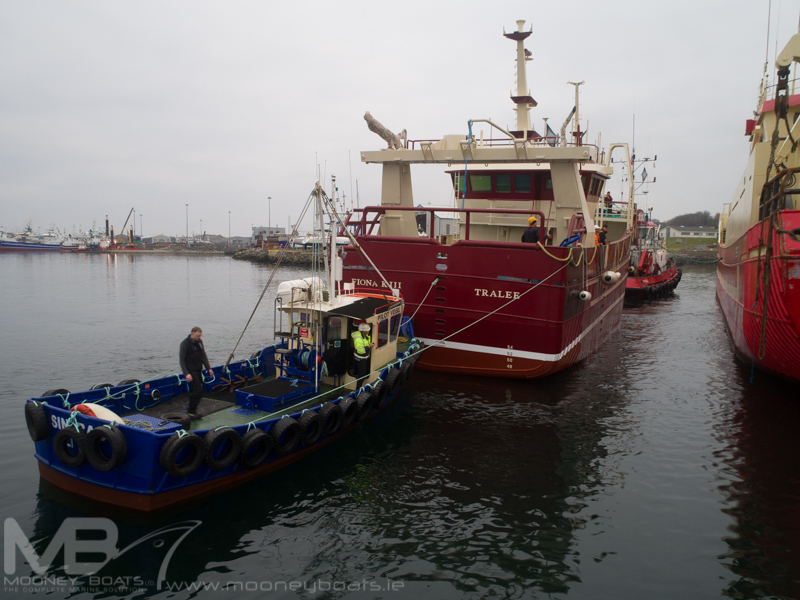 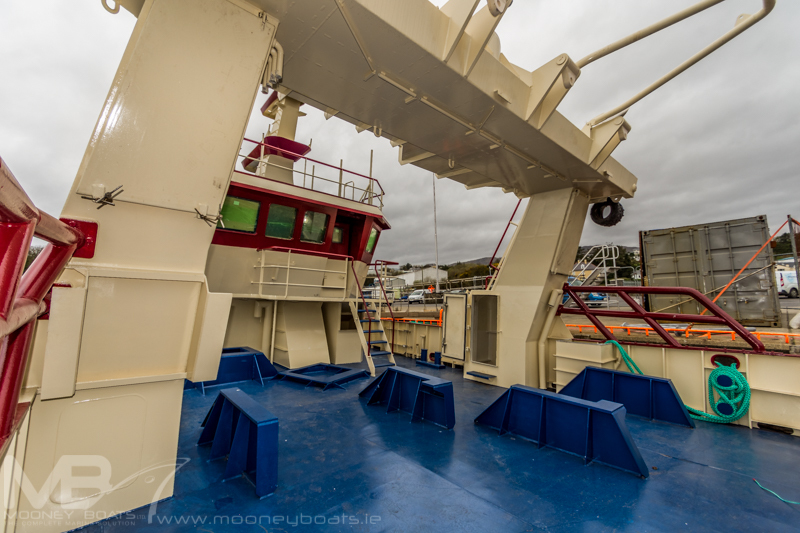 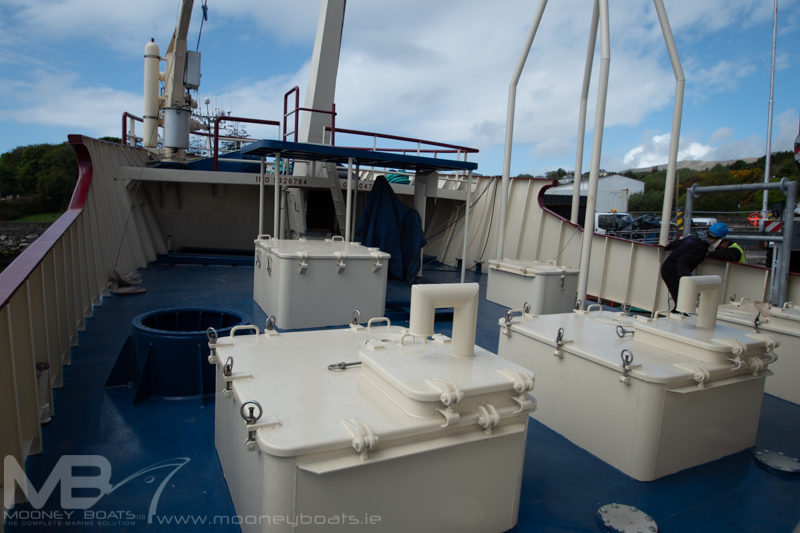 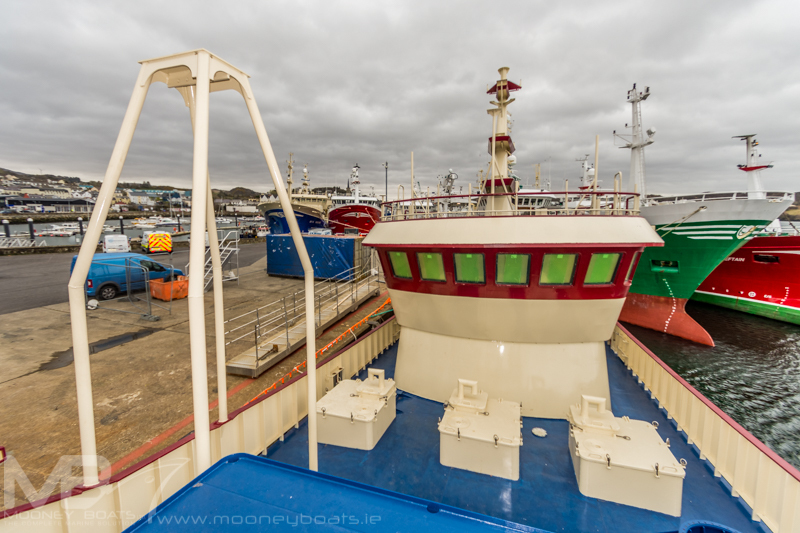 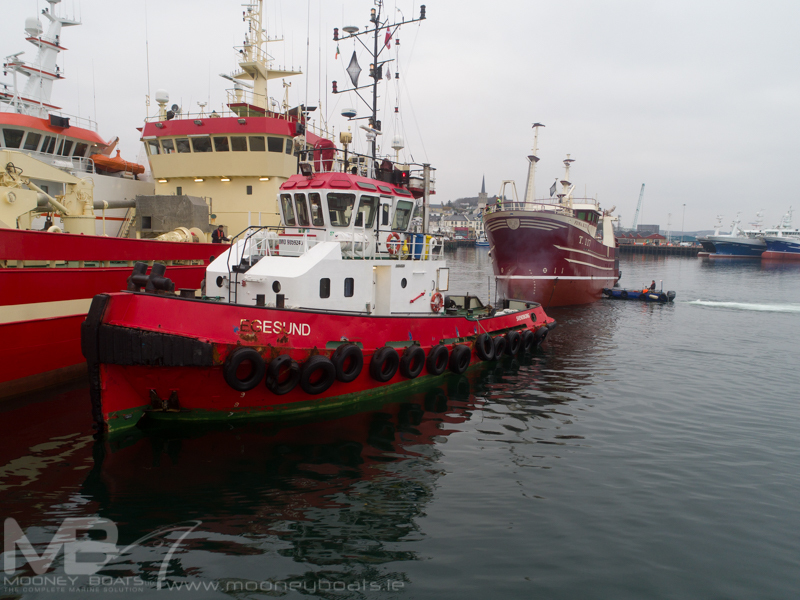 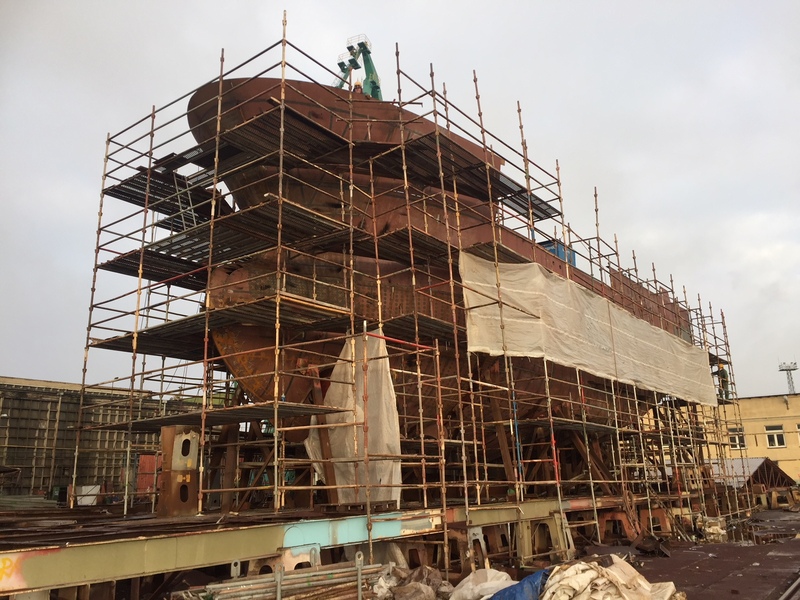 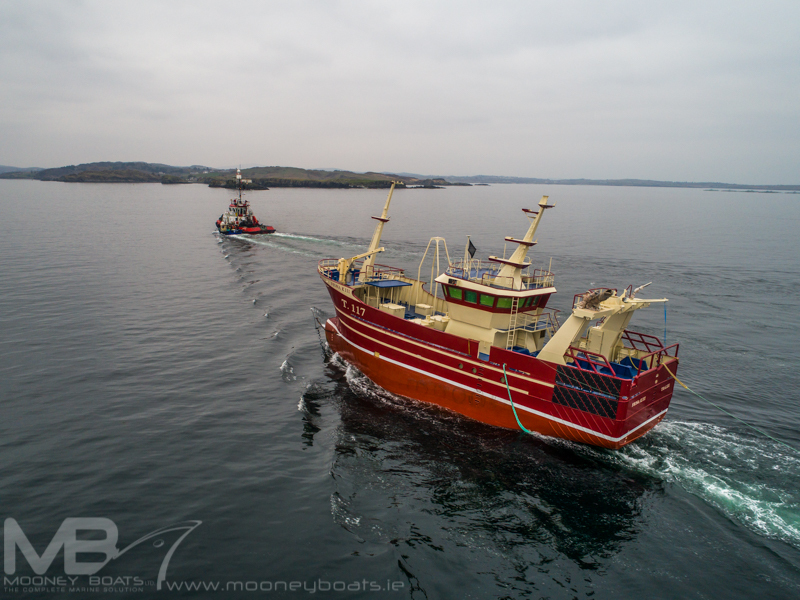 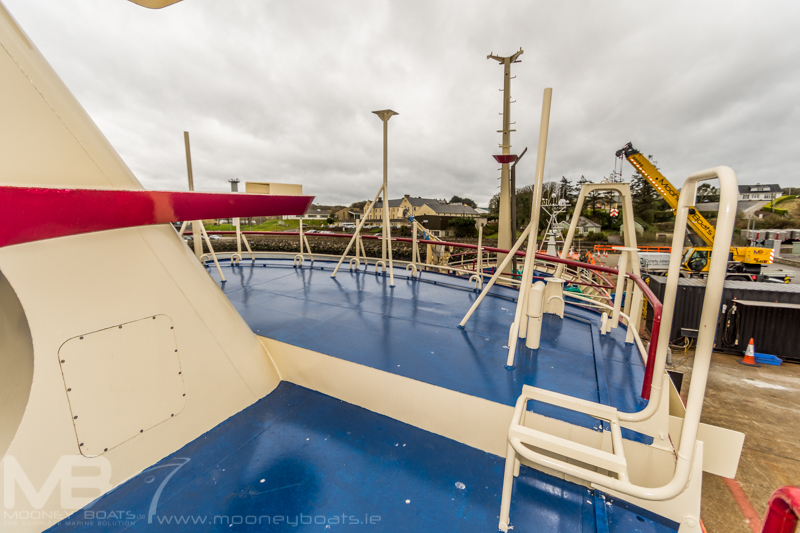 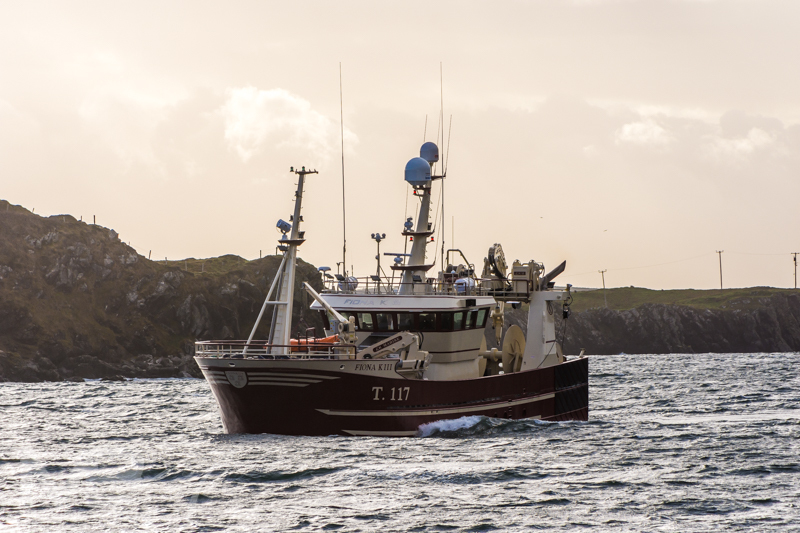 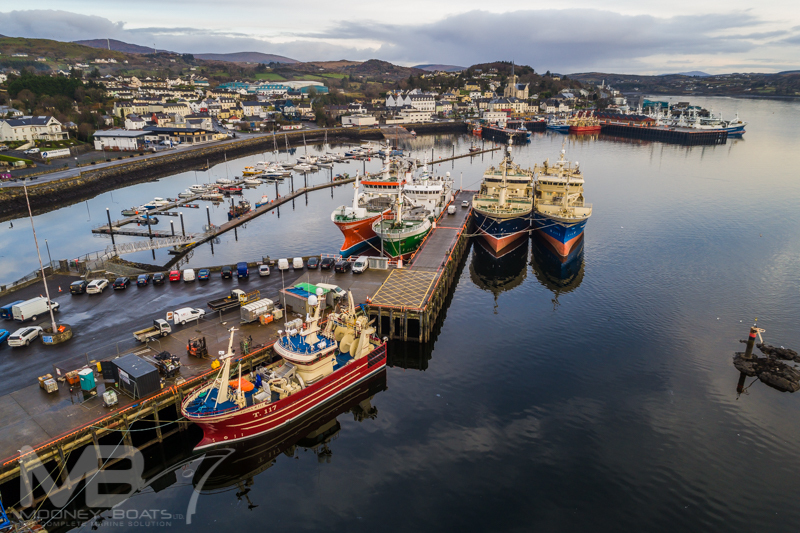 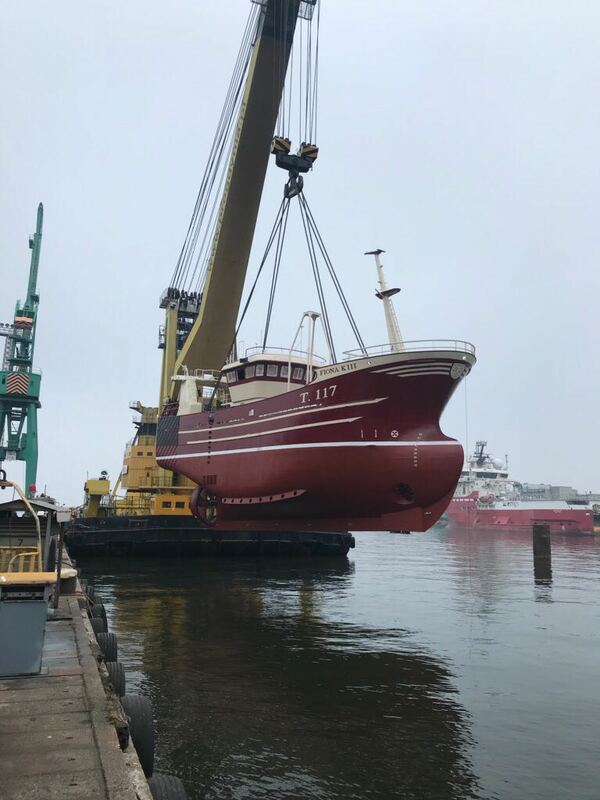 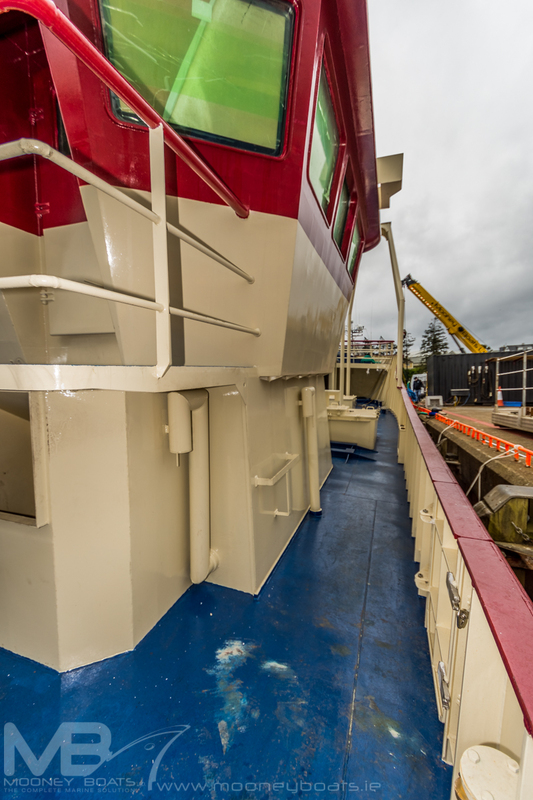 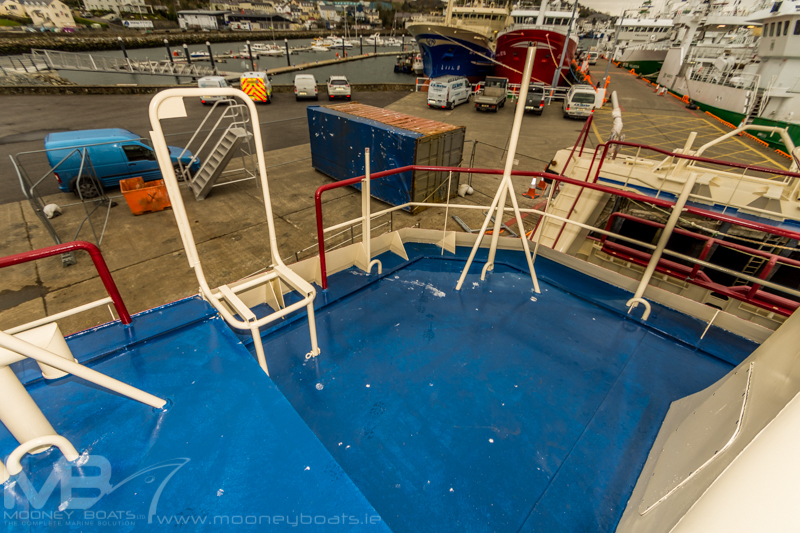 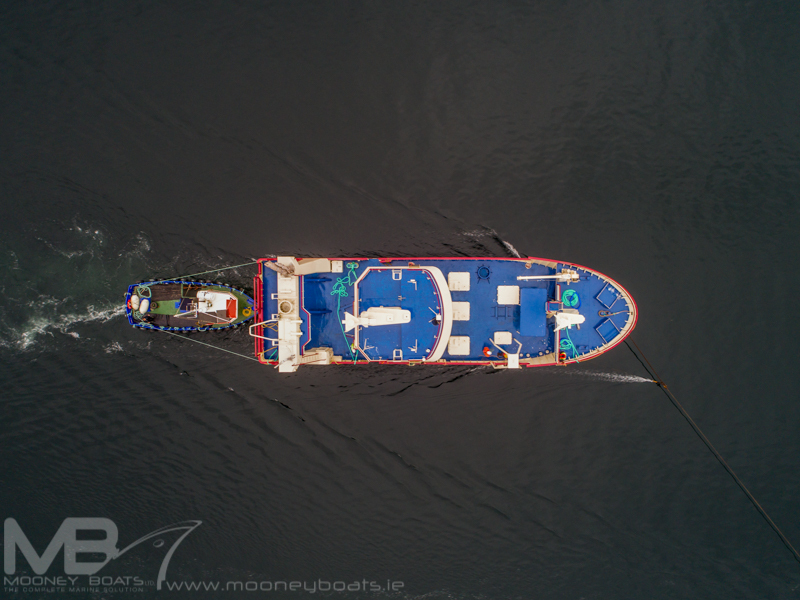 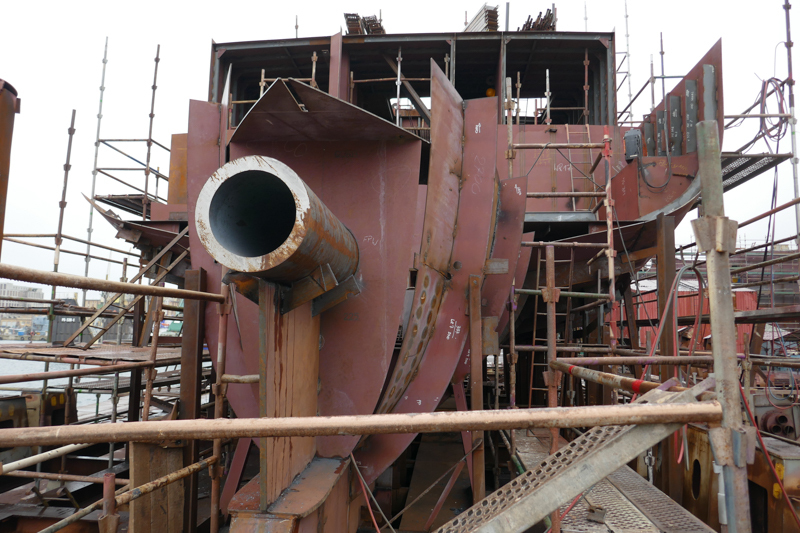 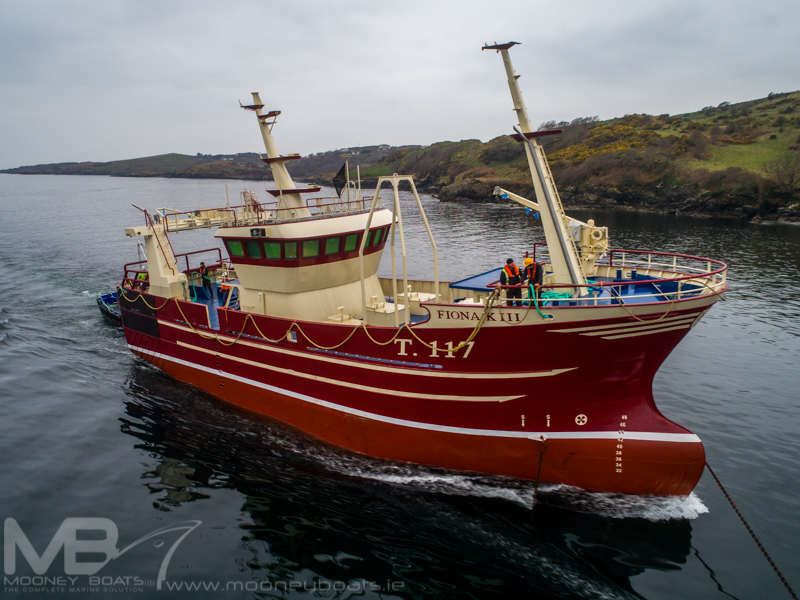 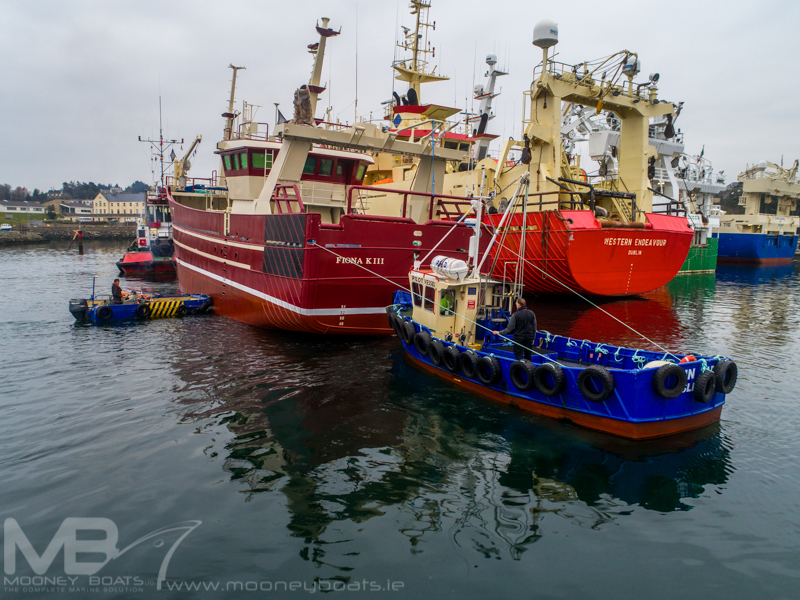 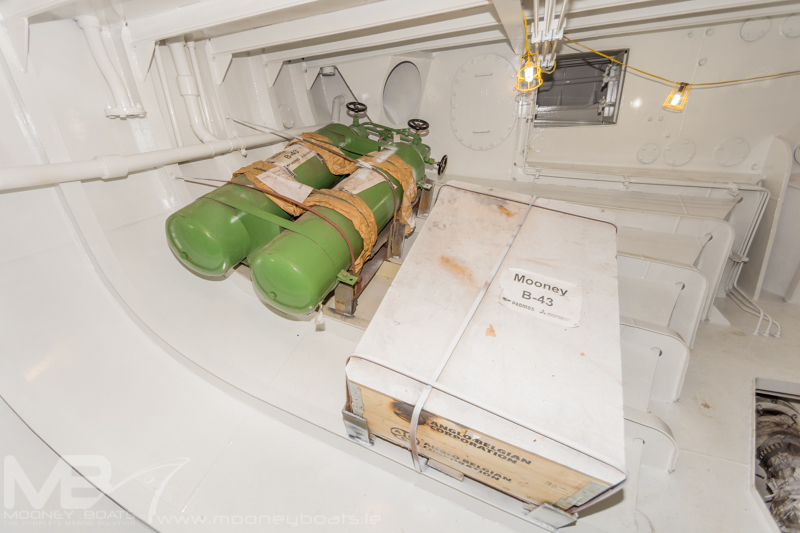 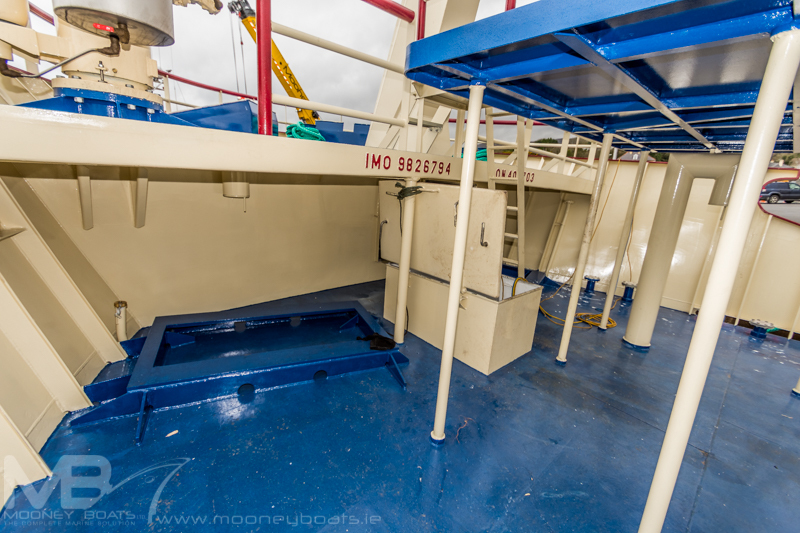 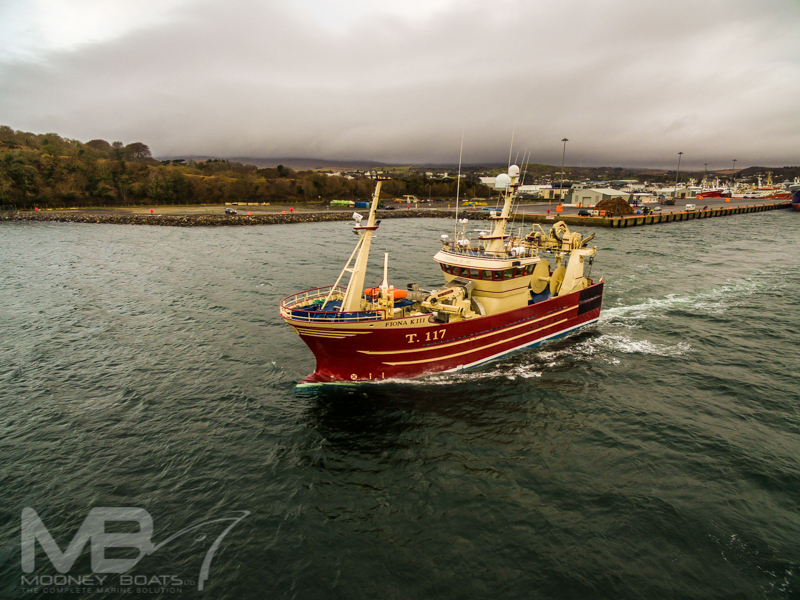 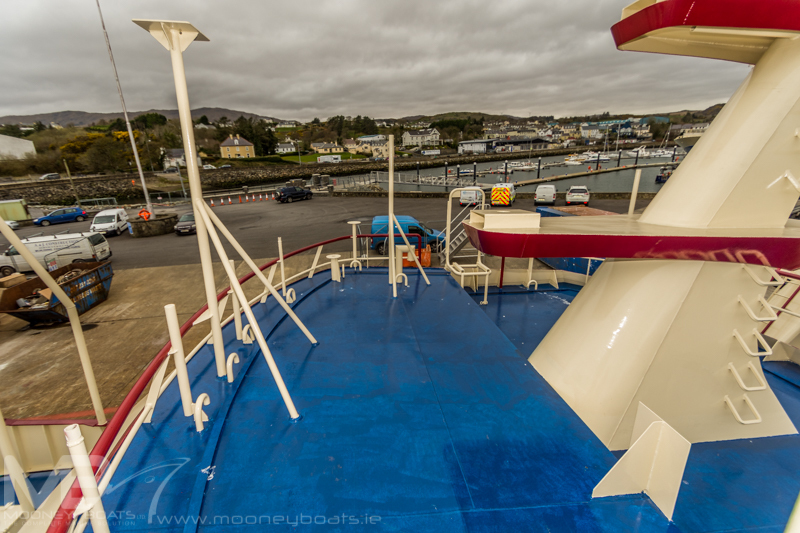 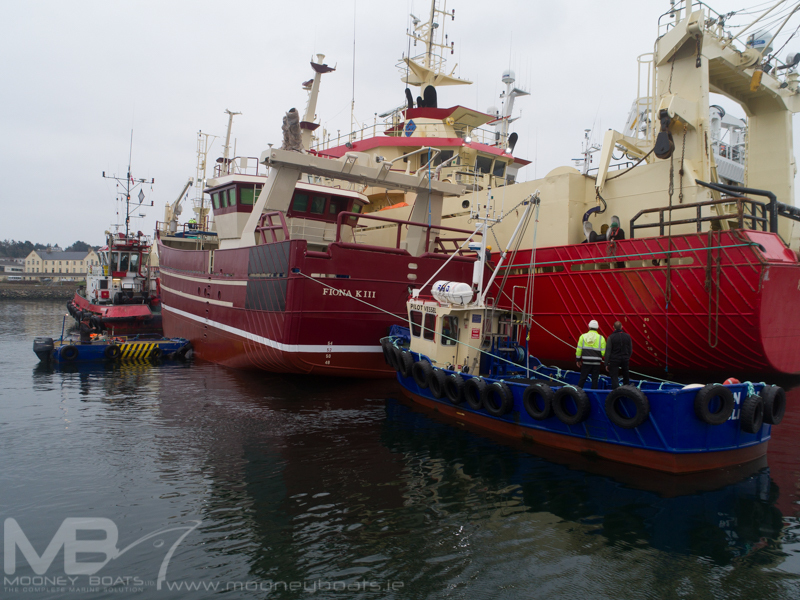 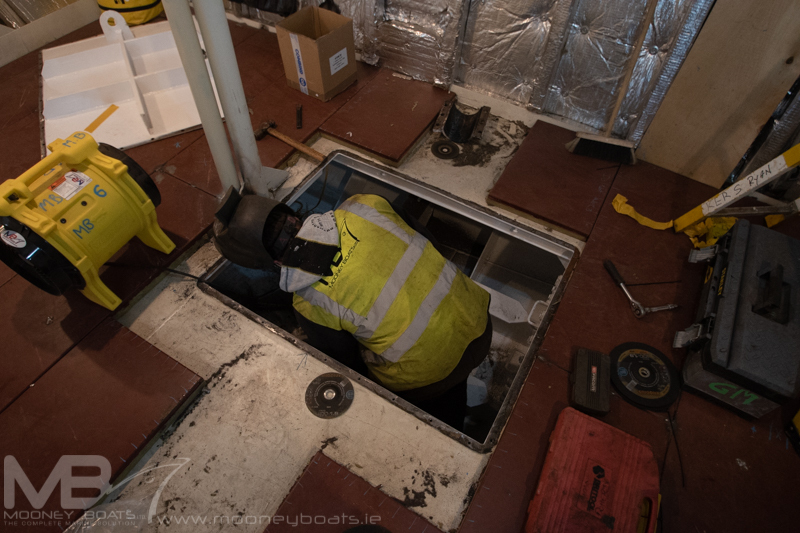 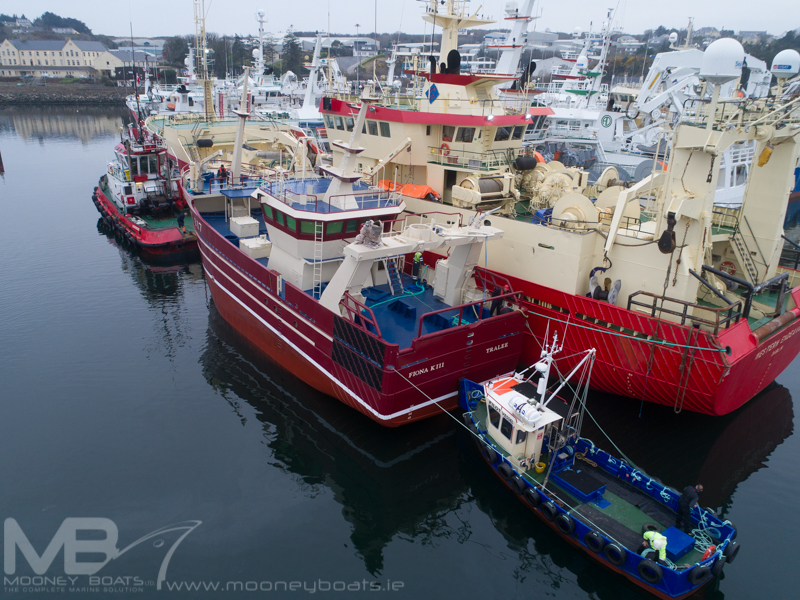 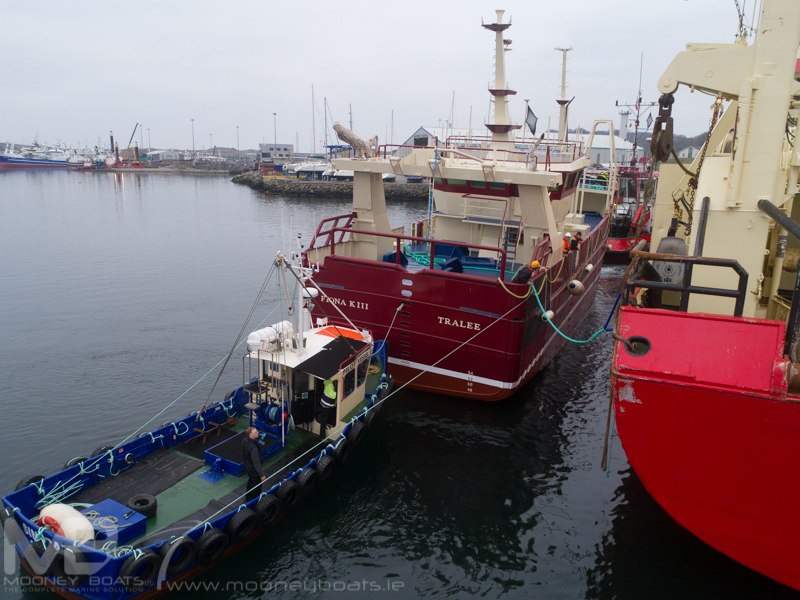 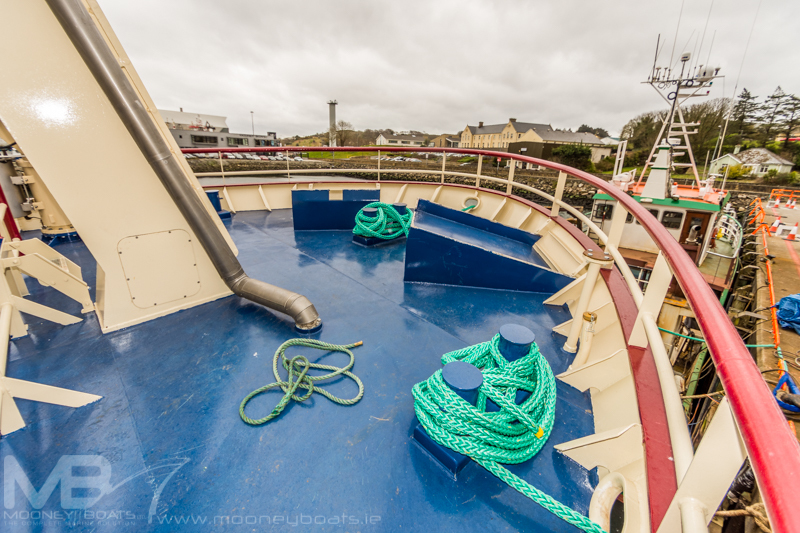 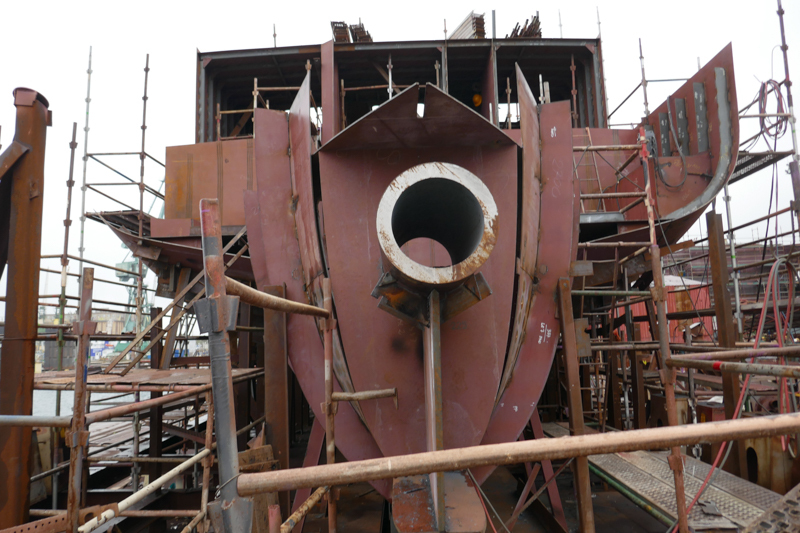 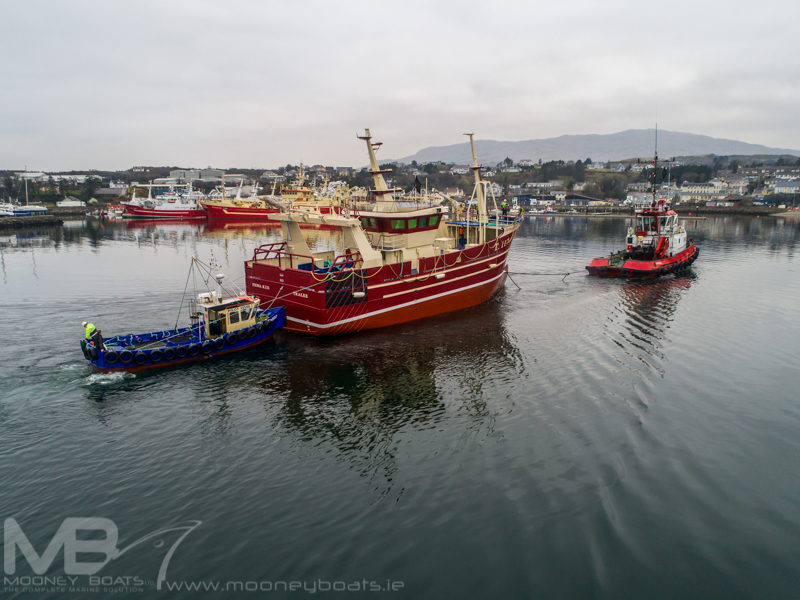 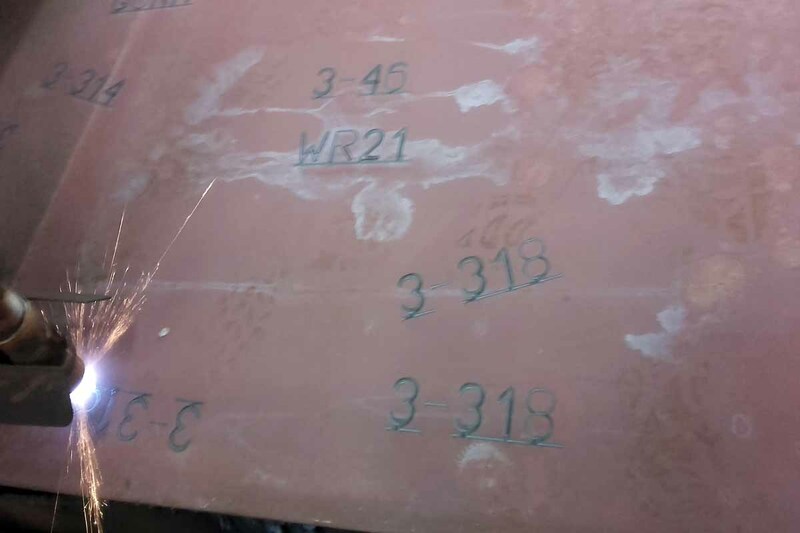 Padmos of Kilmore supplied the vessel’s engine package which were lifted into the hull in Poland and then installed by Mooney Boats Ltd engineers in Killybegs when the hull arrived. 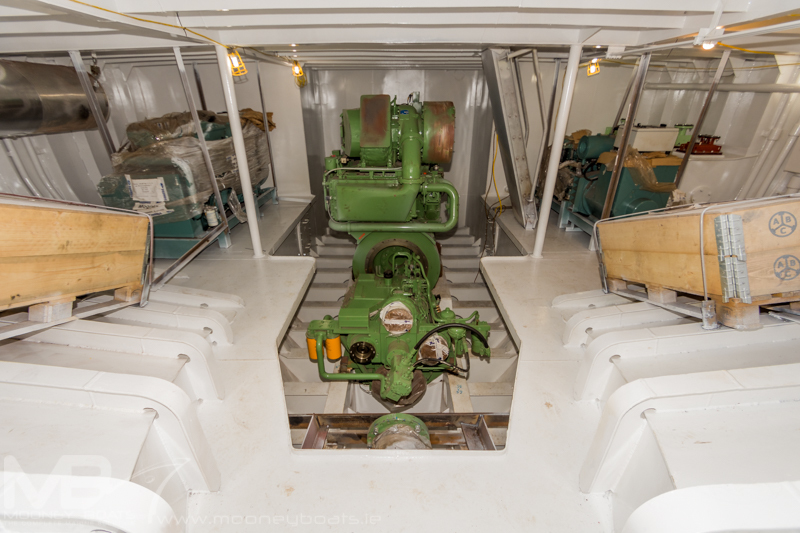 The Main Engine is a ABC 6DZC which was coupled to an Hundested CPGD120 Gearbox Ratio 7.04:1. 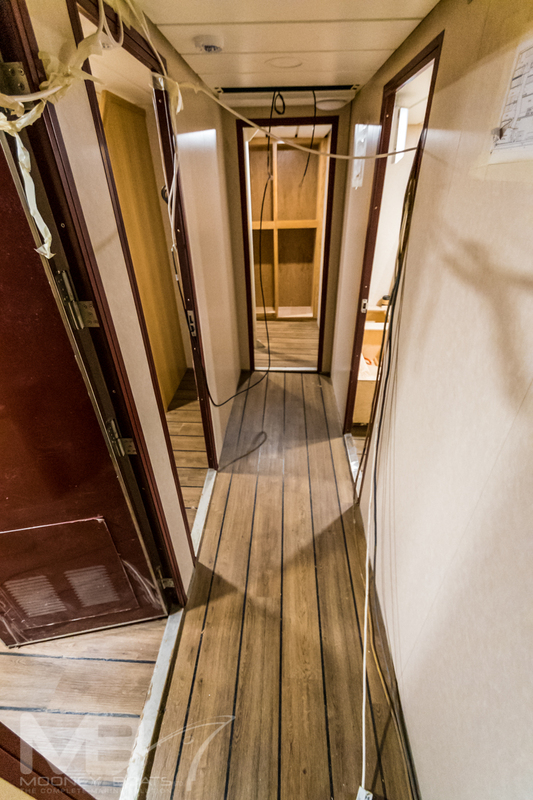 Two Step. 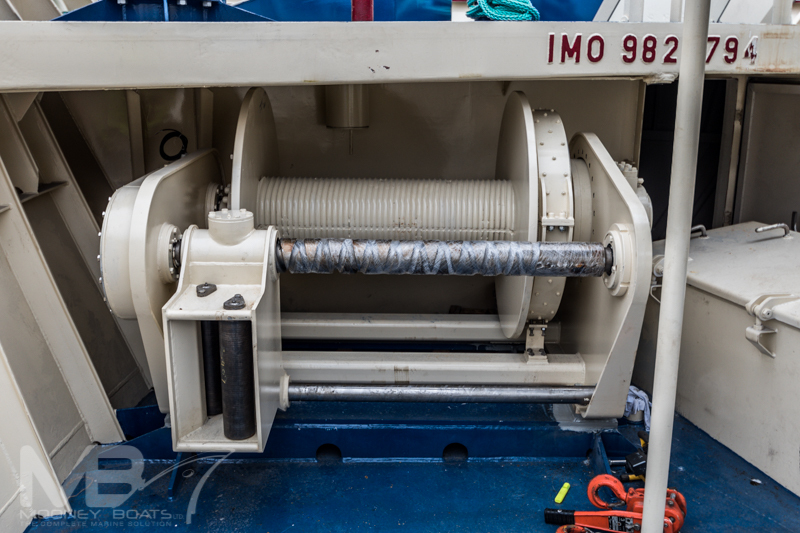 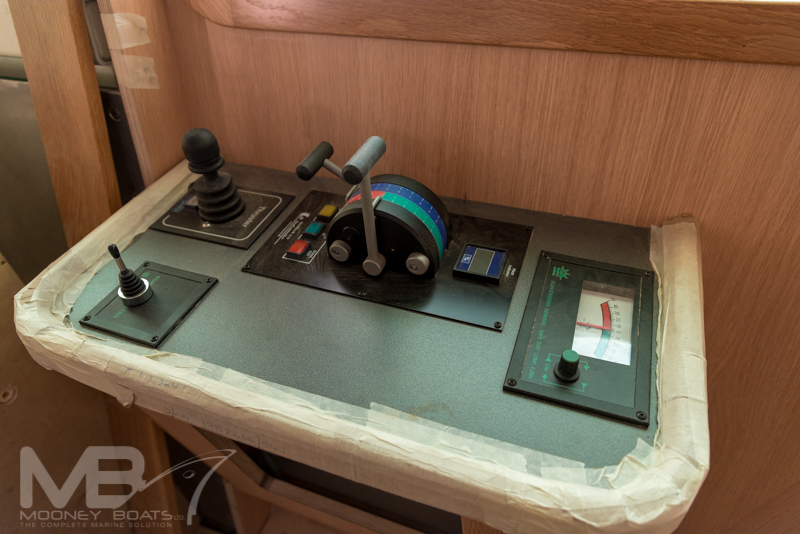 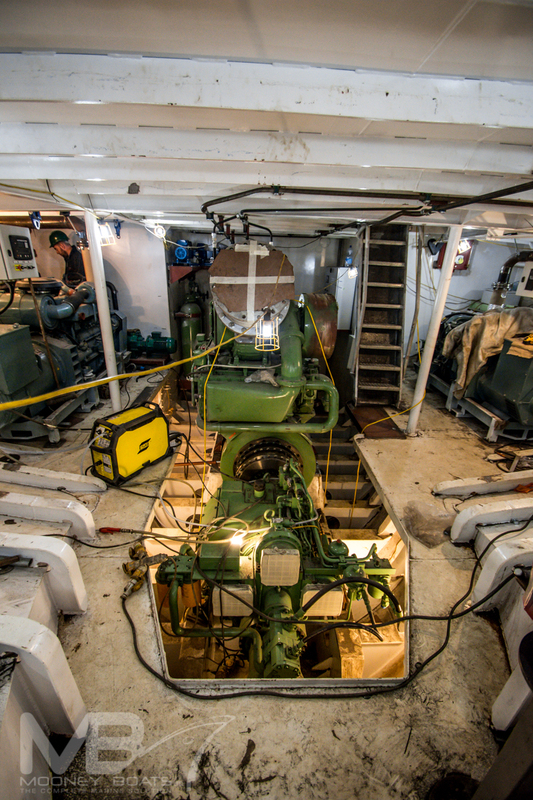 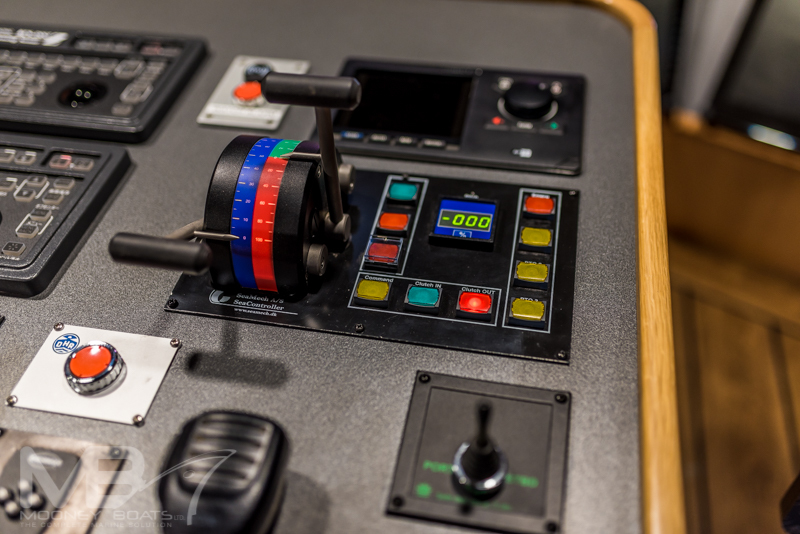 The gearbox is fitted with 3 No PTOs for driving the Hydraulic Pumps which can all be controlled from the wheelhouse. 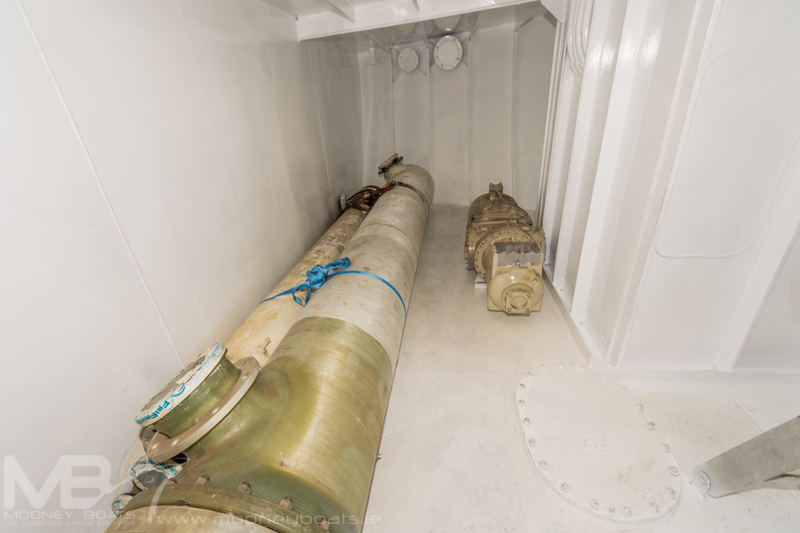 The Propeller shaft and stern tube were supplied by Hundested and is a CPP system with a 4 blade, 2780mm Diameter propeller. 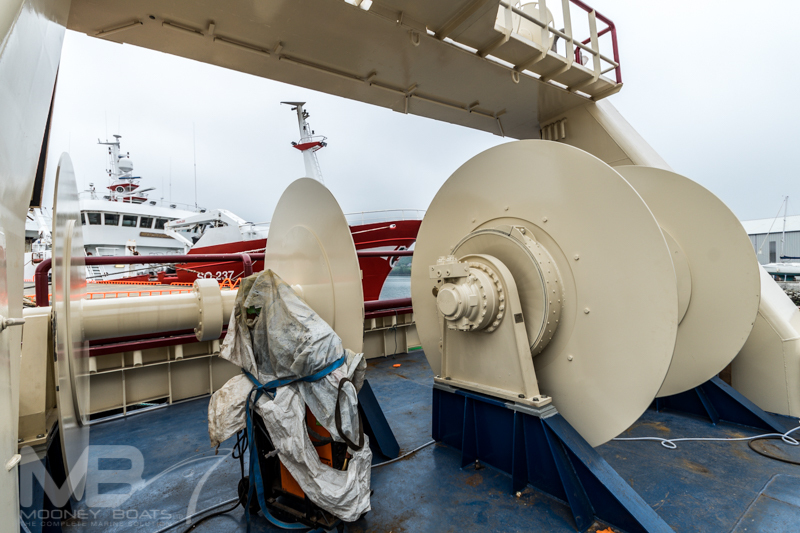 Hudested also supplied the bow thruster which is 160 HP and gives maximum vessel manoeuvrability in restricted areas. 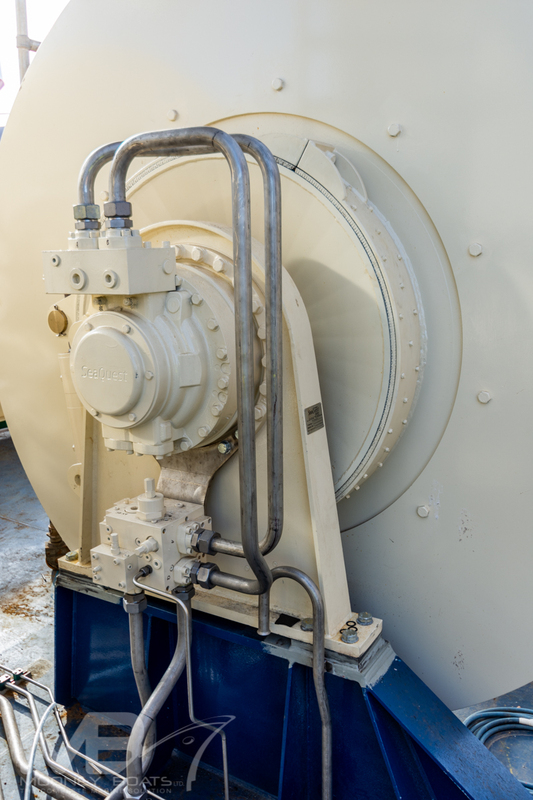 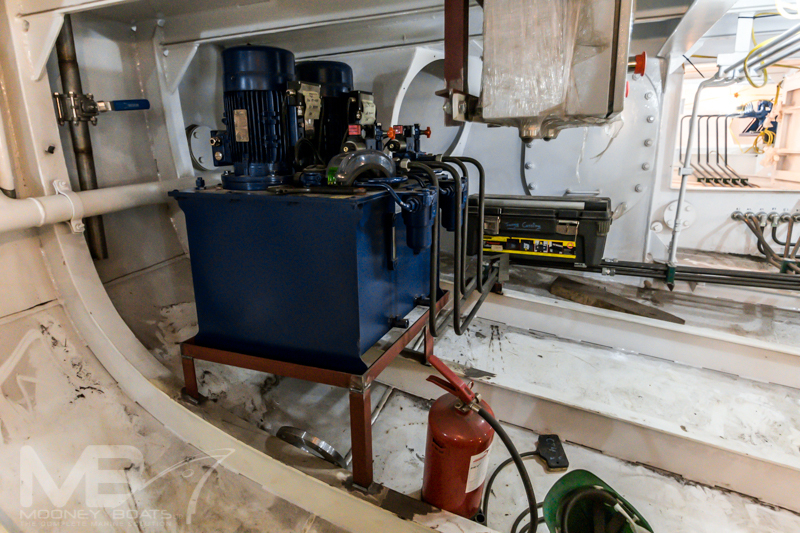 The main generator is a Mitsubishi S6B3-T2MPTAW driving a 295KVA Generator mounted on a steel frame on top the port tank which powers the RSW equipment and other electrical equipment throughout the vessel. 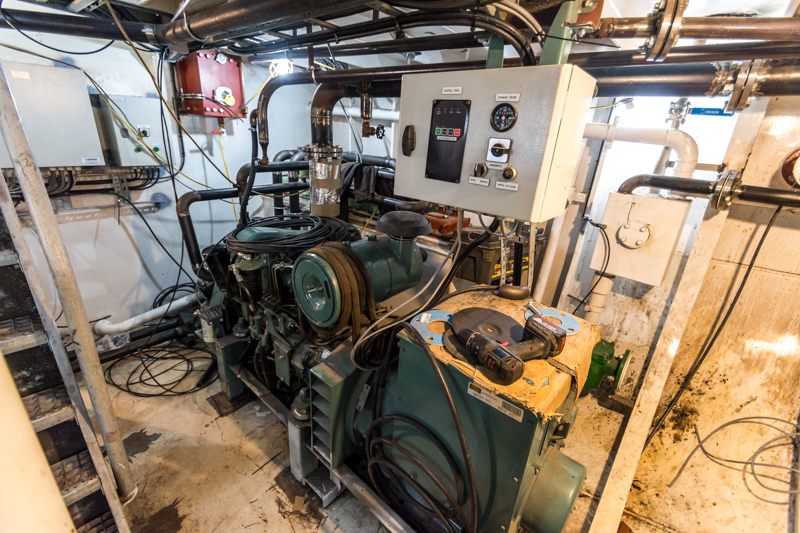 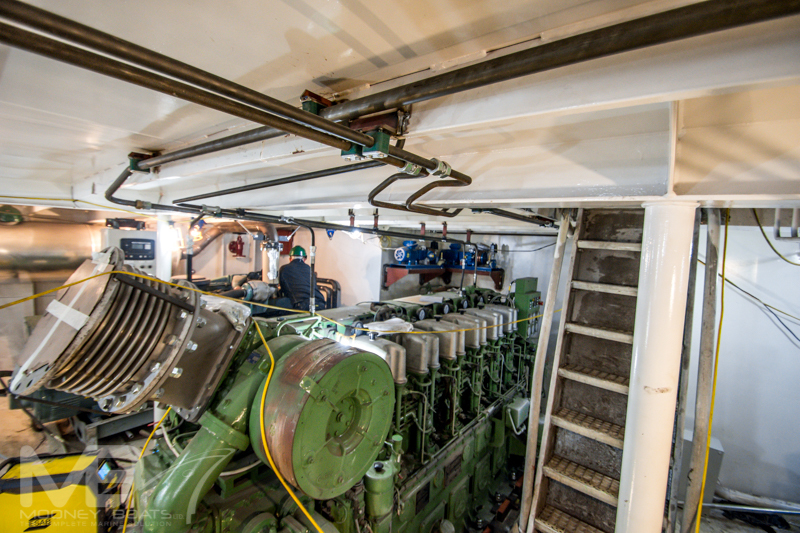 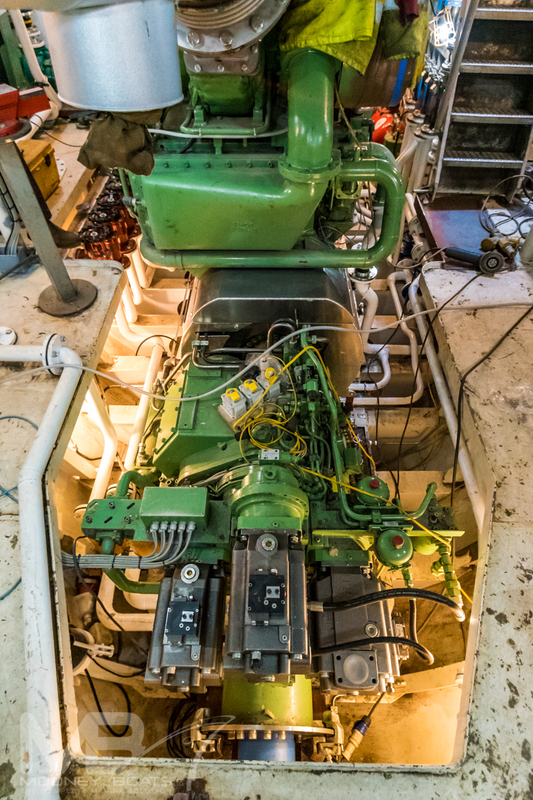 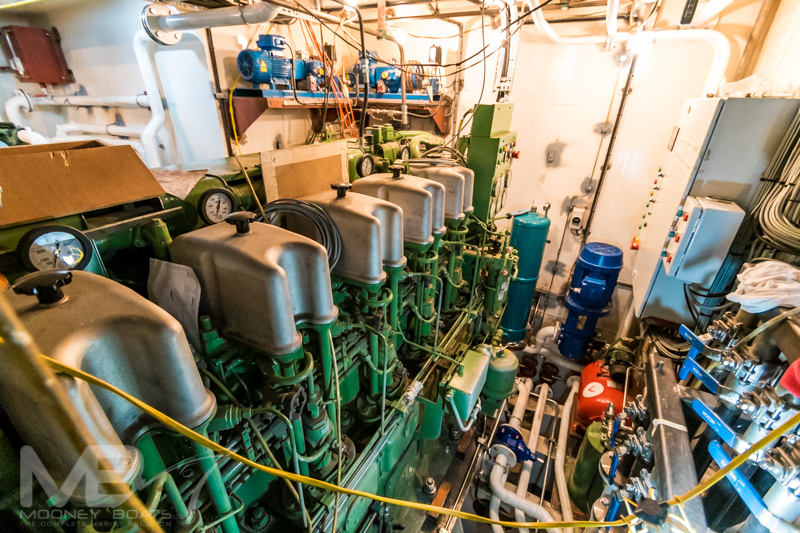 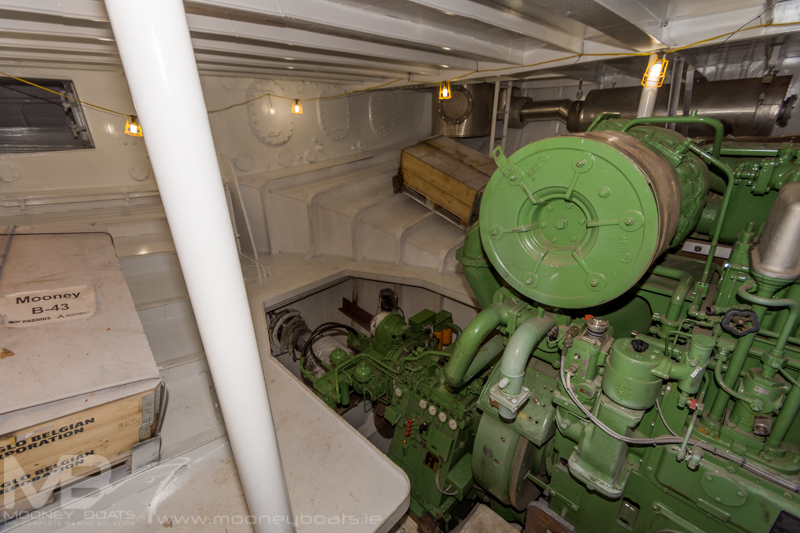 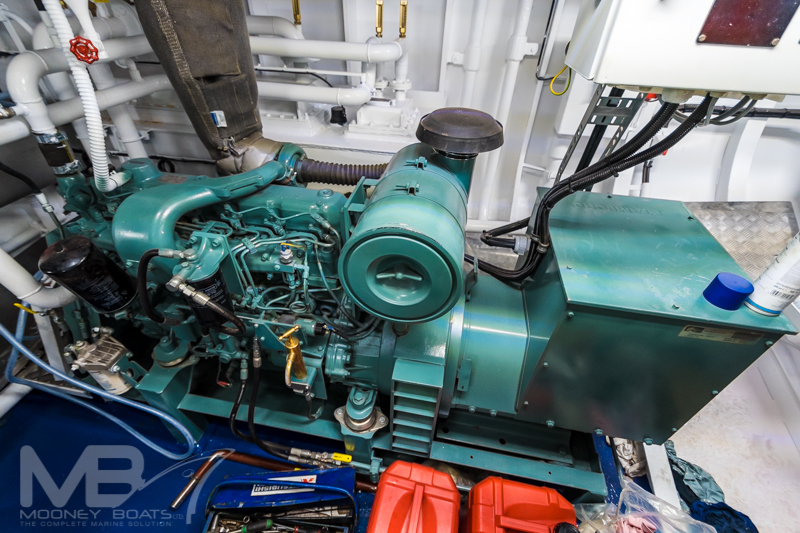 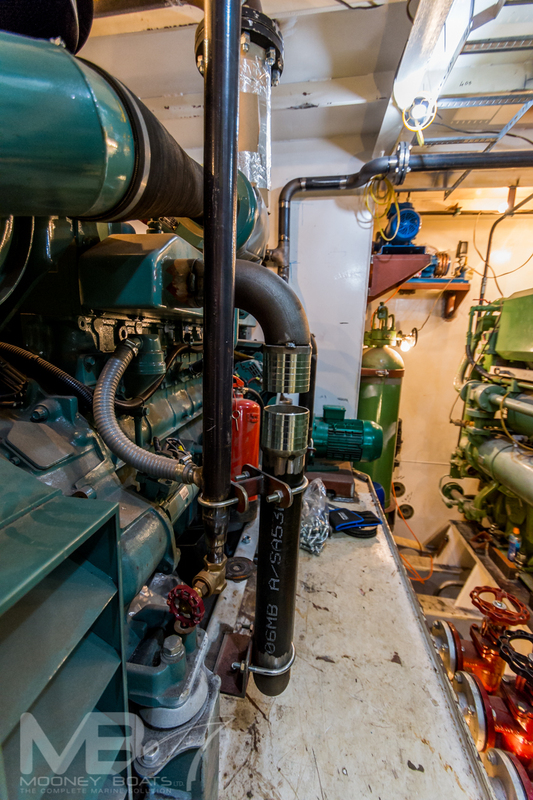 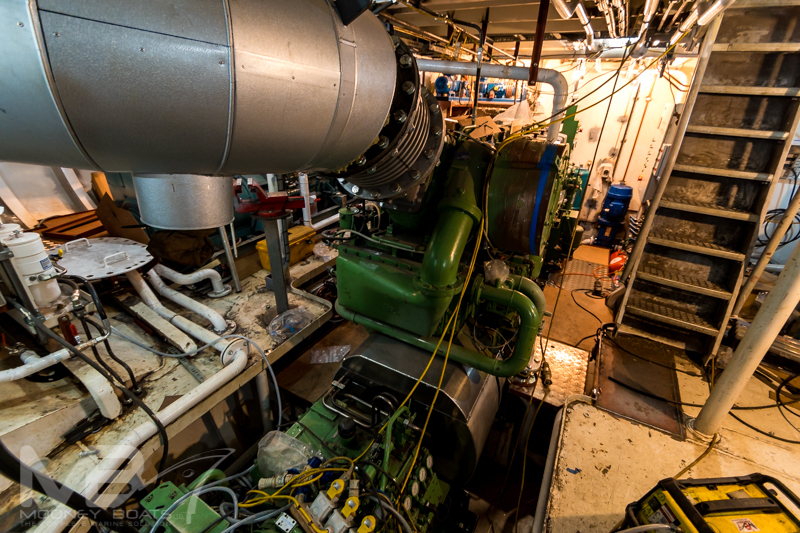 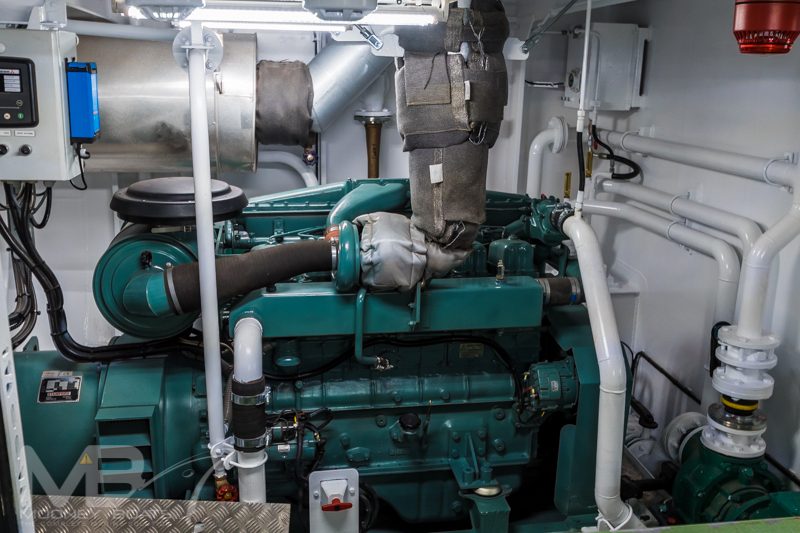 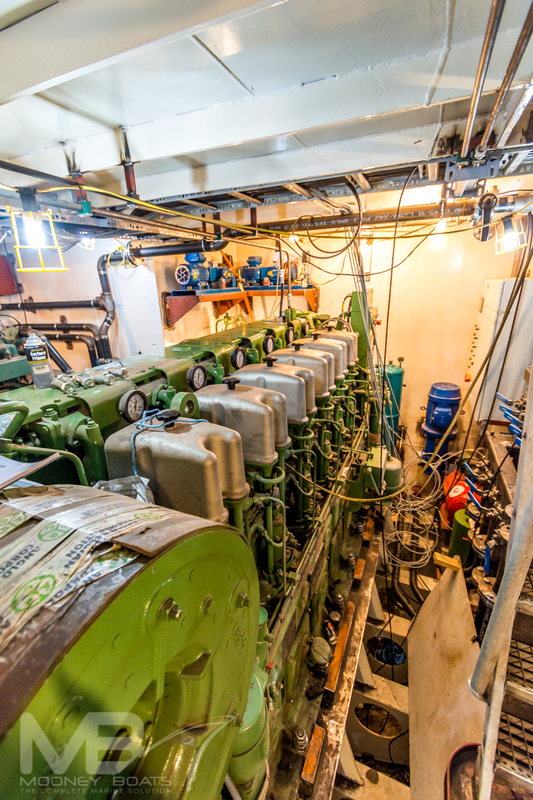 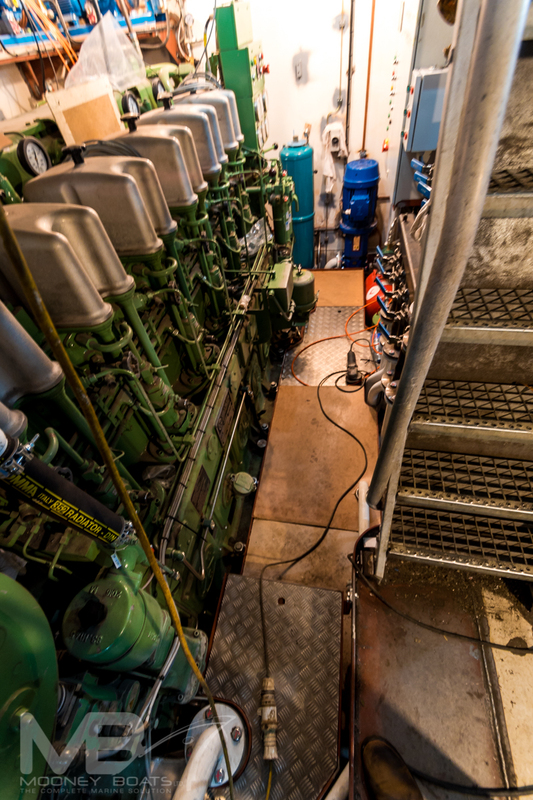 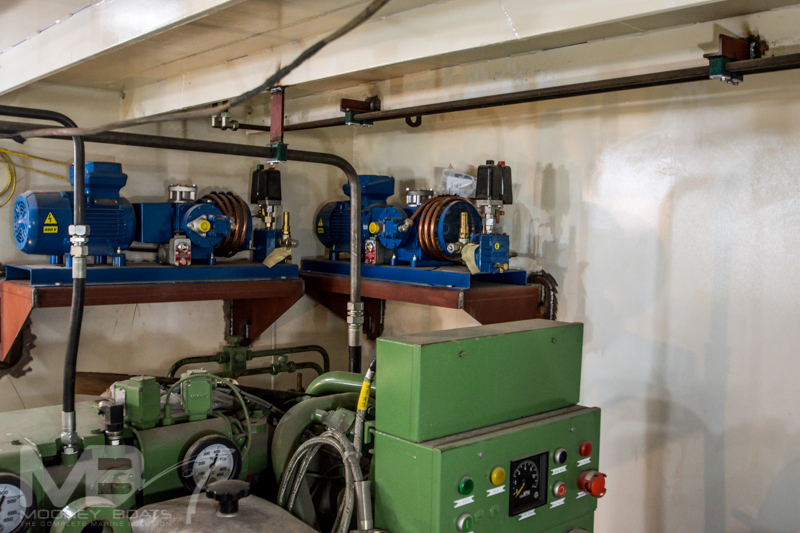 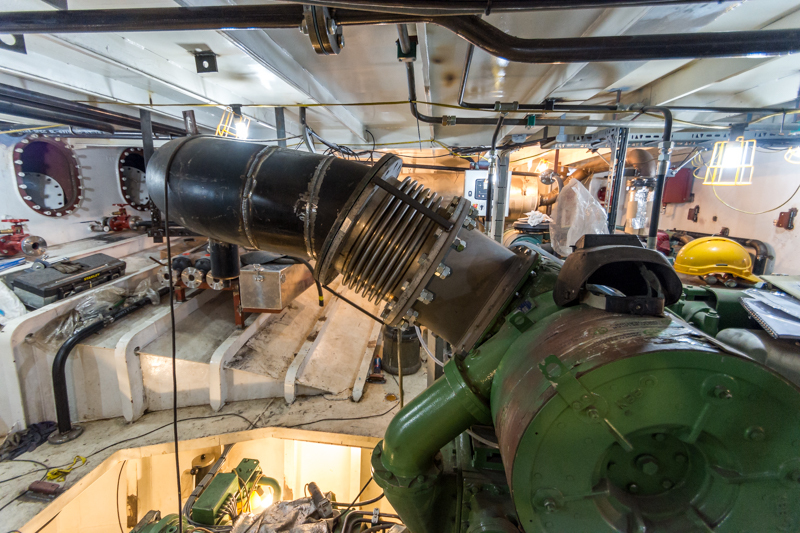 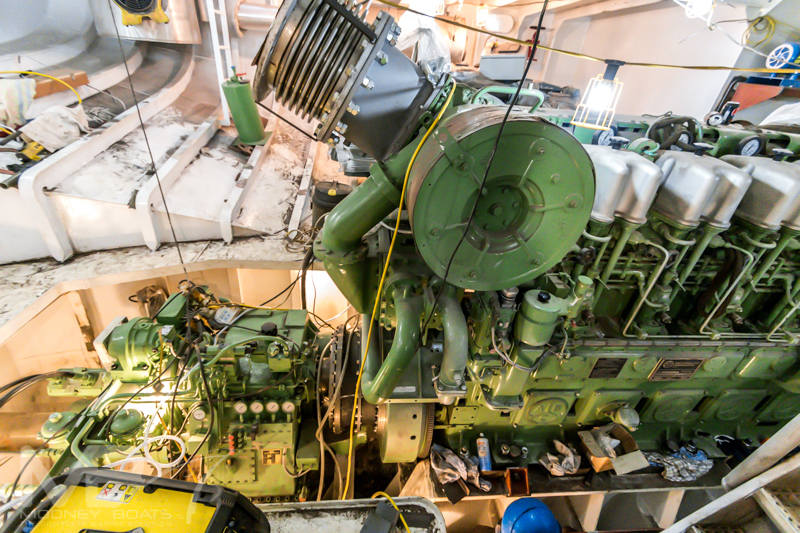 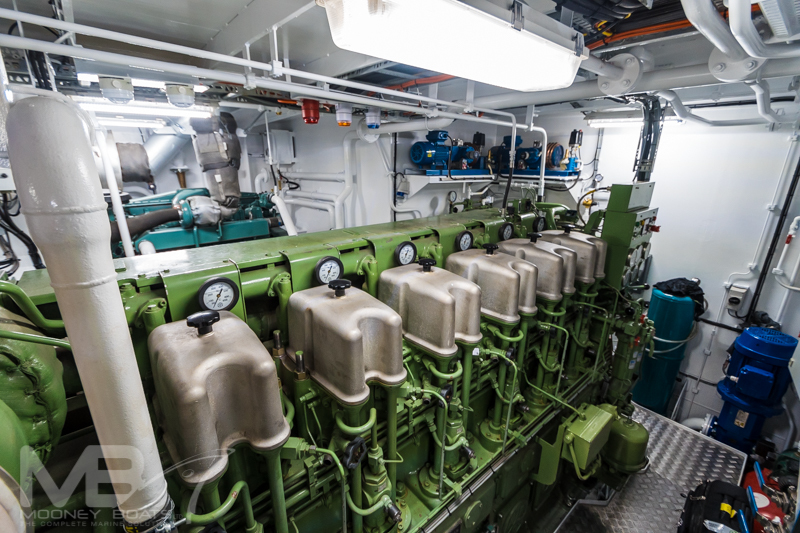 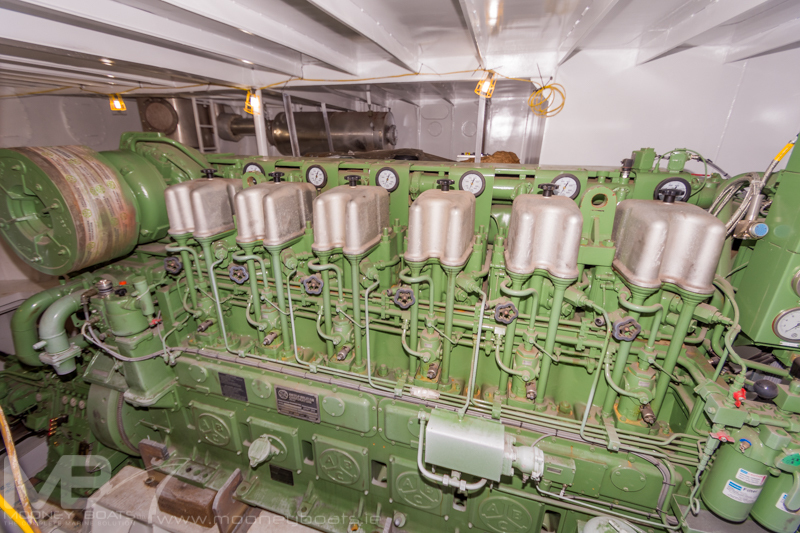 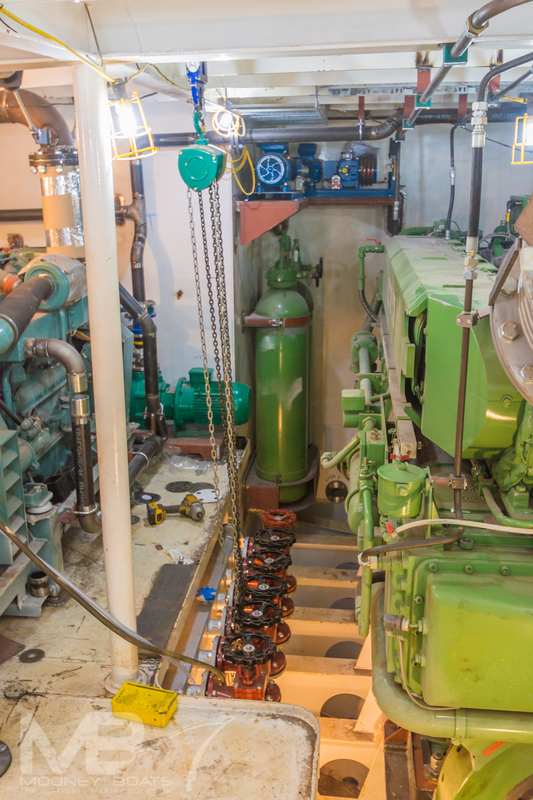 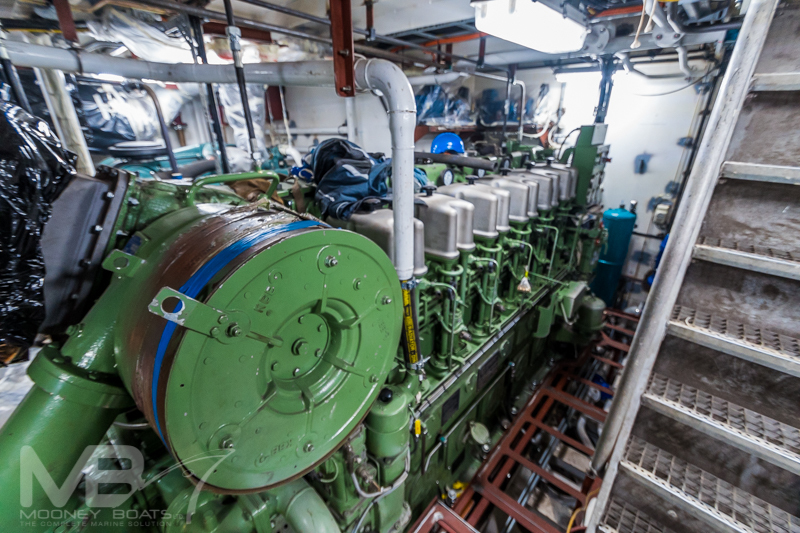 A second 120kVA Stamford generator is driven by a Mitsubishi 6D16-T auxiliary engine which is fitted on the starboard side of the enginroom. 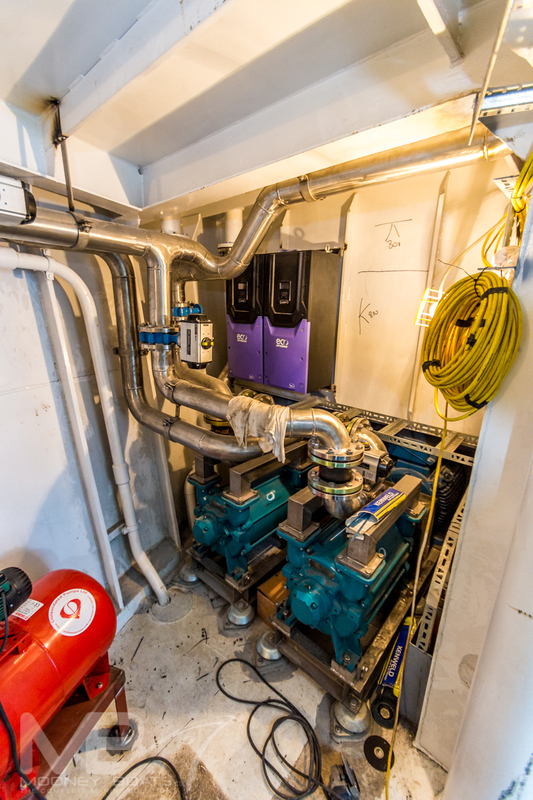 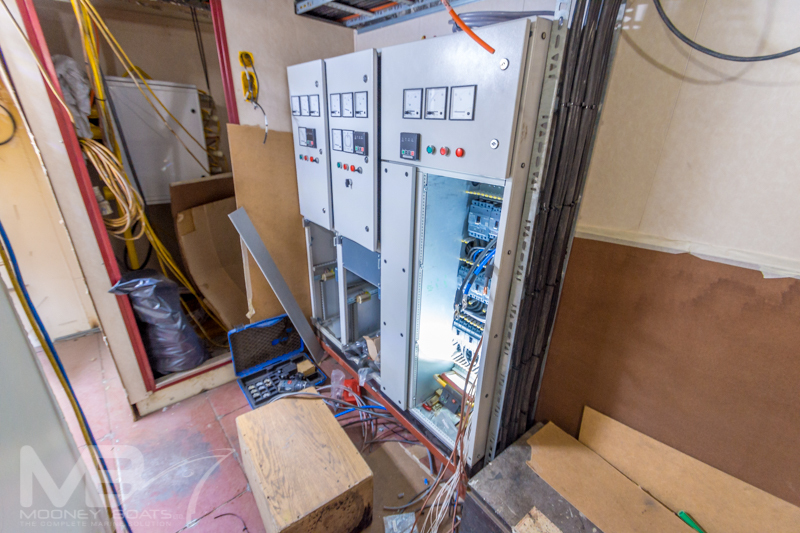 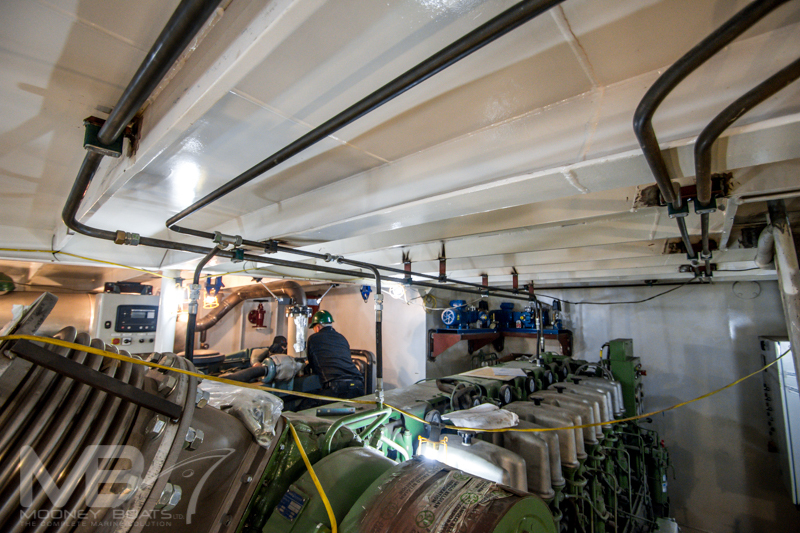 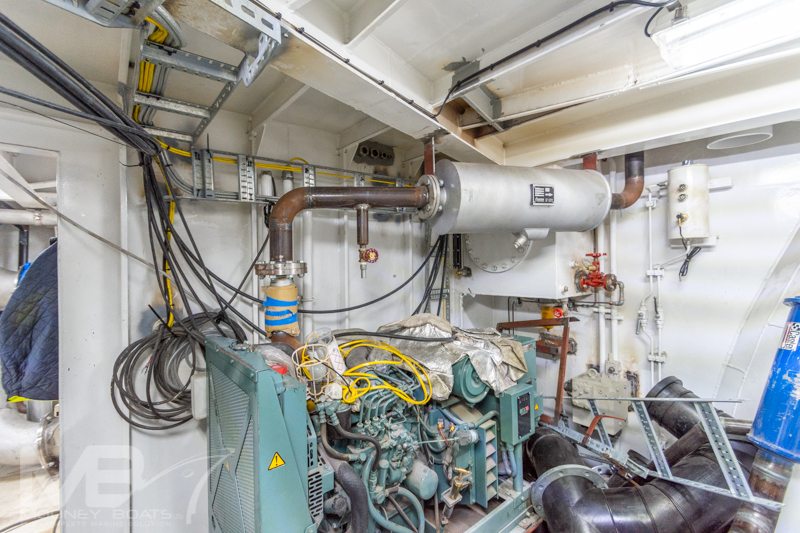 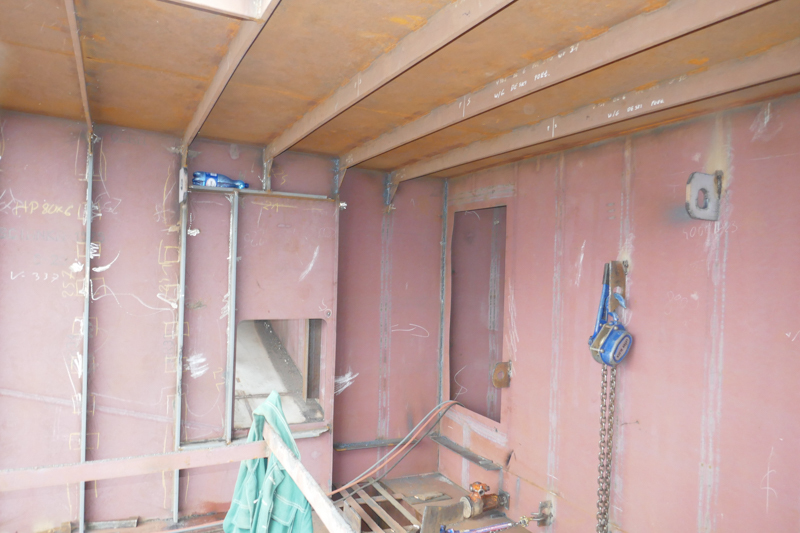 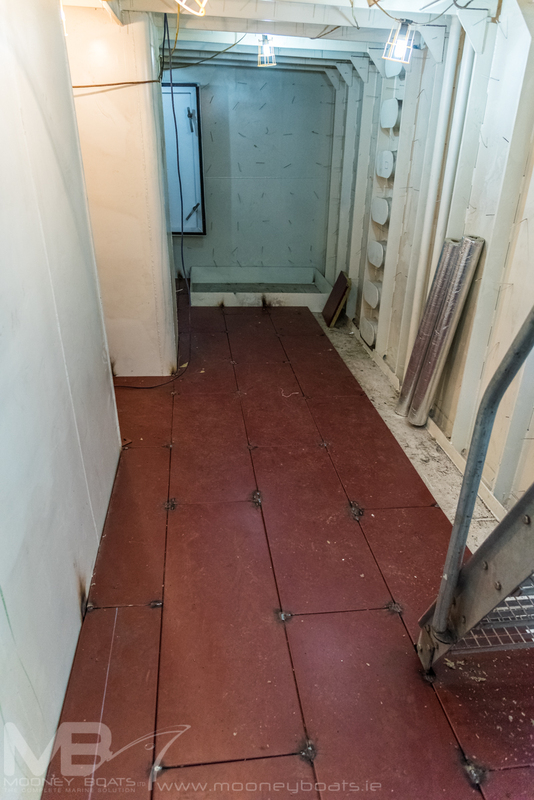 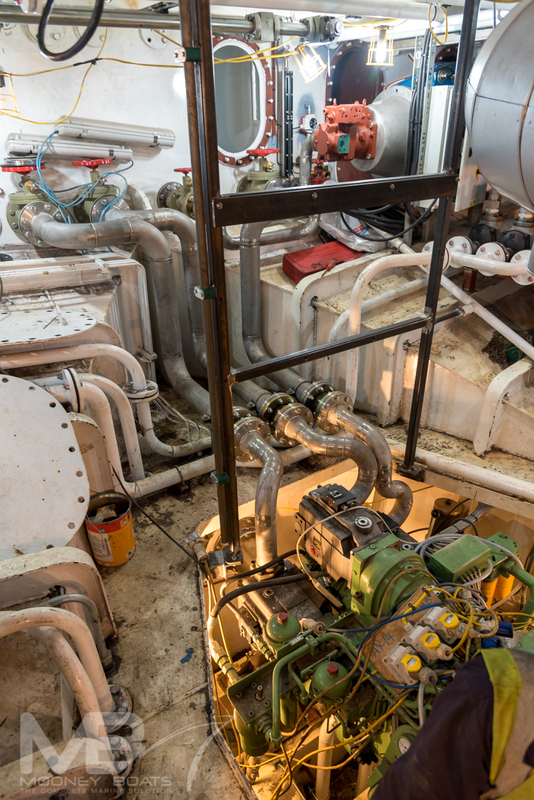 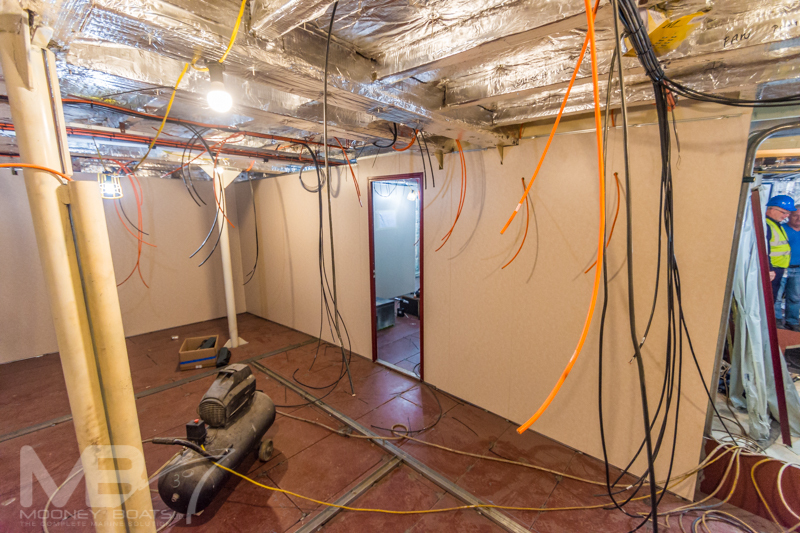 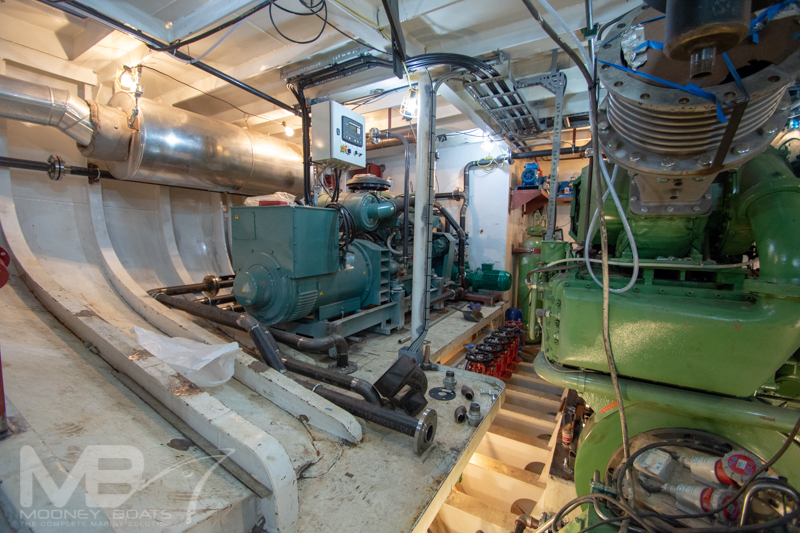 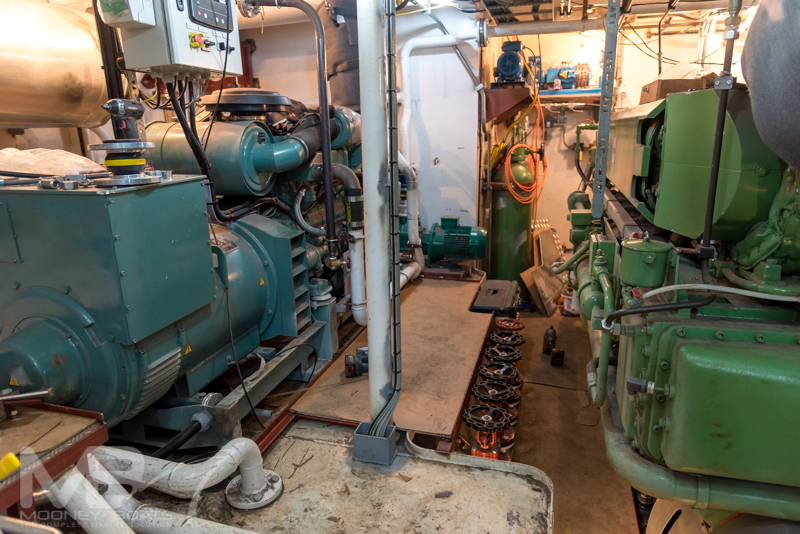 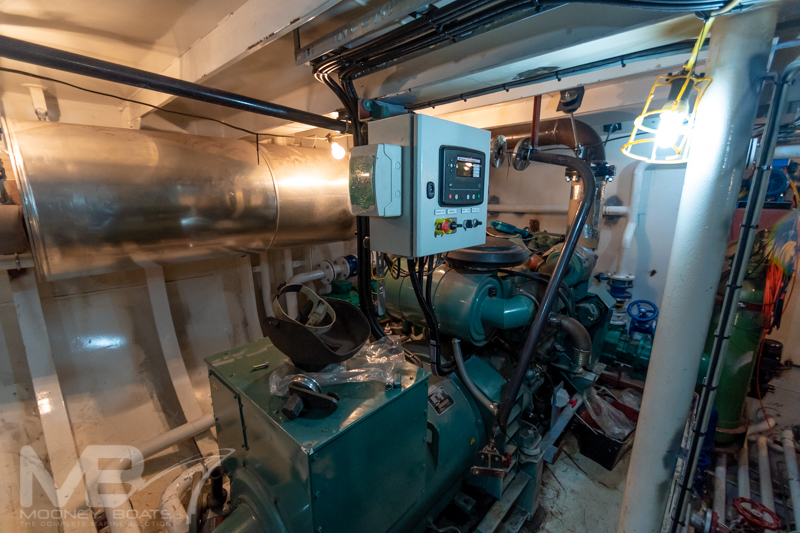 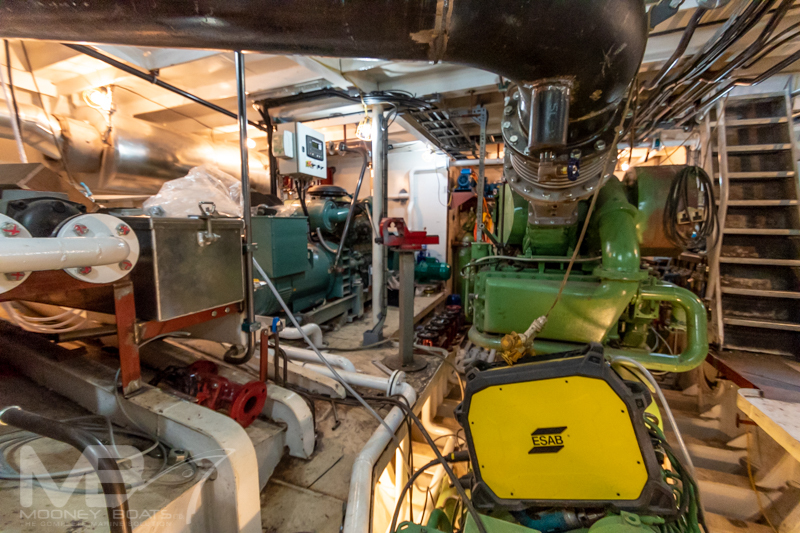 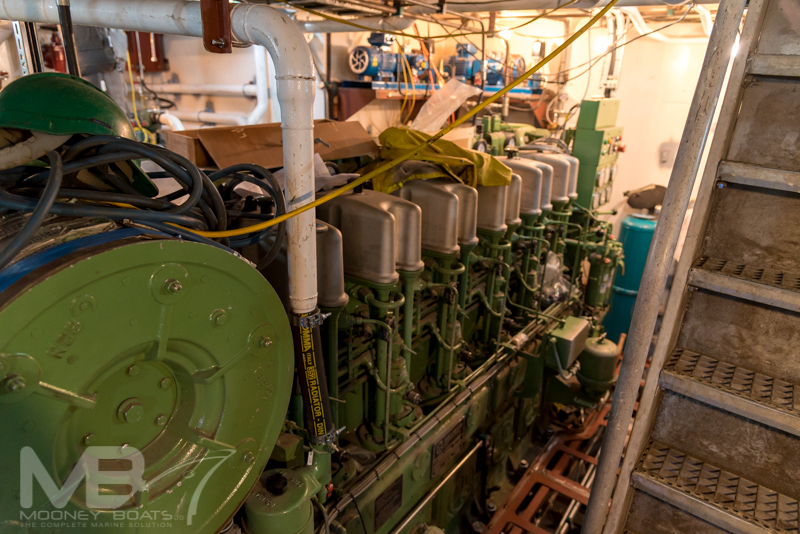 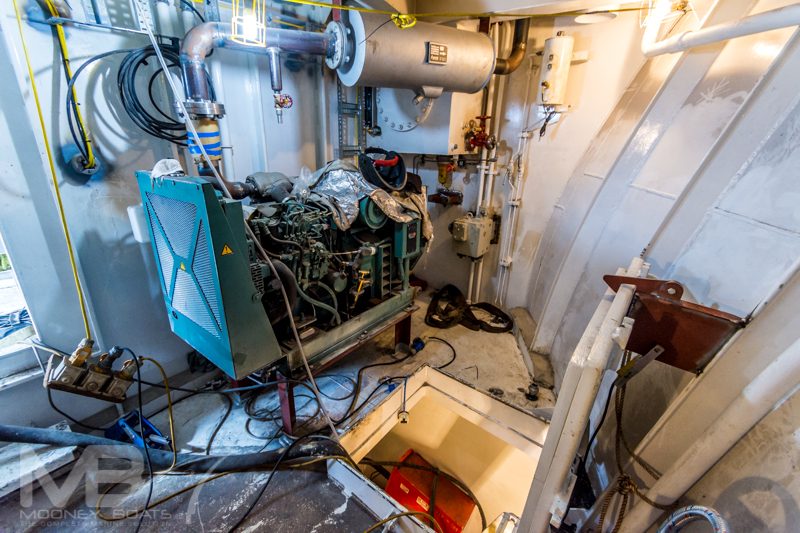 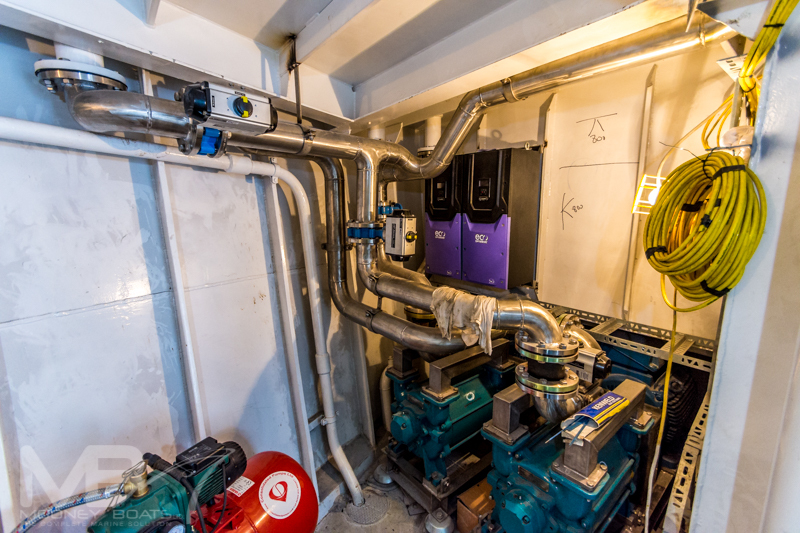 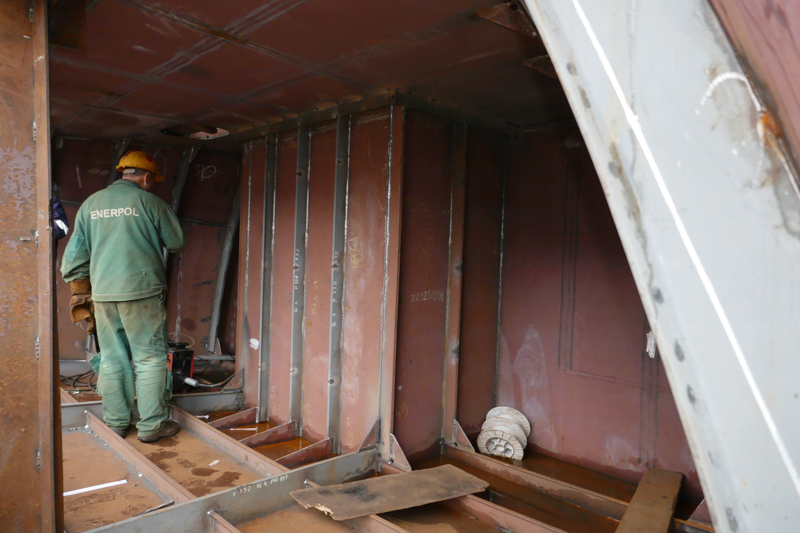 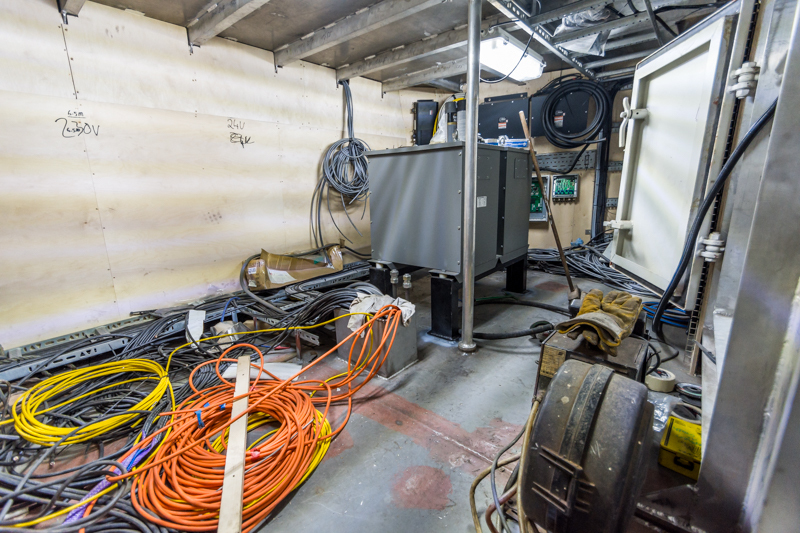 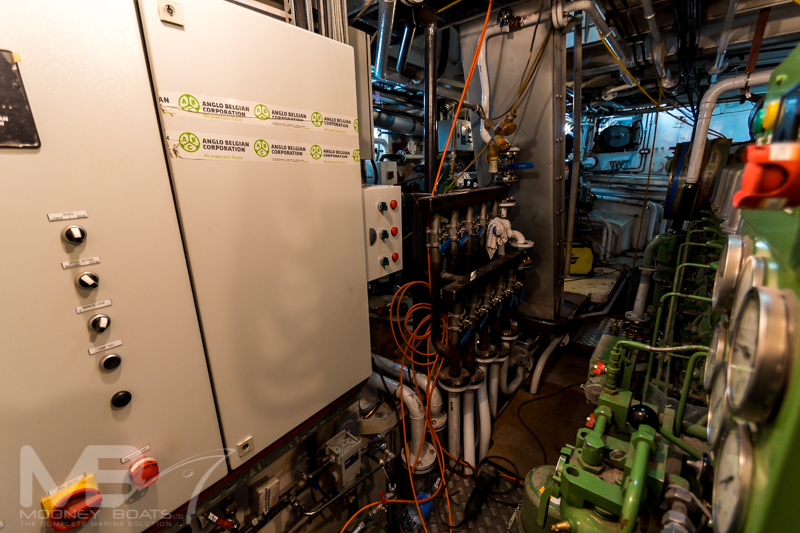 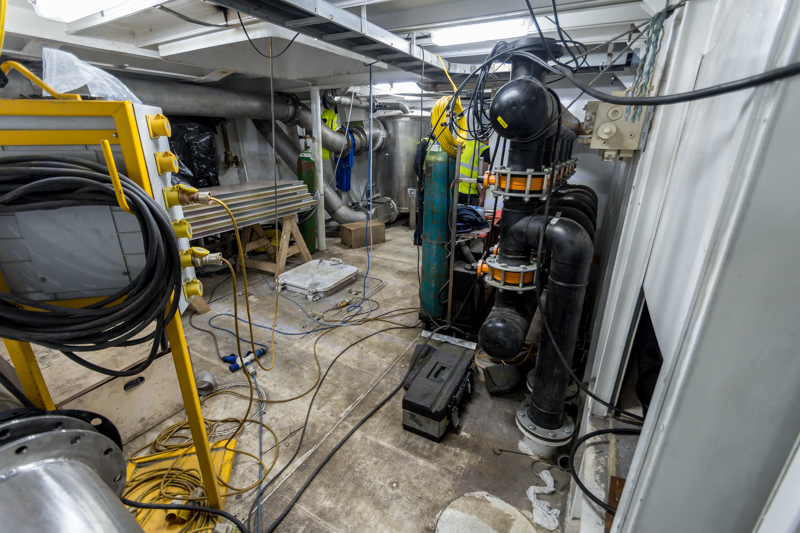 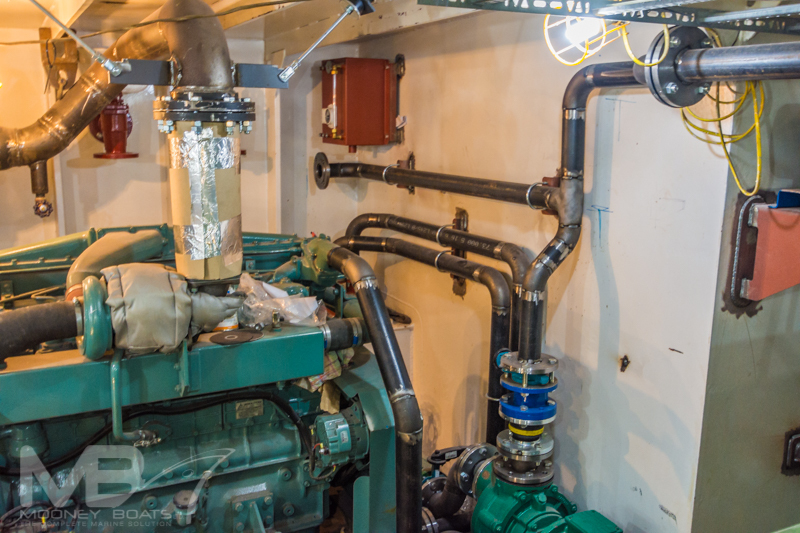 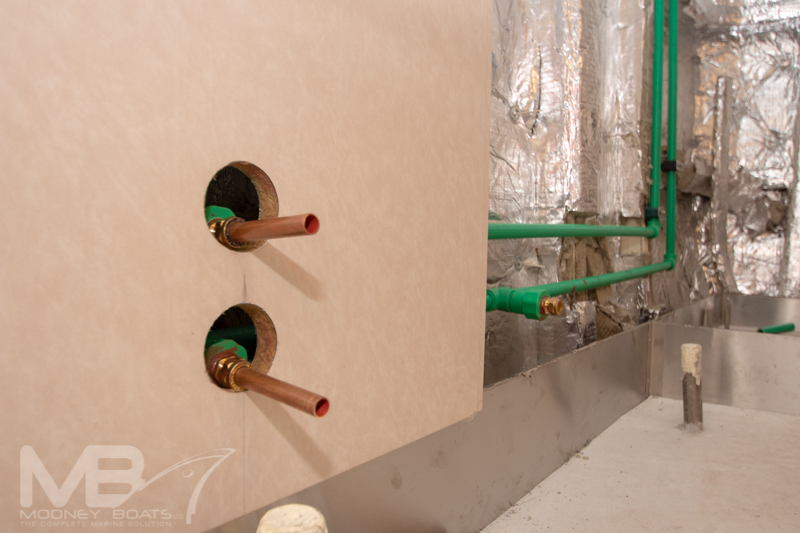 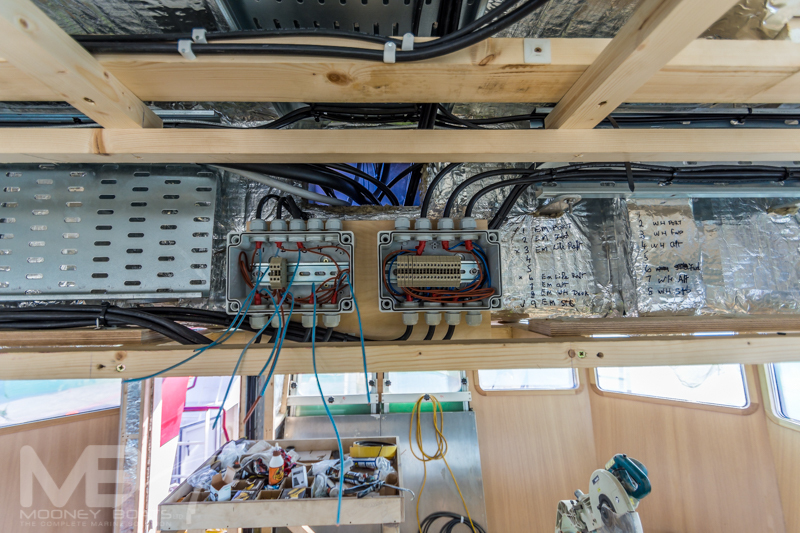 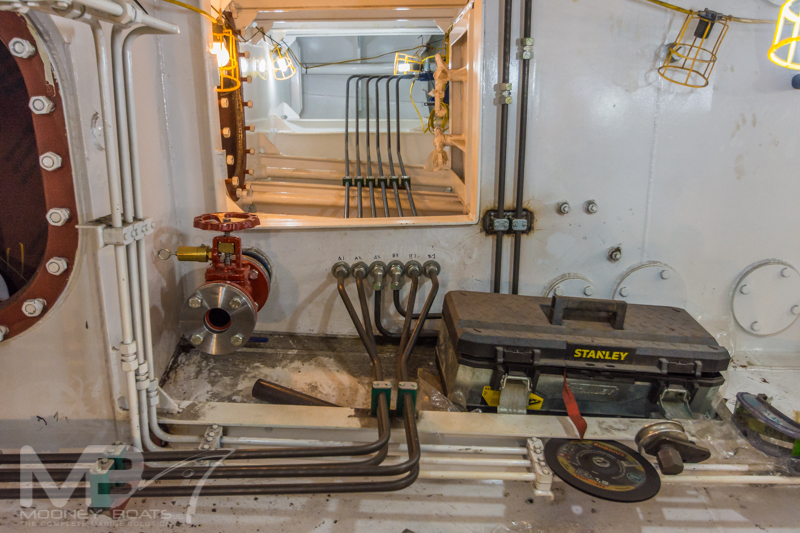 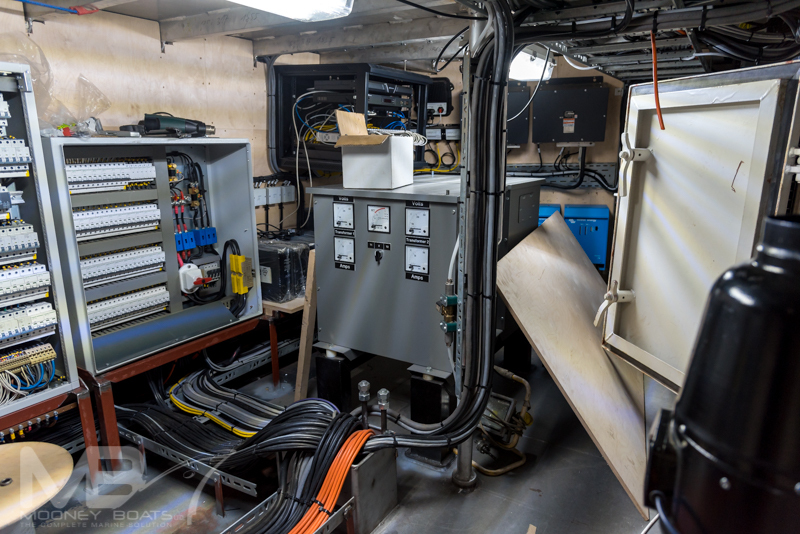 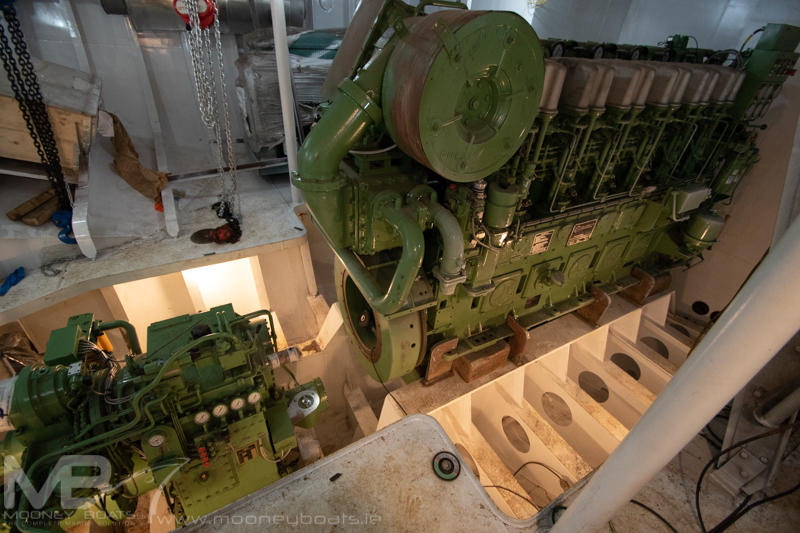 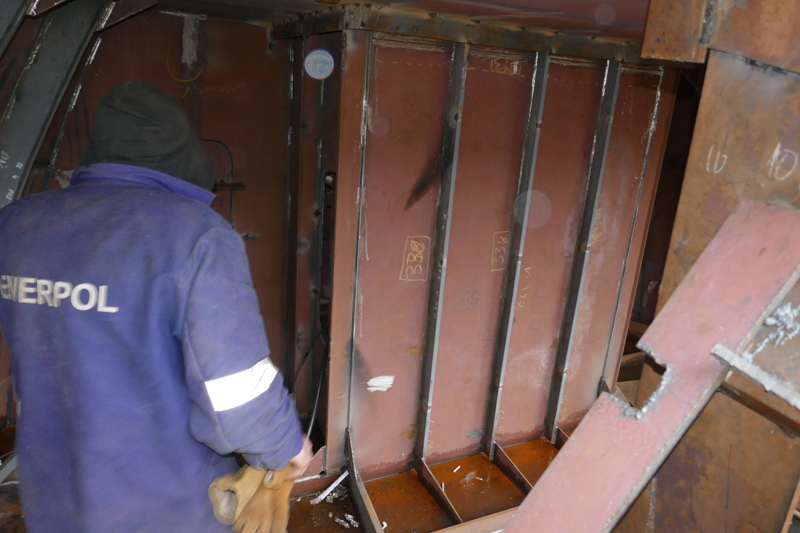 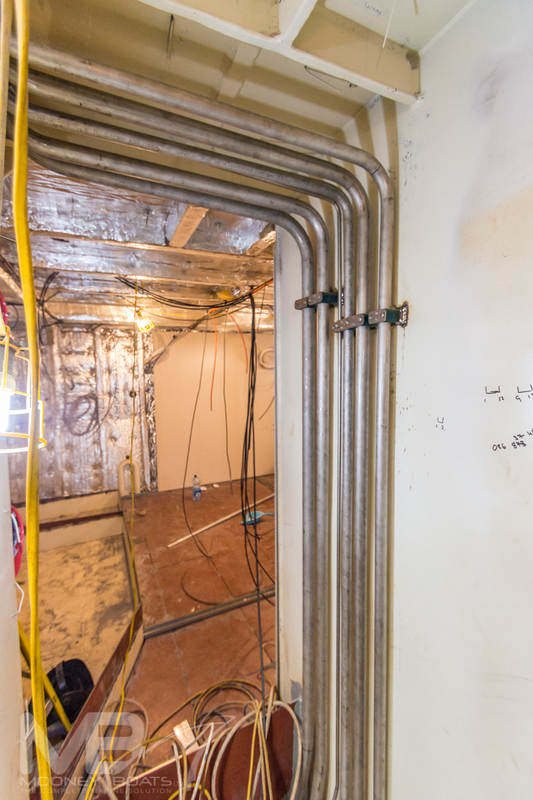 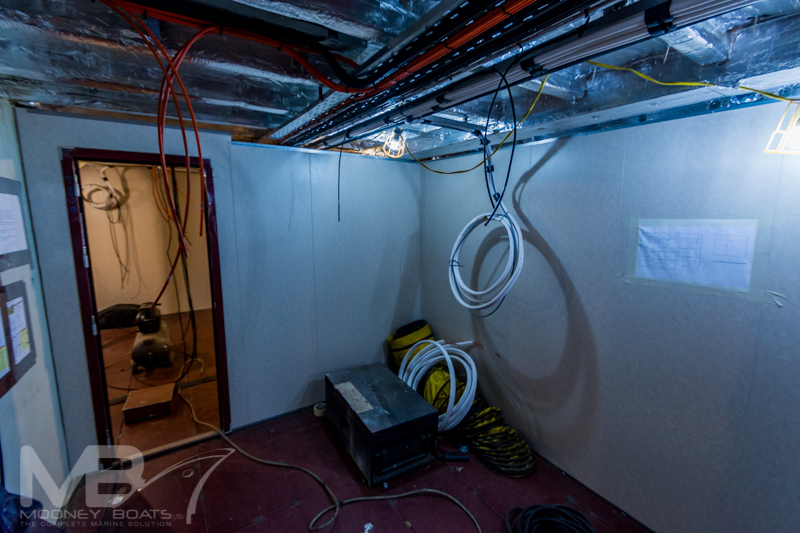 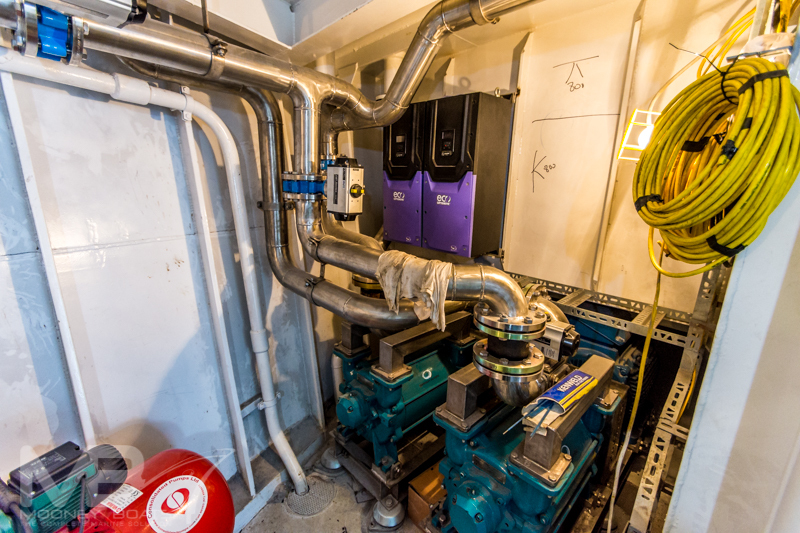 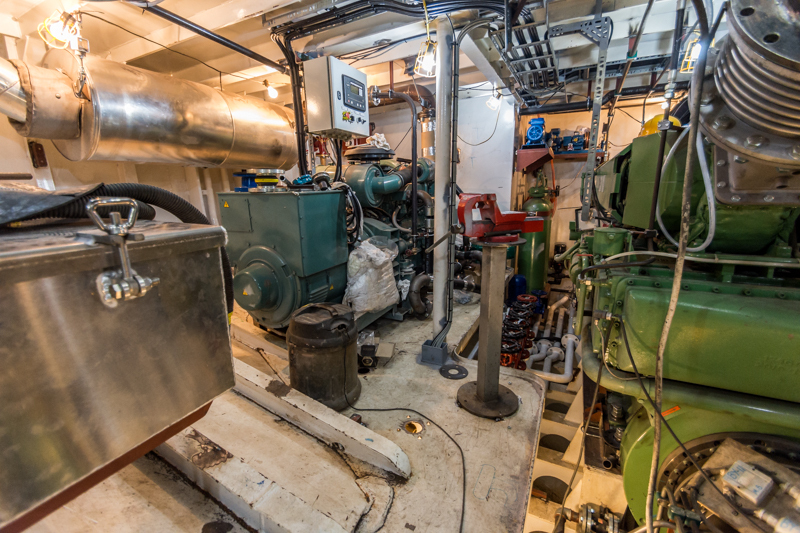 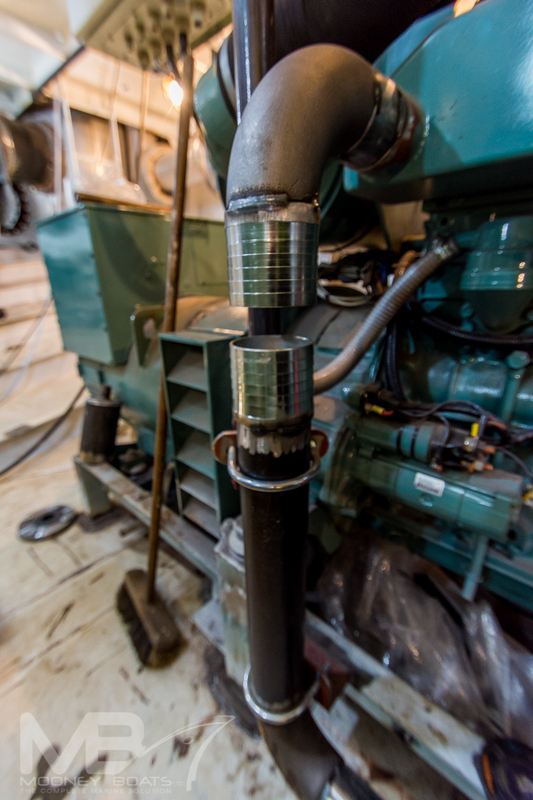 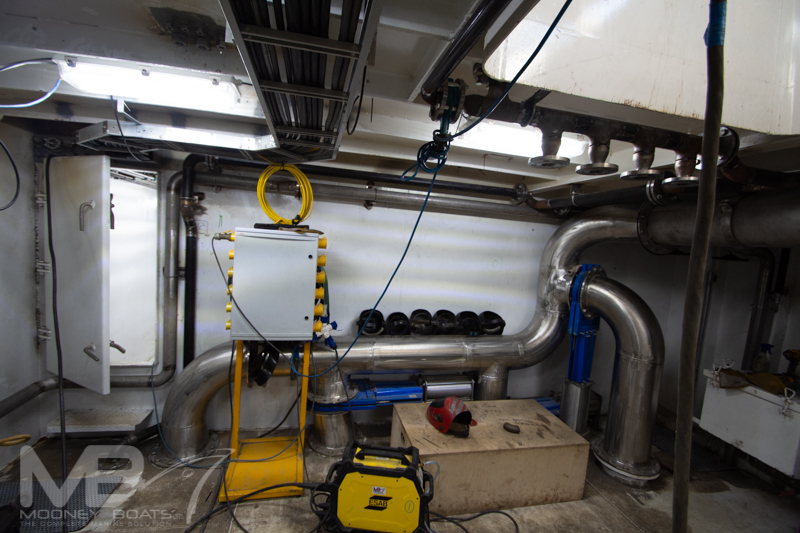 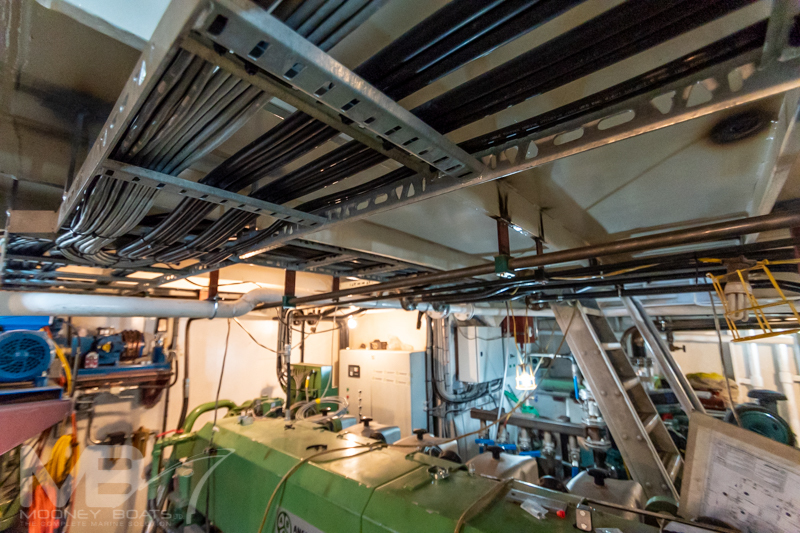 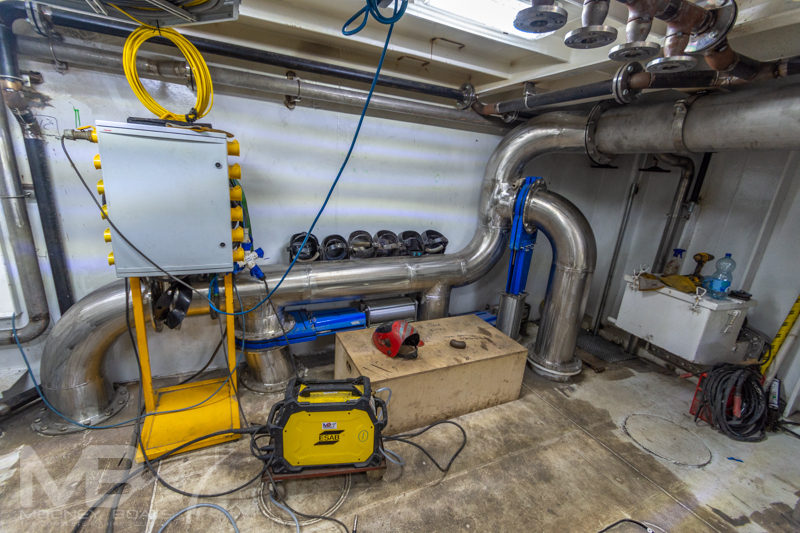 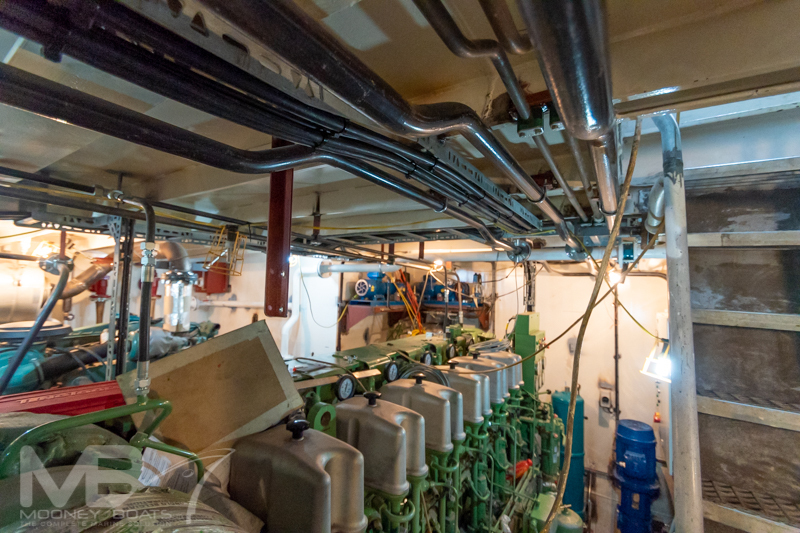 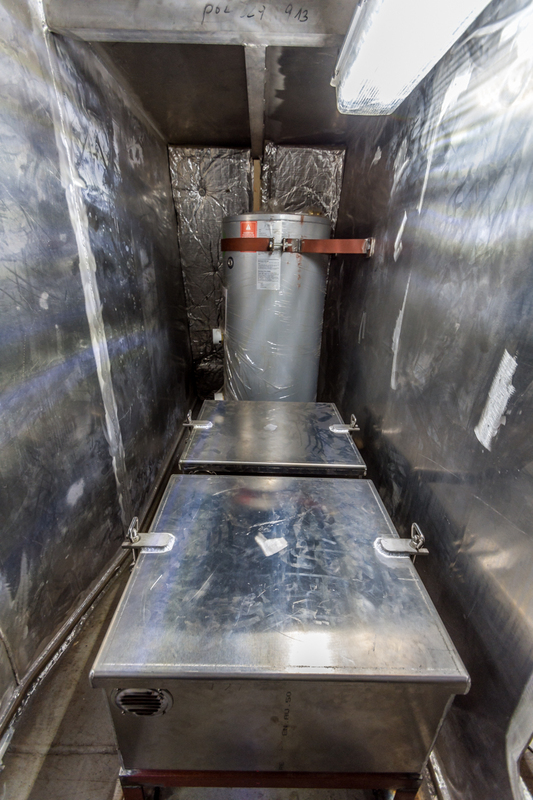 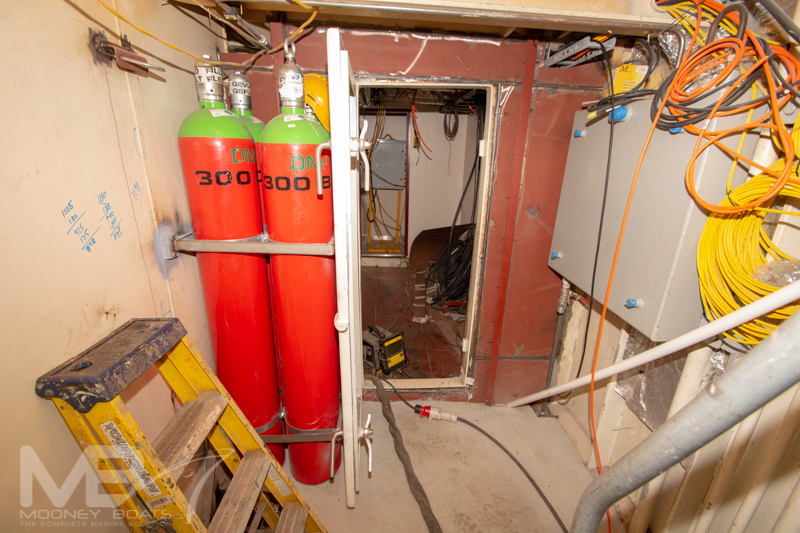 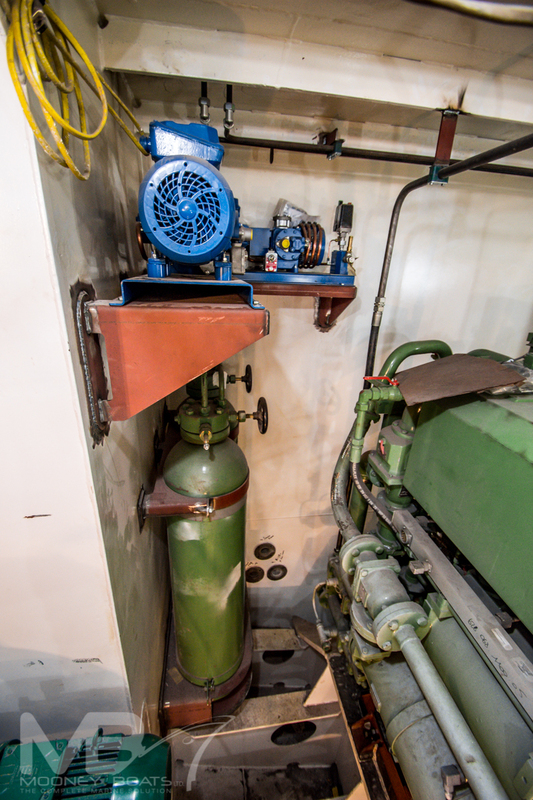 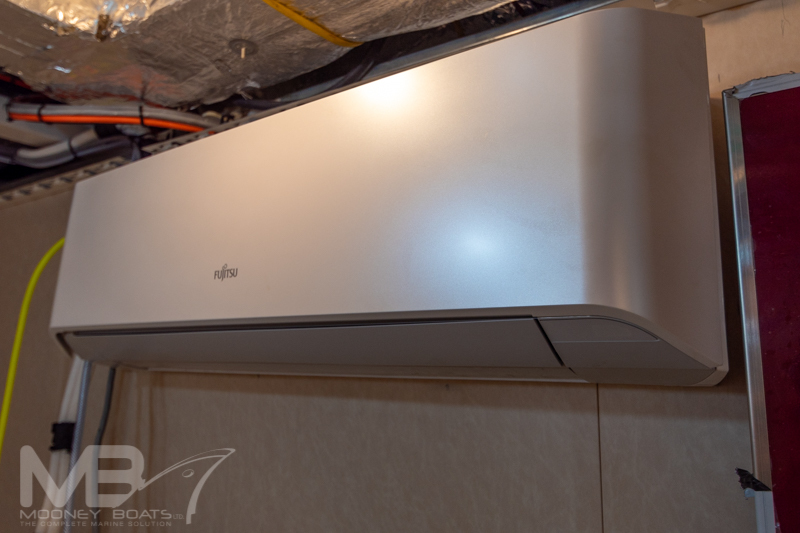 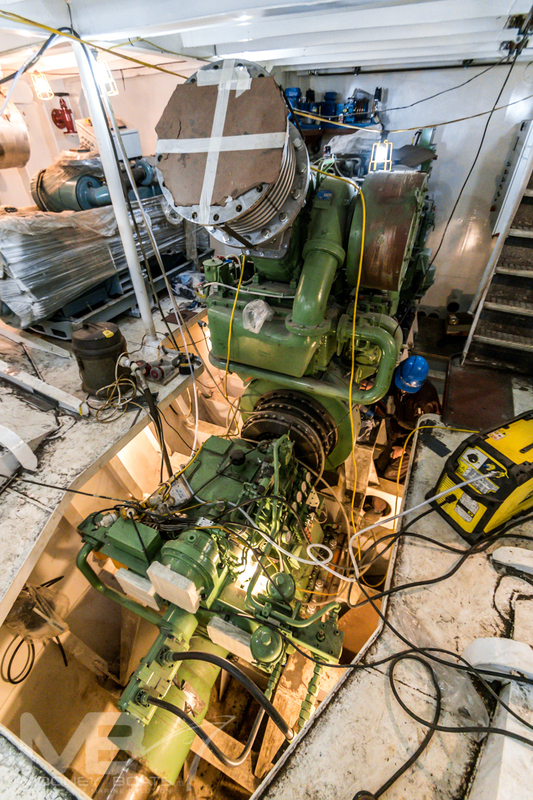 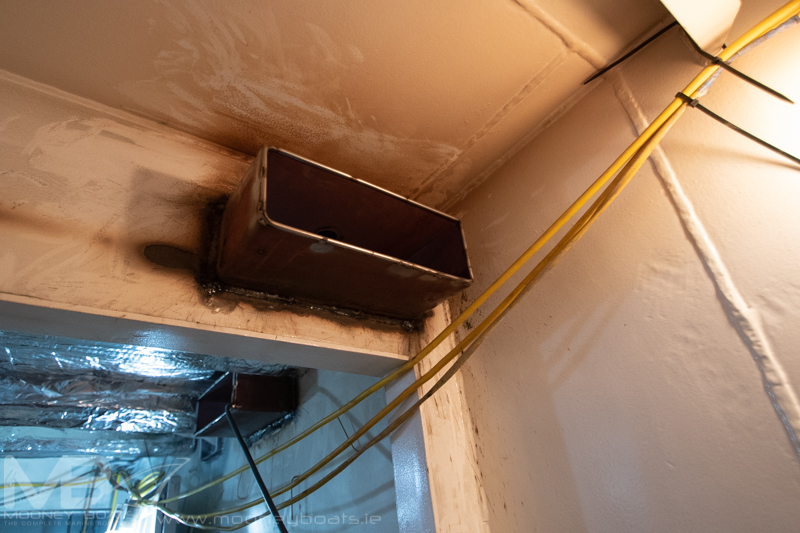 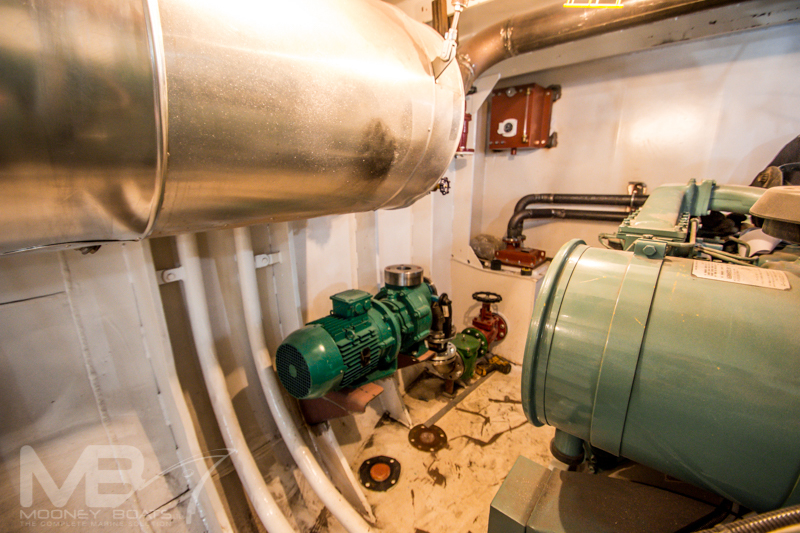 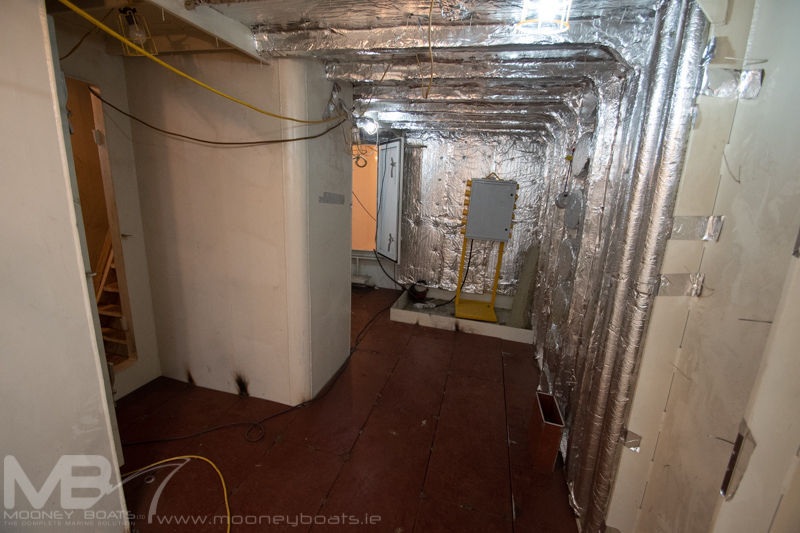 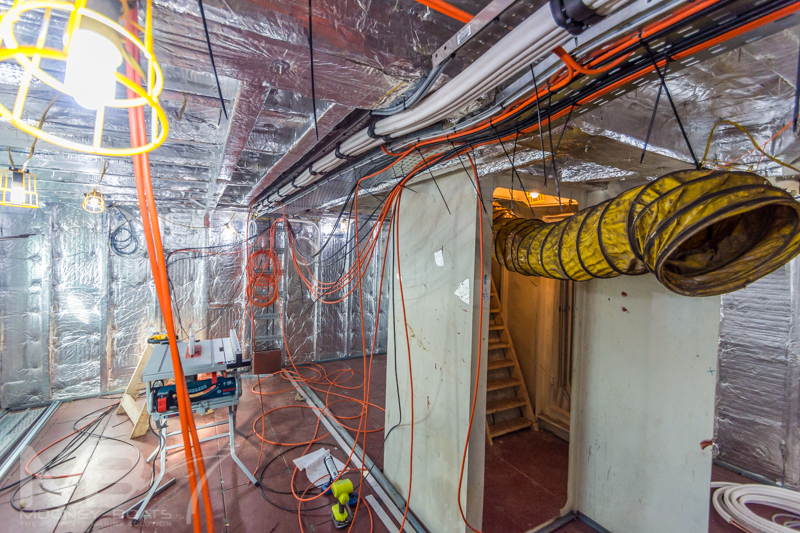 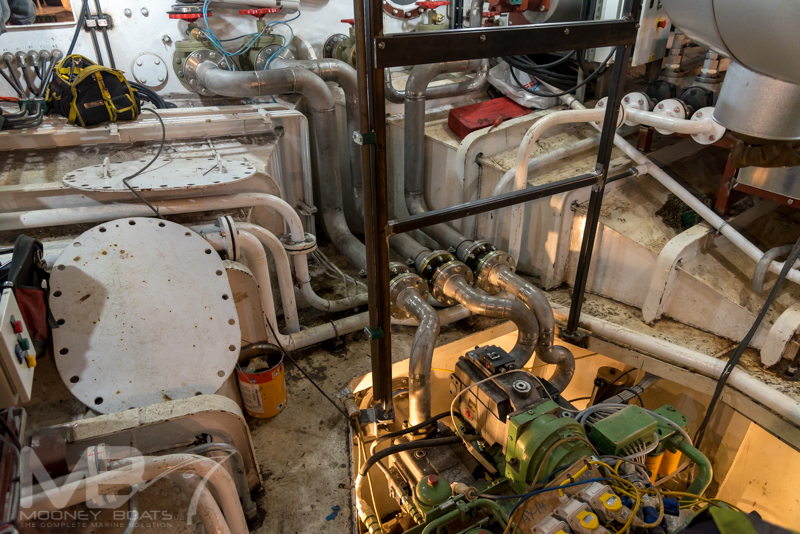 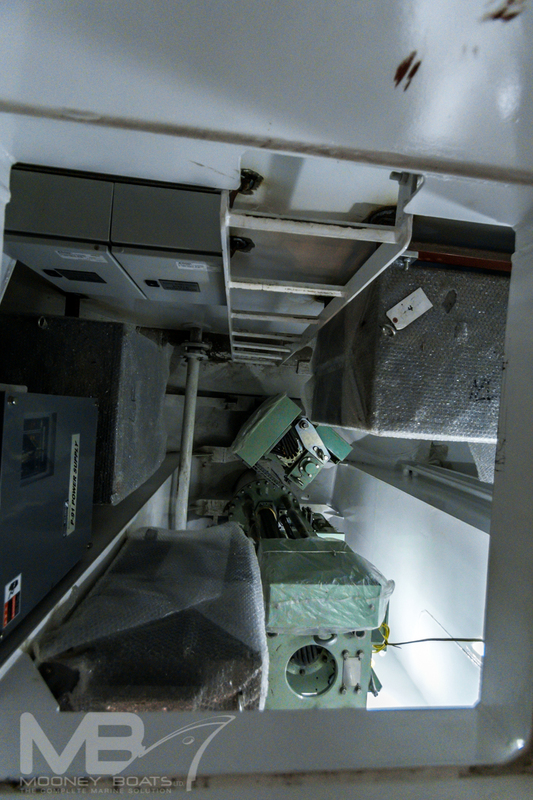 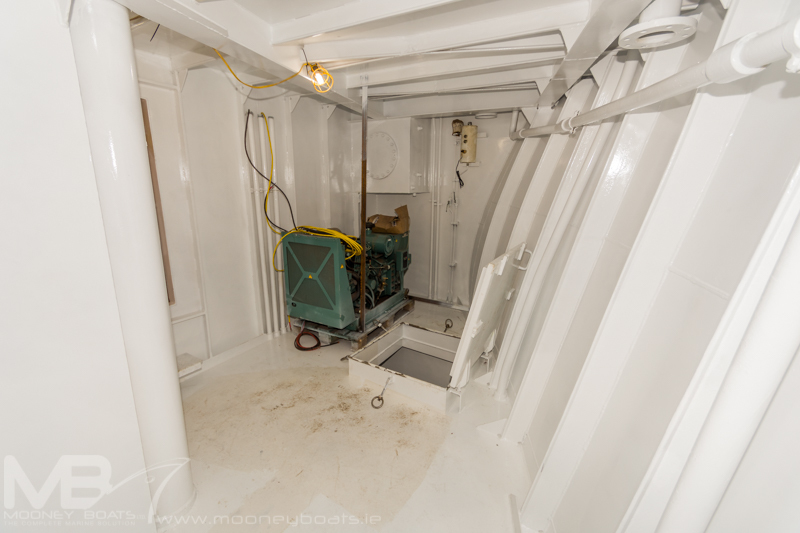 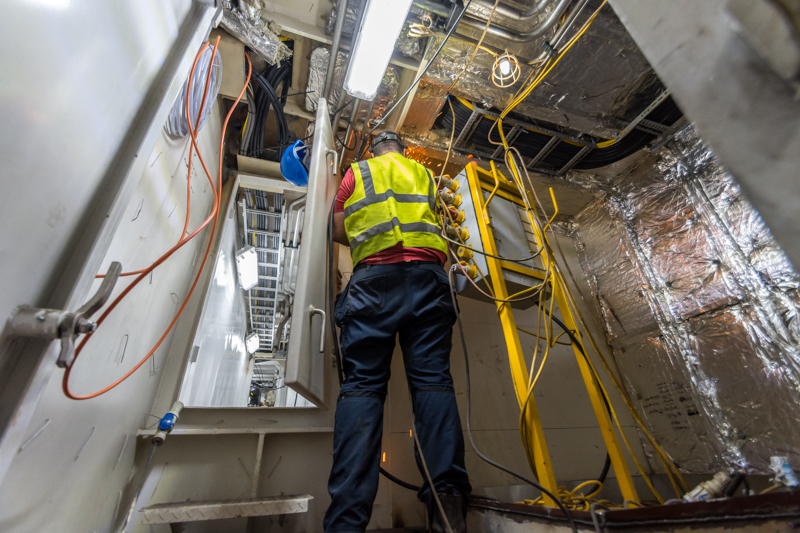 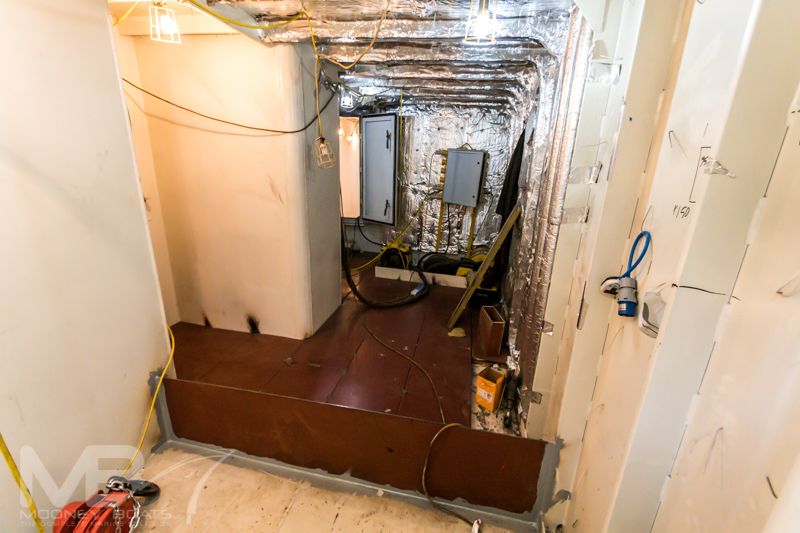 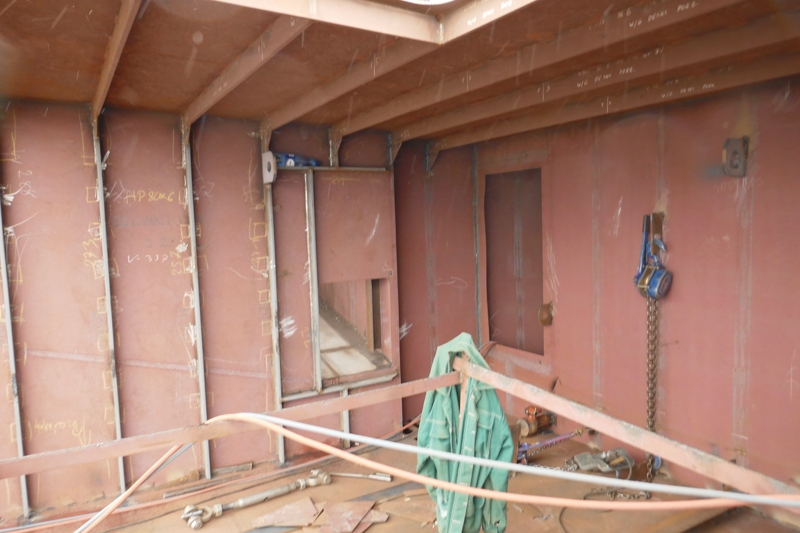 A third Shore Power Set which is a Mitsubishi S4SDT 40kva air cooled unit is fitted forward under the shelter deck forward in a separate room on the starboard side of the vessel. 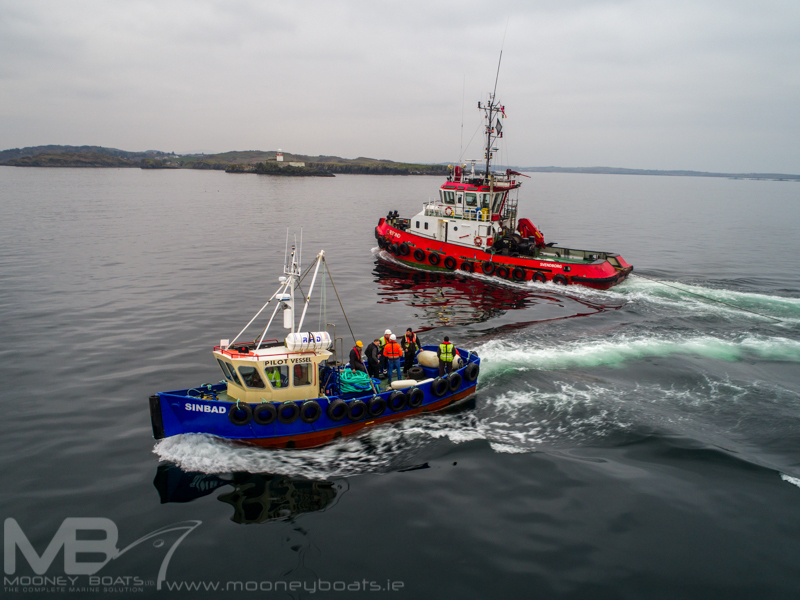 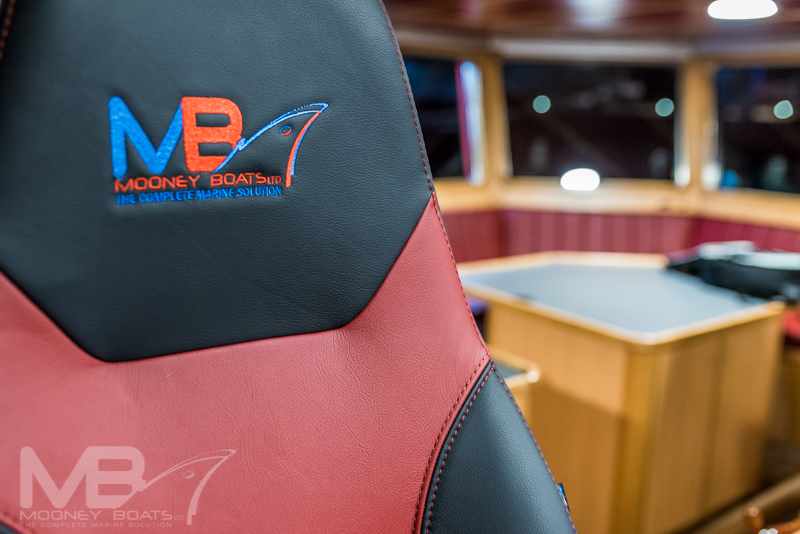 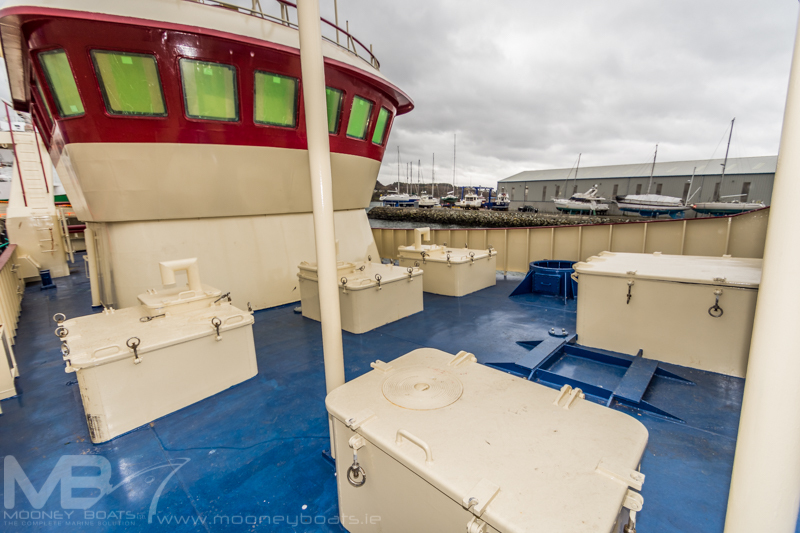 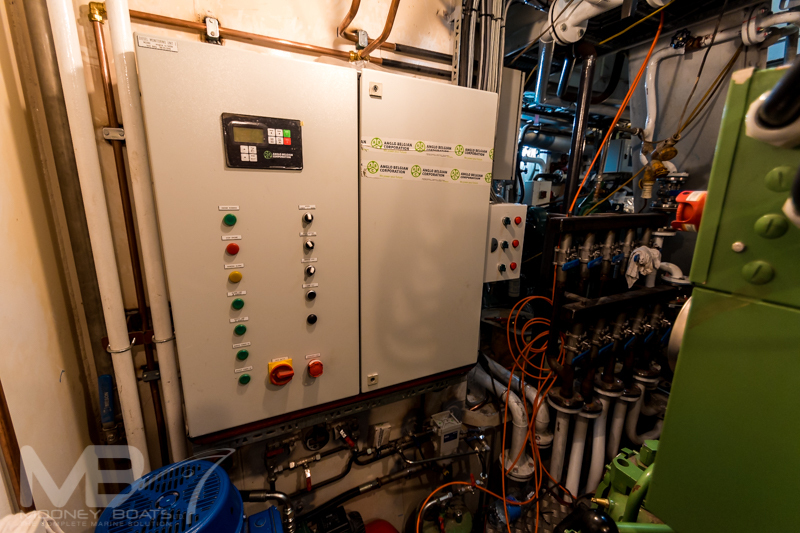 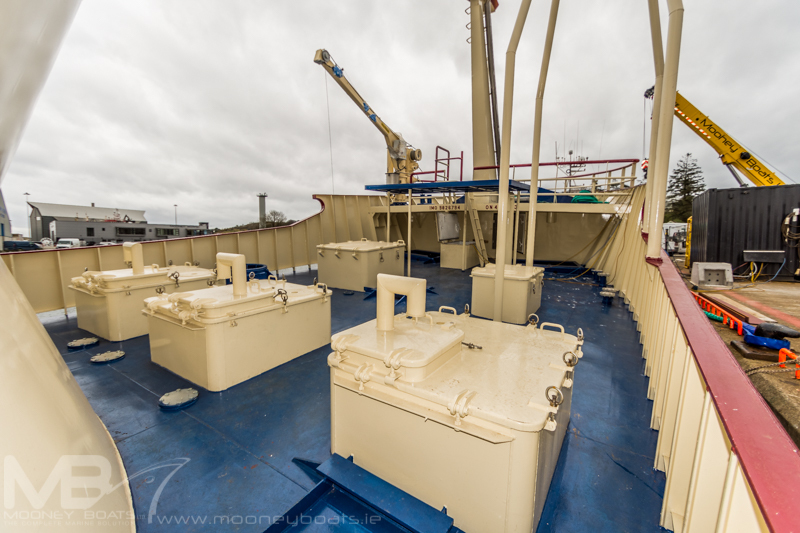 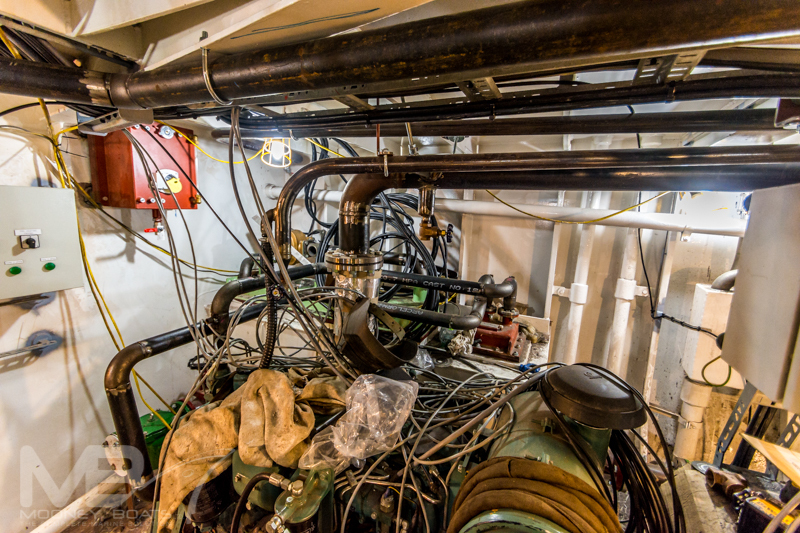 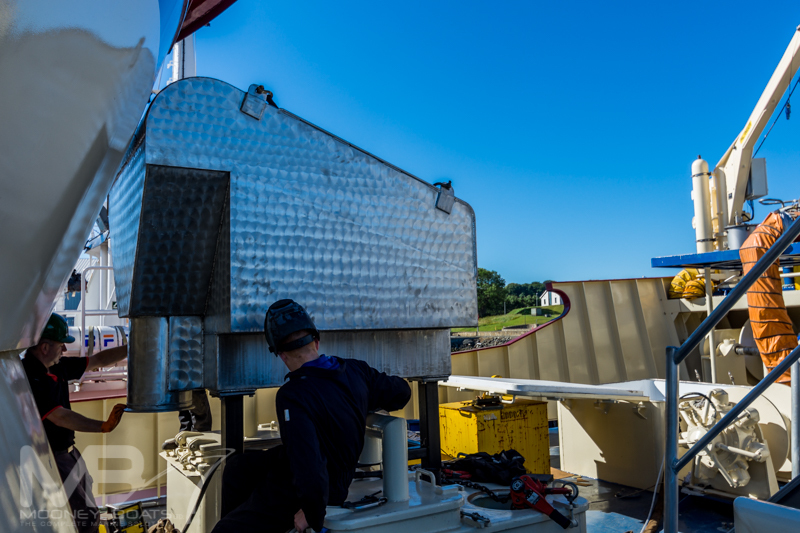 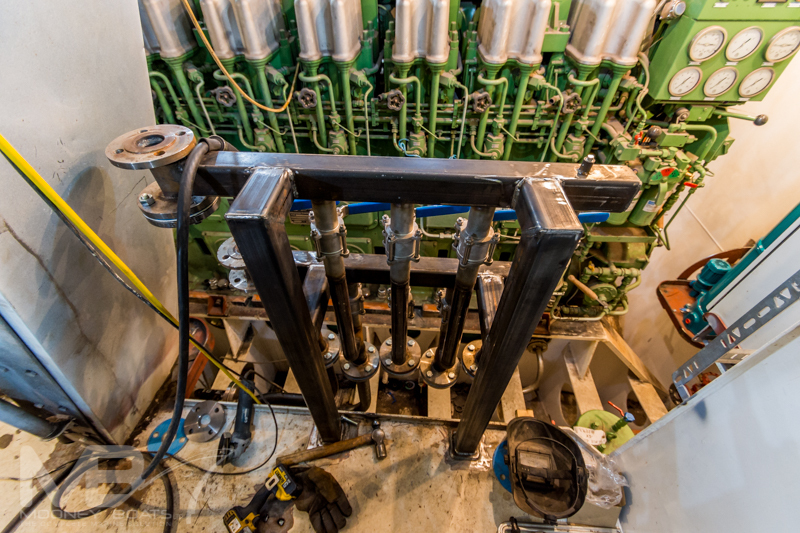 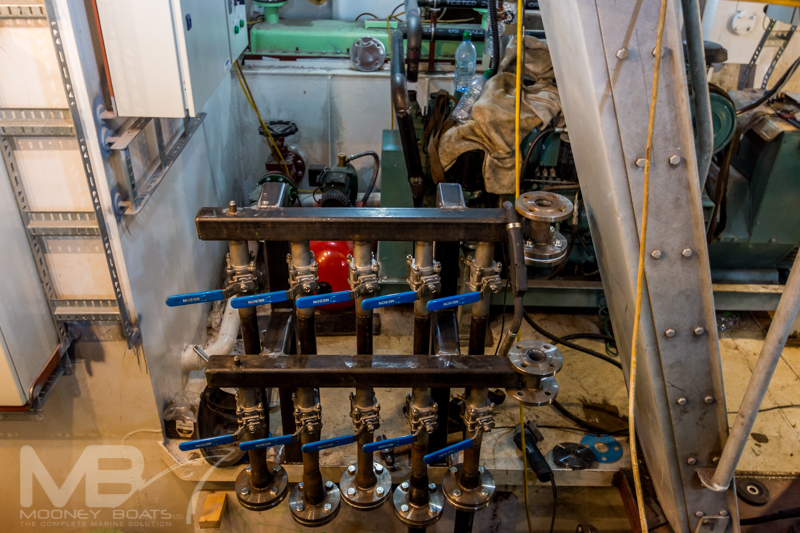 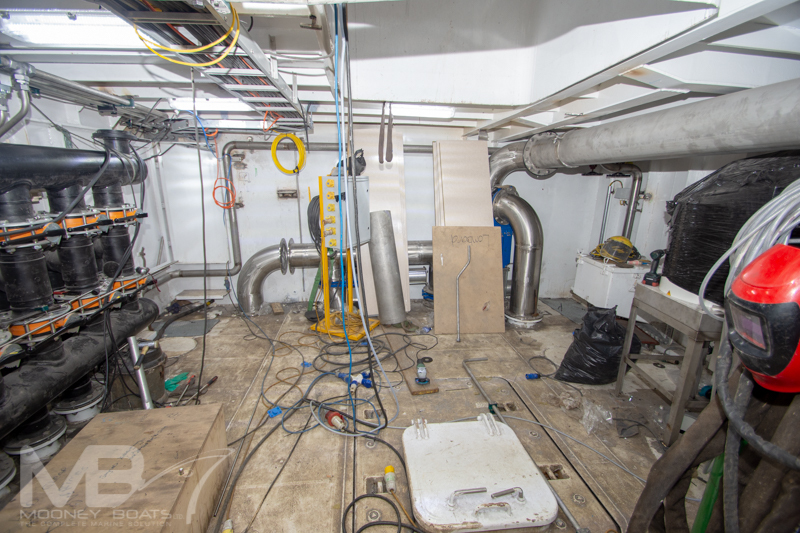 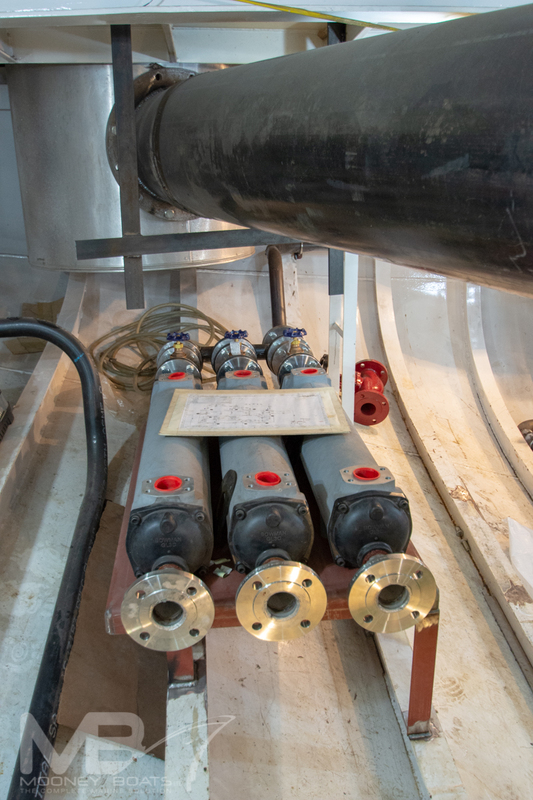 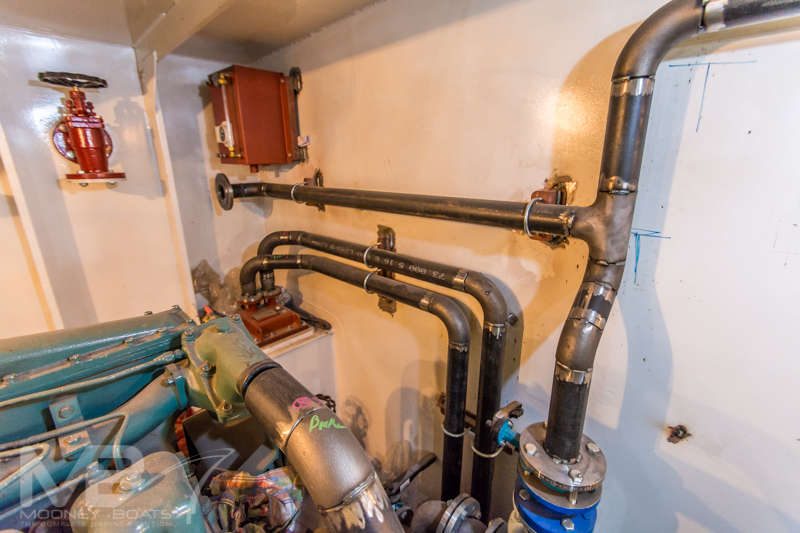 The installation of all engines on the vessel was carried out by Mooney Boats Ltd engineers this included the lining, fitting box coolers, pipework systems, exhaust system, electrical system, fuel oil systems etc. 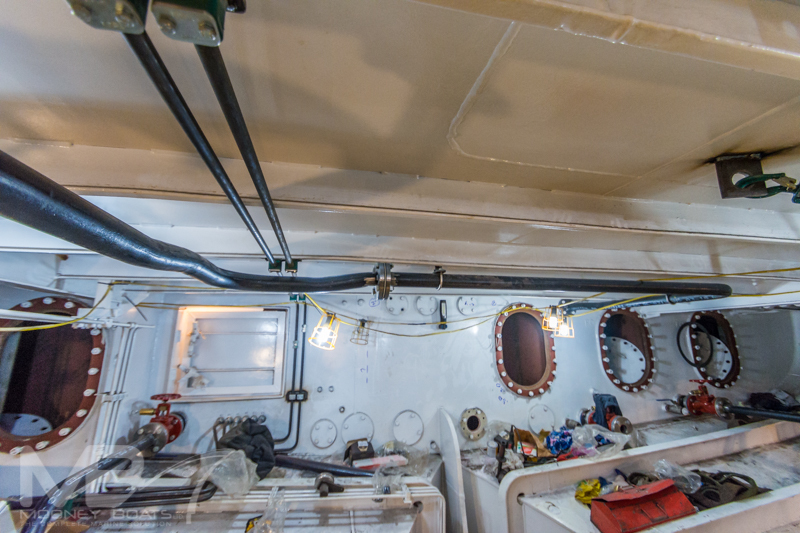 The bilge system, firefighting, hydraulic cooling water system, fuel oil systems etc. 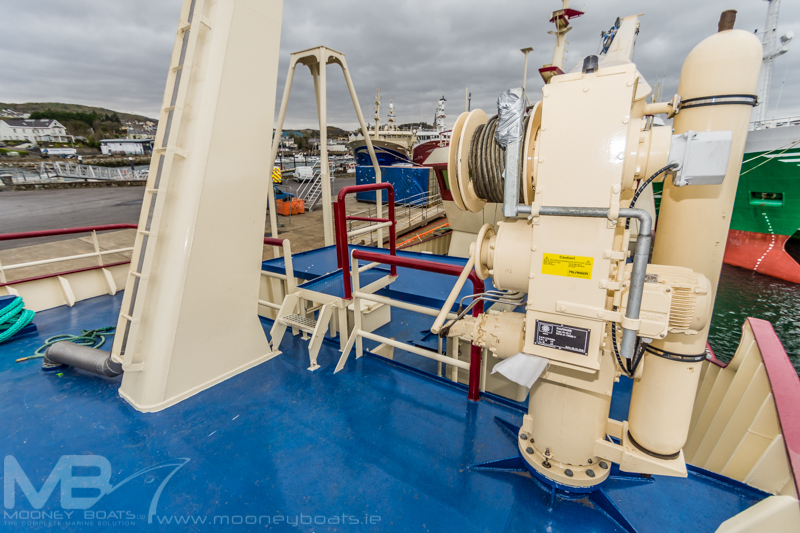 were all supplied and installed by Mooney boats Ltd engineers and consisted of the following pumps. 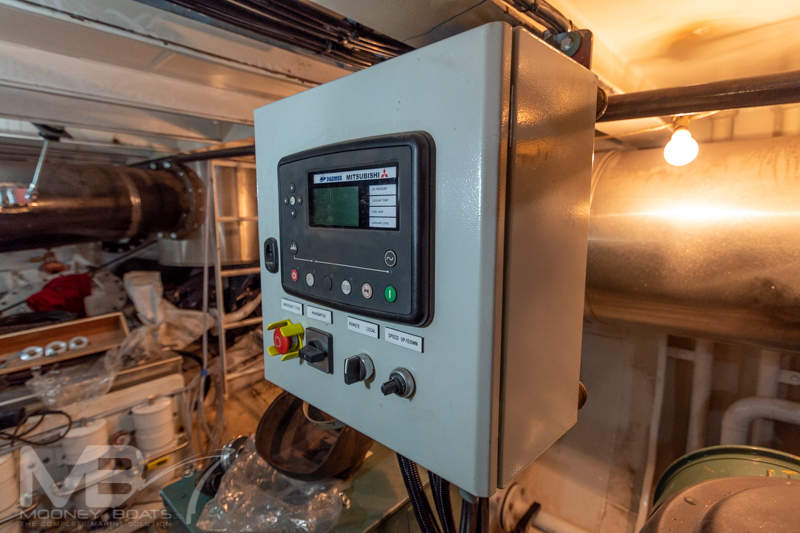 CJC Lube oil filter unit. 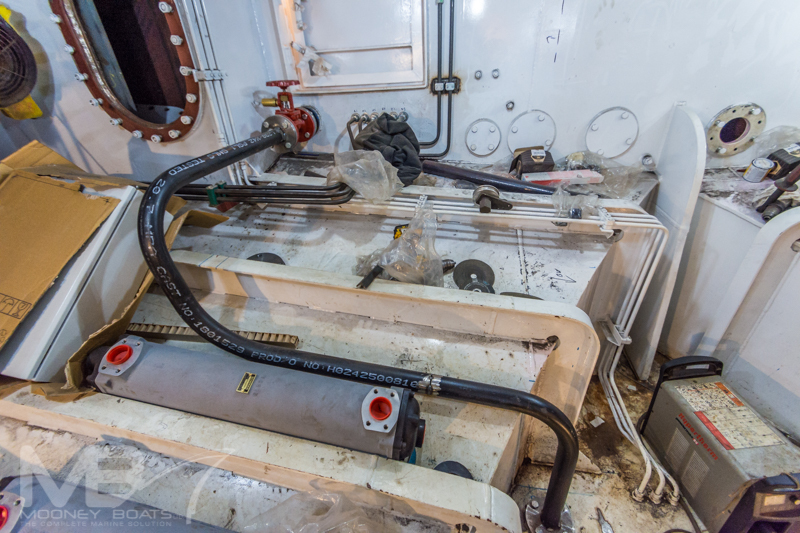 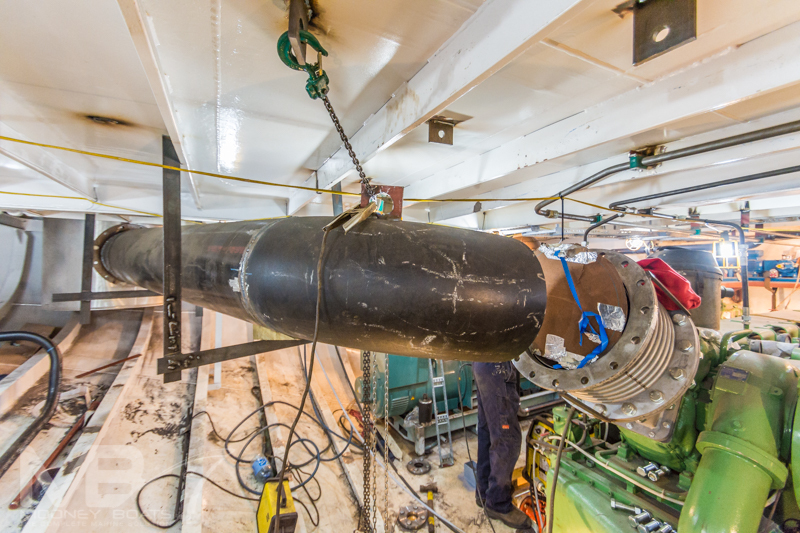 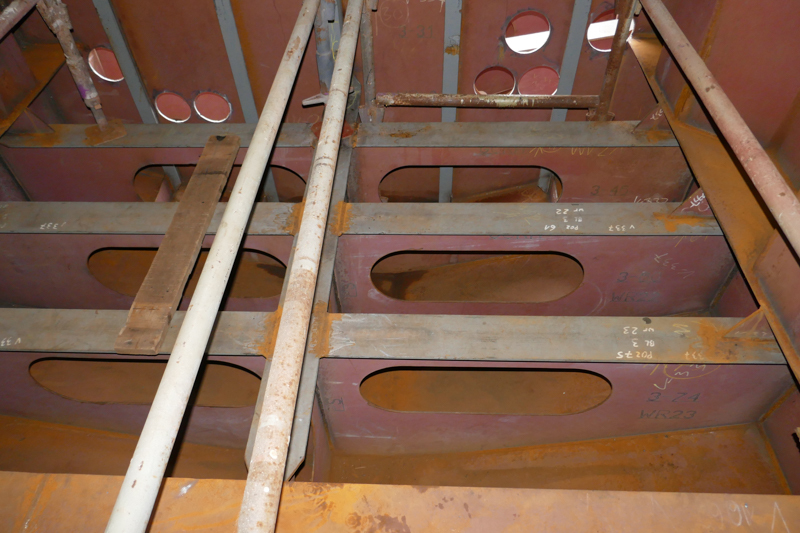 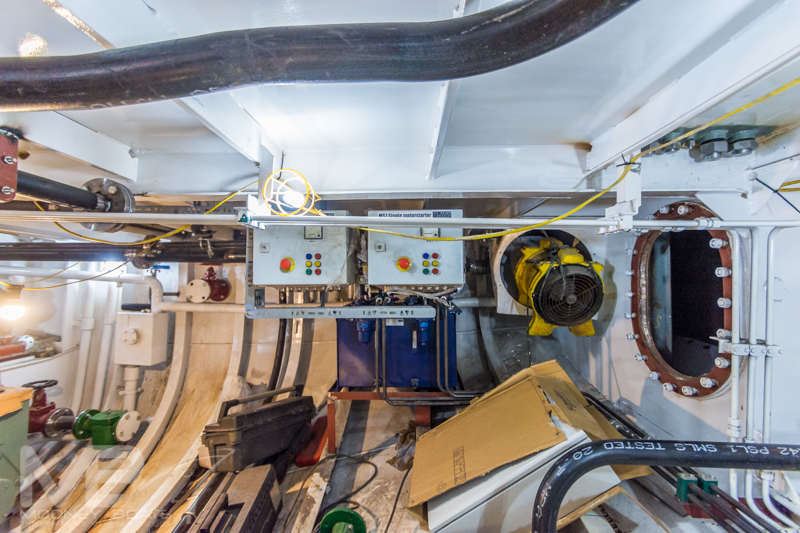 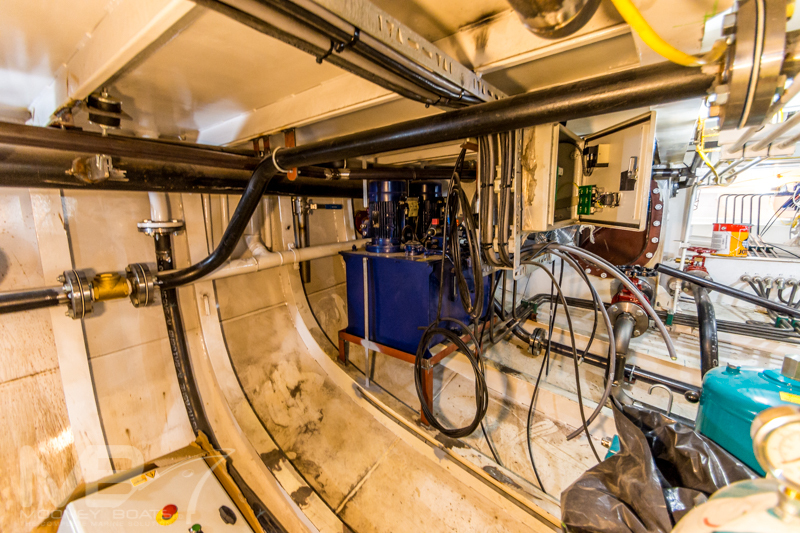 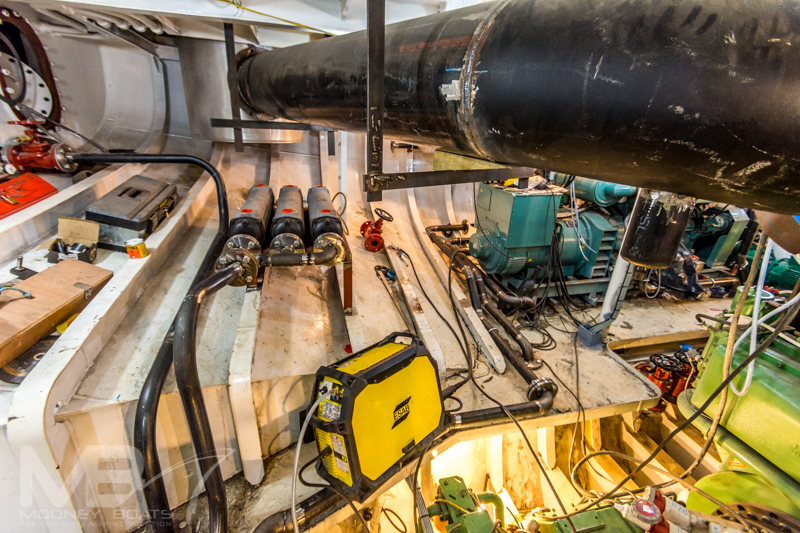 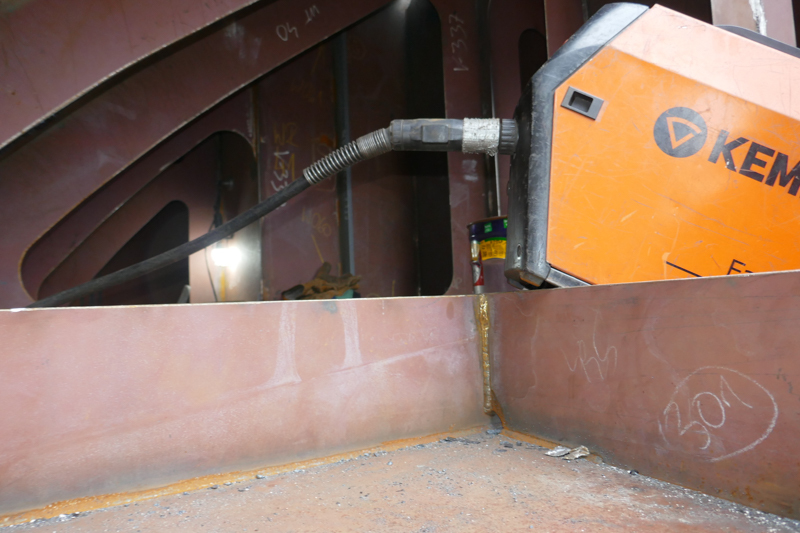 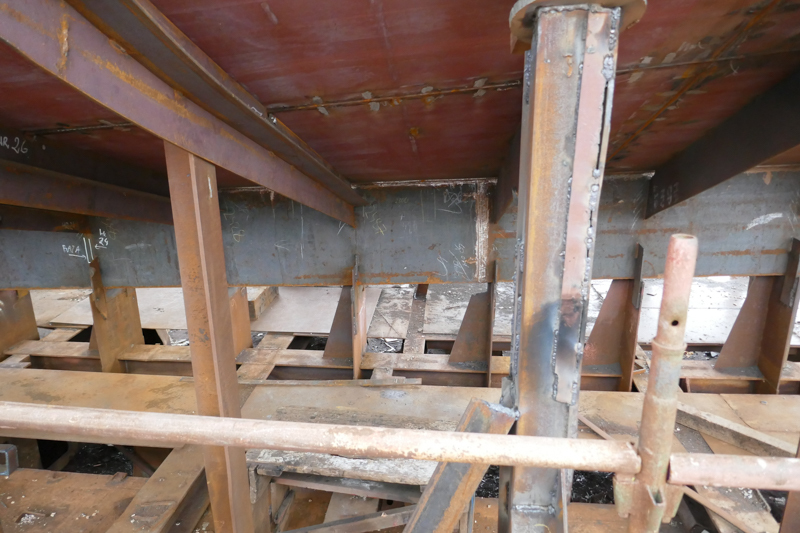 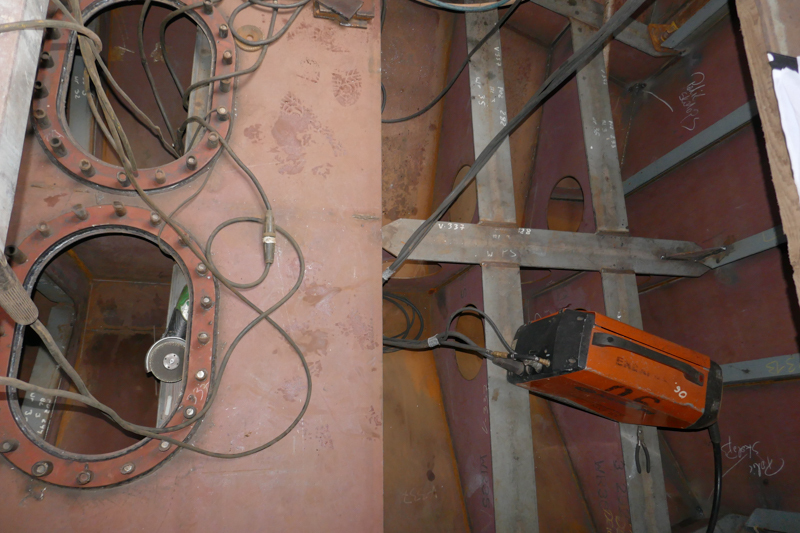 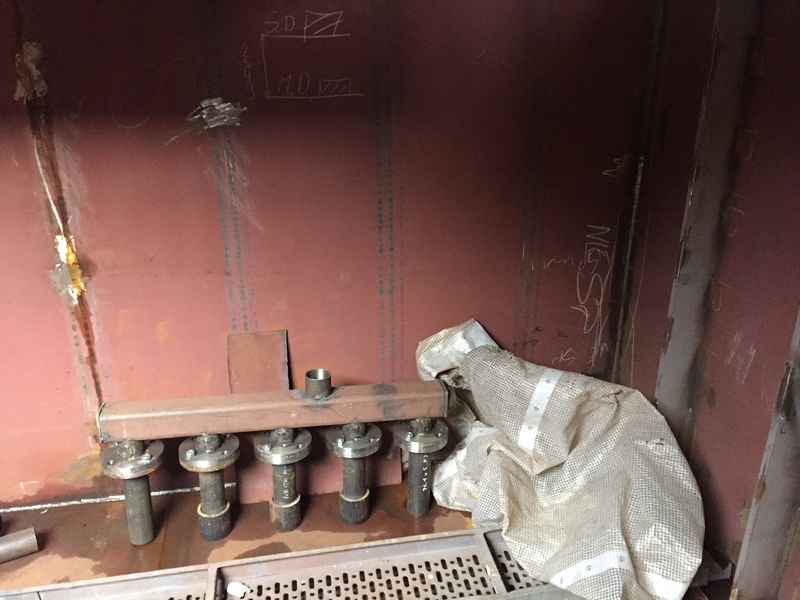 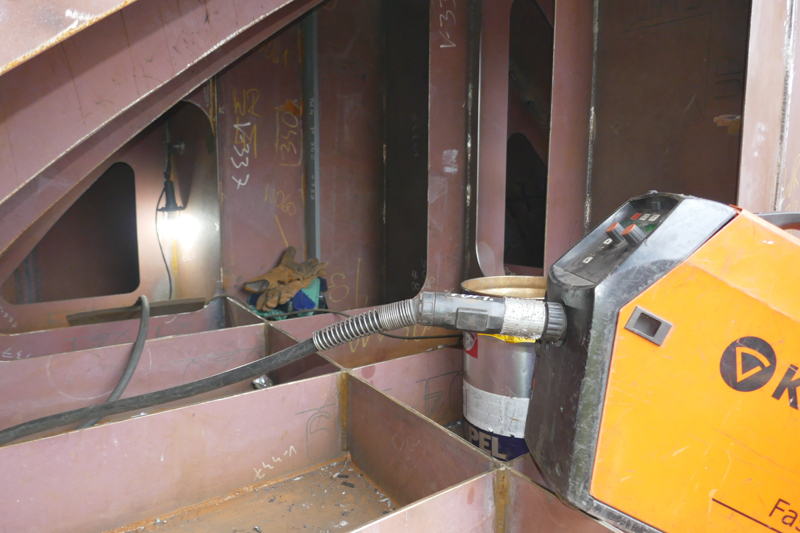 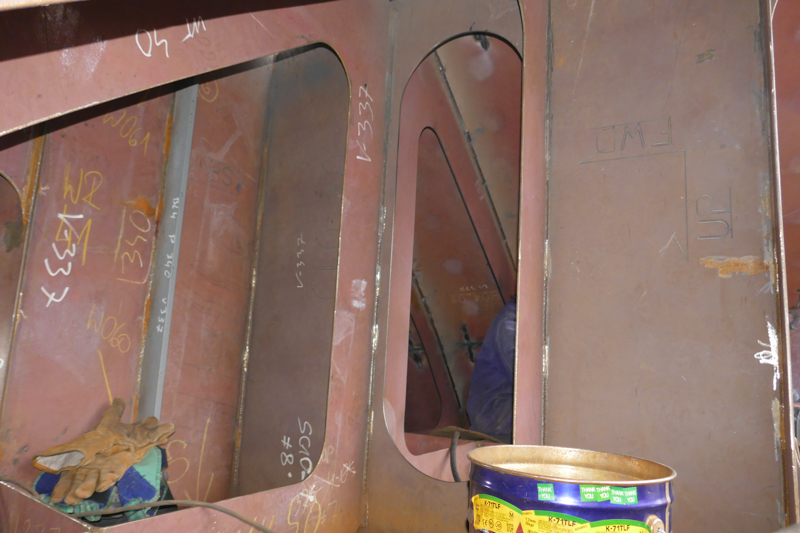 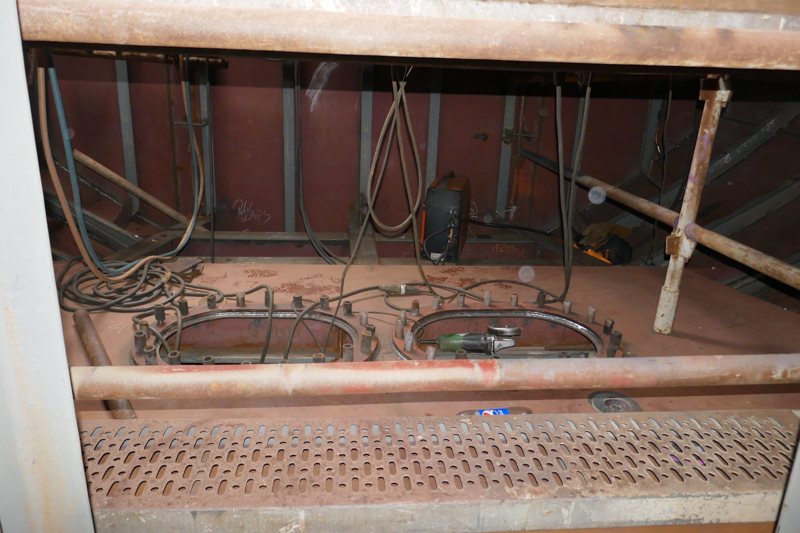 The hydraulic steering system on the vessel was supplied by AS Scan Model MT2500 Steering and installed by the yards engineers and consists of the following all located in the engineroom and steering flat. 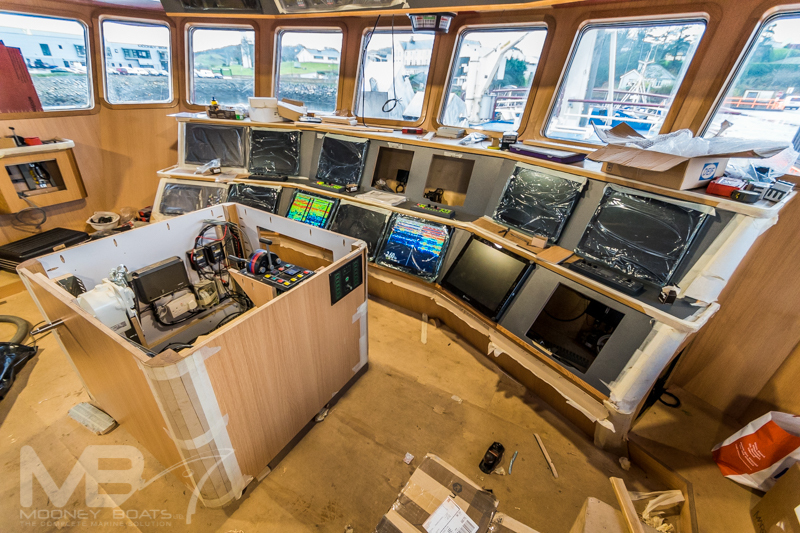 The steering system is fitted with 2 No electro hydraulic pumps, separate oil storage tank, two rams, 1 No hand wheel in wheelhouse, rudder angle indicators and 4 No control stations in the wheelhouse. 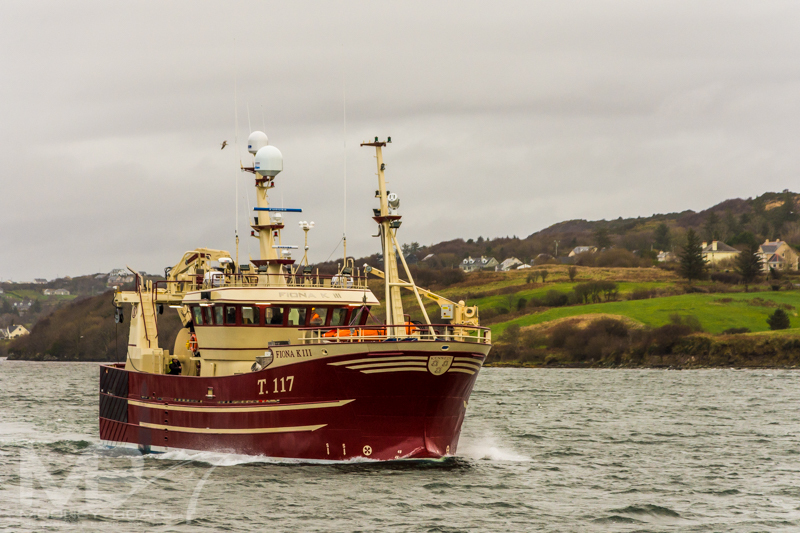 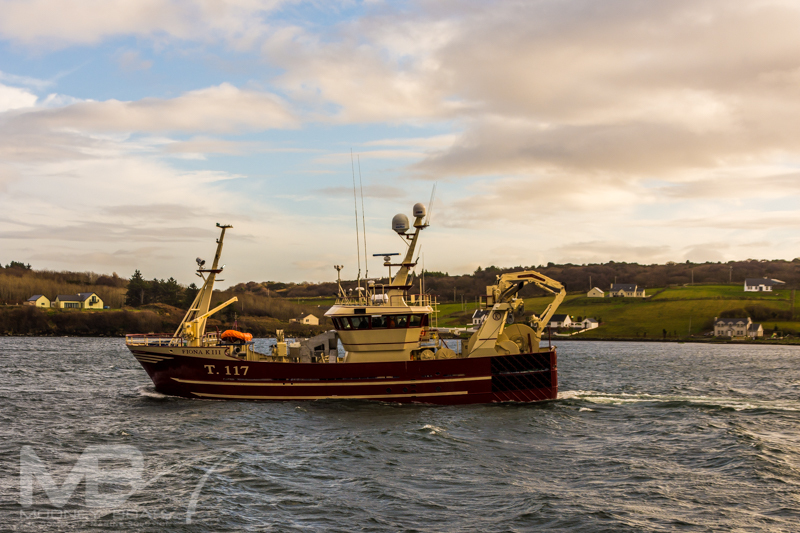 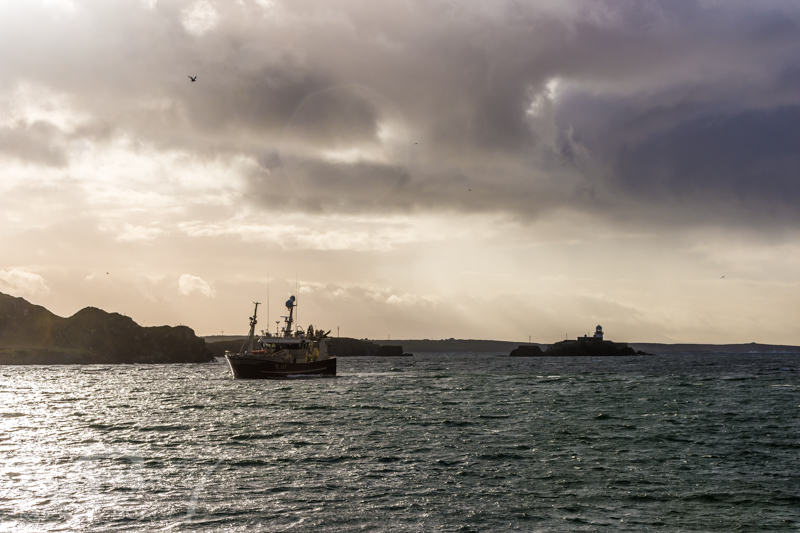 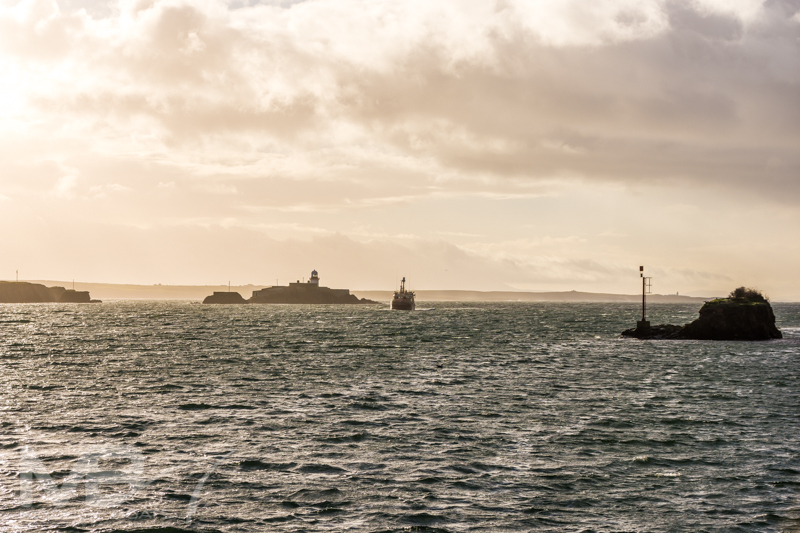 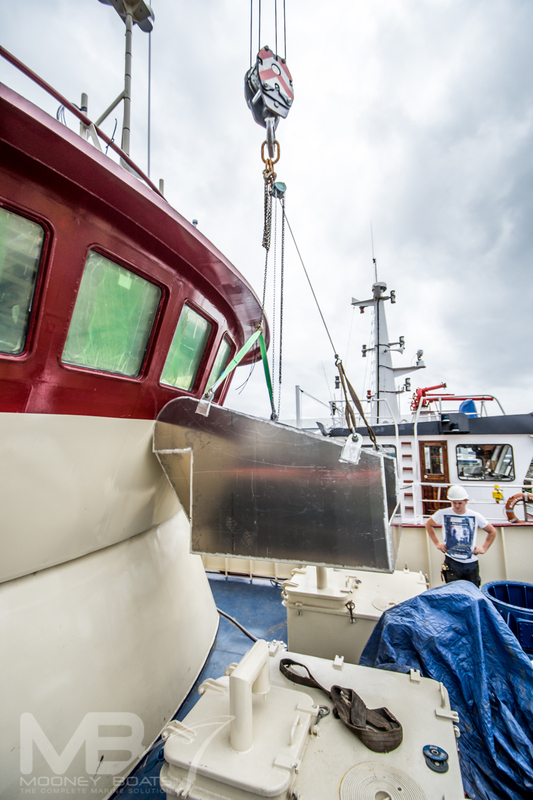 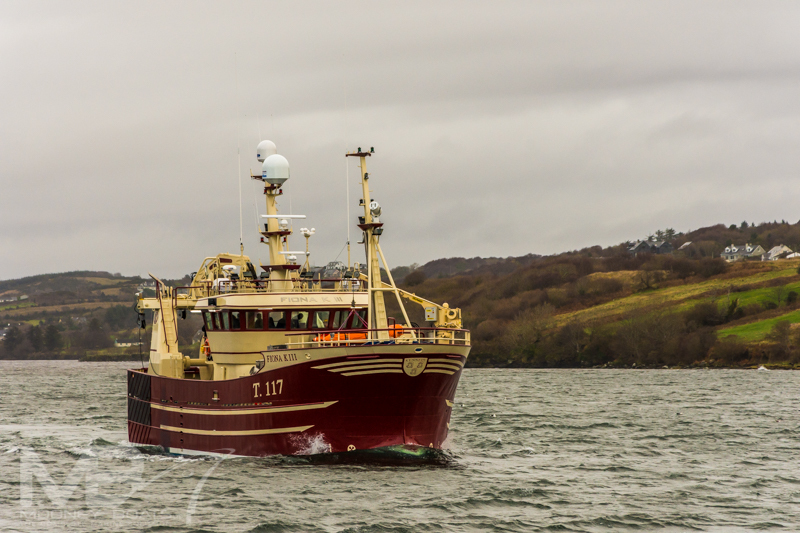 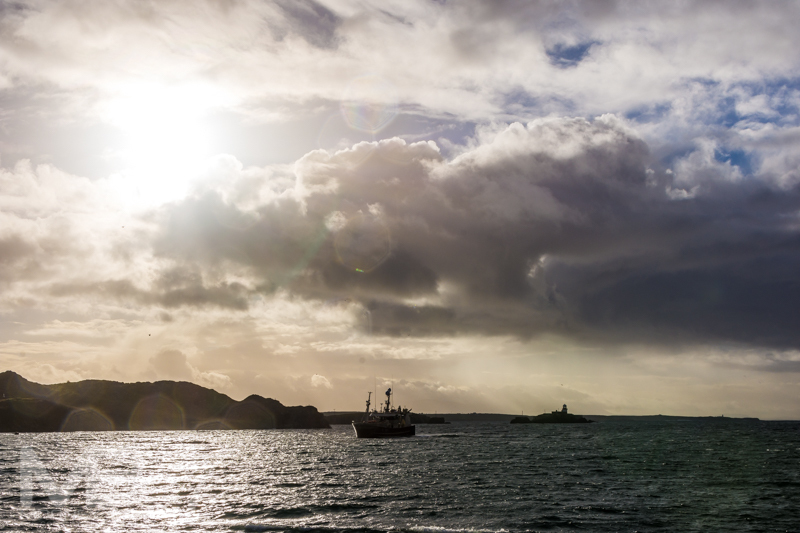 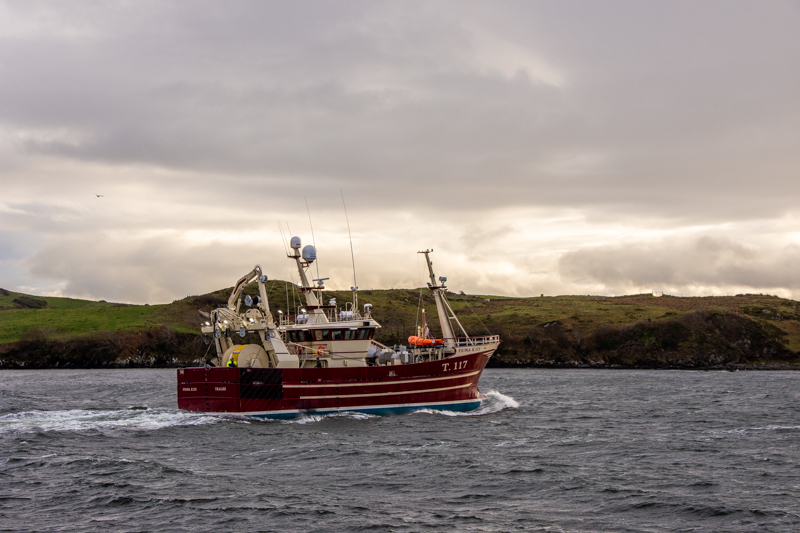 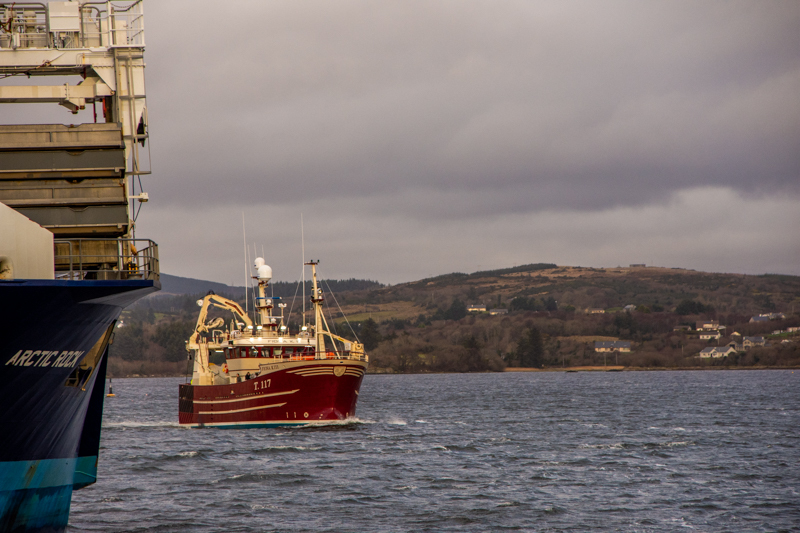 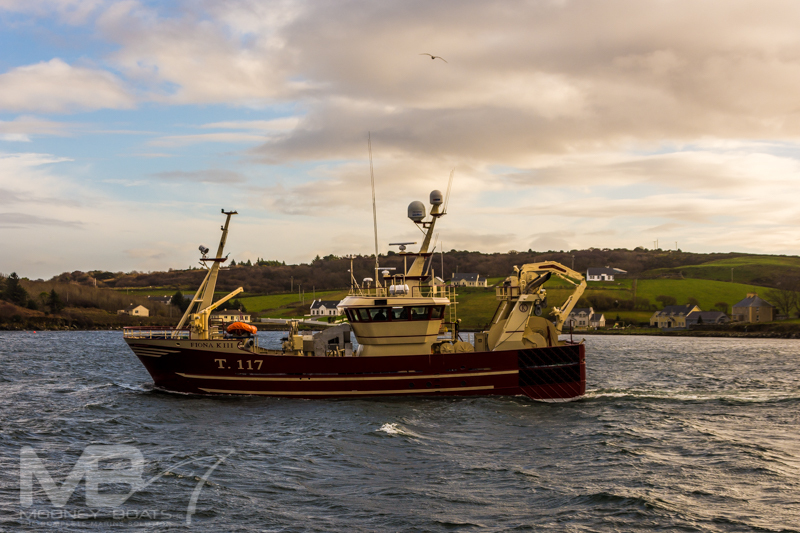 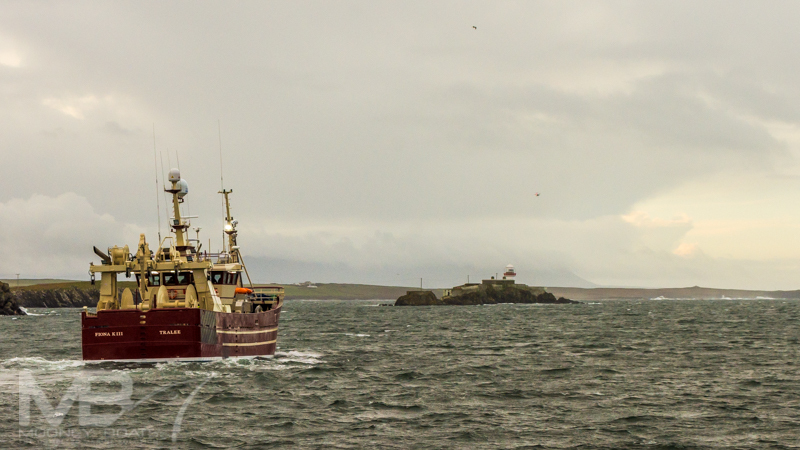 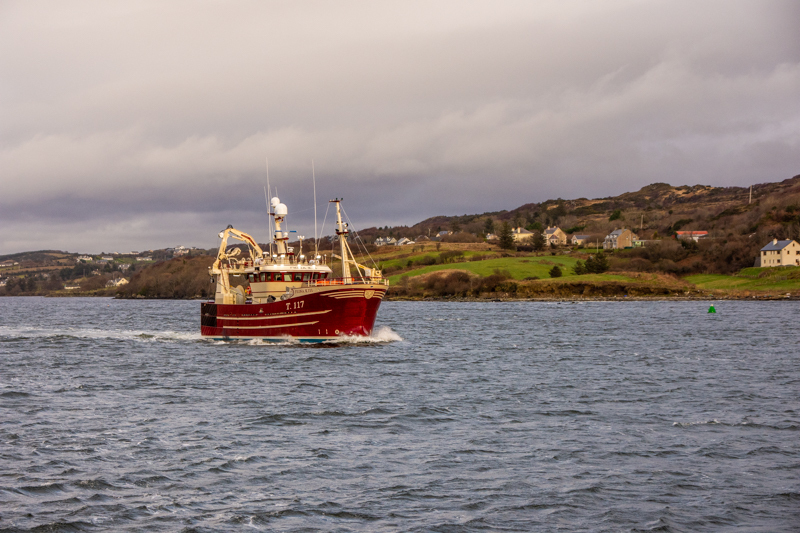 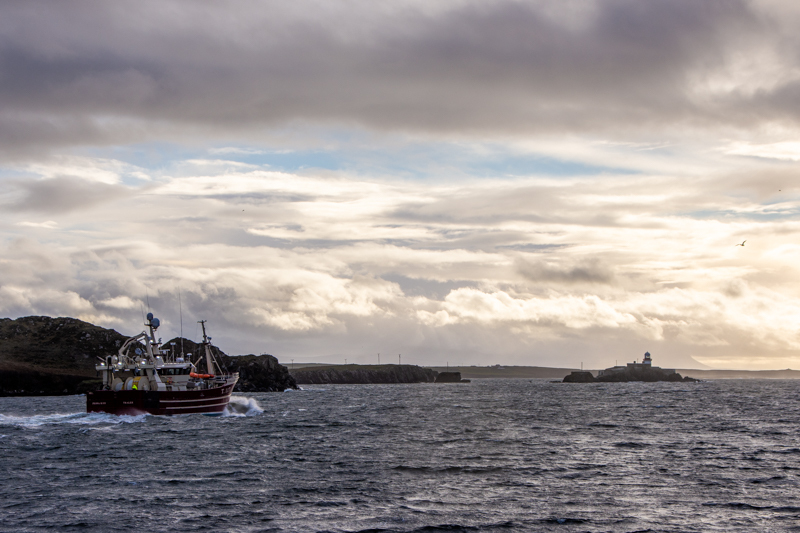 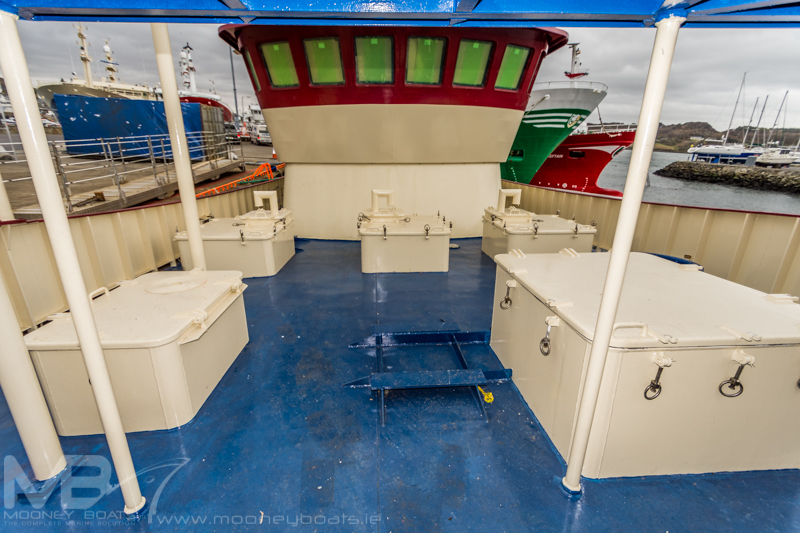 Catches are taken in in two locations on the vessel depending at which fishery is been targeted by the vessel owners. 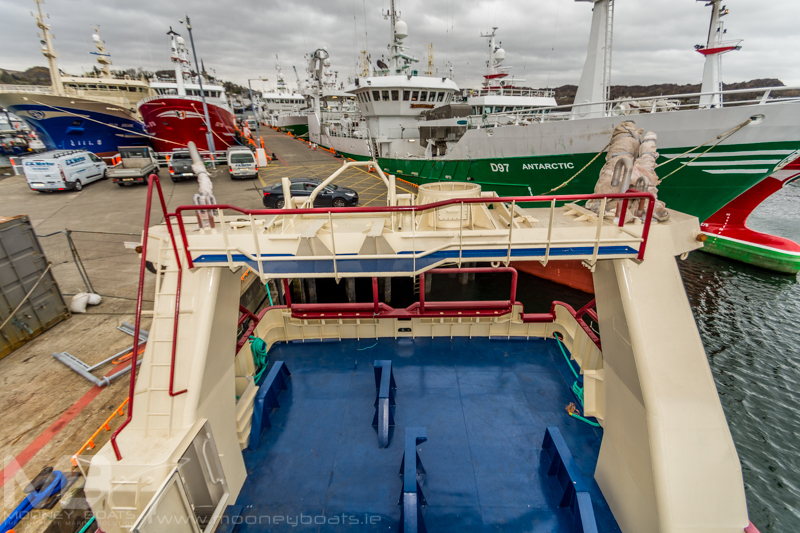 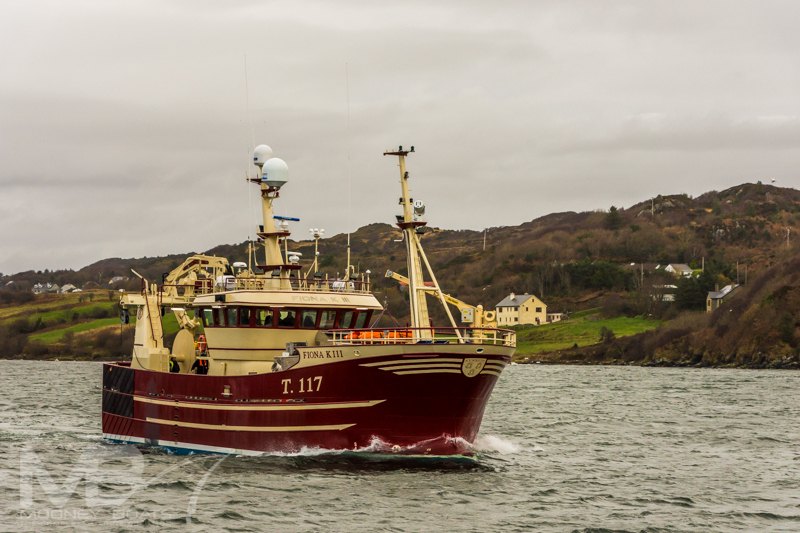 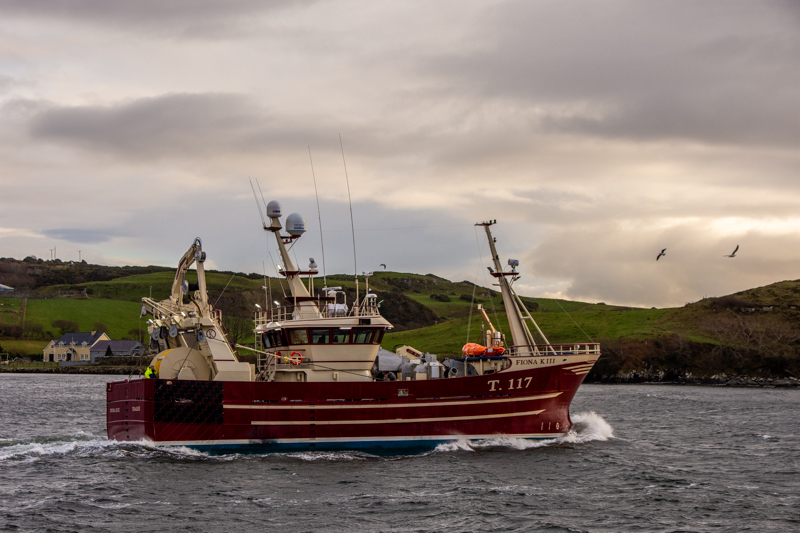 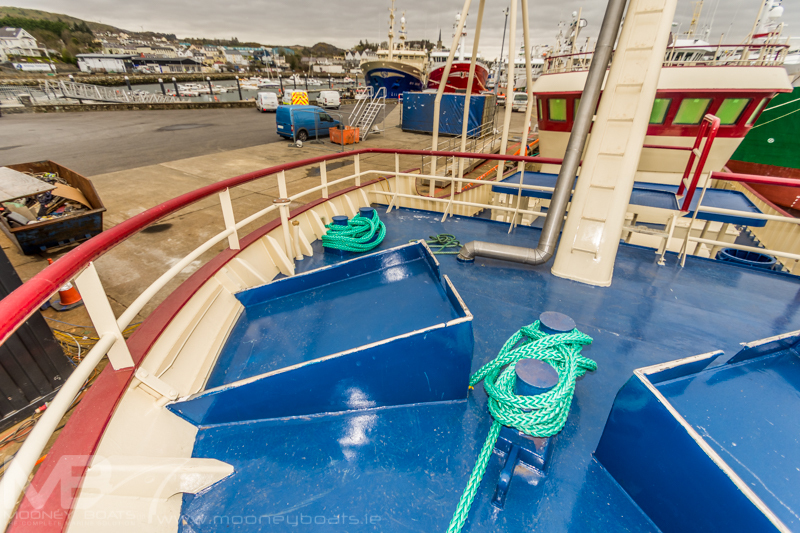 For the pelagic fishery the catch is taken in over the stern where there the deck is a generous space providing room for net mending abaft the wheelhouse. 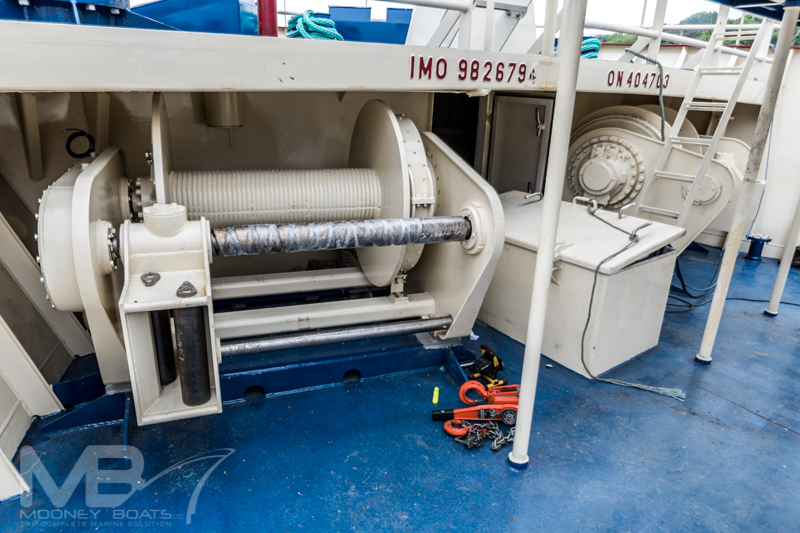 The fish are pumped in over the stern using a SeaQuest 14” Fish pump which is located on the aft port quarter. 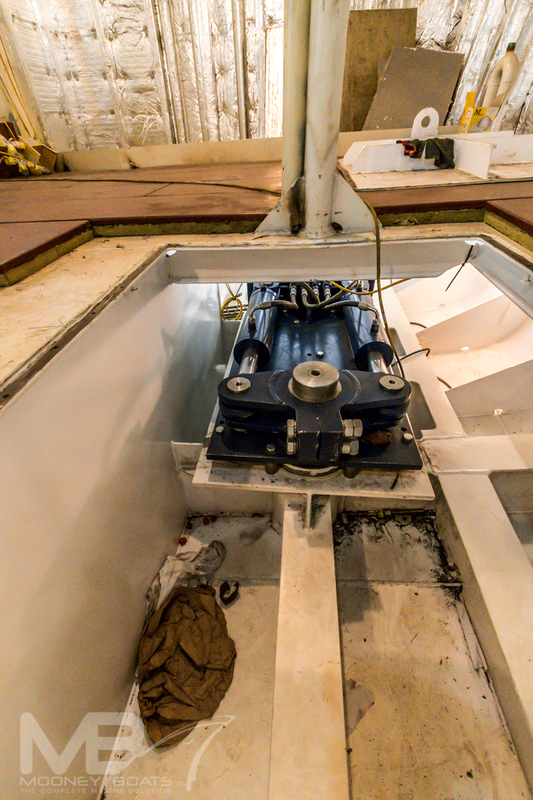 The pumps is lifted with the EK Marine power block crane and lowered into the cod end and then connected to the fish pump hose. 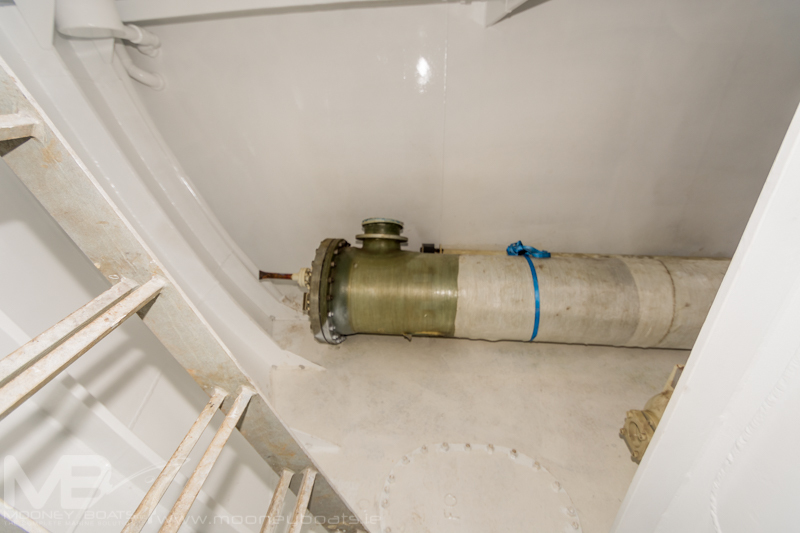 Once the fish start pumping they then are transported forward on the port side of the vessel through a 14” stainless steel pipe to the forward deck where the catch is distributed to the 3 RSW tanks through the bespoke designed water separator manufactured and designed by Mooney Boats Ltd. All waste water from the separator is channeled over board through and aluminum waste water system which prevents scales on the deck of the vessel. 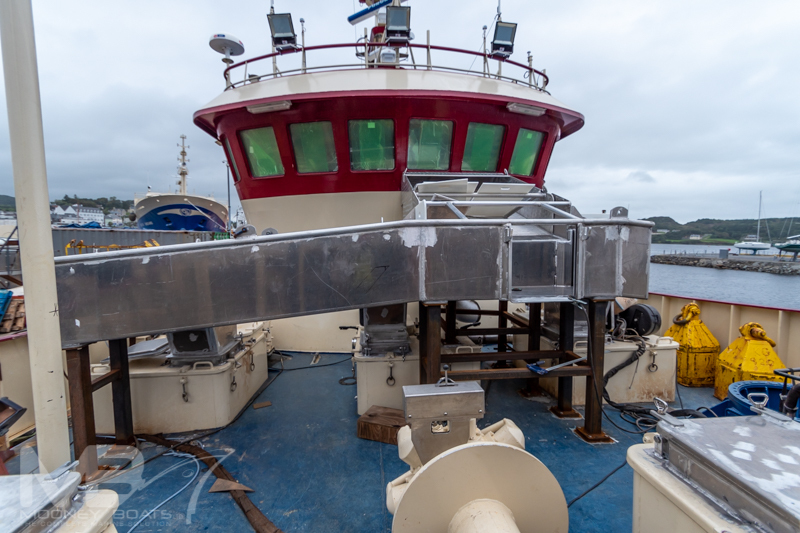 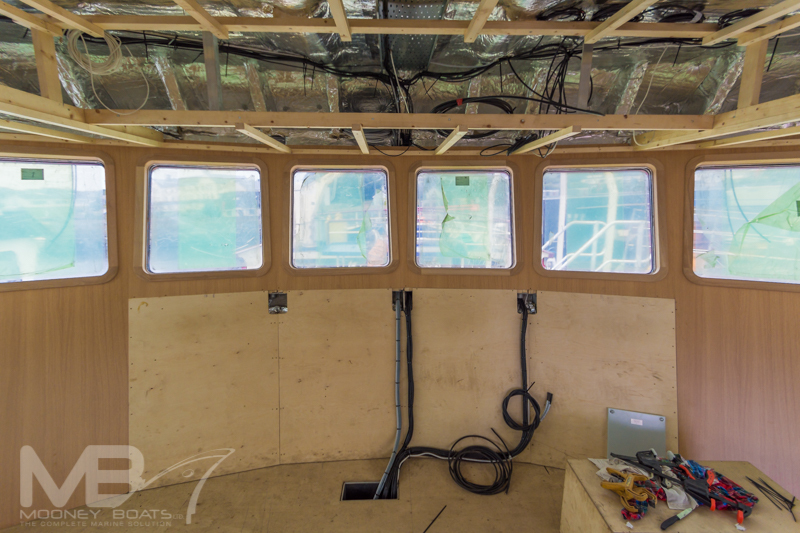 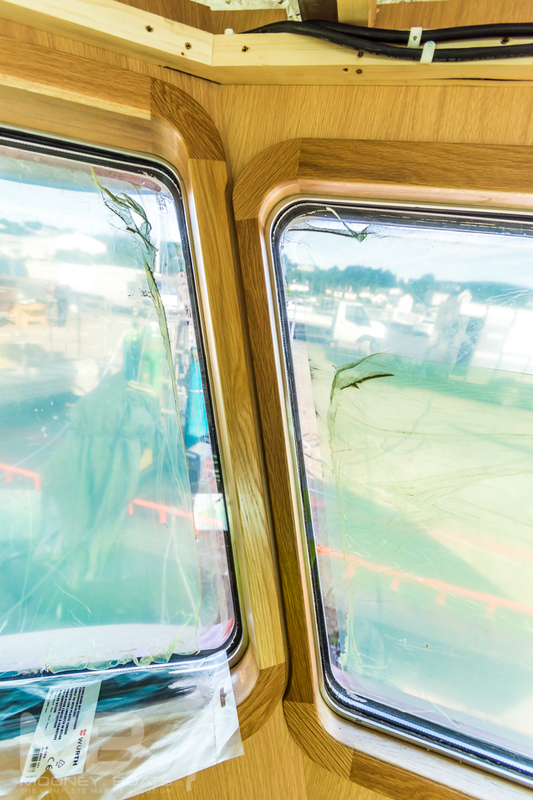 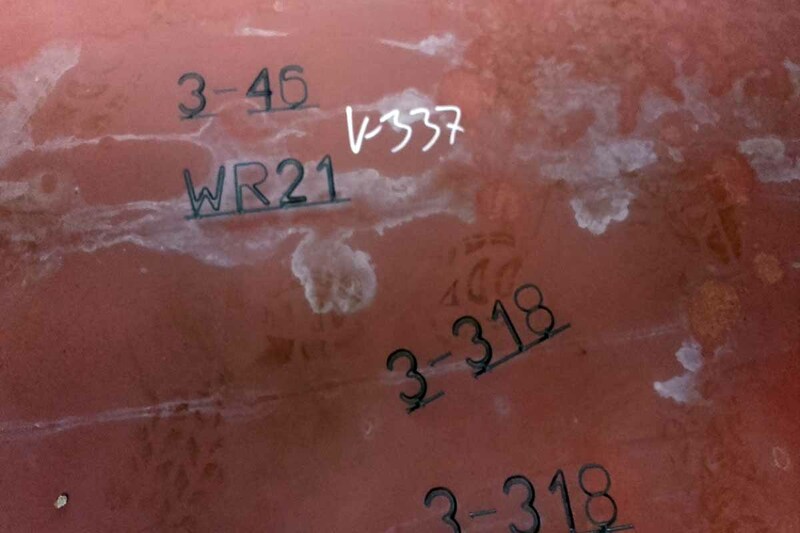 The yard also designed and fitted a viewing window in the 14” stainless steel pipe which the skipper can see from the wheelhouse window so he will know the catch are moving. 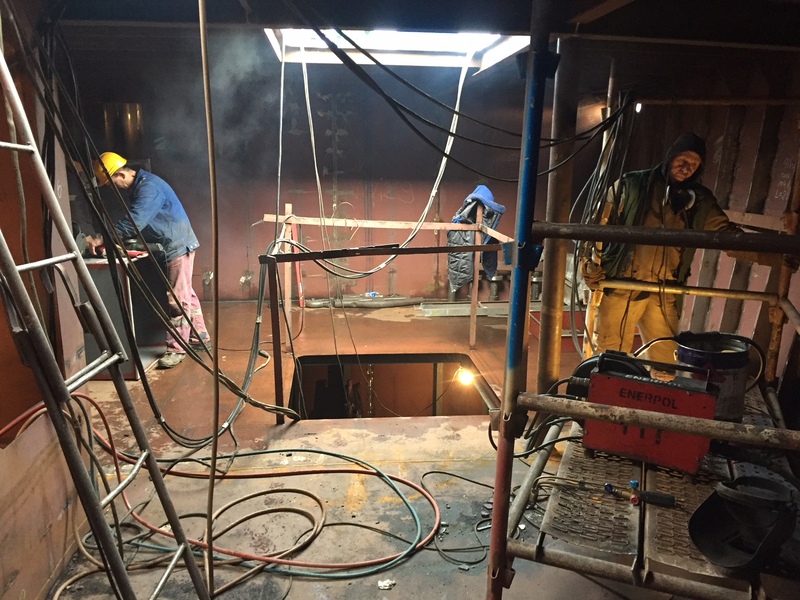 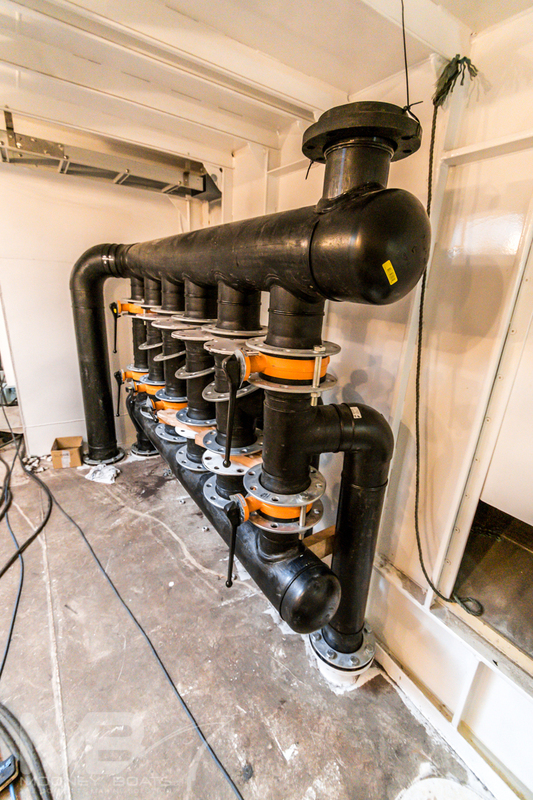 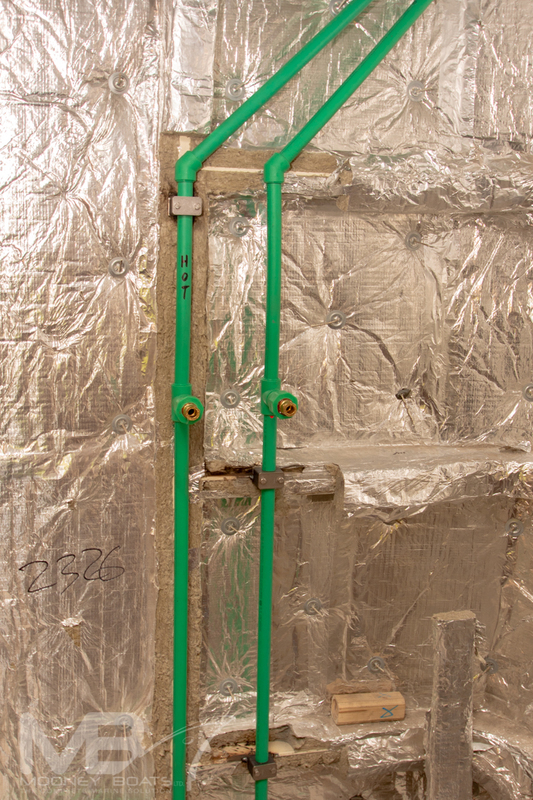 The crew can control the flow of the pump adjacent to the viewing window in the pipe to ensure premium quality. 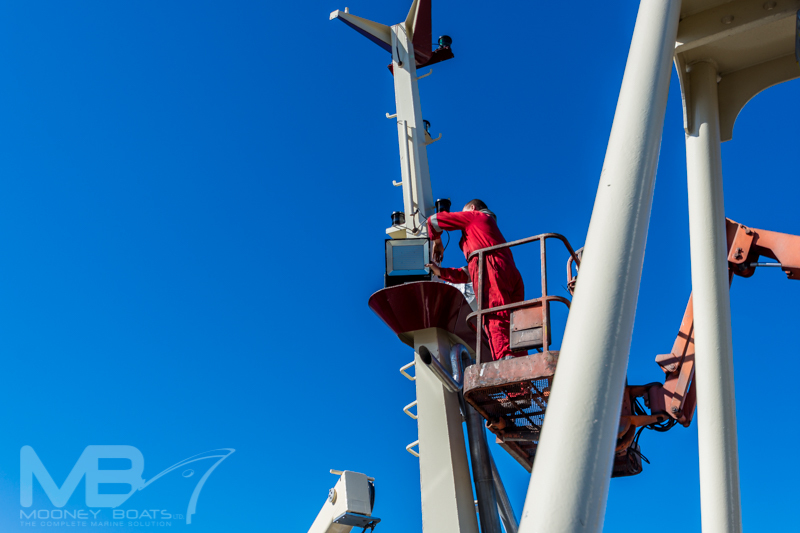 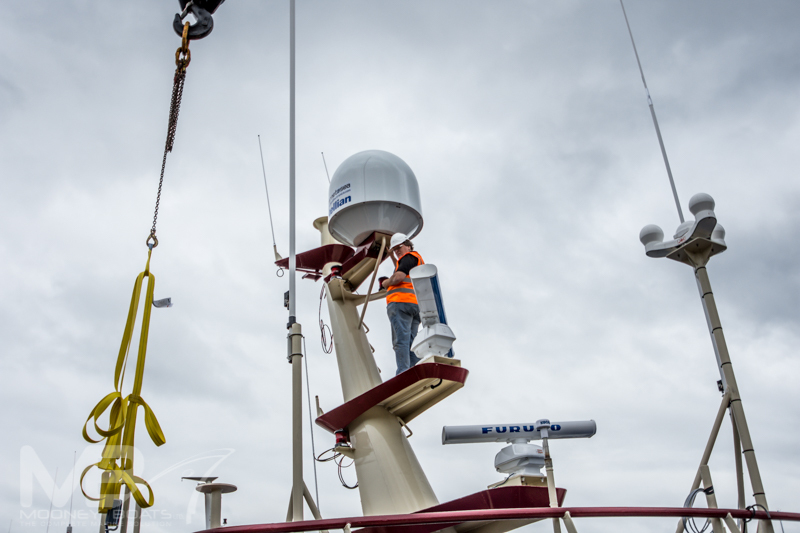 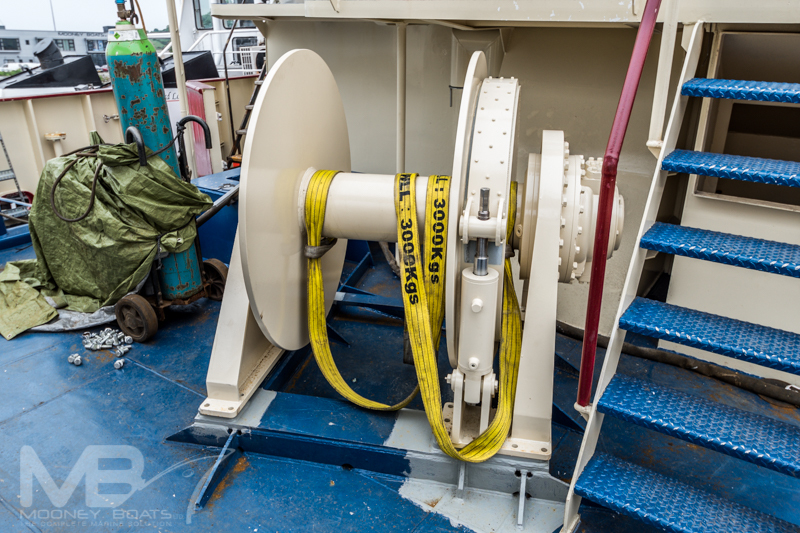 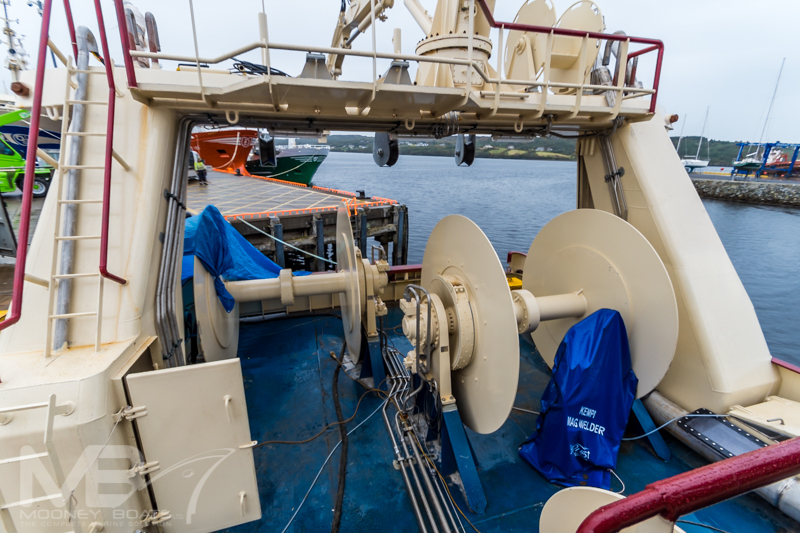 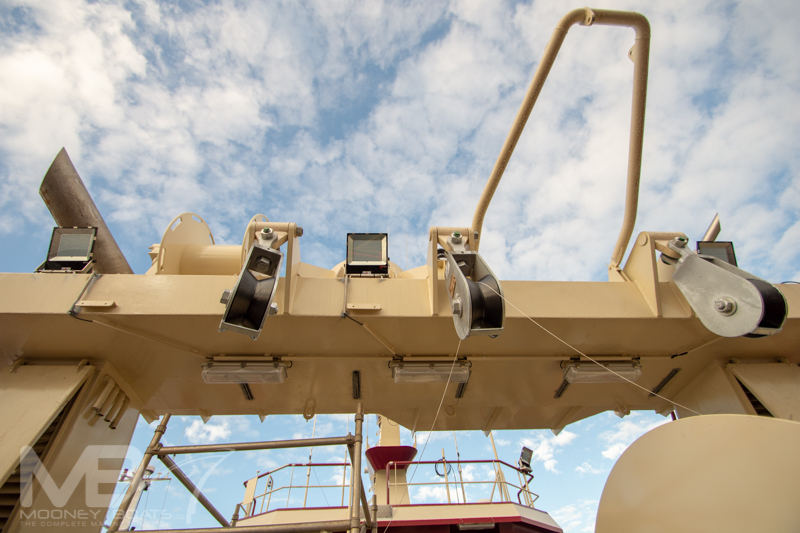 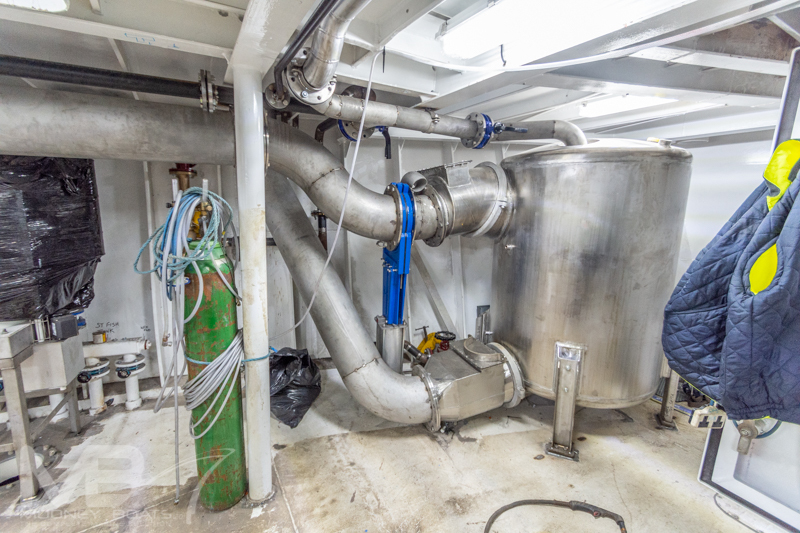 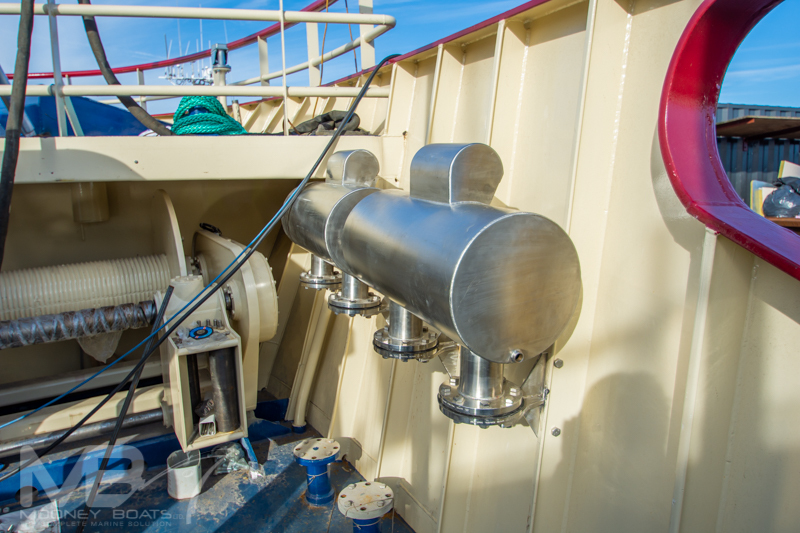 For discharge of the pelagic fishery the vessel was fitted with a SeaQuest Vacuum pump system. 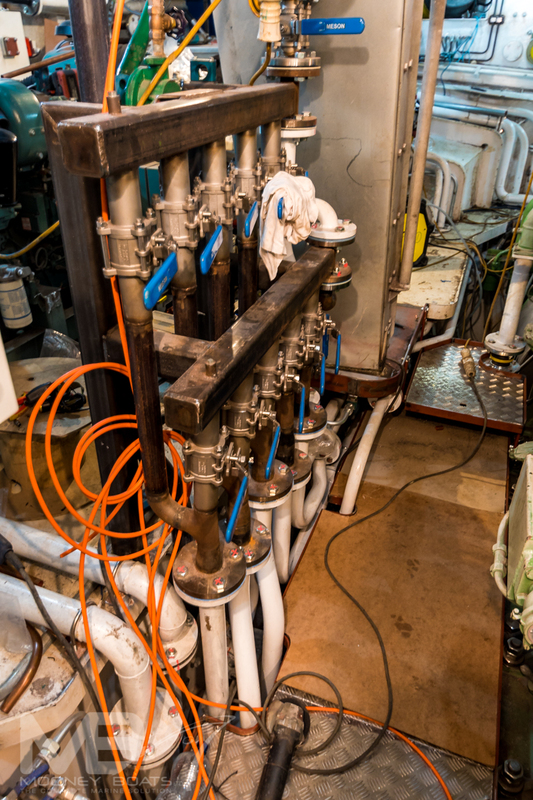 The system consisted of 2 No Electric Driven Samson V21 compressor, with bronze end plates, 4-way valve for operation of compressor, pneumatically operated, 2000l S/S pressure vessel with DN300, PN10 inlet & outlet, 14” Landing separator for common fish hose & fittings with fish pump with return water connections, PLC Control for operation of system, Start/Stop of cycle with blowback, etc. 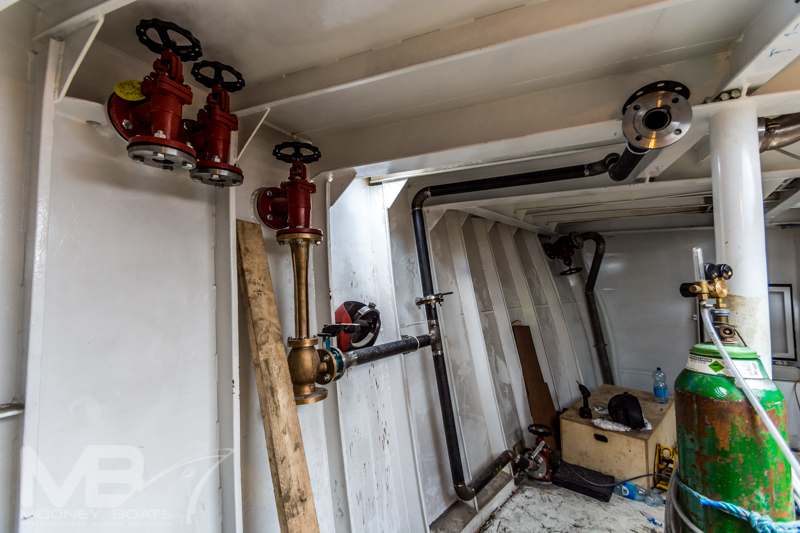 installed, Operation of 3 x tank valves, Radio-Control for operation from deck, with run/stop/blowback of system, and open/close of the 3 x tank valves. 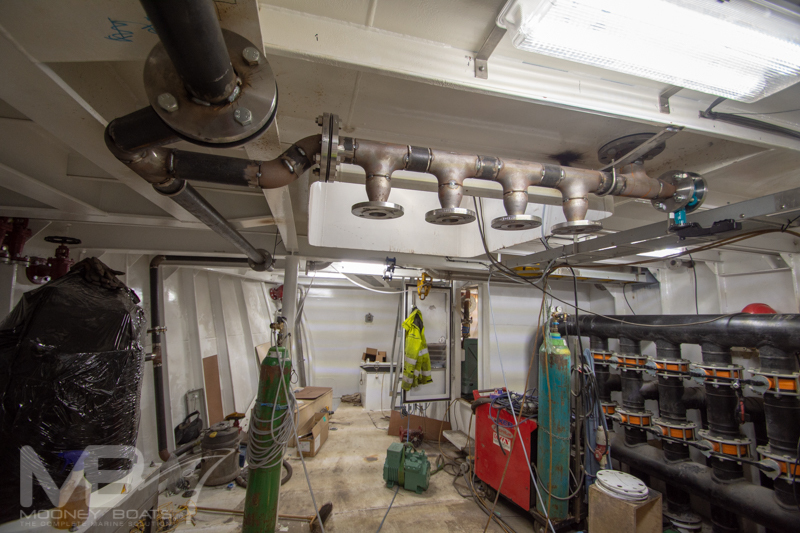 The Knifegate valves for 3 x RSW tanks & blowback system are all piped below shelter deck and operated with air actuated valves. 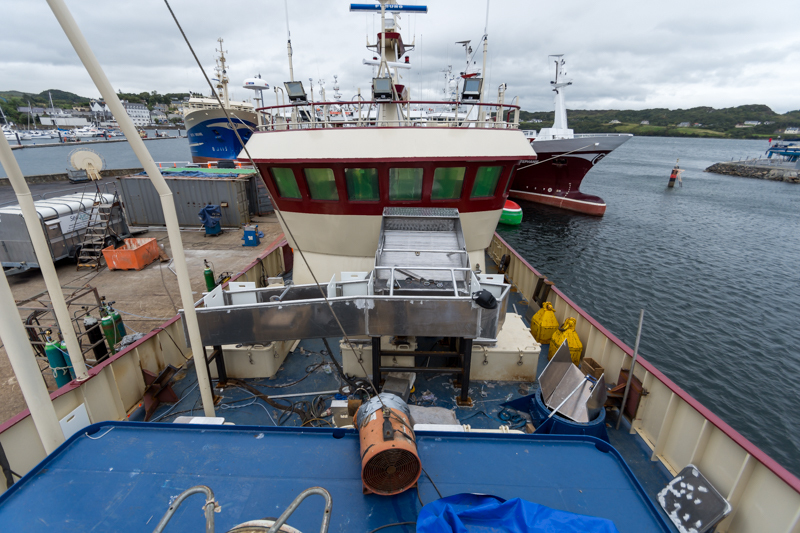 The yard also designed and installed the fish handling system for the whitefish and tuna fishery. 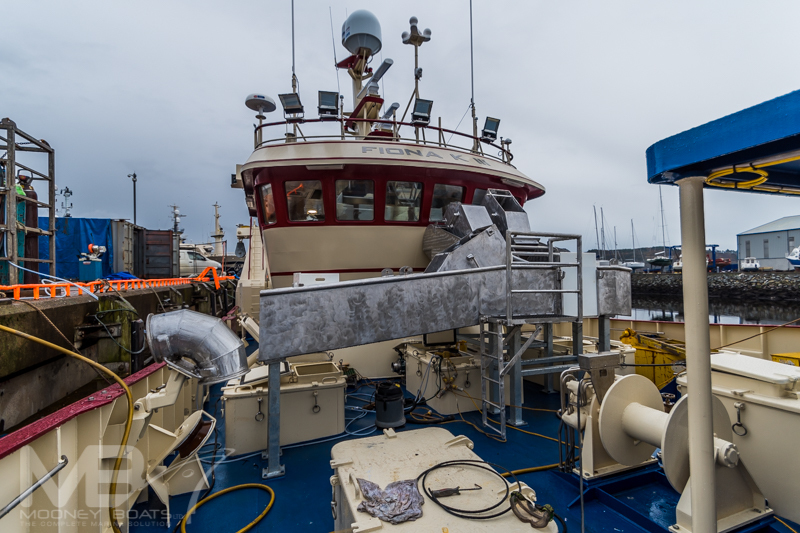 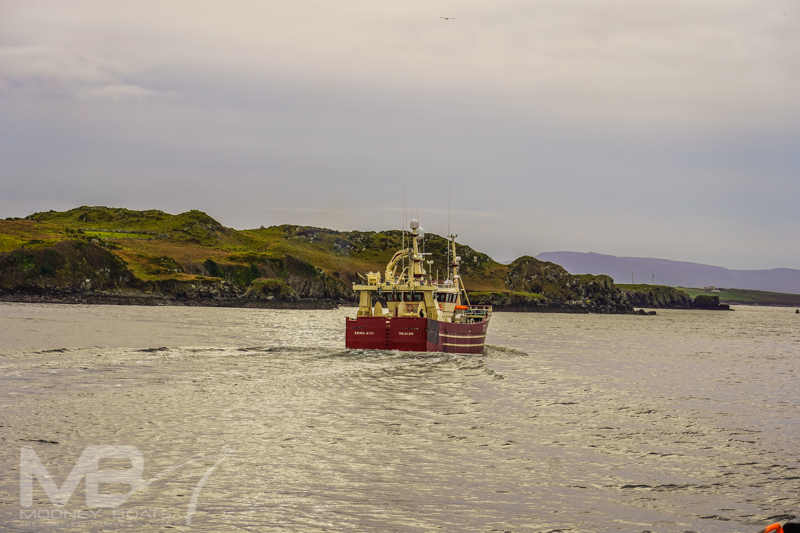 For both these fisheries the catch is take in forward on the starboard side and for the whitefish they are distributed down to a large fish hopper under the shelter deck on the starboard side of the vessel. 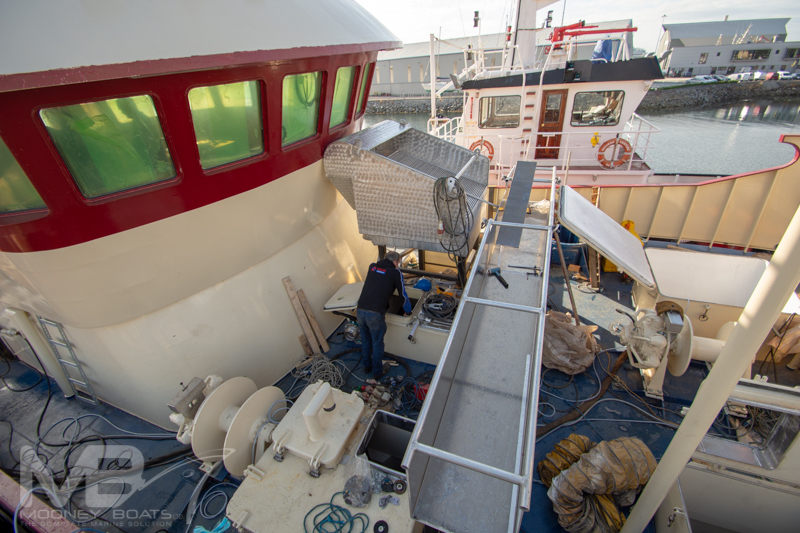 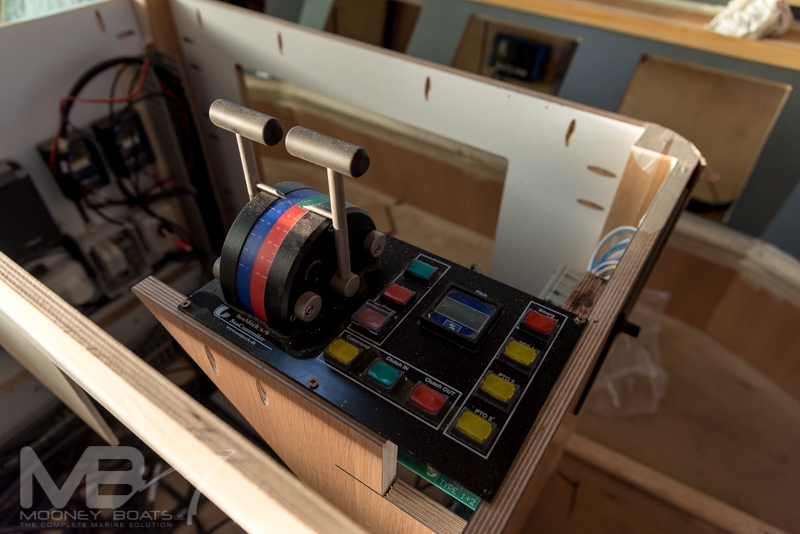 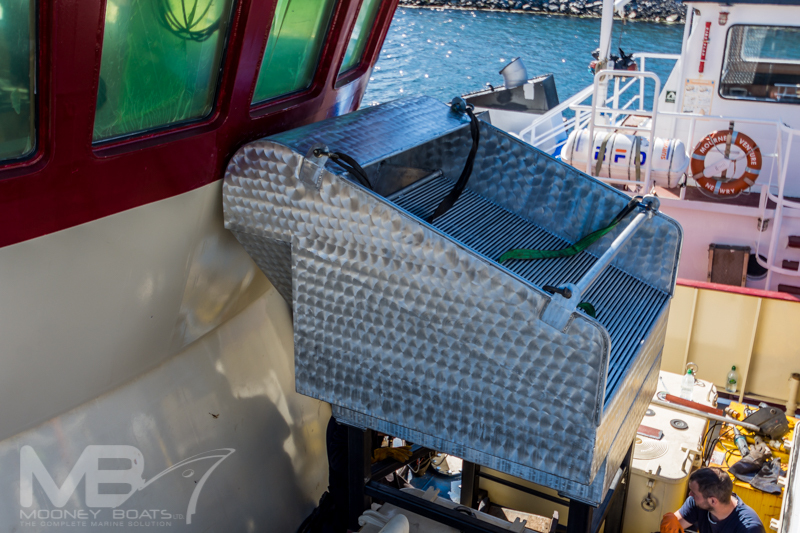 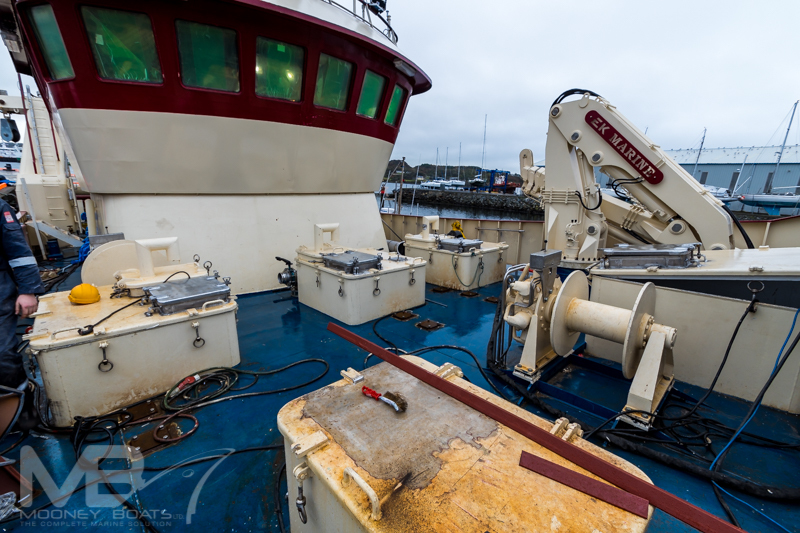 The hopper is fitted with an air operated door with the controls fitted adjacent to the picking table where the crewman can control the flow of the fish. 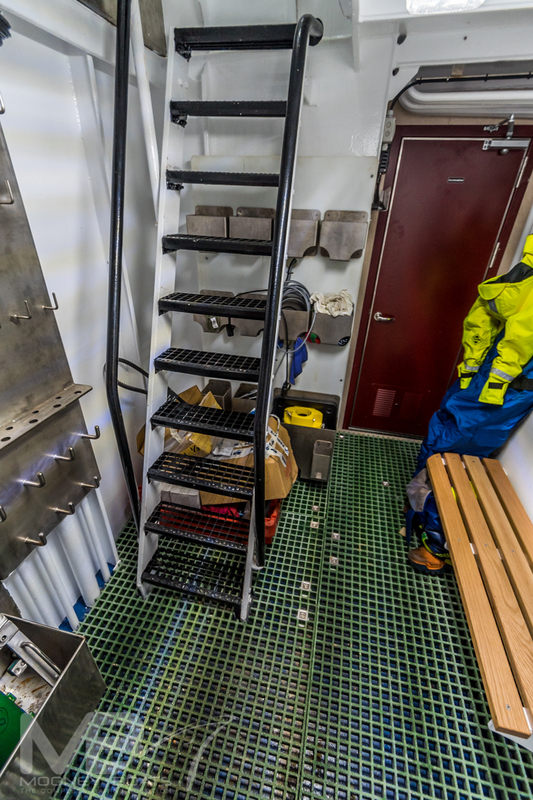 When the hopper door is opened and the fish are taken by an elevator onto the picking table where the catch is sorted. 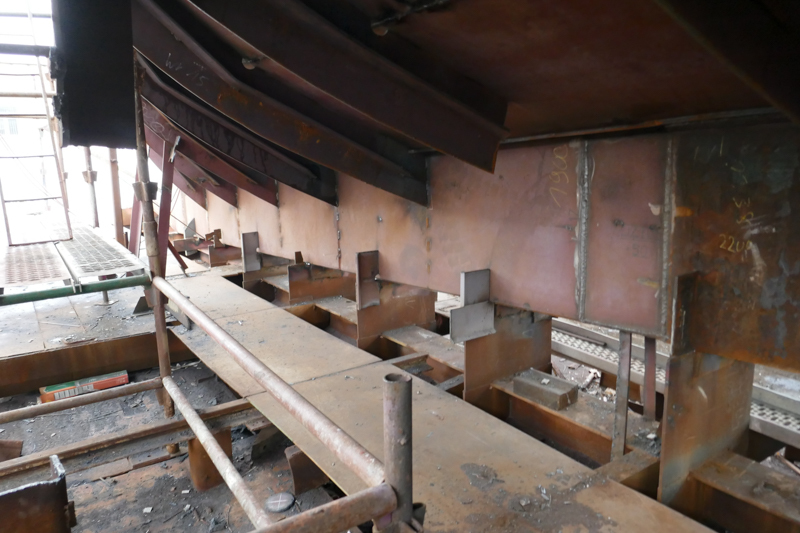 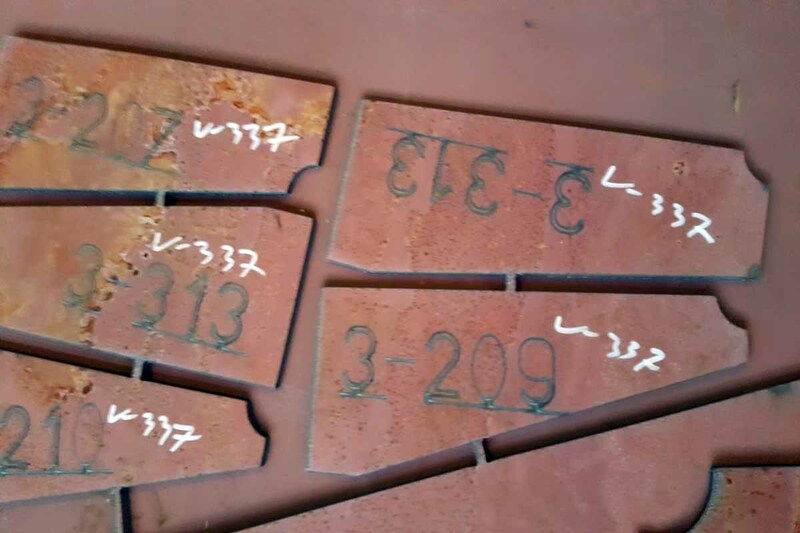 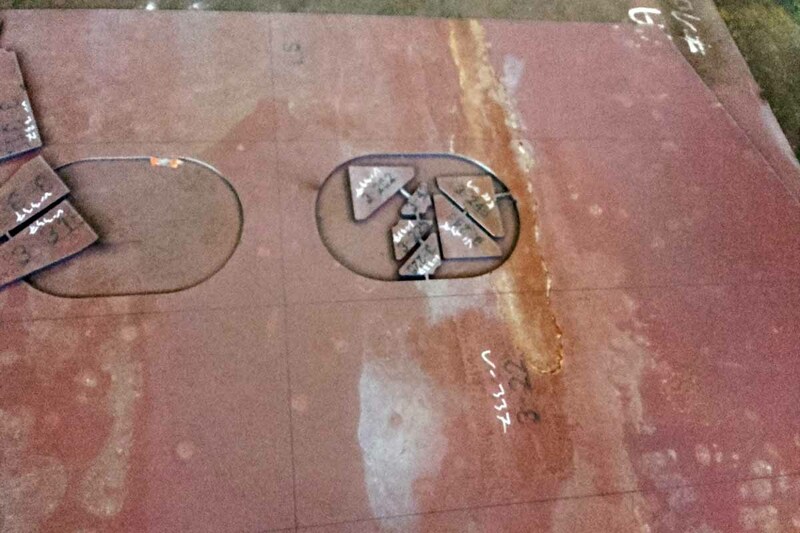 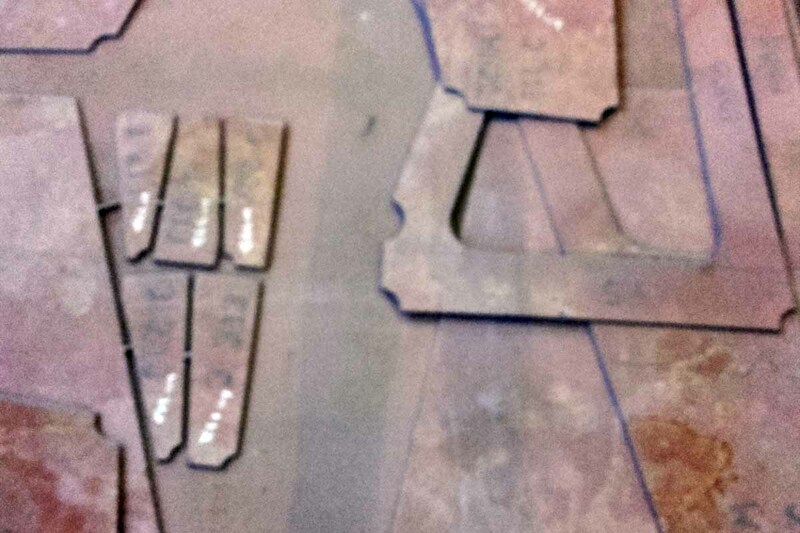 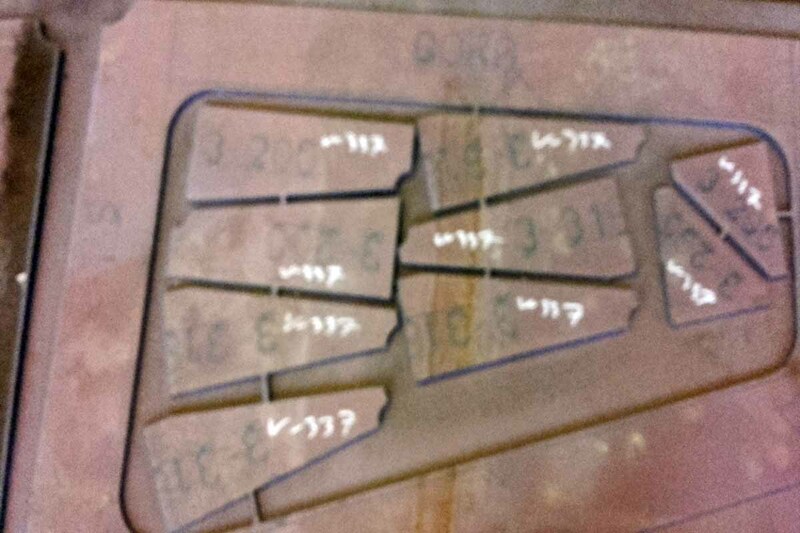 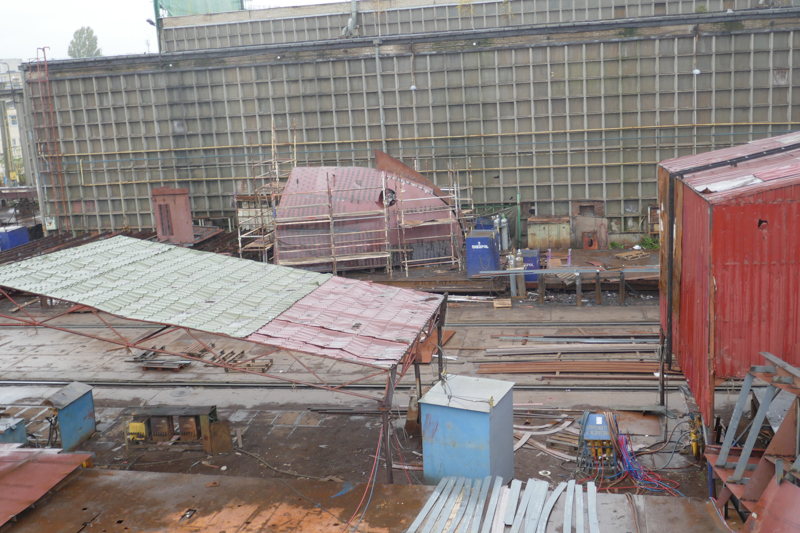 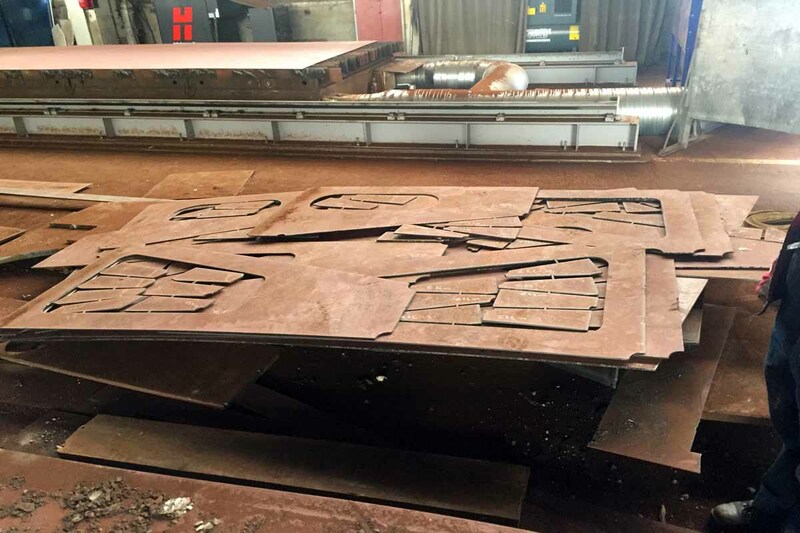 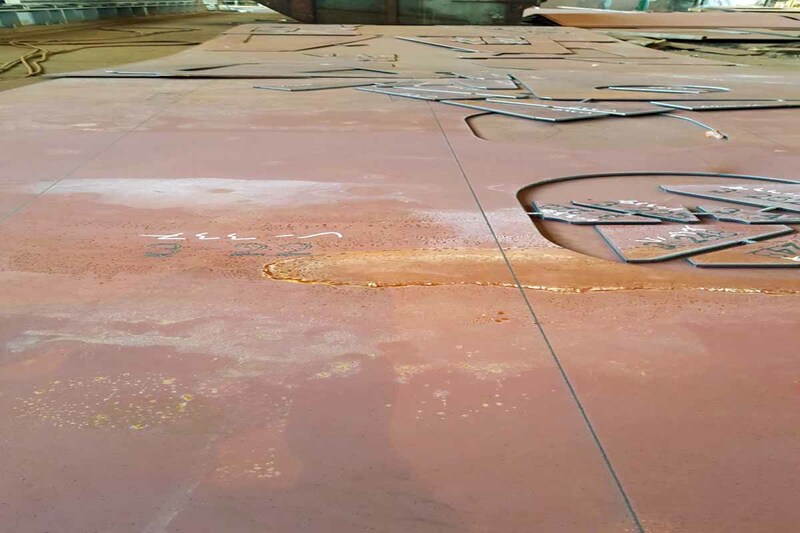 The yard also fabricated and installed a fish-washer which is located forward of the sorting table. 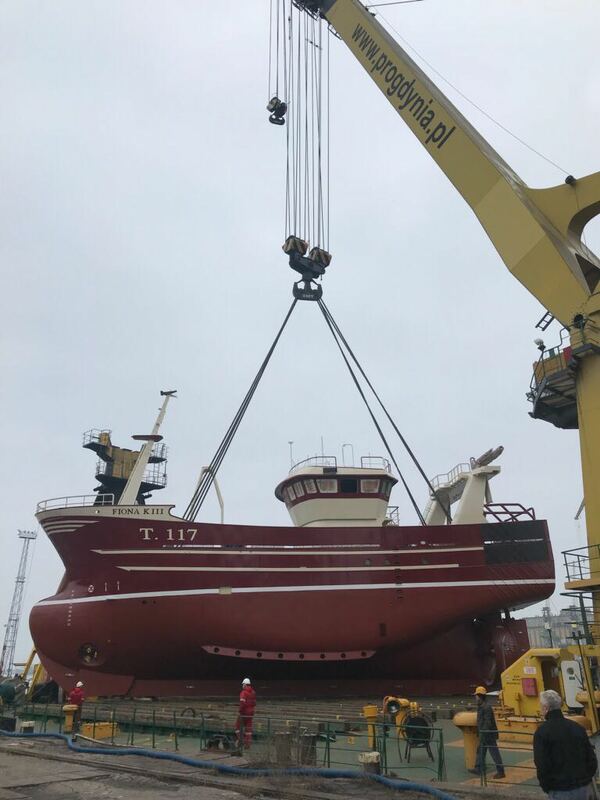 Once the catch is washed and sorted it is lowered down in to the dry-hold. 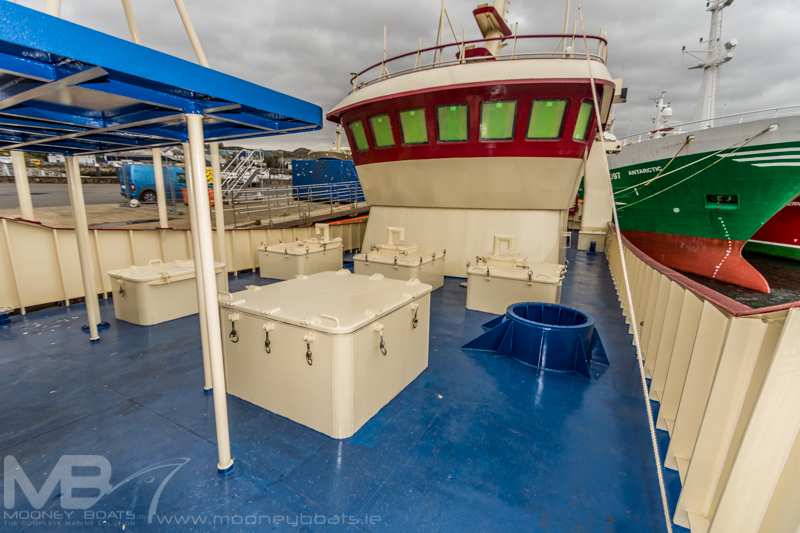 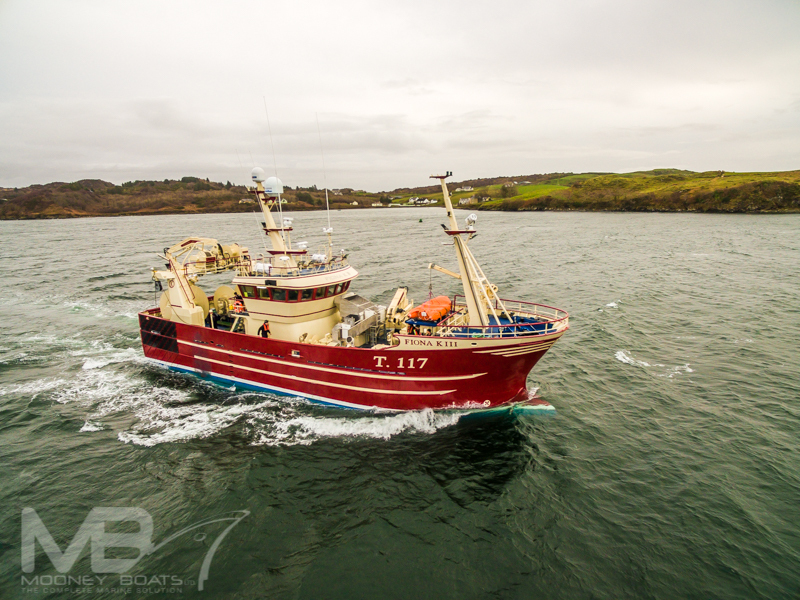 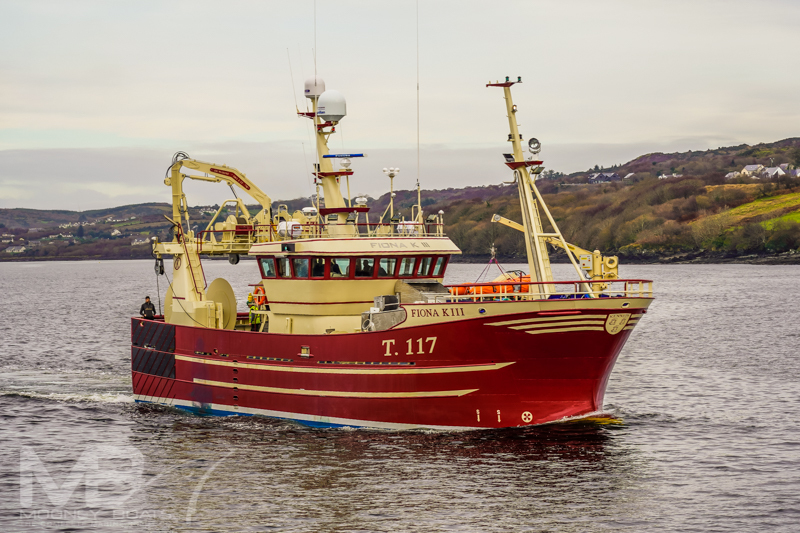 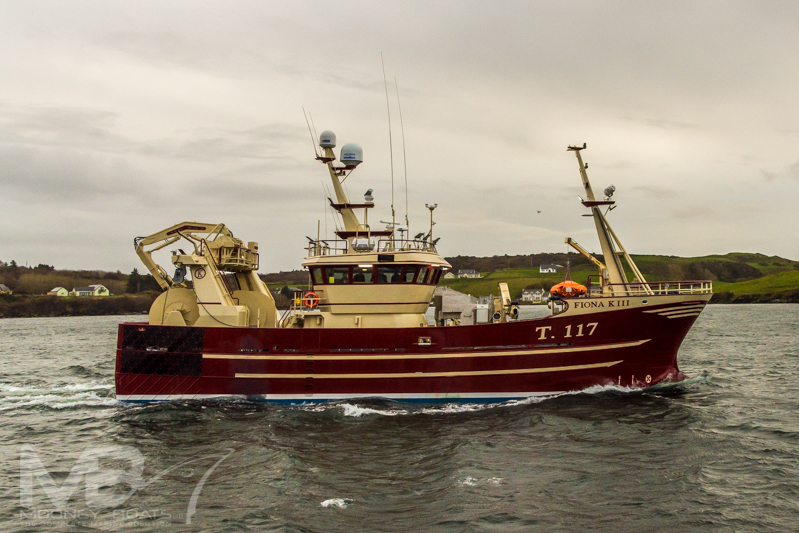 For the Tuna fishery the catch is again taken in forward at the same position but the tuna are distributed to the 3 aft tank above the main deck through a bespoke design aluminium fish handing system. 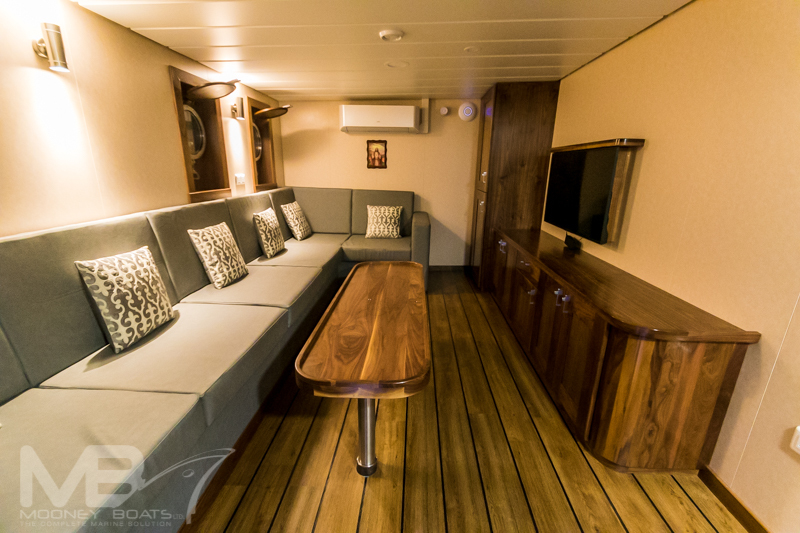 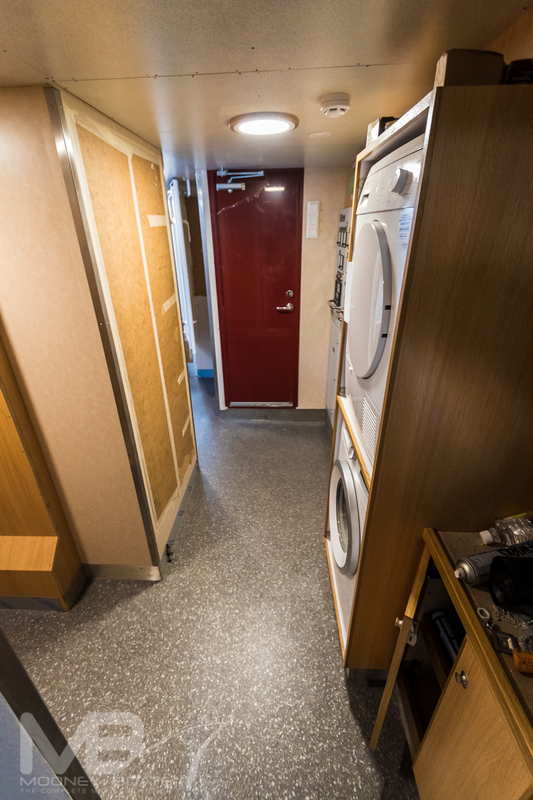 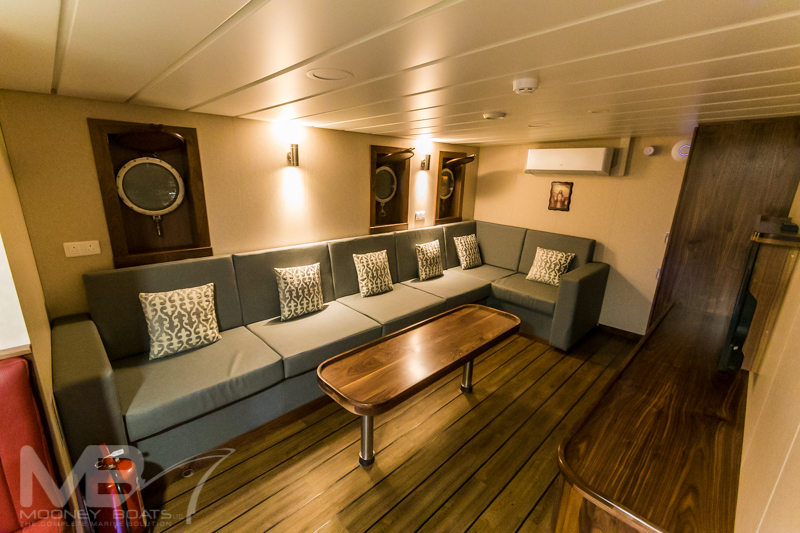 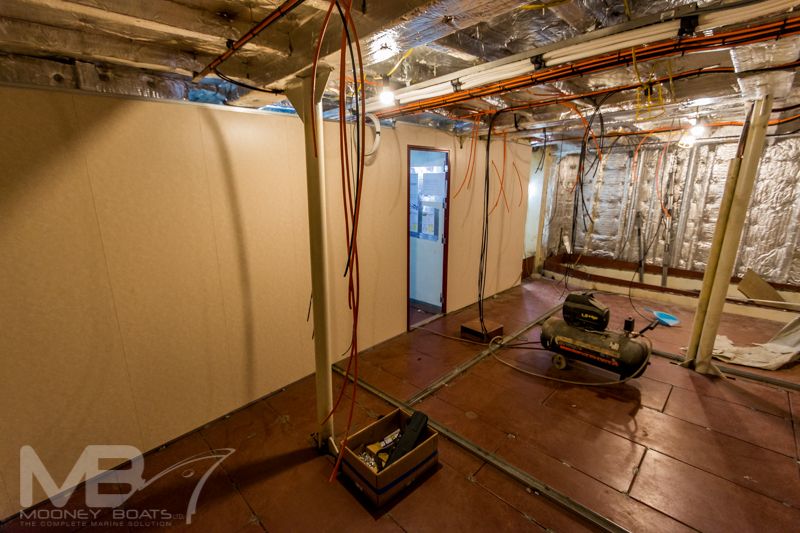 Crew accommodation facilities on Fiona K III are once again excellent and the standard of work in the fitout of this vessel is breath taking. 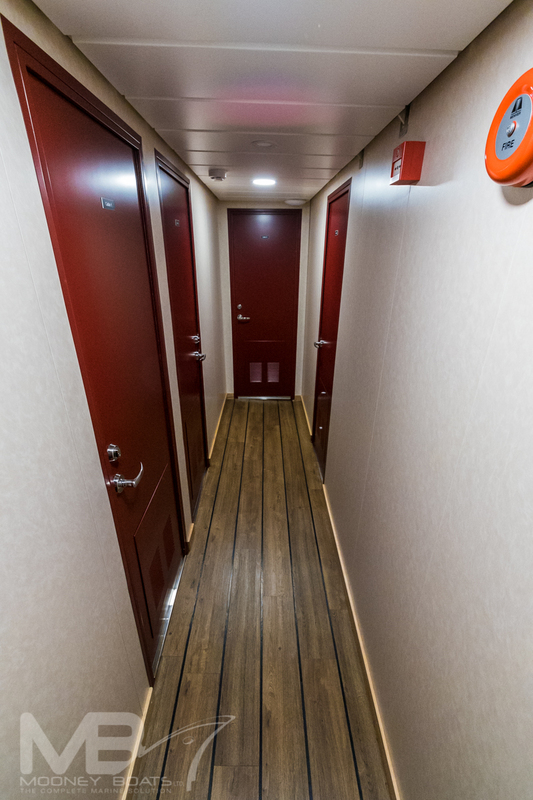 The accommodation is all located aft in the expansive deckhouse which extends from the stern forward to amidships for the full beam of the vessel in the aft section. 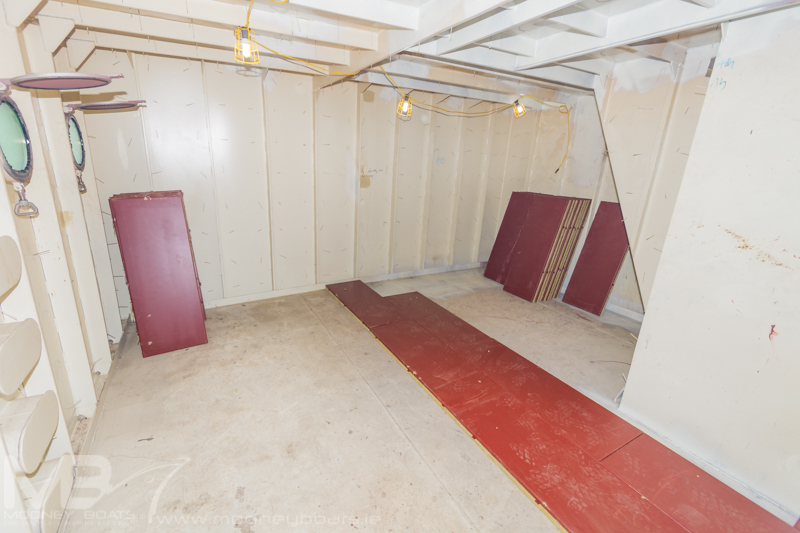 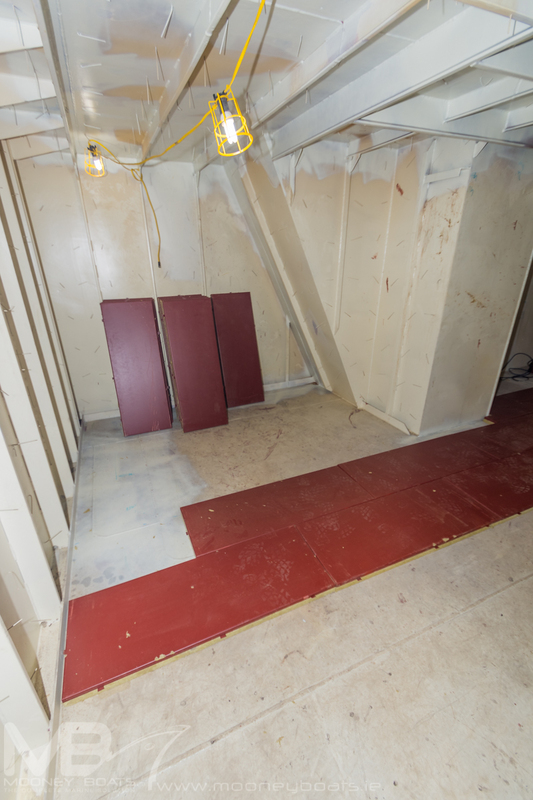 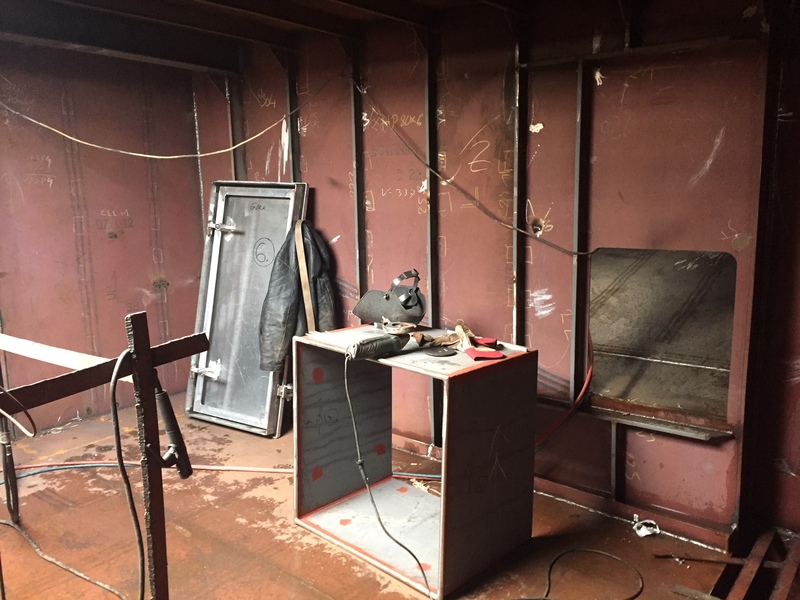 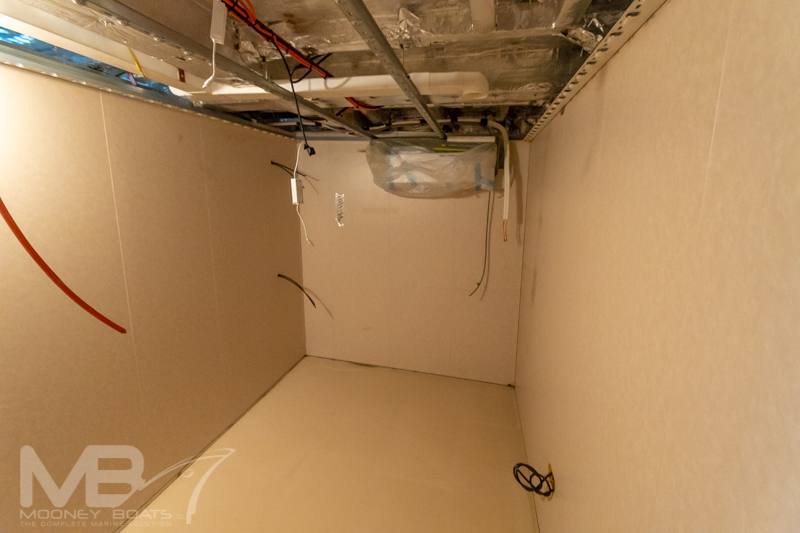 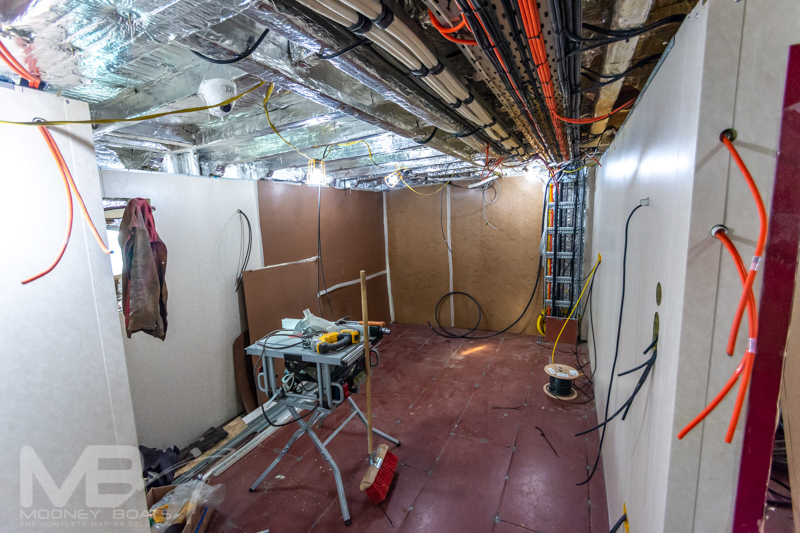 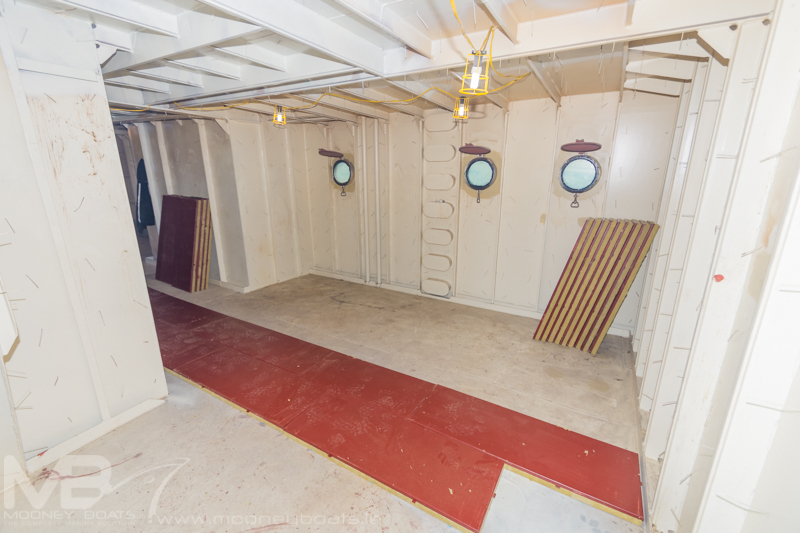 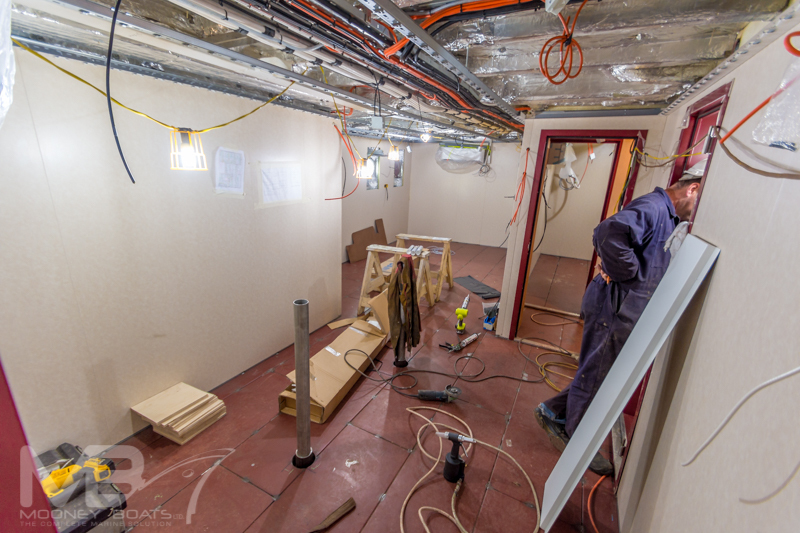 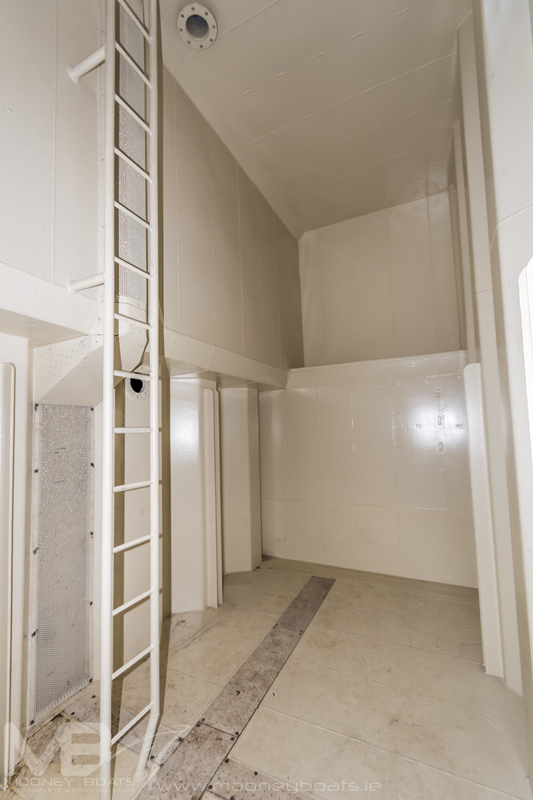 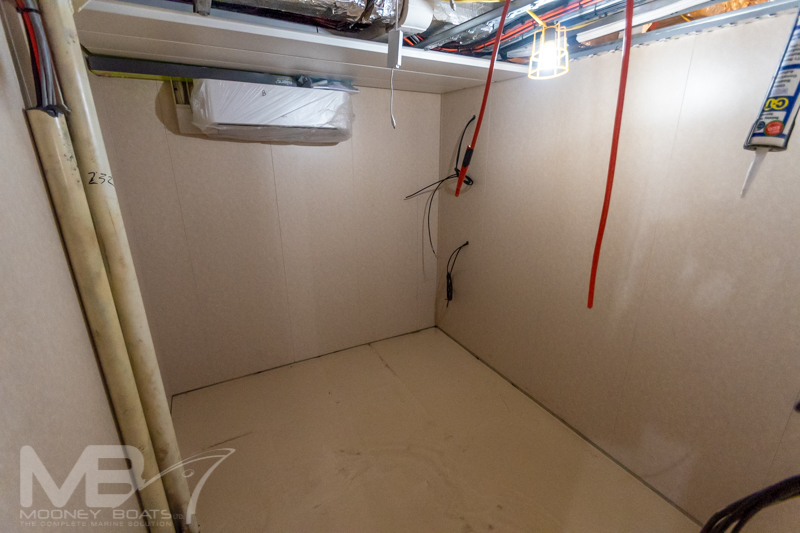 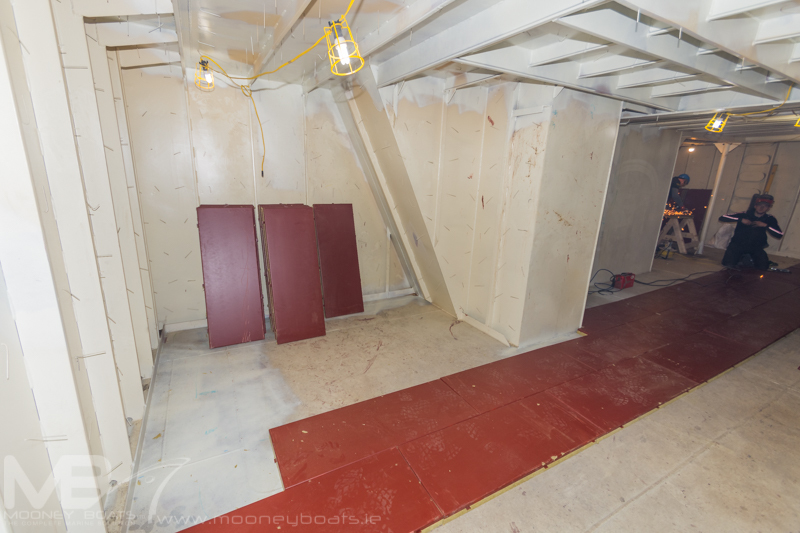 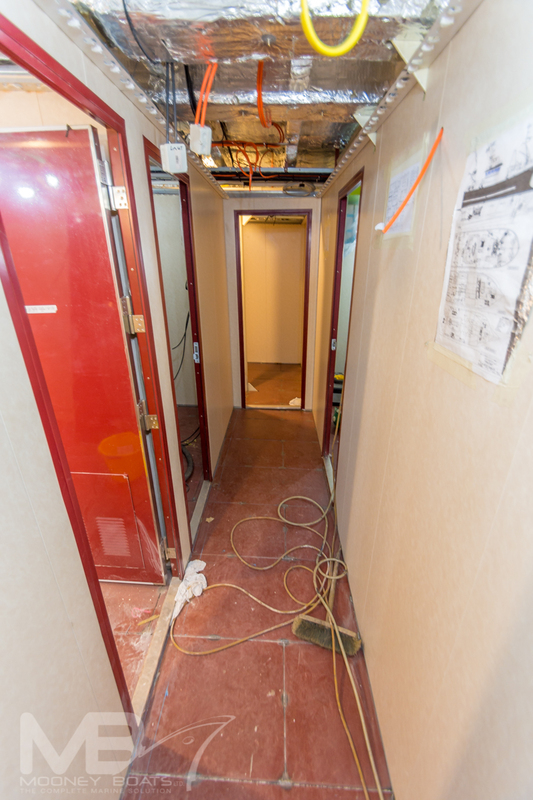 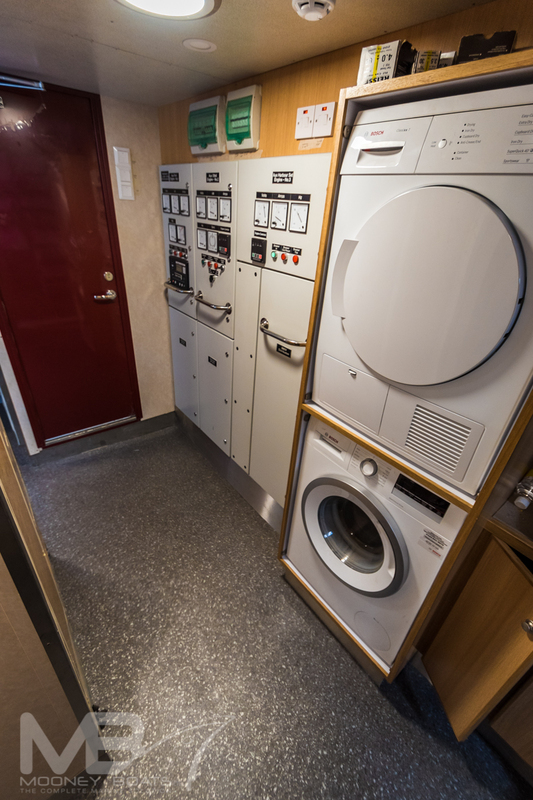 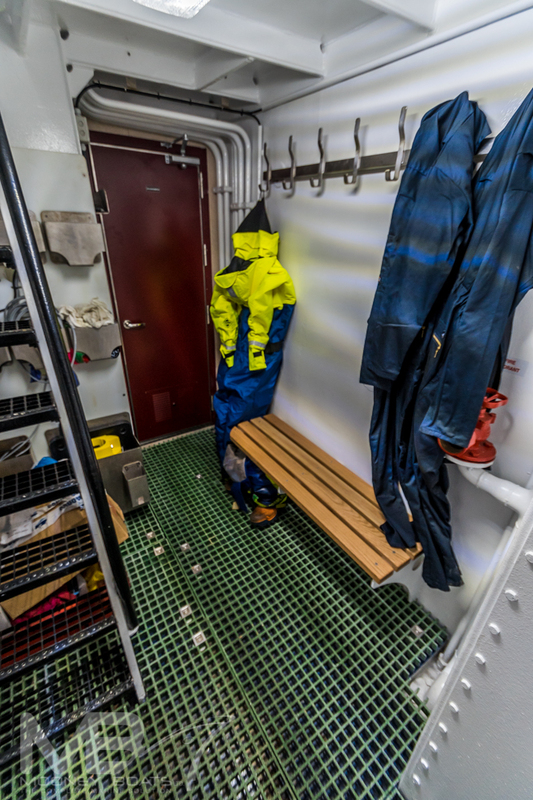 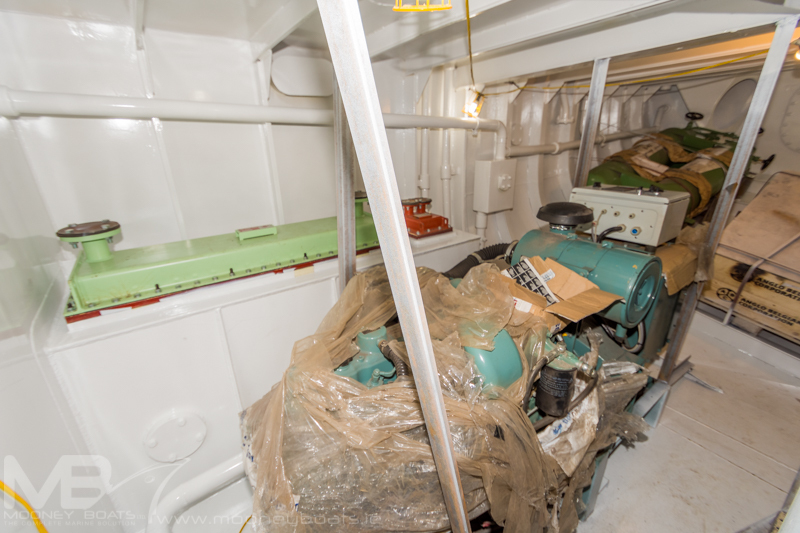 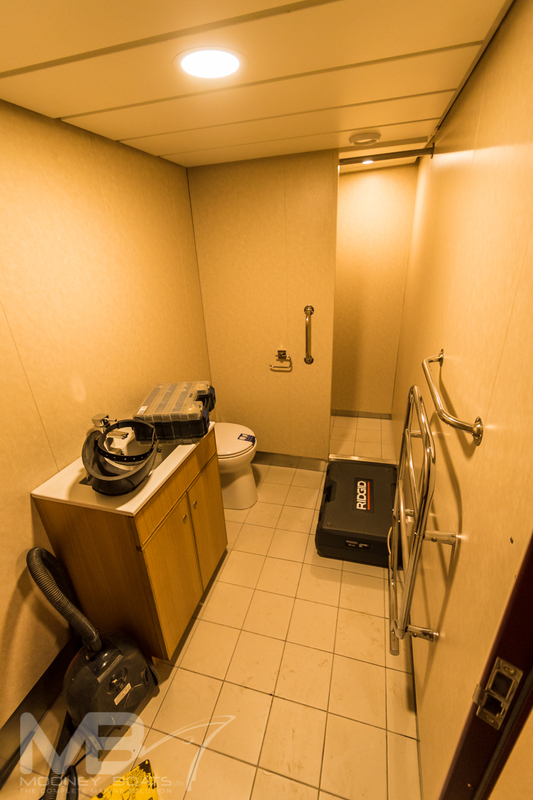 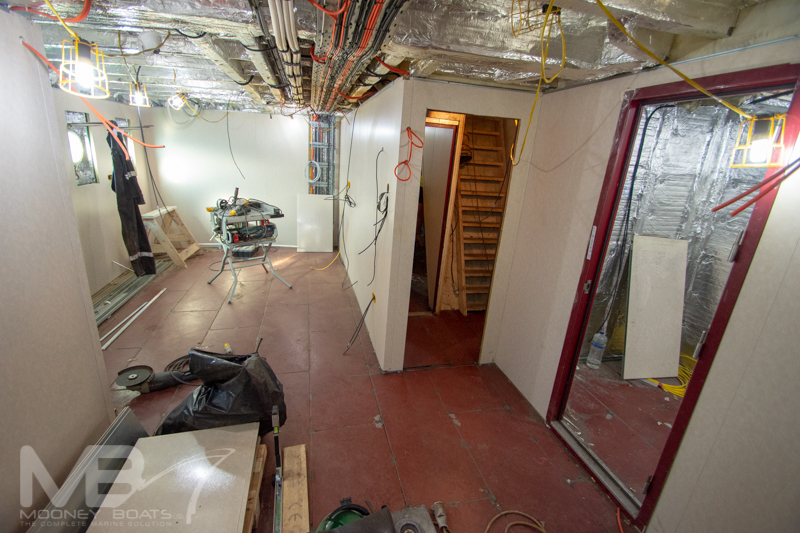 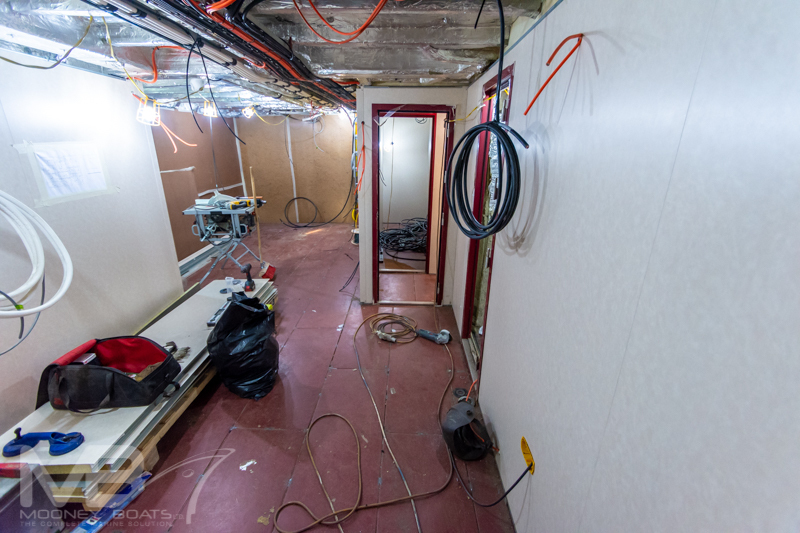 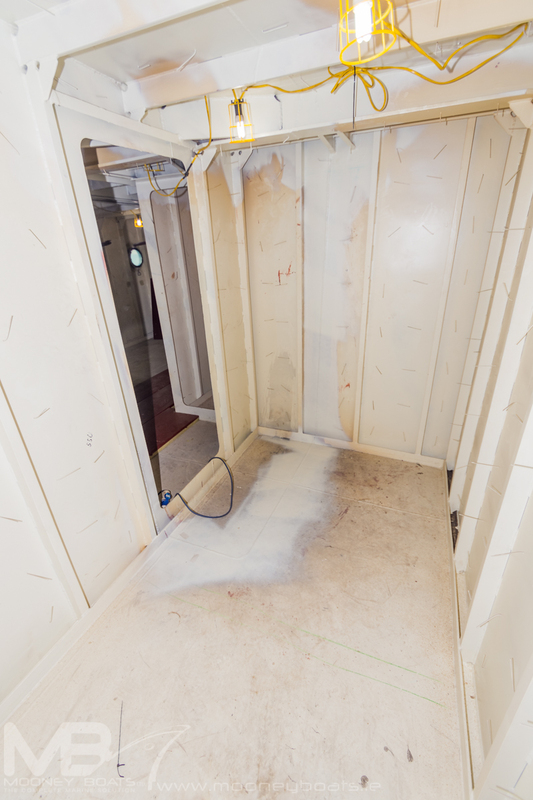 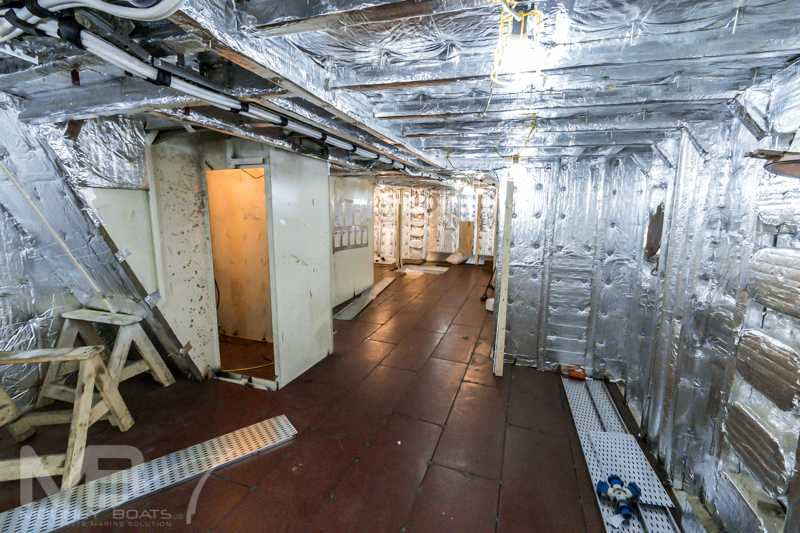 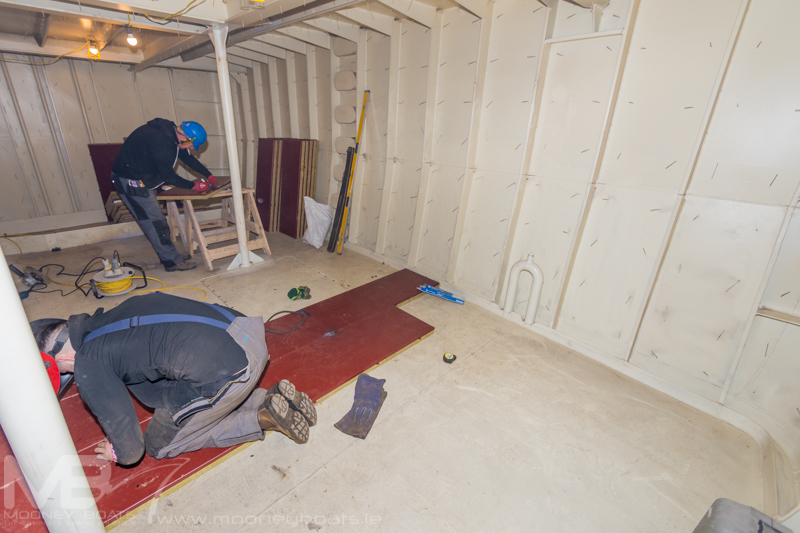 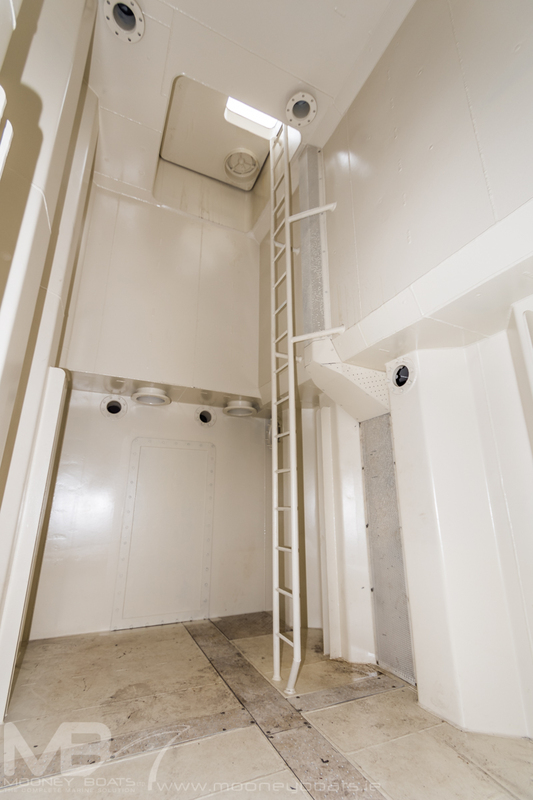 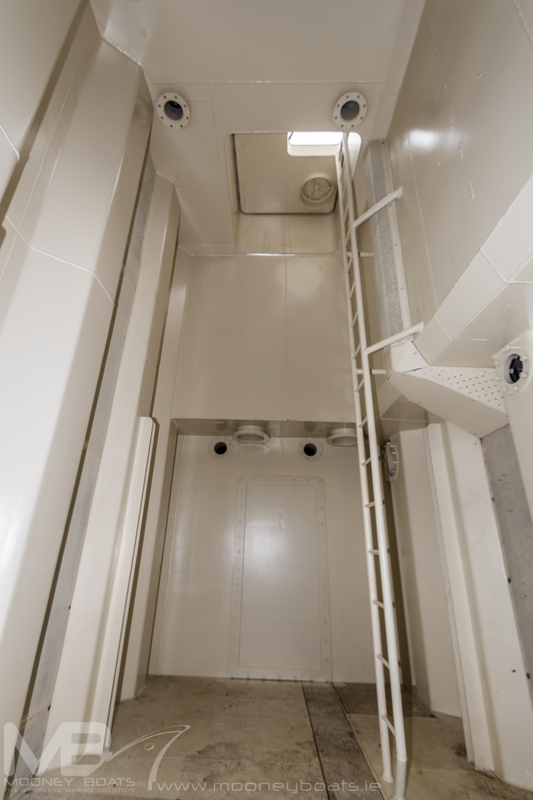 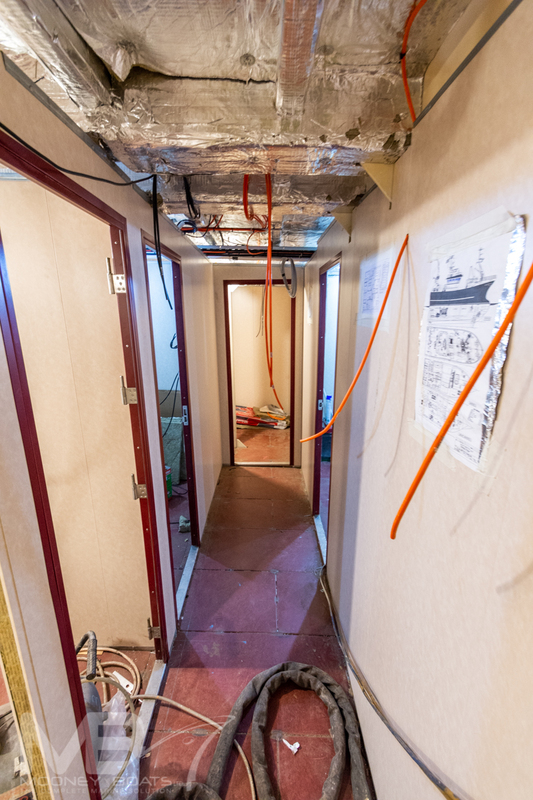 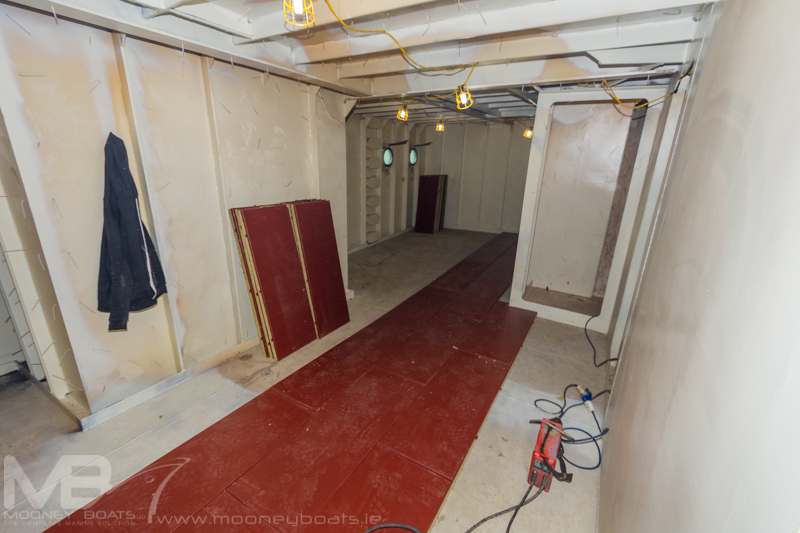 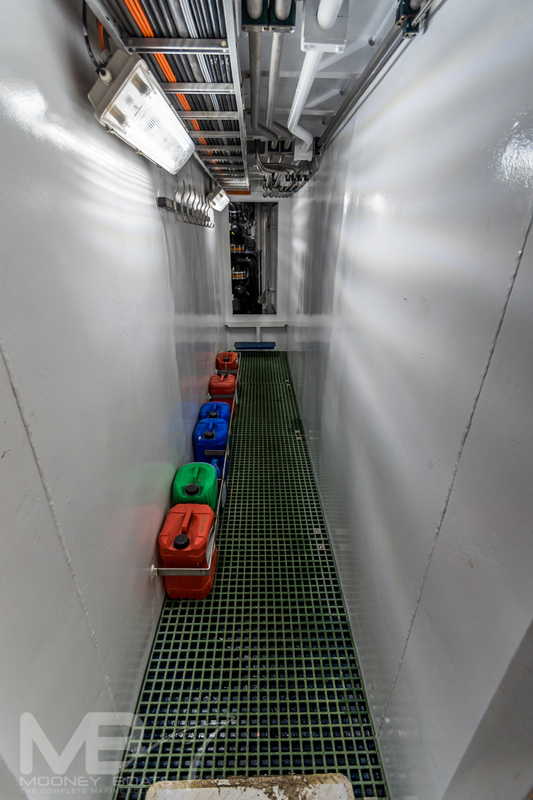 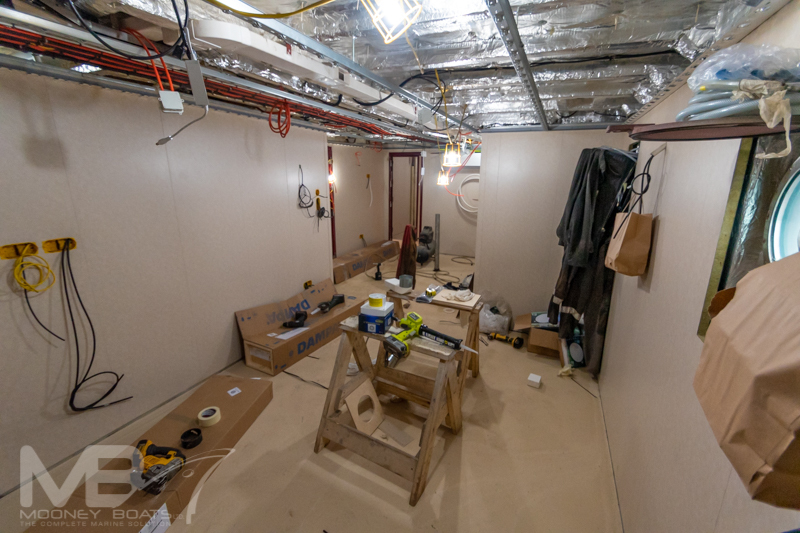 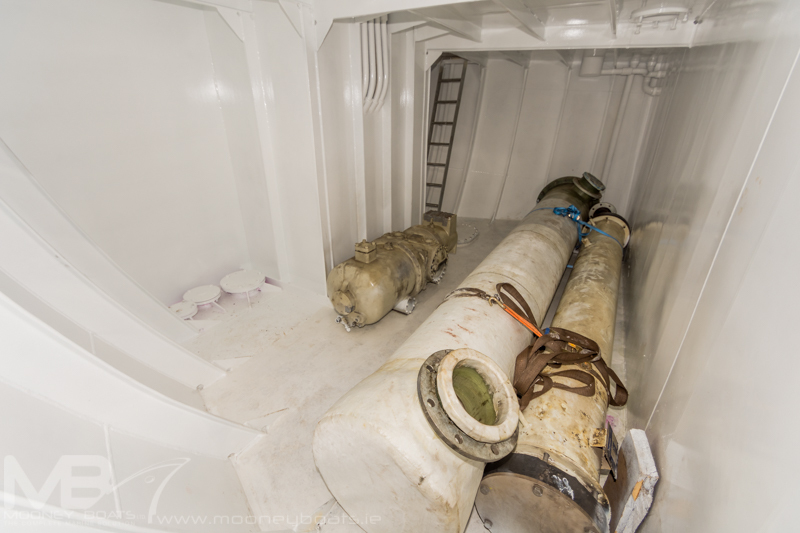 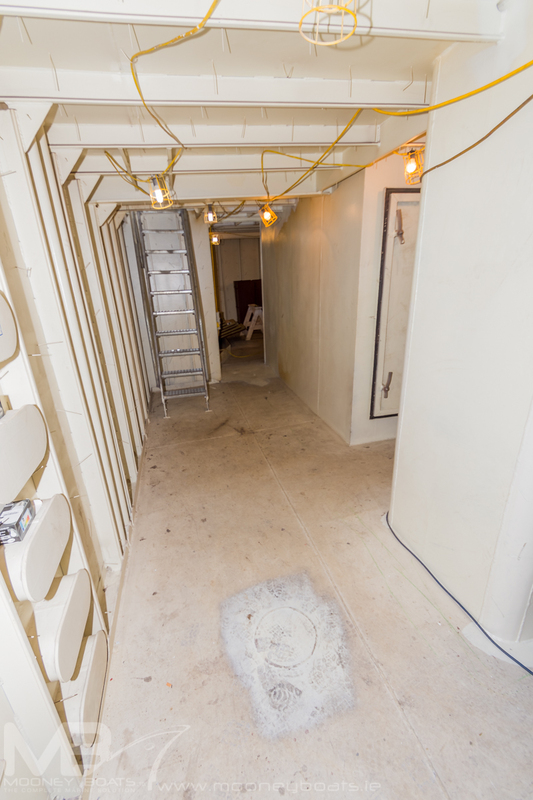 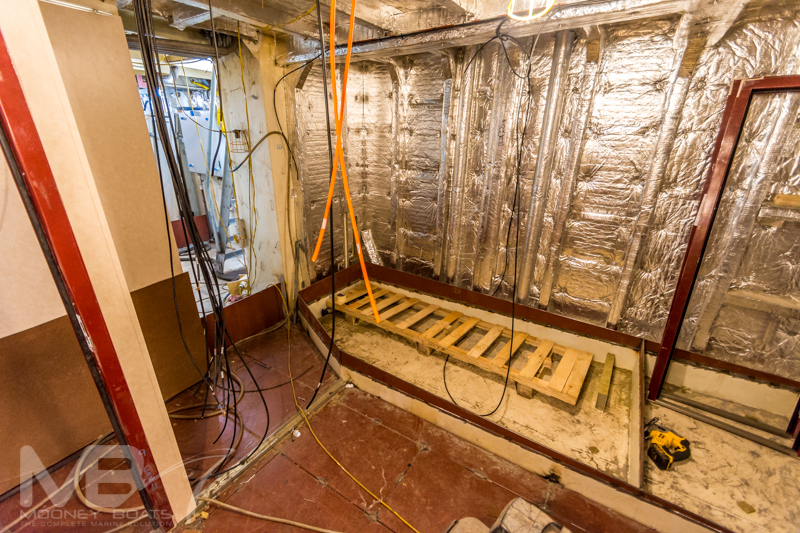 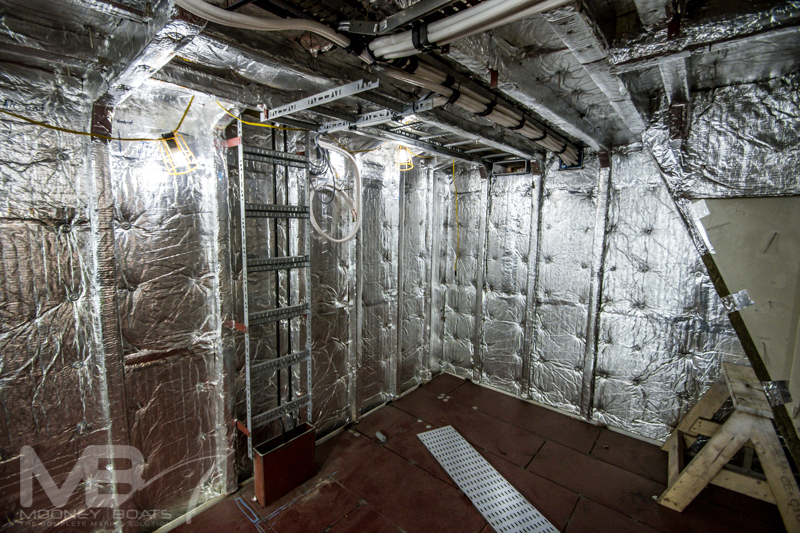 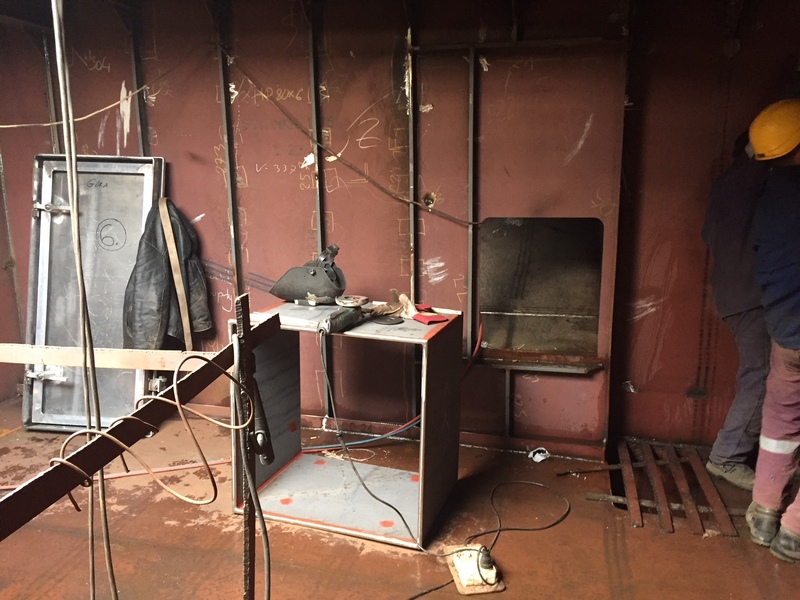 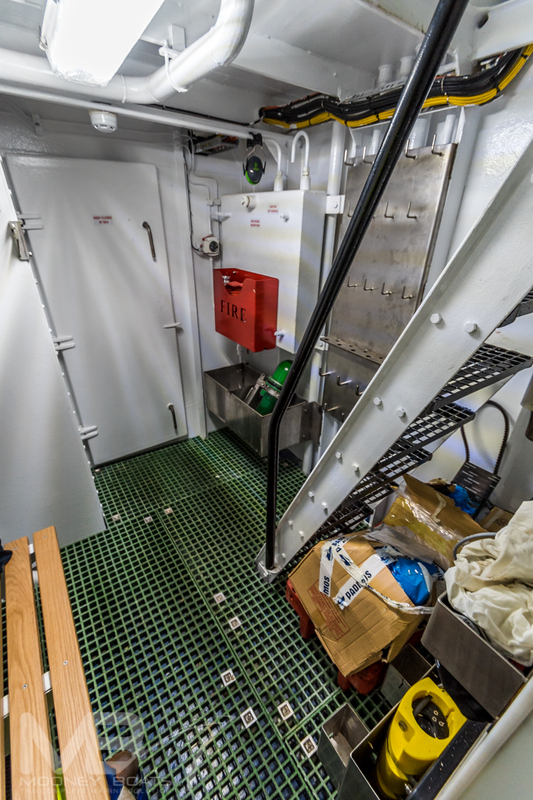 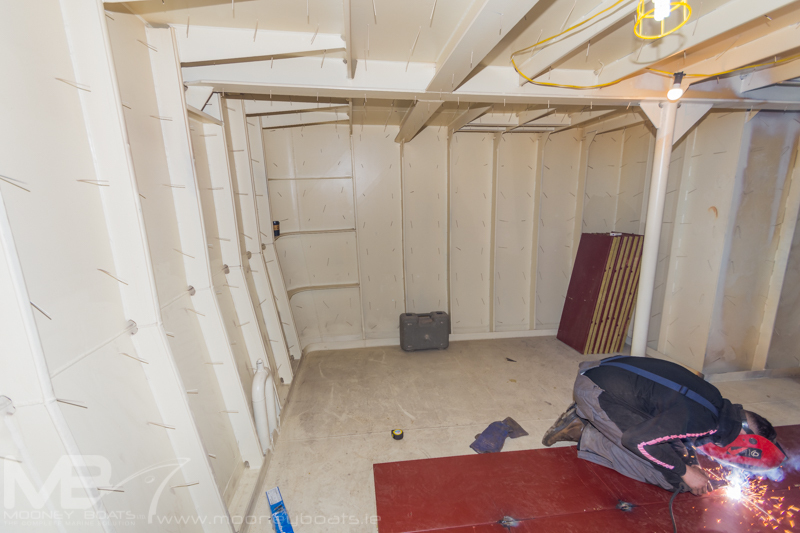 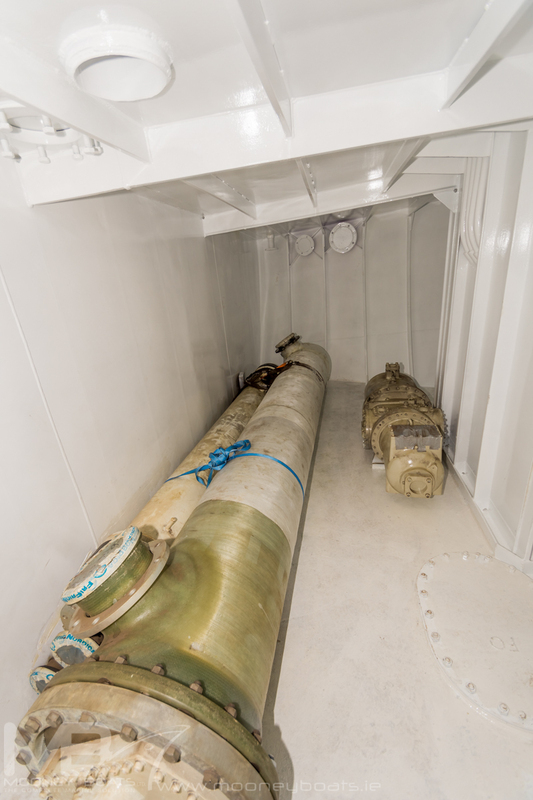 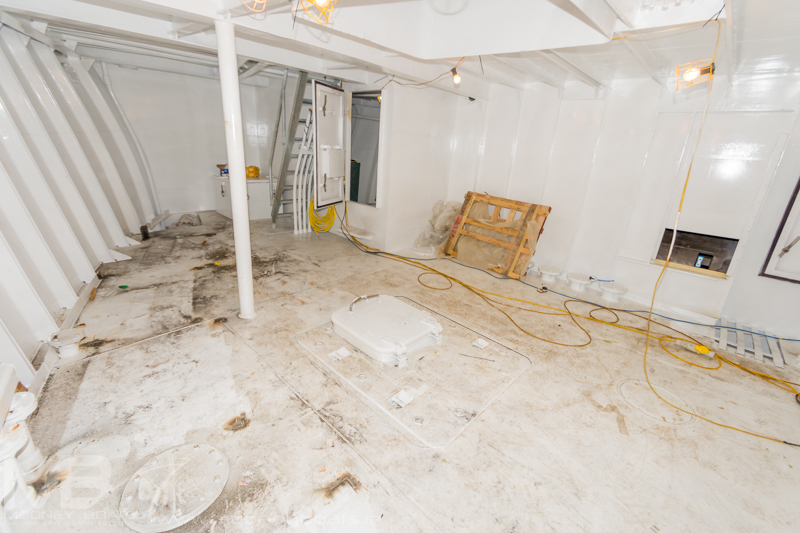 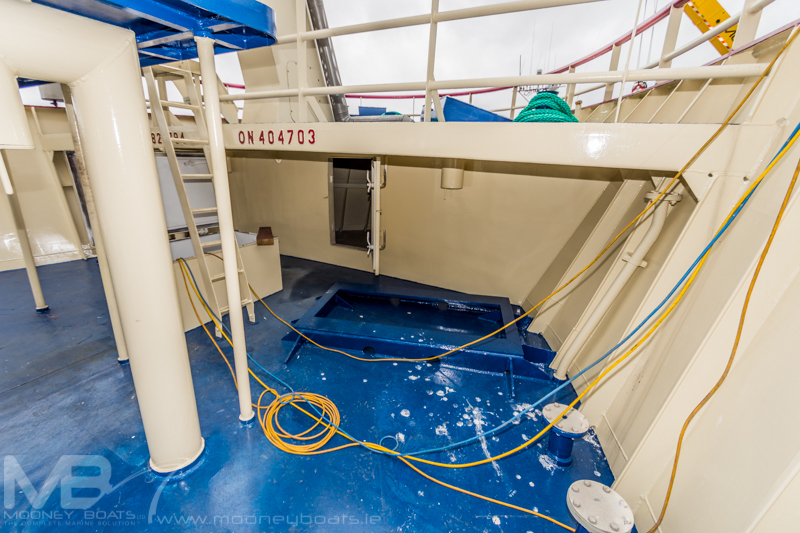 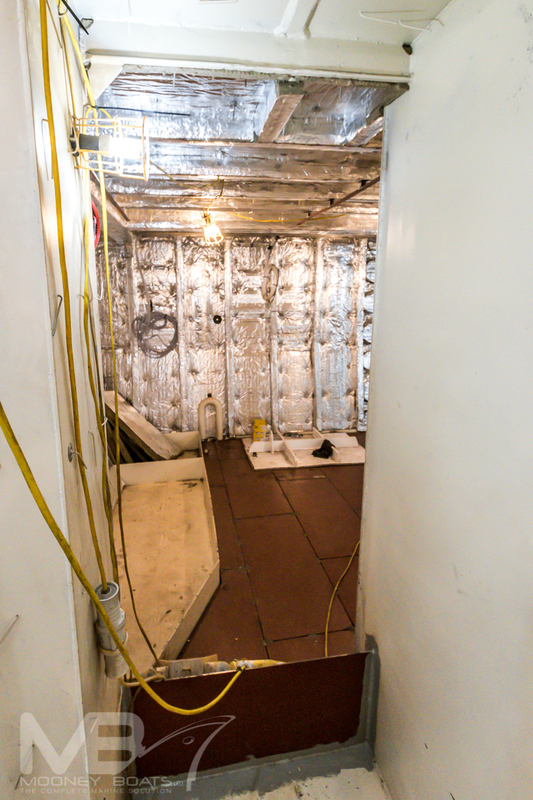 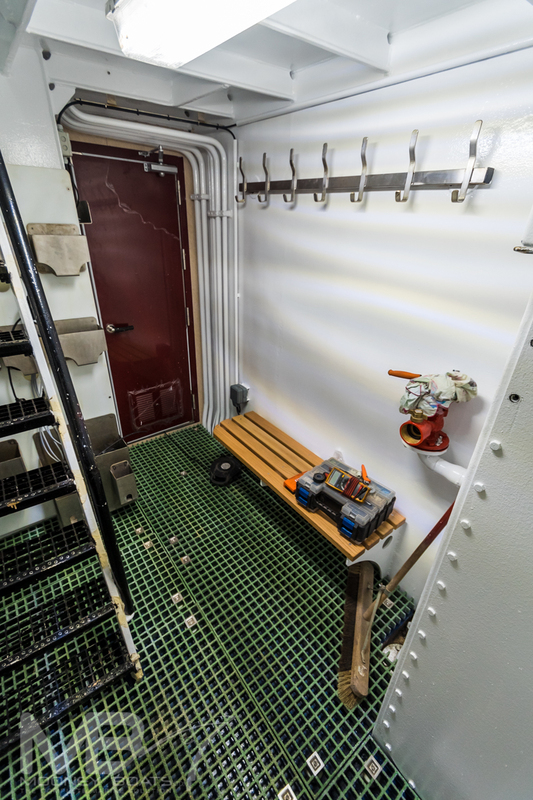 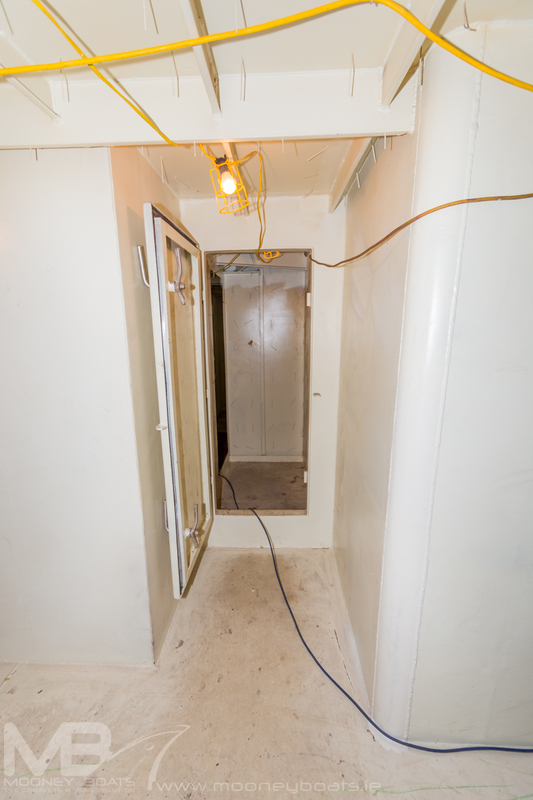 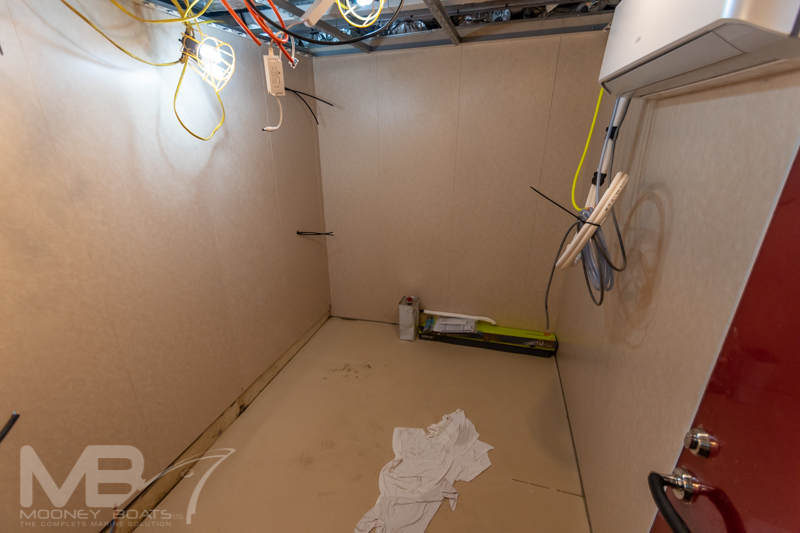 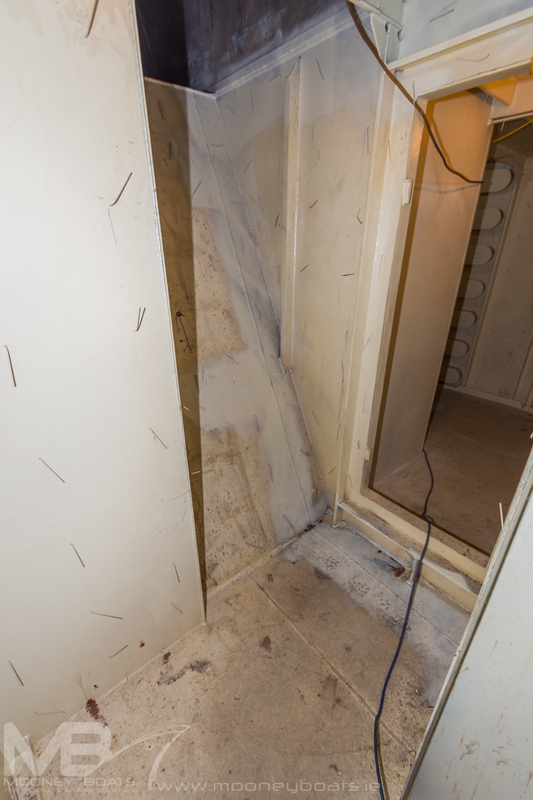 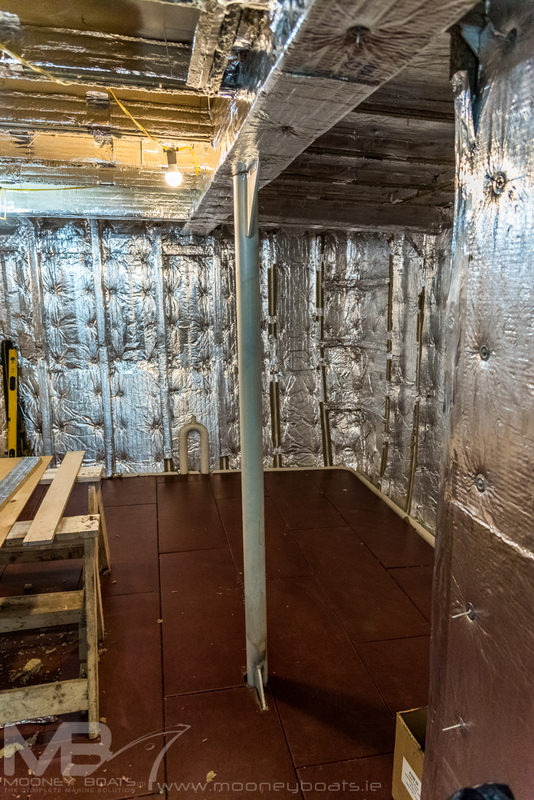 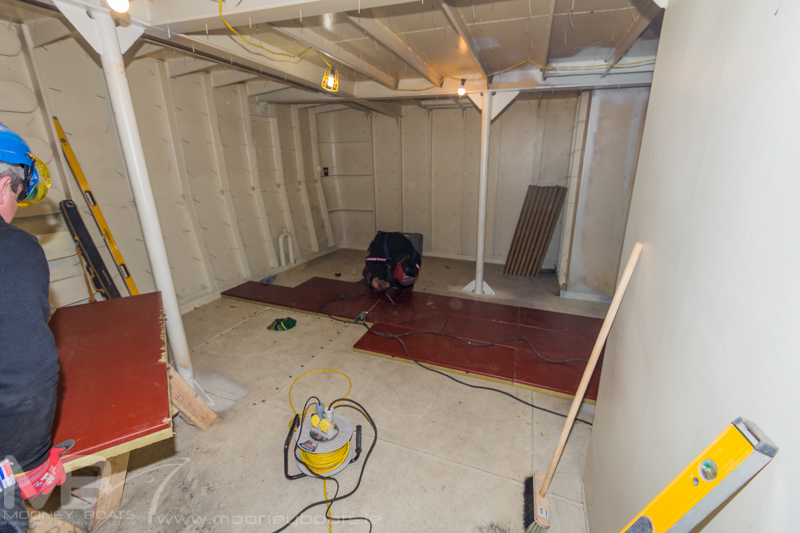 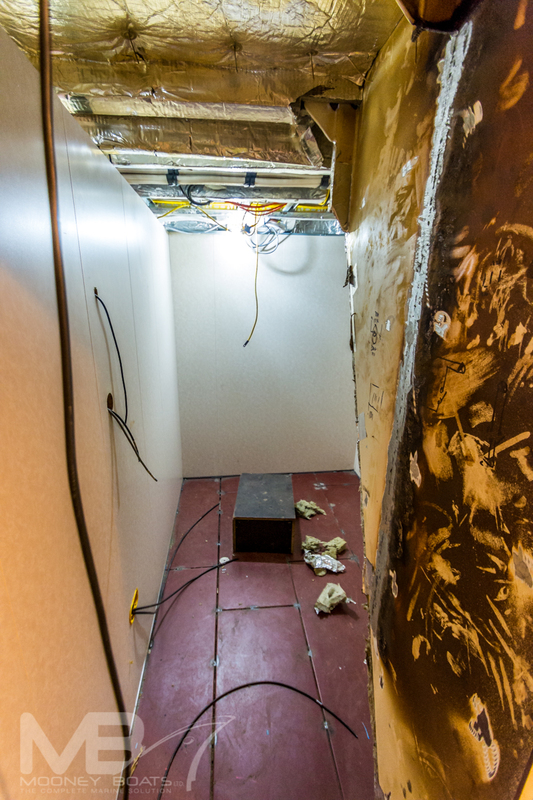 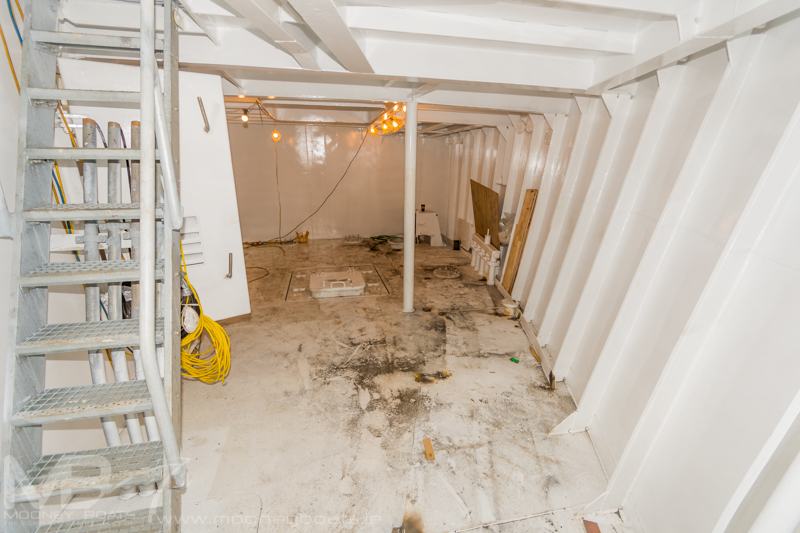 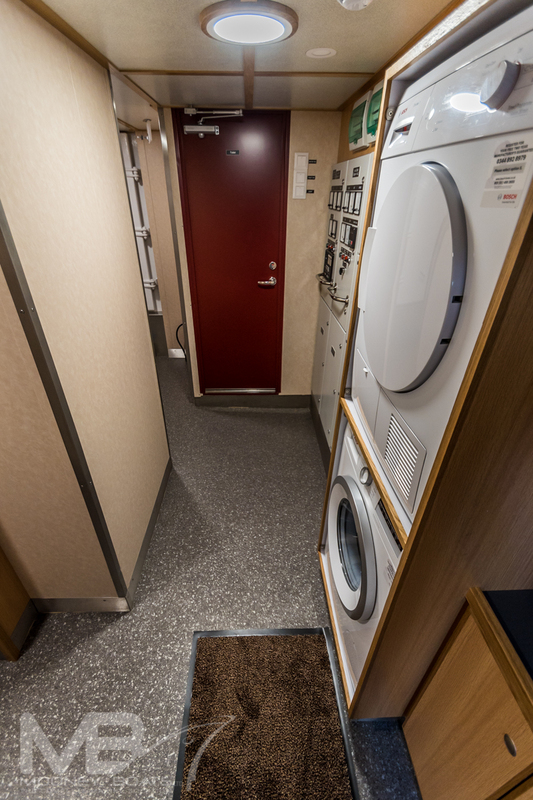 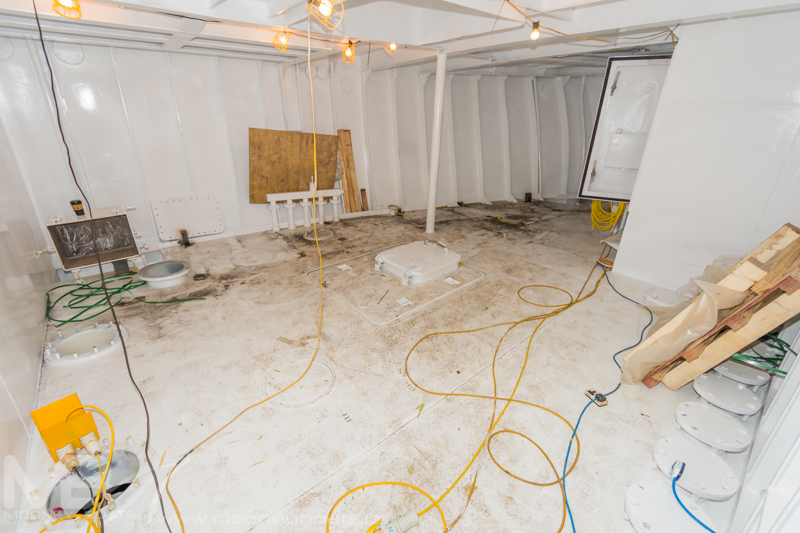 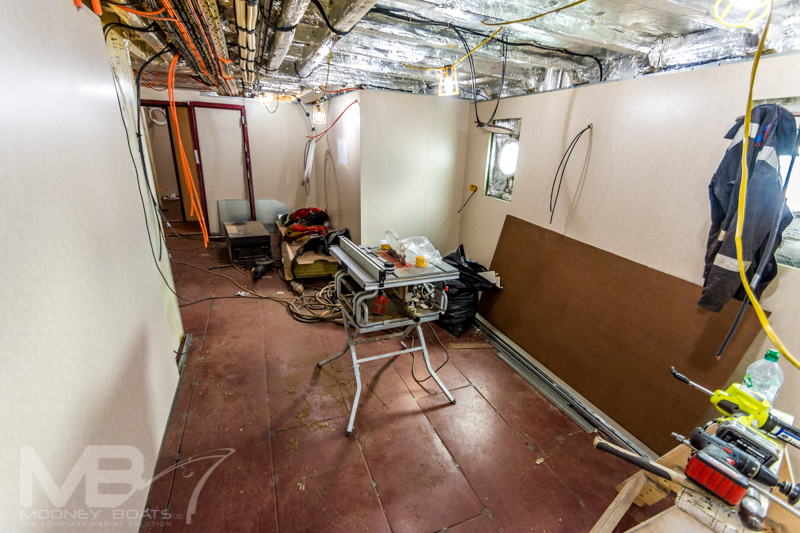 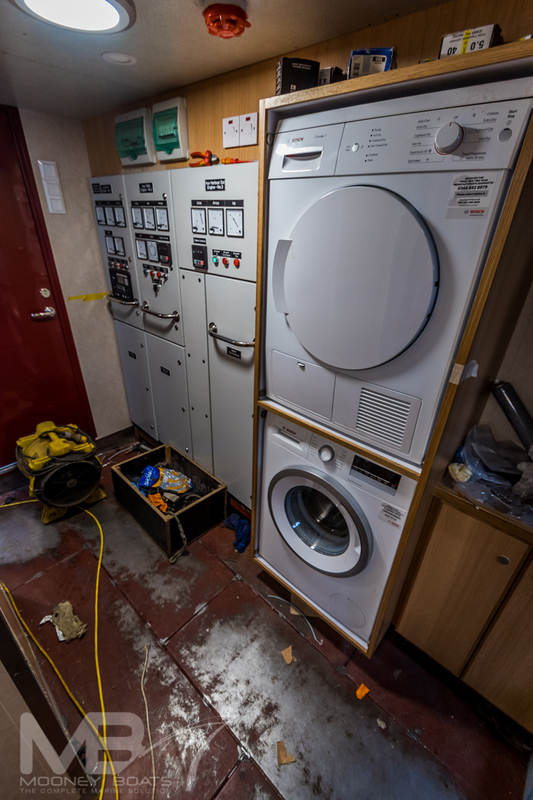 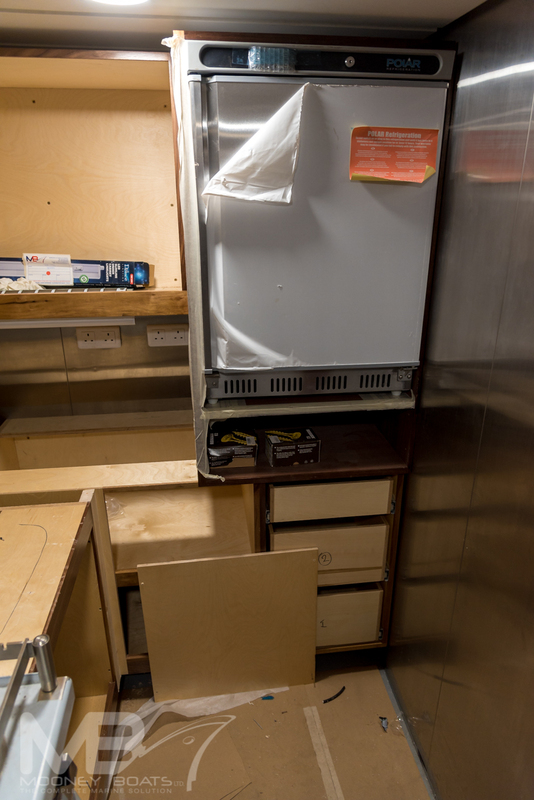 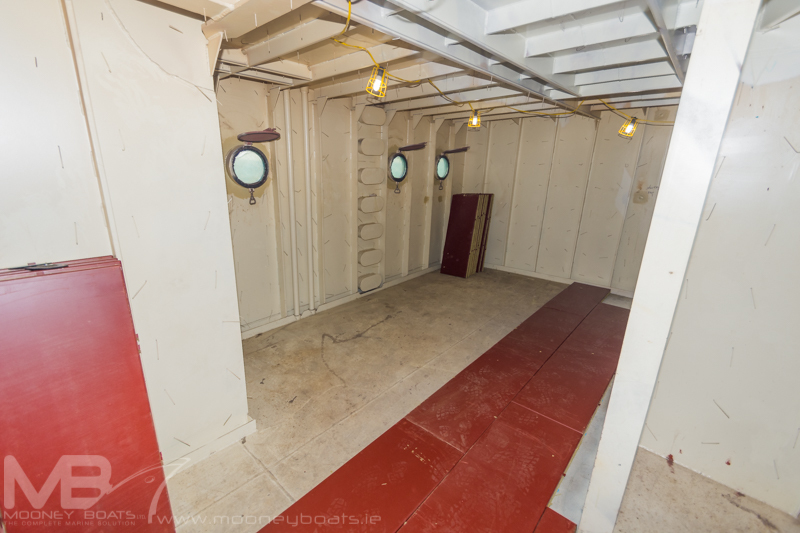 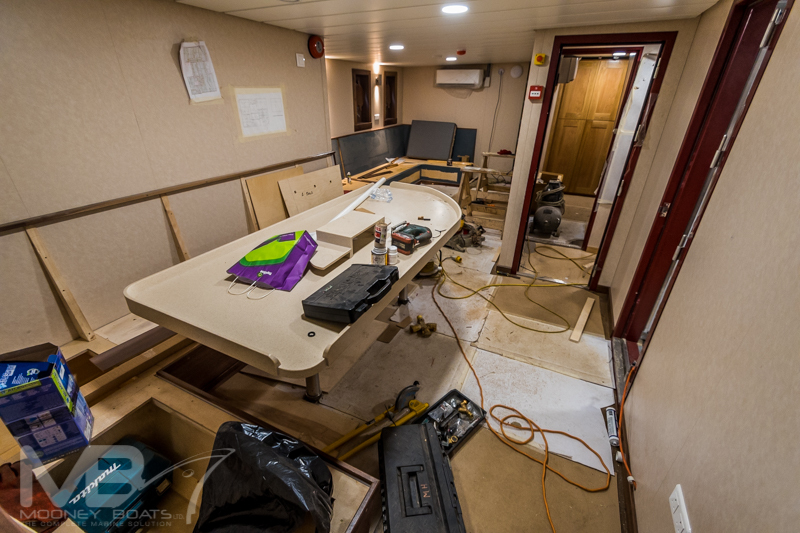 The deck house is accessed off the working deck on the starboard side via a crew changing room, which includes a heater, oil skin locker and a bench for the crew changing into their gear. 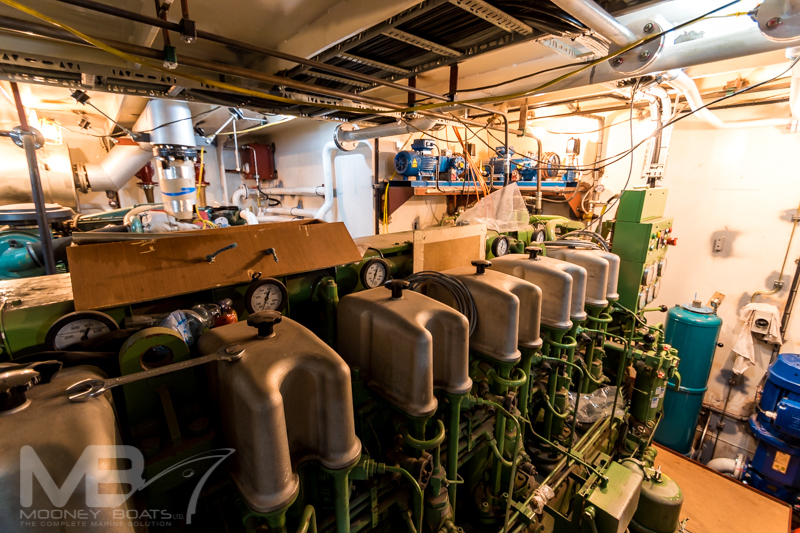 Going forward through a watertight bulkhead door you are taken into the control room, Turn to port takes you into to the galley and wheelhouse access area, turn right you have the washing machine and laundry area and going forward you have the main switch board and access to the engine room and there is also access to shelter deck forward. 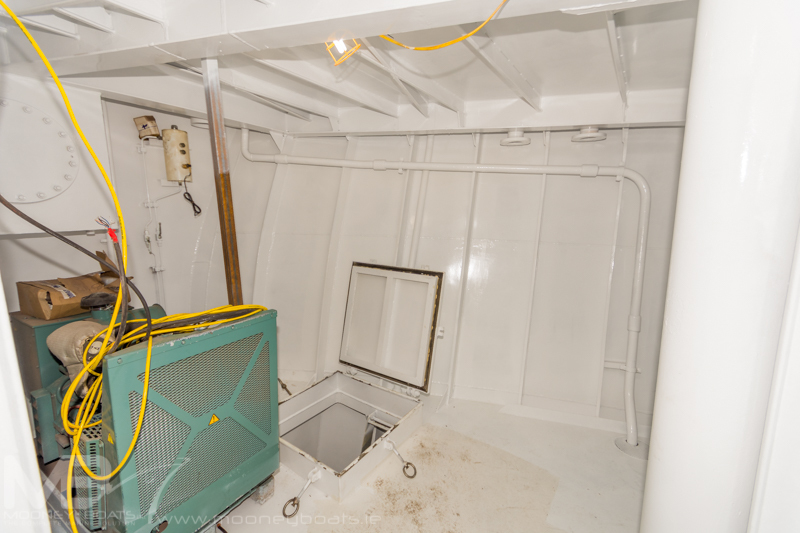 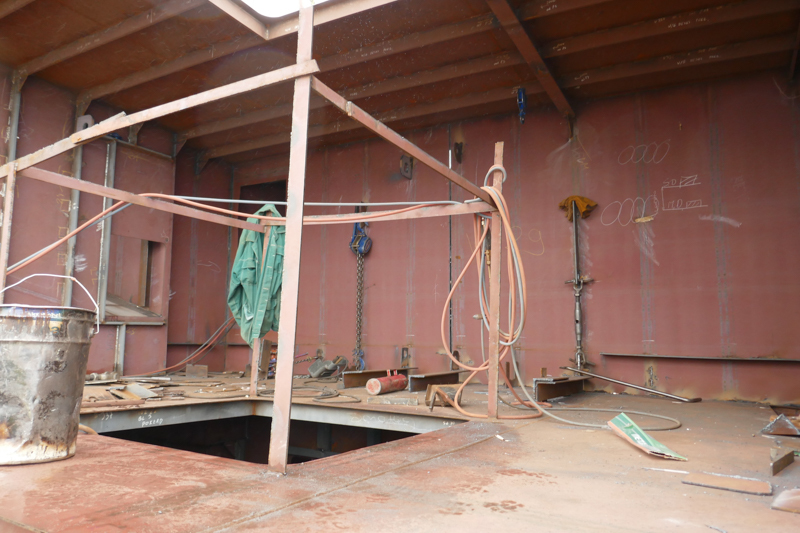 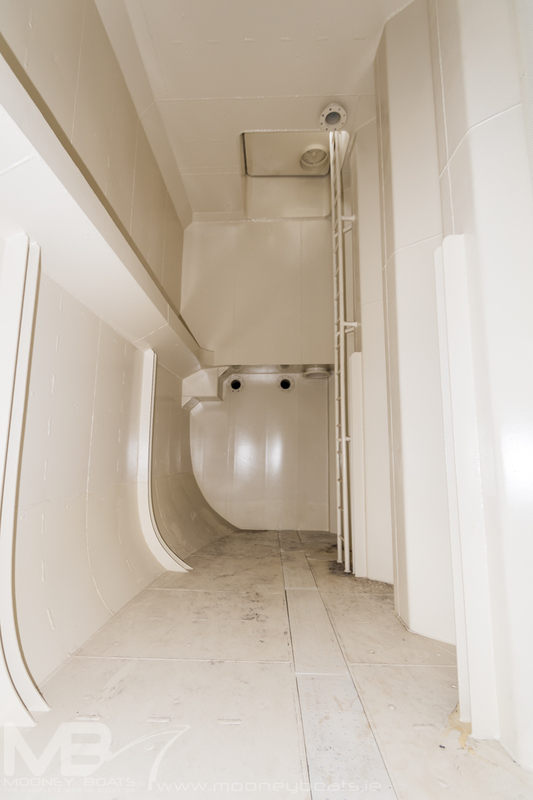 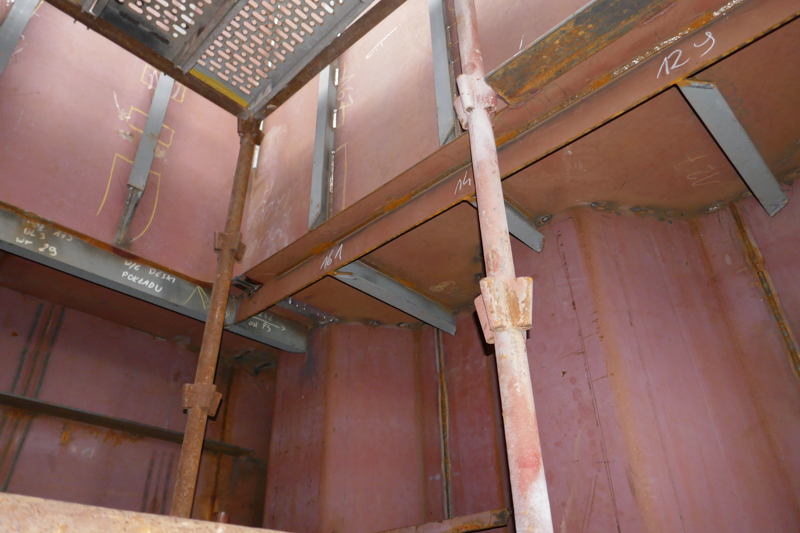 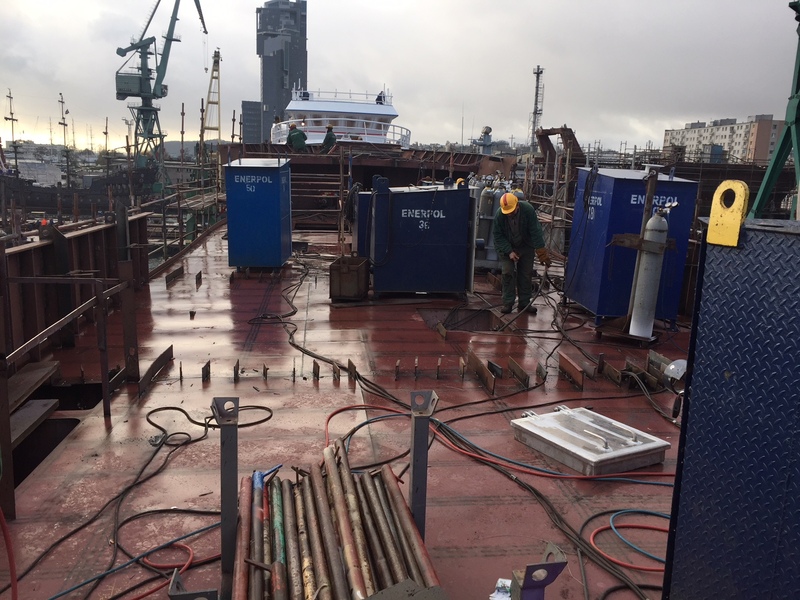 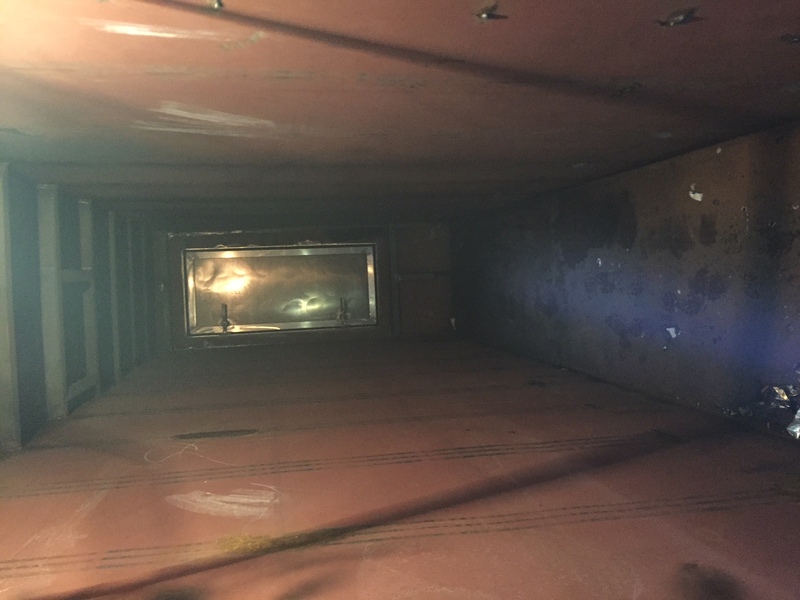 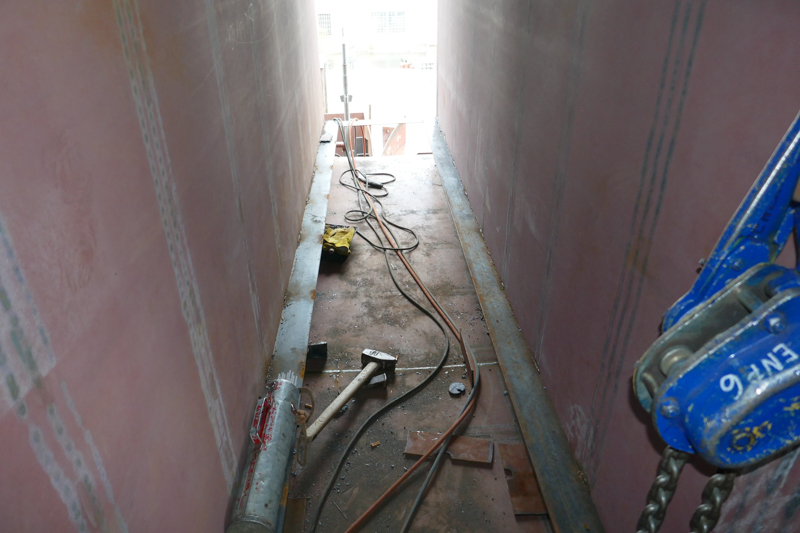 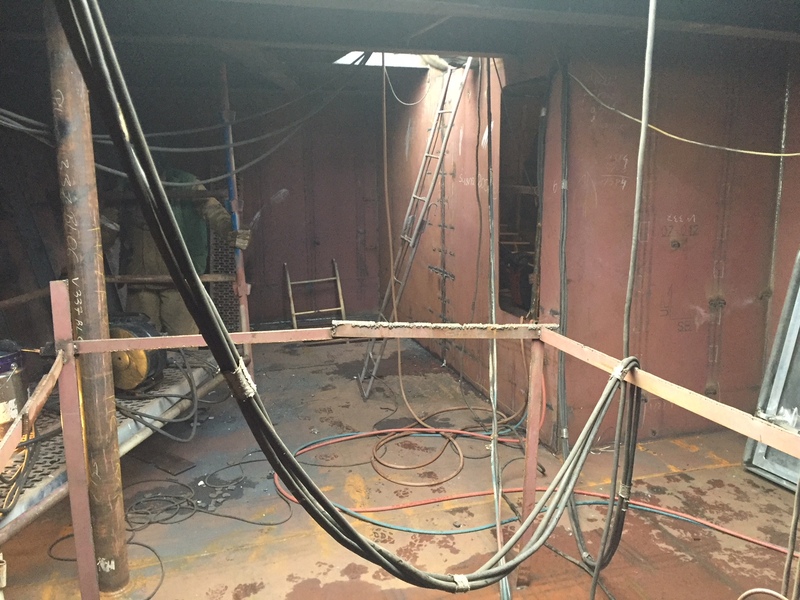 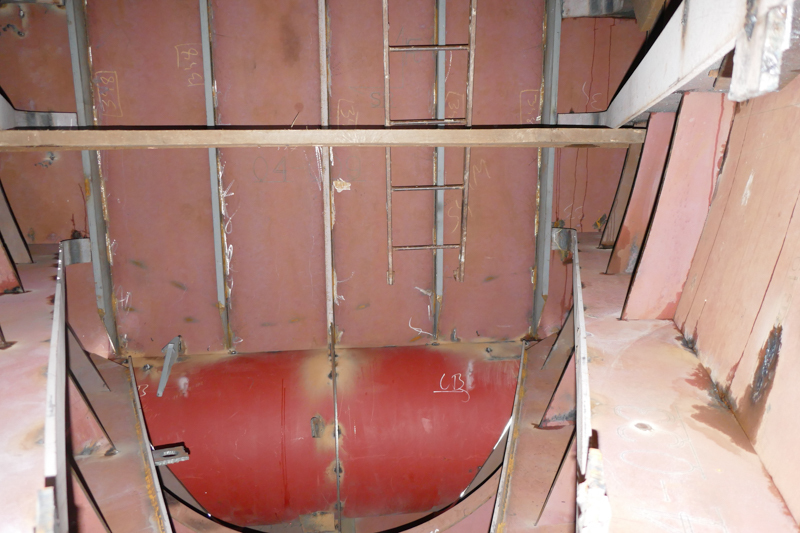 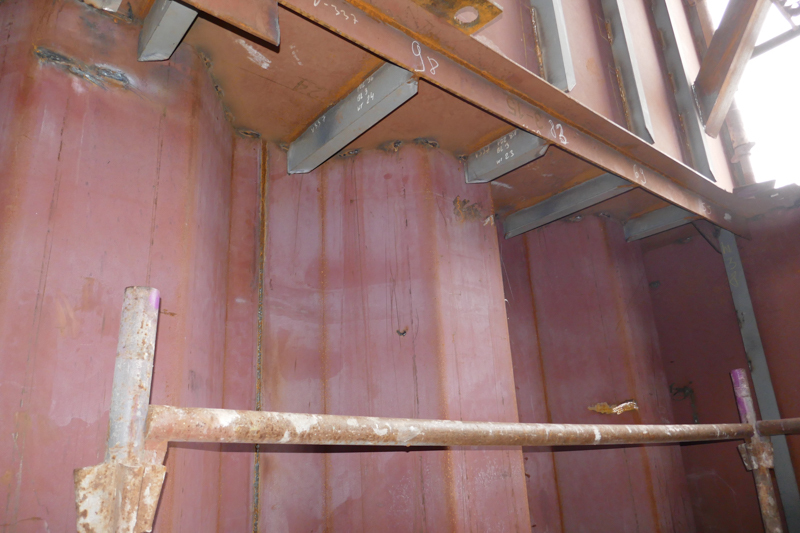 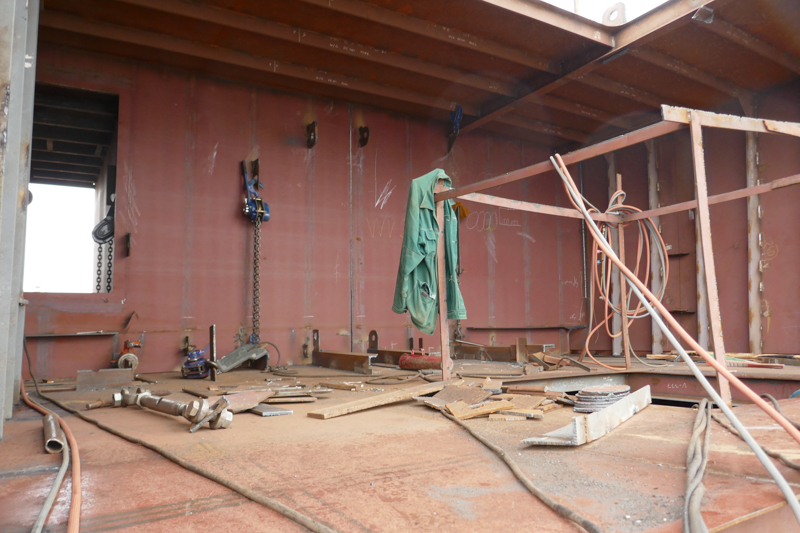 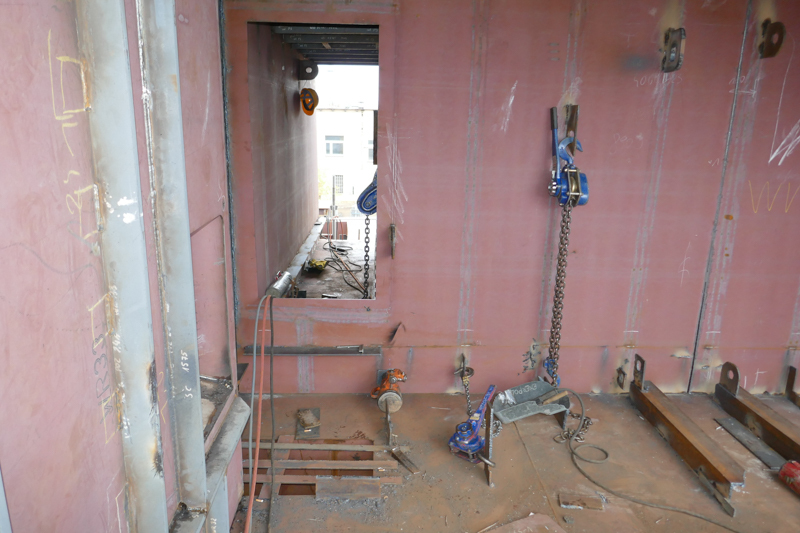 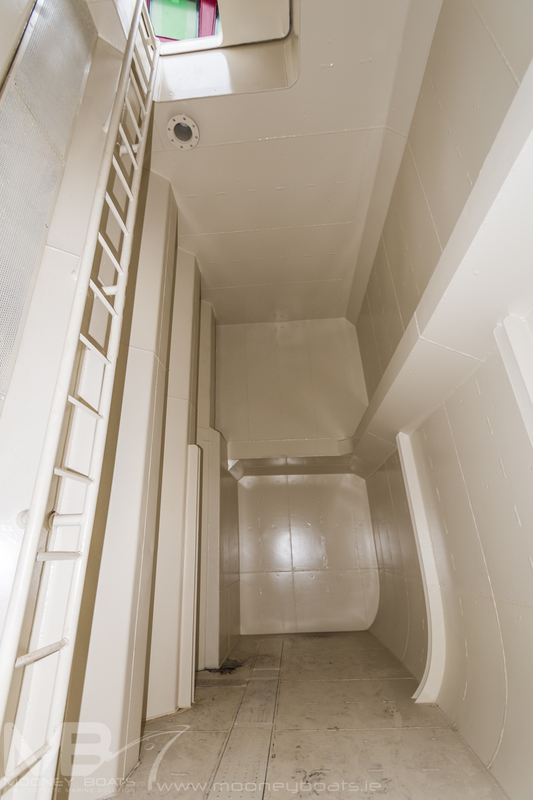 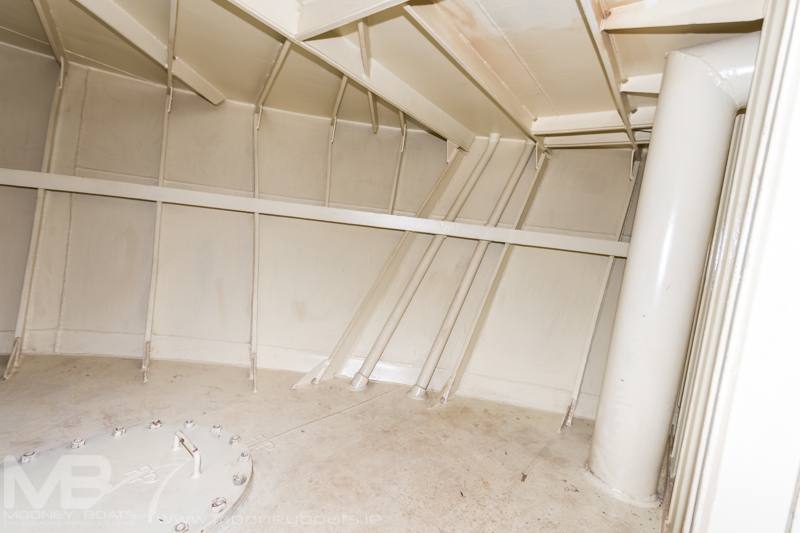 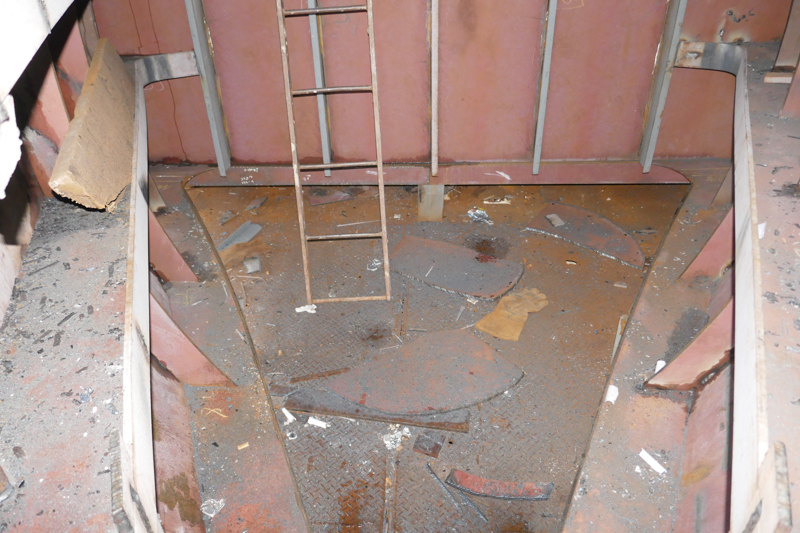 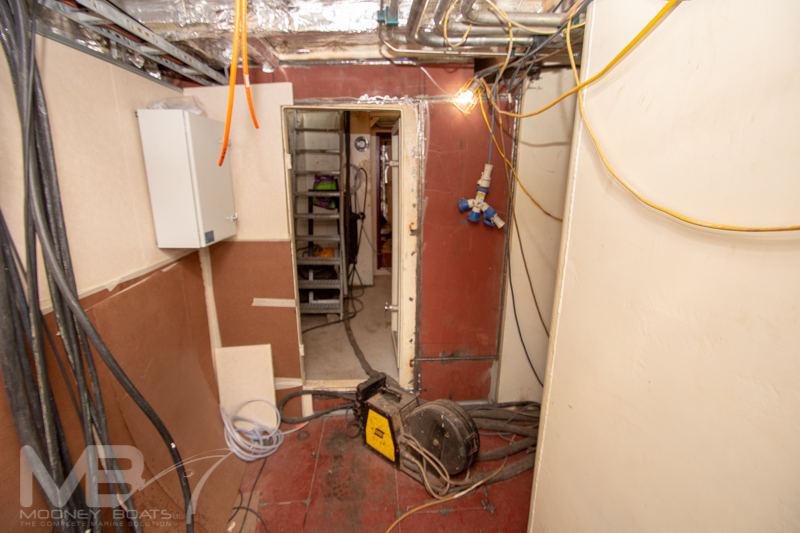 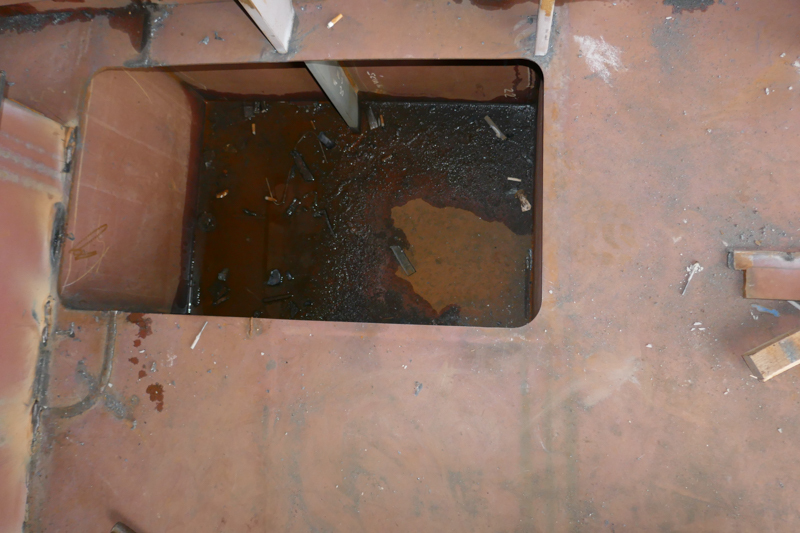 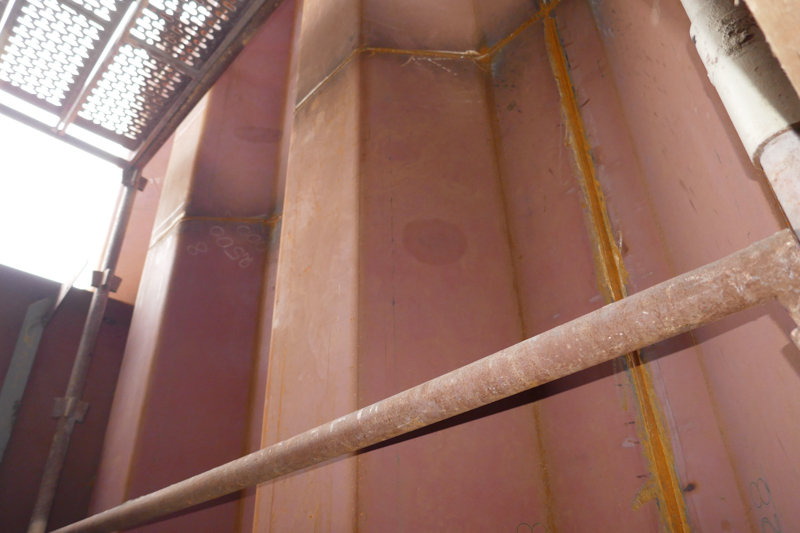 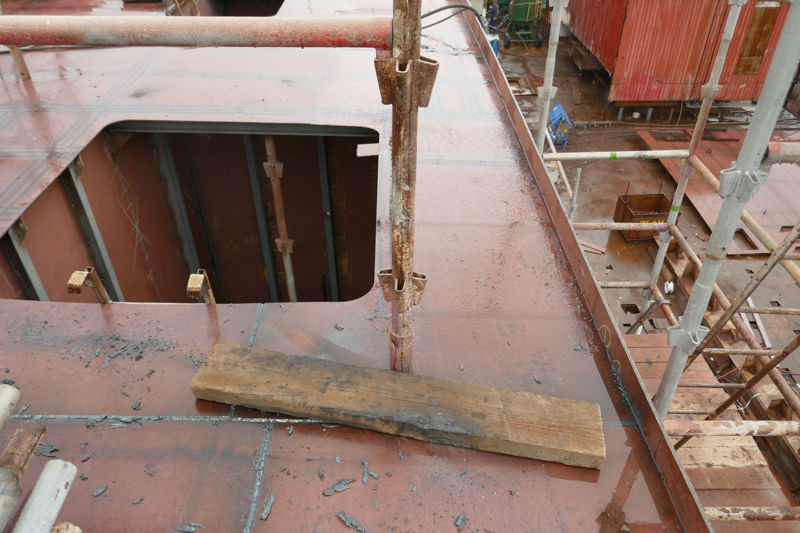 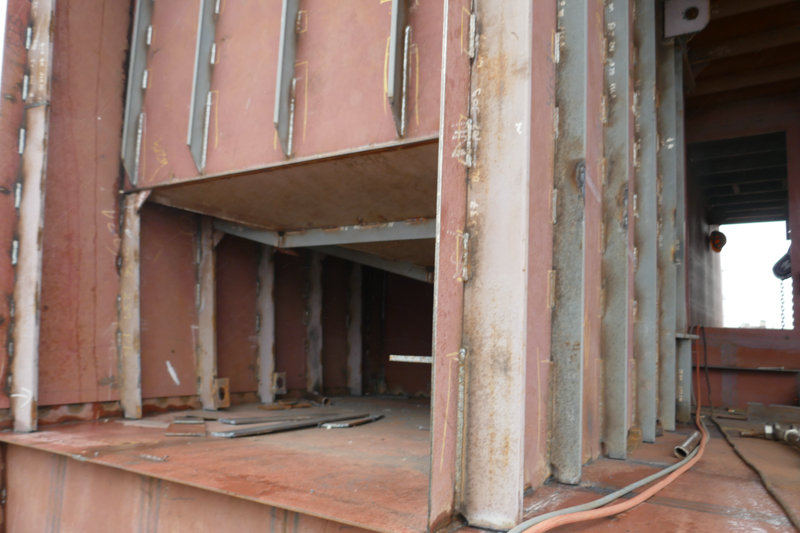 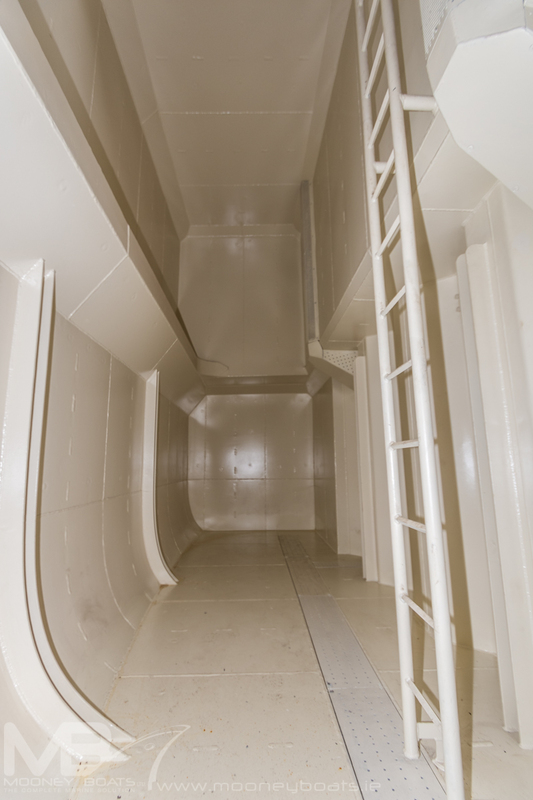 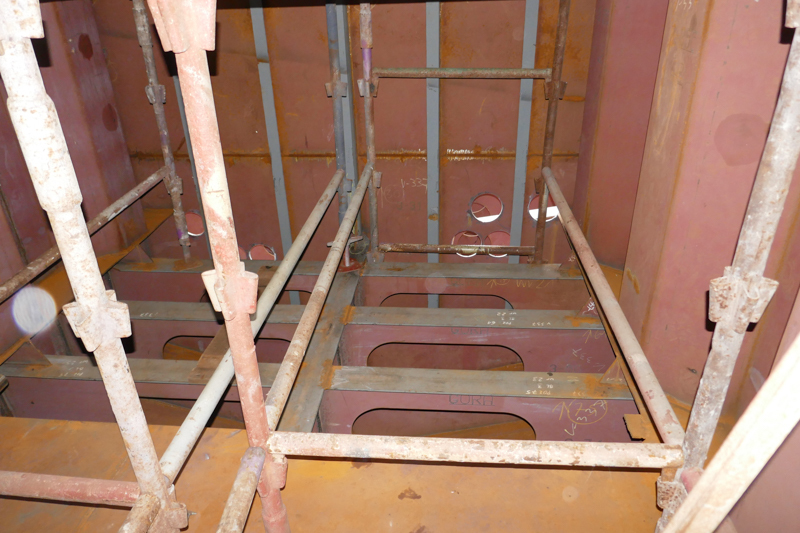 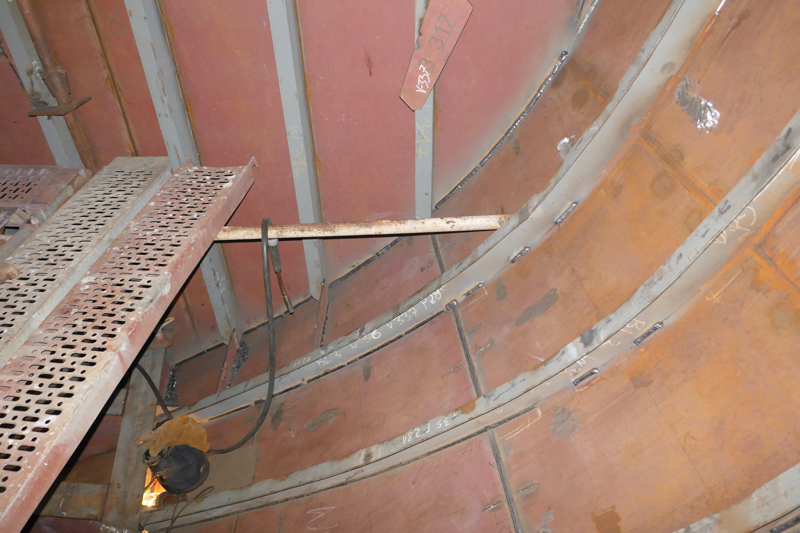 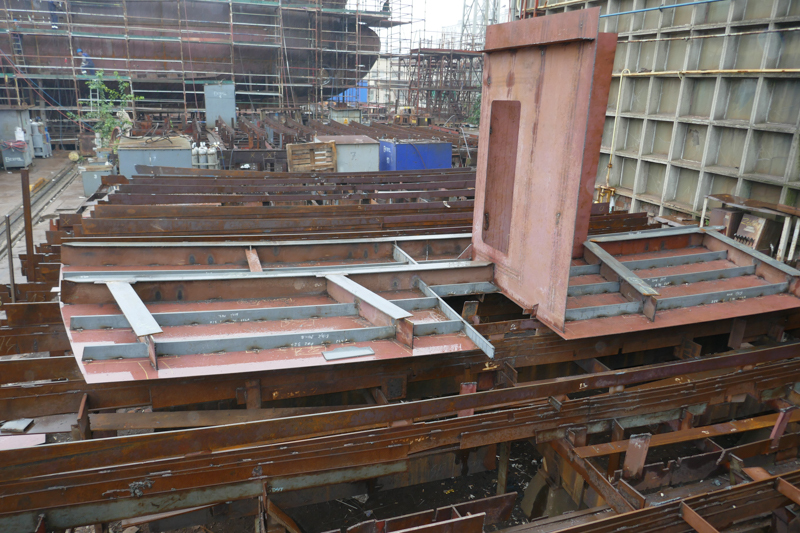 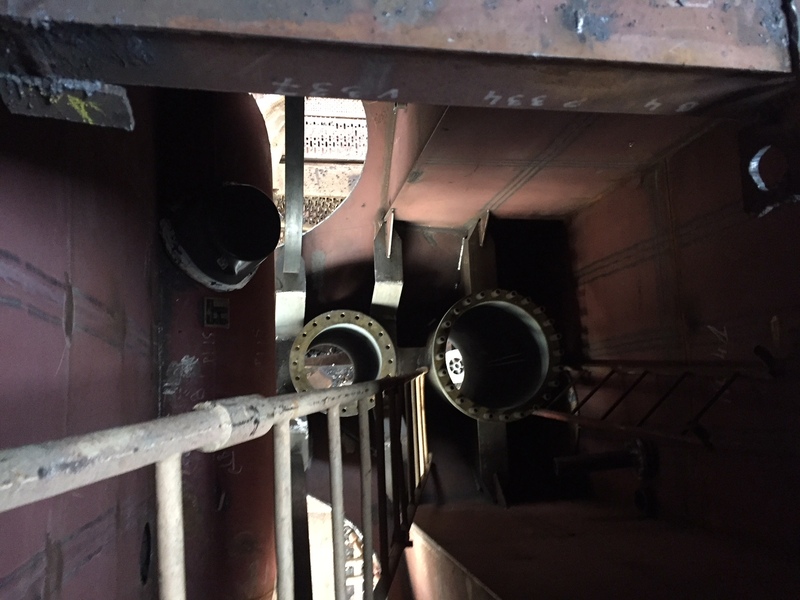 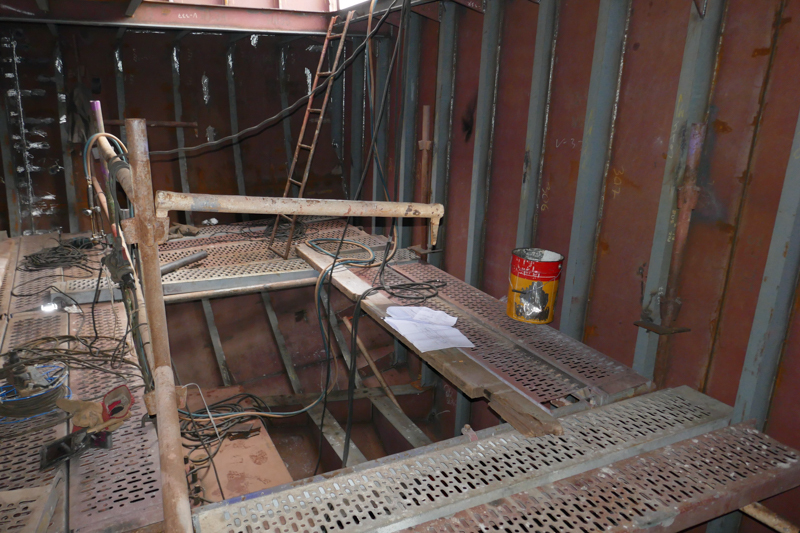 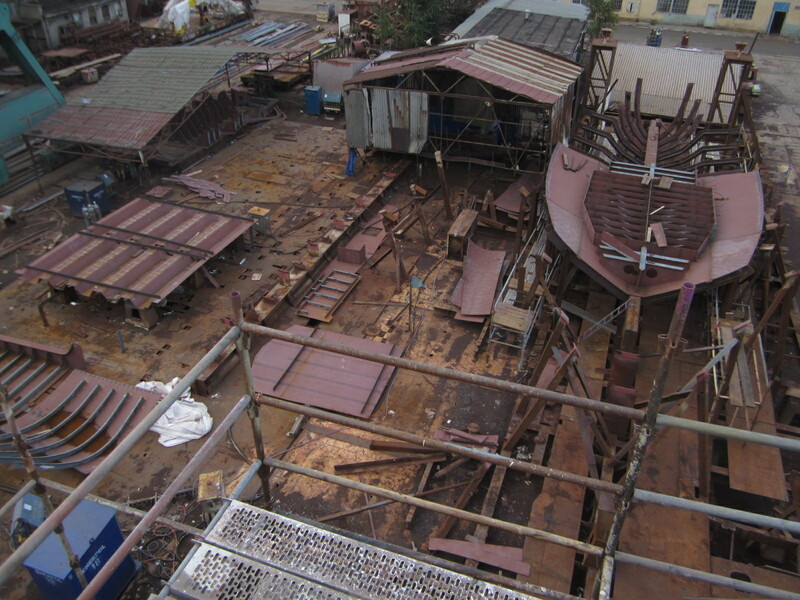 The vessel owner also decided he wanted a separate WC on this deck so that the crew would not have to access common crew areas when in there working gear and the yard fitted a WC amidships which can be accessed for shelter deck and main deck without having to enter crew accommodation areas. 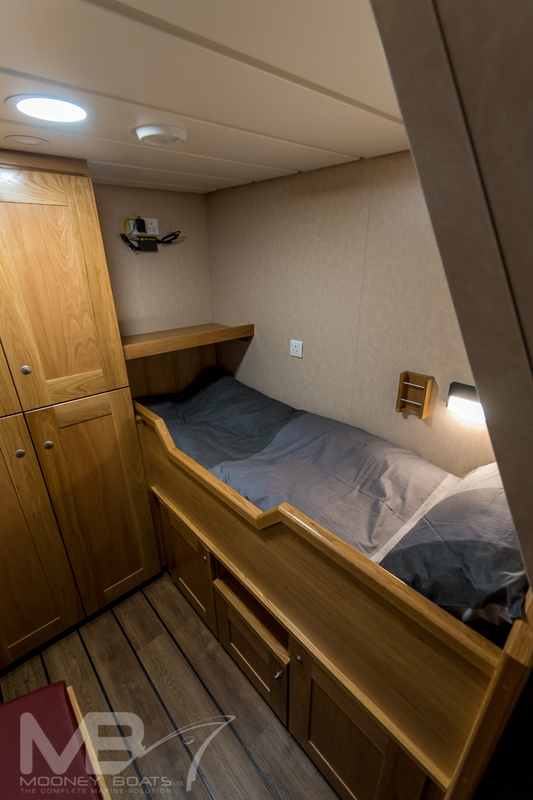 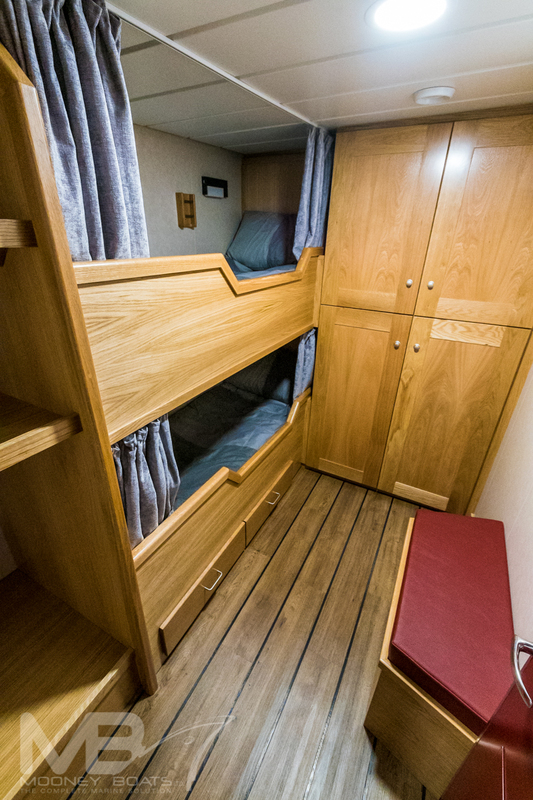 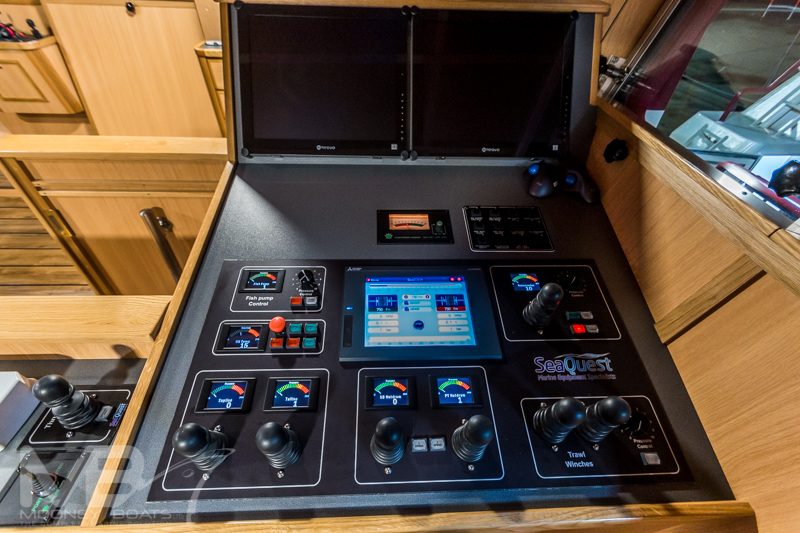 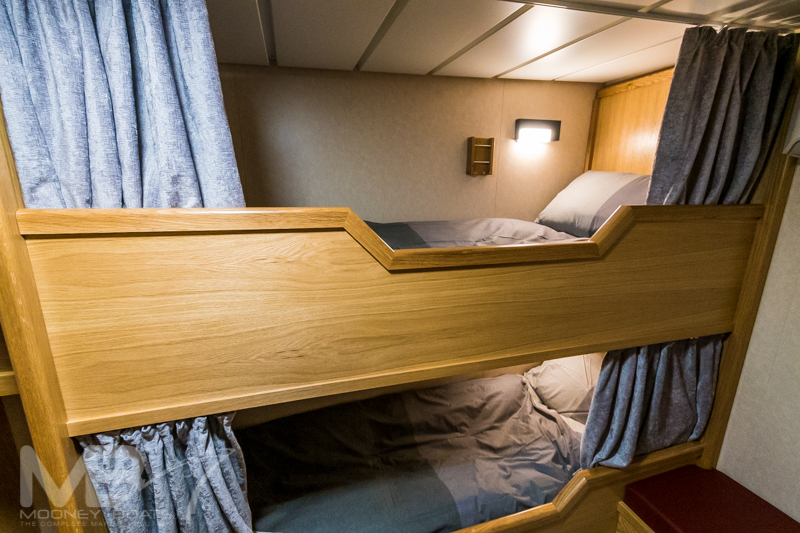 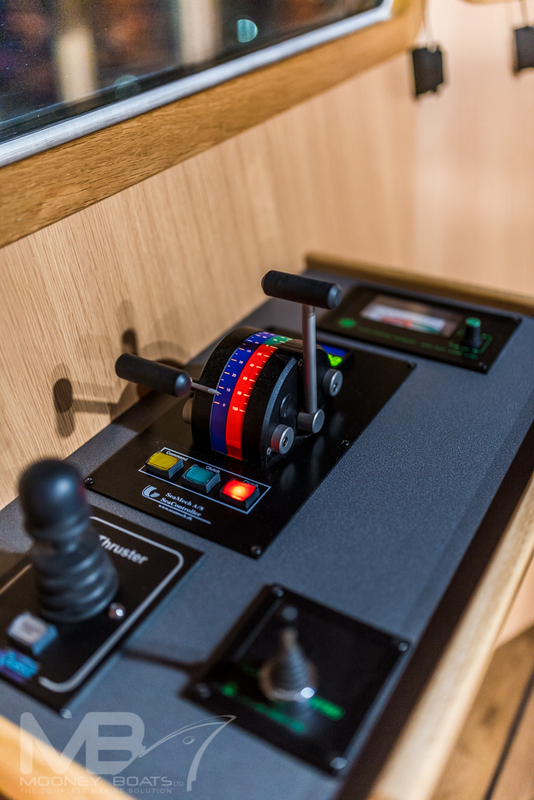 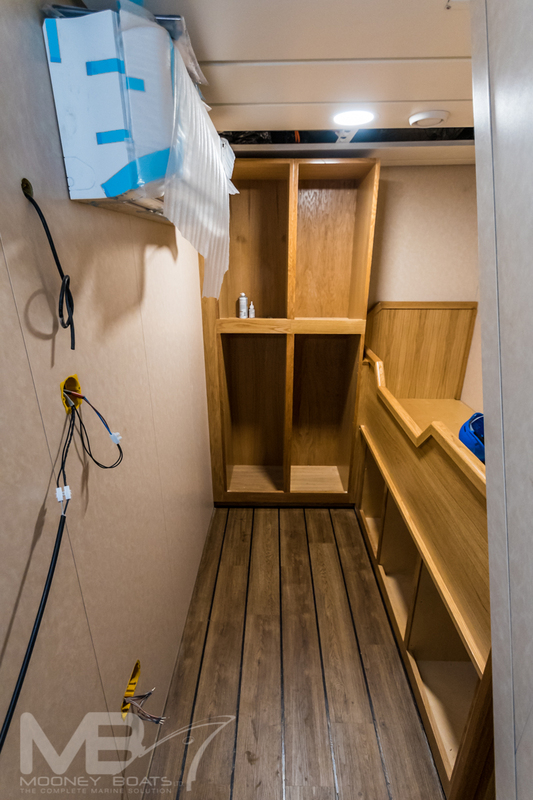 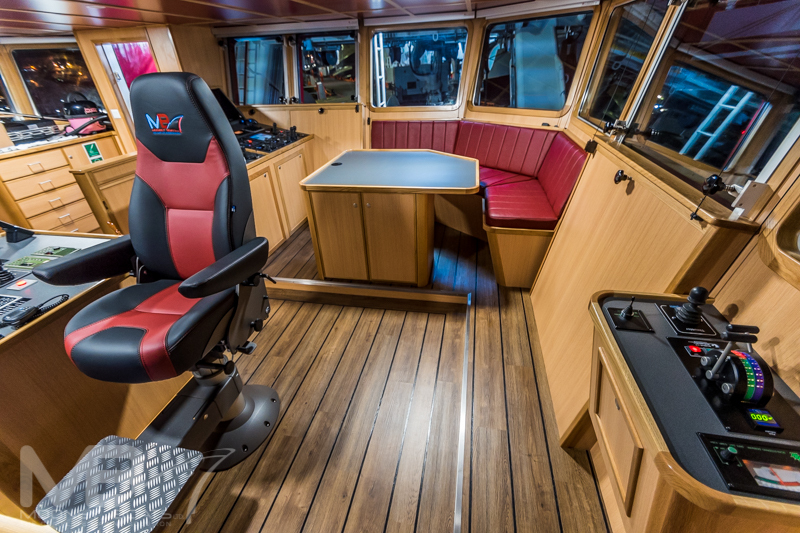 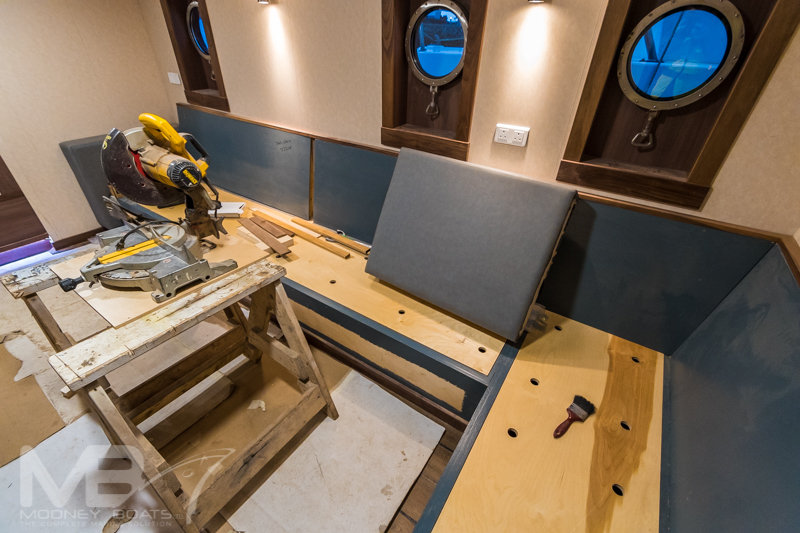 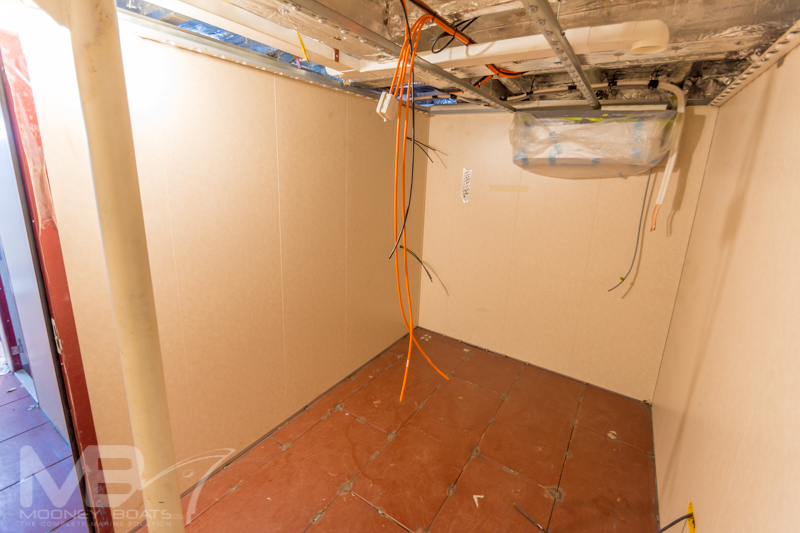 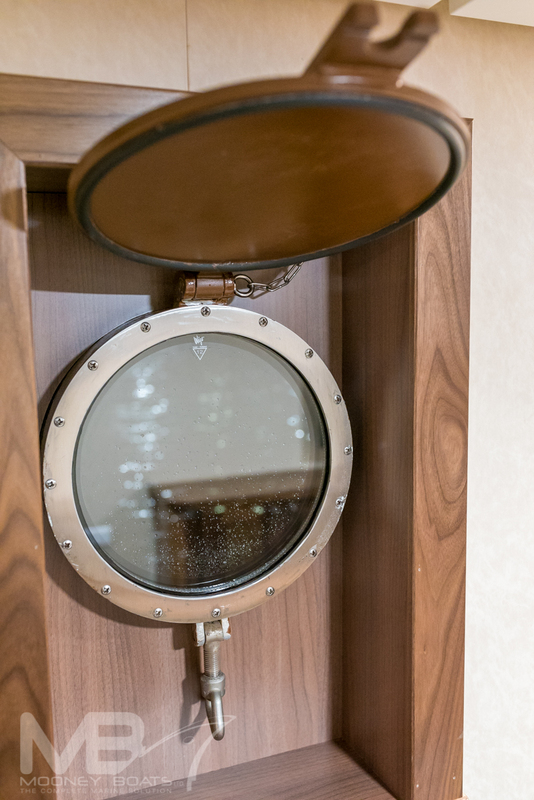 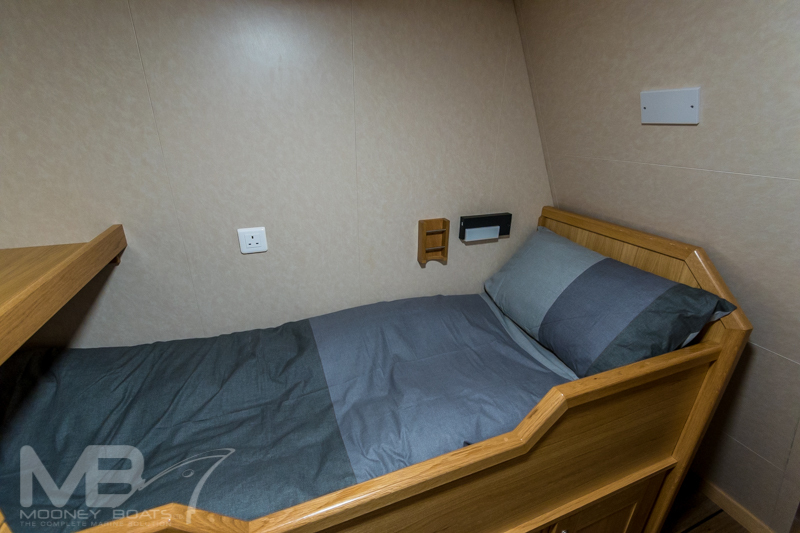 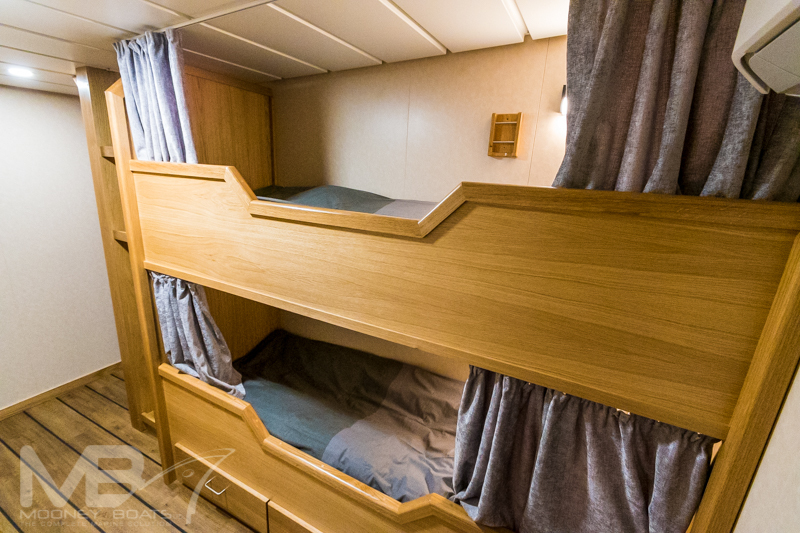 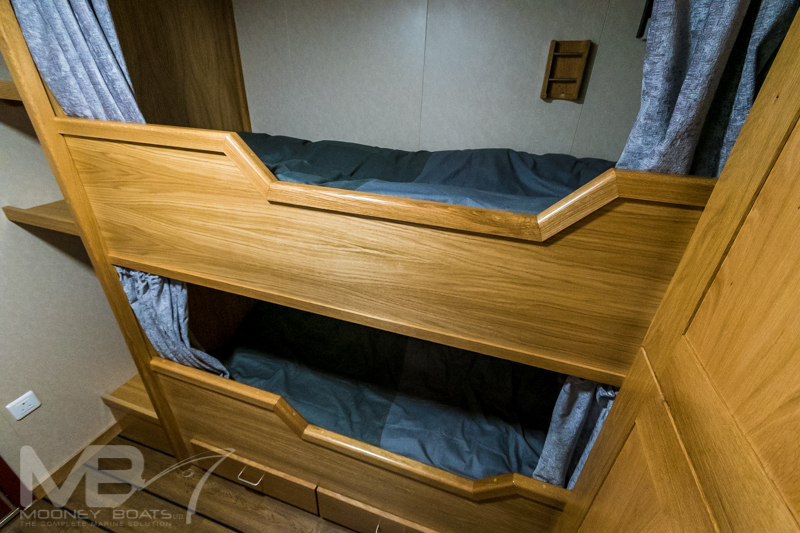 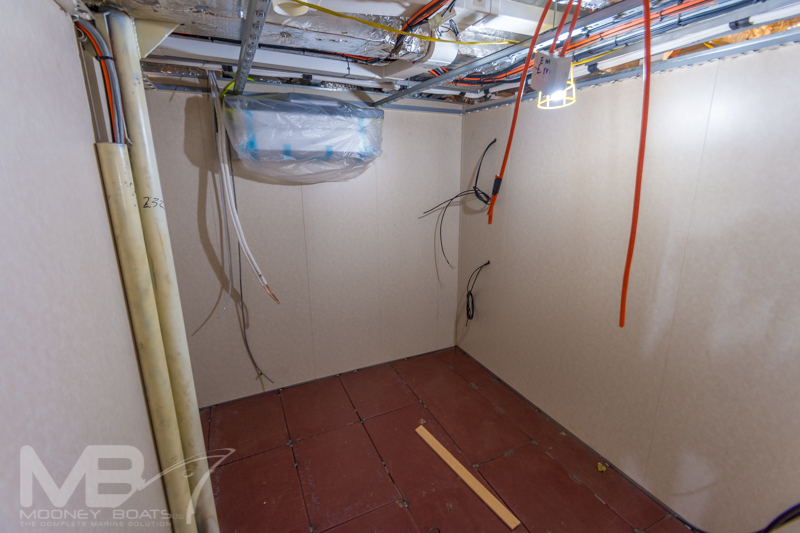 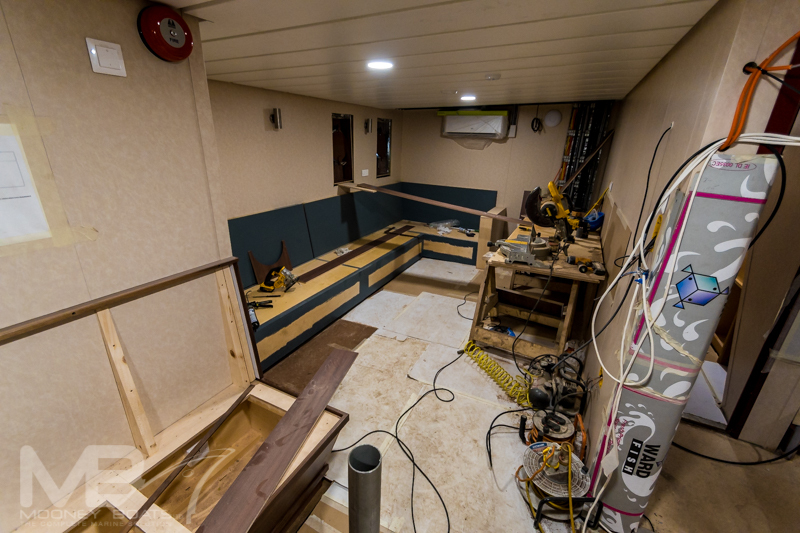 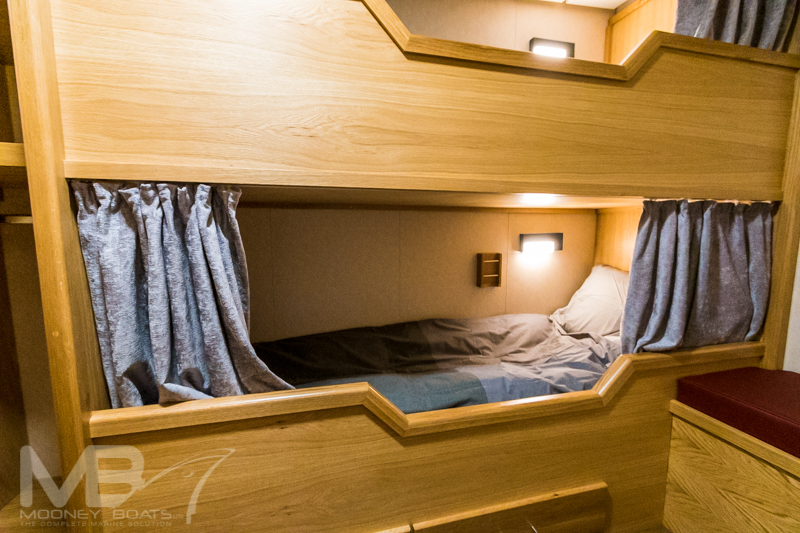 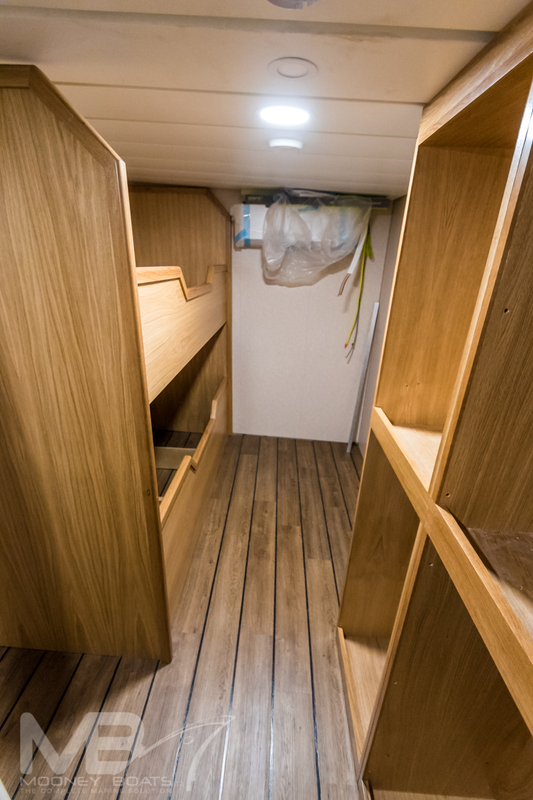 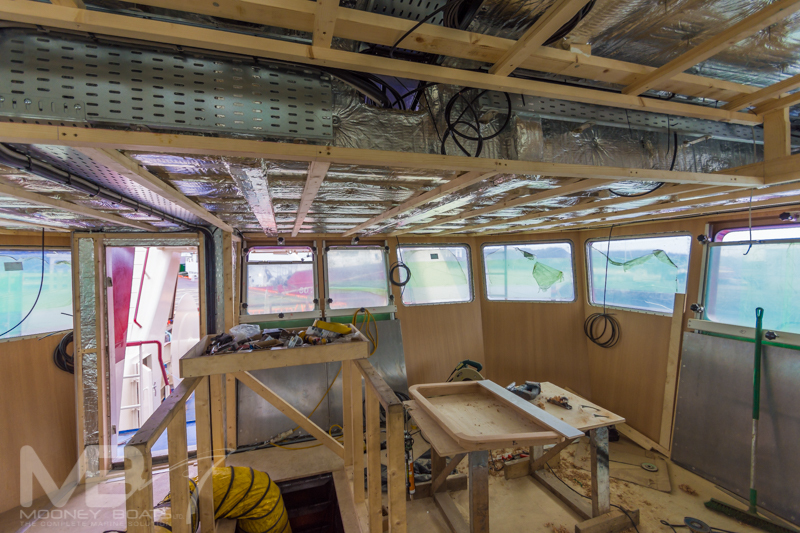 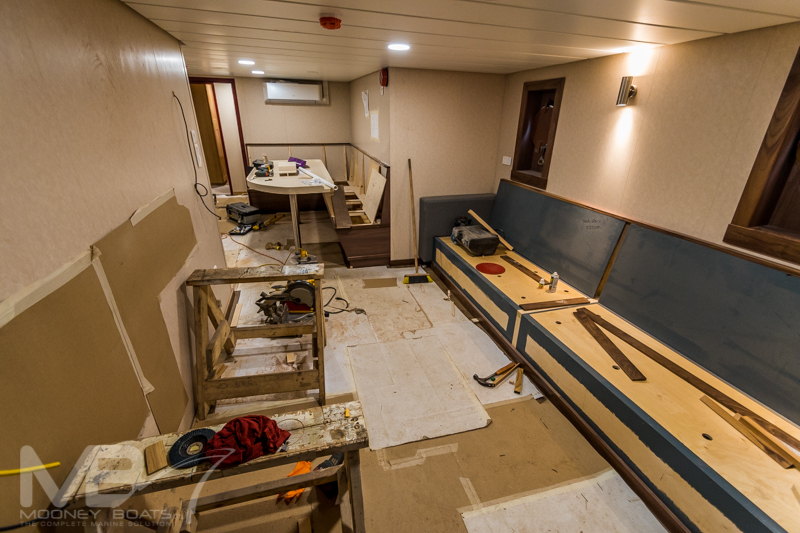 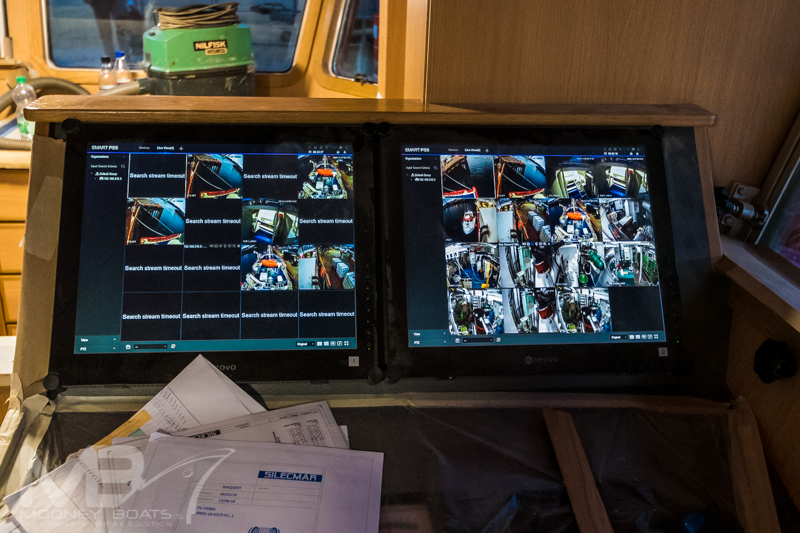 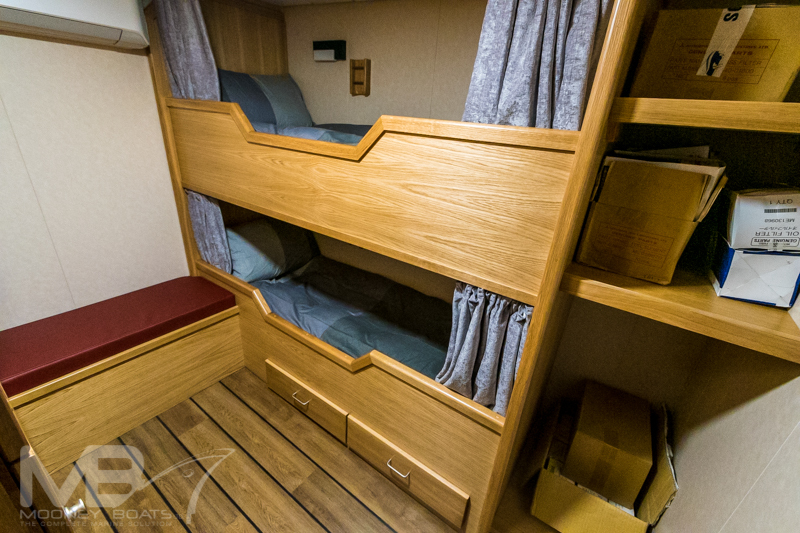 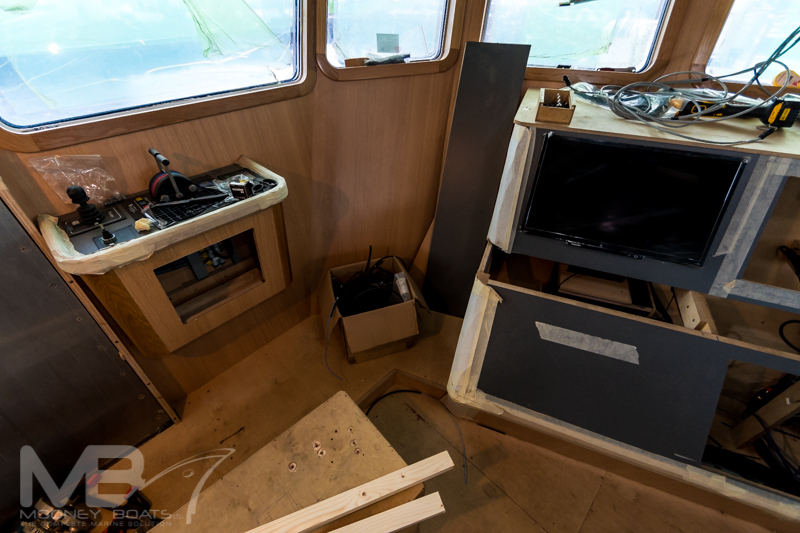 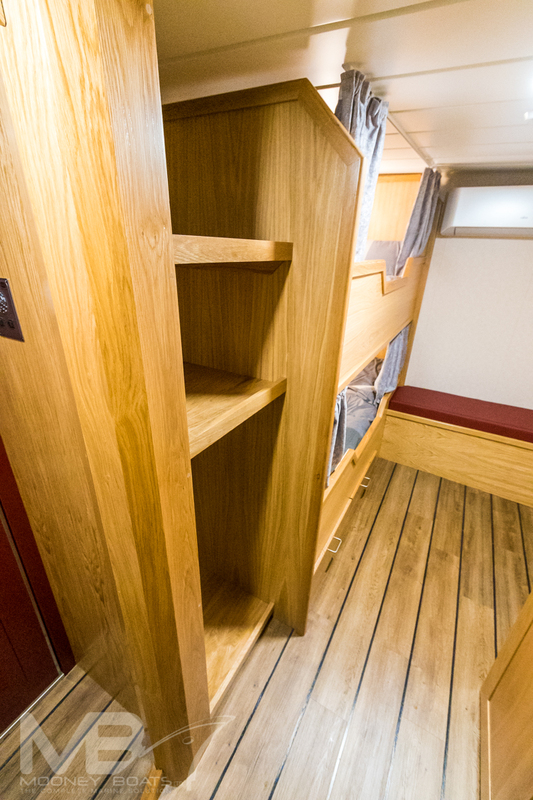 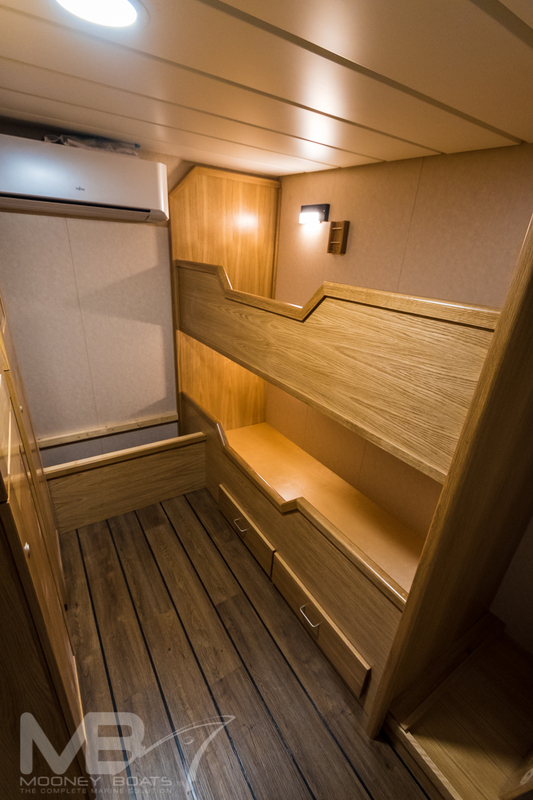 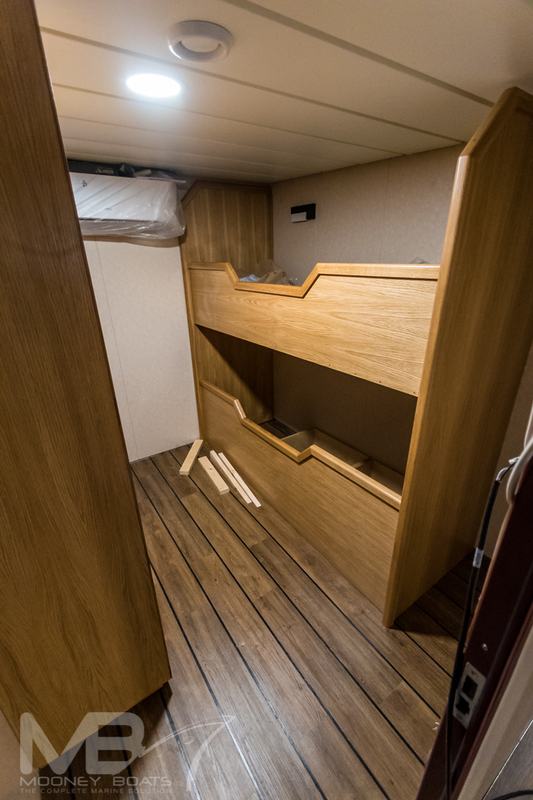 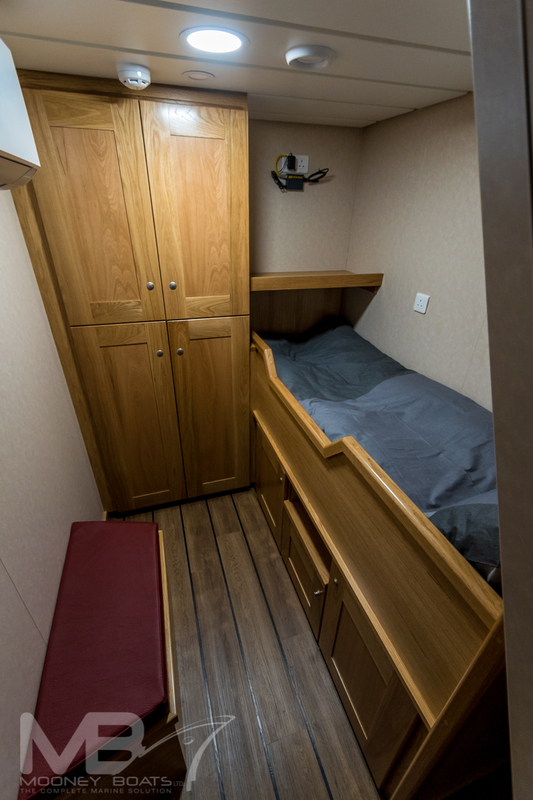 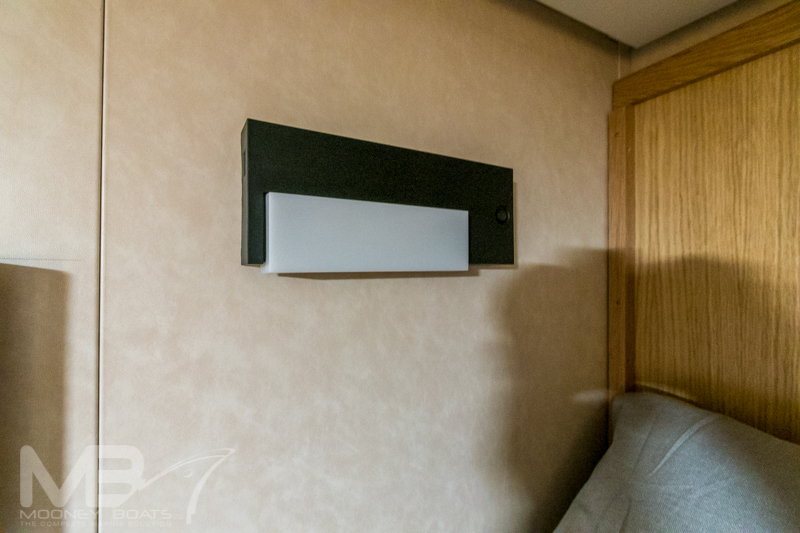 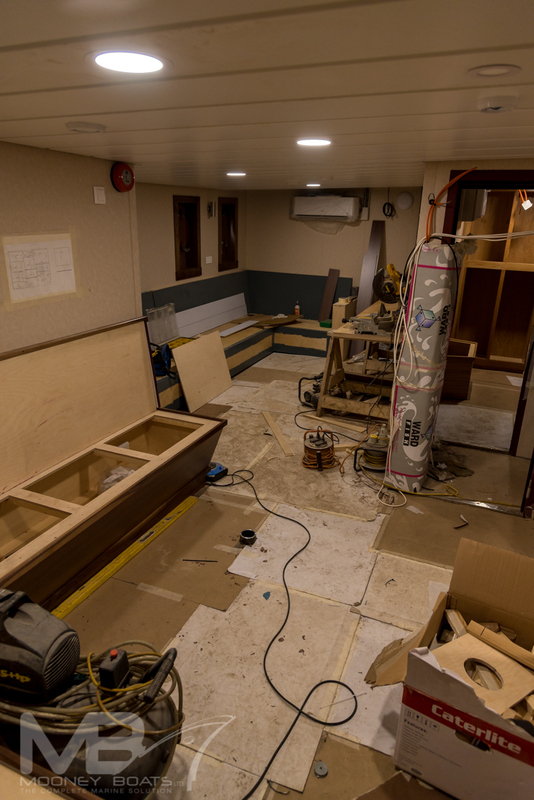 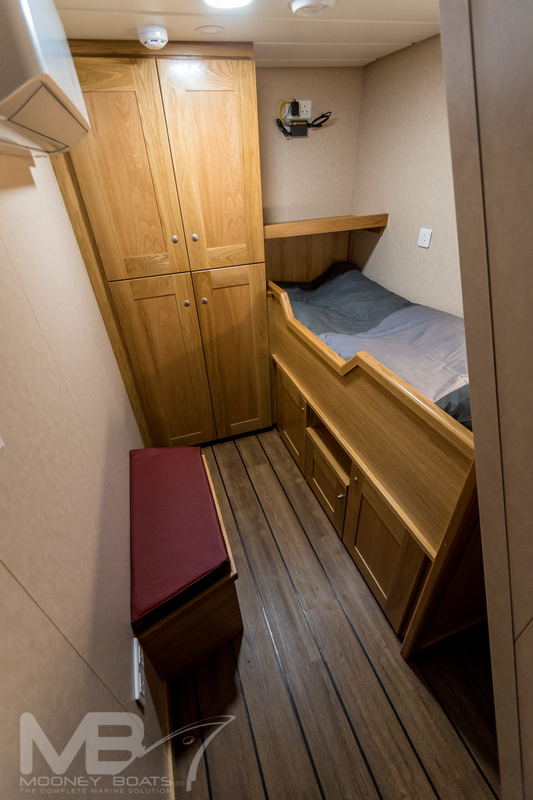 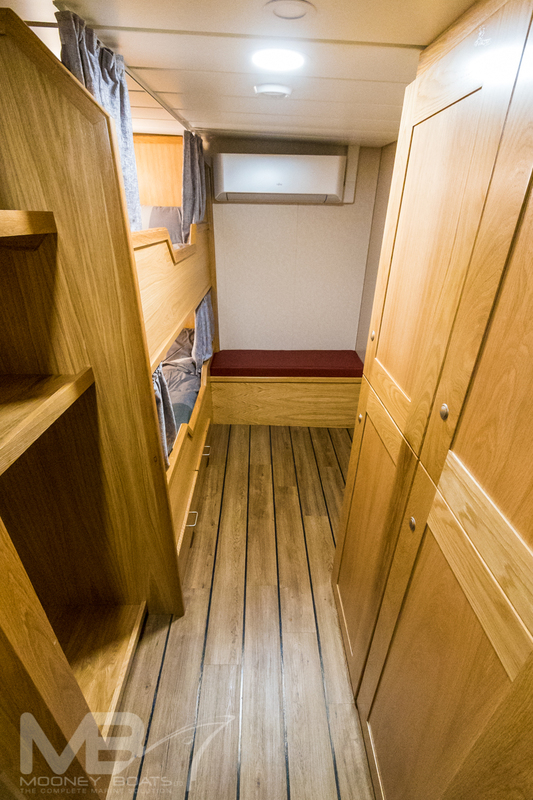 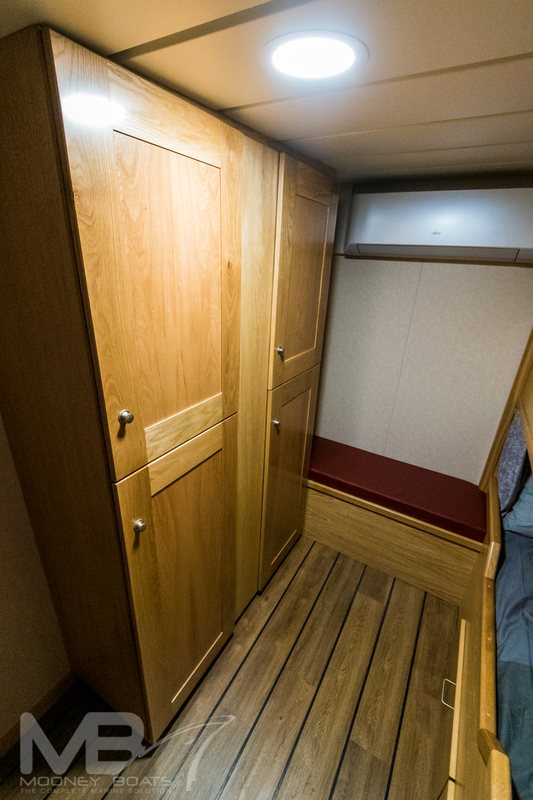 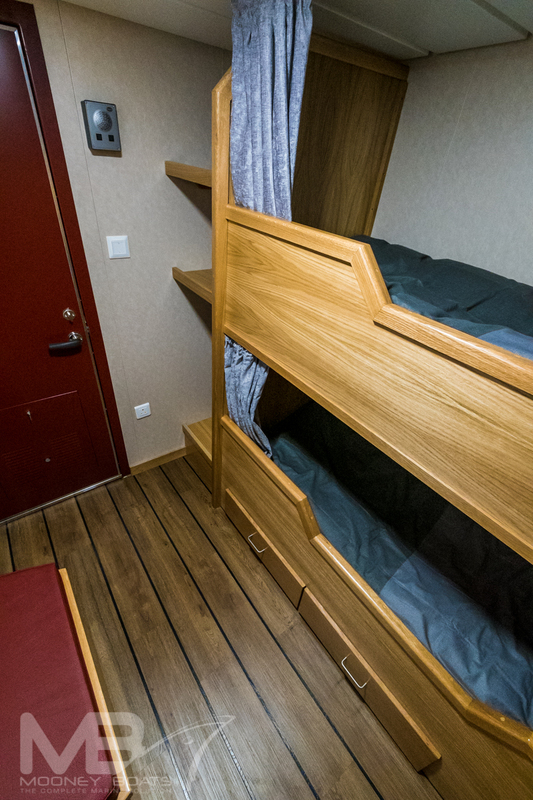 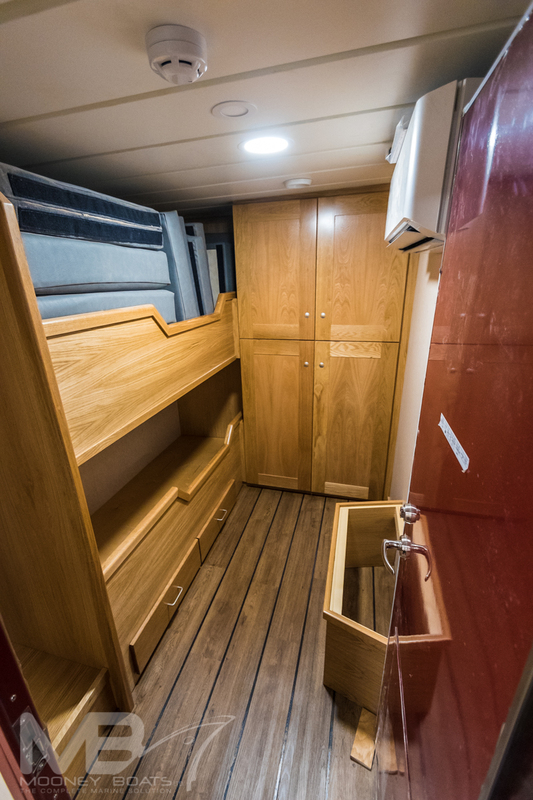 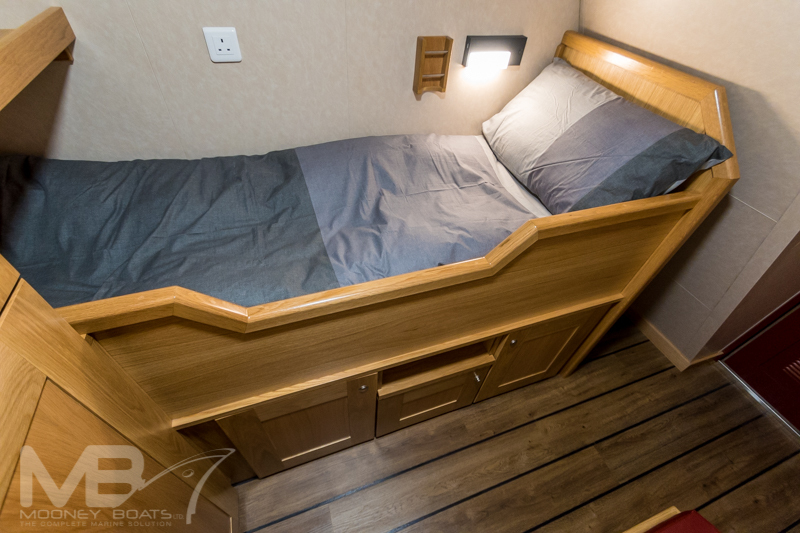 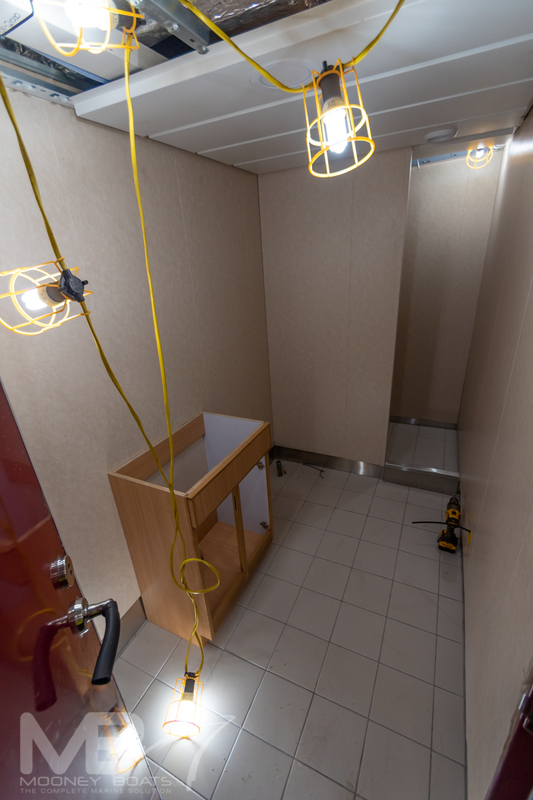 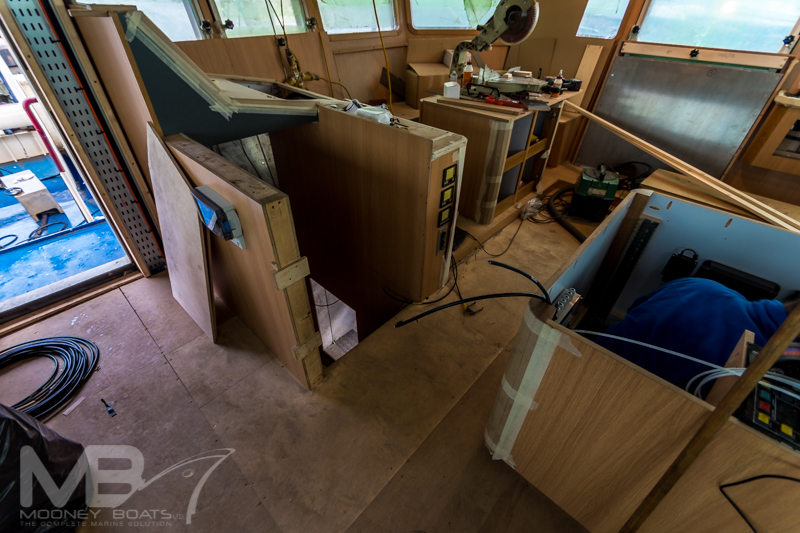 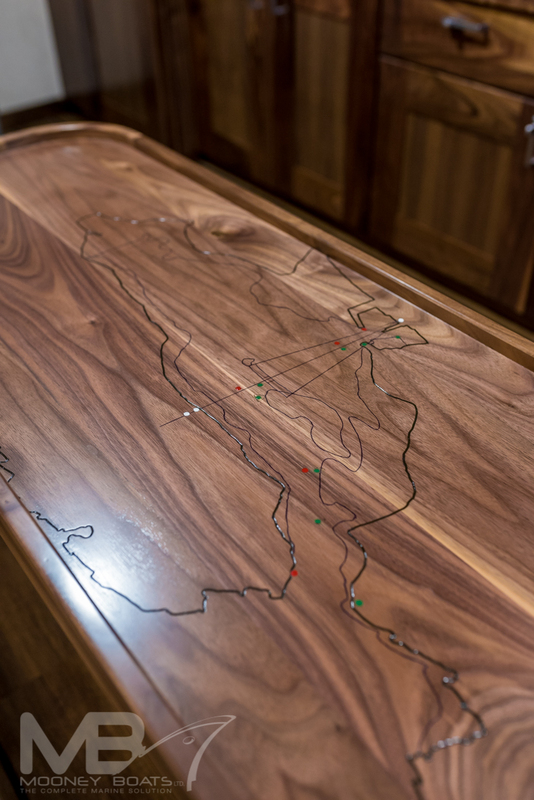 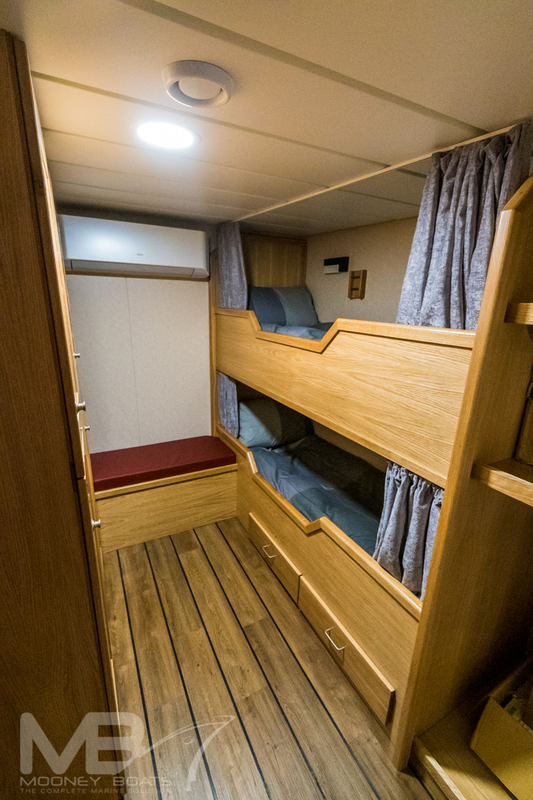 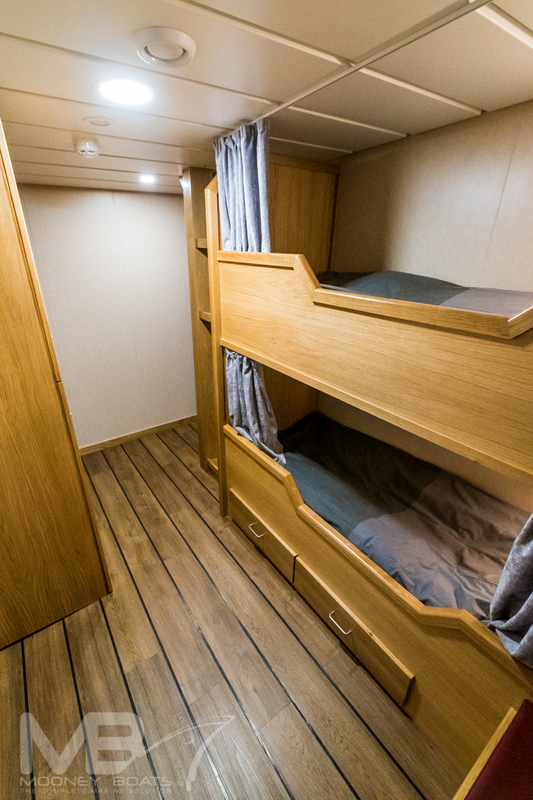 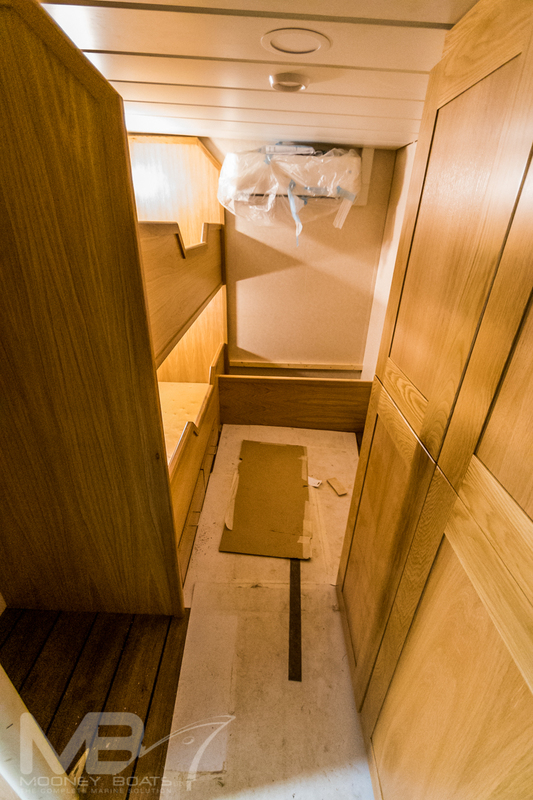 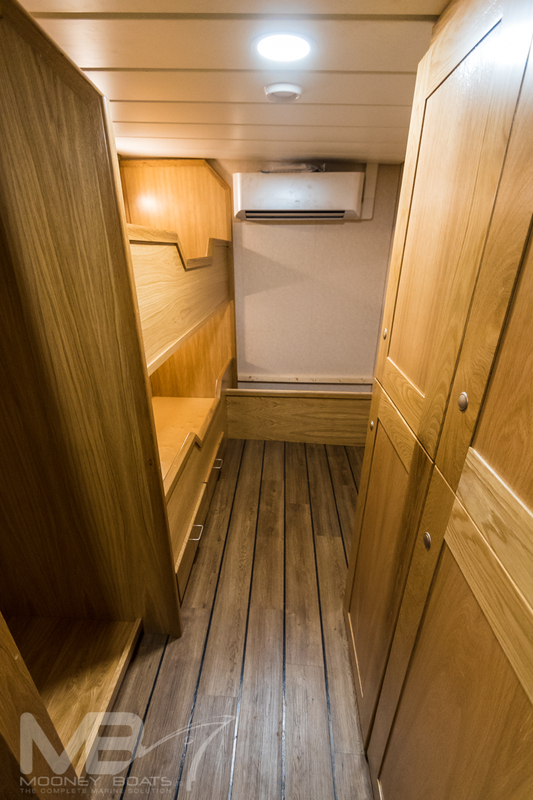 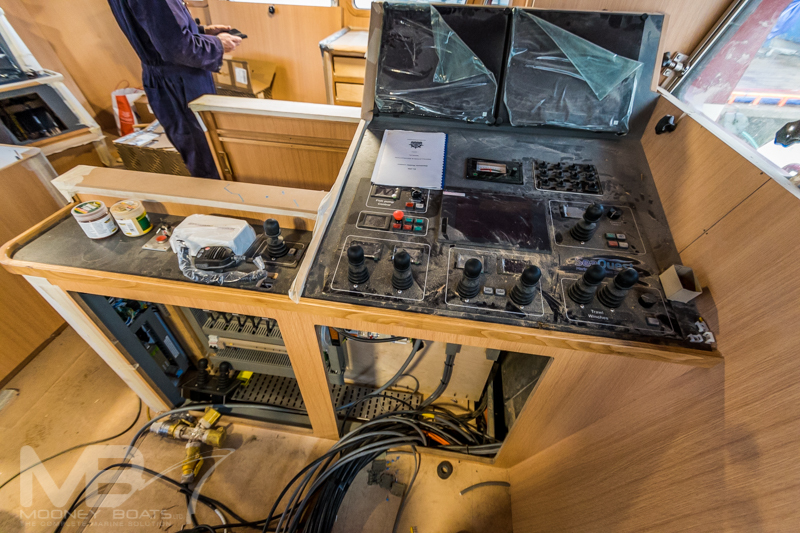 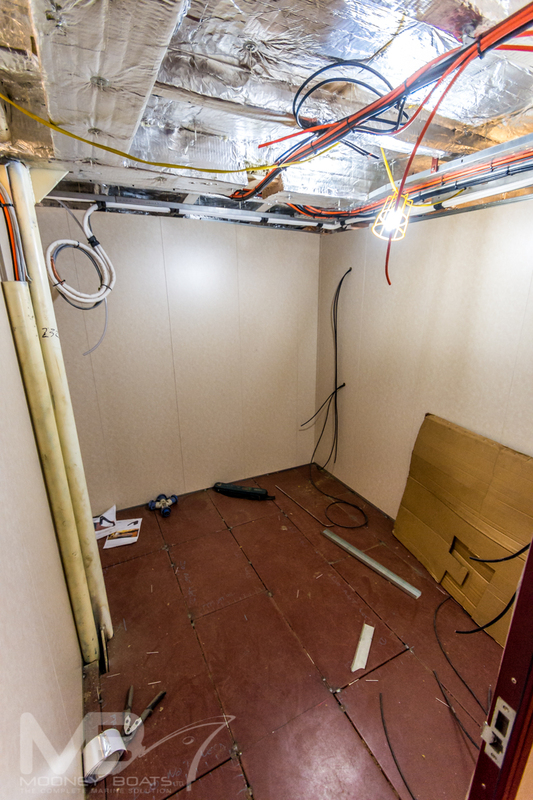 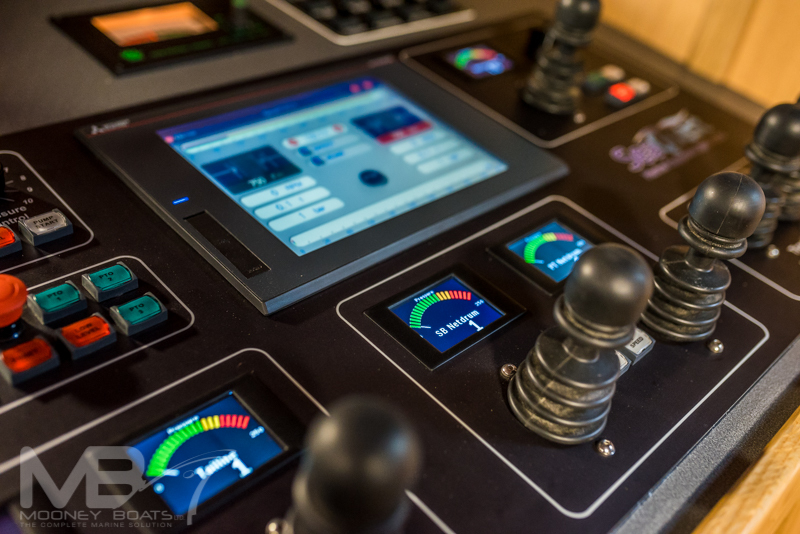 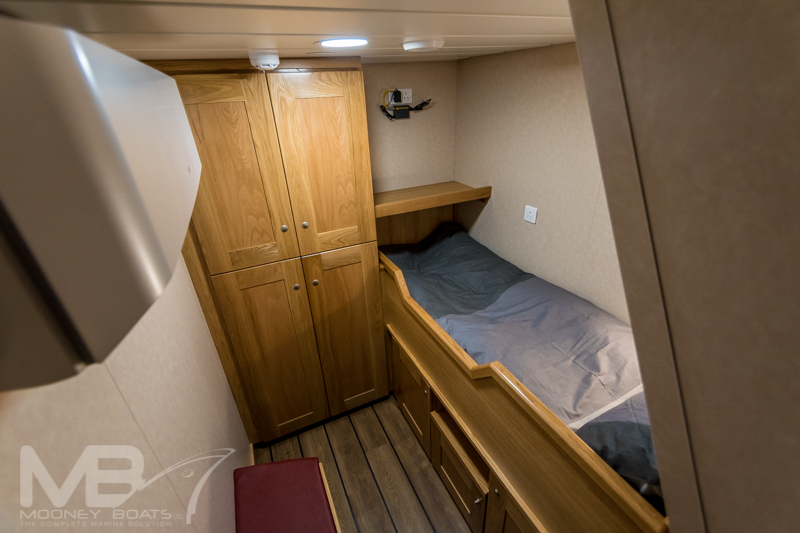 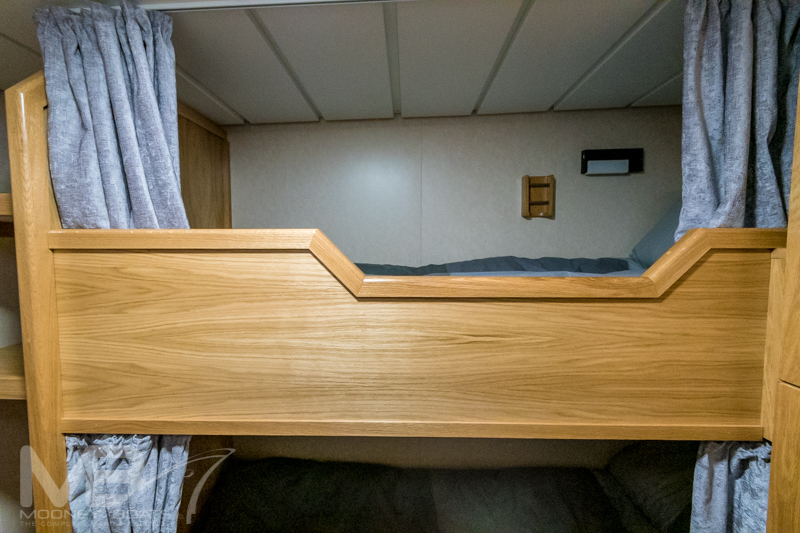 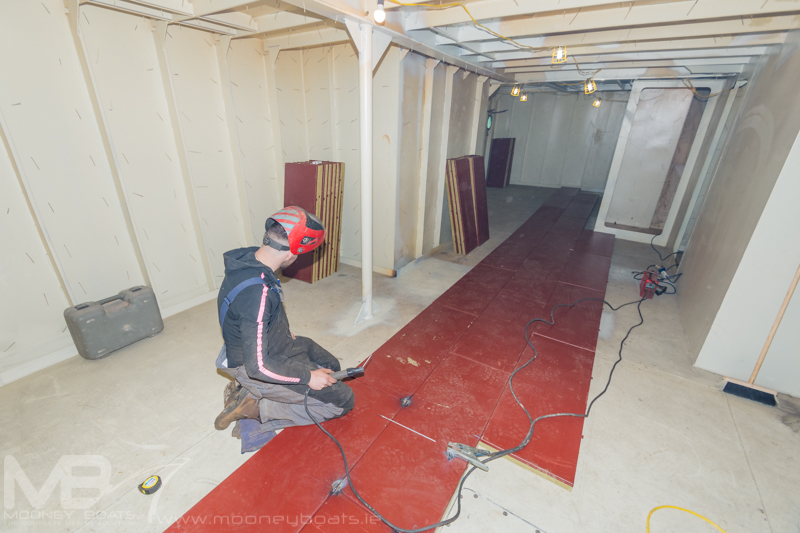 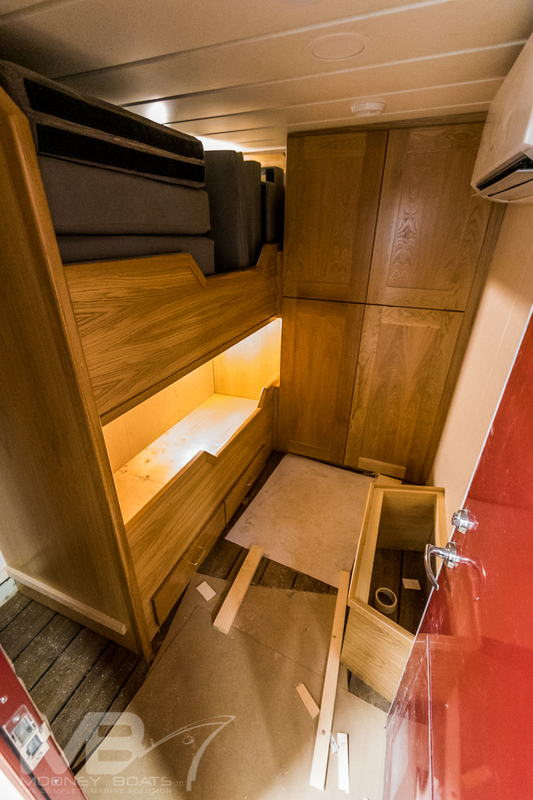 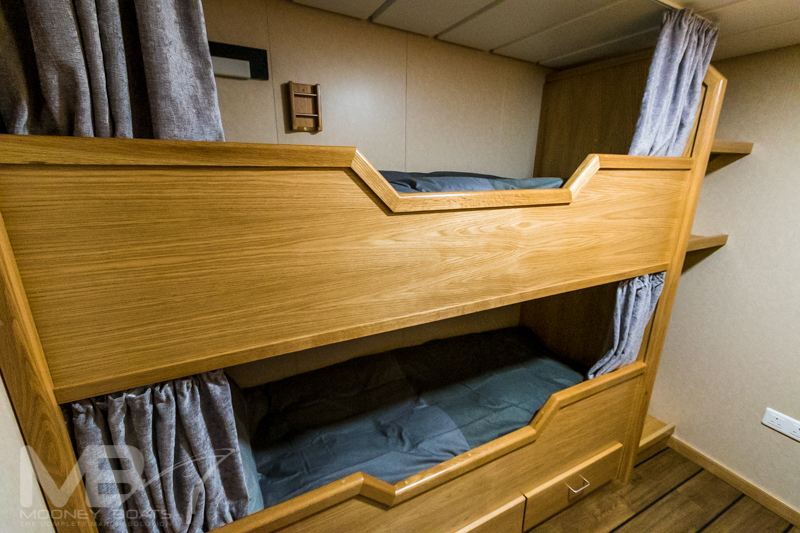 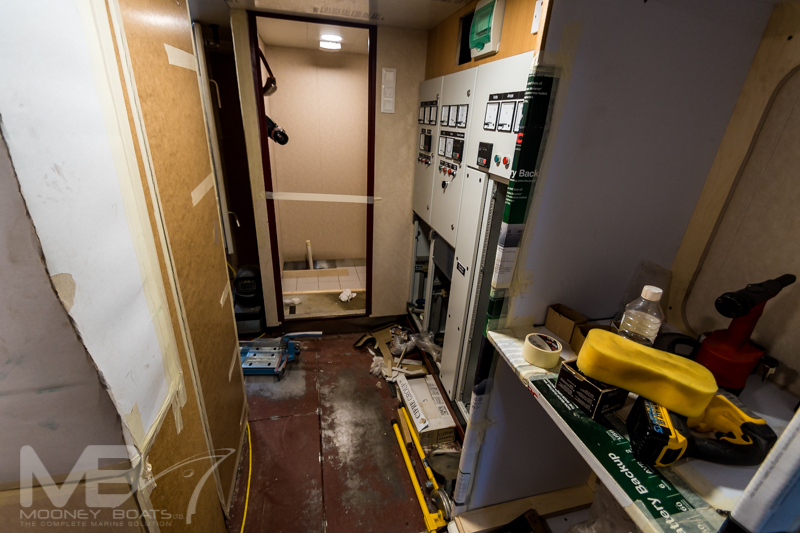 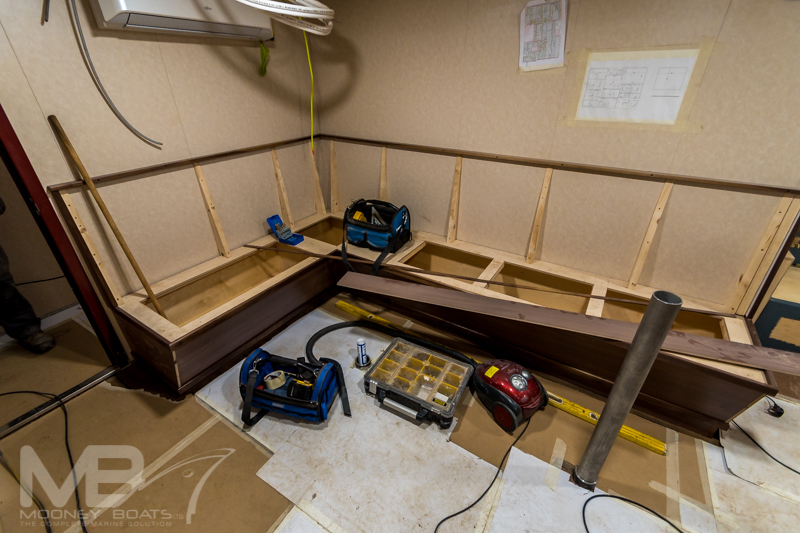 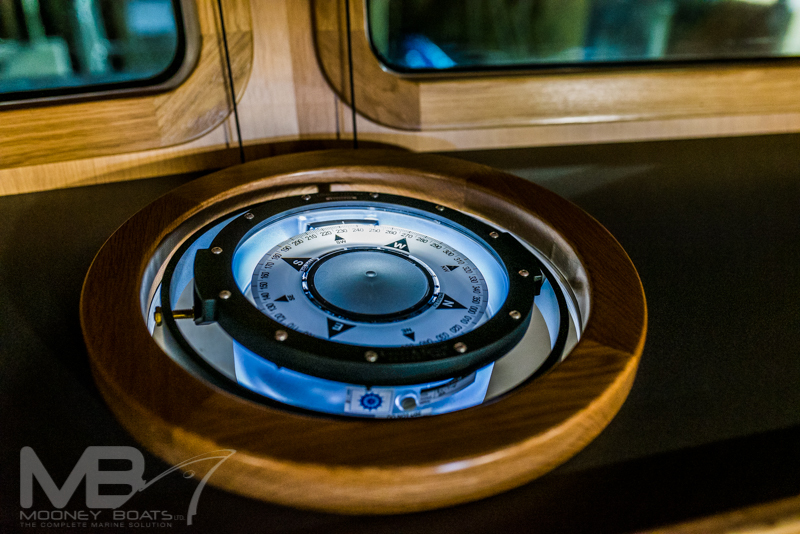 Across the transom, there are 3 No 2 man cabins which are all finished to an extremely high standard with solid oak fixtures and fitted and each crew member has their own storage locker and the bunks are fitted with individual bunk lights and USB charges and phone holders. 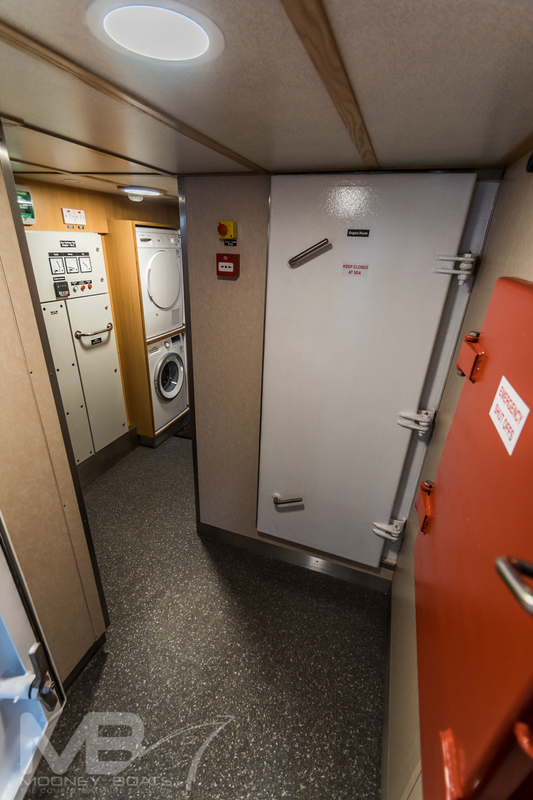 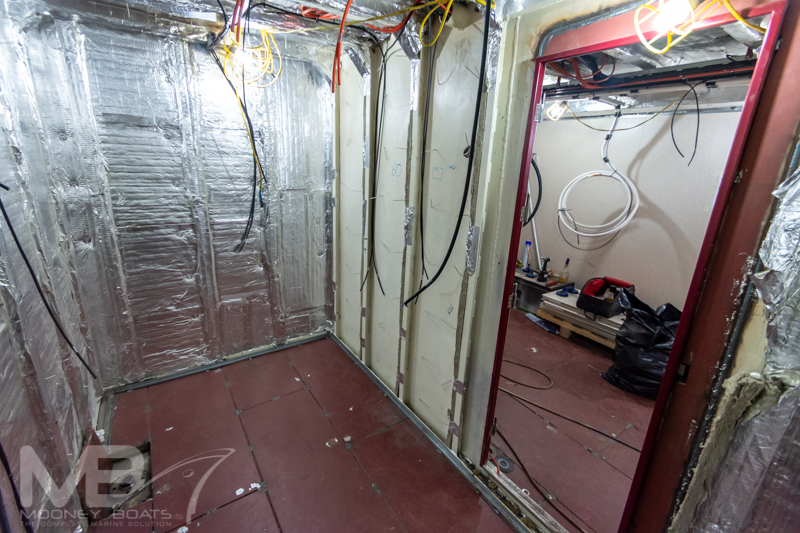 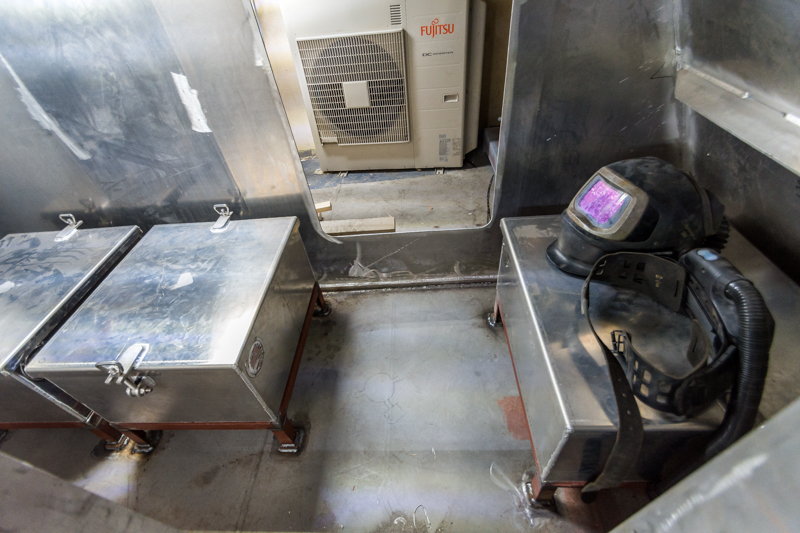 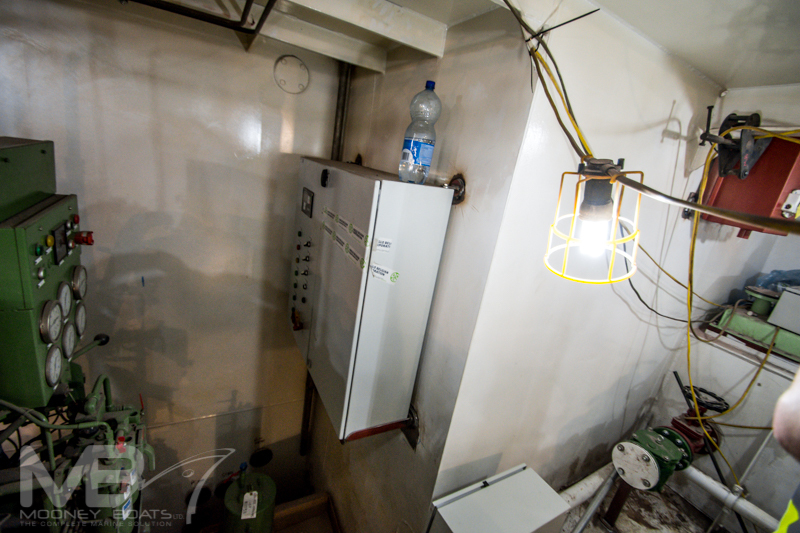 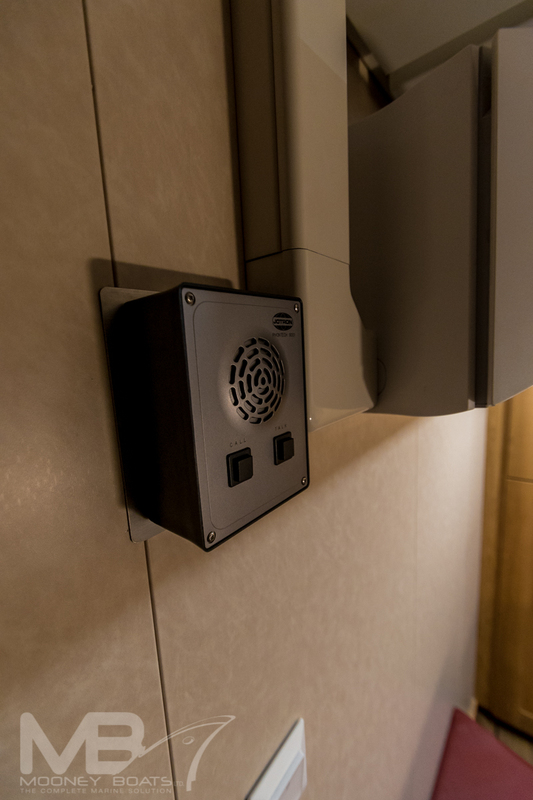 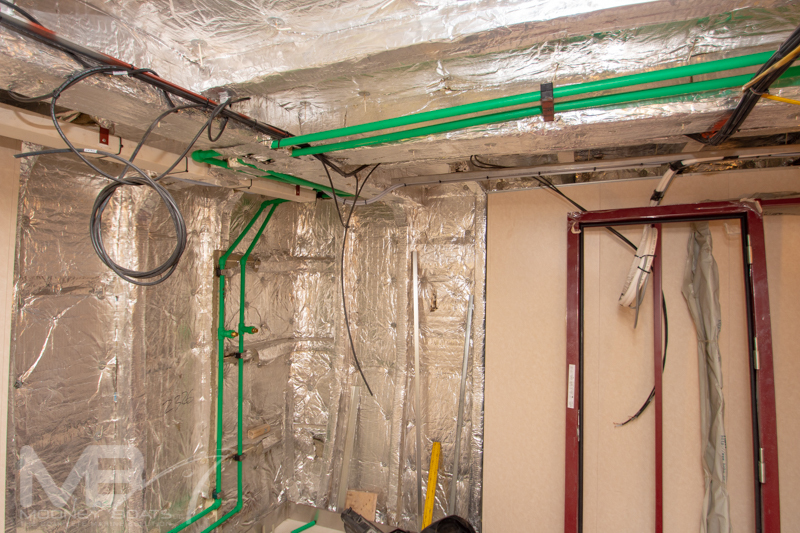 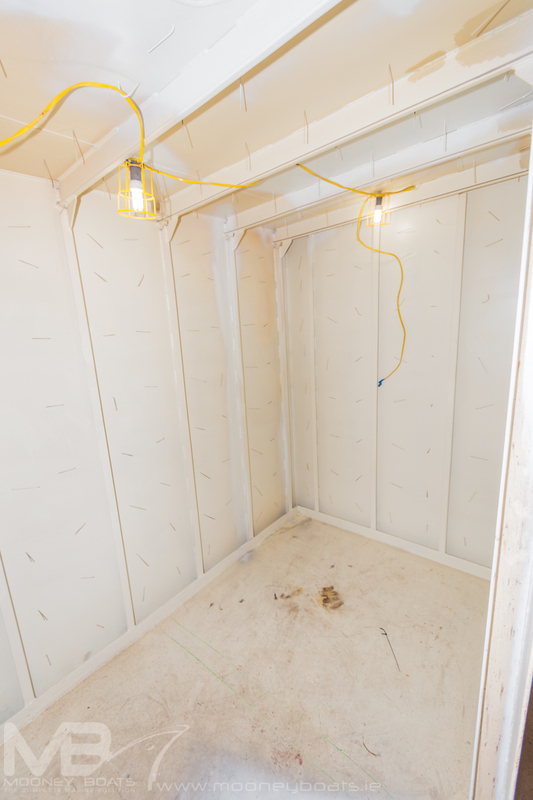 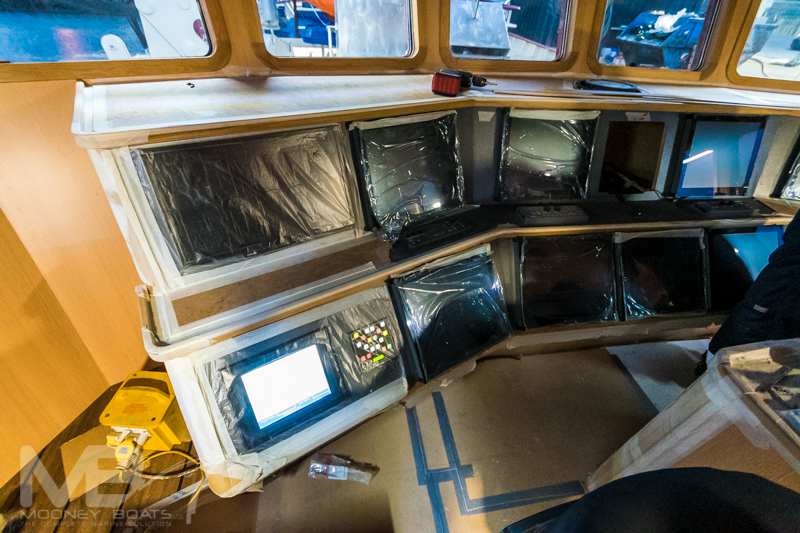 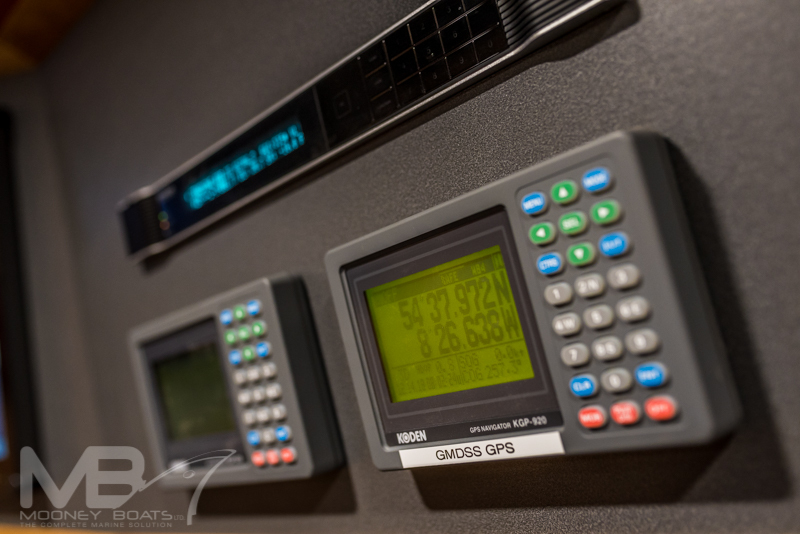 The cabins are also each fitted with air conditioning units where the crew can control the temperature inside there cabin with a remote control. 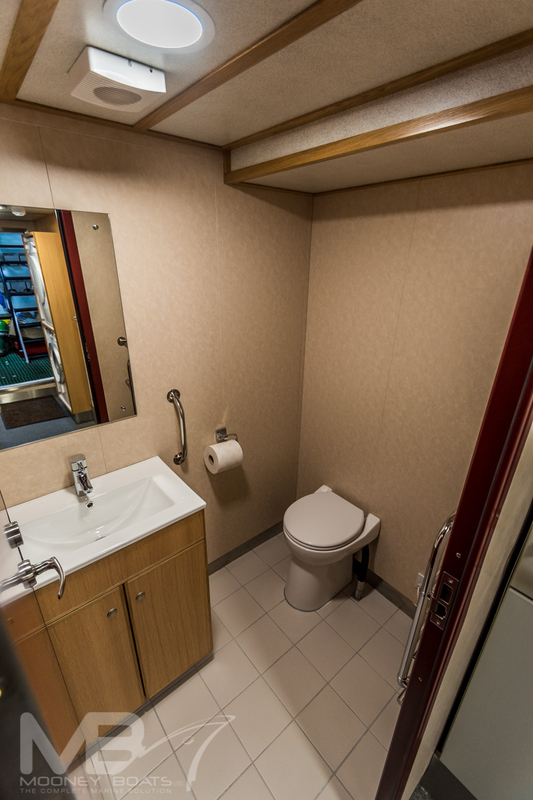 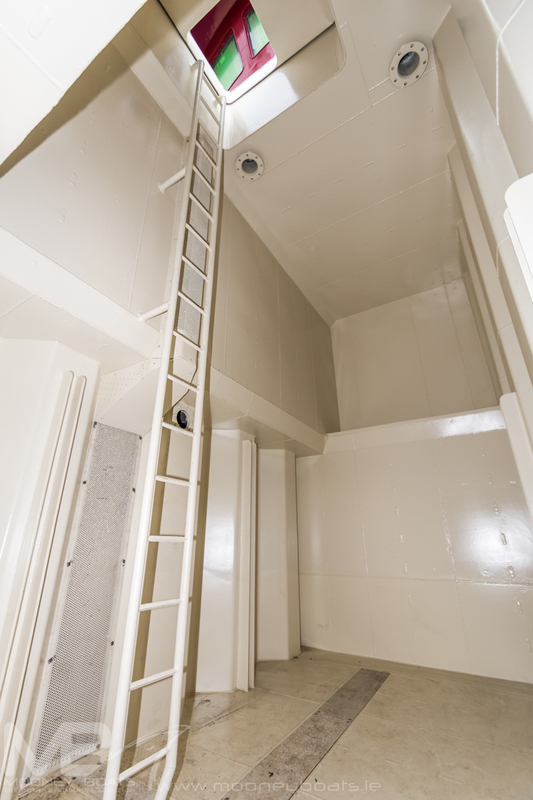 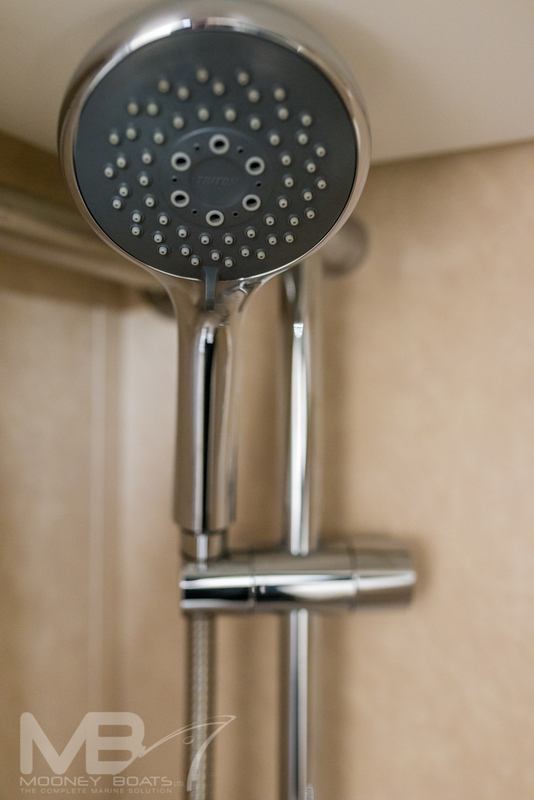 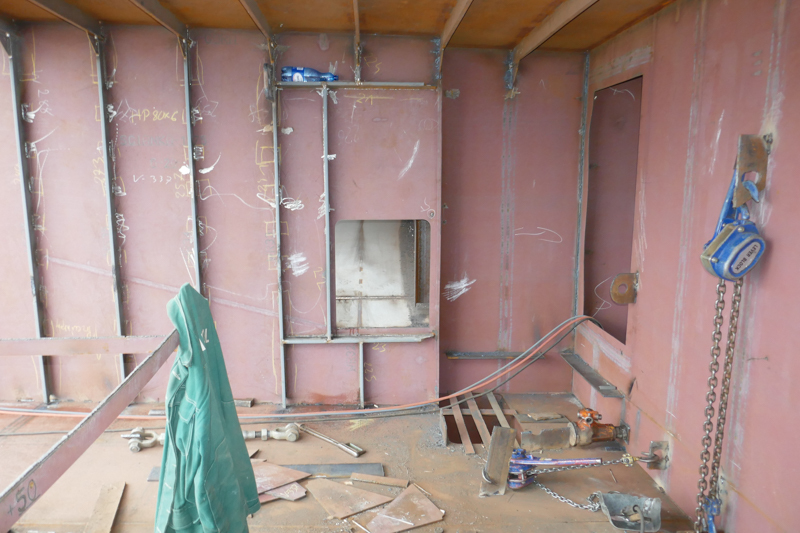 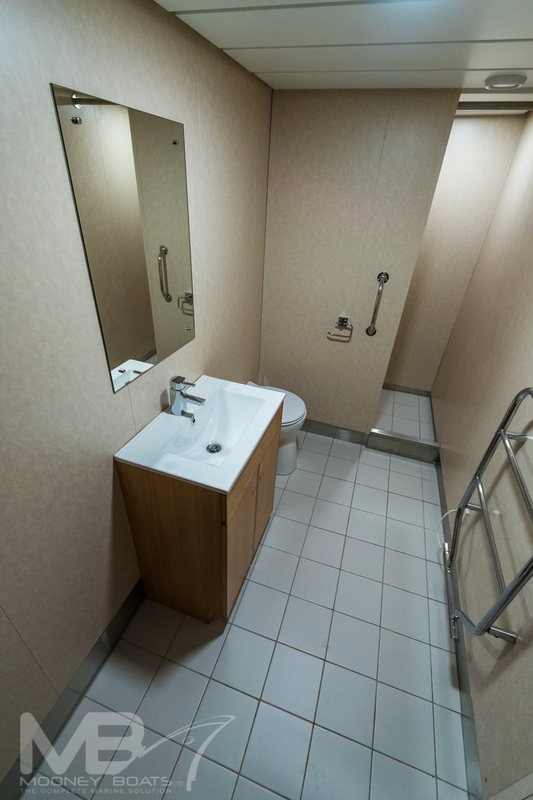 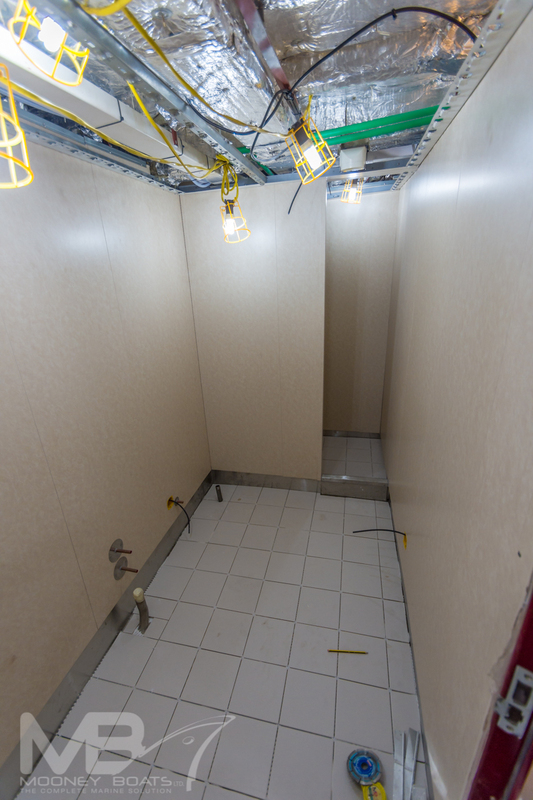 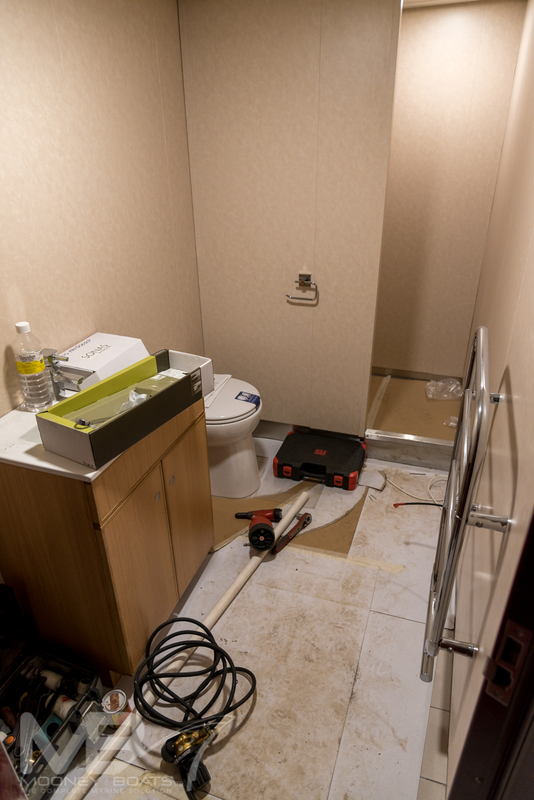 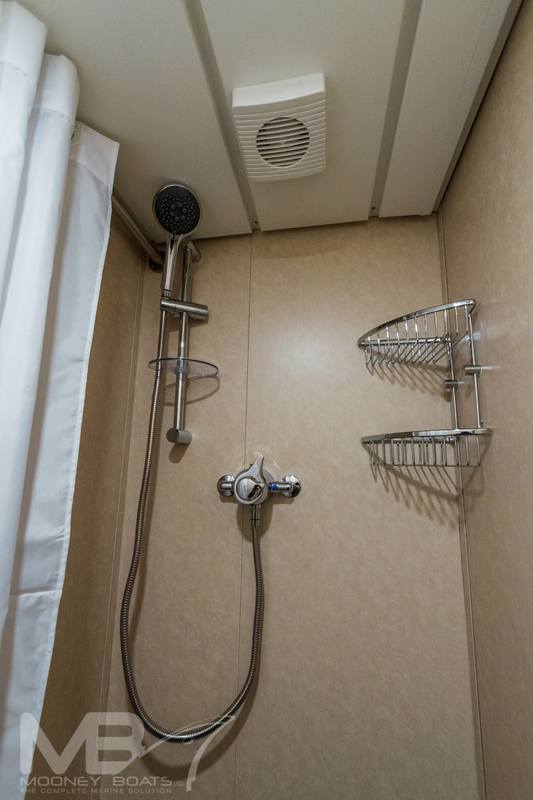 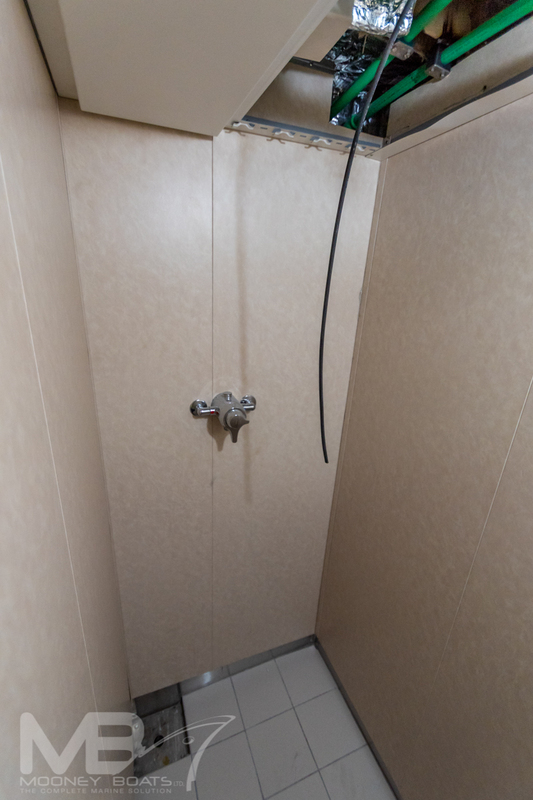 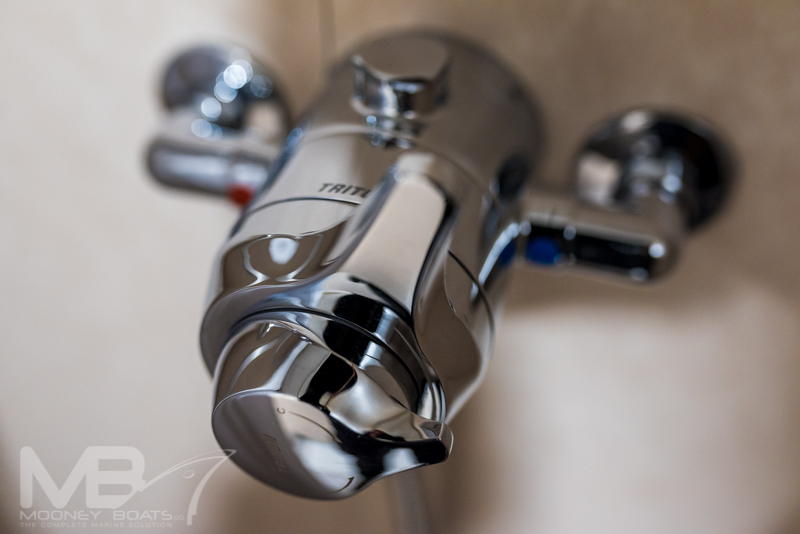 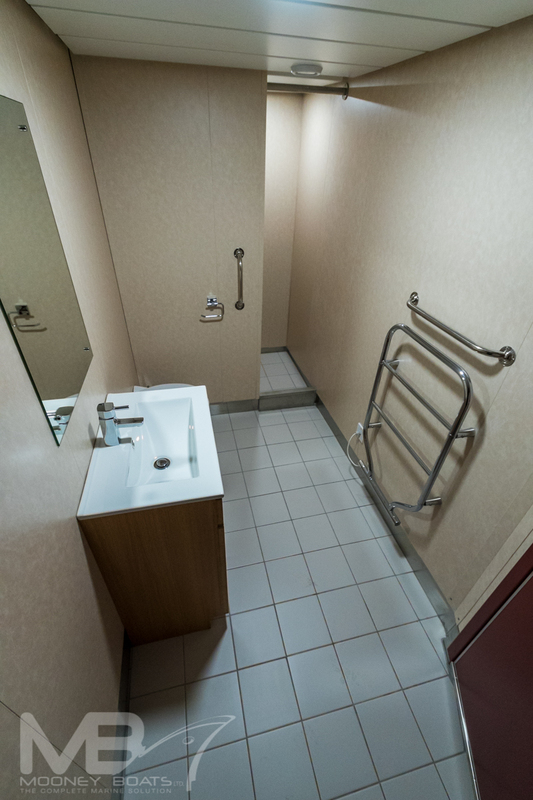 On the starboard aft quarter, there is a large WC with separate shower fitted. 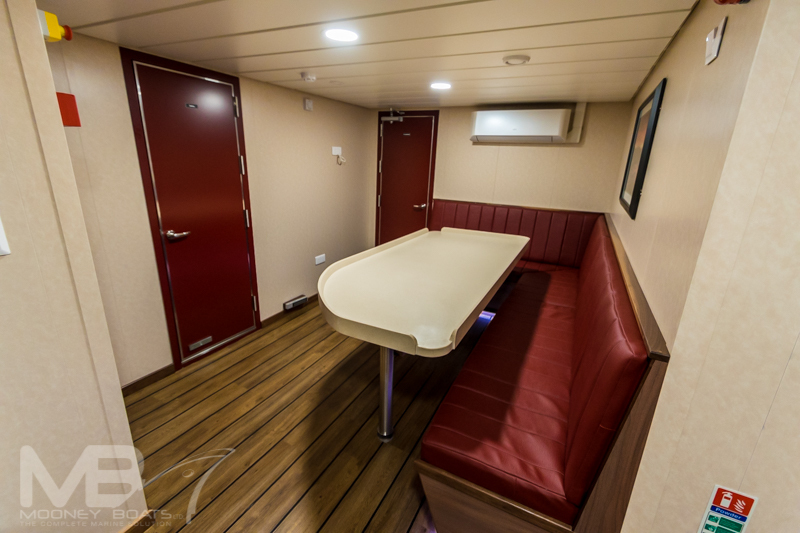 Going forward from the cabins you are taken into a large expansive galley and lounge area. 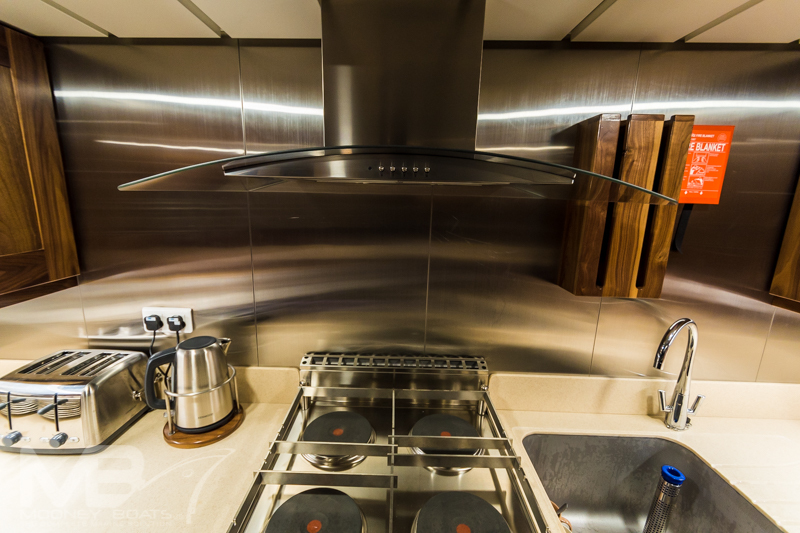 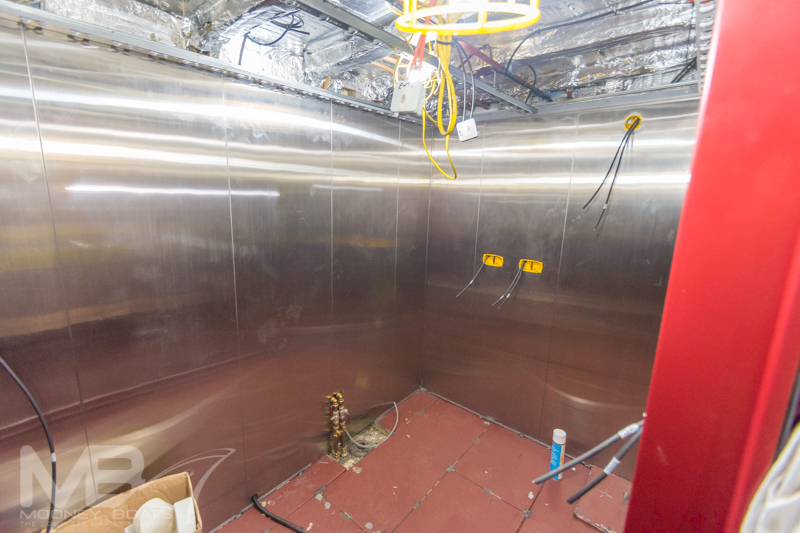 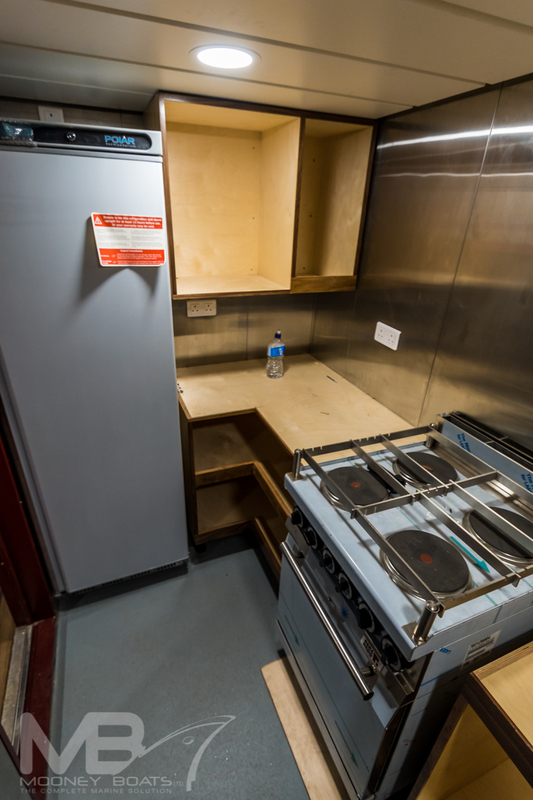 This space was left open plan with the exception of the actual cooking area which is located in the middle of the vessel. 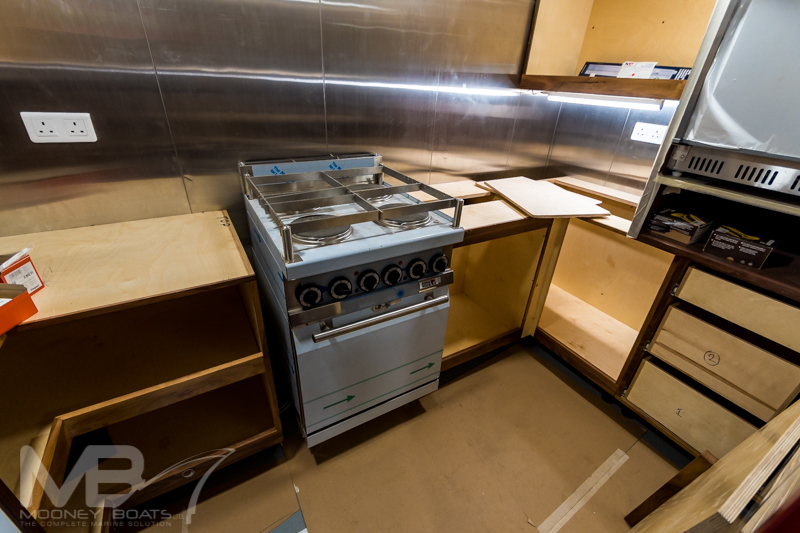 The galley has been outfitted to a commercial kitchen standard with stainless steel panels on all 4 bulkheads floor to ceiling, the storage units have been made in-house by the yards carpenters and are made from solid walnut and the coulter tops are made from Corian solid surface material. 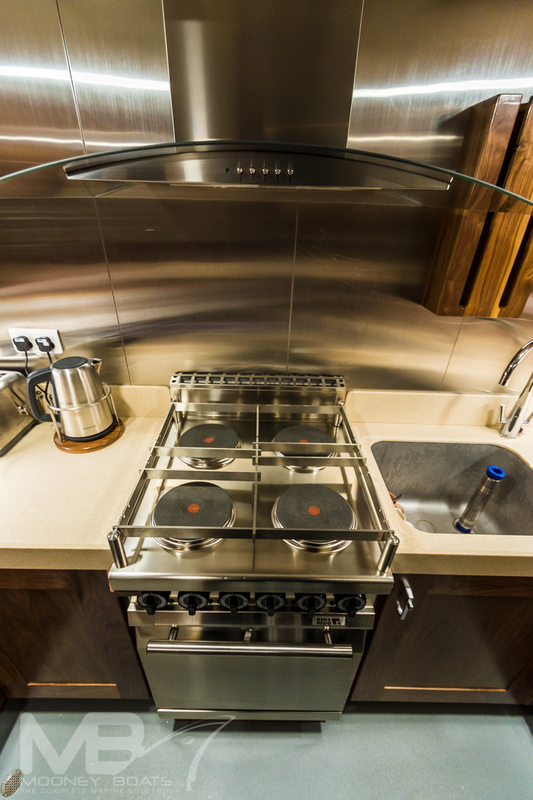 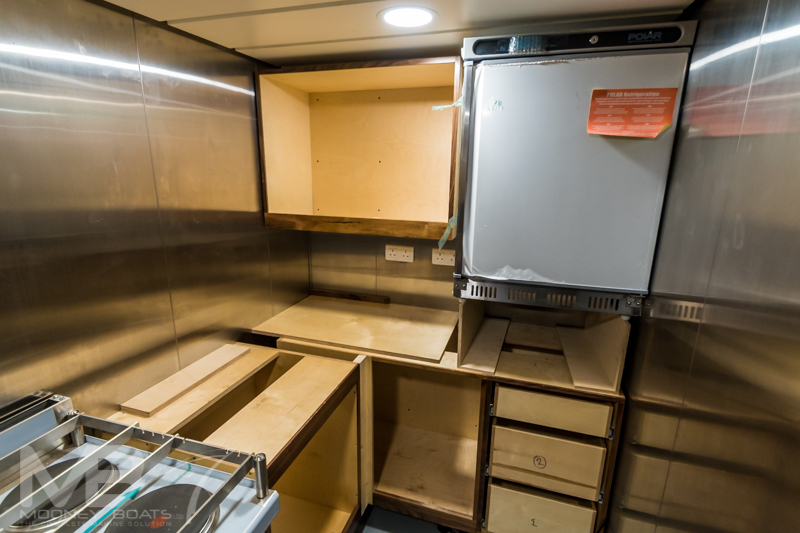 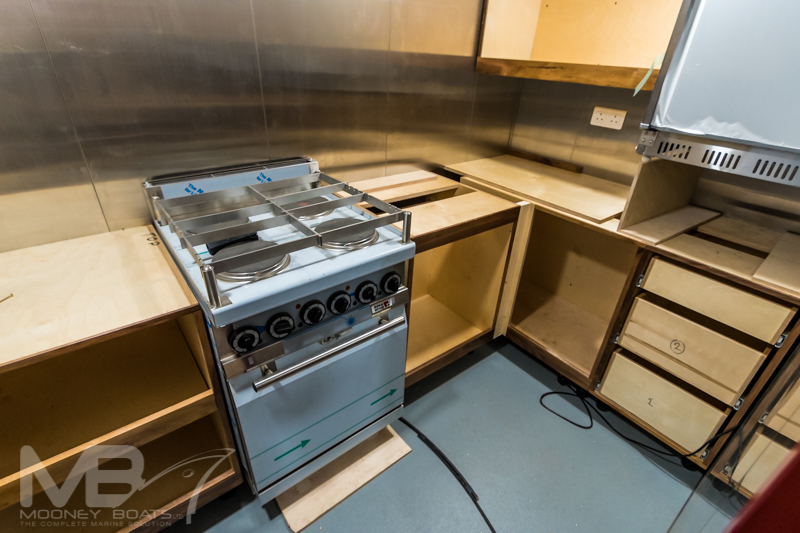 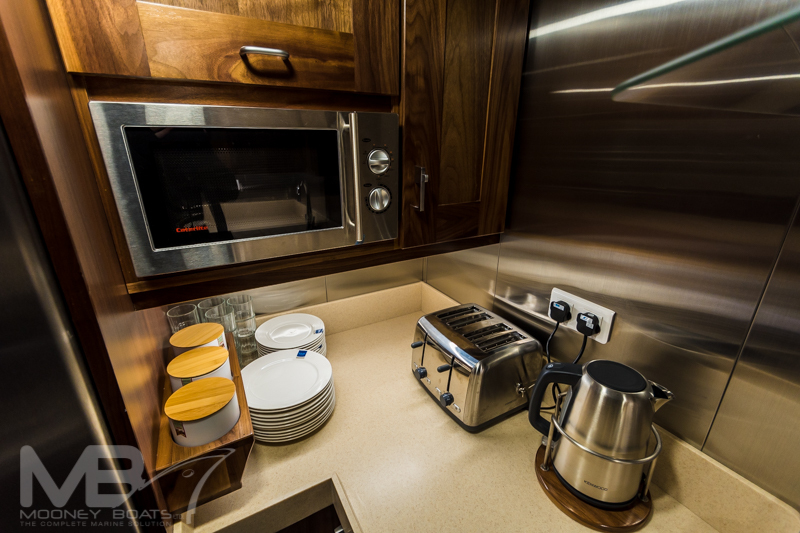 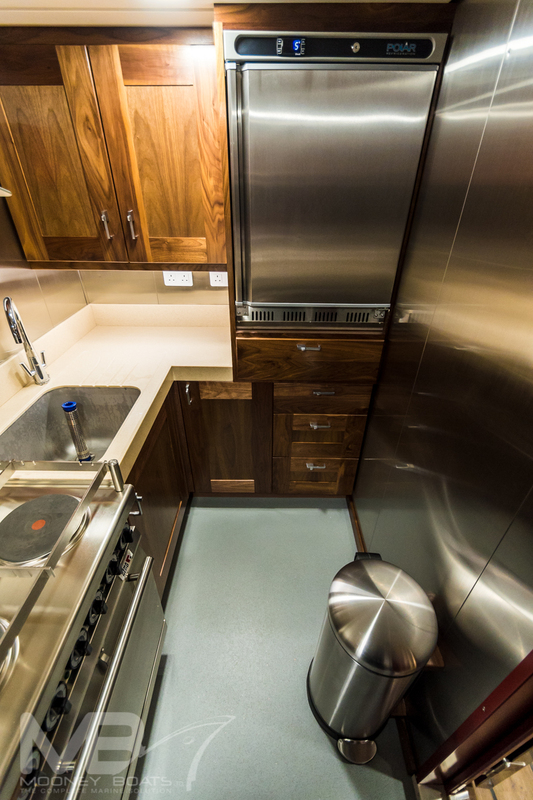 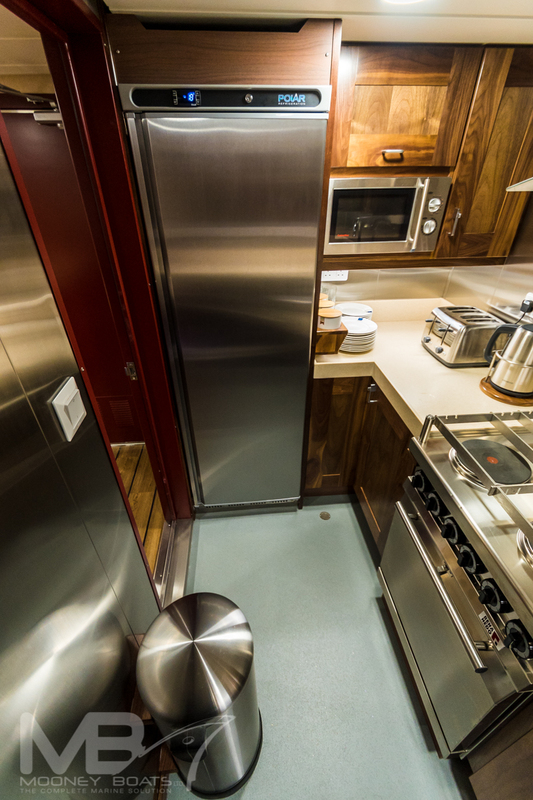 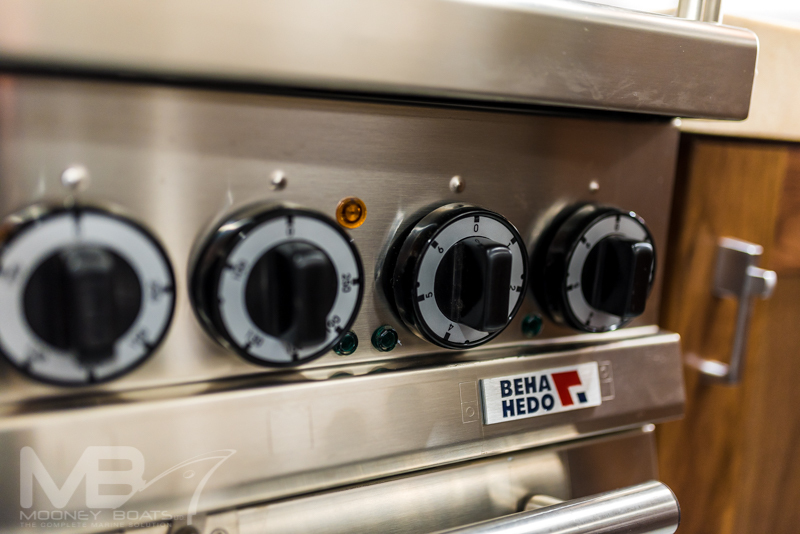 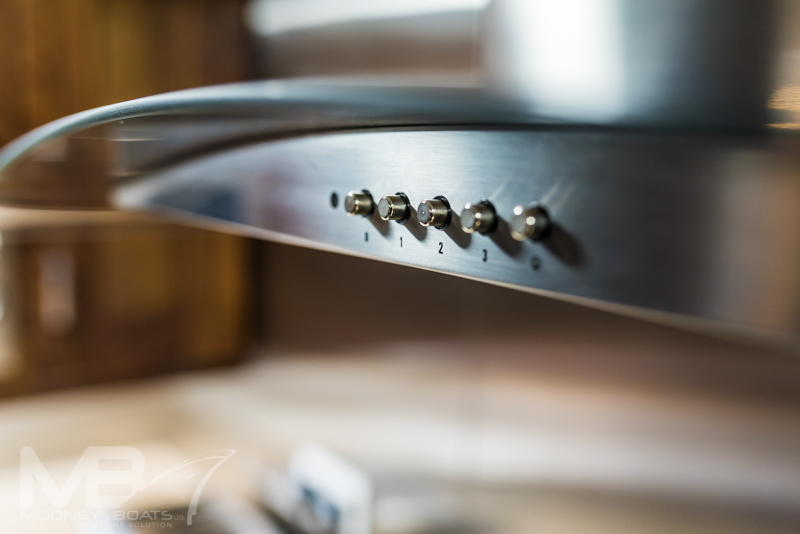 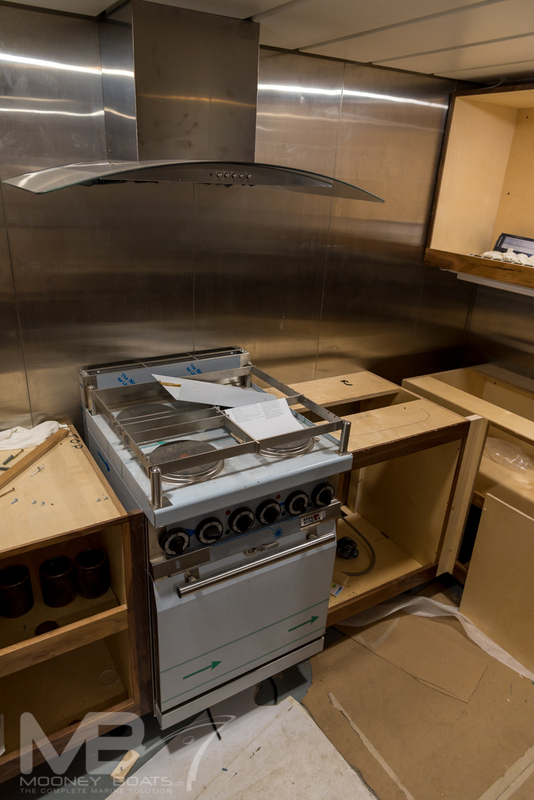 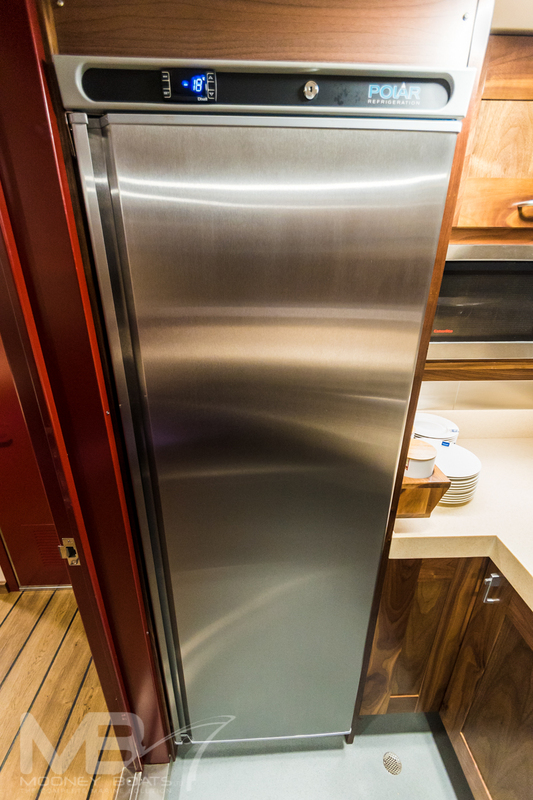 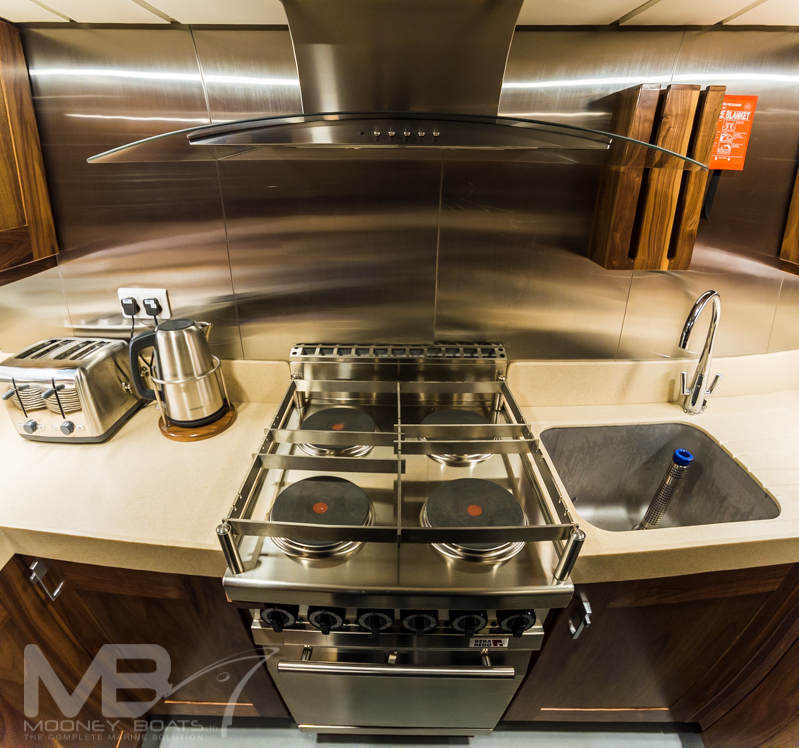 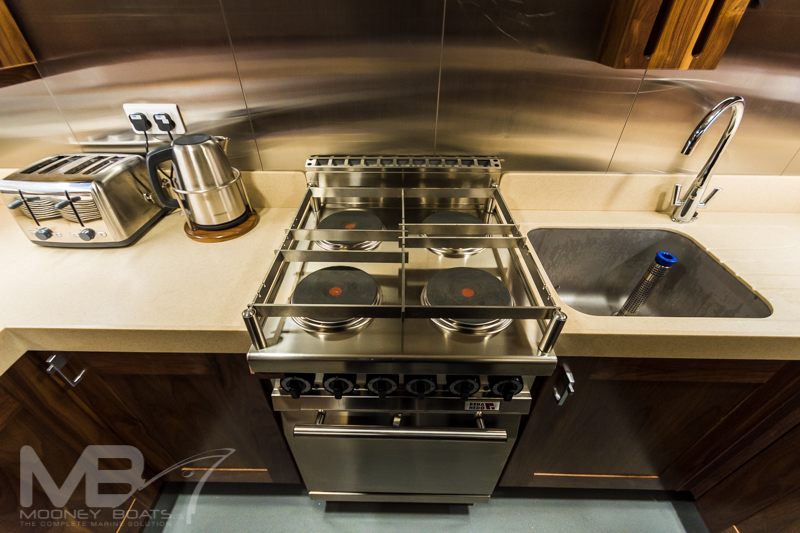 The galley has a stainless steel Beha marine cooker, stainless steel tall industrial freezer, and stainless steel industrial Fridge which are all built into the galley units to give a compact working space. 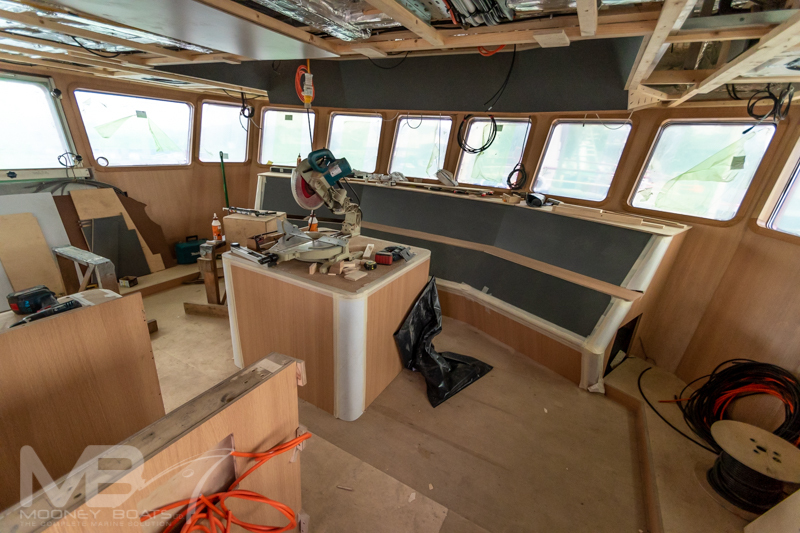 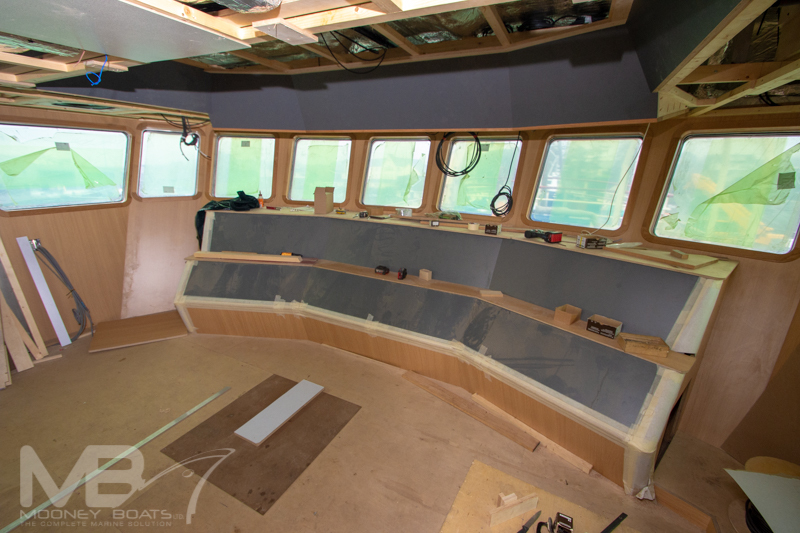 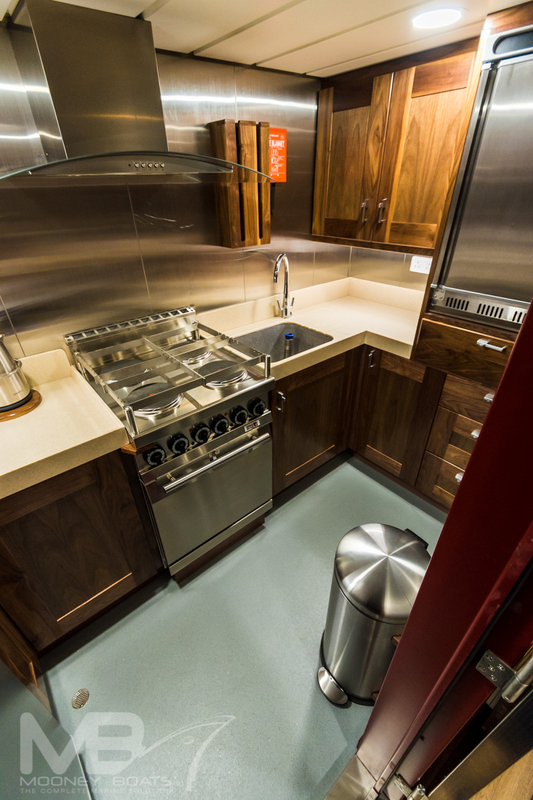 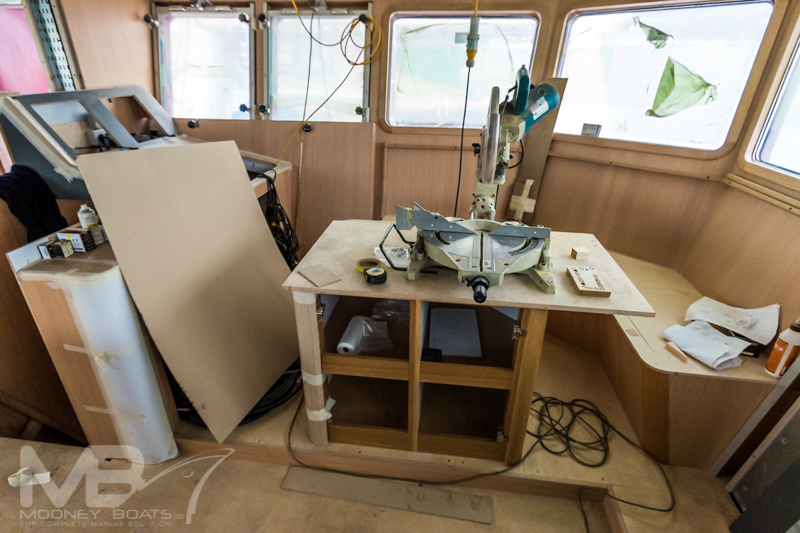 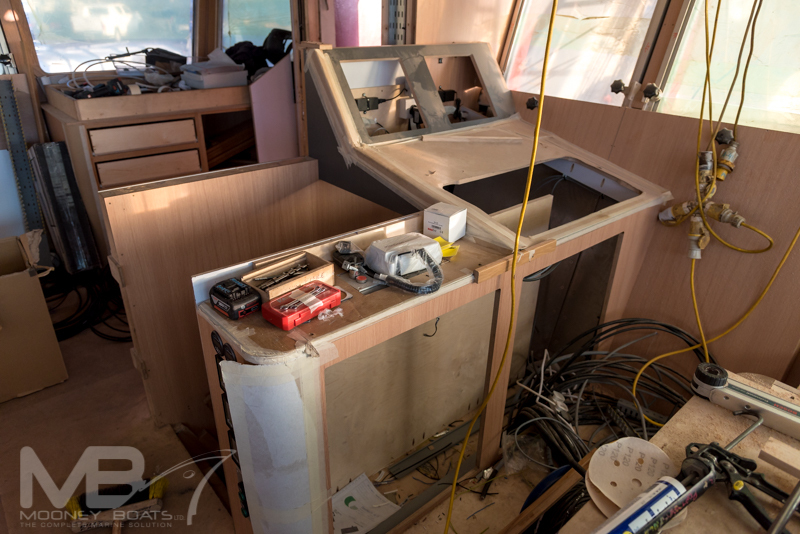 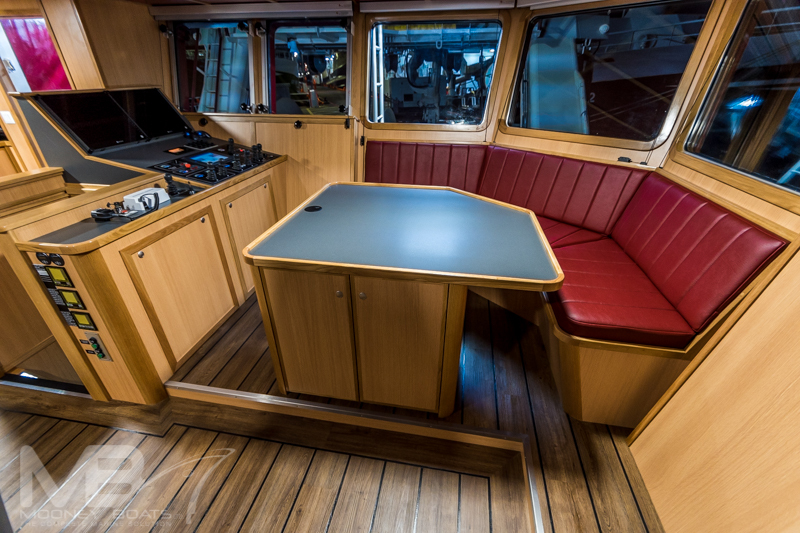 To the portside of the galley cooking area there is a seated area and large mess table which is also made from Corian to match the countertop in the galley. 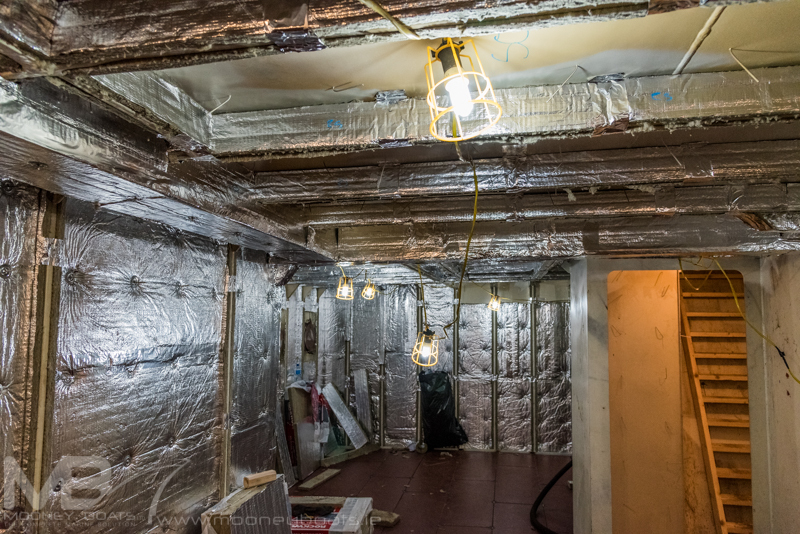 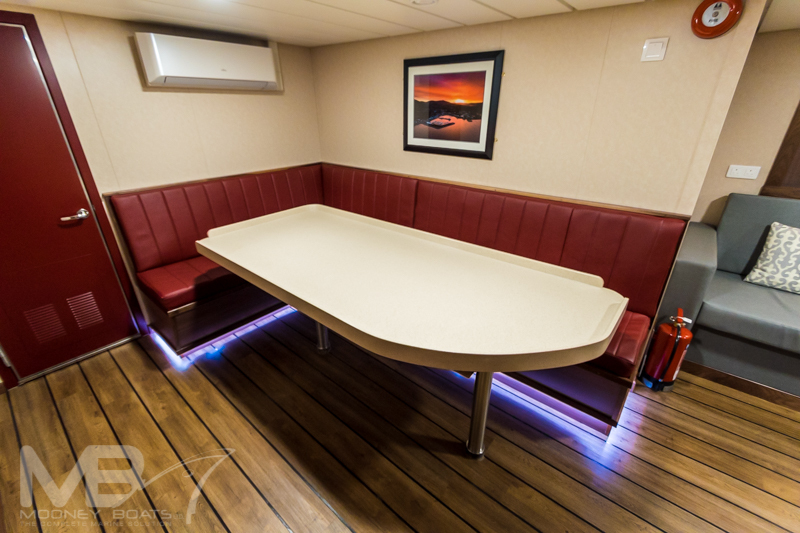 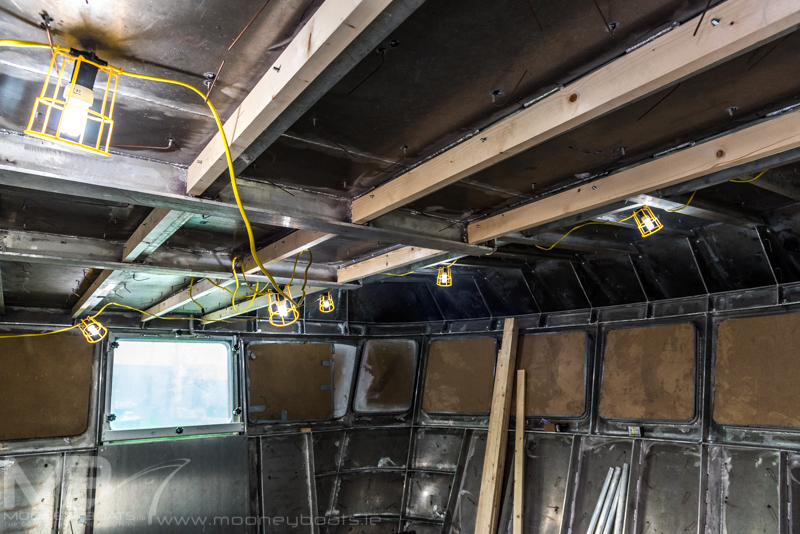 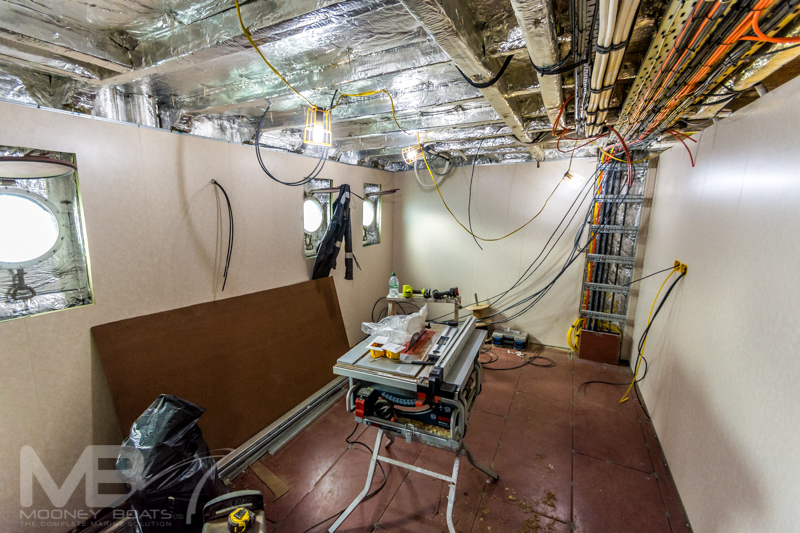 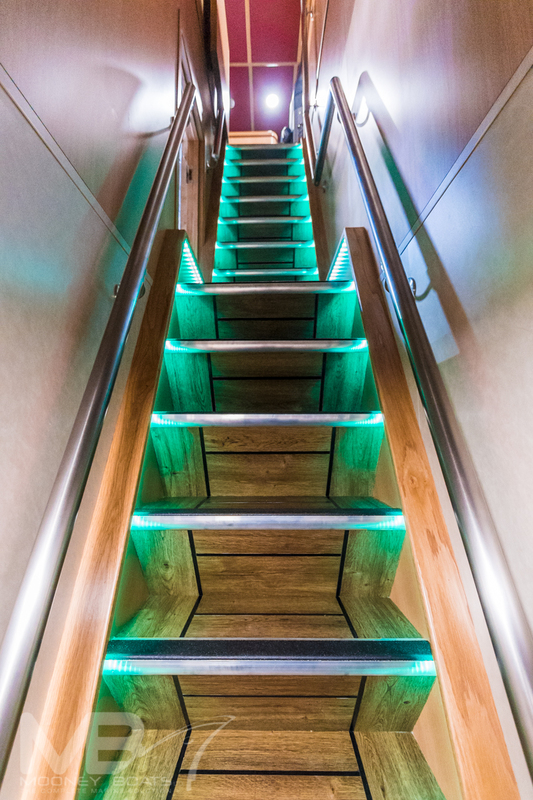 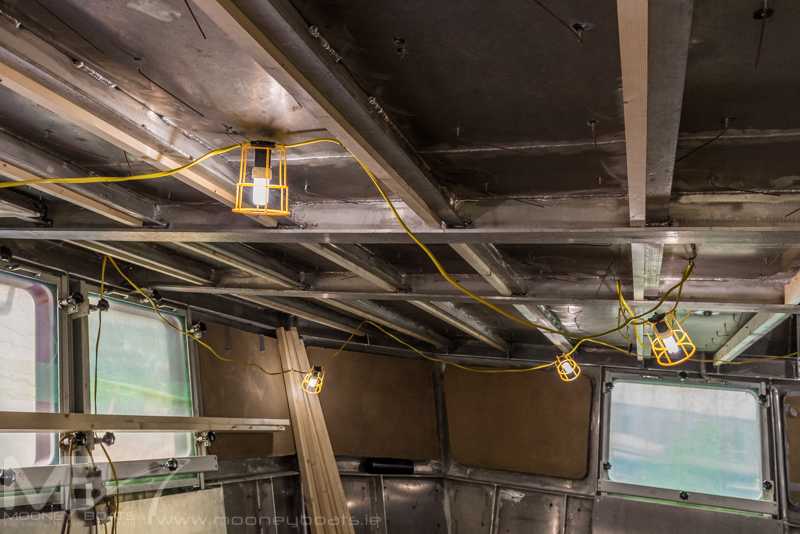 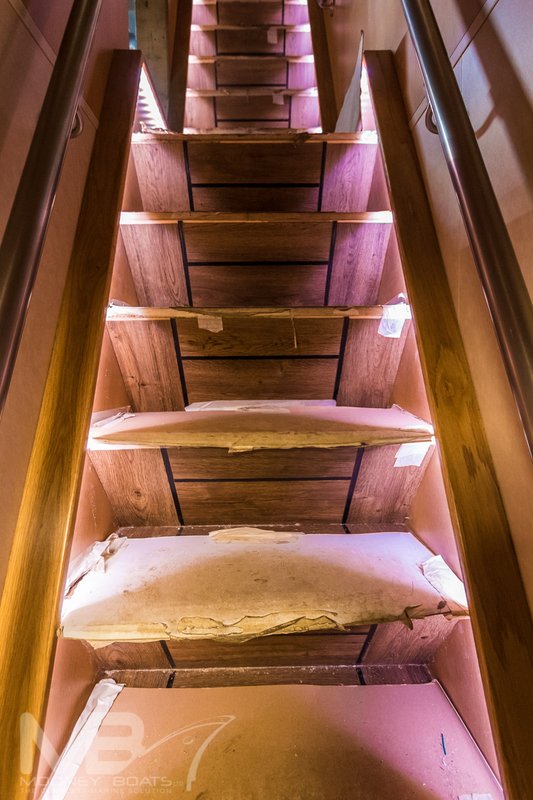 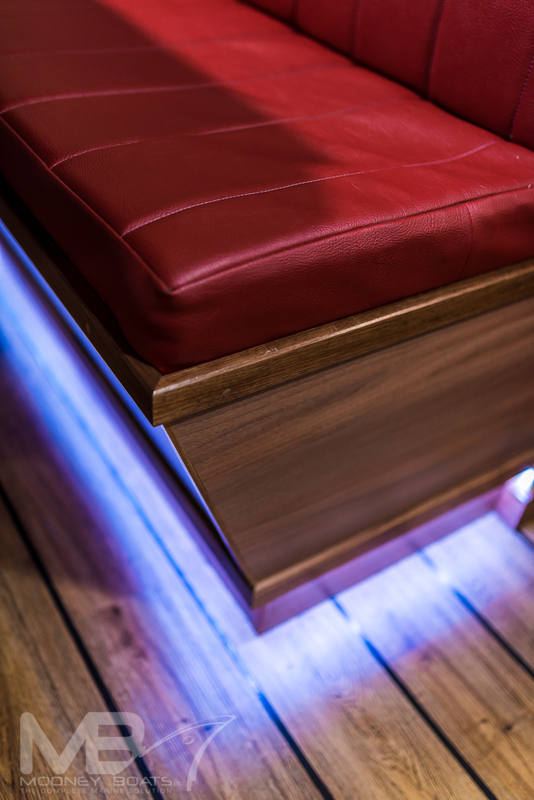 The underside of the galley seating area is fitted with ambient lighting at ground level which and the owners can chose from an area of colours from a remote control what colour they require there lighting. 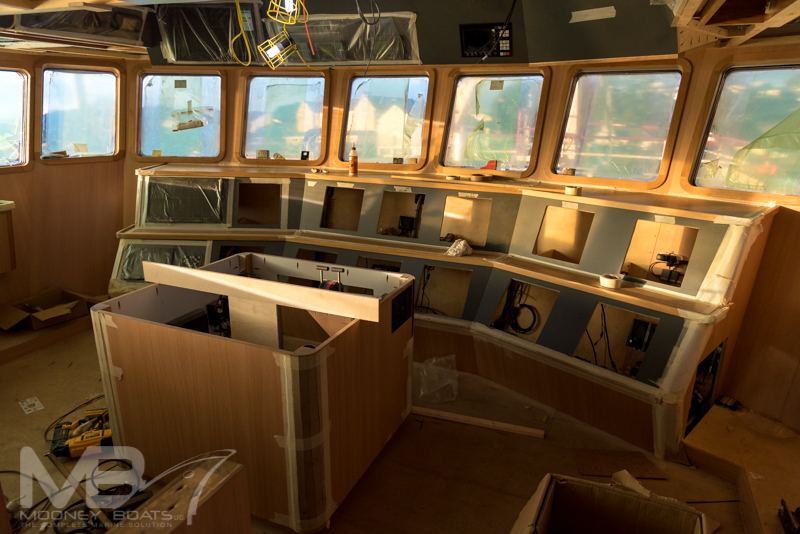 Forward of the galley mess area there is a large corner leather cladded seating lounge area with flat screen TV solid walnut storage units and the yards carpenters also made a solid walnut coffee table with the outline of the entrance to dingle harbour routered into the top of the table for a unique finish. 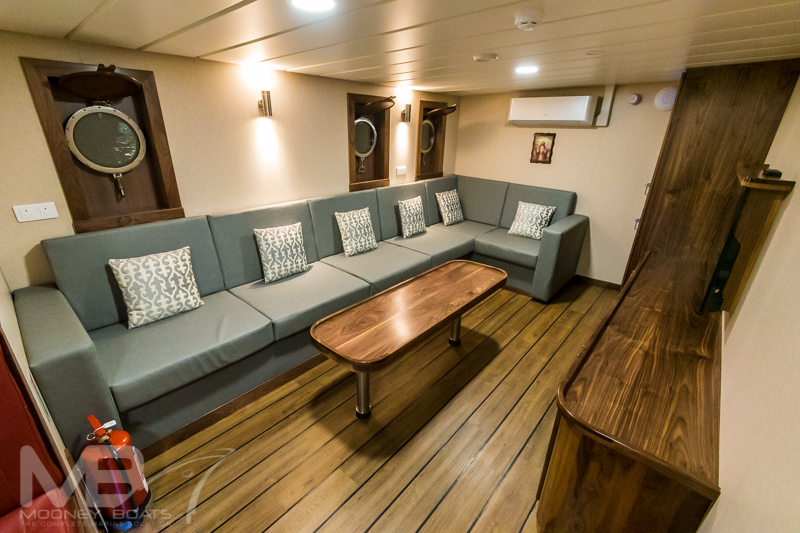 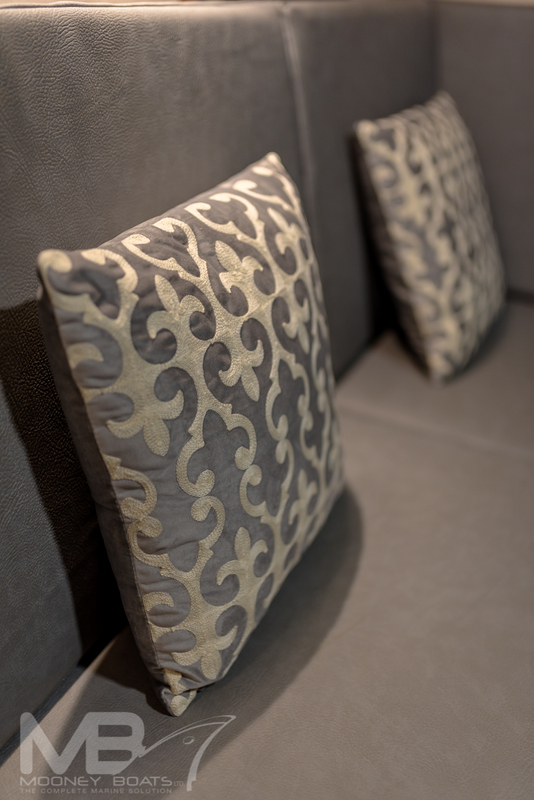 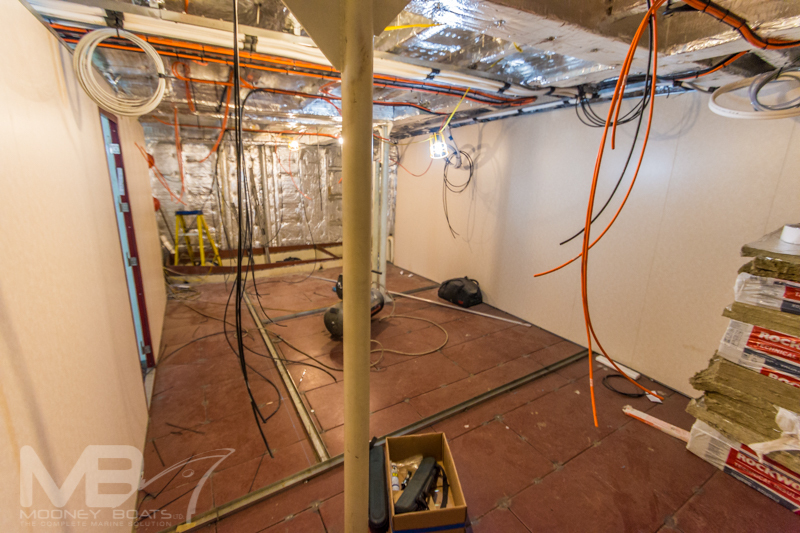 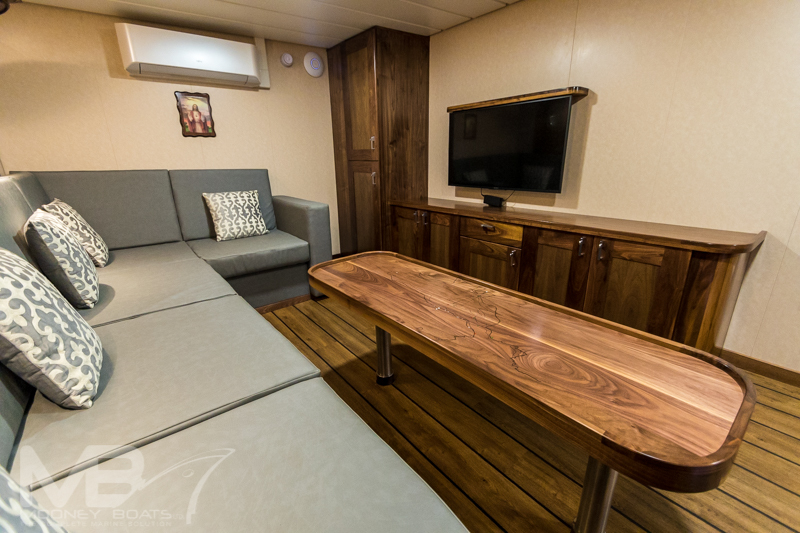 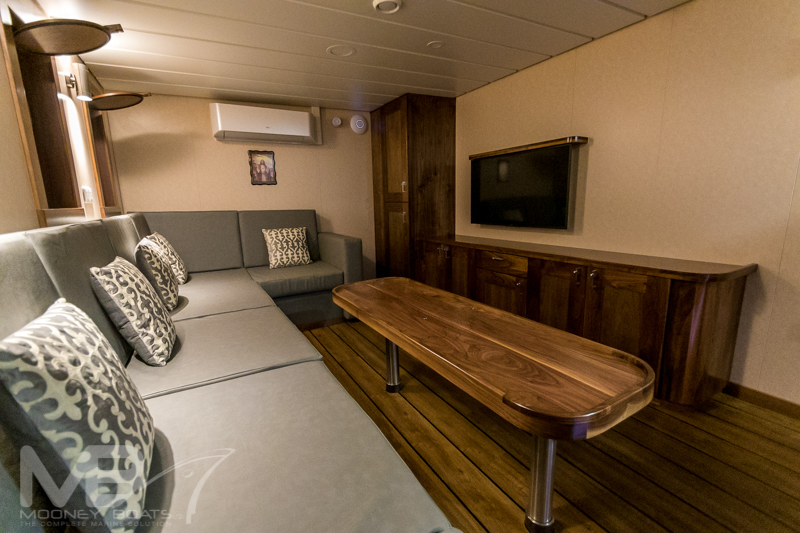 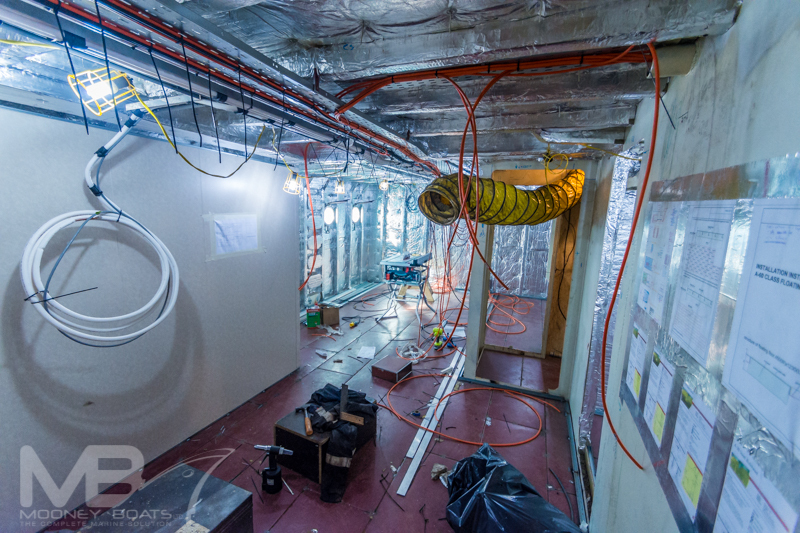 The lounge and area and the galley area are both fitted with air conditioning units with individual temperature controls. 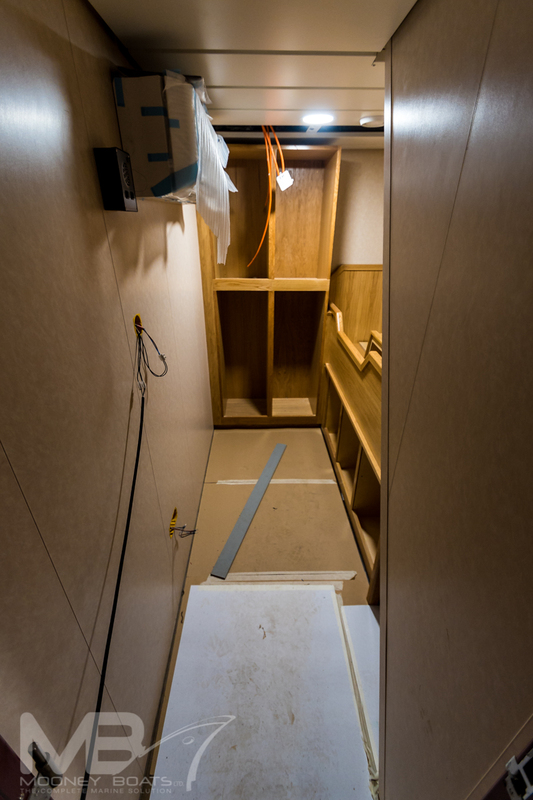 Leaving the galley going forward we are taken into the hallway which has illuminated access stairs to the wheelhouse access. 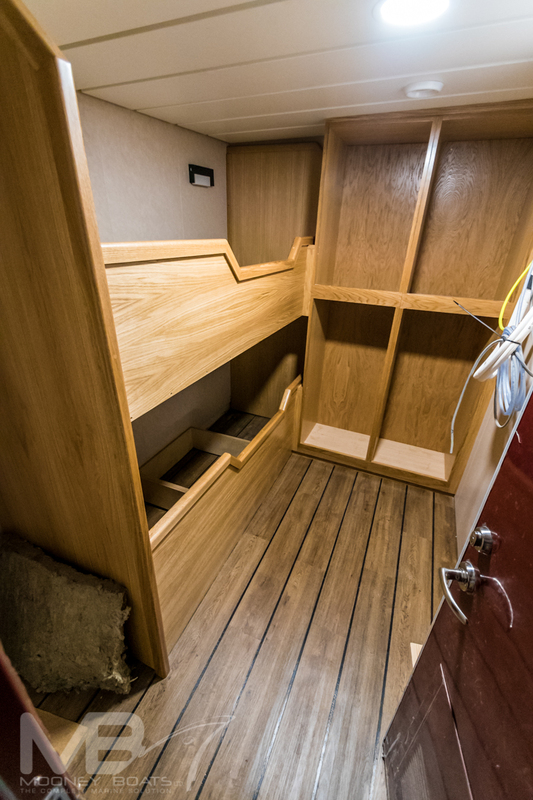 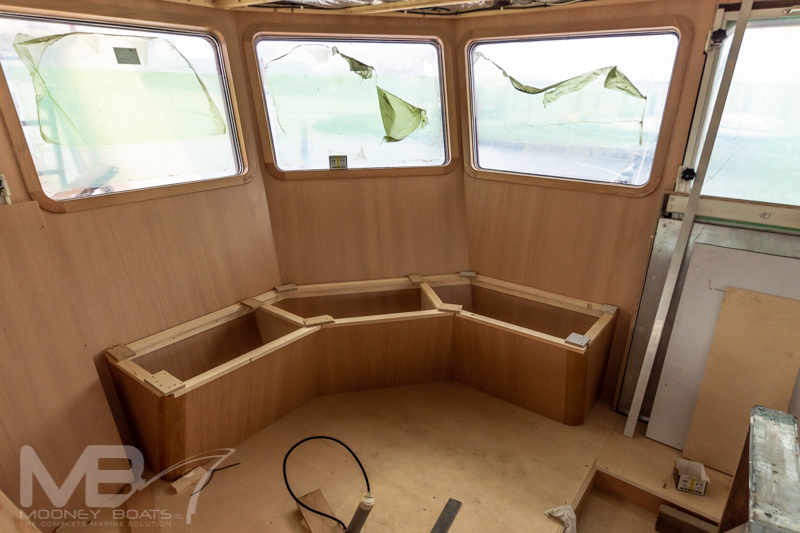 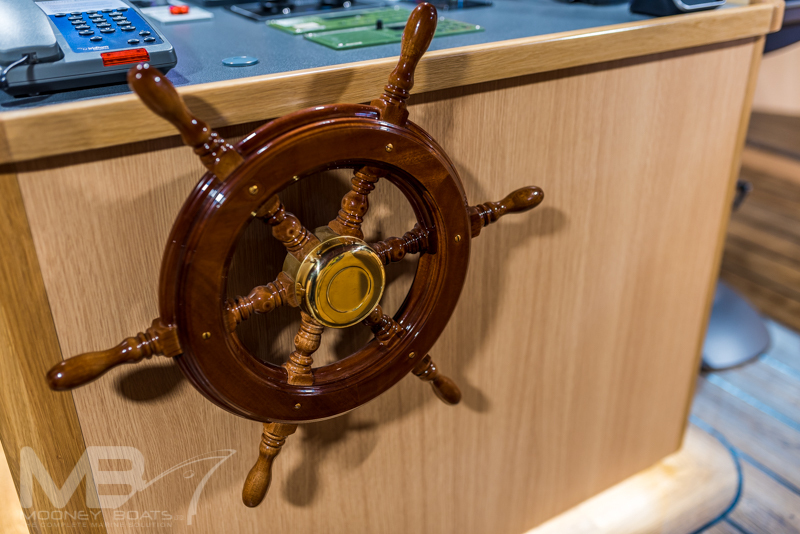 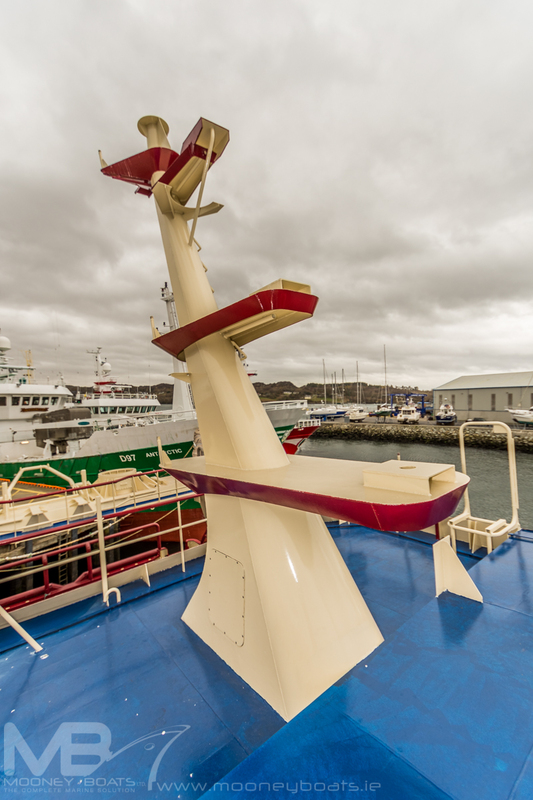 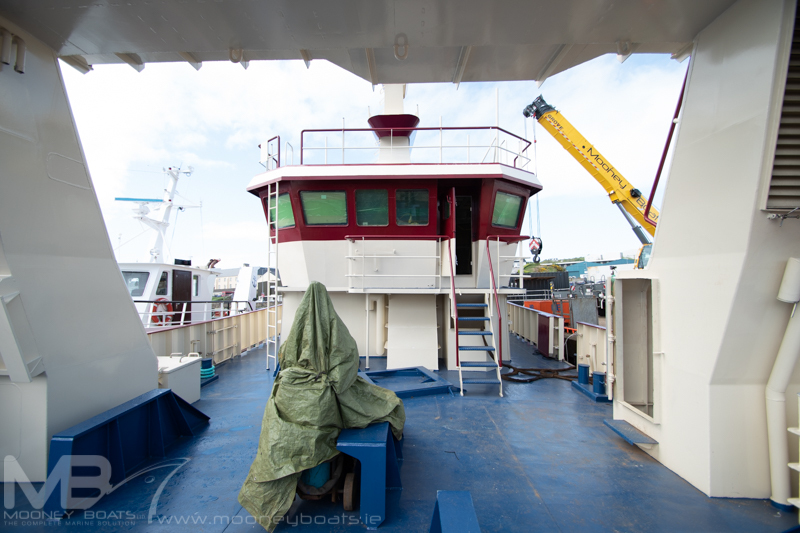 To the port side of the access stairs, the skipper has his own single berth cabin which is located in the centre of the vessel and is finished in solid oak and air conditioning.